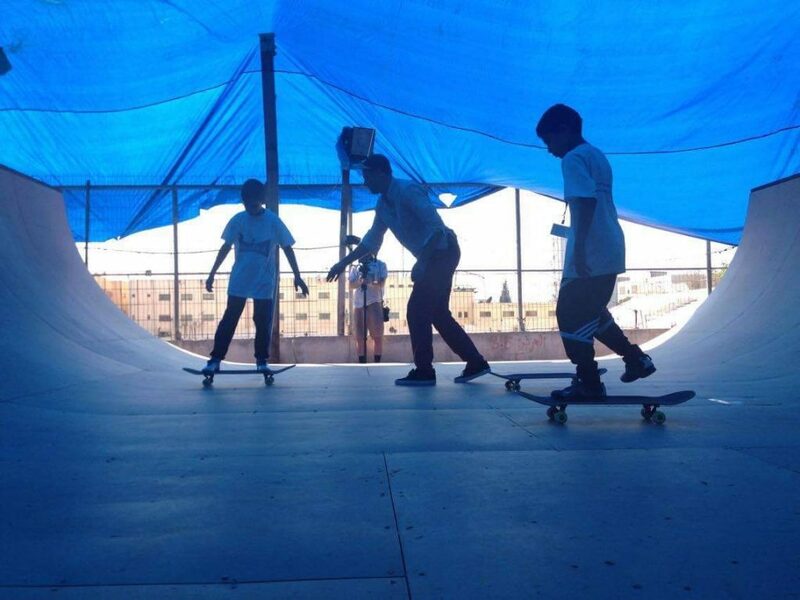 This is our second skate park project working with SkateQilya and SkatePal to create state of the art skateboarding ramps for boys and girls of all ages. 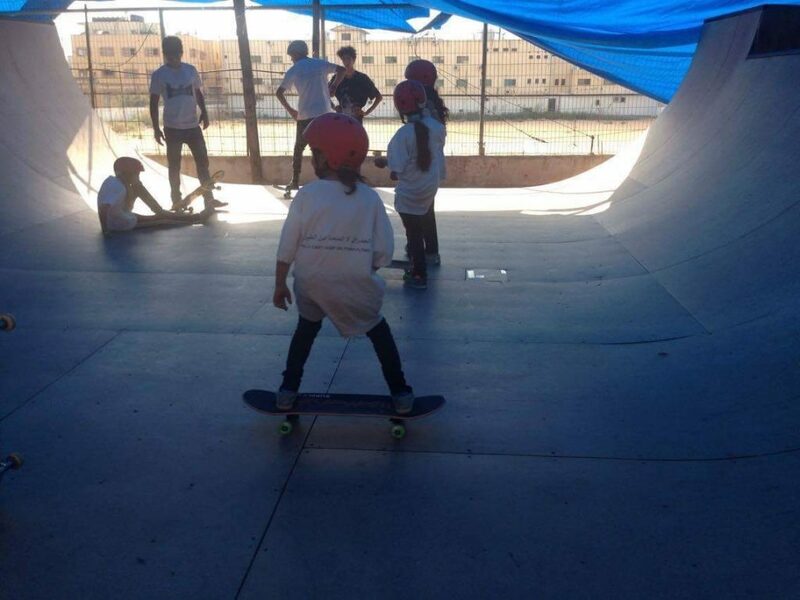 We also support ongoing summer skate camps there. 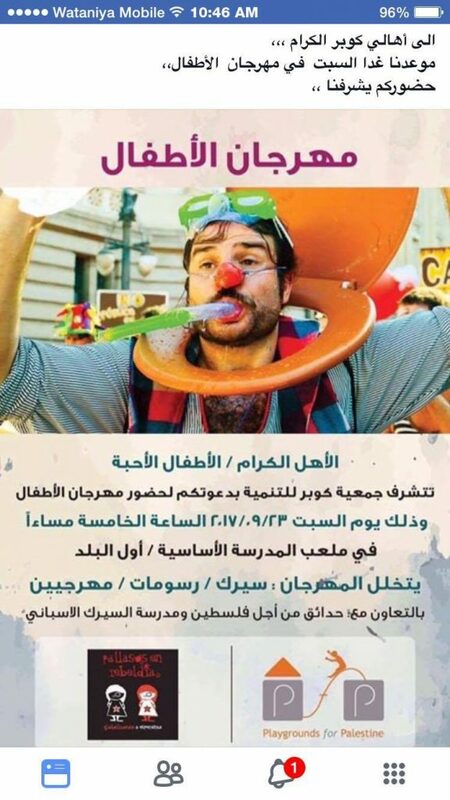 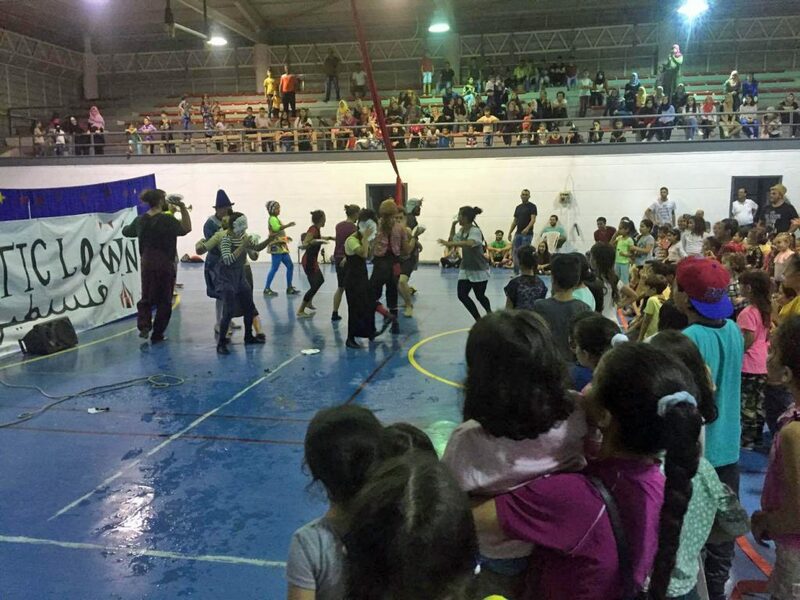 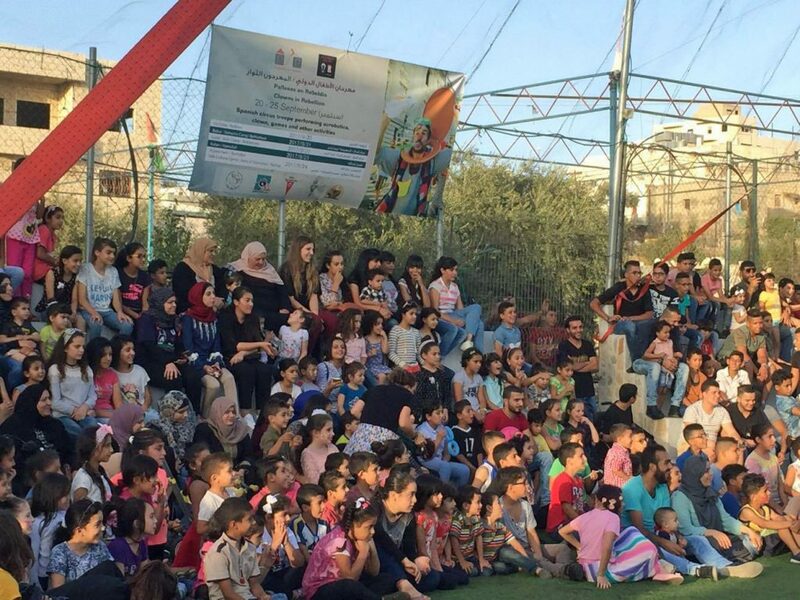 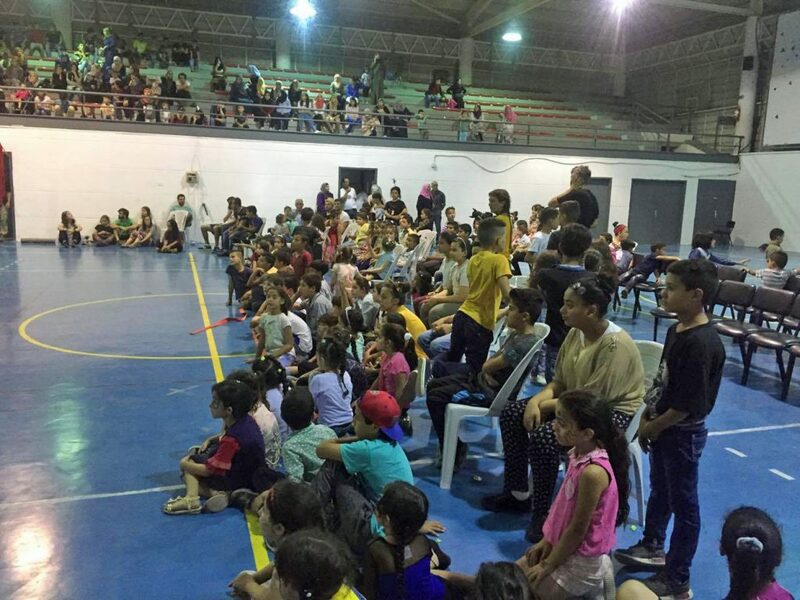 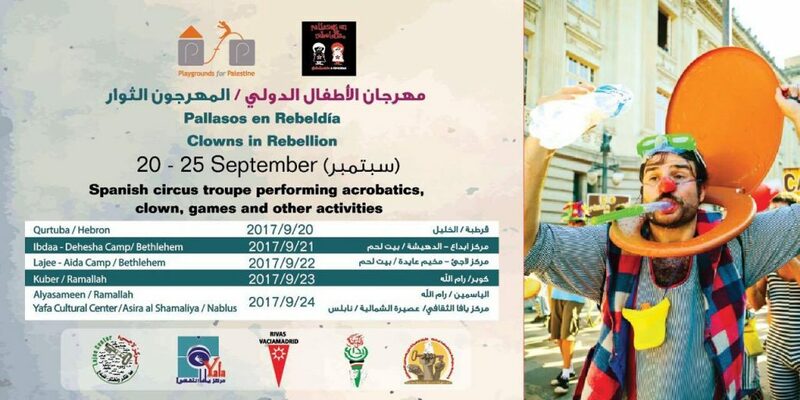 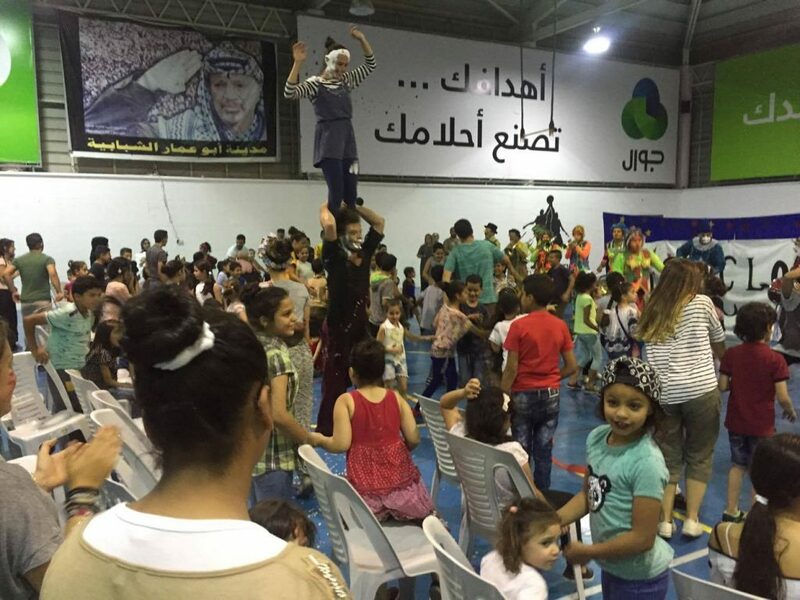 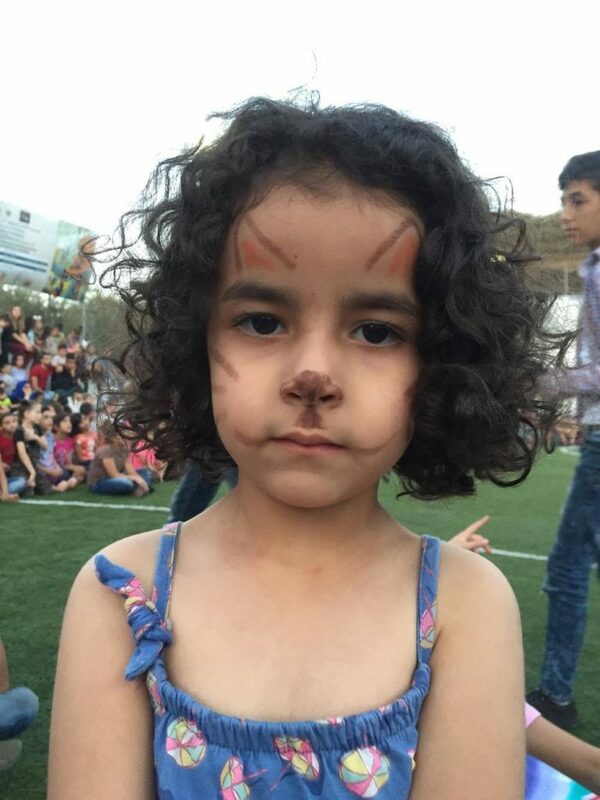 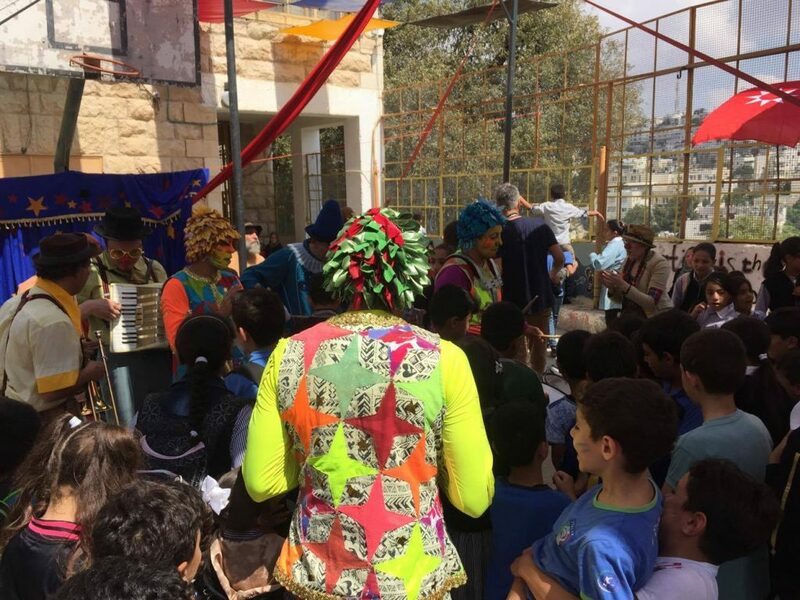 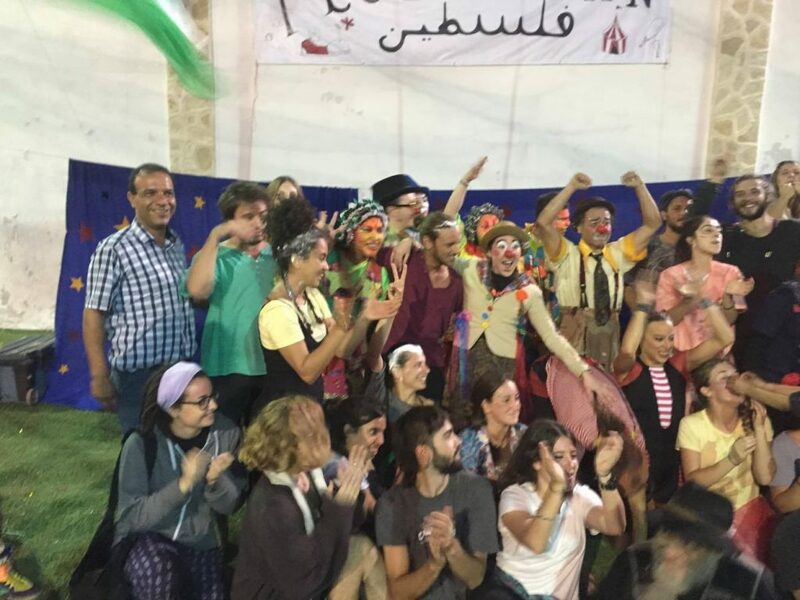 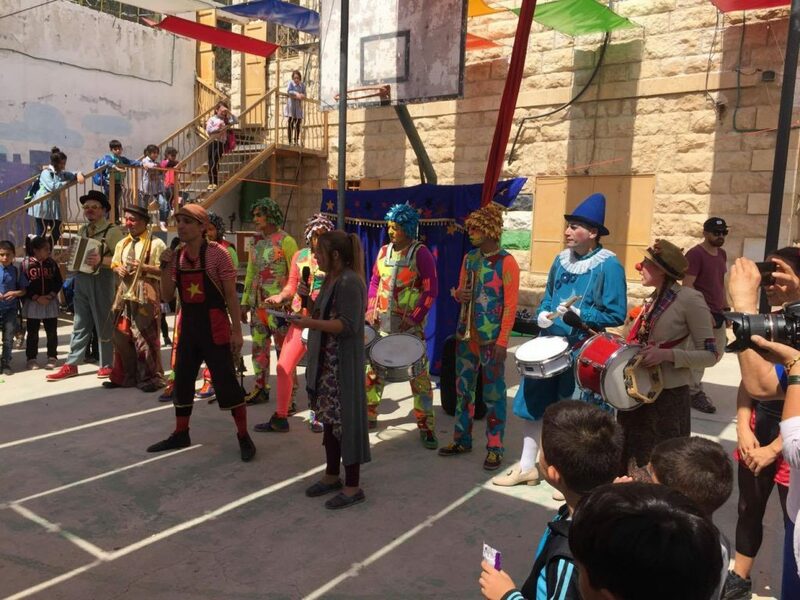 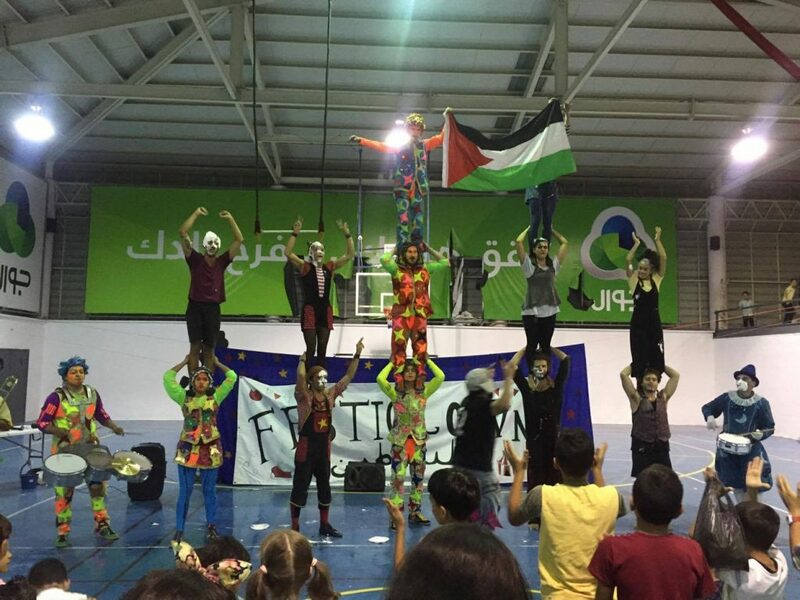 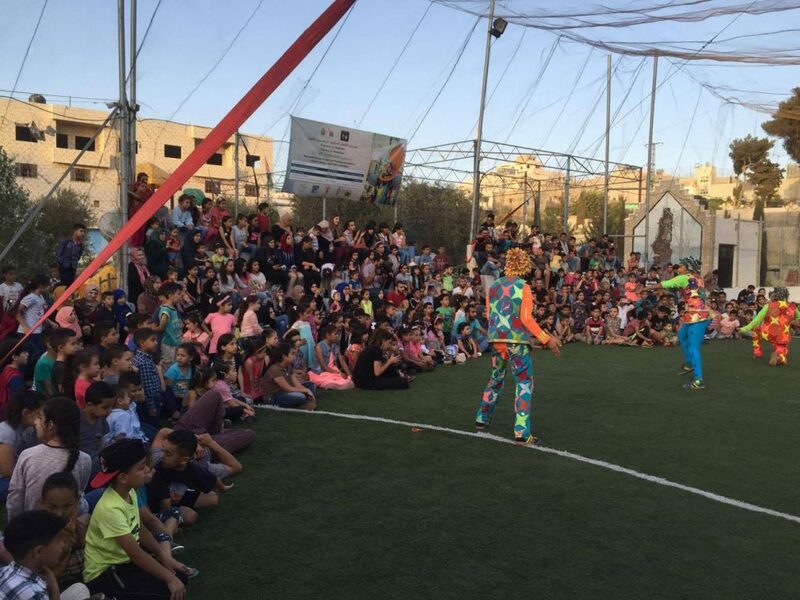 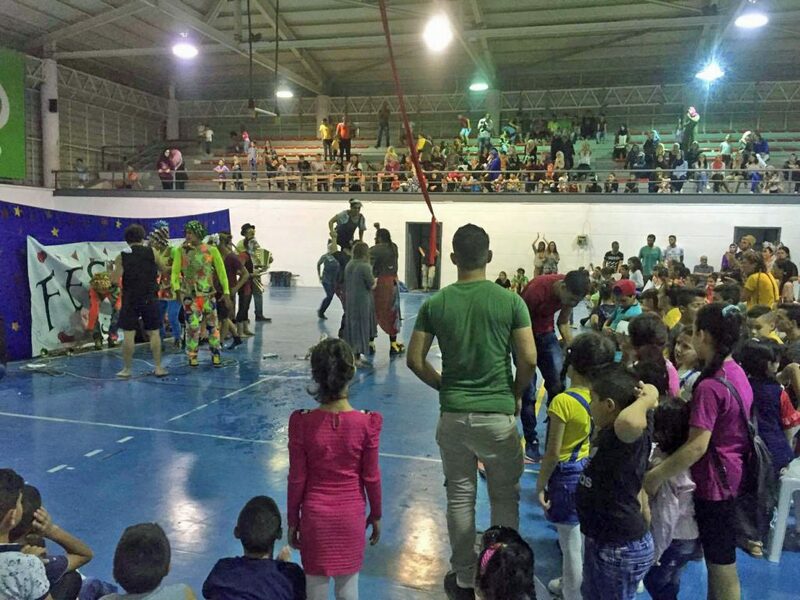 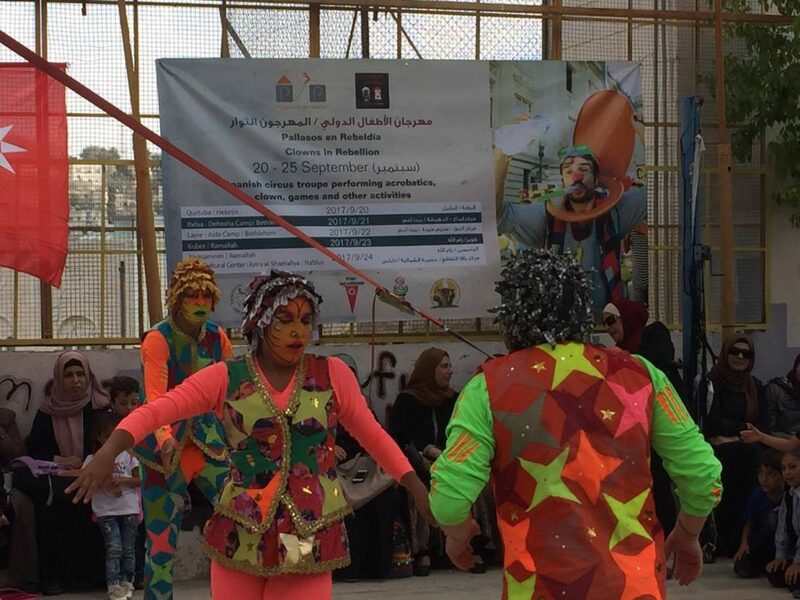 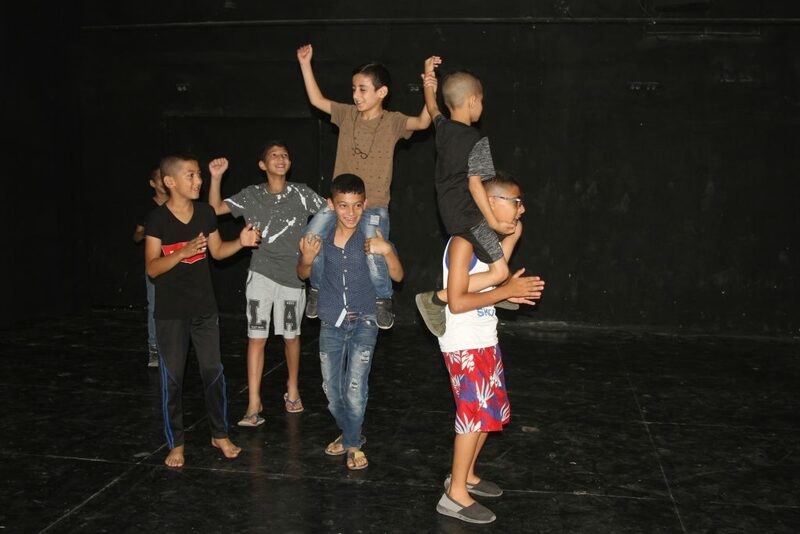 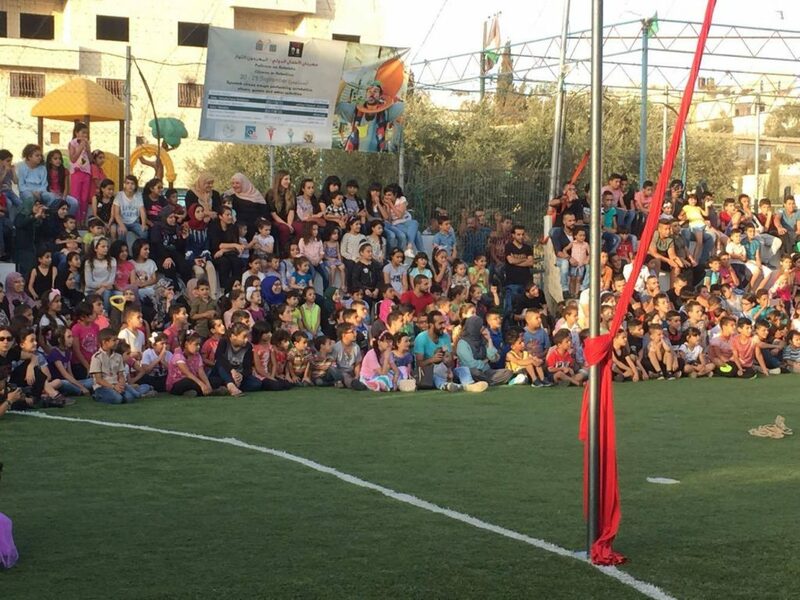 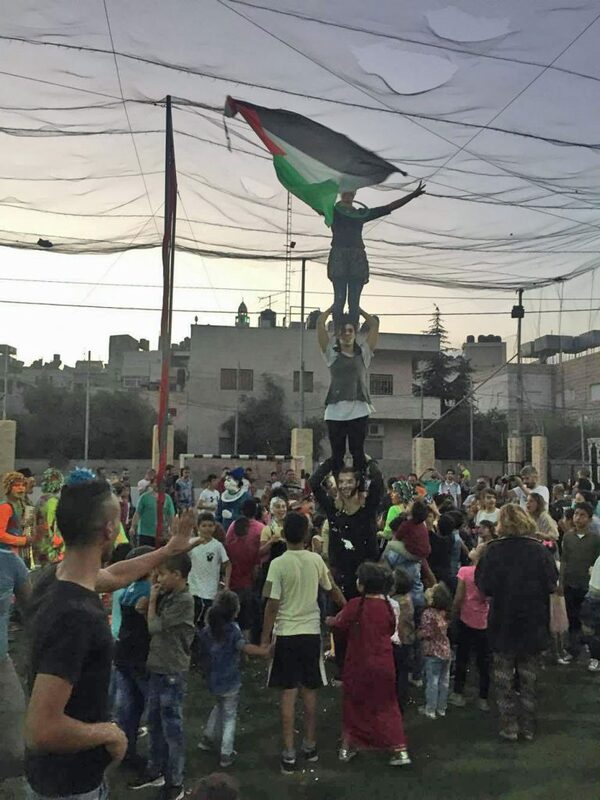 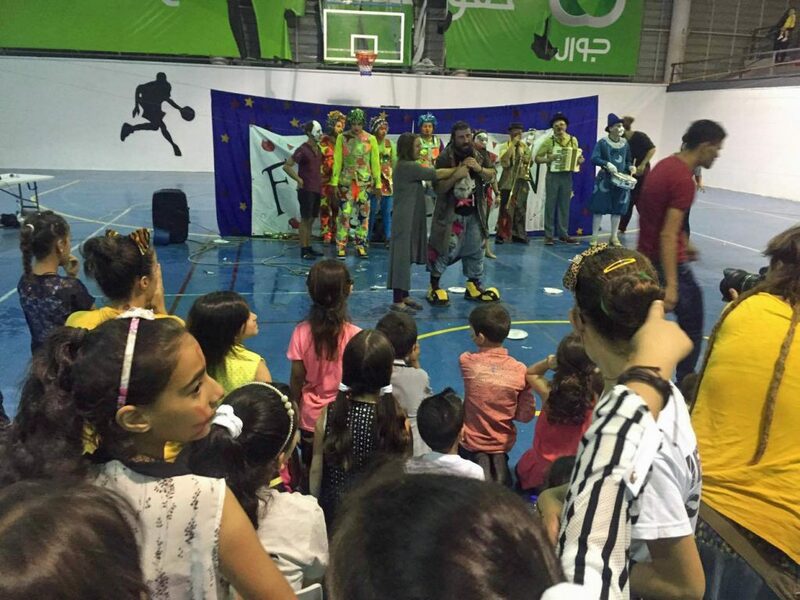 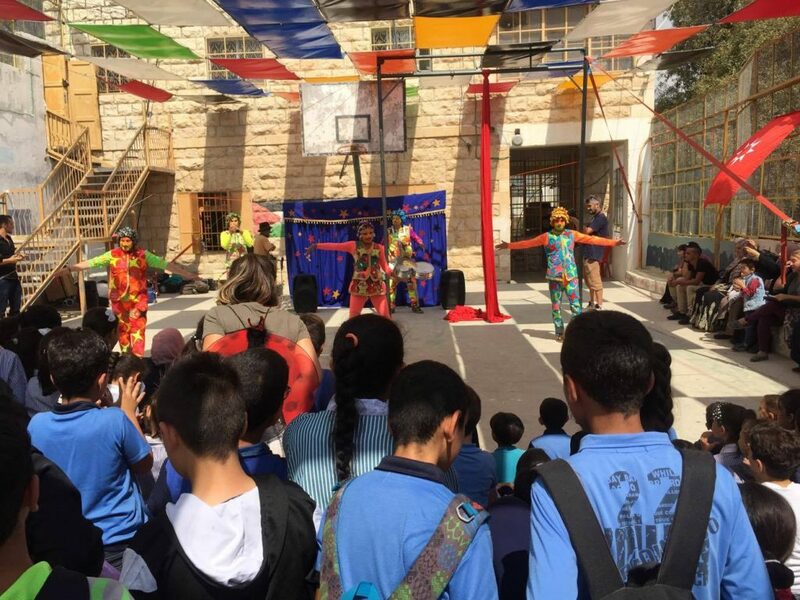 Playgrounds for Palestine teamed up with Pallasos en Rebeldía (Clowns in Rebellion), who volunteered through Lajee Center, to send them across the West Bank portion of Palestine to host day long events and acrobatics workshops for local children at our playgrounds. 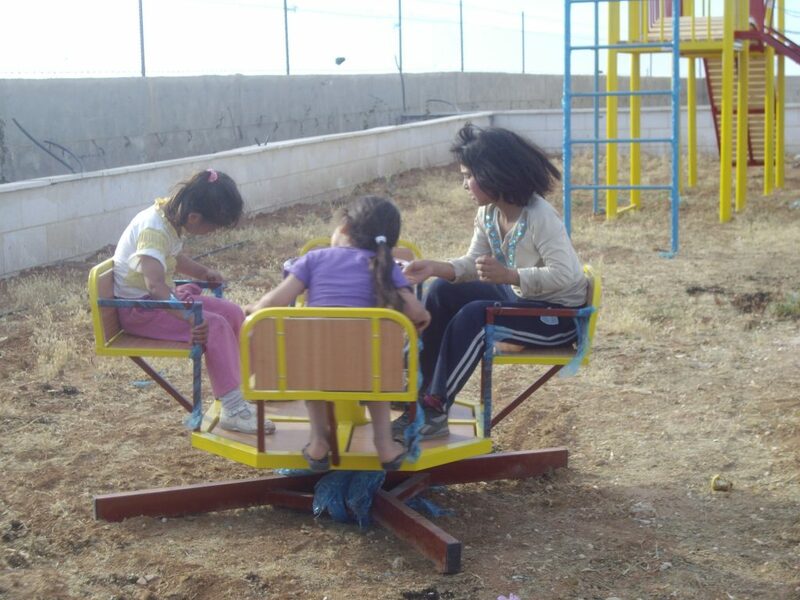 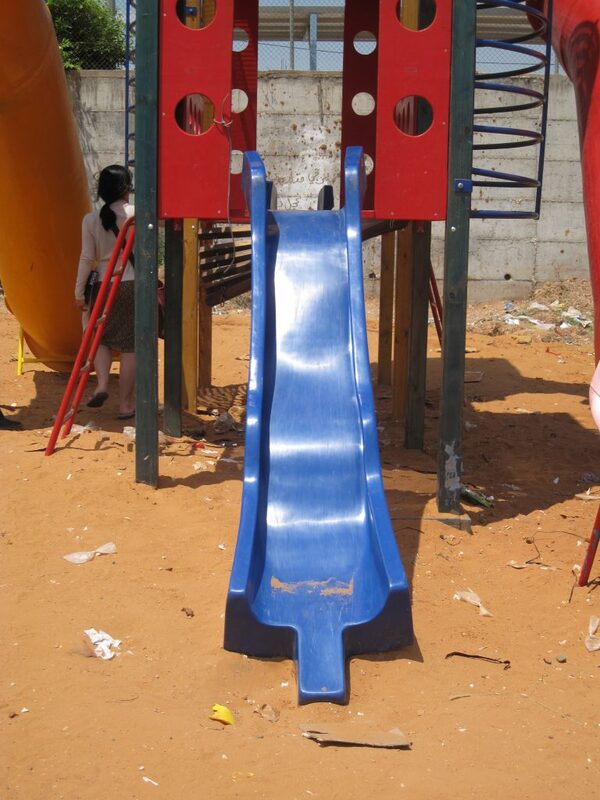 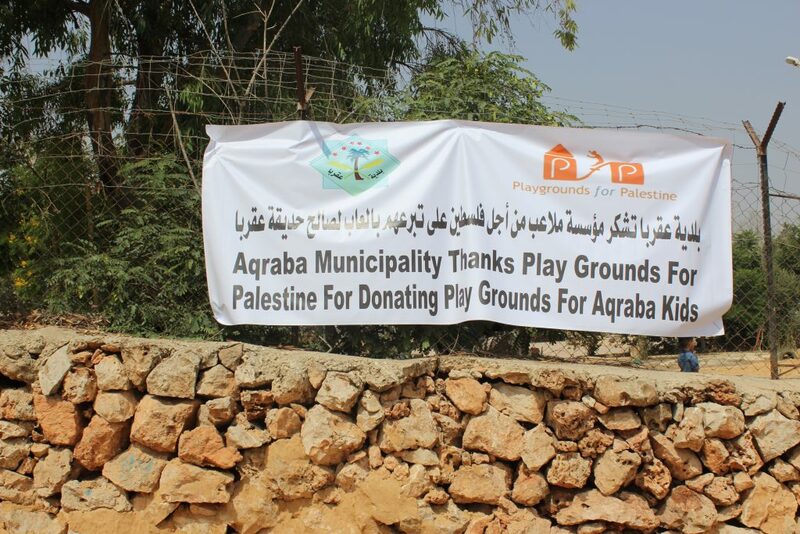 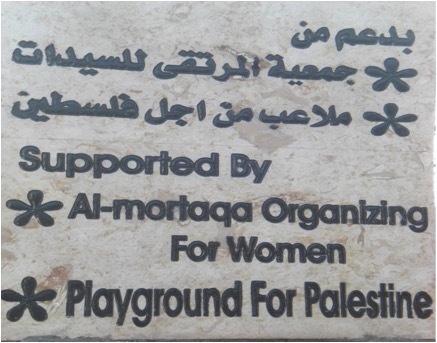 This playground was funded by PfP-UK, our sister organization in the United Kingdom. 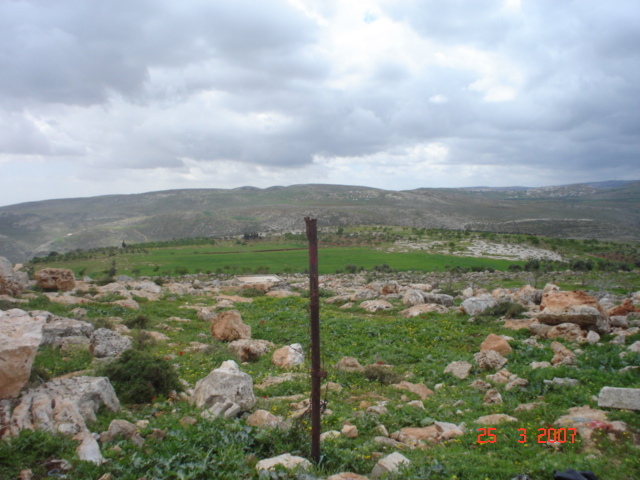 Kobar is a Palestinian village in the Ramallah and al-Bireh Governorate. 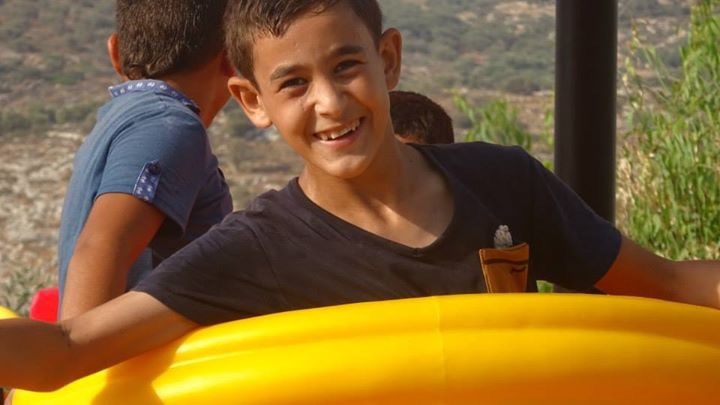 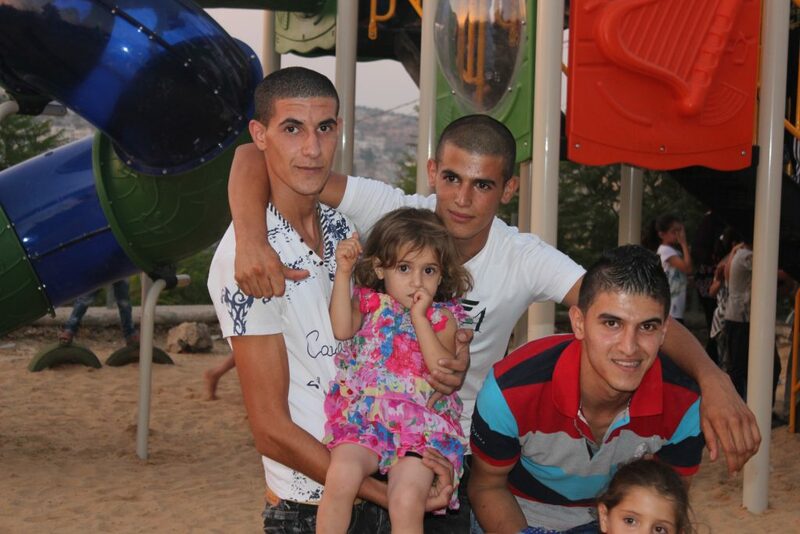 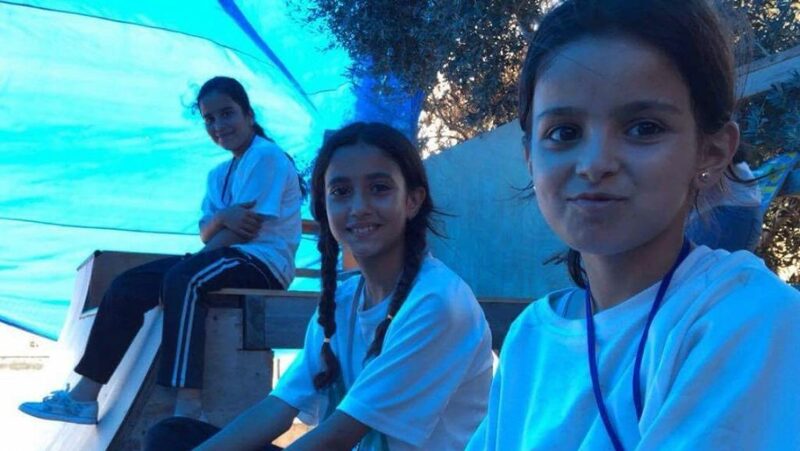 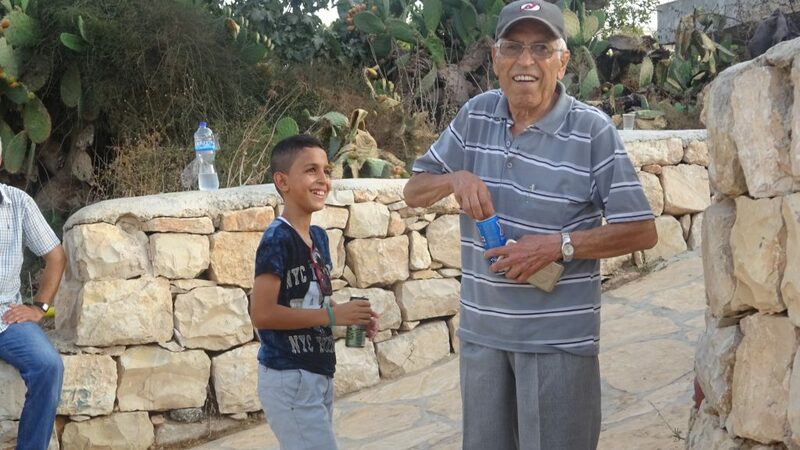 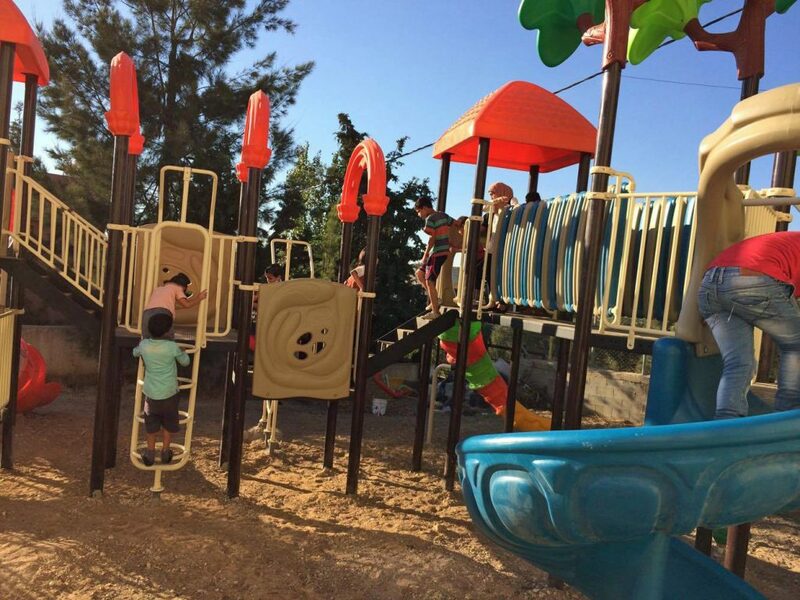 According to the Palestinian Central Bureau of Statistics (PCBS), the total population of Kobar reached over 4,000 in 2015, 60% of whom are under the age of 15 years. 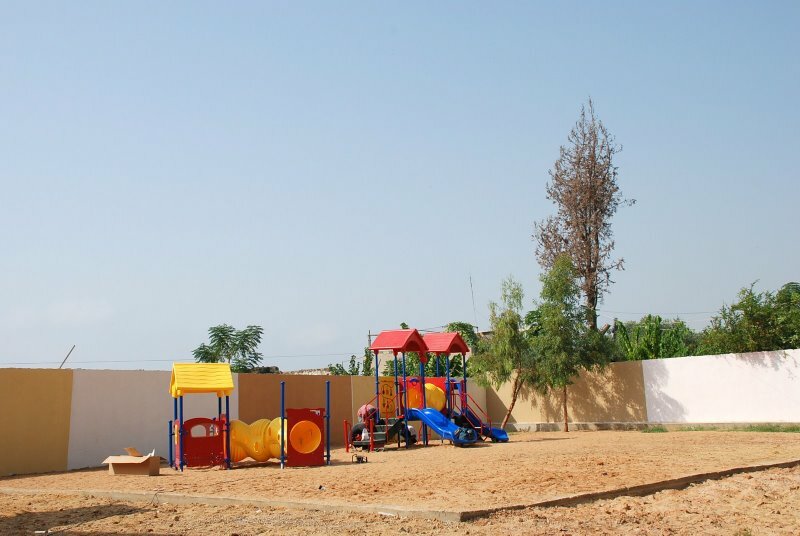 There are four public schools in the village, but no playgrounds or recreational facilities until this one was built. 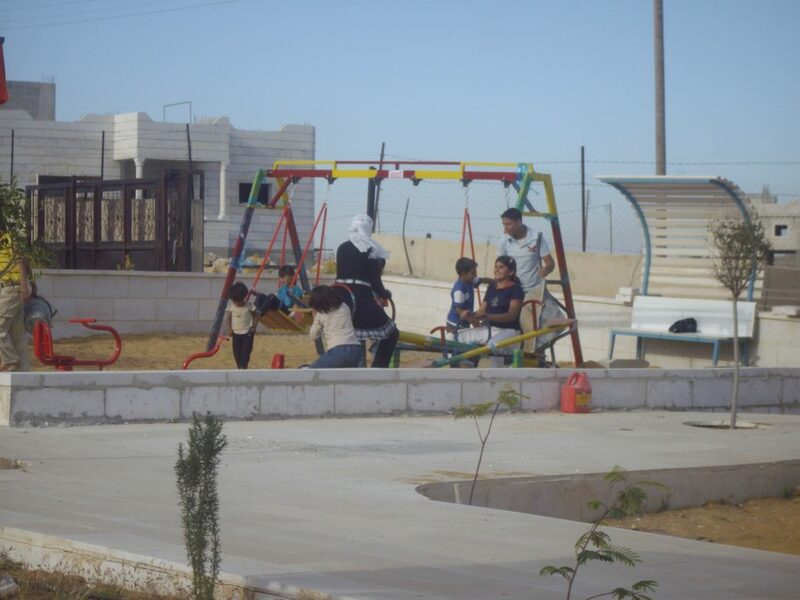 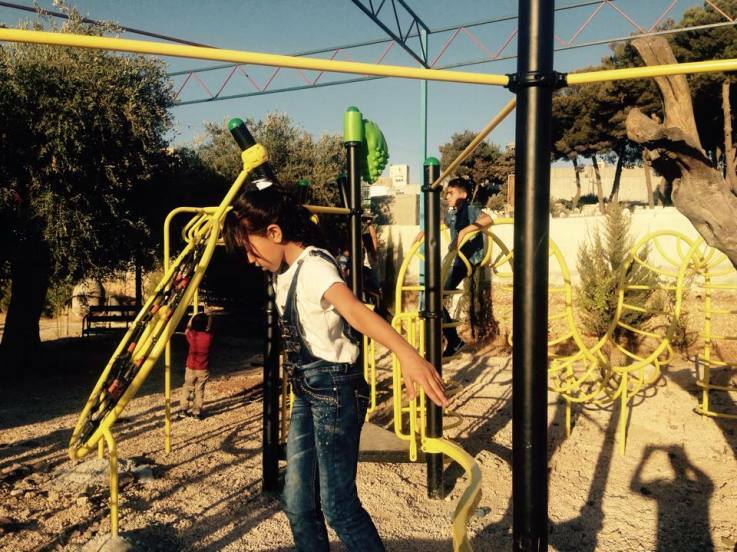 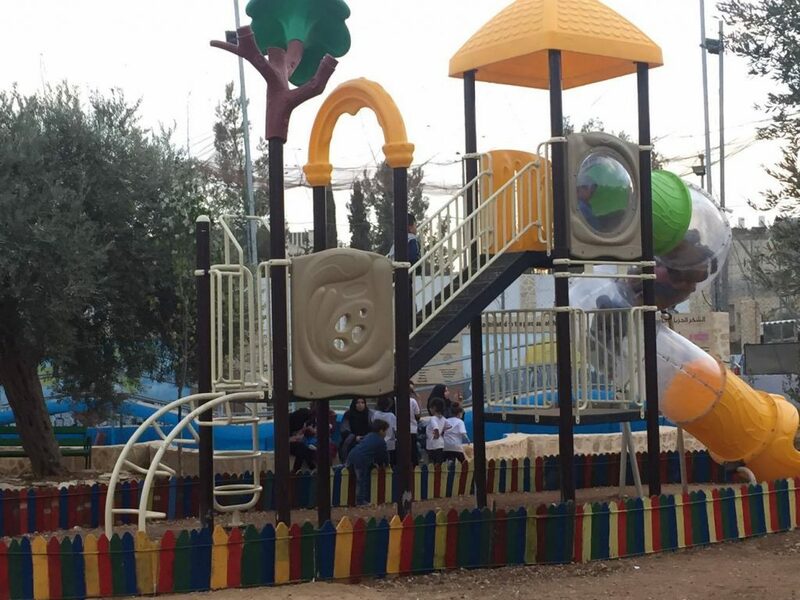 After creating a park space on the property of Lajee Center in the Aida Refugee Camp, we installed this playground, which turned out to be one of two. 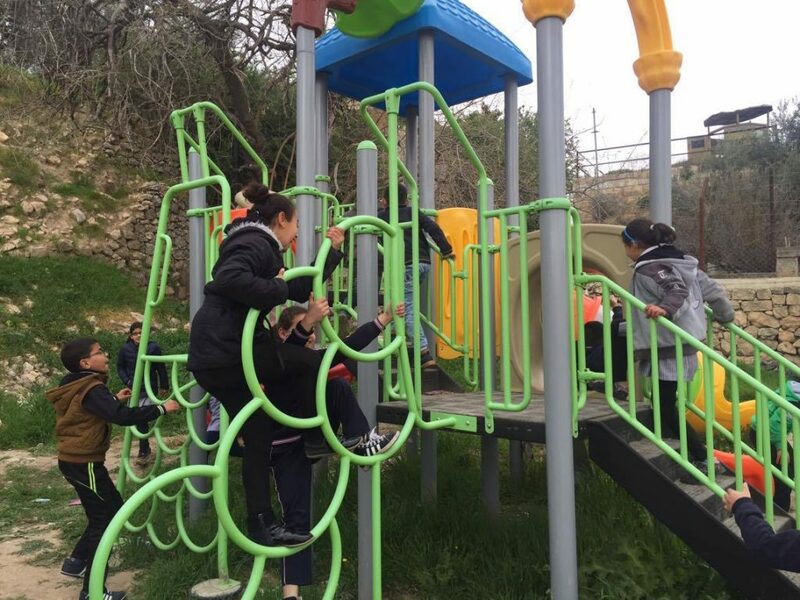 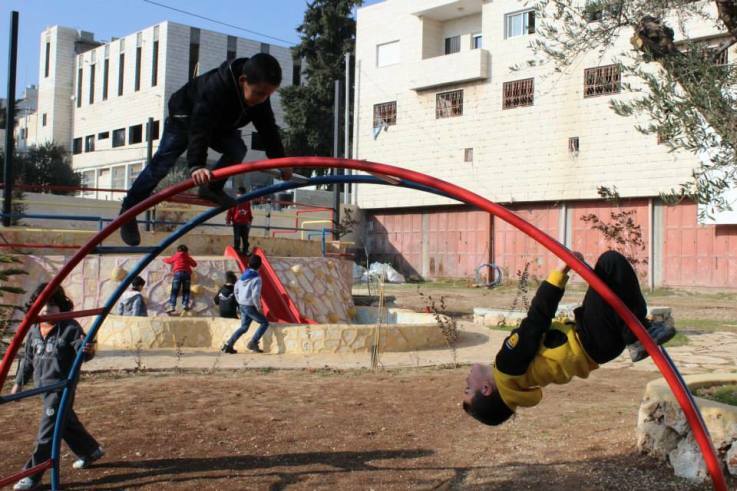 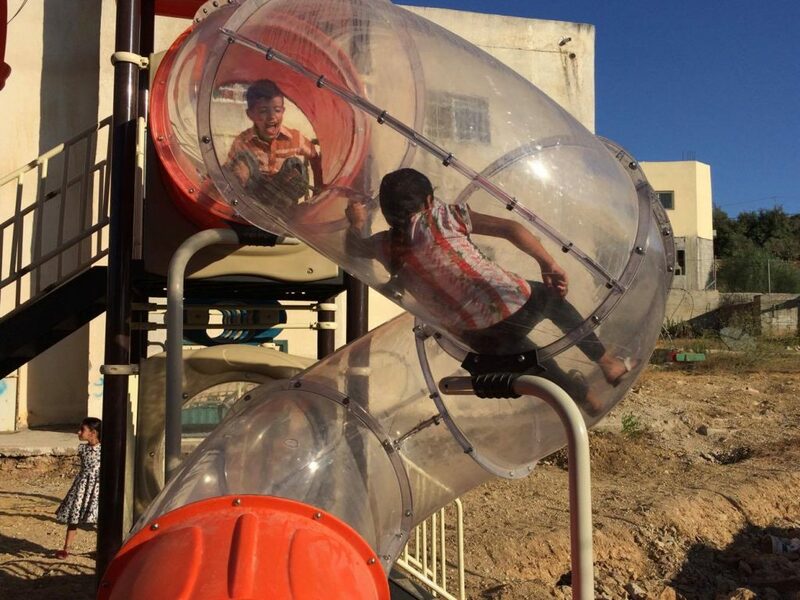 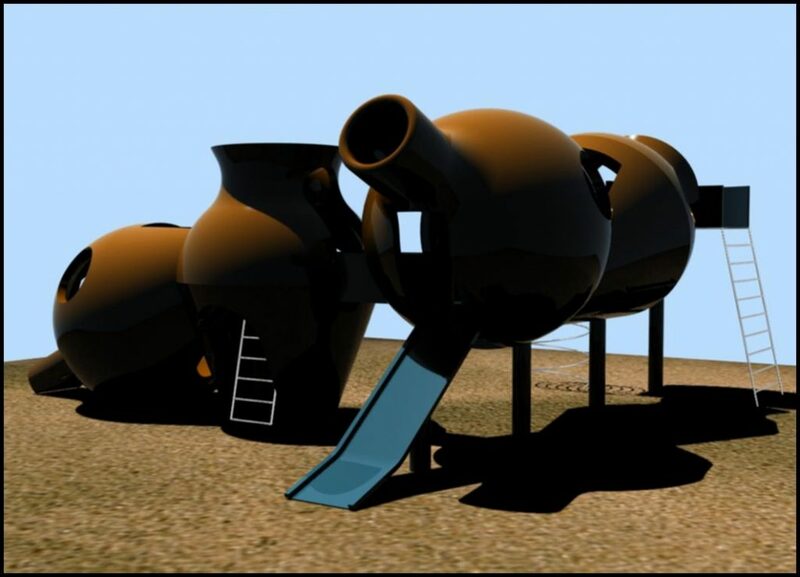 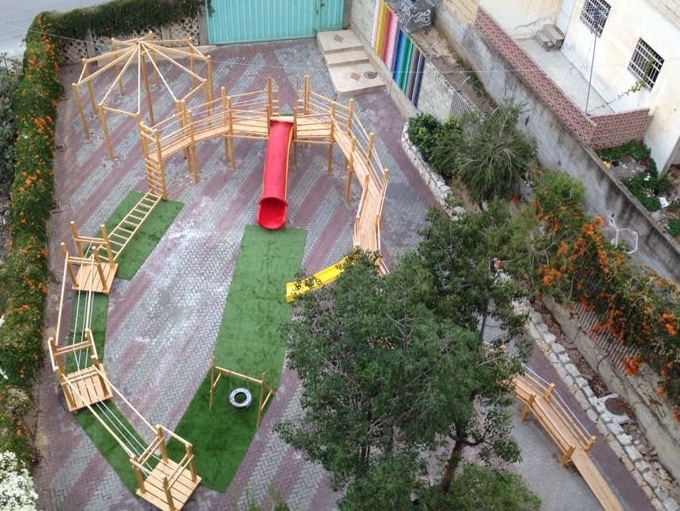 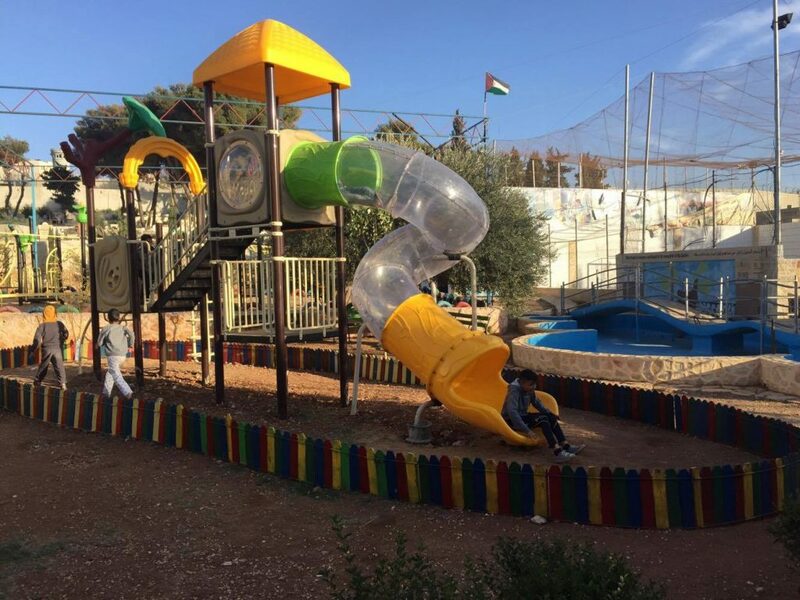 This playground is located in Nablus, as part of the campus of Tomorrow’s Youth Orgnization (TYO), where hundreds of Palestinian children engage in daily educational and creative programming. 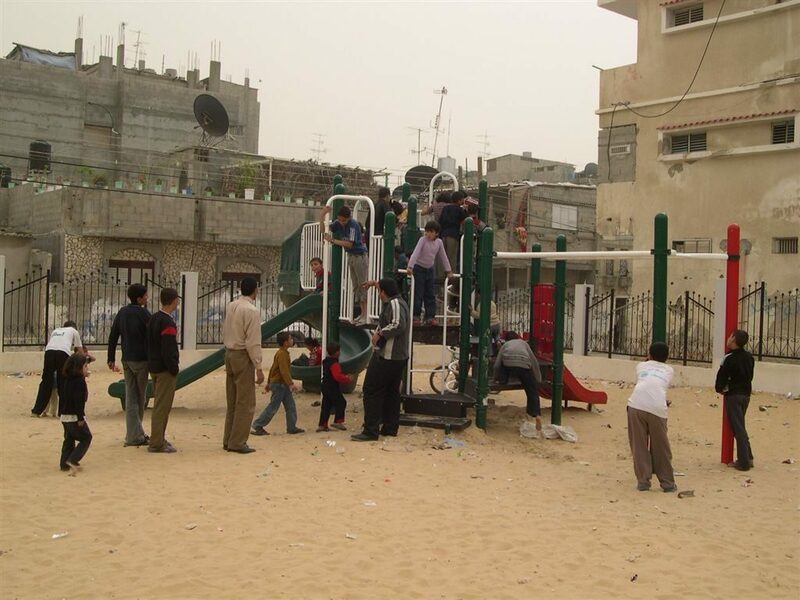 Approximately 800 children use this playground. 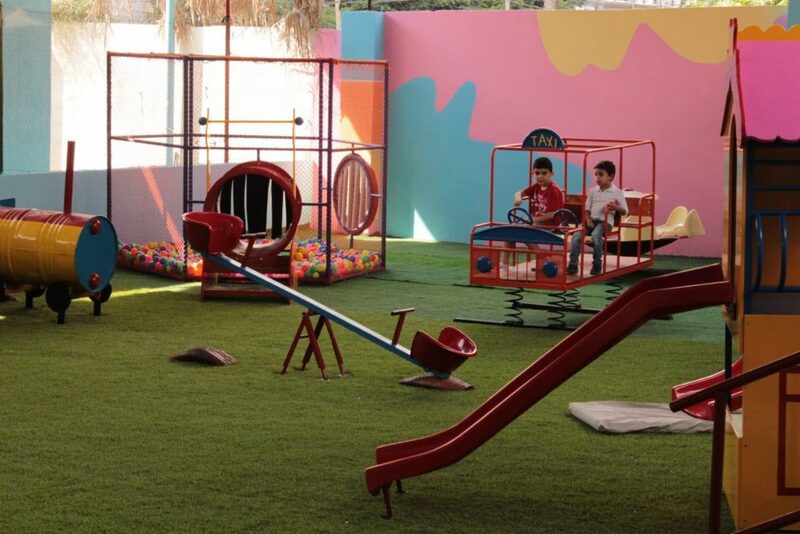 Play Therapy was an ambitious project that was launched in Gaza after Israel’s military assault 2014, which left thousands more traumatized children. 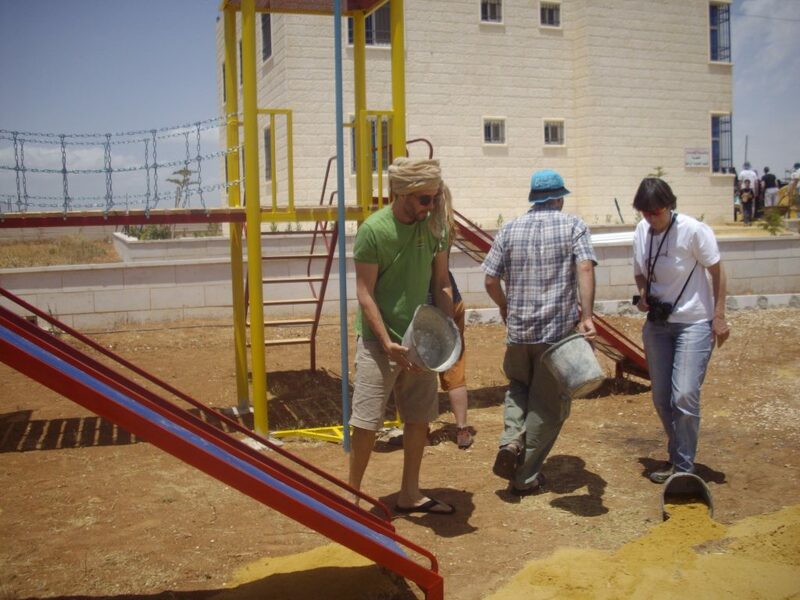 The project was funded in part through a generous grant from the Tingari-Silverton Foundation. 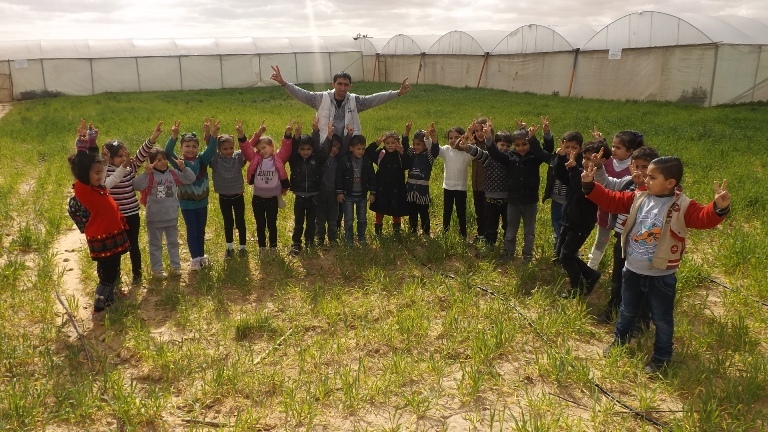 While we were able to complete the site and hold some workshops, the project was unsustainable for various reasons, in part due to the severe siege of Gaza. 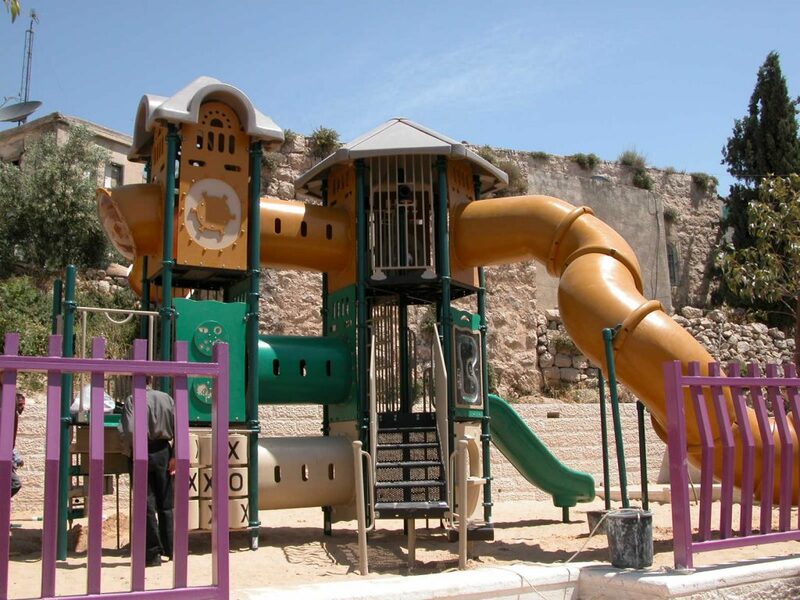 This is a park located in Wadi Hilweh, in the Silwan neighborhood of East Jerusalem. 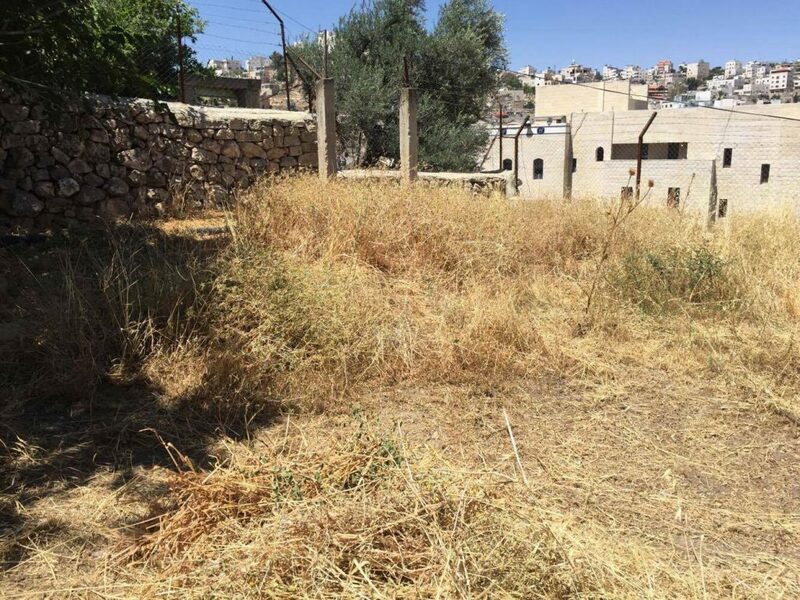 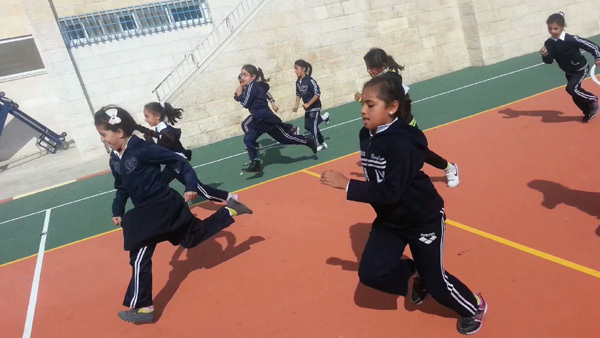 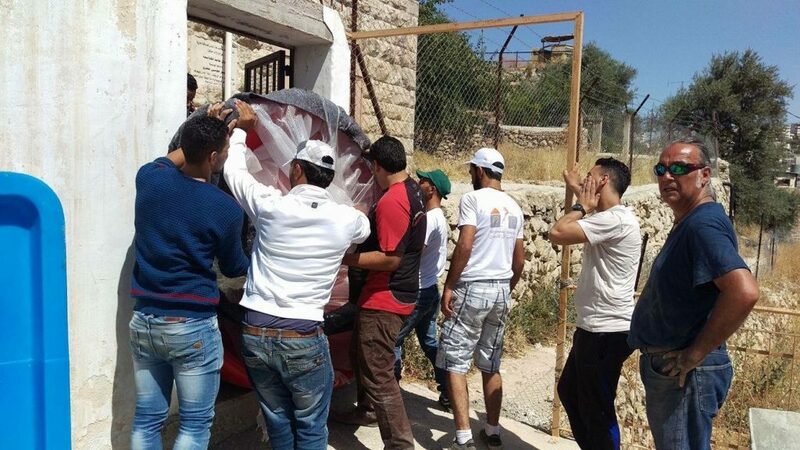 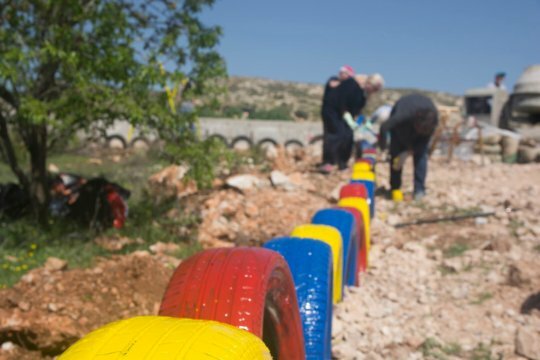 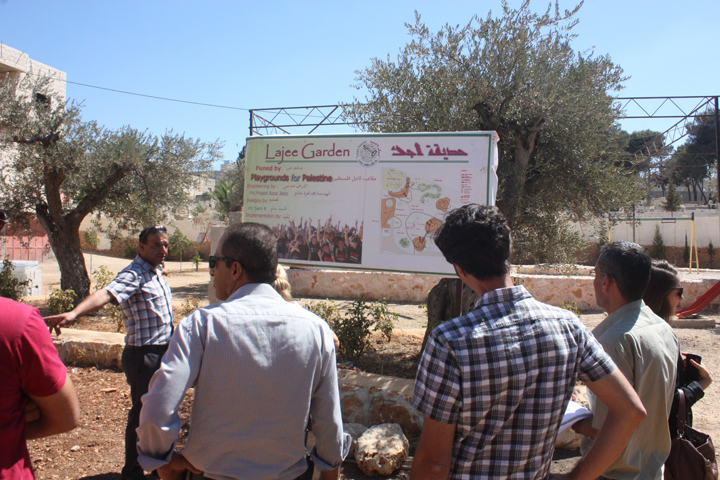 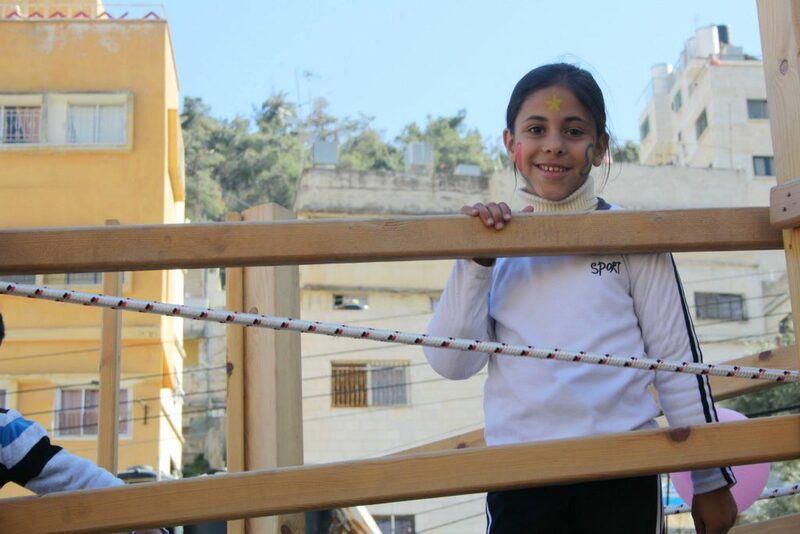 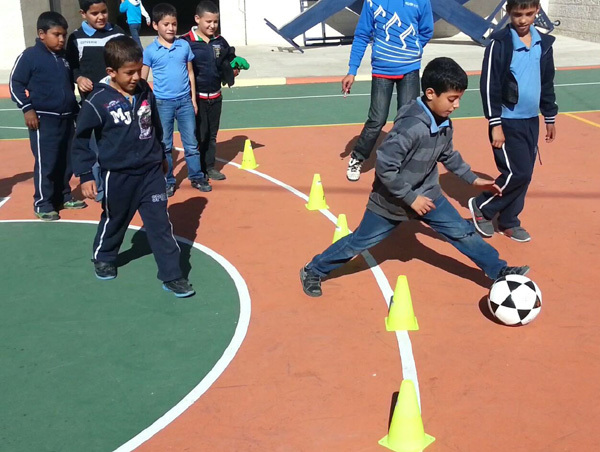 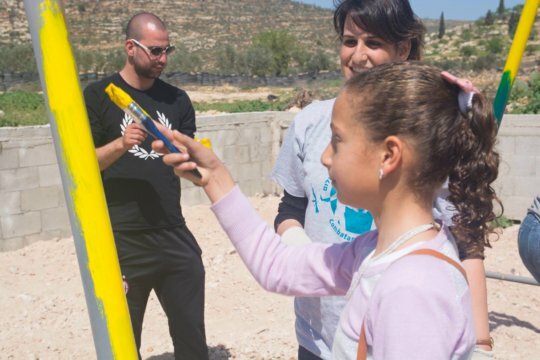 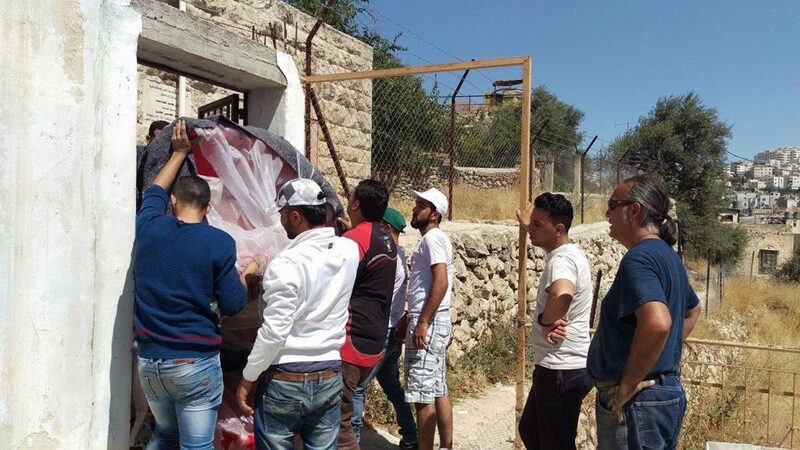 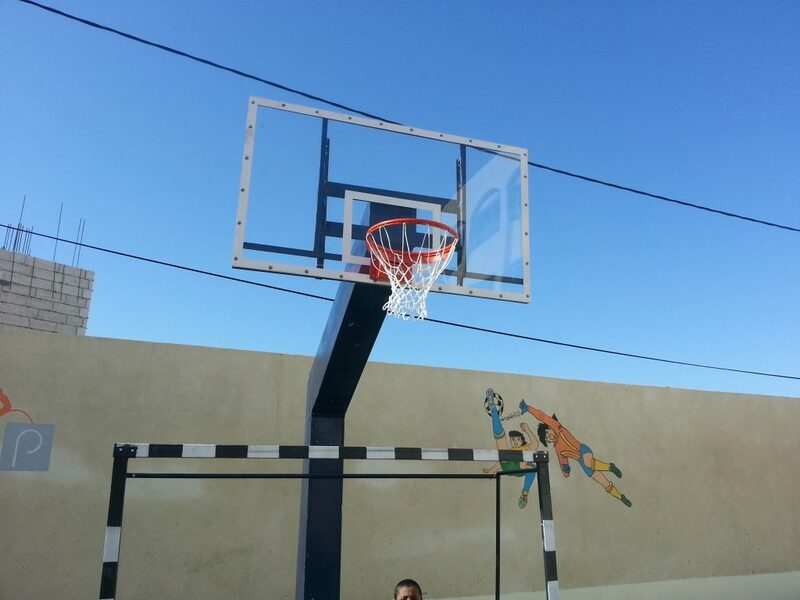 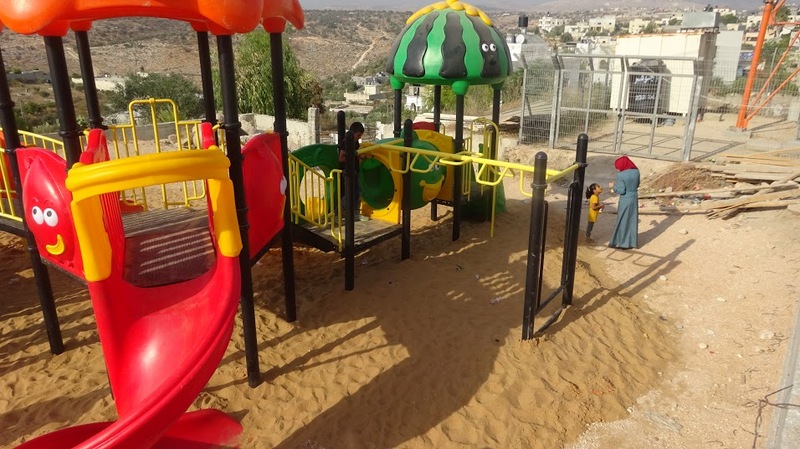 The community of Wadi Hilwah, Silwan has been working to design and construct a sports/playing field and a playground on two of the last remaining parcels of open land their their village. 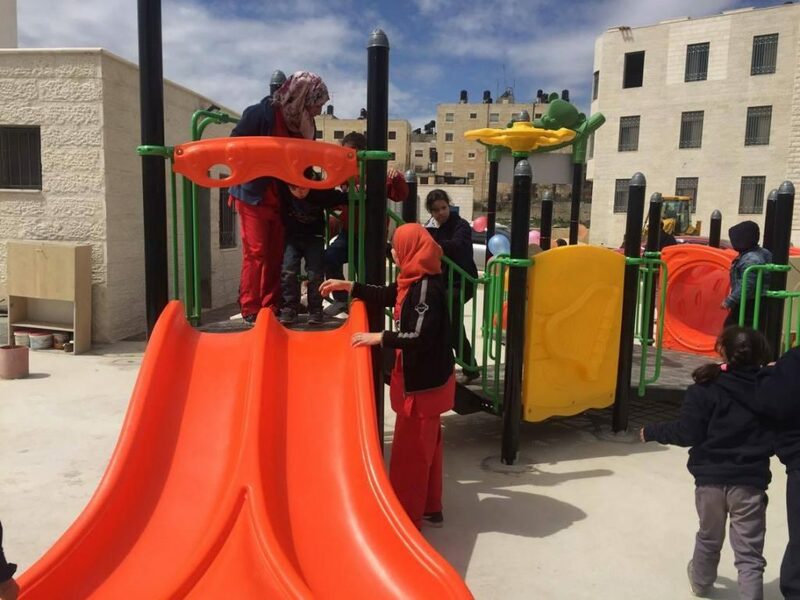 In cooperation with MECA (Middle East Children’s Alliance and and the Madaa Center, Playgrounds for Palestine is proud to be a part of the effort to put the community’s plan in motion to establish the first playing space in this town of over 55,000 residents. 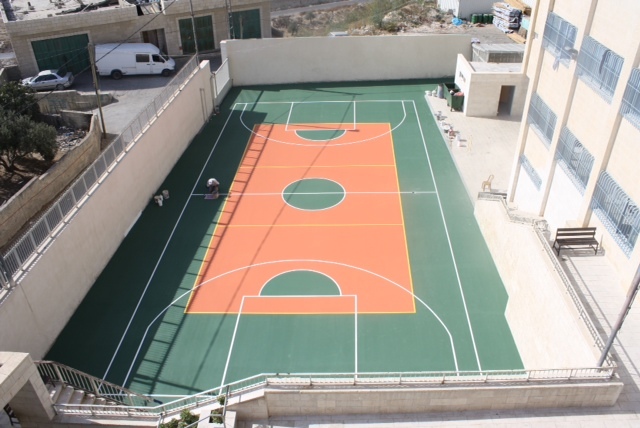 The sports field is used by teams and individuals of all ages. 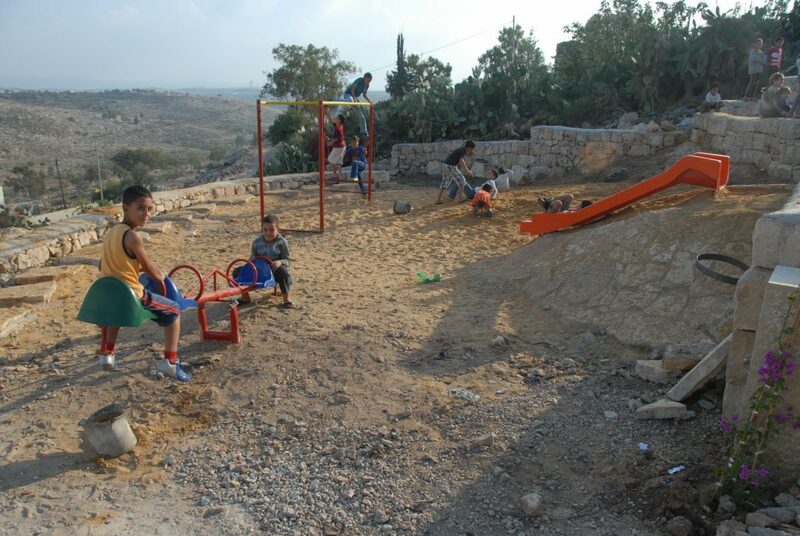 According to the community, these play and sports fields will offer an opportunity for healing and provide a space to procure the vast benefits of play experiences for the children of Silwan who suffer from ongoing psychological trauma, due to the constant threats and harassment from ultra- nationalist Israeli settlers who are trying to take over the neighborhoods of Silwan. 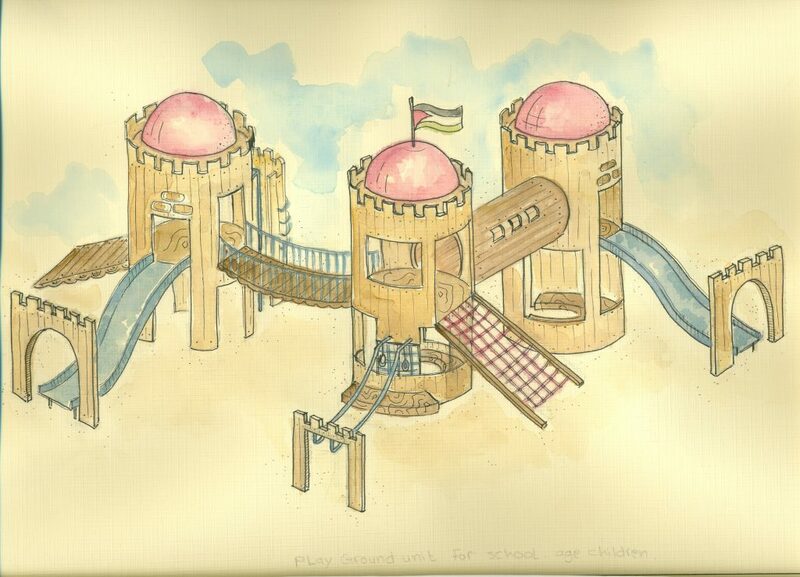 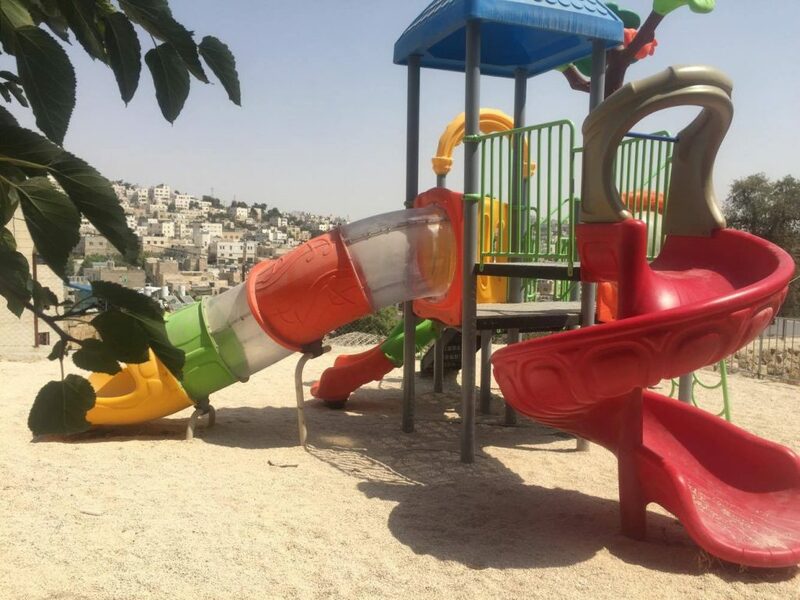 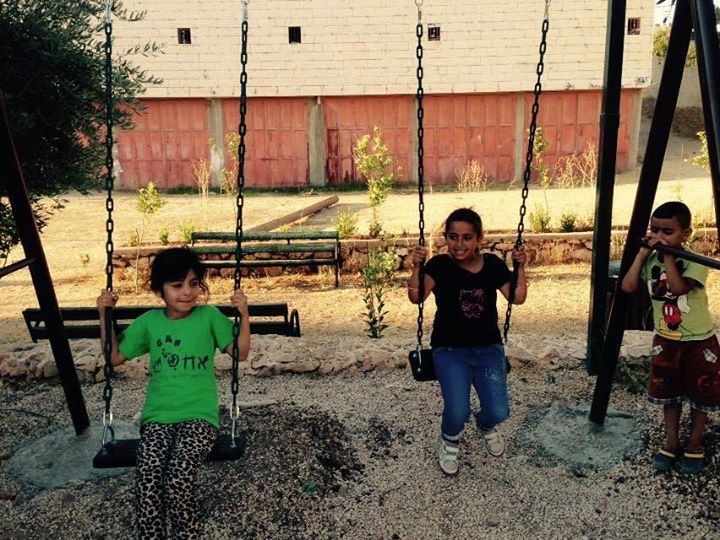 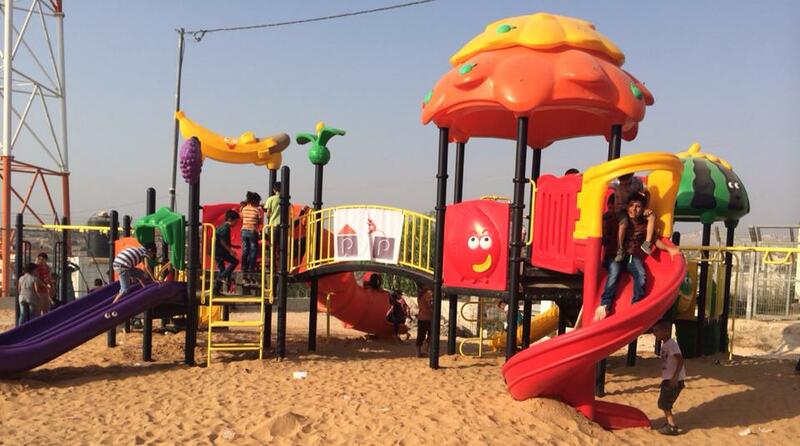 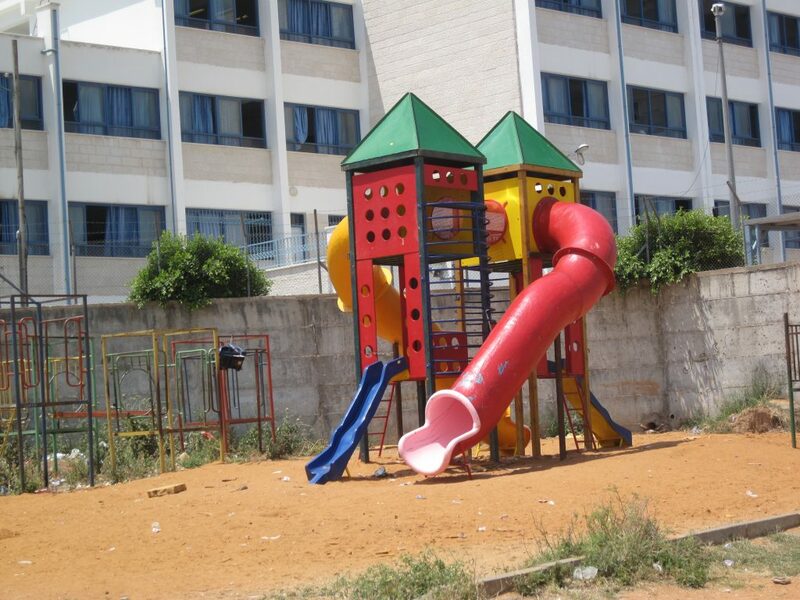 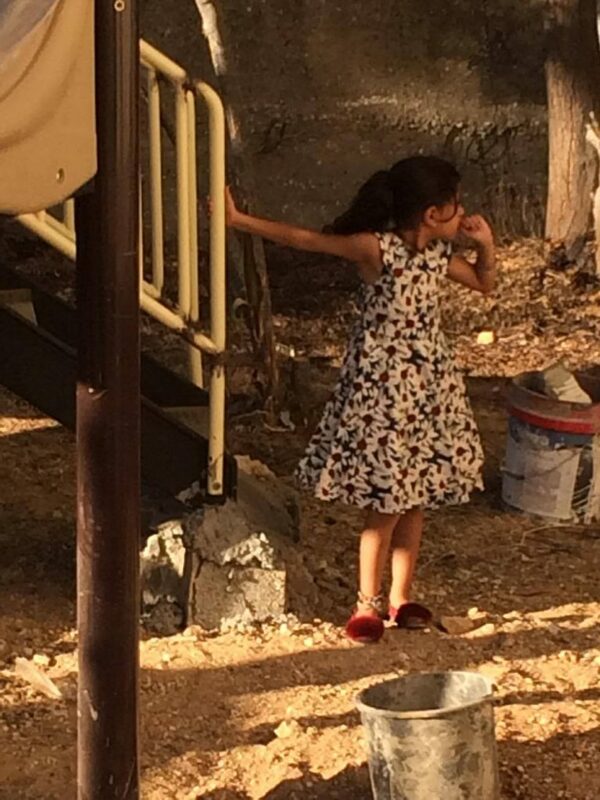 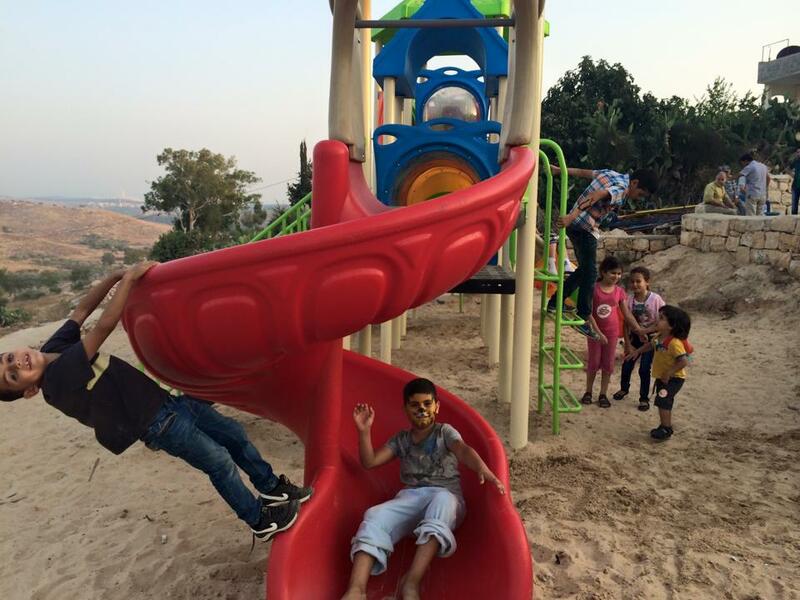 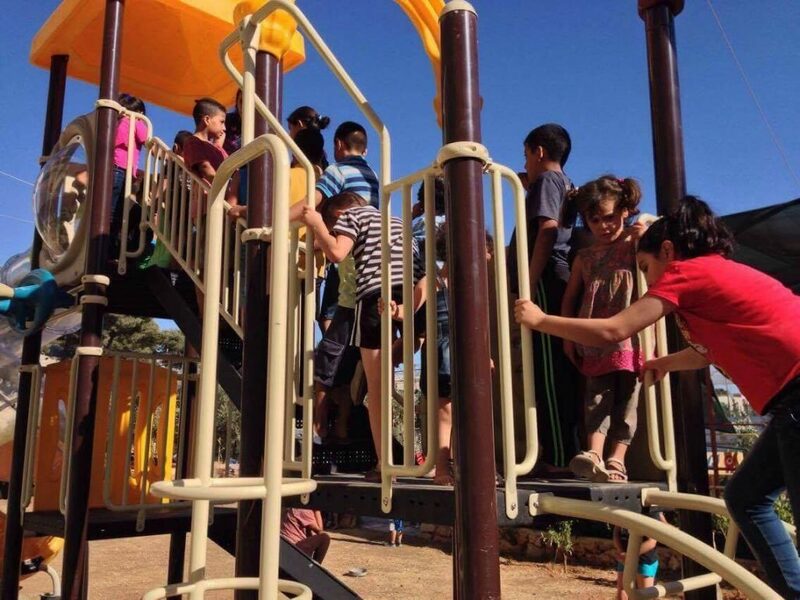 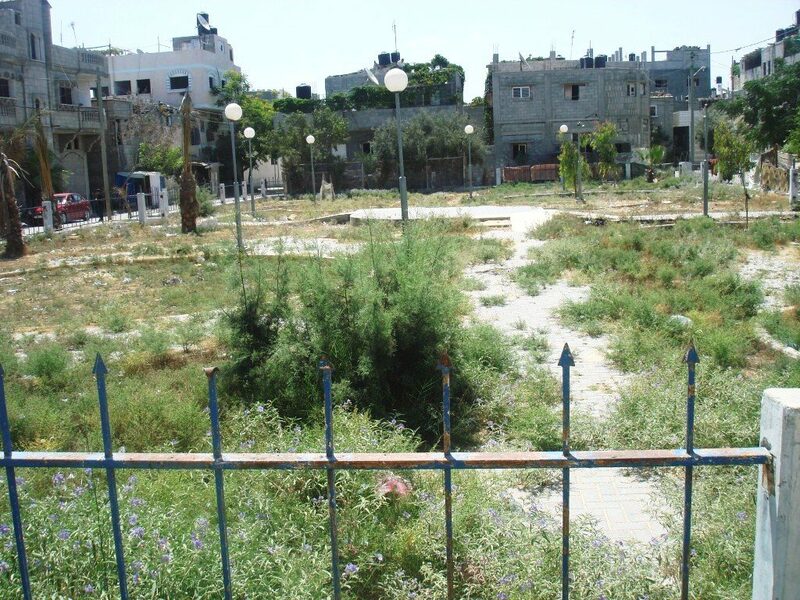 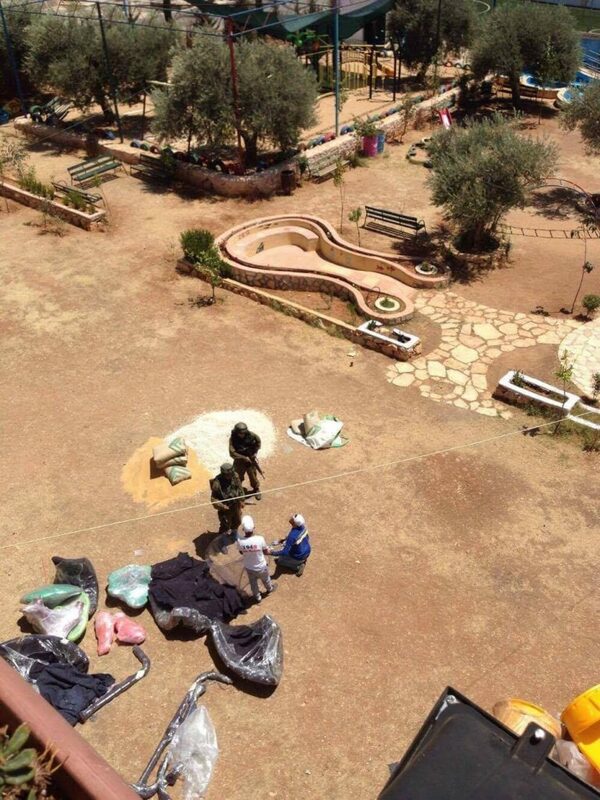 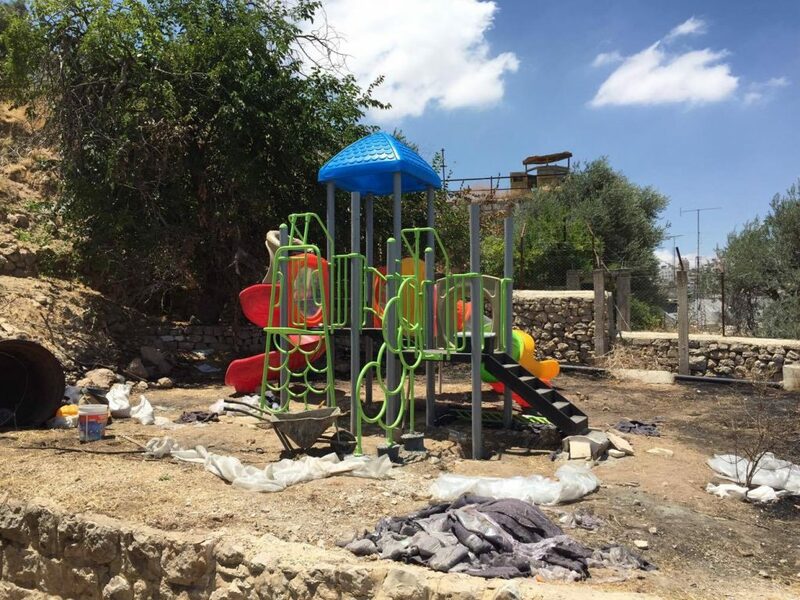 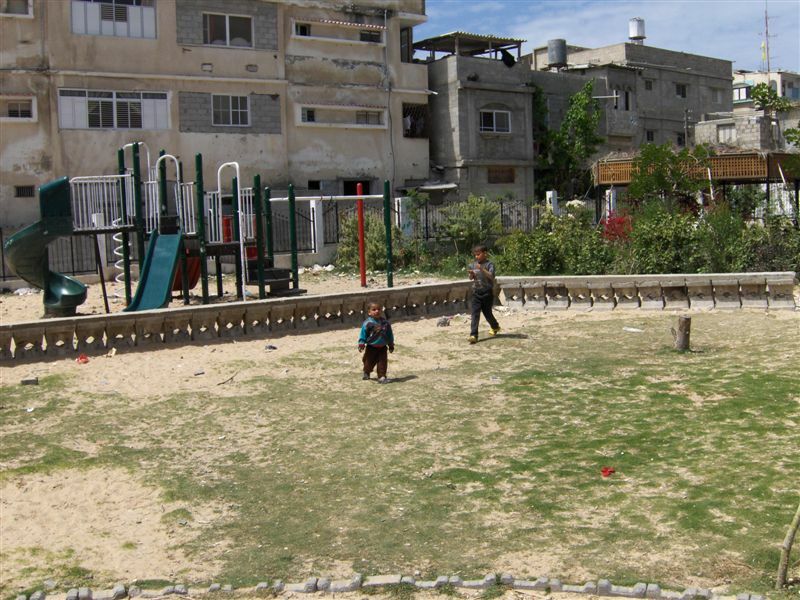 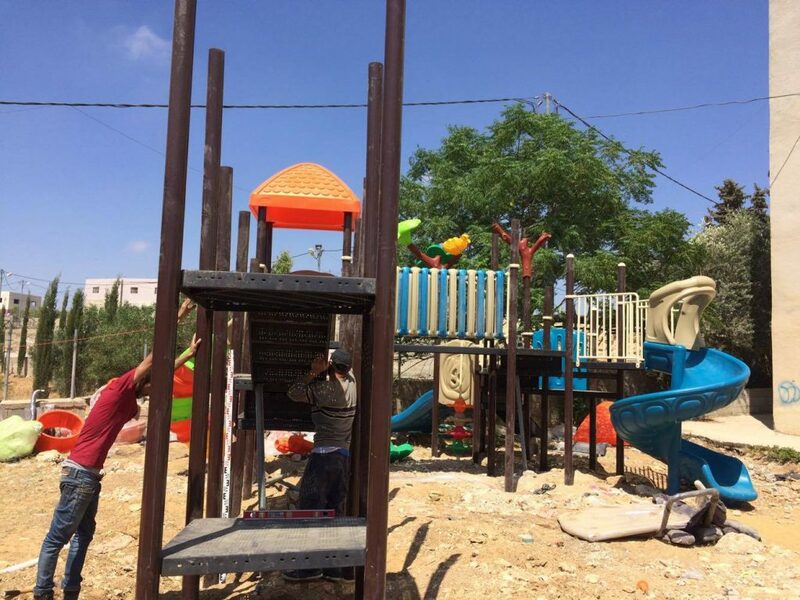 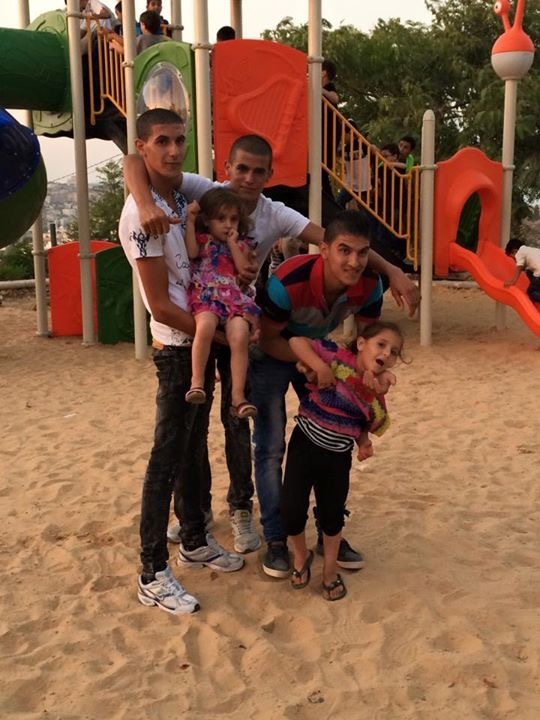 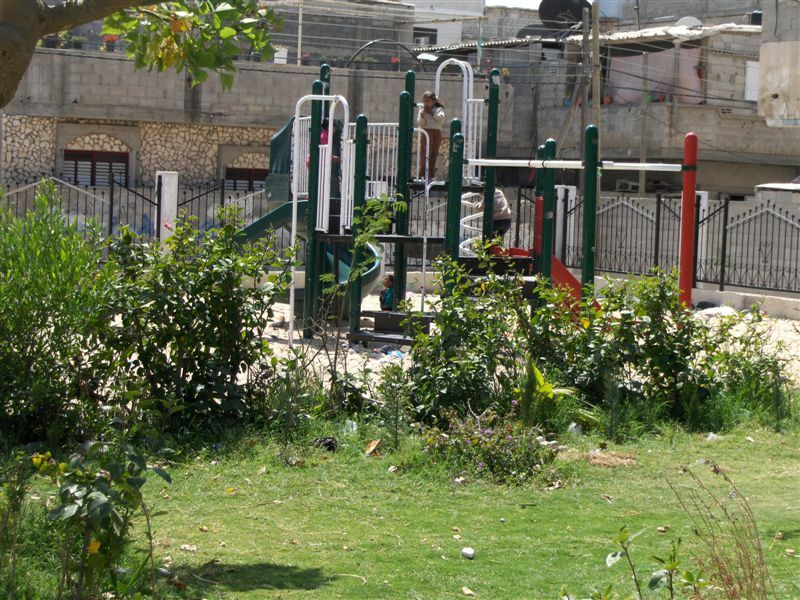 UPDATE: Unfortunately, in 2012, the Israeli military came in and demolished this playground. 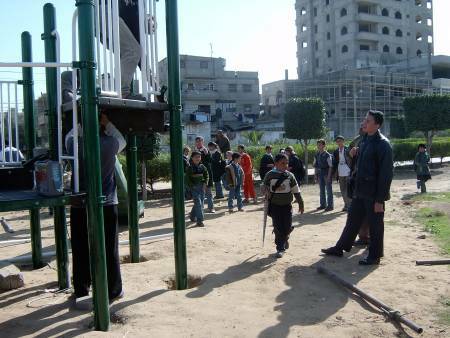 It was the only space available for recreation for hundreds of children. 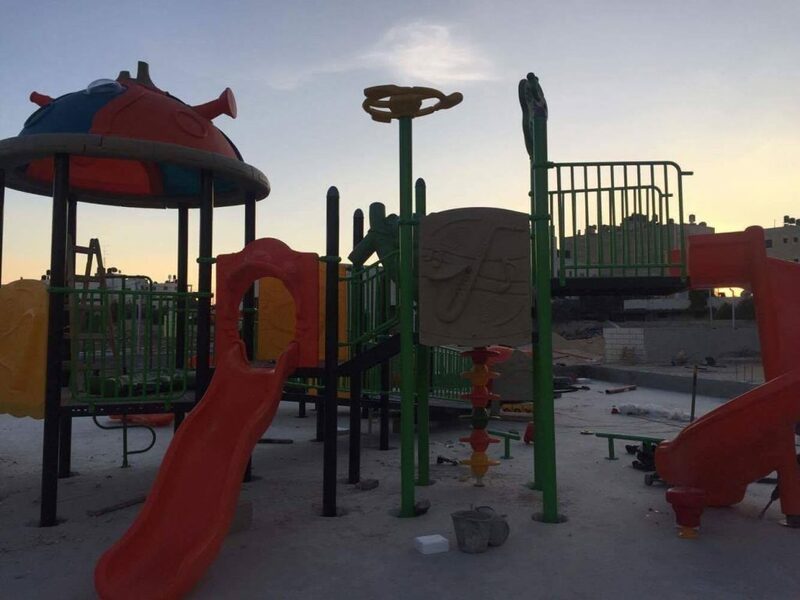 Here is a video of the demolition. 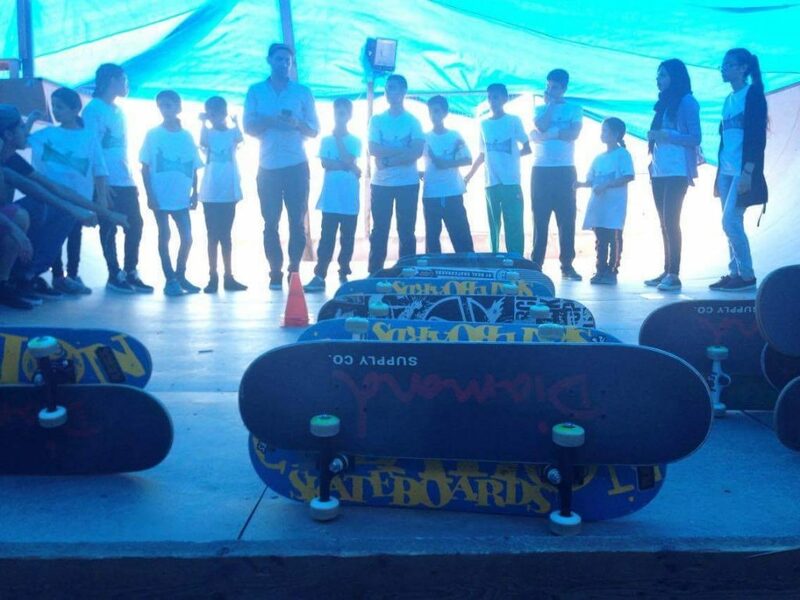 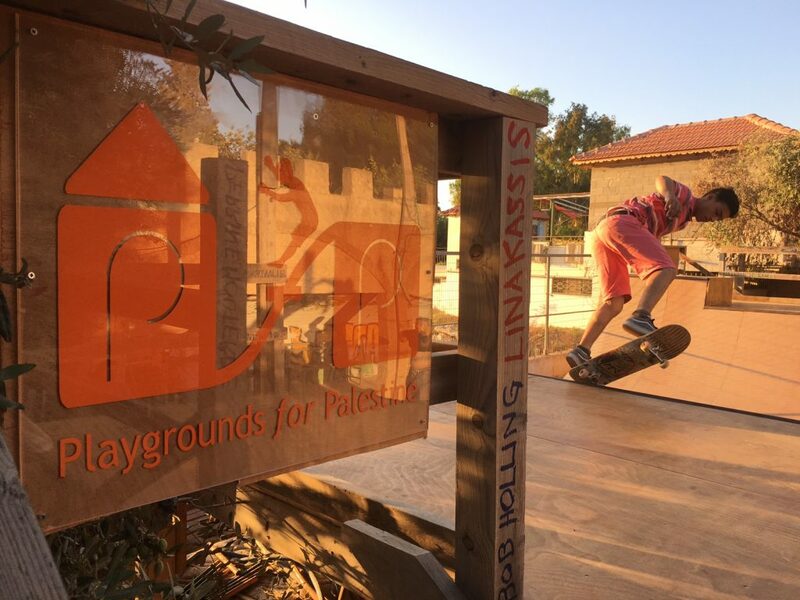 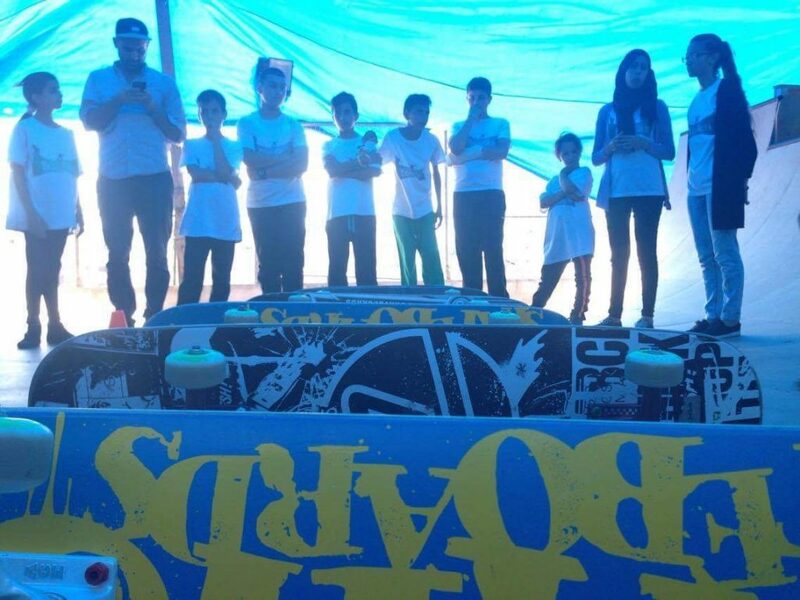 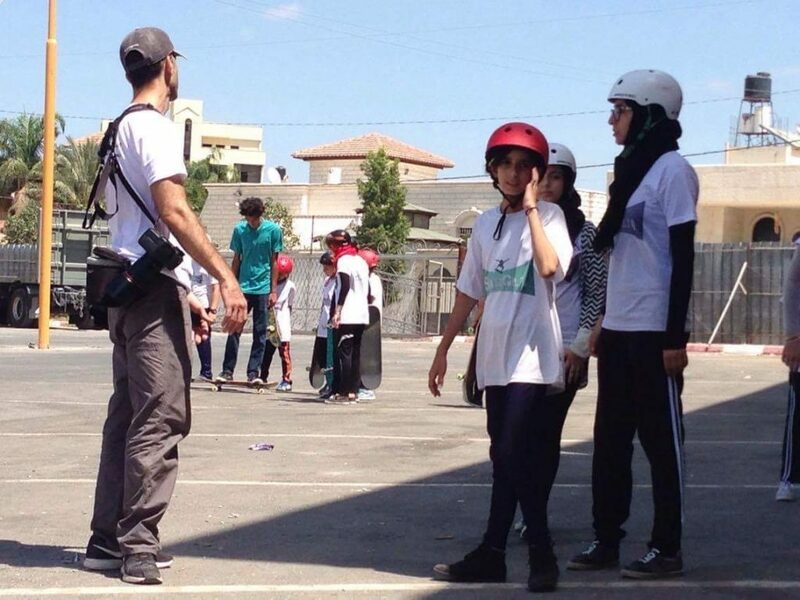 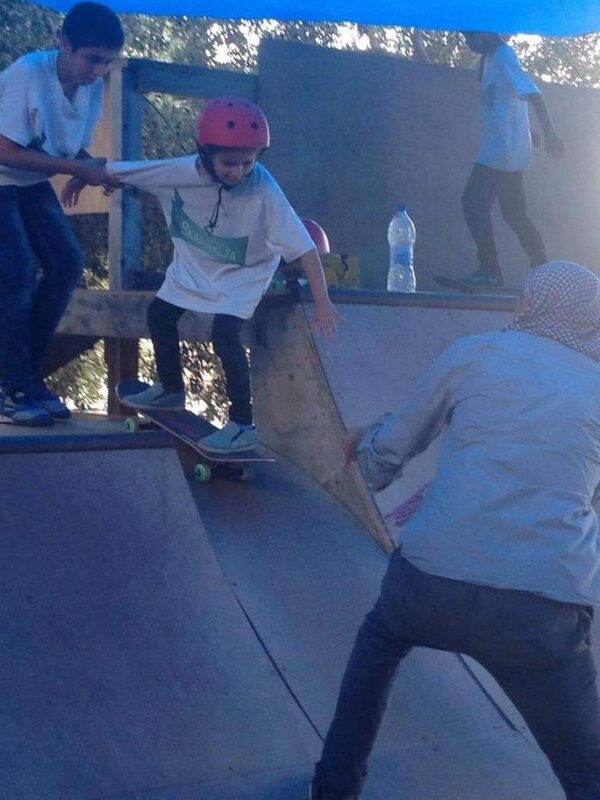 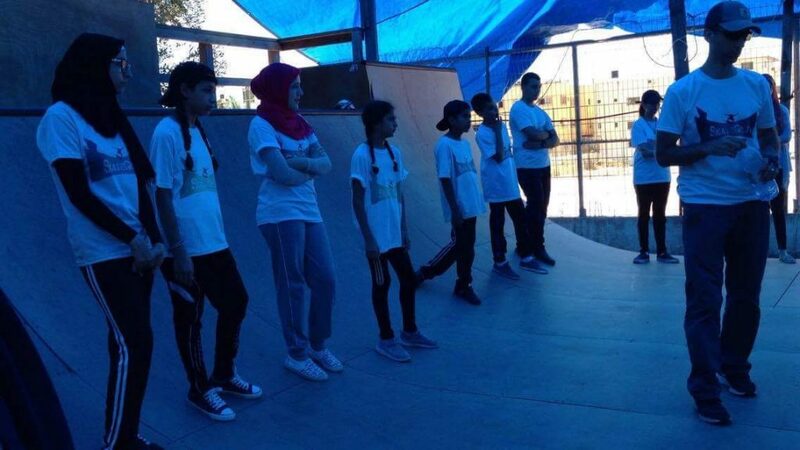 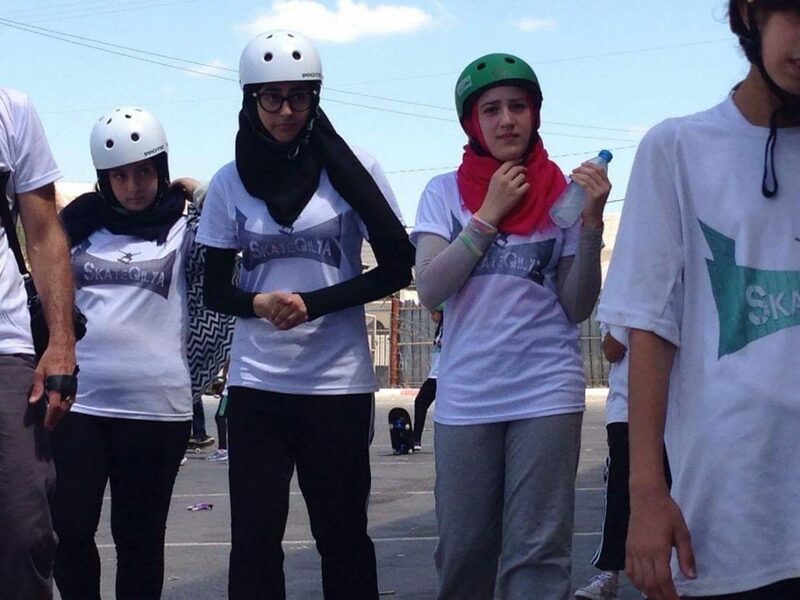 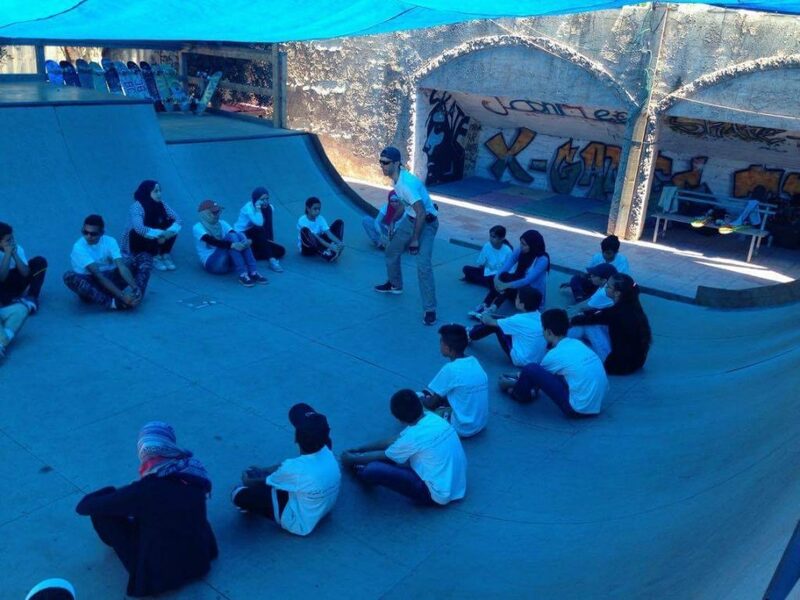 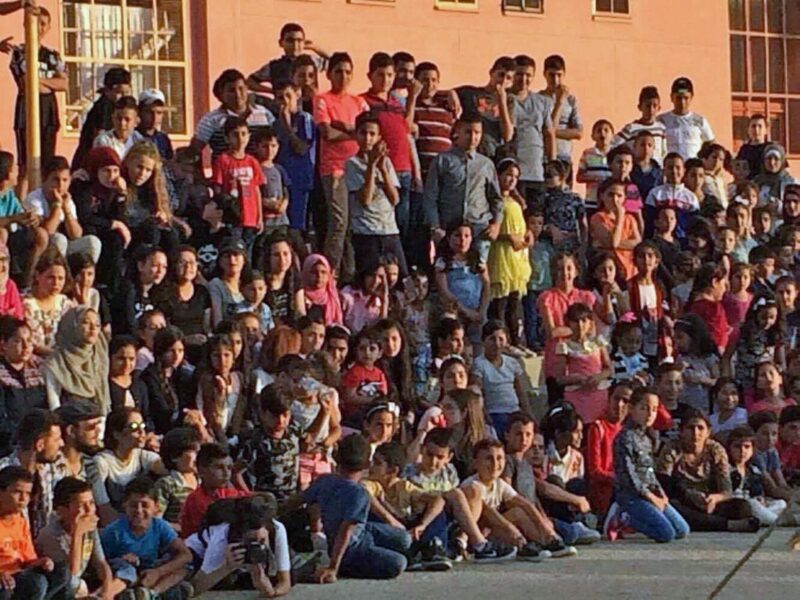 PfP partnered with SkateQilya to construct a skate ramp, buy skate equipment, and conduct ongoing workshops with children to promote skateboarding in Palestine among girls and boys of all ages. 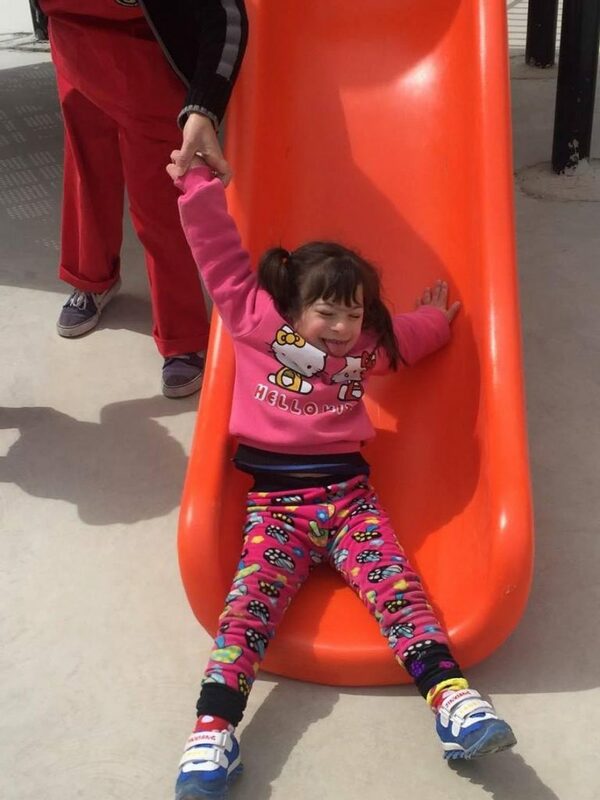 The results have been spectacular! 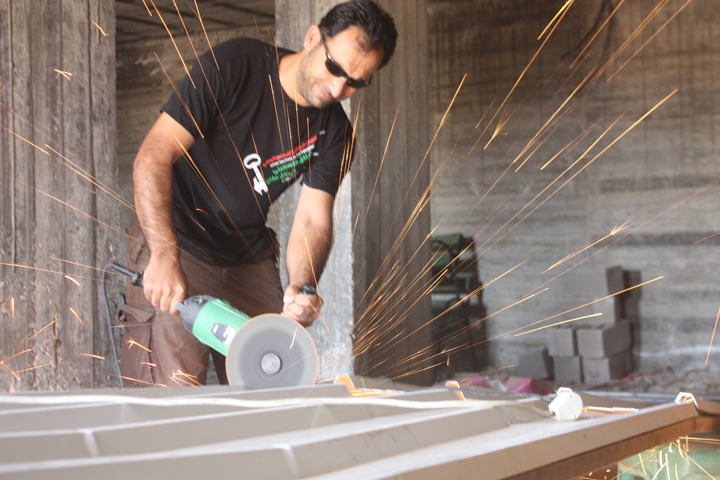 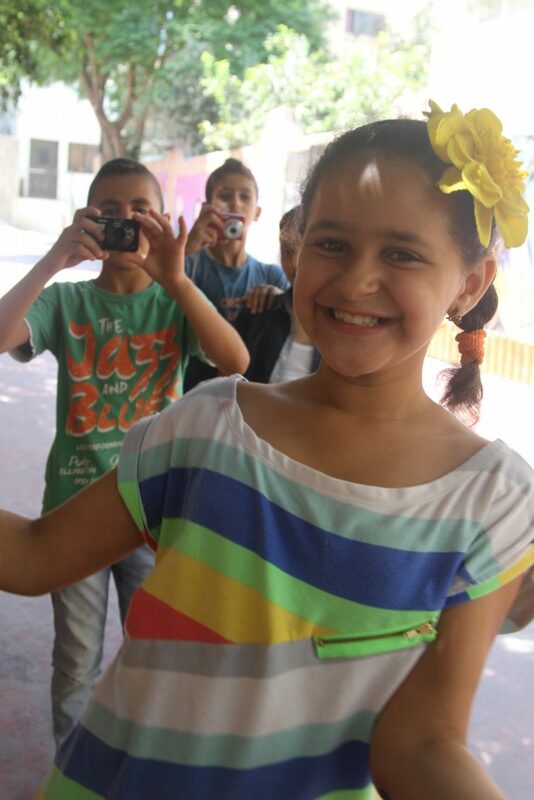 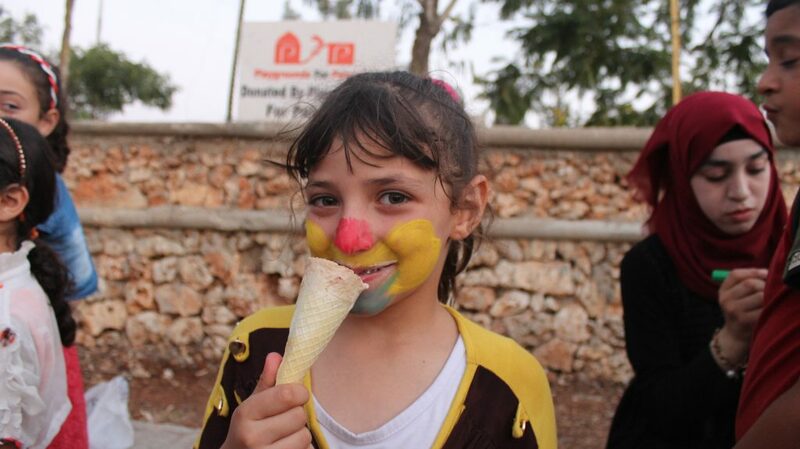 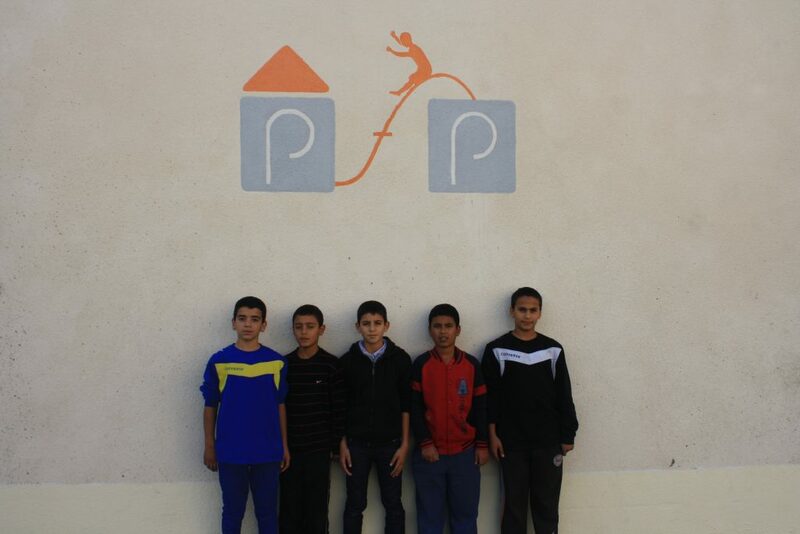 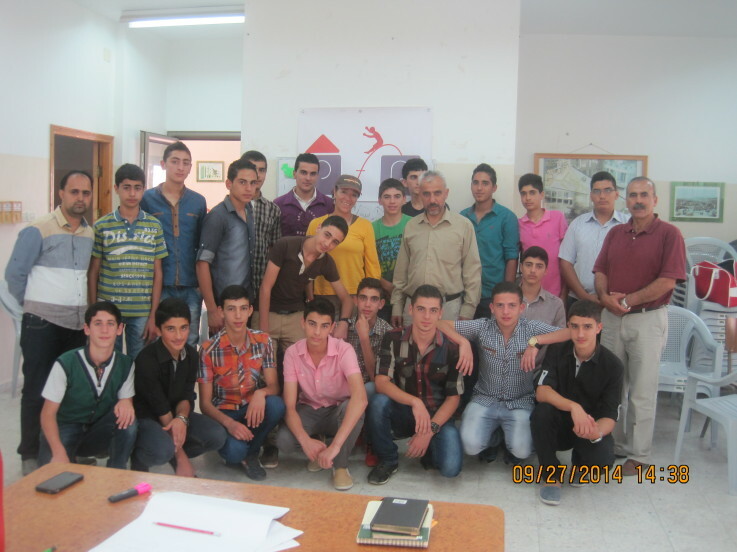 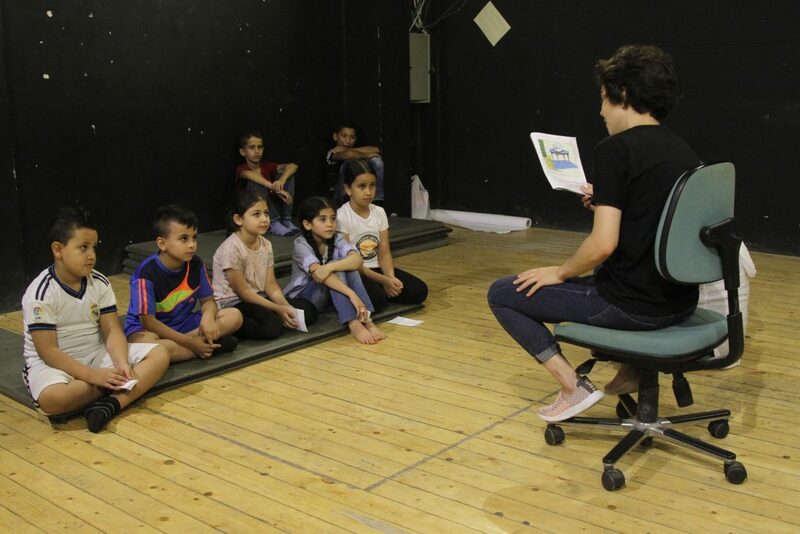 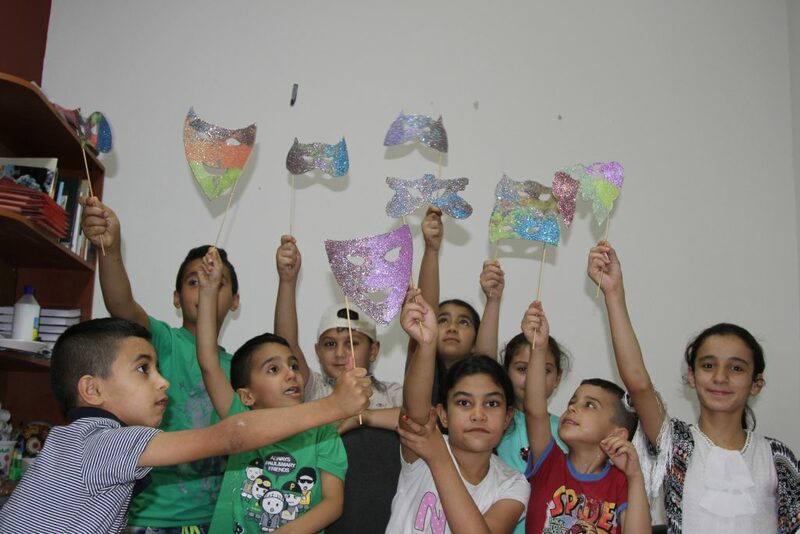 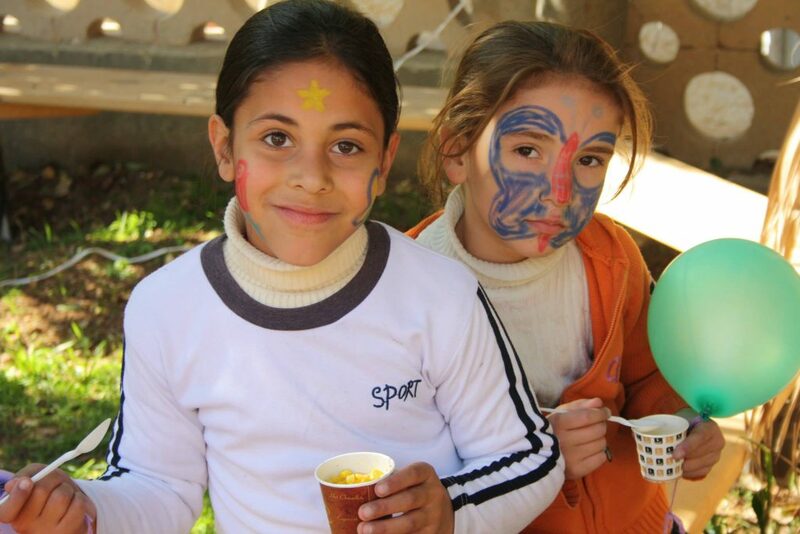 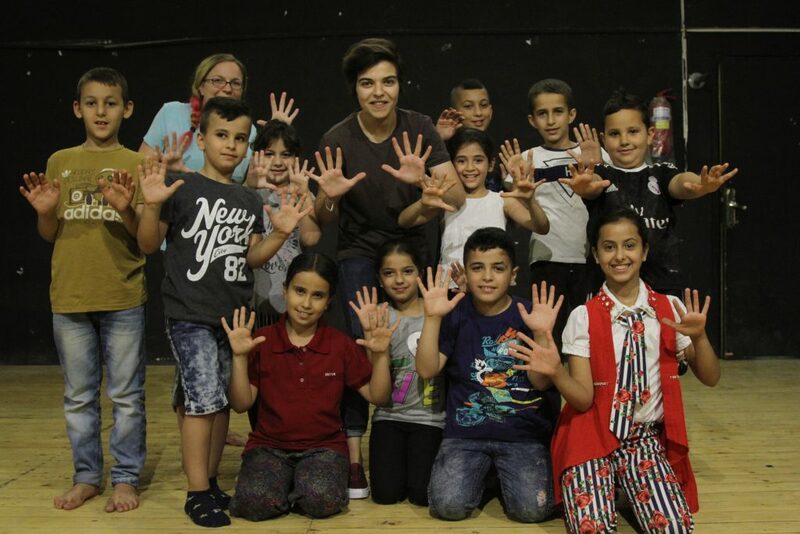 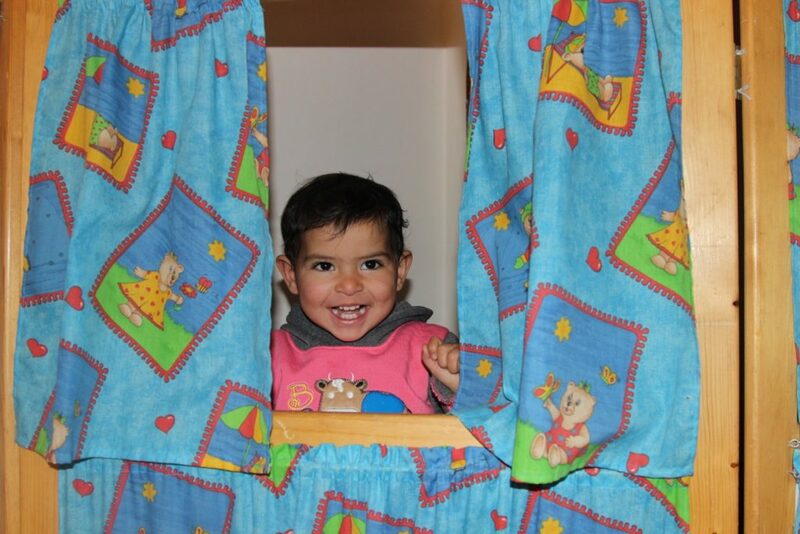 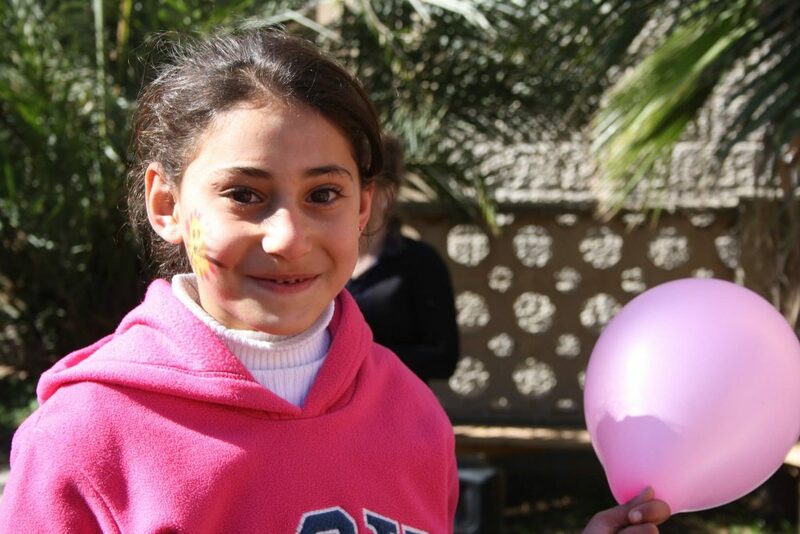 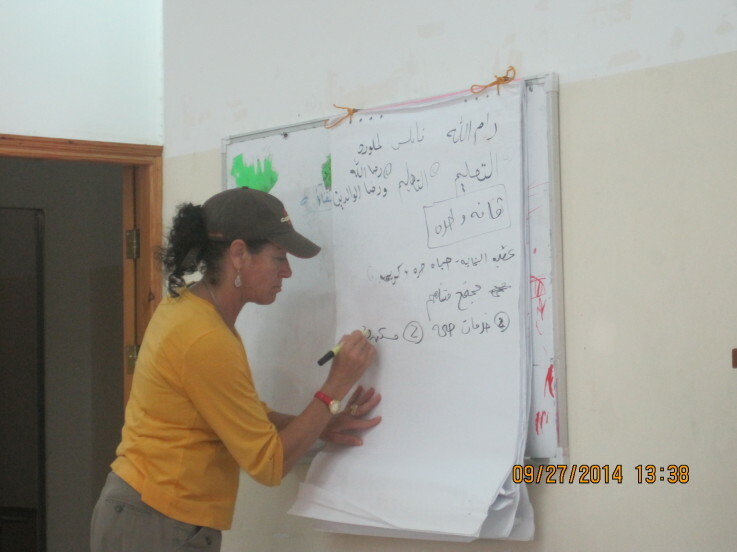 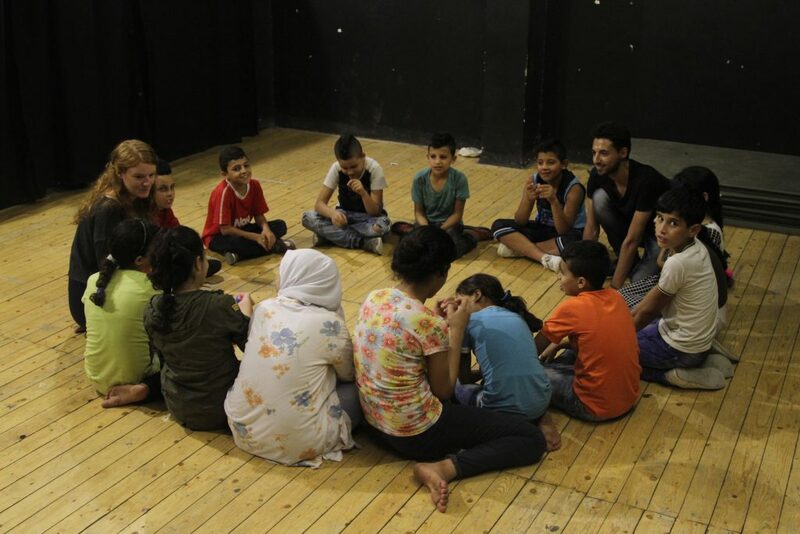 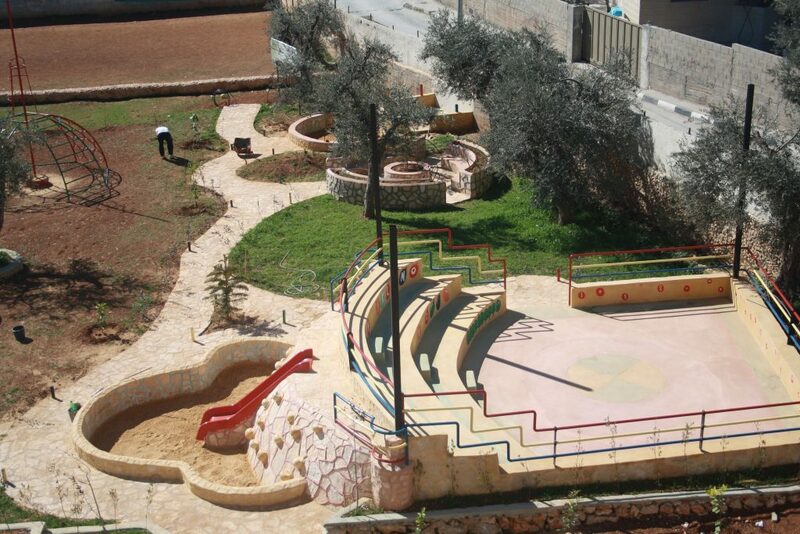 We are proud to sponsor The Freedom Theatre Child Center in Jenin. 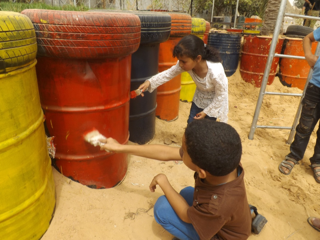 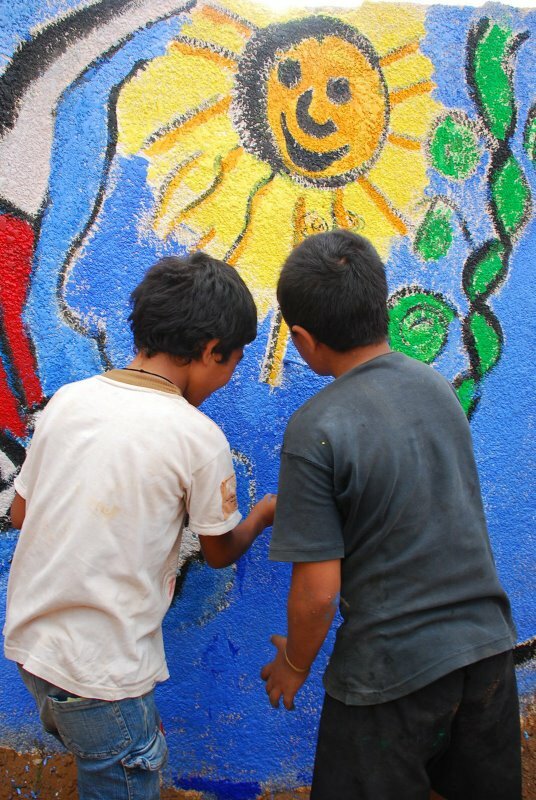 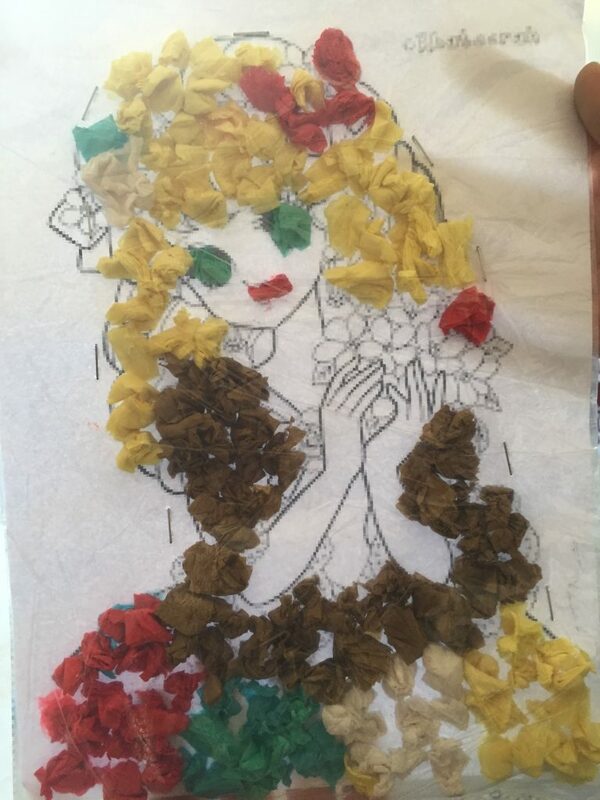 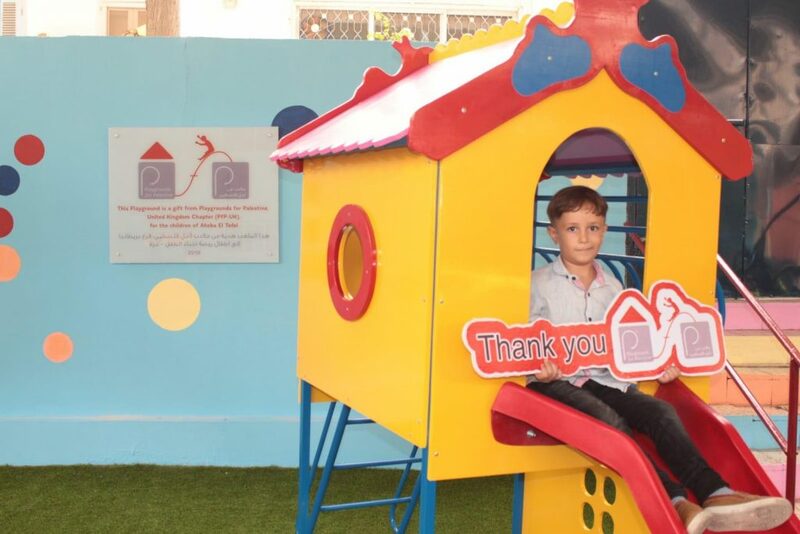 In addition to rehabilitation of the space, PfP made a three-year, renewable commitment to sponsor an annual program that brings together children ranging in age from 4 to 12 in creative expression that focuses on preservation of the environment. 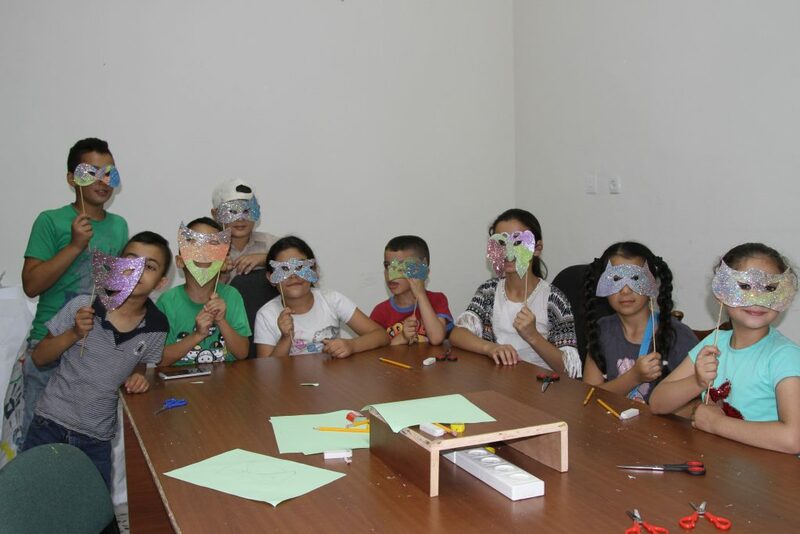 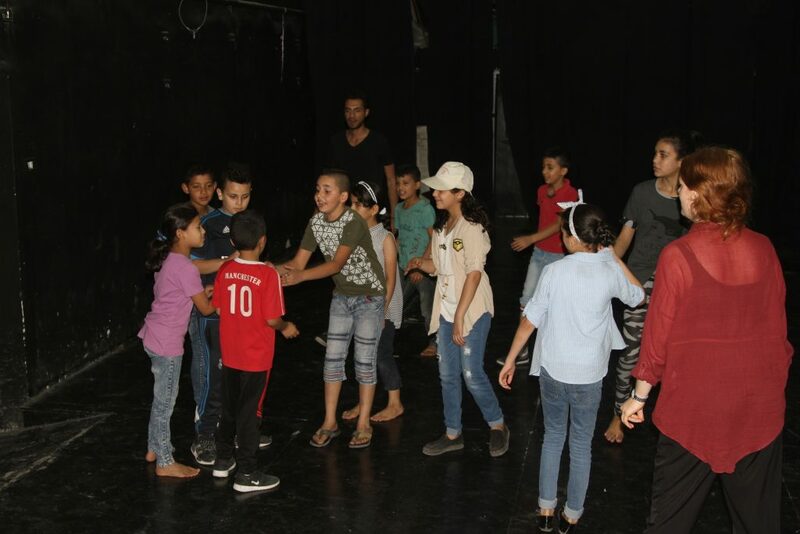 The group conducts team building exercises aimed at overcoming age and gender barriers among children, allowing them to experience the difference of being together rather than apart. 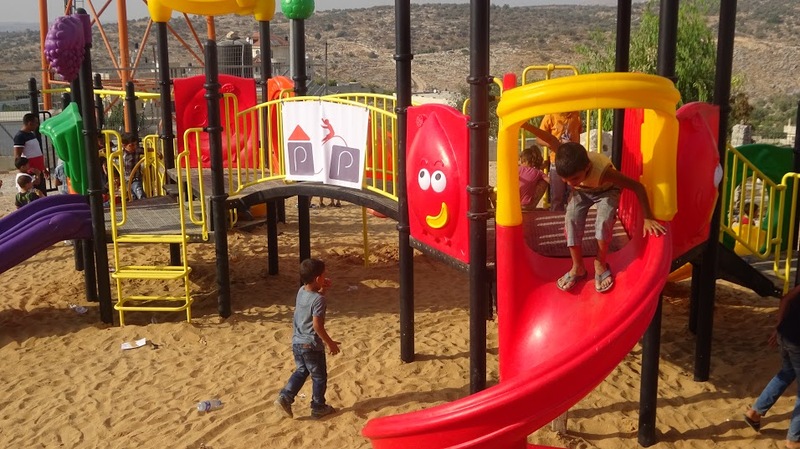 This is the second playground (in addition to the park itself) we built at the Lajee Center inside the Aida Refugee Camp in the Bethlehem District, Palestine. 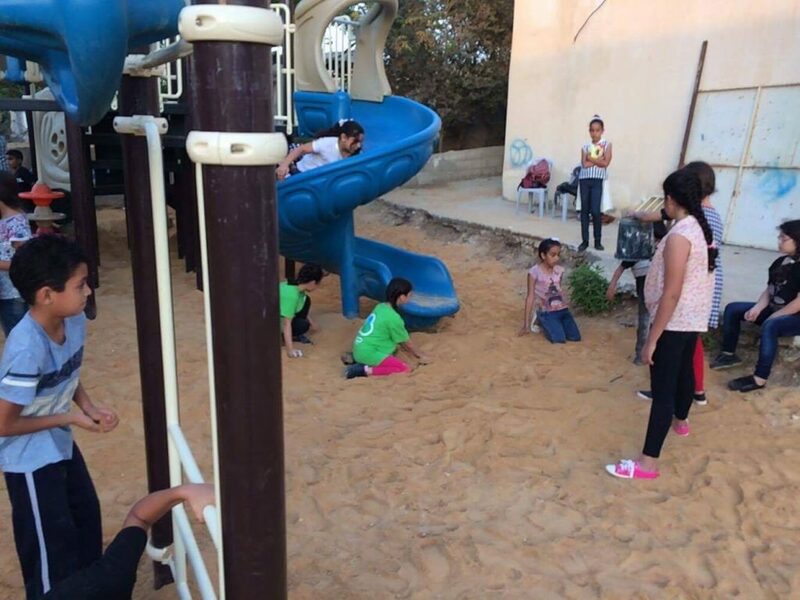 Lajee Center’s work with children so inspired us that we decided to partner with them permanently to oversee our installations in other locations. 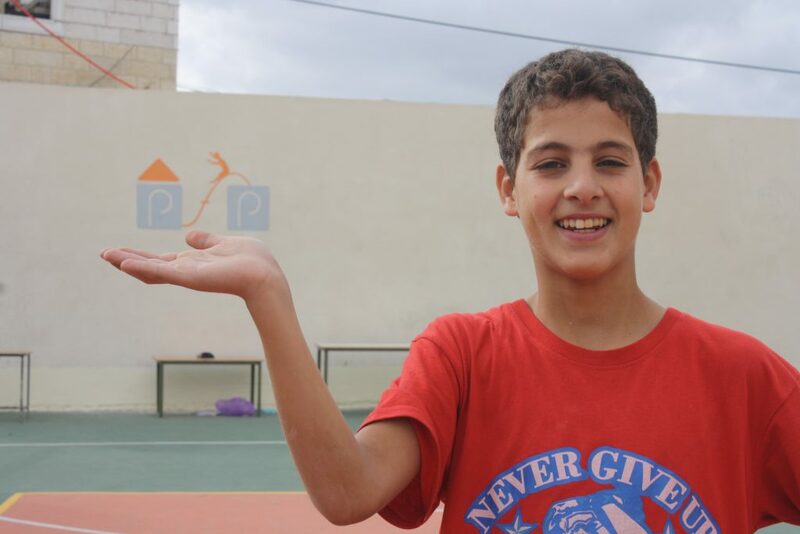 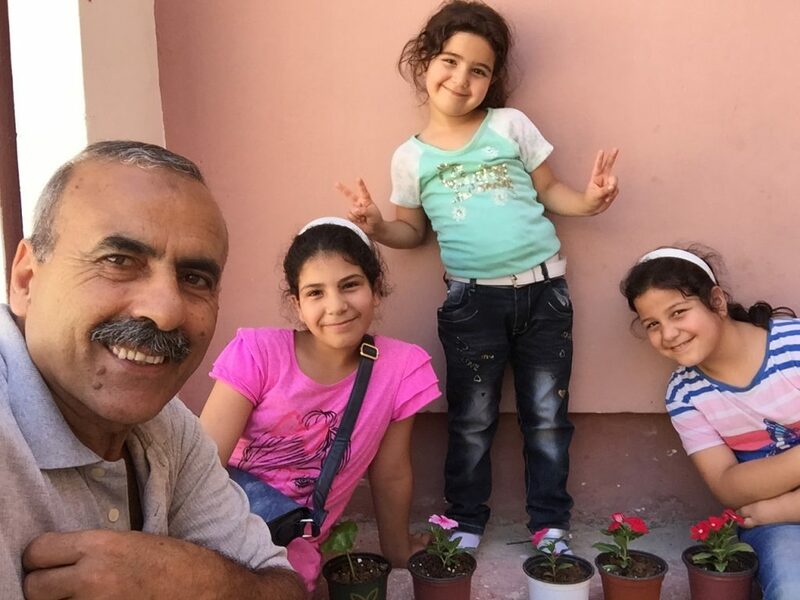 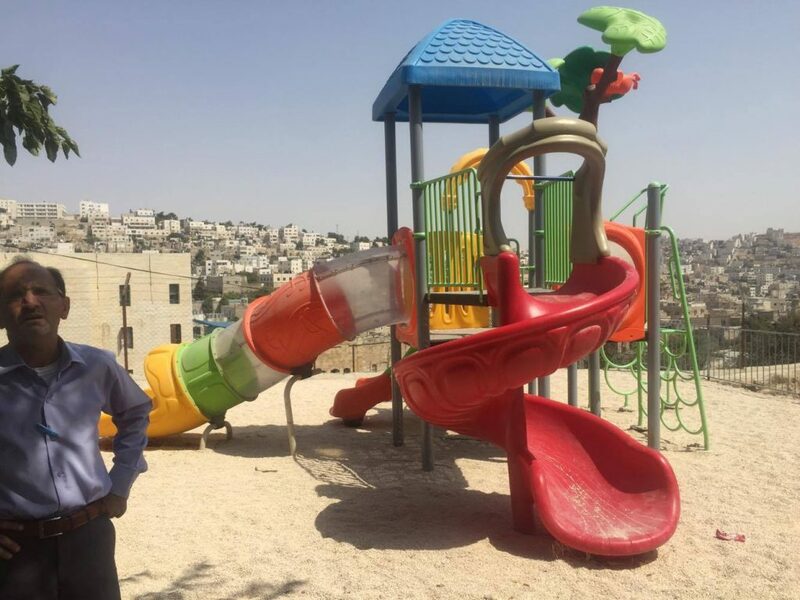 In particular, Salah Ajarma’s passion and dedication to Palestine’s children has made this center a refugee for thousands of children who come to the center daily, where they spend their summers and after school hours. 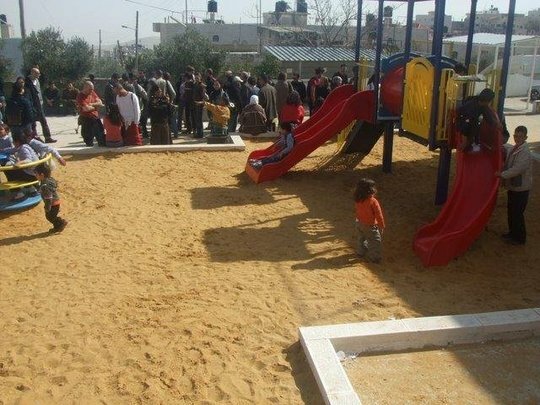 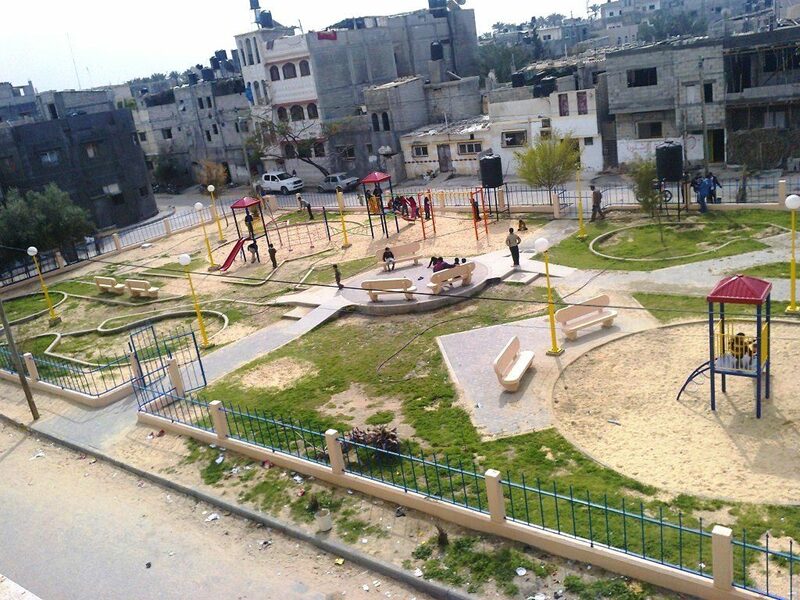 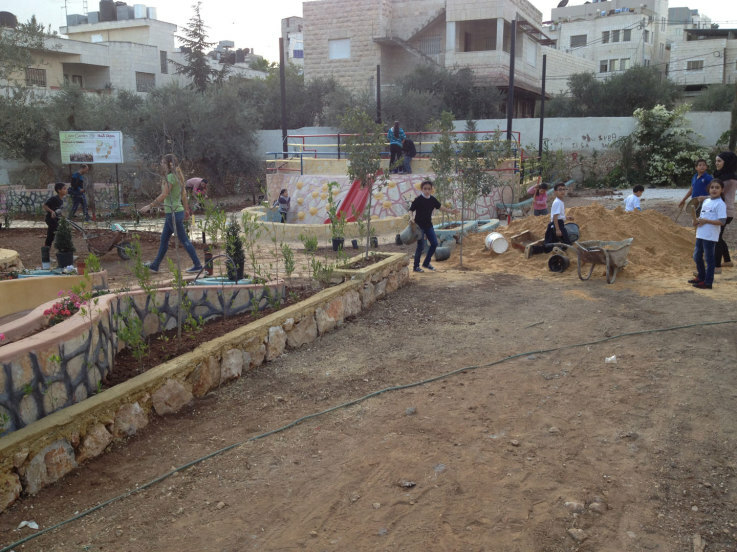 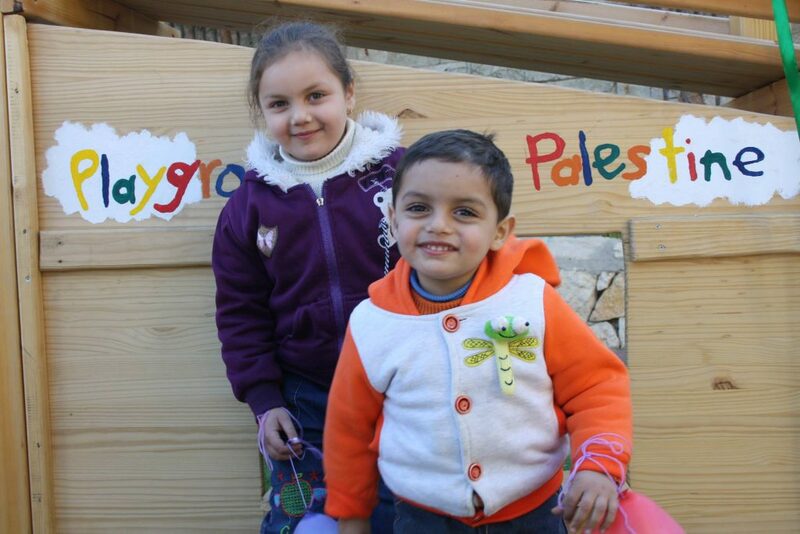 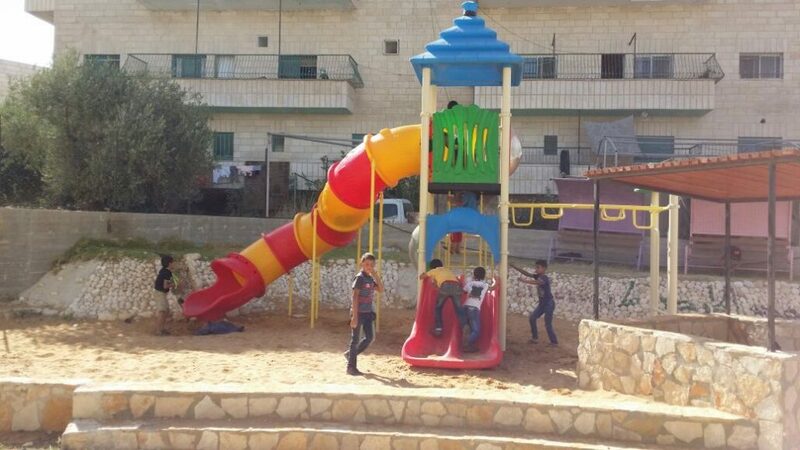 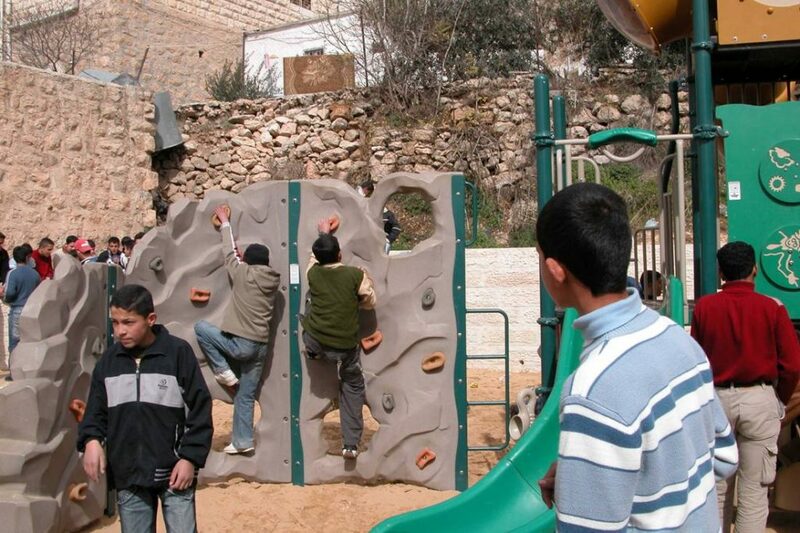 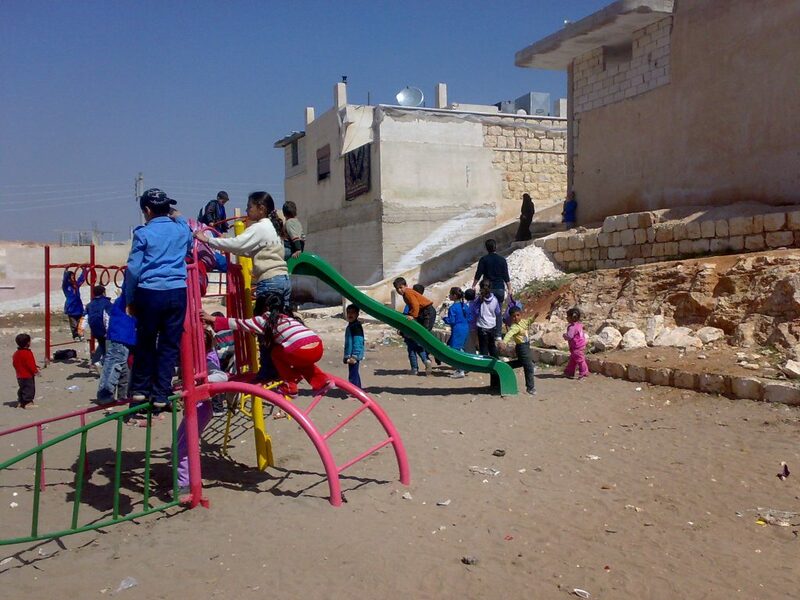 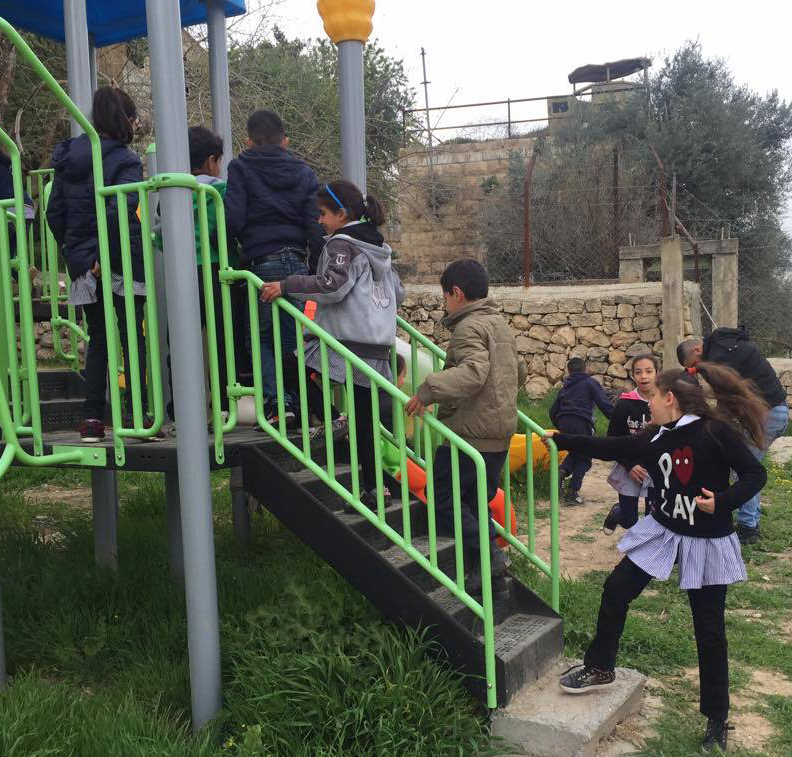 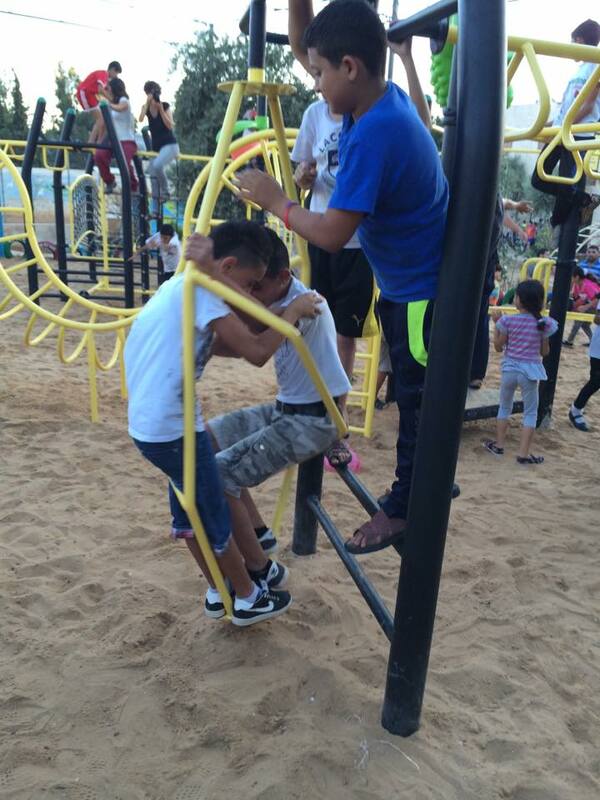 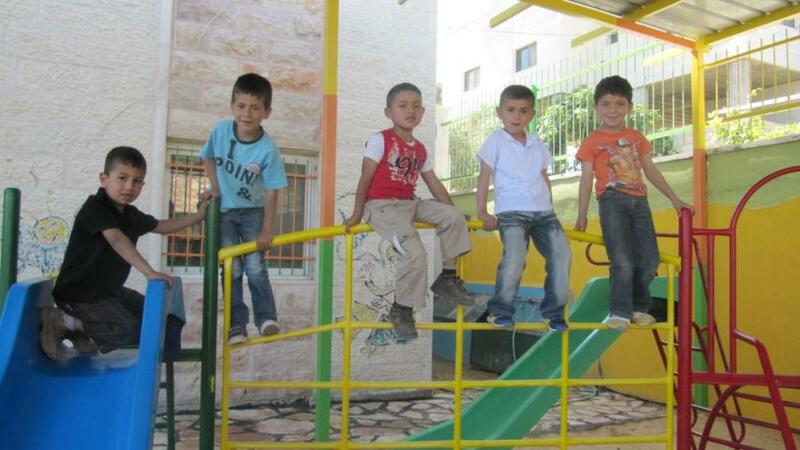 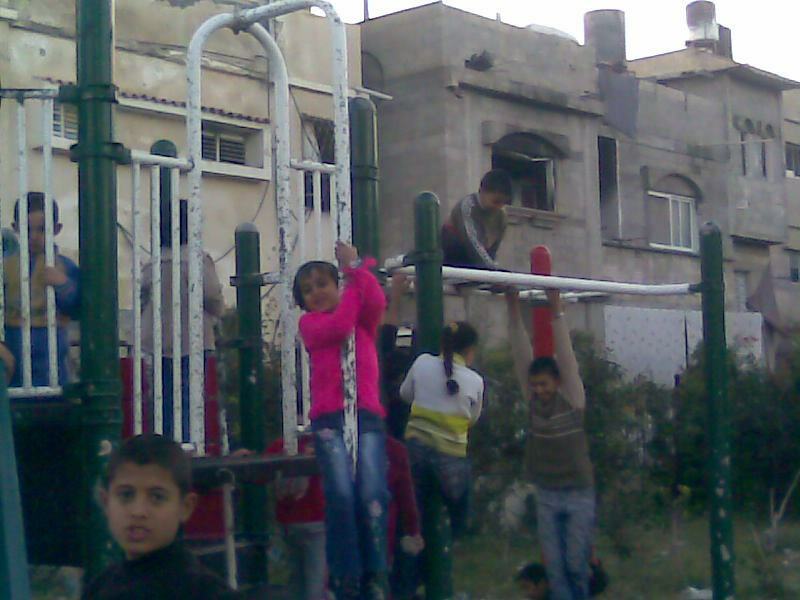 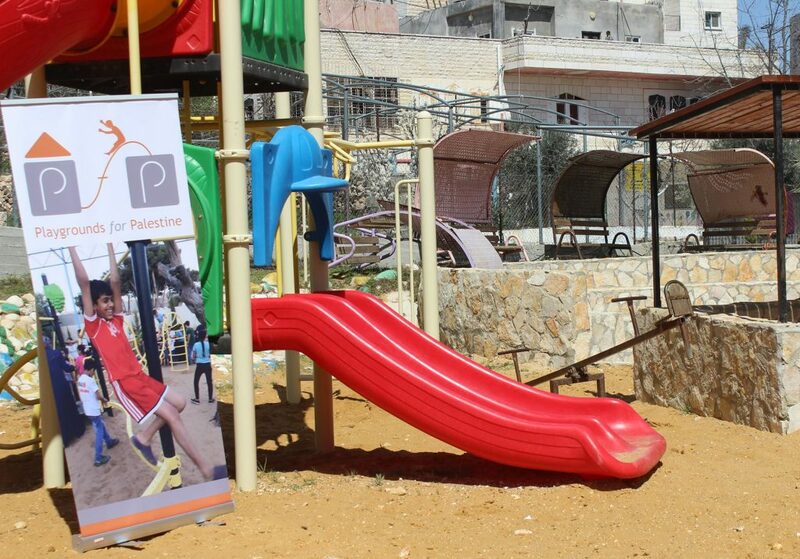 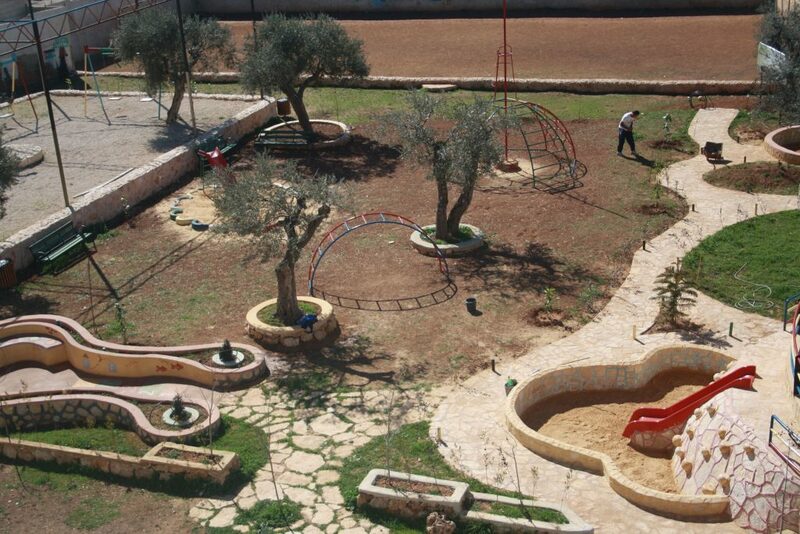 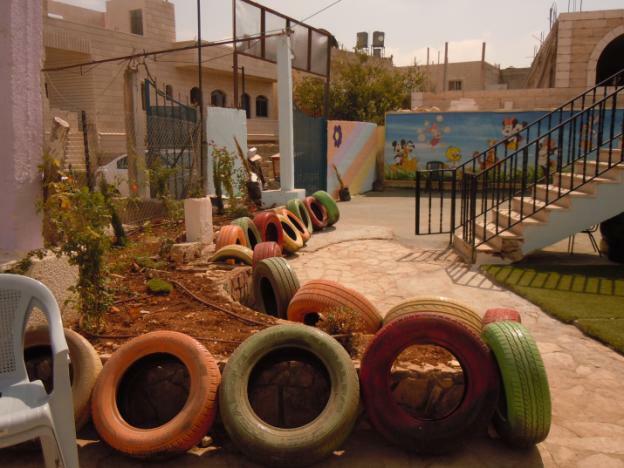 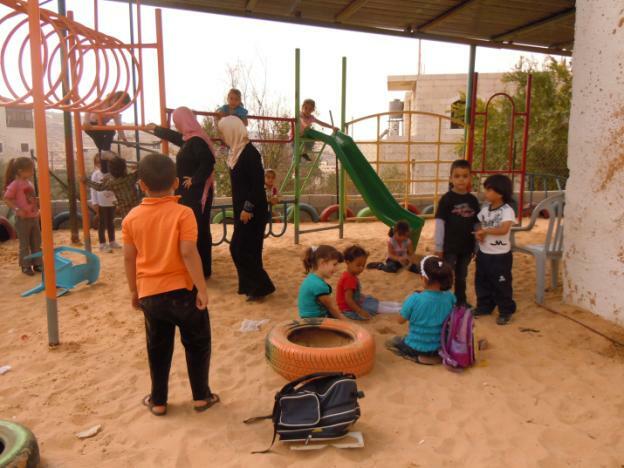 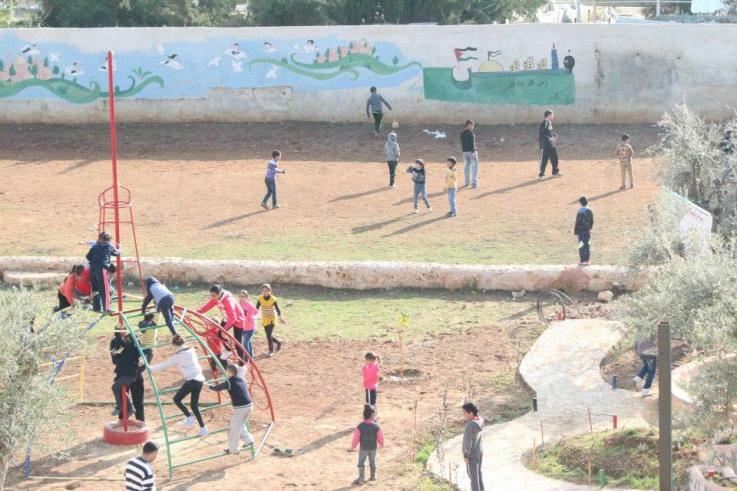 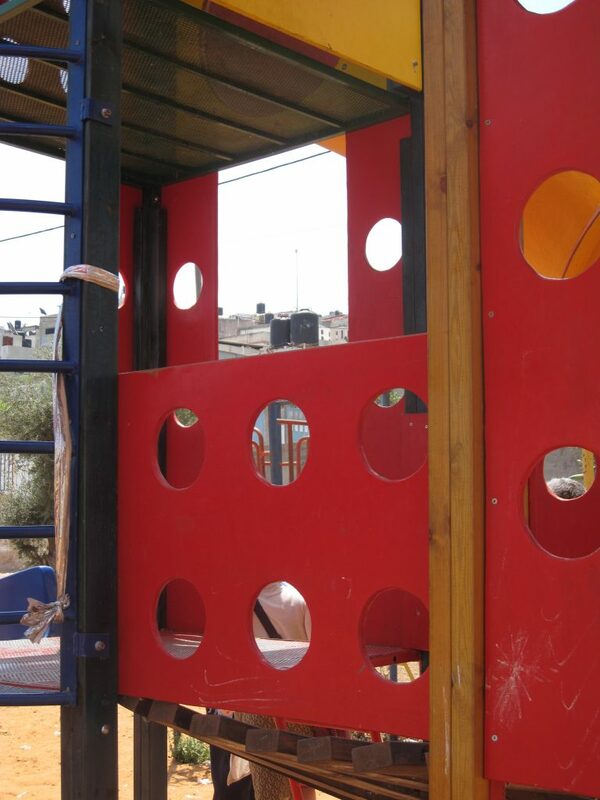 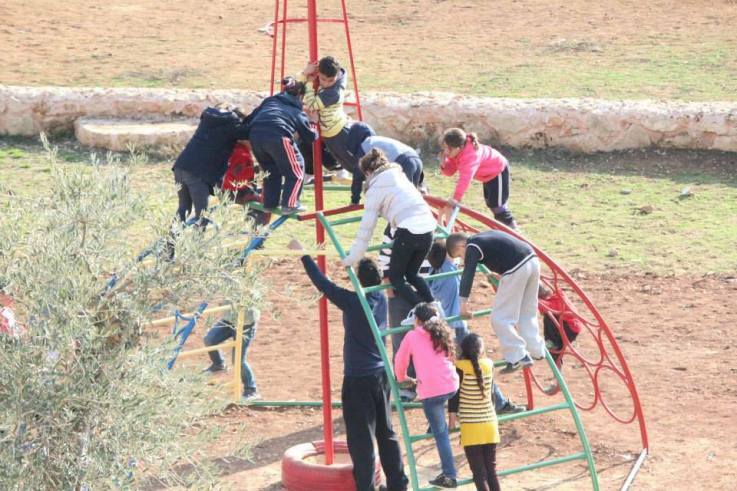 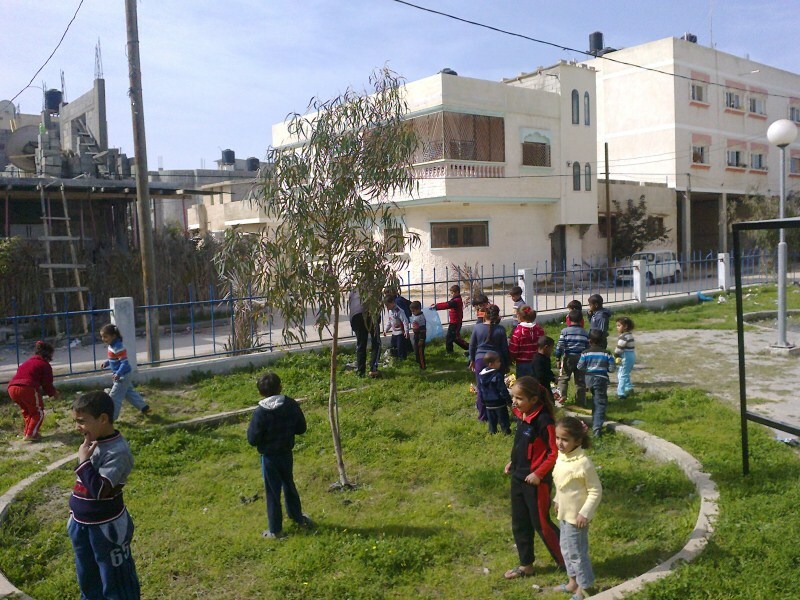 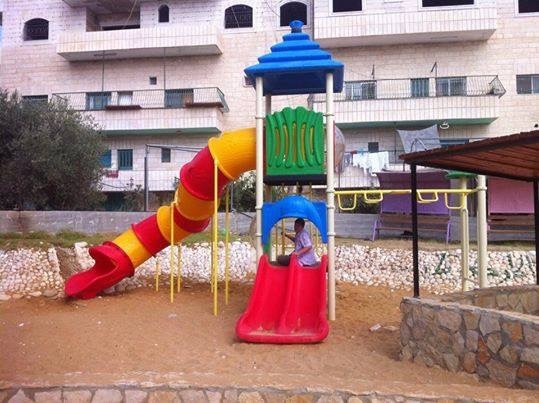 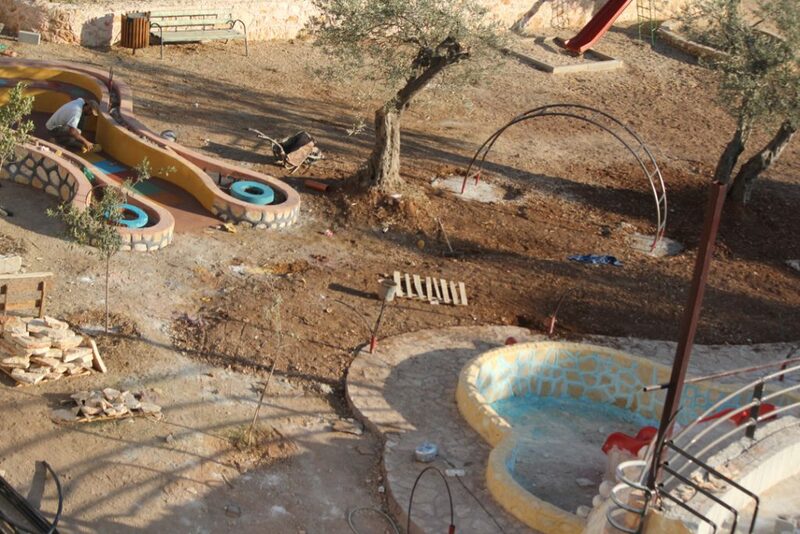 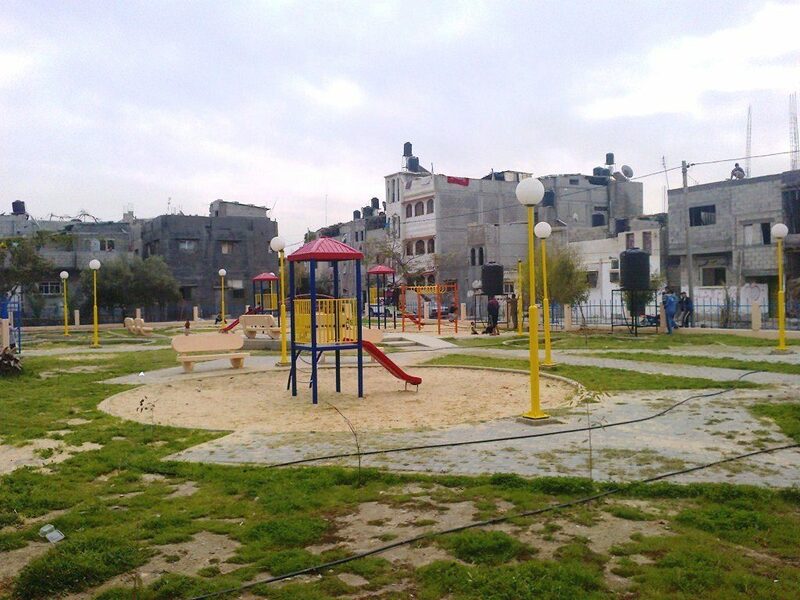 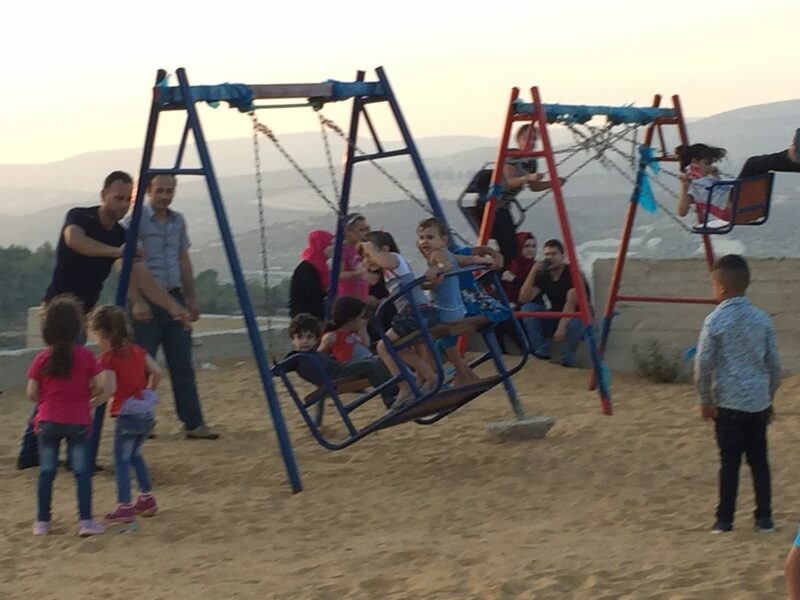 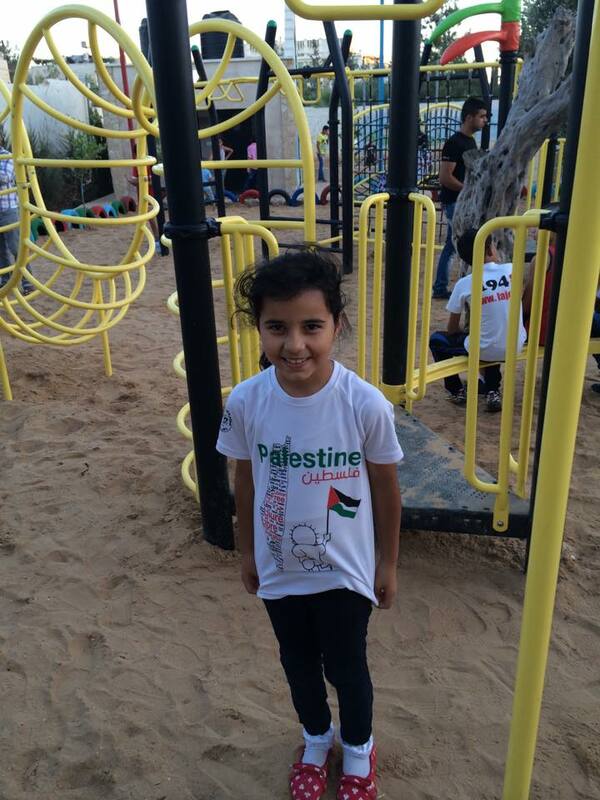 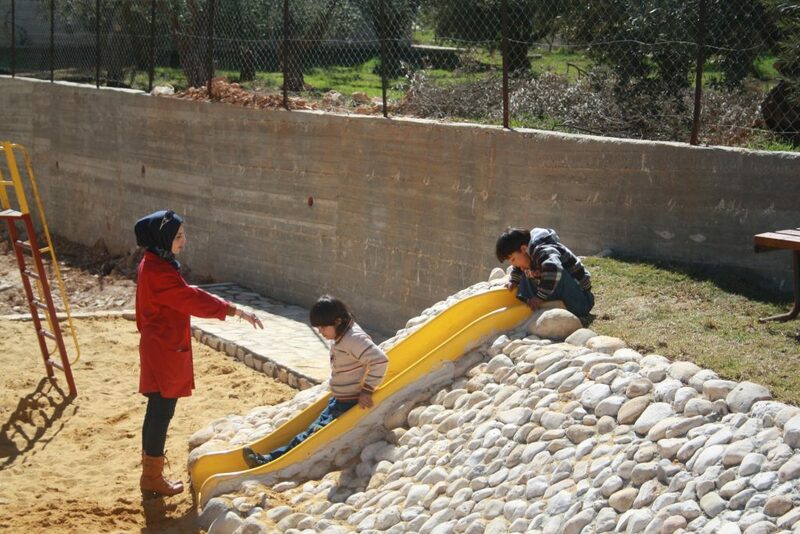 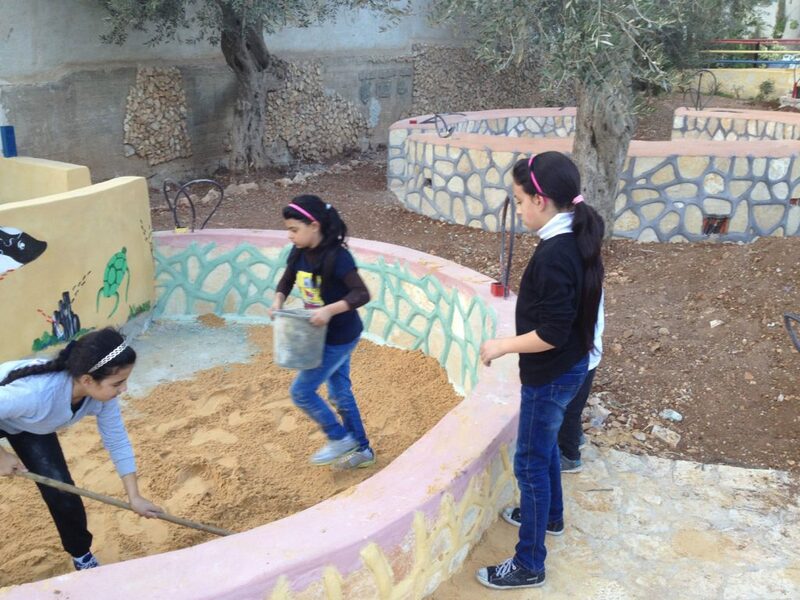 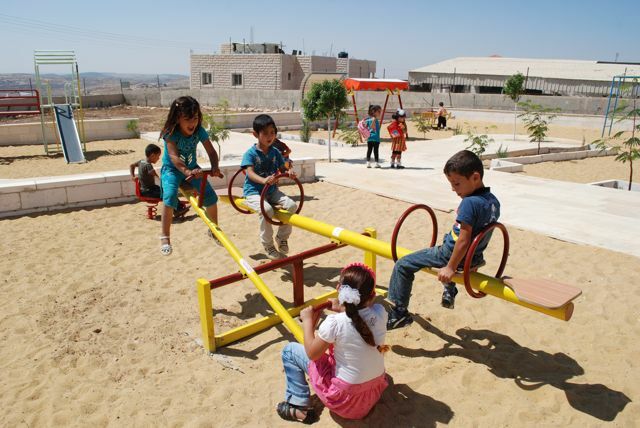 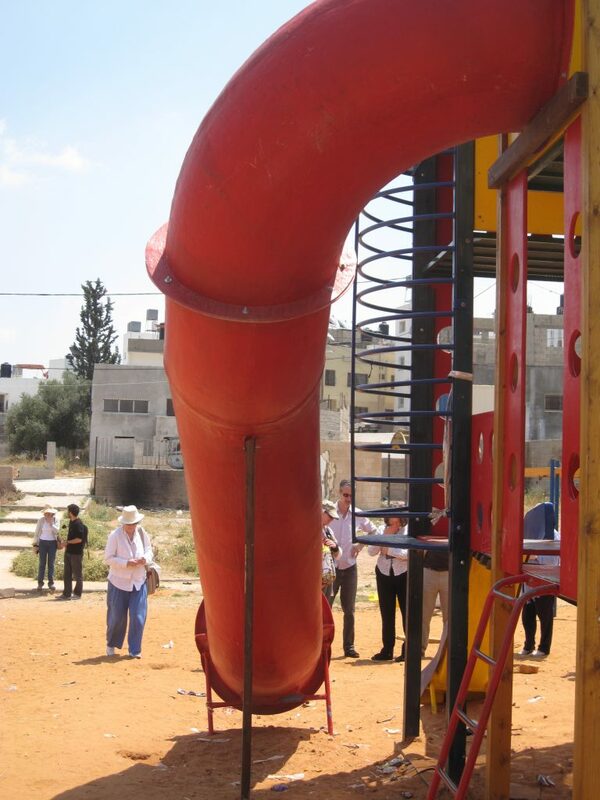 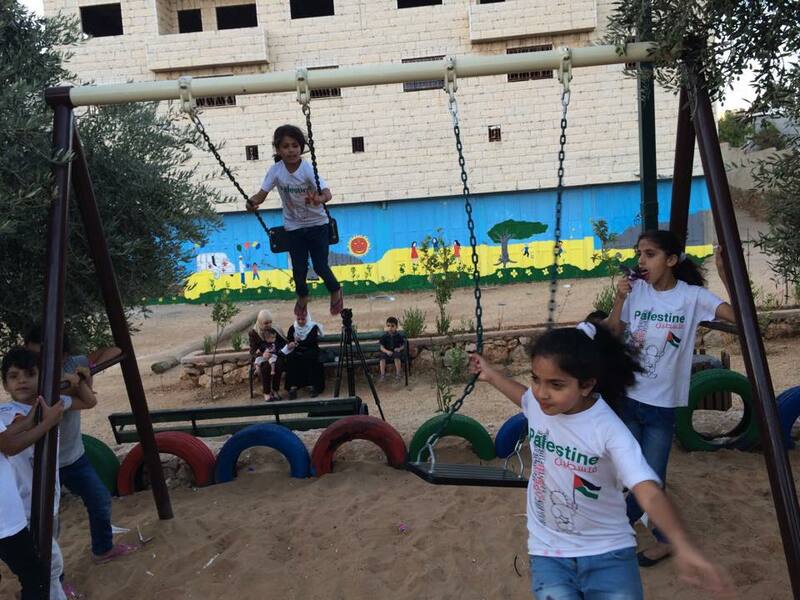 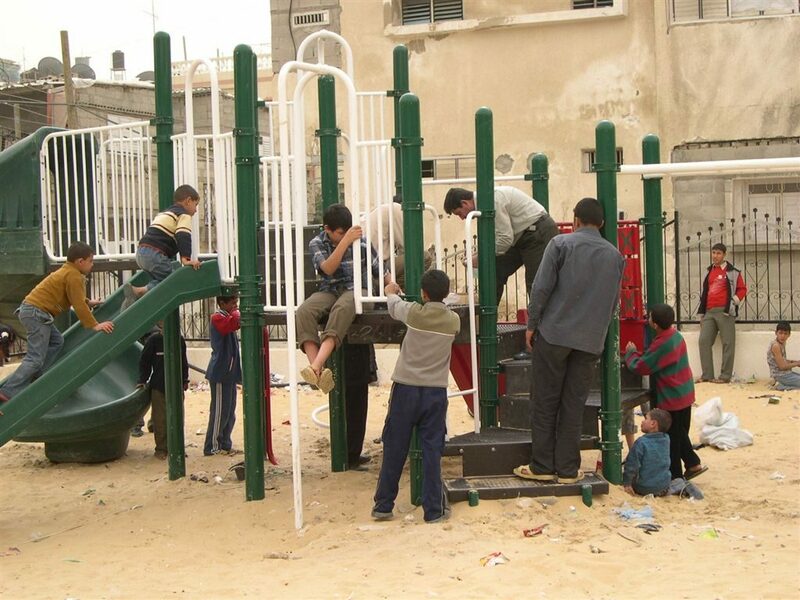 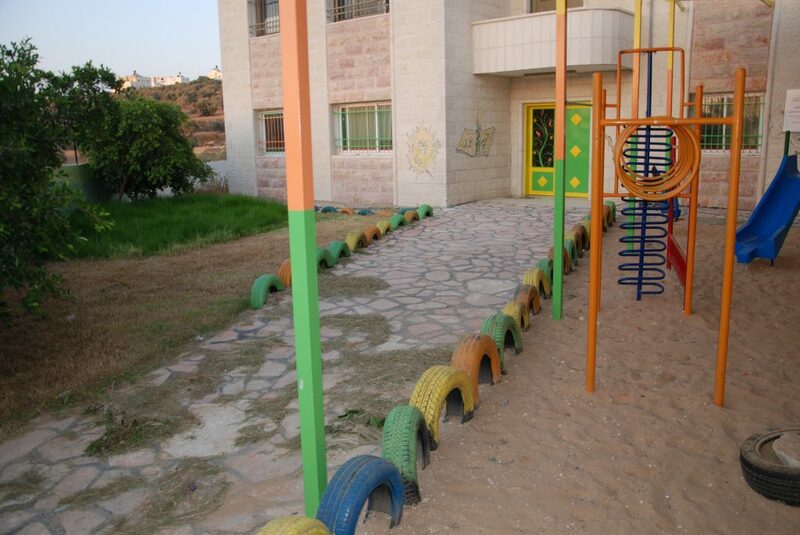 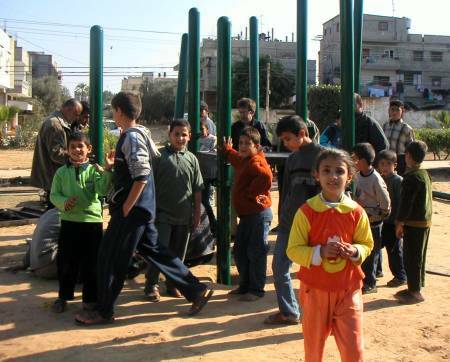 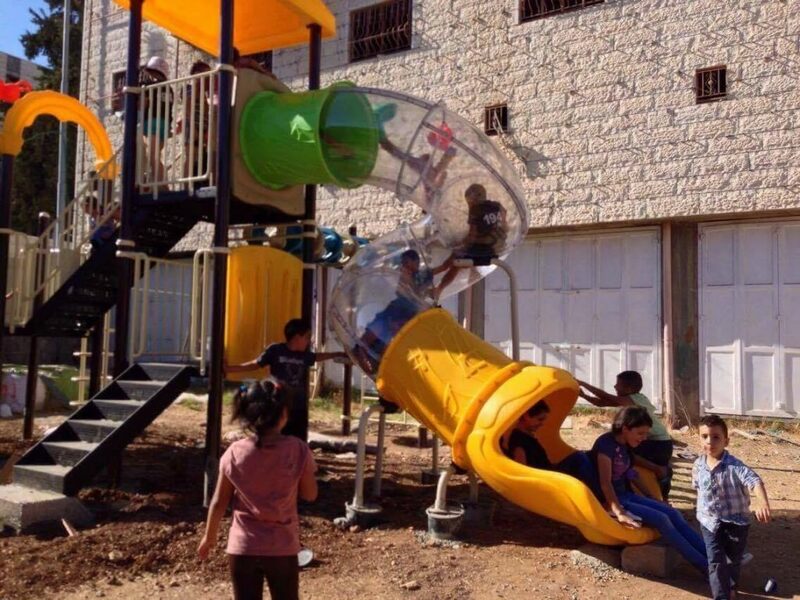 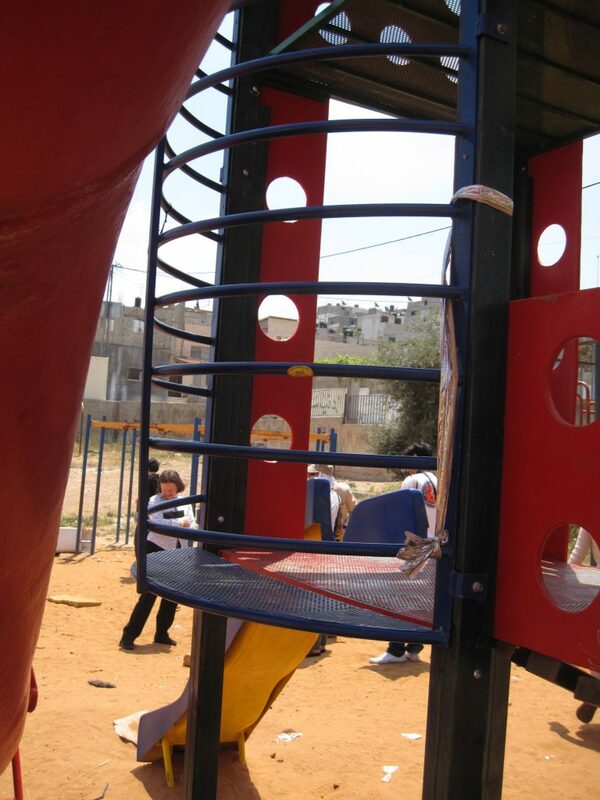 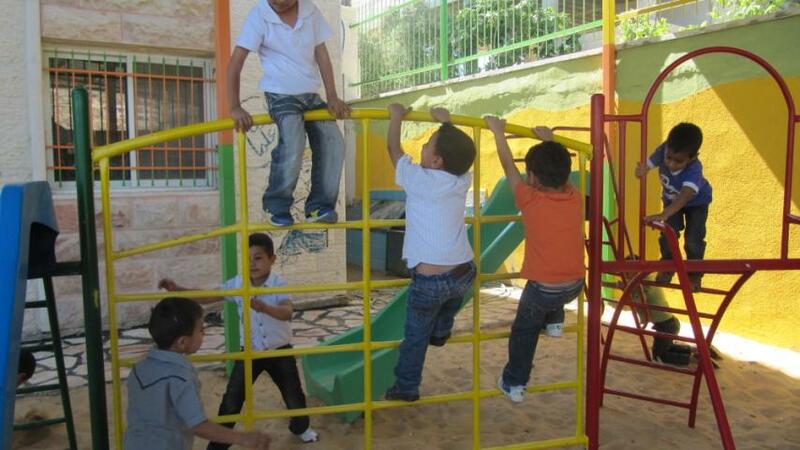 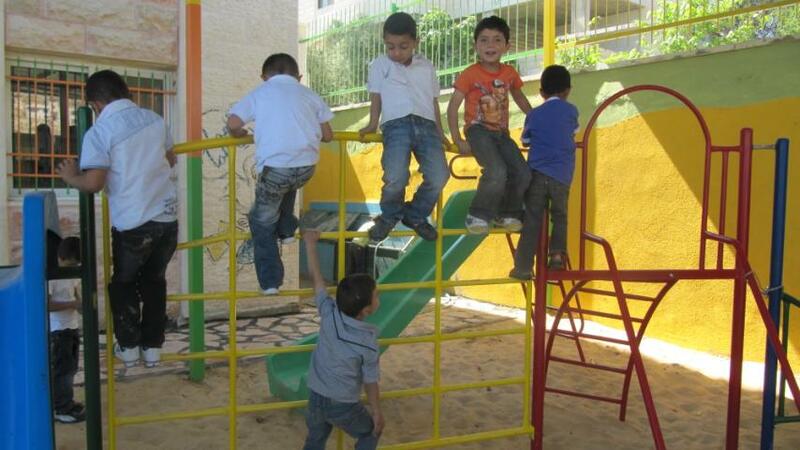 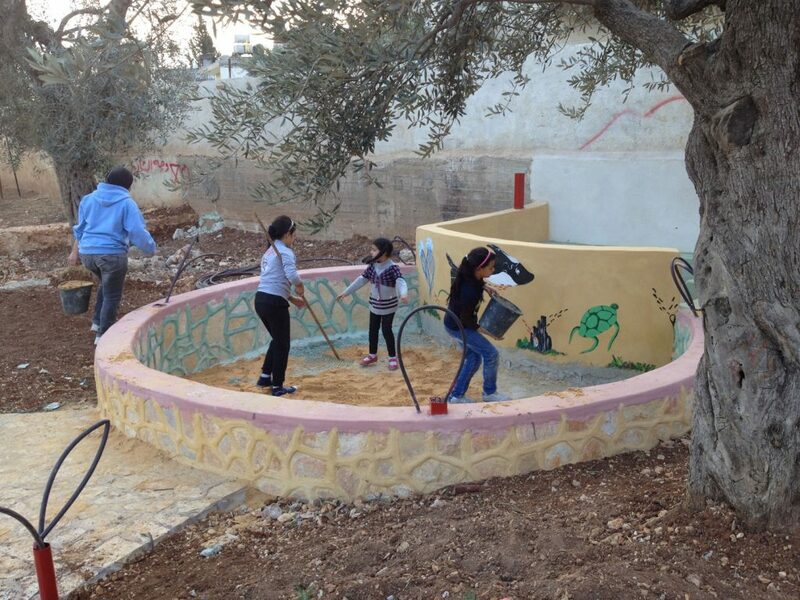 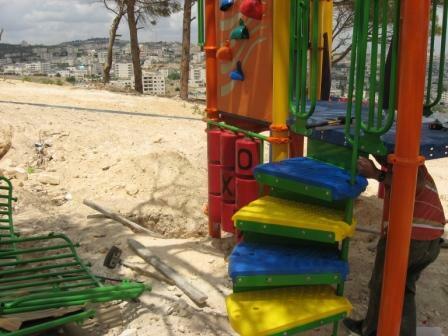 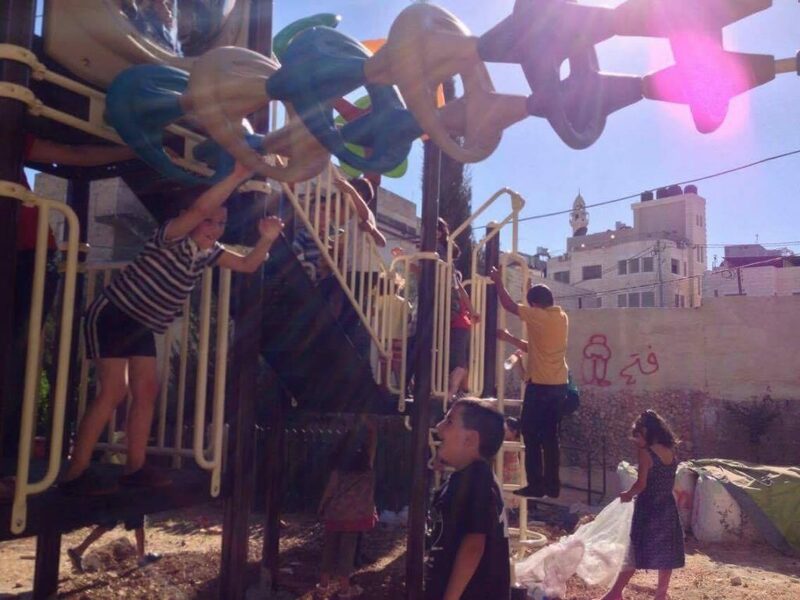 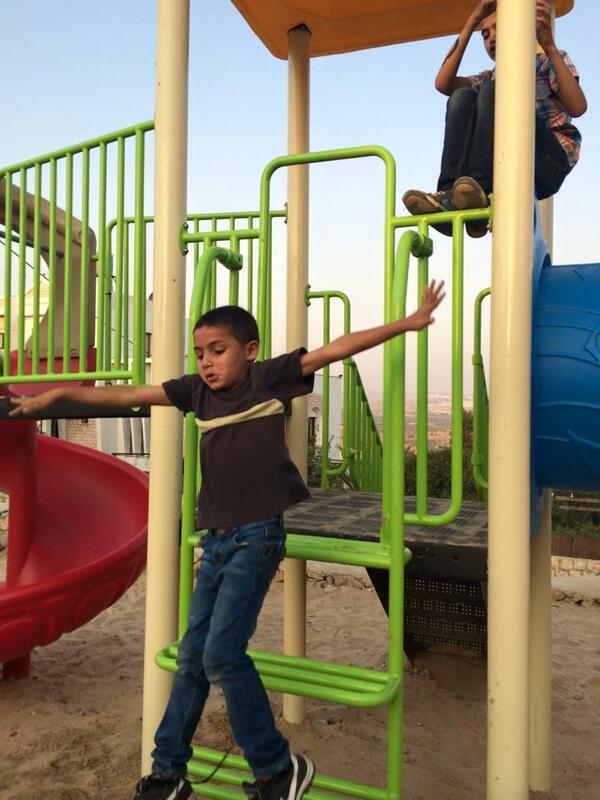 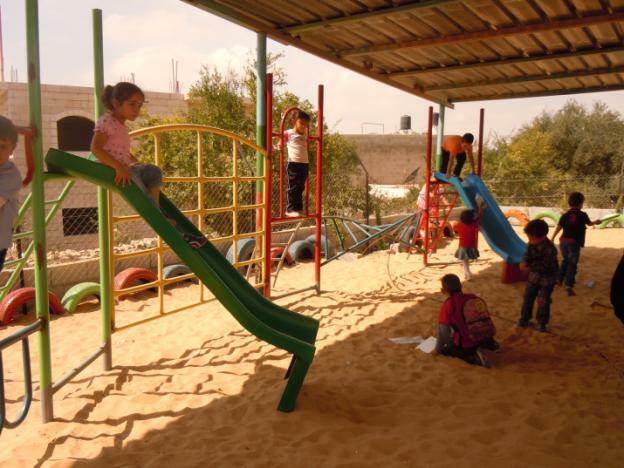 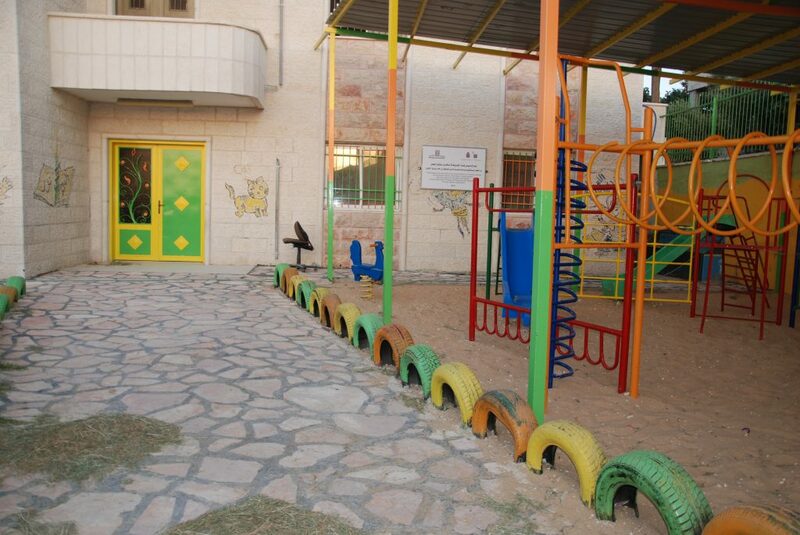 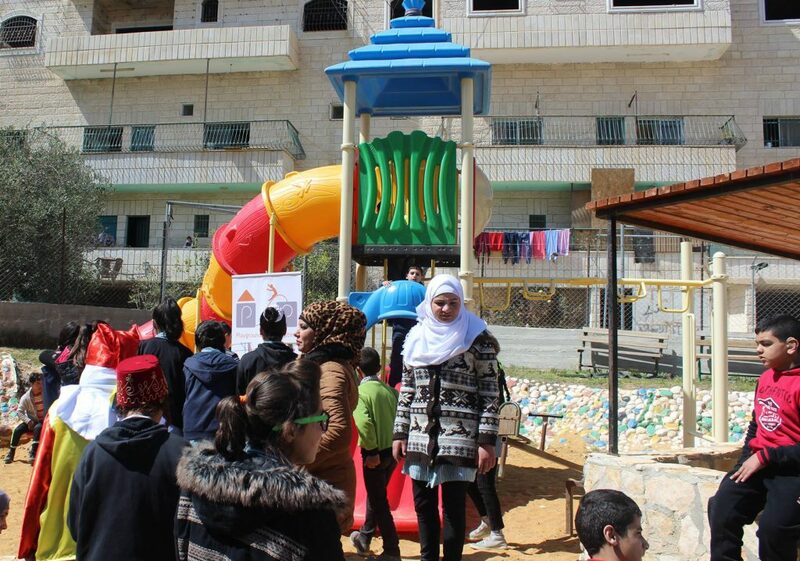 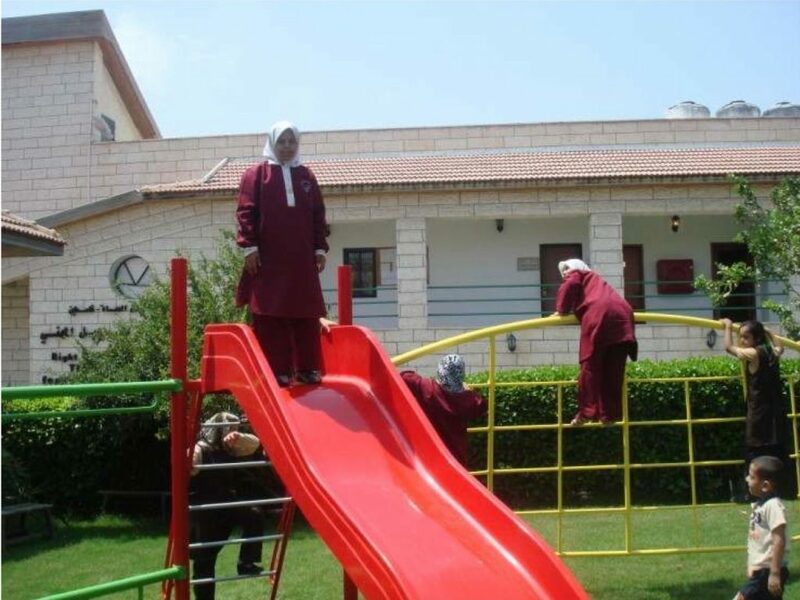 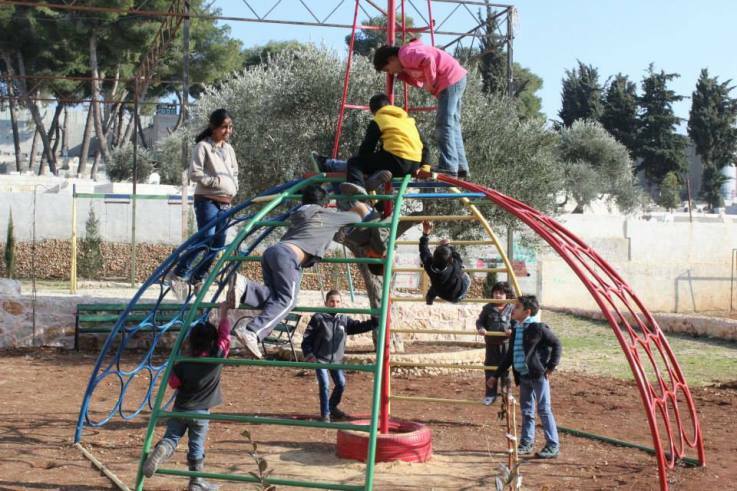 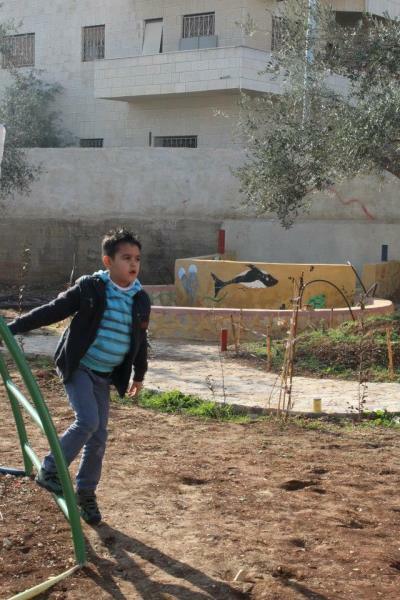 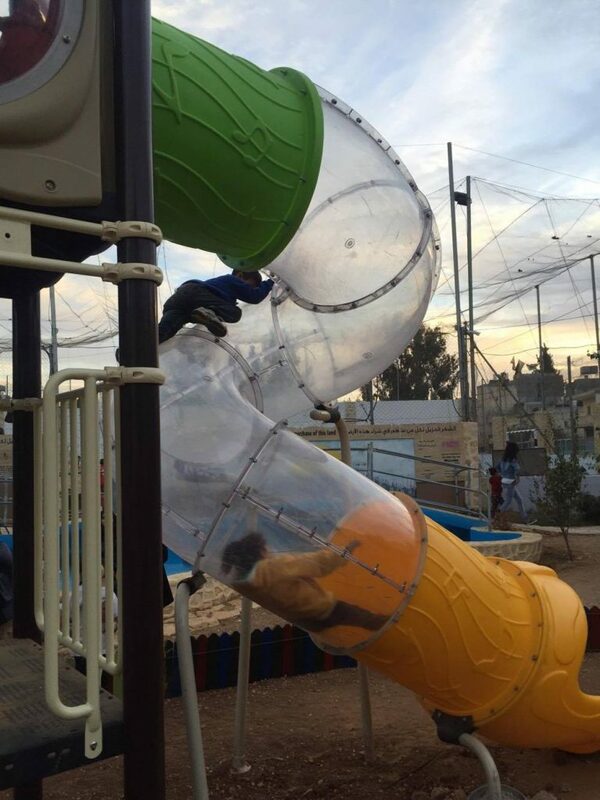 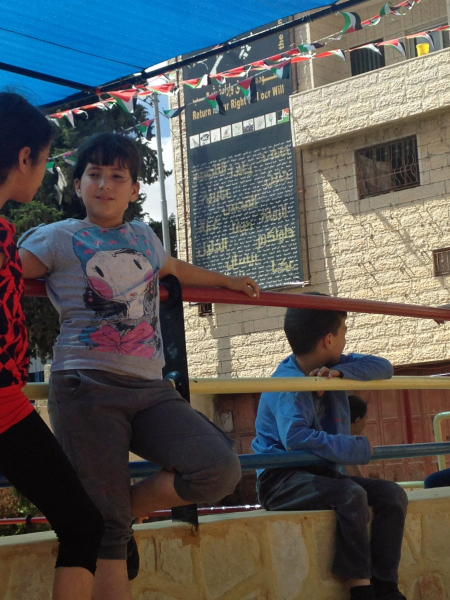 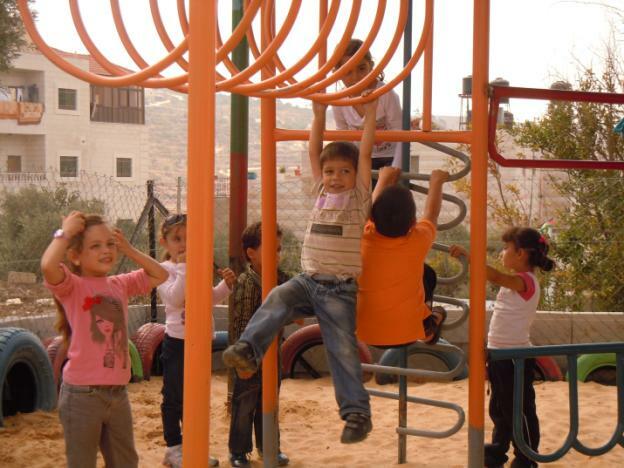 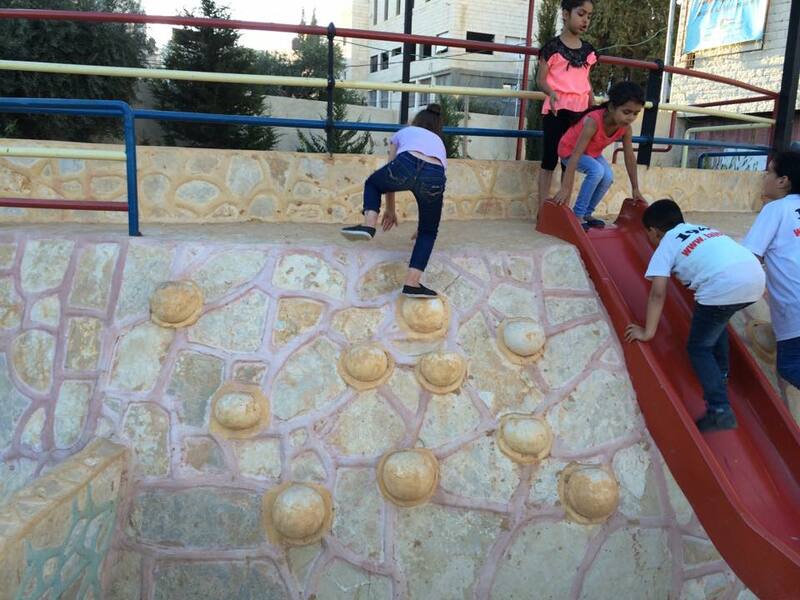 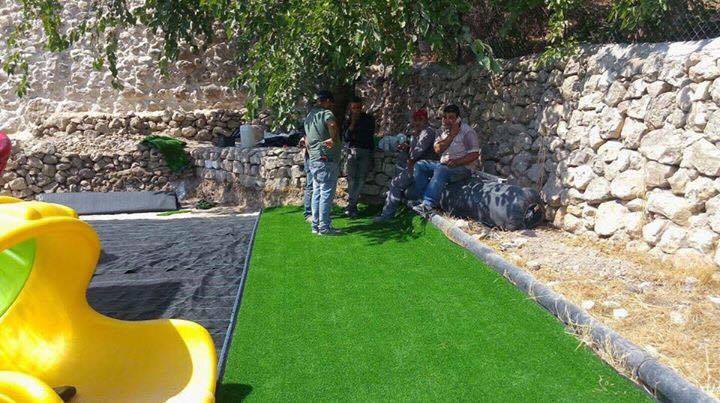 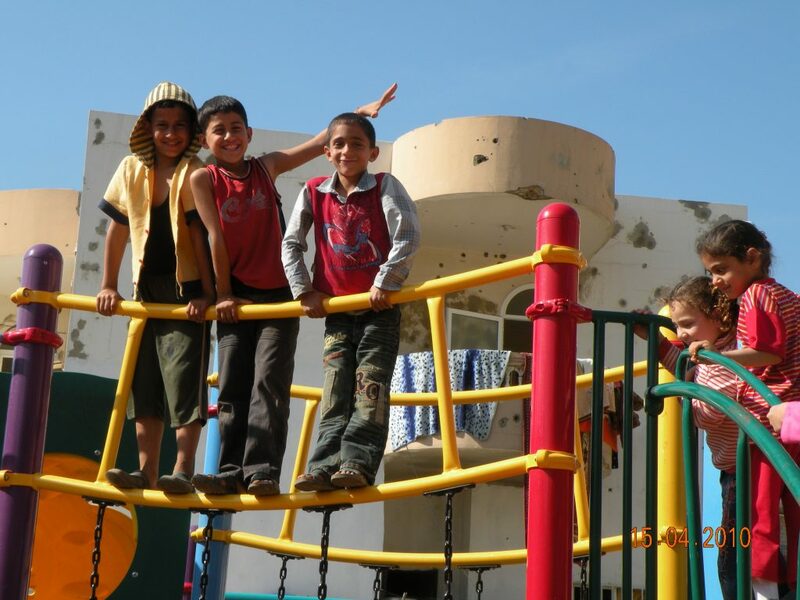 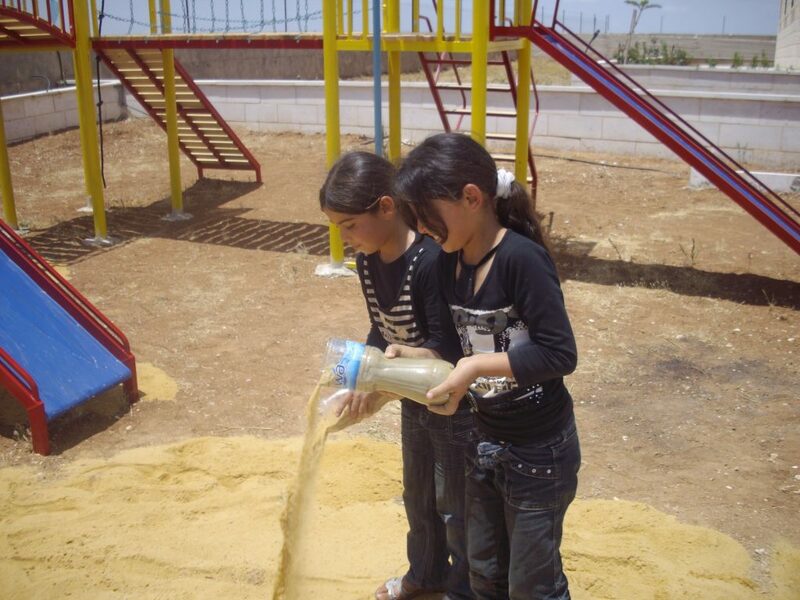 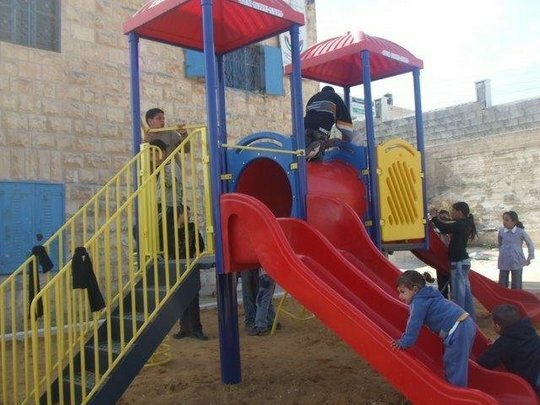 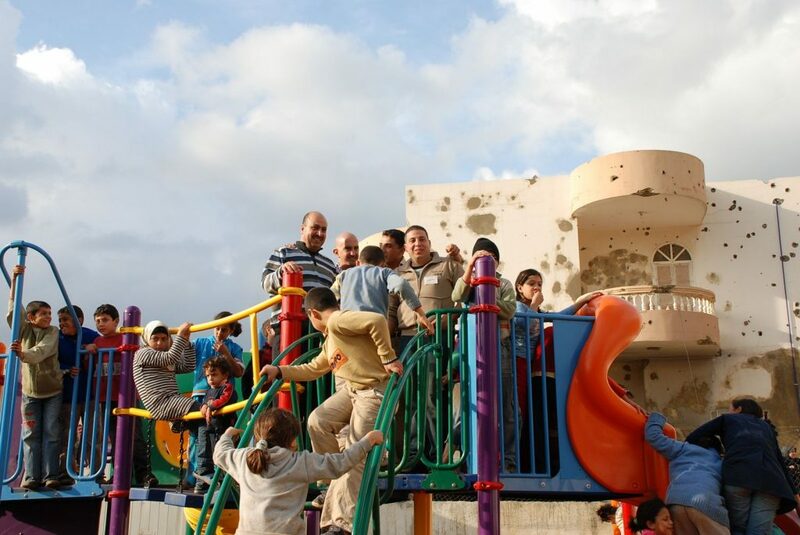 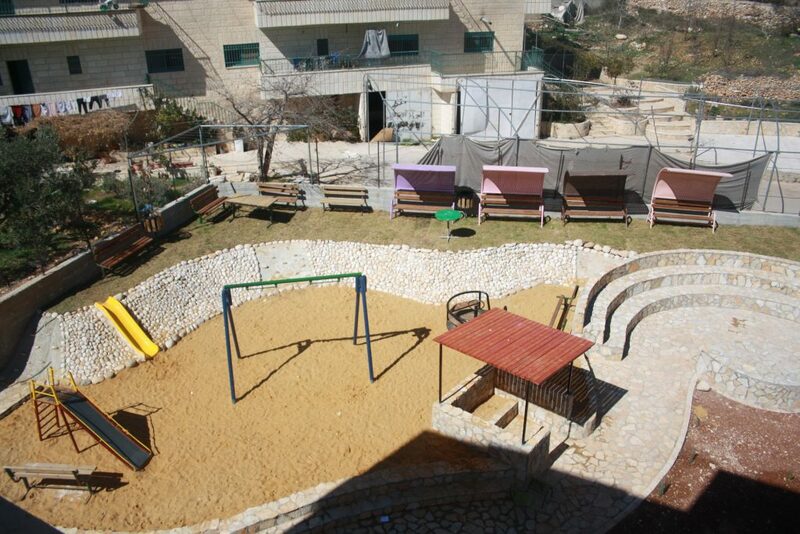 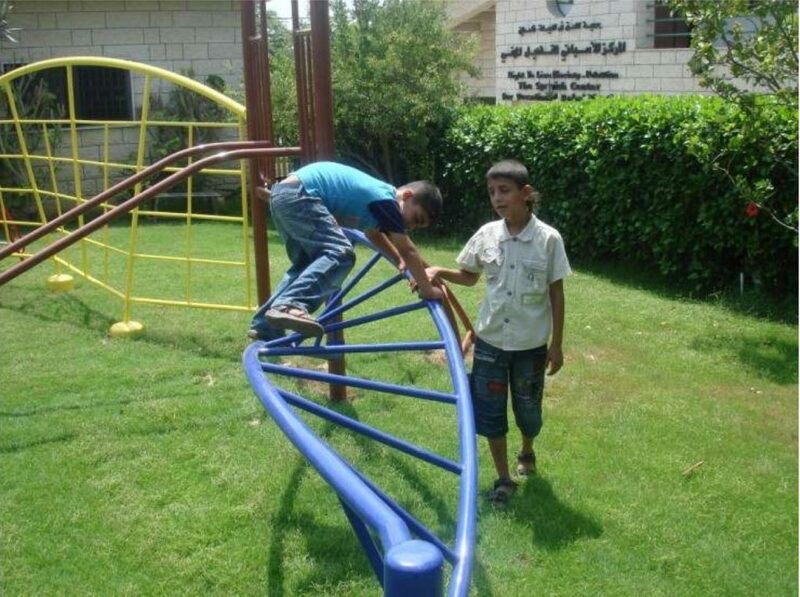 This playground is built on the property of an elementary school in one of the most threatened Palestinian cities. 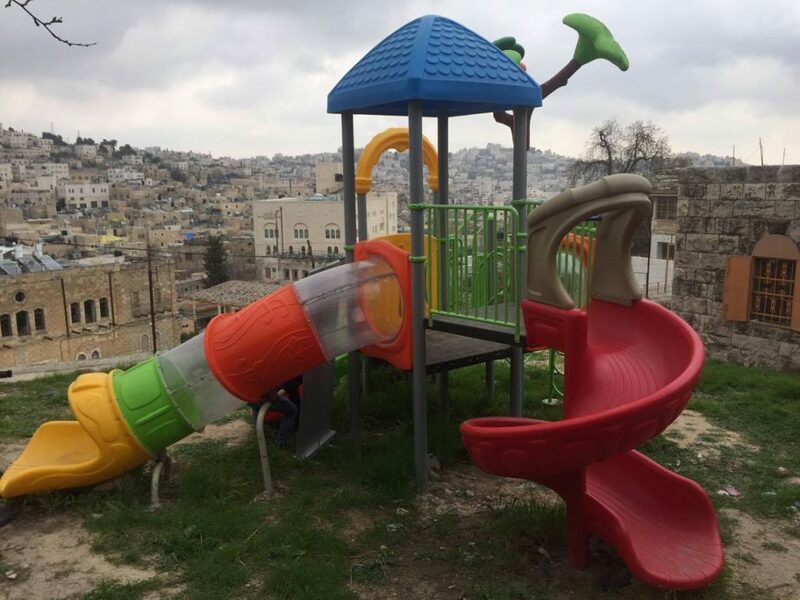 Qortuba is part of the Hebron District, where settler violence and harassment are particularly extreme. 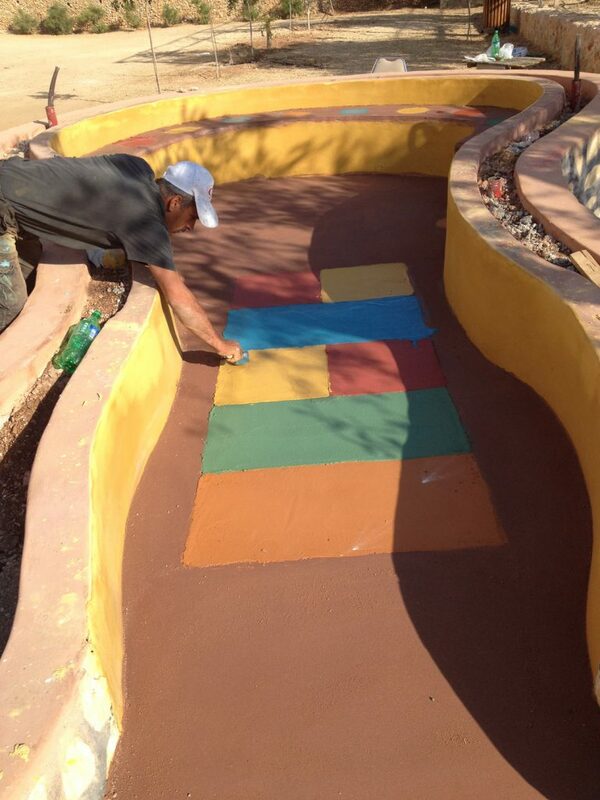 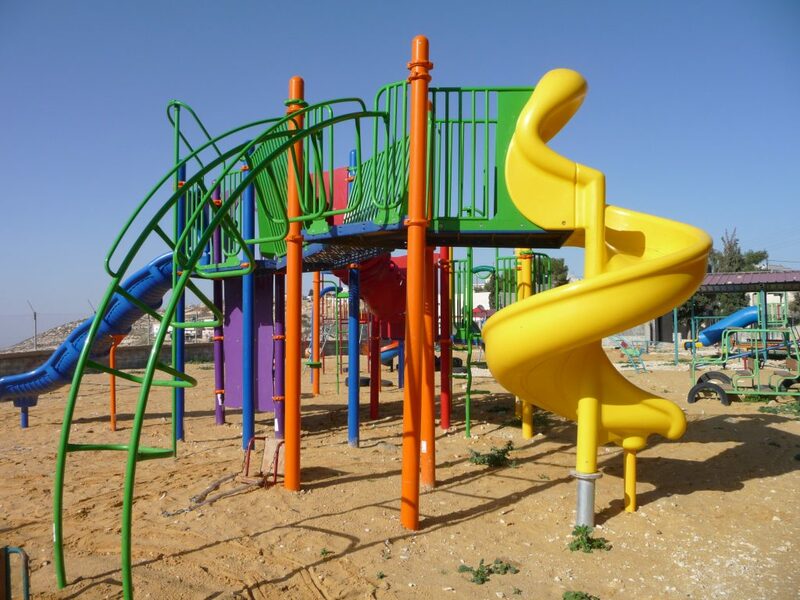 This playground is a rare point of color and play for the children it serves. 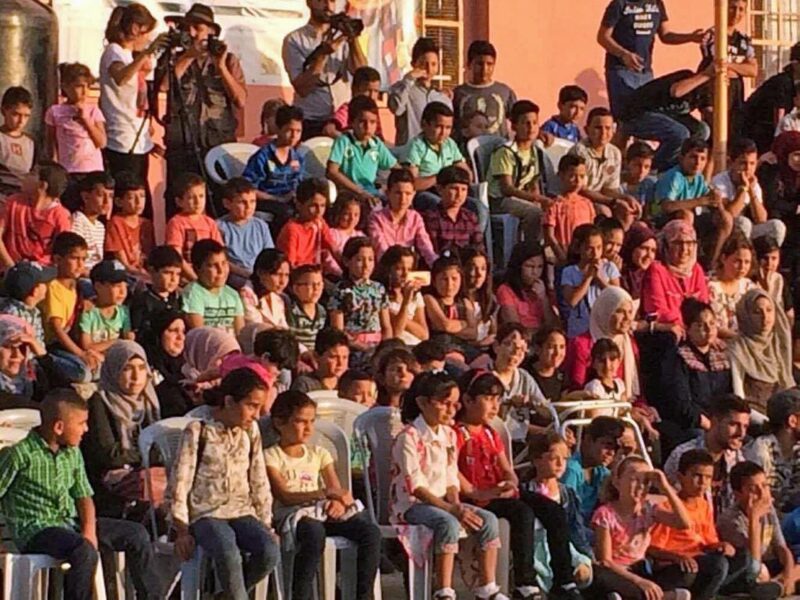 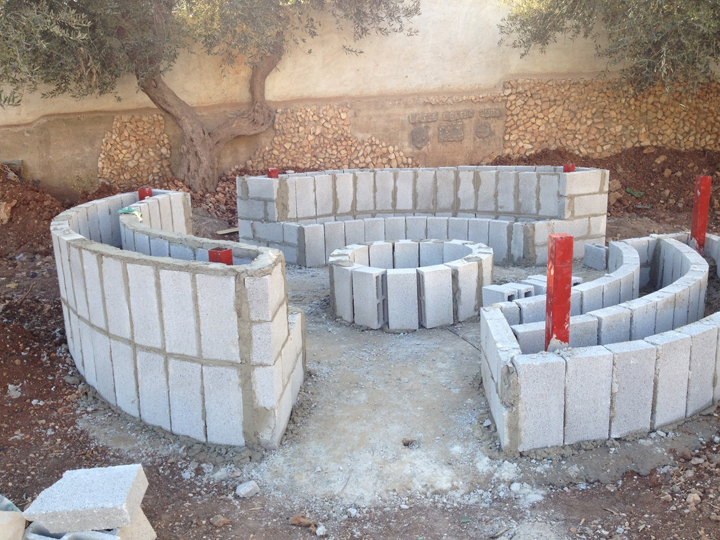 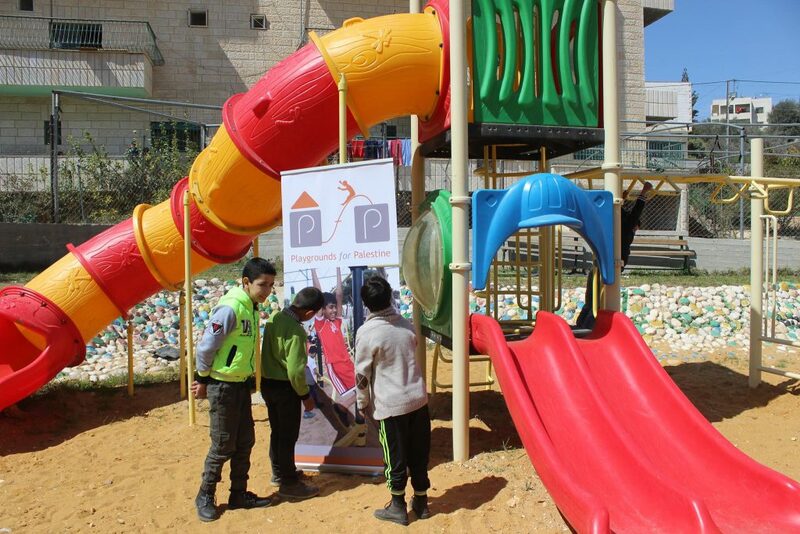 PfP partnered with Mashjar Juthour to build an amphitheater and we continue to work with this excellent organization on some of their projects. 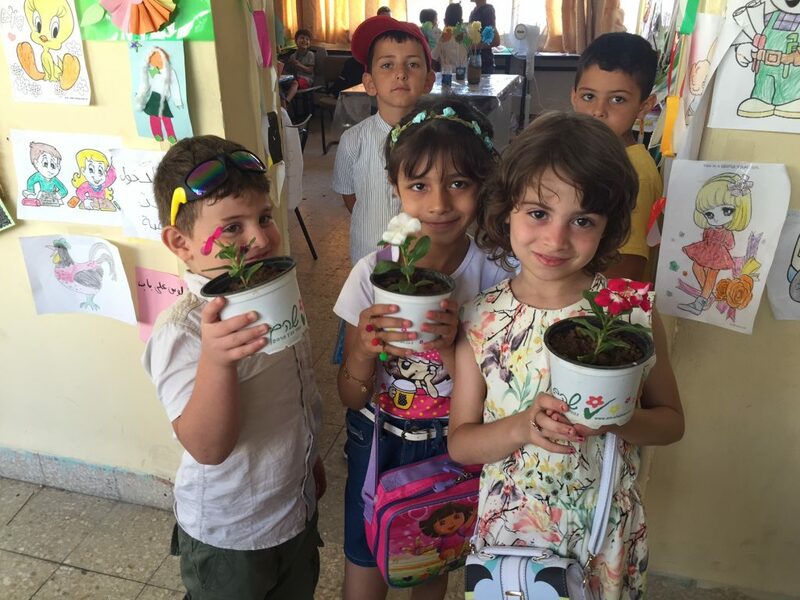 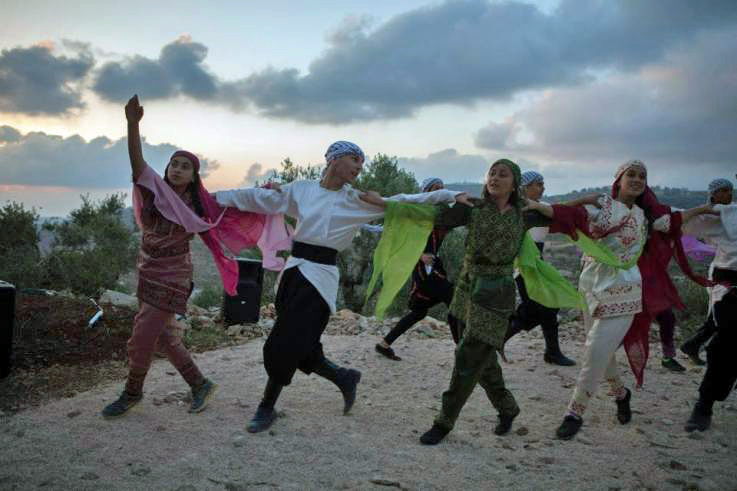 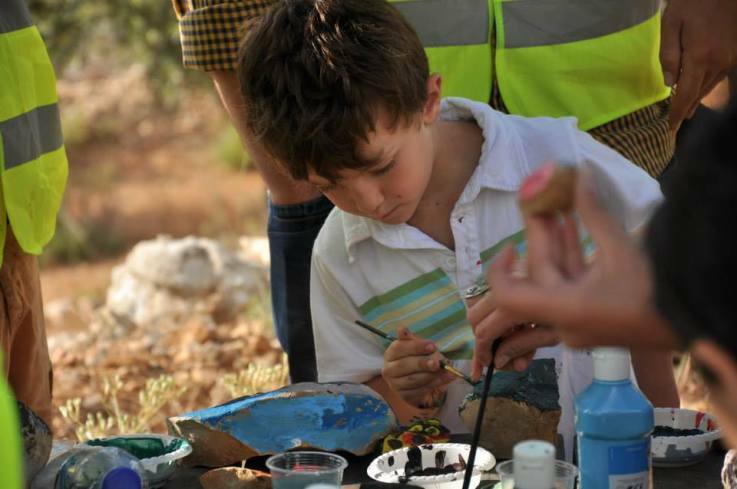 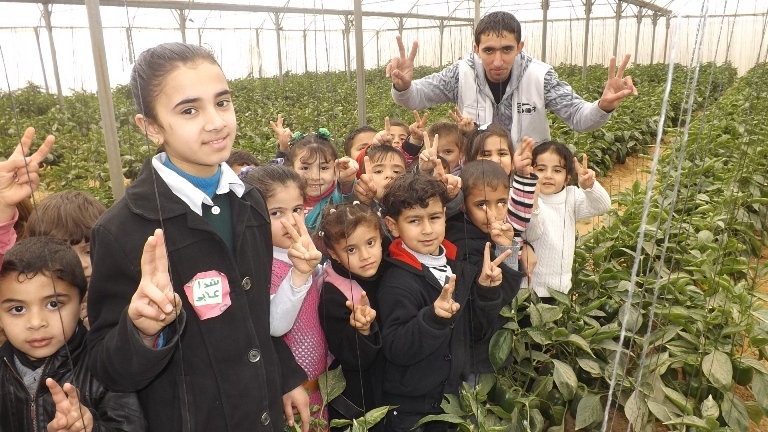 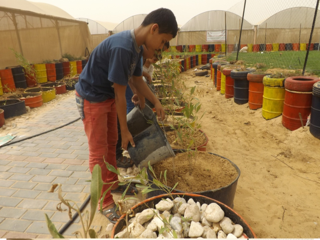 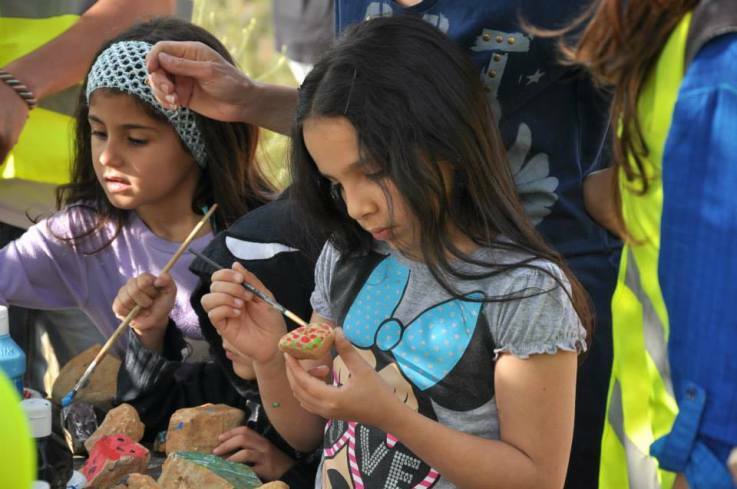 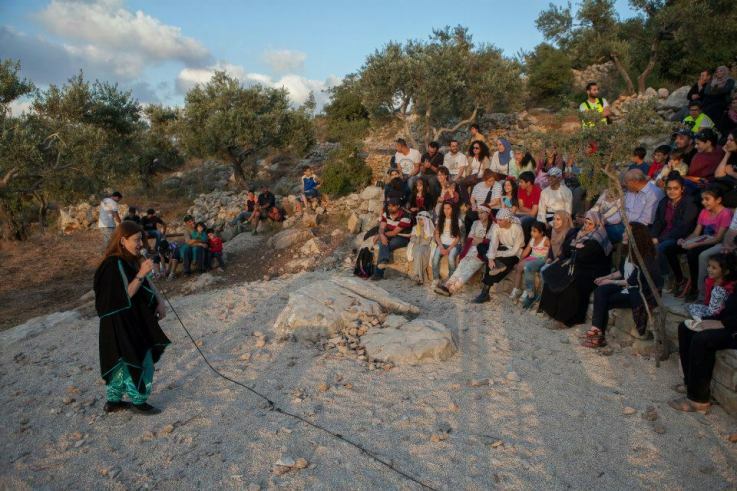 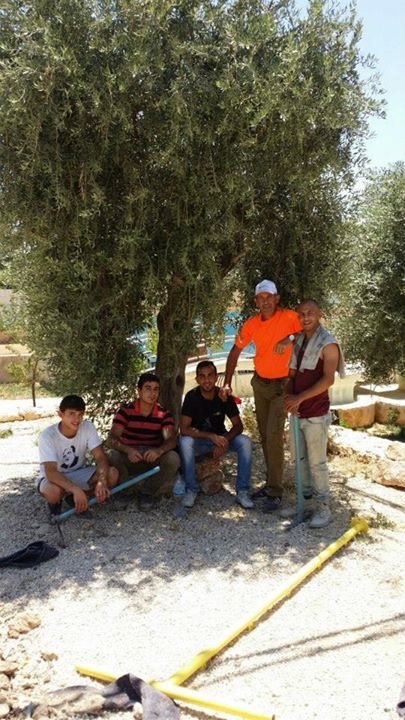 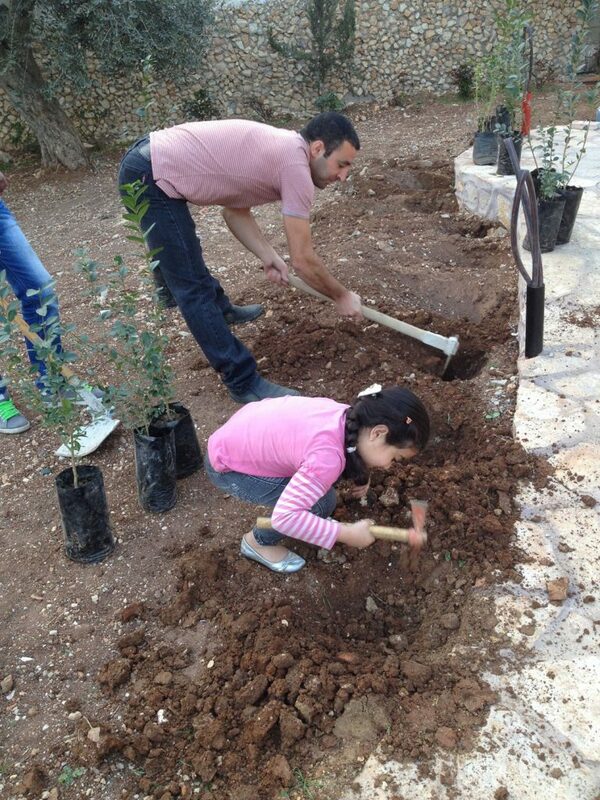 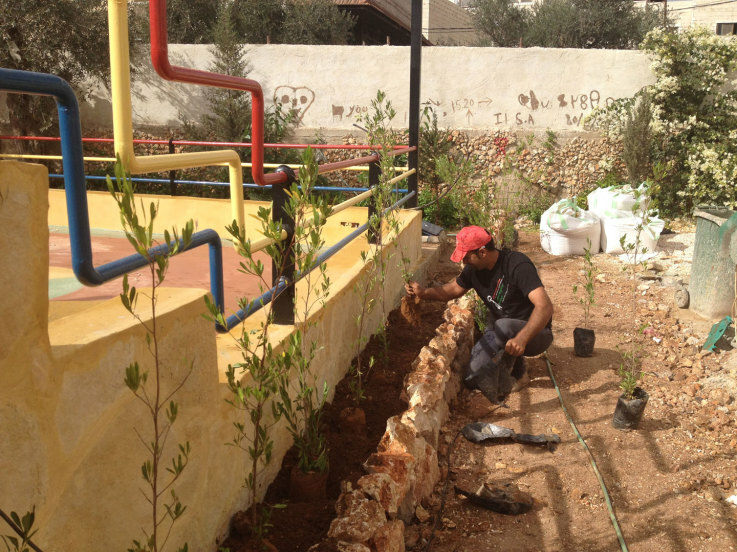 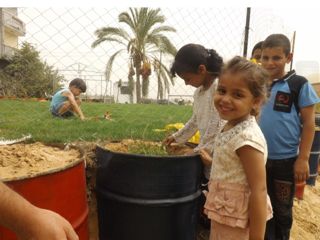 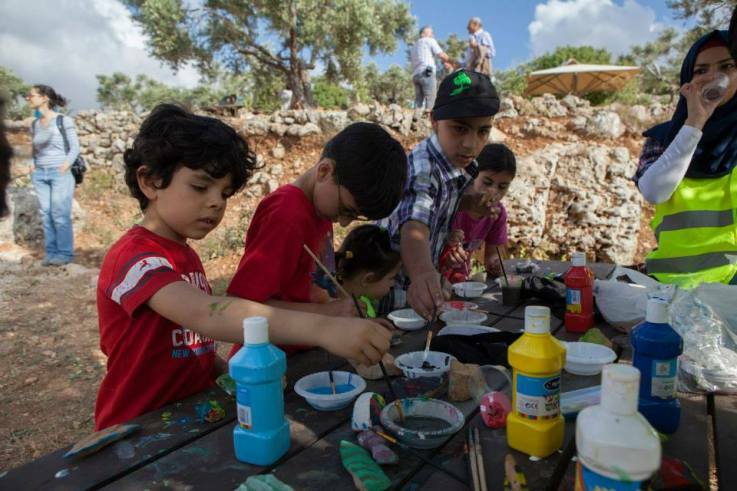 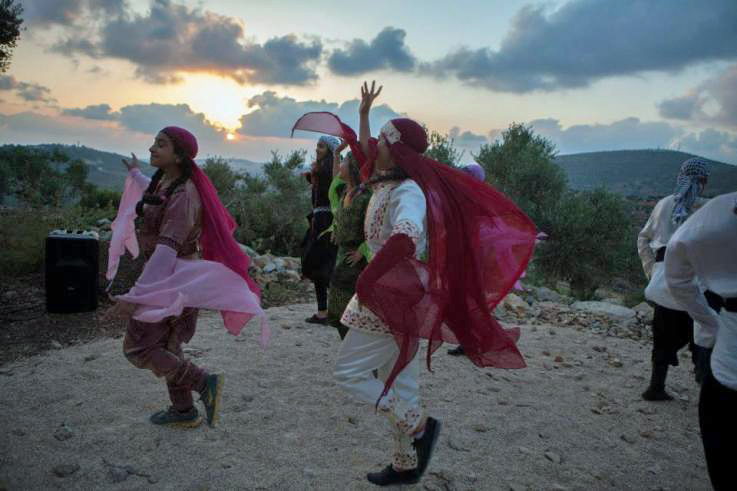 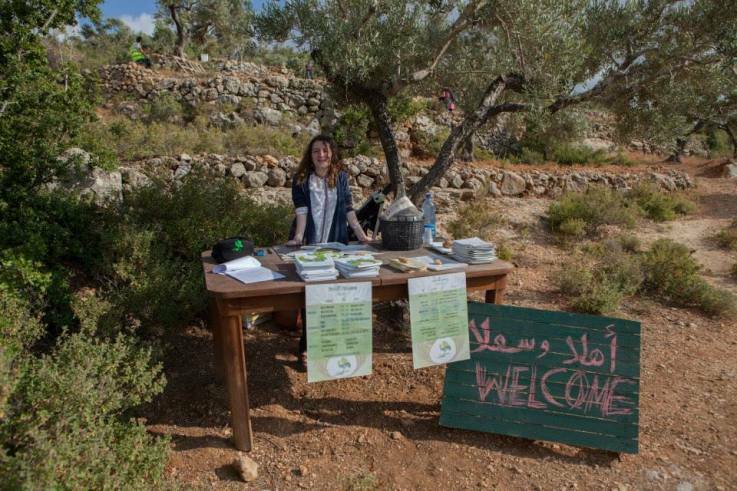 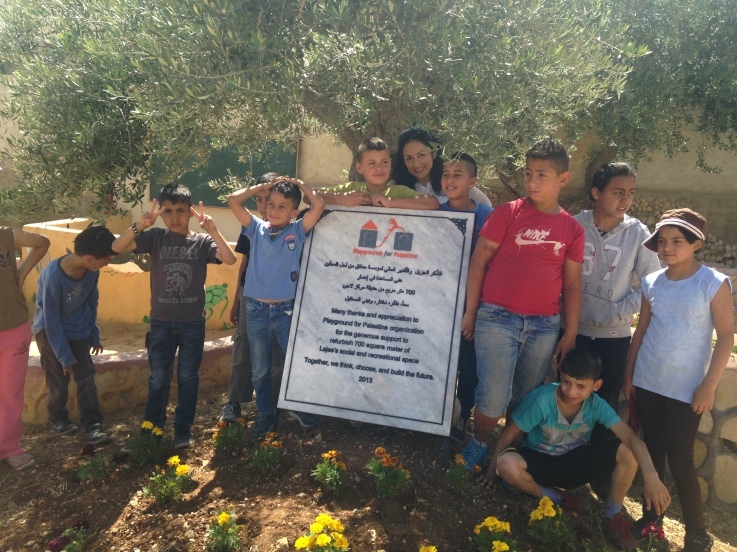 Mashjar Juthor is a “natural reserve that provides much needed space for cultivating the trees of Palestine while also reminding local communities of their very basic and necessary relationship to nature”. 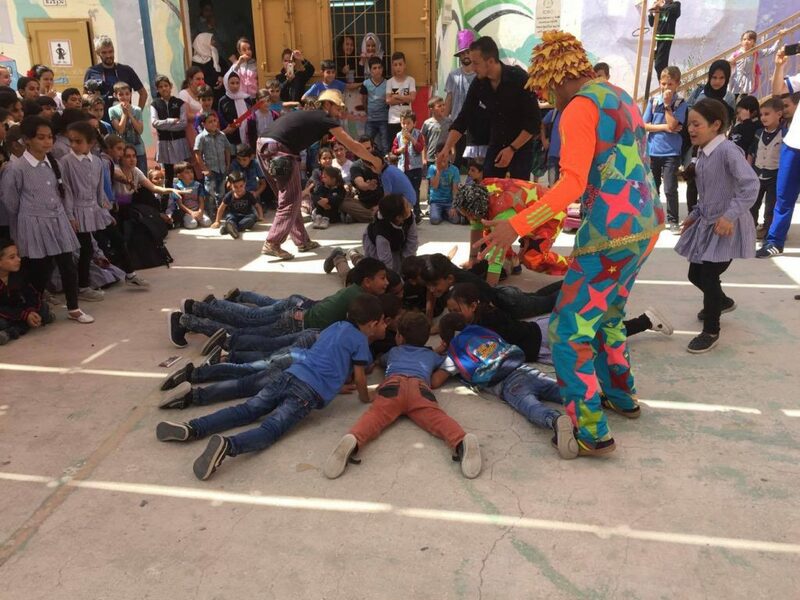 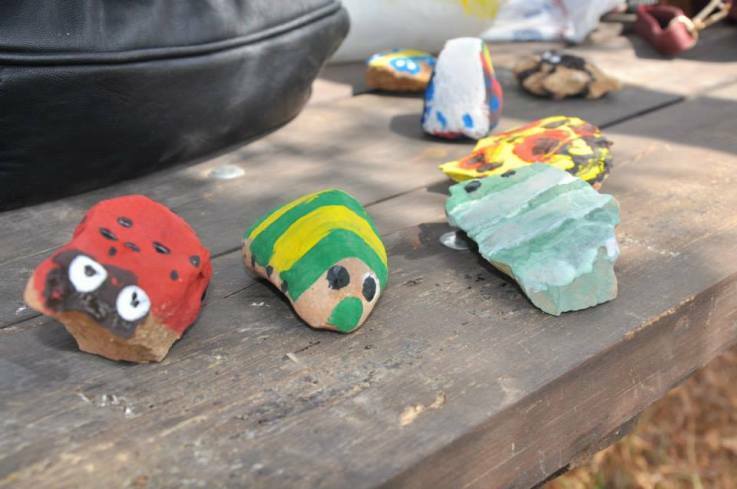 We sponsored some of their programs that strives to connect communities and youth with the importance of cultural roots and preserving the land through fun activities such as storytelling, arts and environmental education. 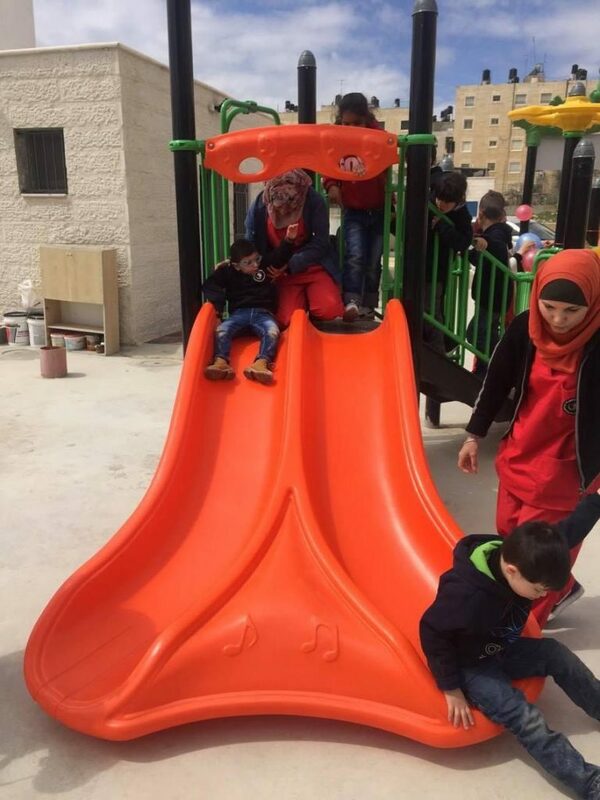 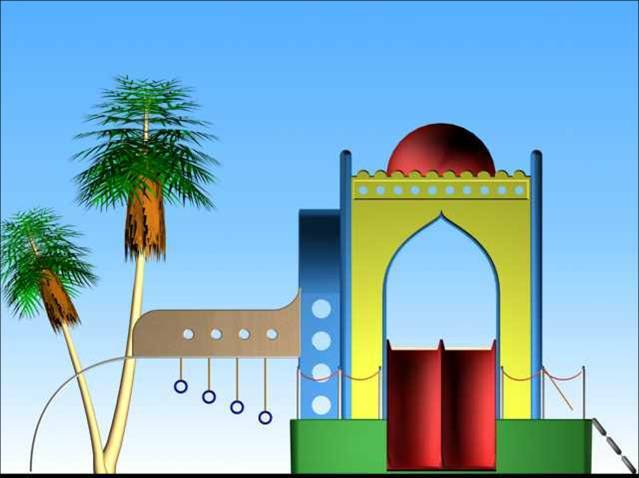 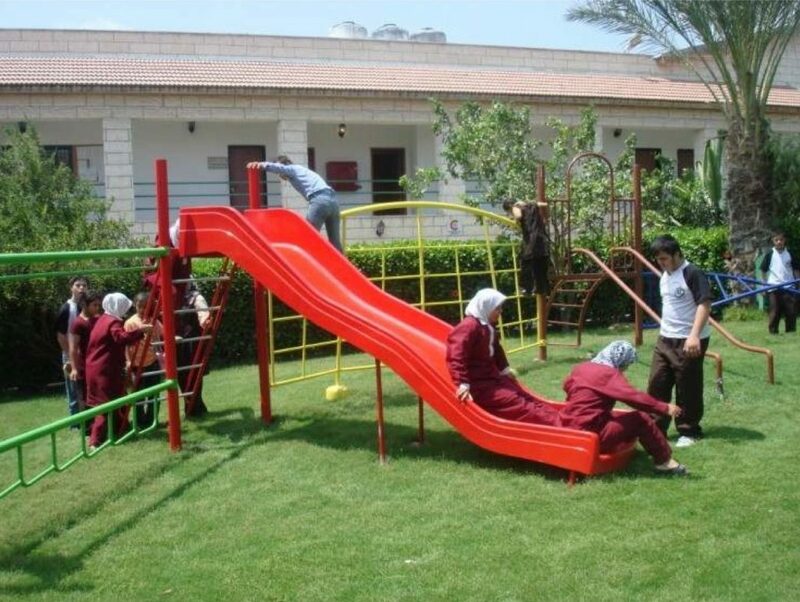 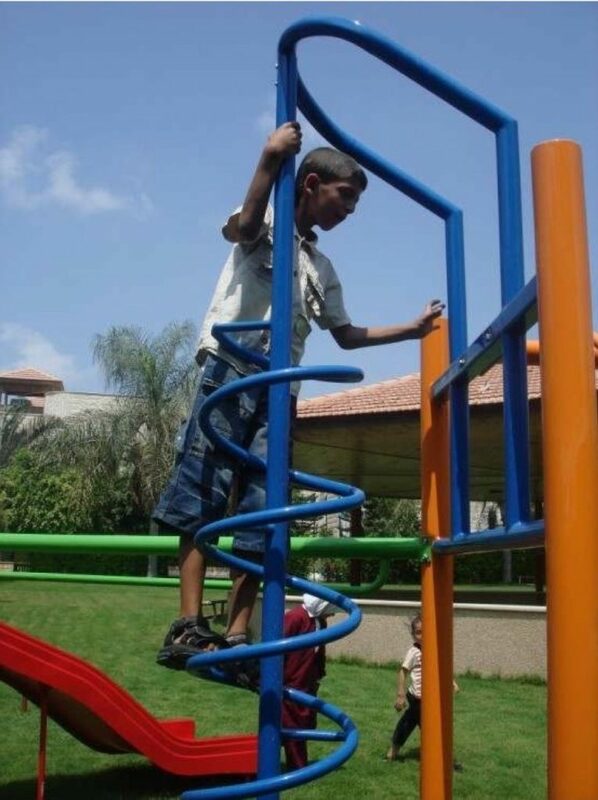 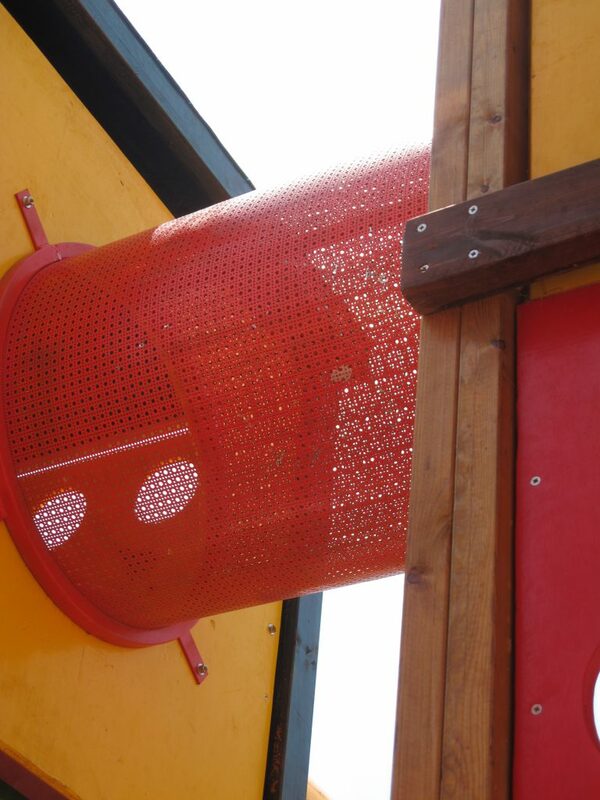 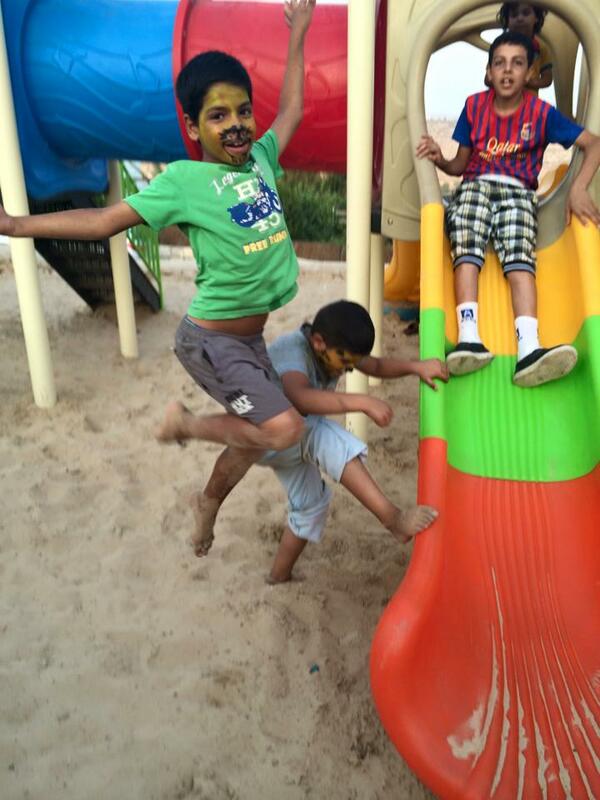 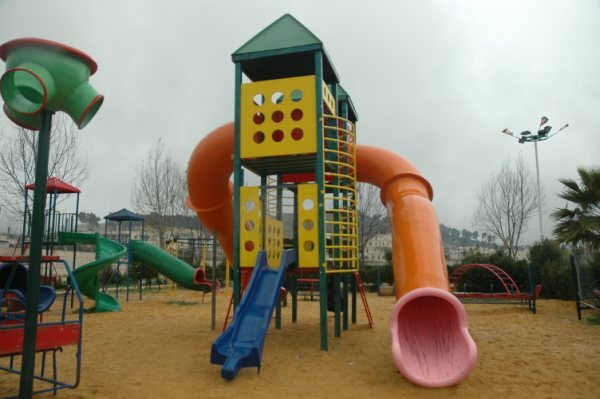 This playground was funded in part by the Kuran Family in New Jersey. 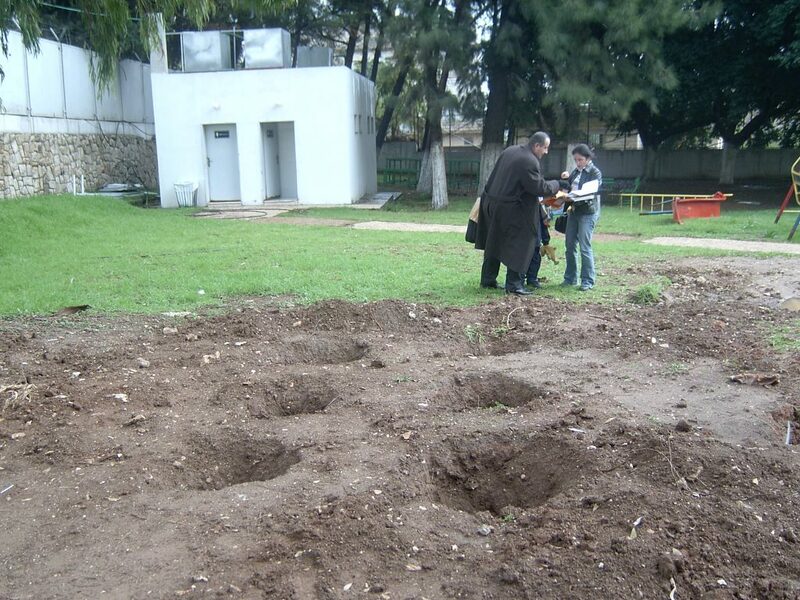 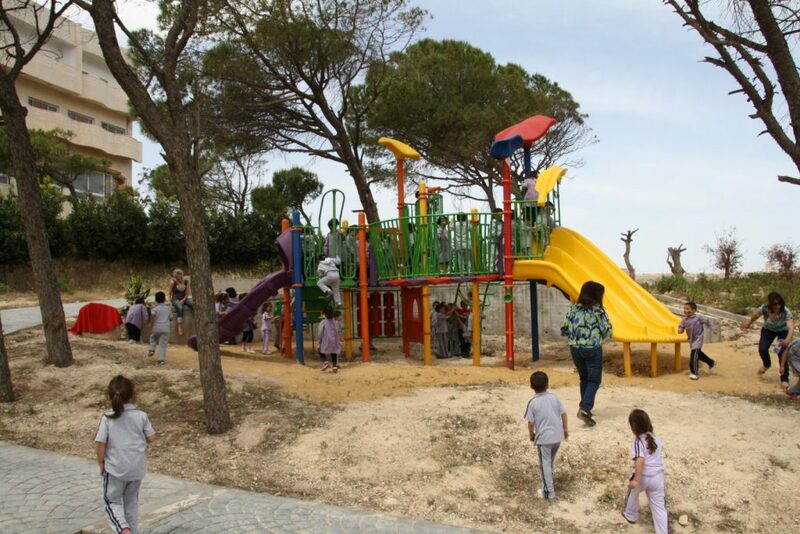 It is located on the grounds of the local municipality and serves several thousand children. 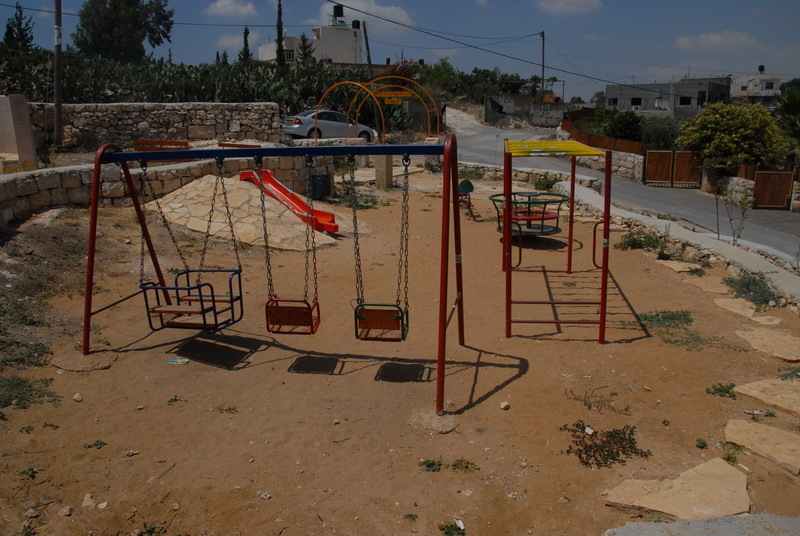 Qibya has particular significance in Palestinian history, as this village is the site of massacre of 70 civilians in which an Israeli military unit under the command of Ariel Sharon locked residents in their homes before blowing up their houses on October 14, 1953. 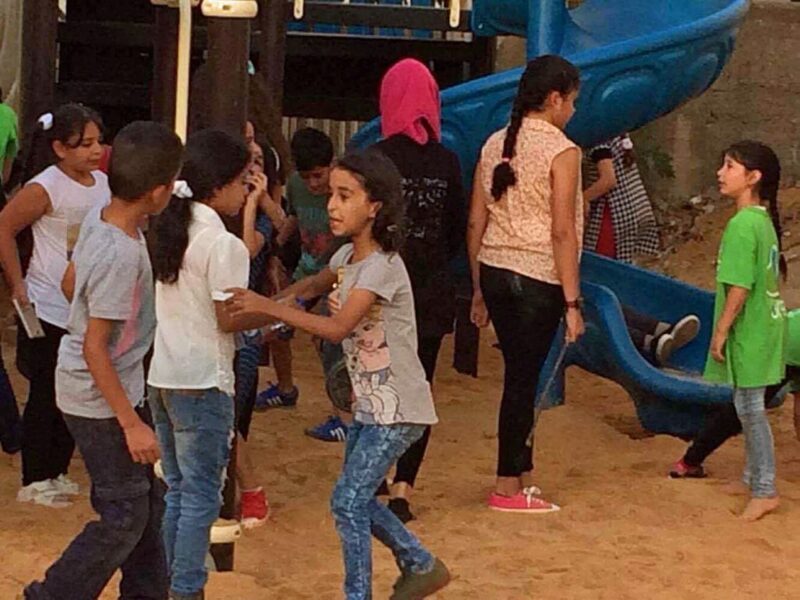 It was a horrific act that shocked the world to the point that the UN Security Council immediately passed Resolution 101, specifically condemning the attack on Qibya. 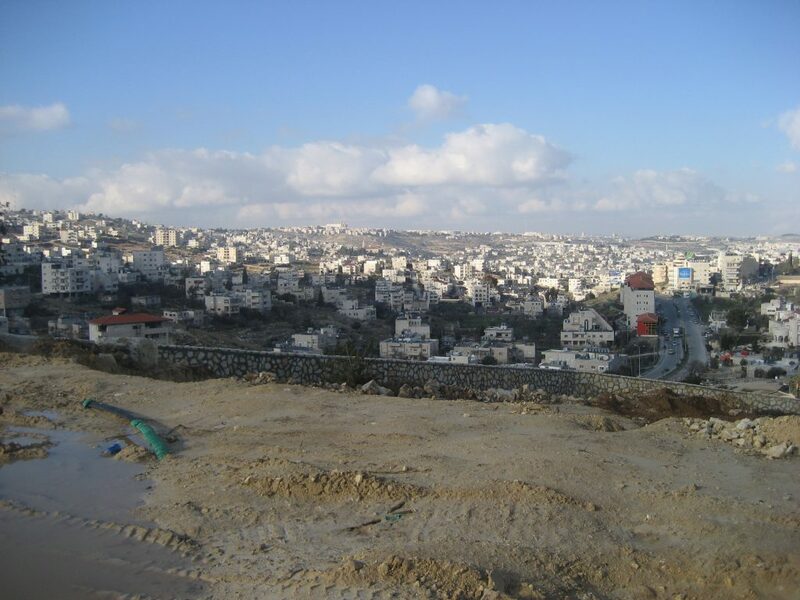 Silwad, located north of Ramallah, is home to approximately 8,000 Palestinians. 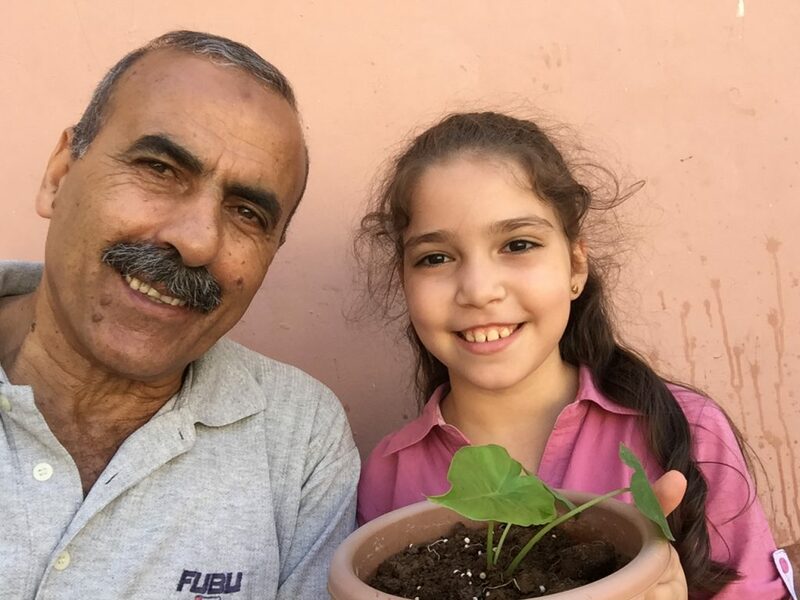 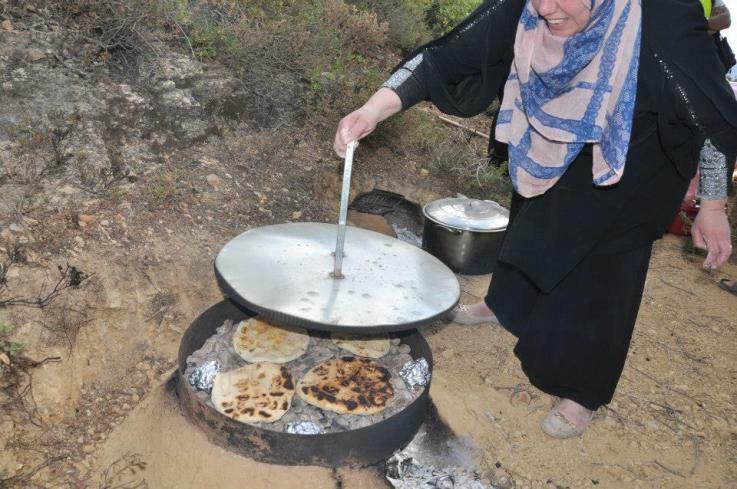 Most of its population relies on farming and agriculture to support their families and its climate makes it suitable for growing its famous olive and fig trees. 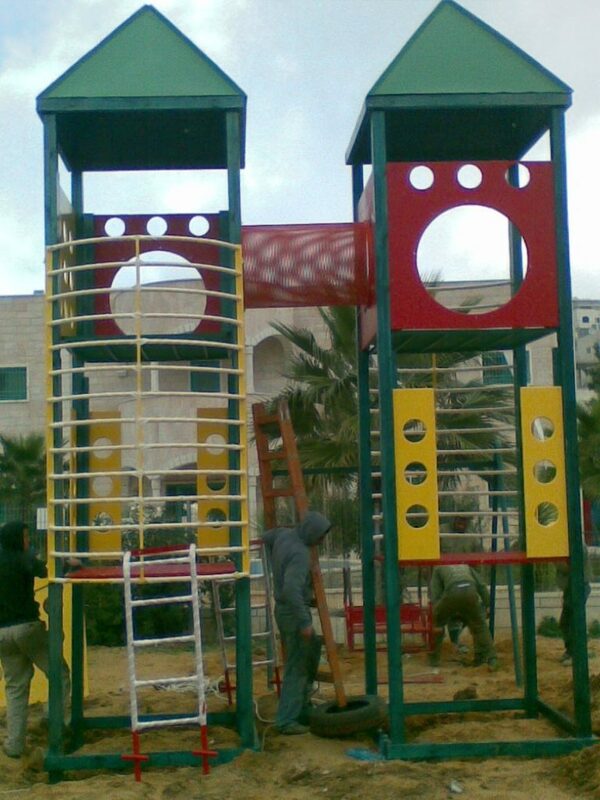 Playgrounds for Palestine installed this playground in collaboration with Maysoon’s Kids, a children’s center in Silwad. 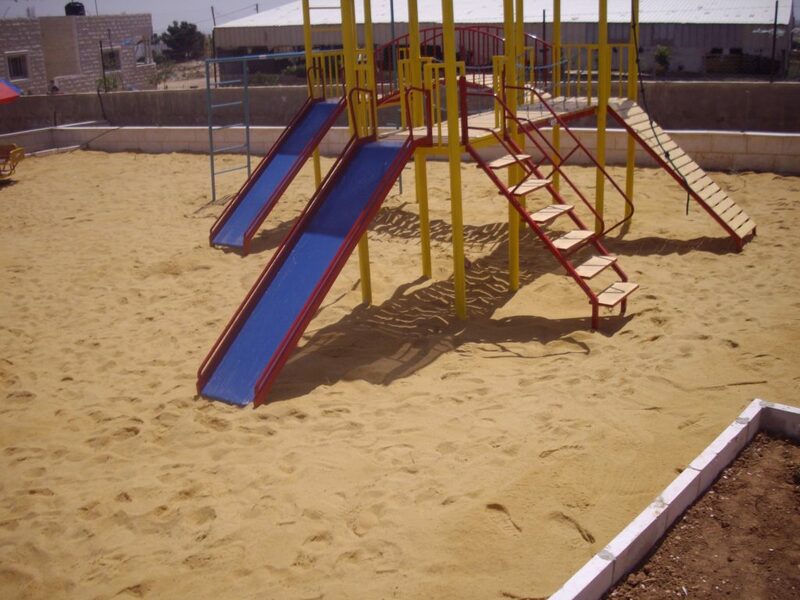 This particular playground is accessible to physically challenged children to ensure that all kids have the right to play. 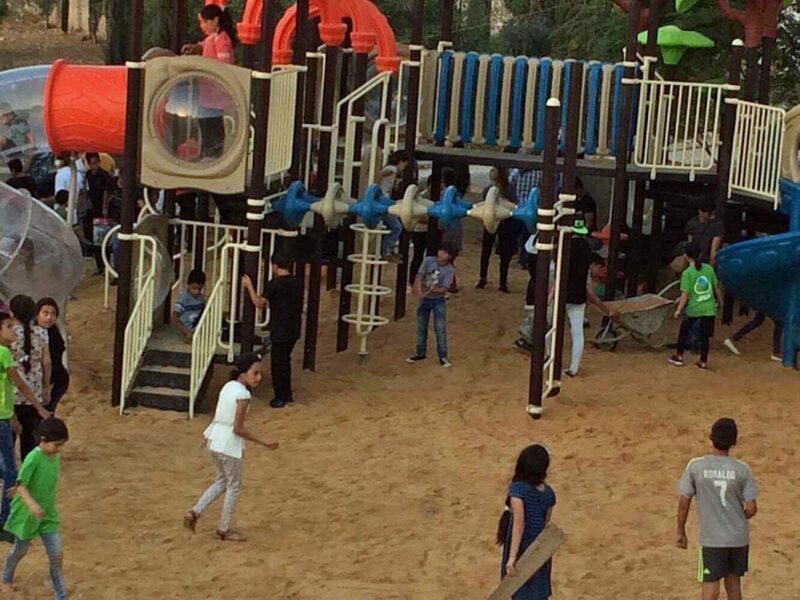 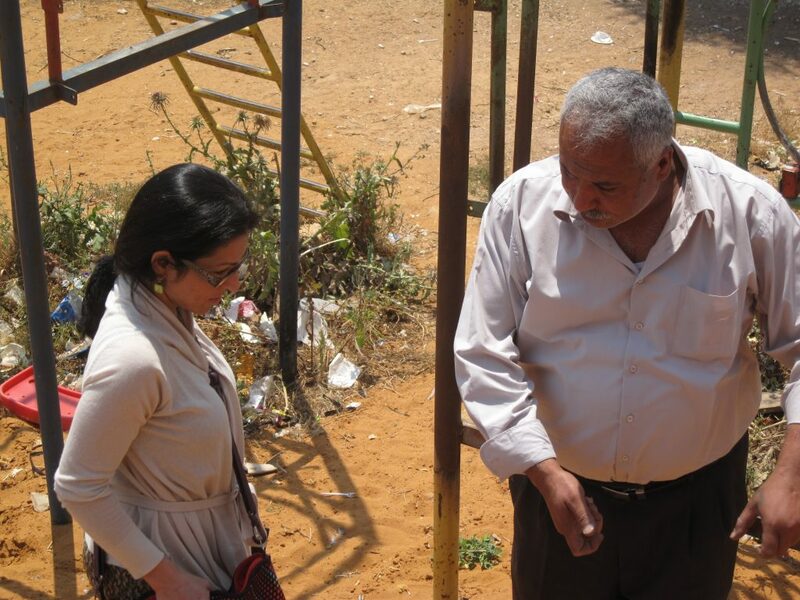 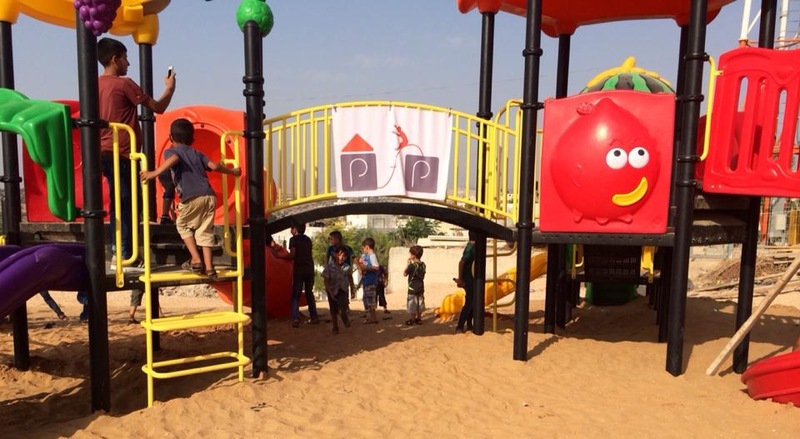 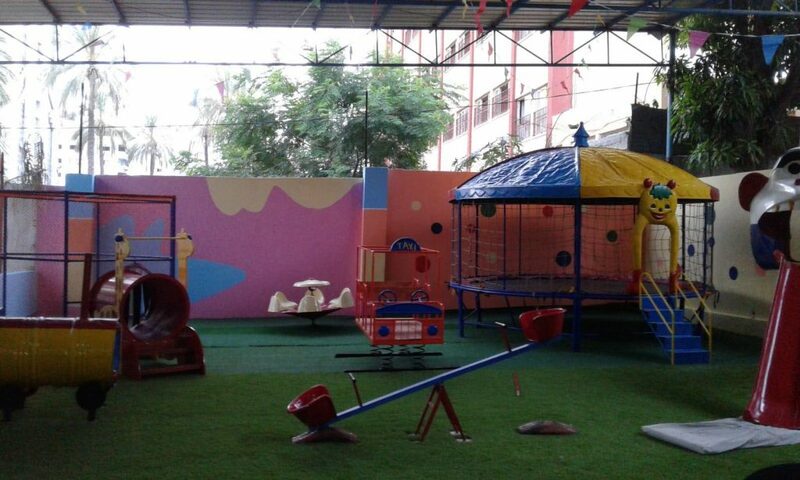 Maysoon’s Kids was able to find an exceptional local builder to put together this playground for differently-abled children so all children would have the right to play. 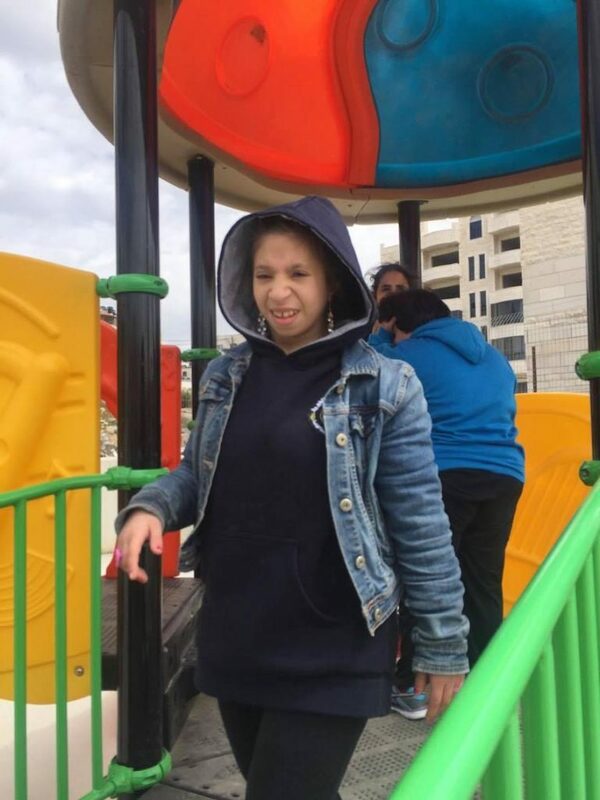 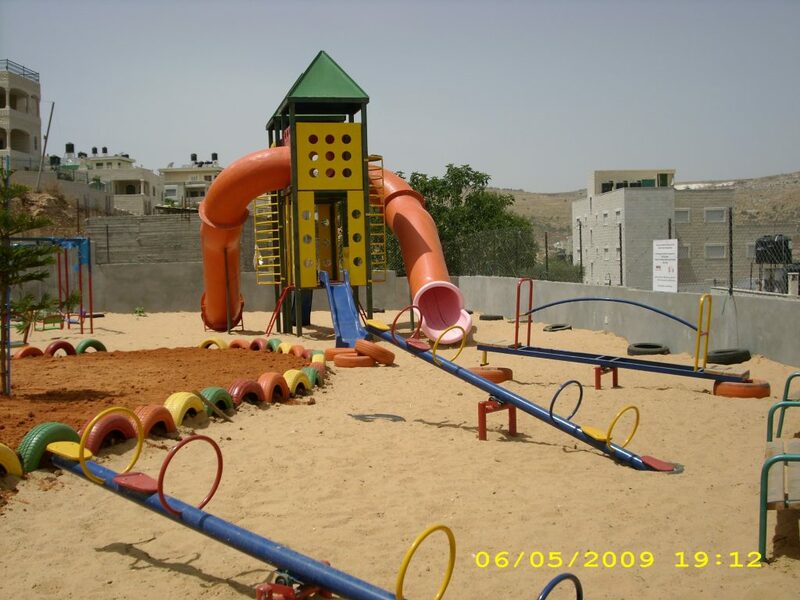 This accessibly playground was built outside the Silwad Disabled Center and was built in the city of Silwad because the people in the city excelled in teaching and challenging its student population. 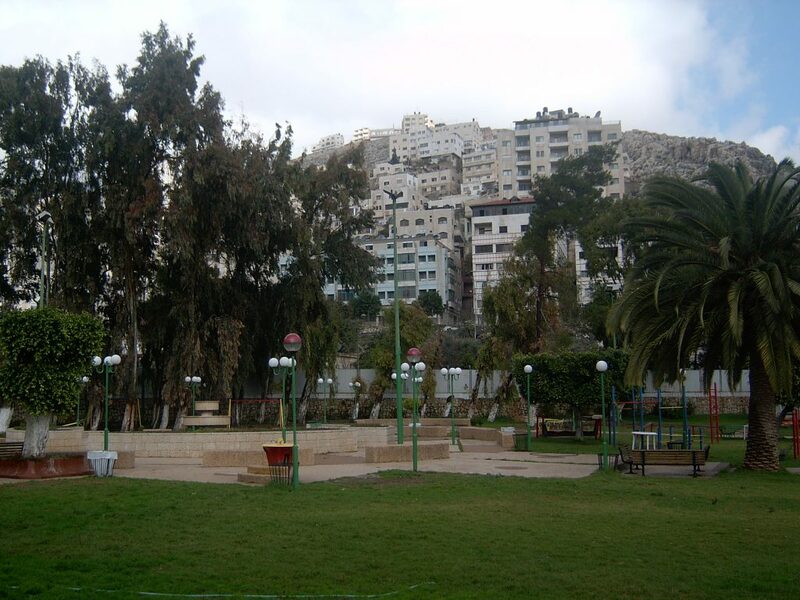 The Nahr el Bared Camp (NBC) was established in December 1949 by the League of Red Cross Societies in order to accommodate the Palestinian refugees suffering from the difficult winter conditions in the Beqa’a valley and the suburbs of Tripoli. About 31,000 displaced Palestinians and their families live in and around this camp, located 16km from the city of Tripoli and occupying an area of about 20 km2. 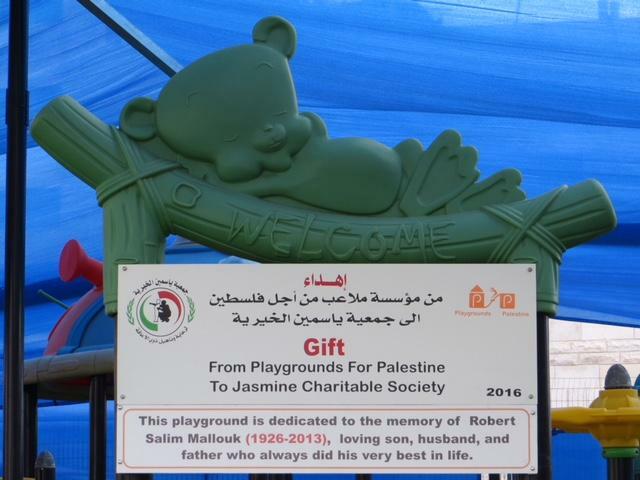 This refugee camp was named after the river that runs south of the camp. 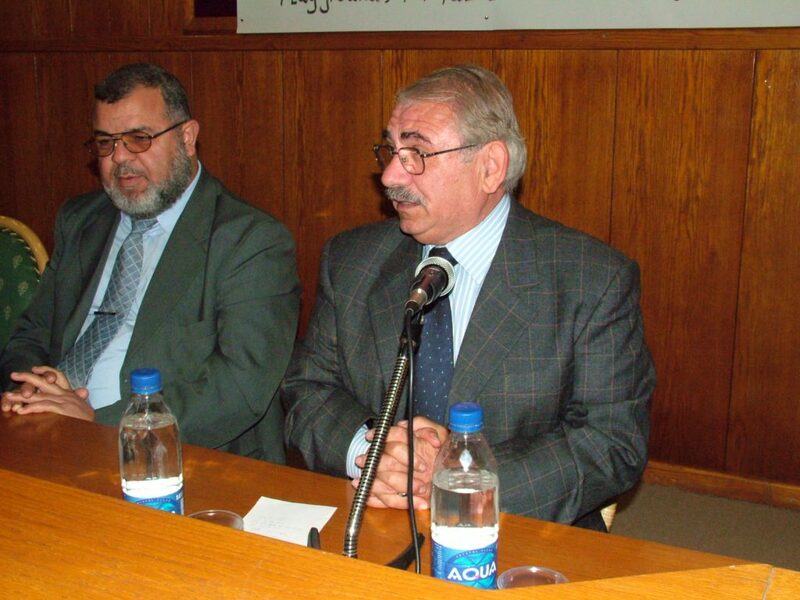 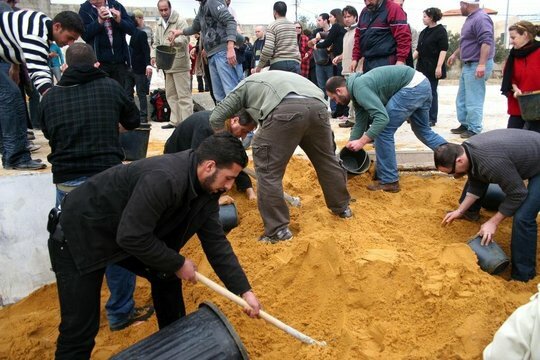 On May 20, 2006, fierce clashes erupted between armed members of the radical group Fatah Al Islam (FAI) and the Lebanese Army in Tripoli (in northern Lebanon). 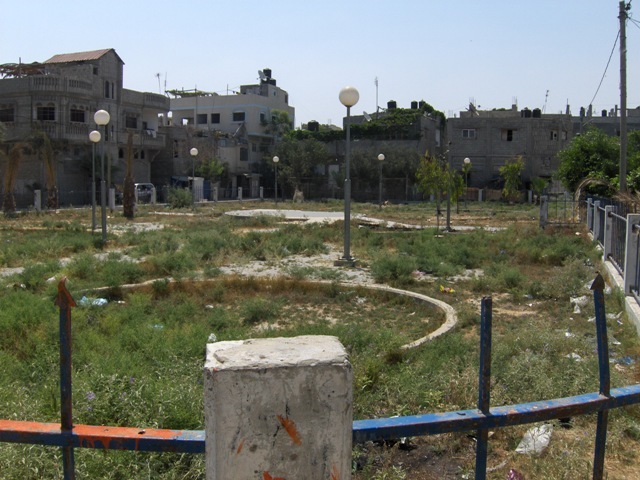 These clashes quickly spread to the nearby Palestinian refugee camp of Nahr el Bared (NBC), resulting in over 300 deaths. 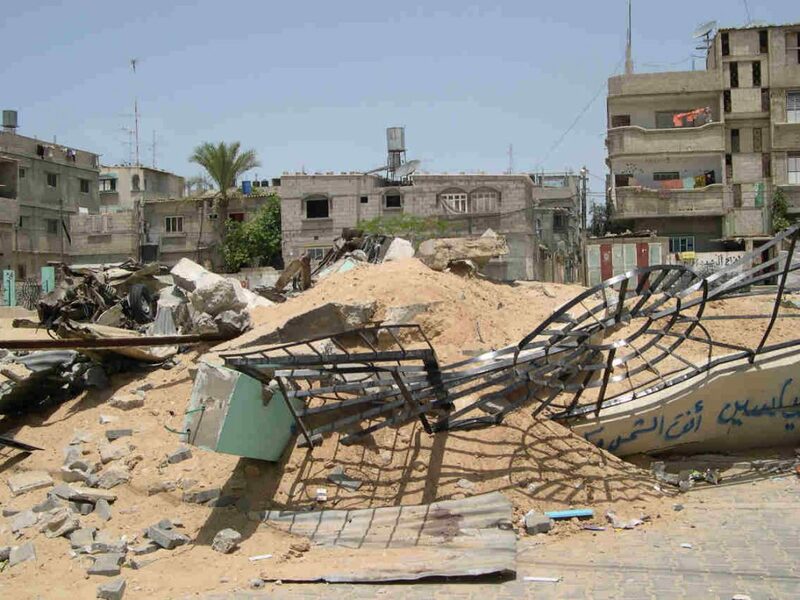 The camp was decimated and became uninhabitable. 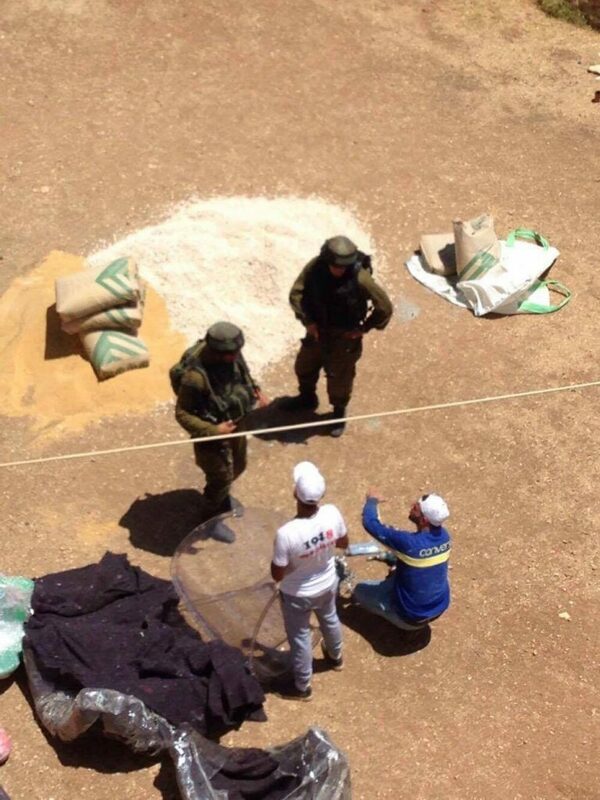 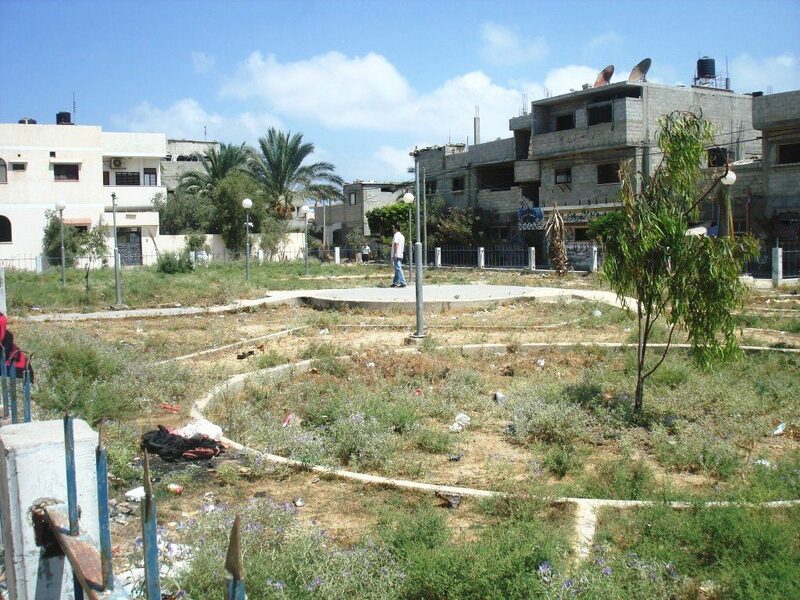 The human, economic and political consequences of this conflict have been very severe on the Nahr el Bared Camp. 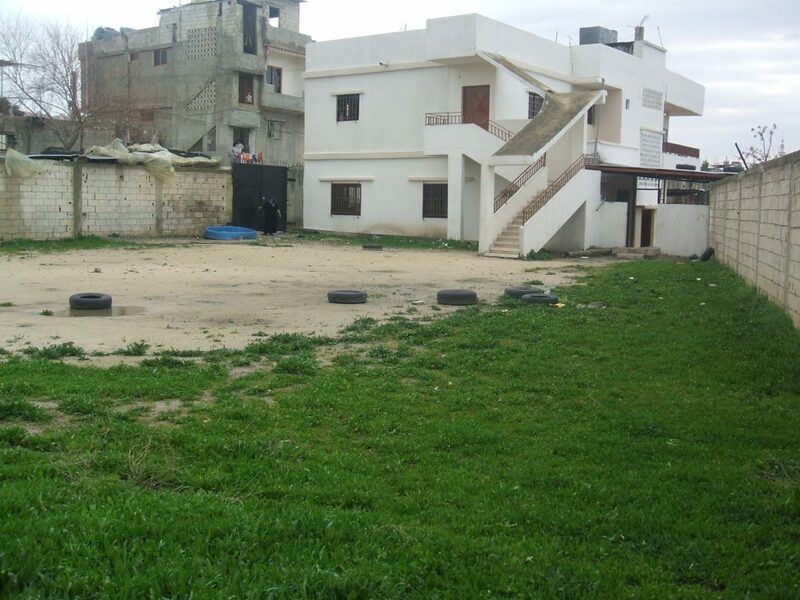 The “new” Nahr el Bared camp was set up to accommodate the refugees of the refugee camp and is in great need of help. 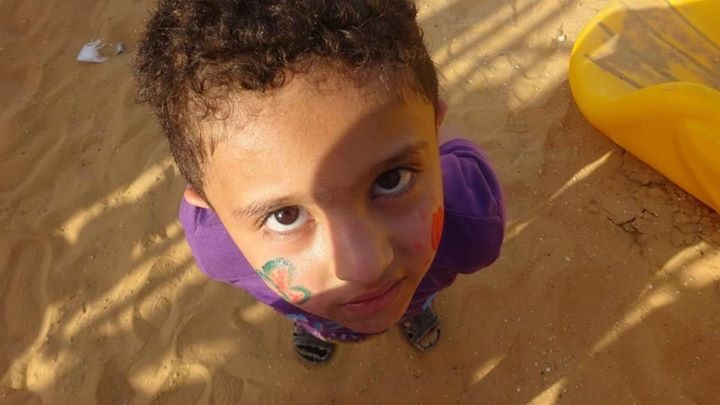 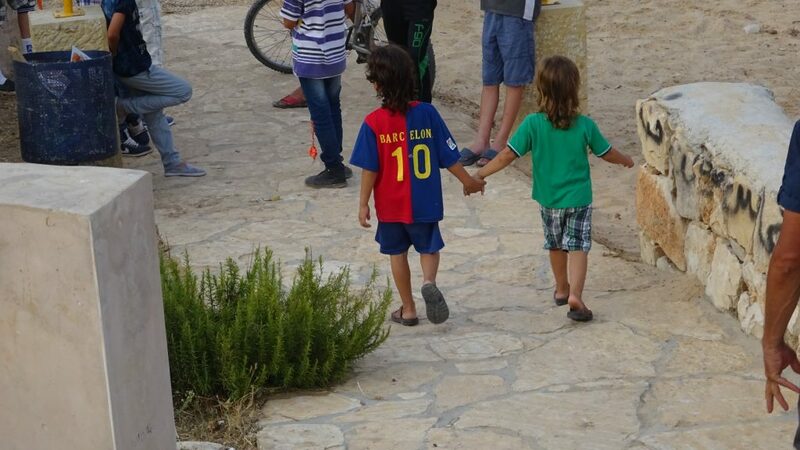 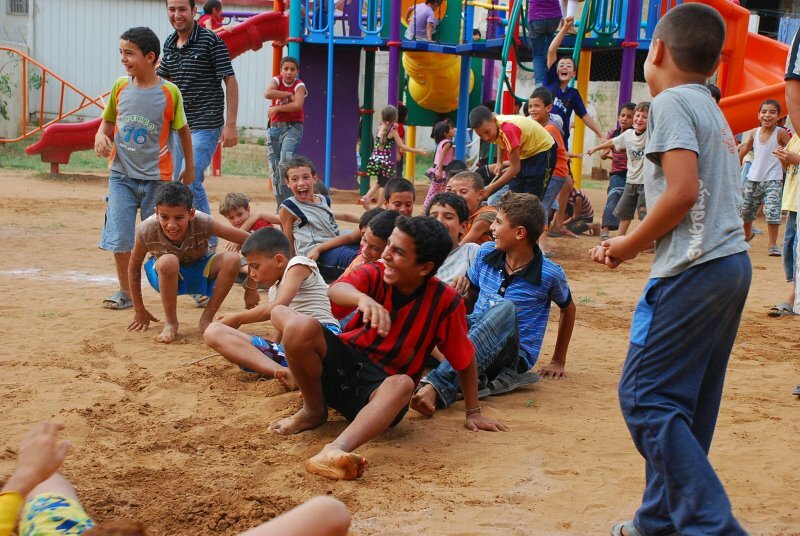 PfP has partnered with ANERA and MECA to provide children in this impoverished camp with a safe and fun place to play. 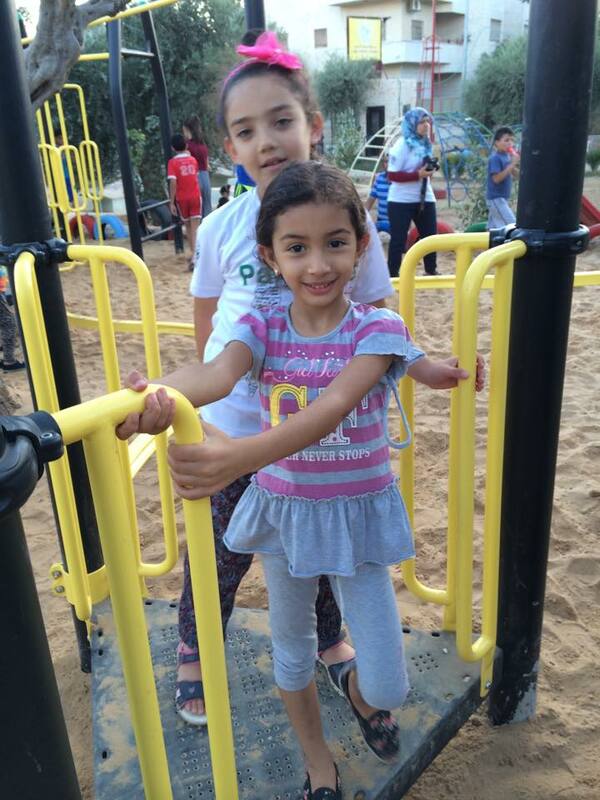 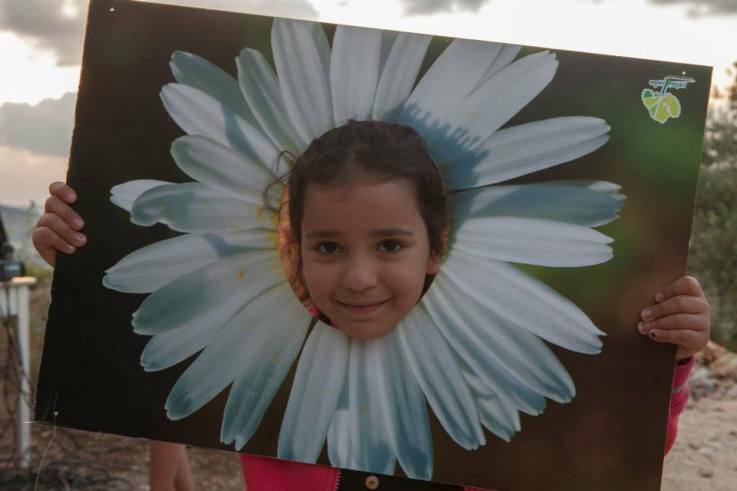 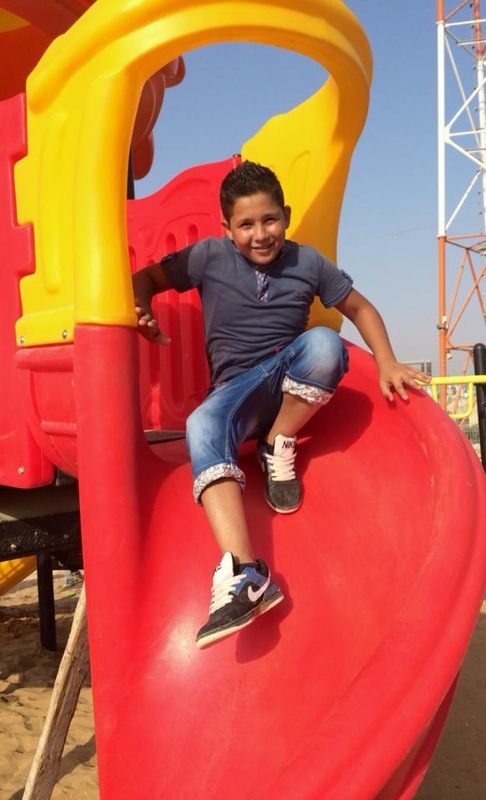 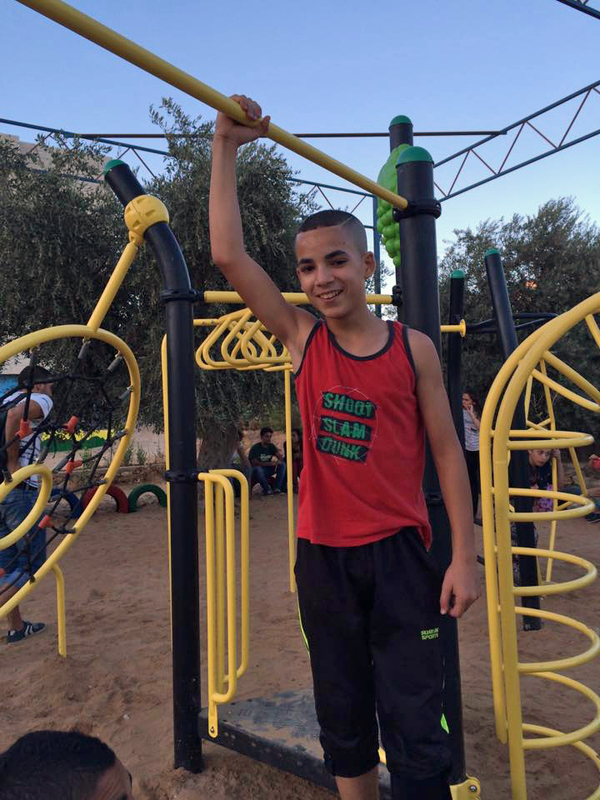 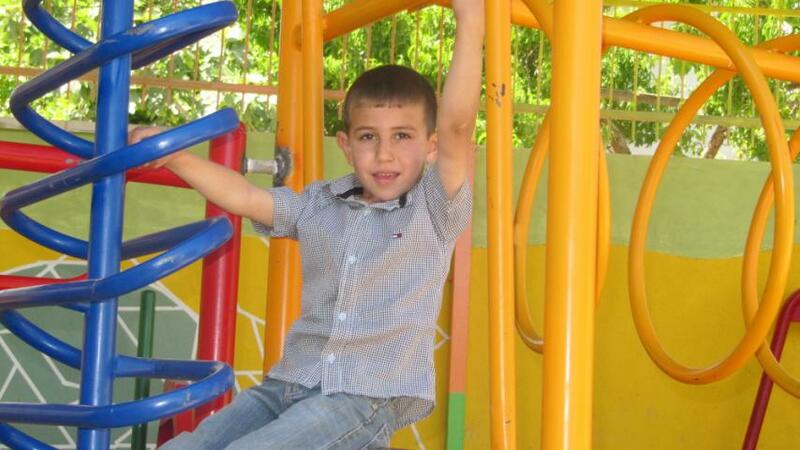 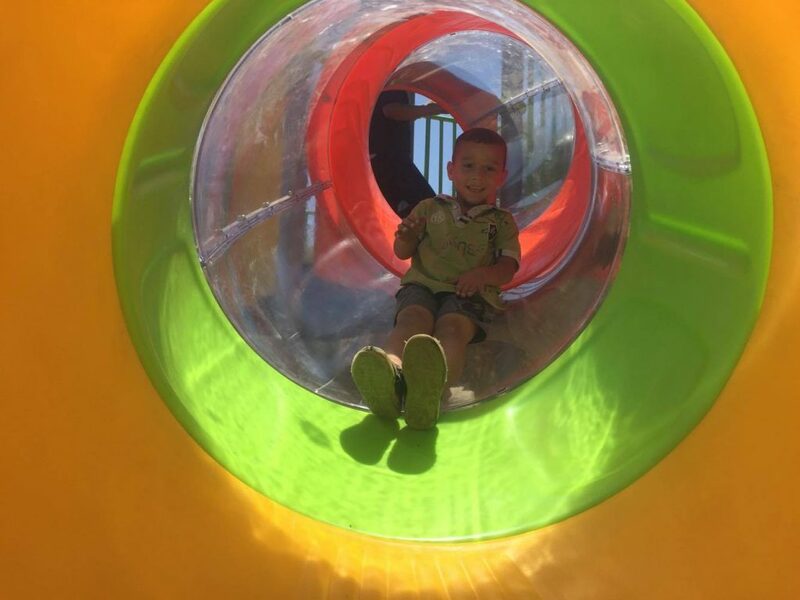 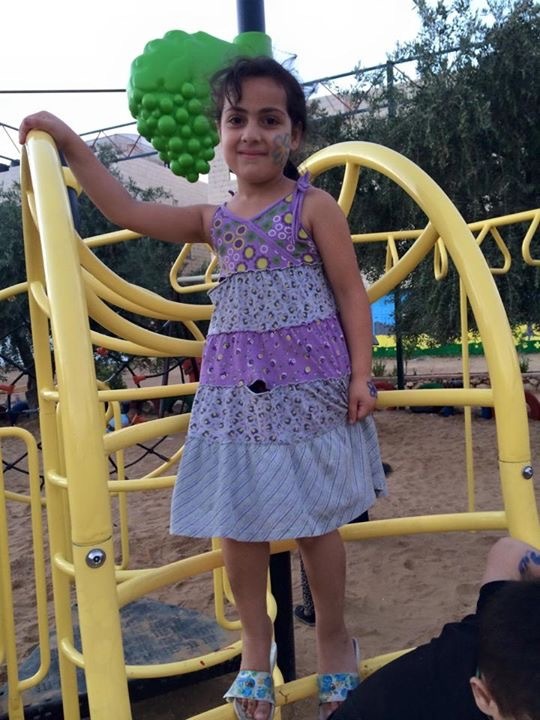 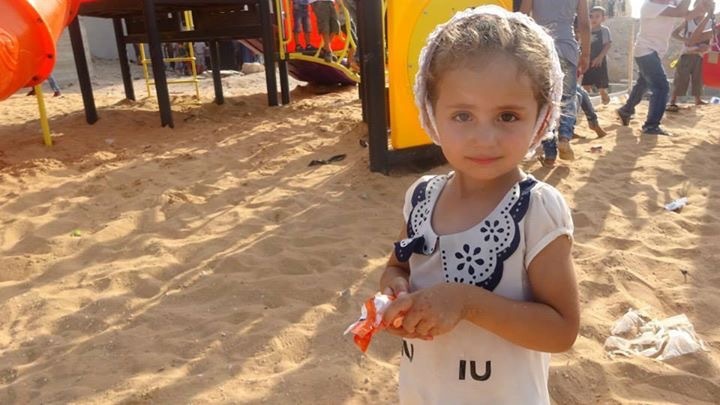 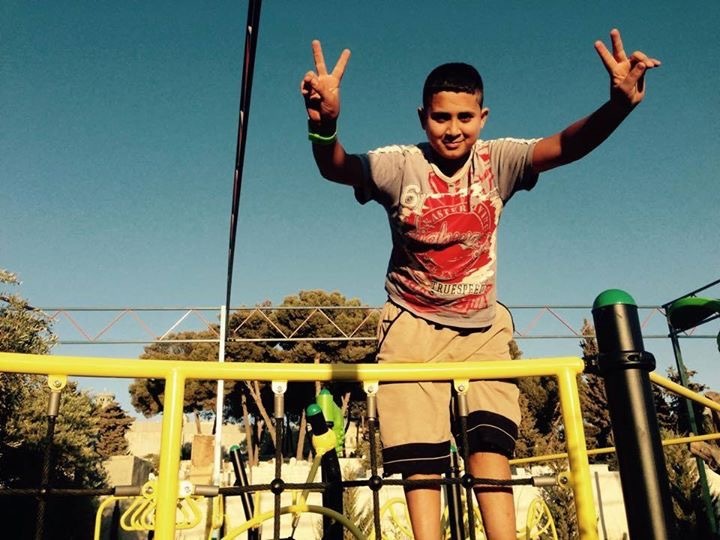 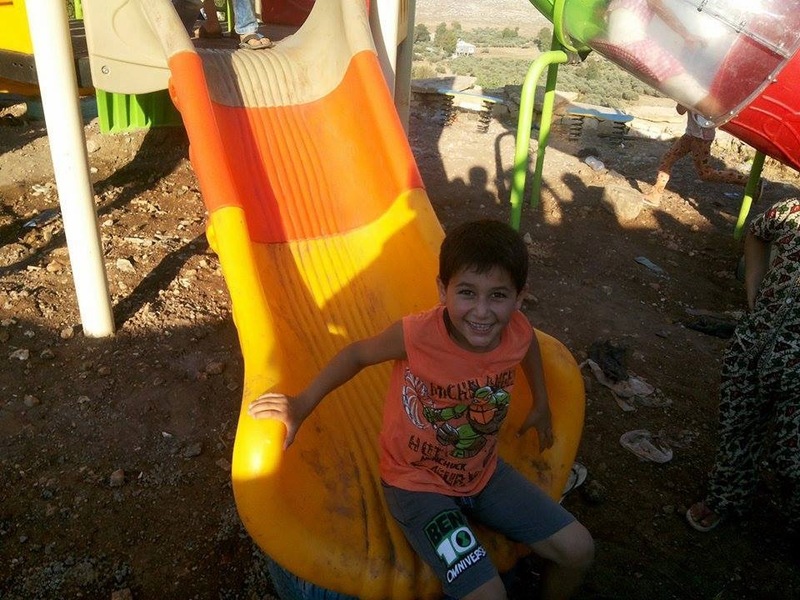 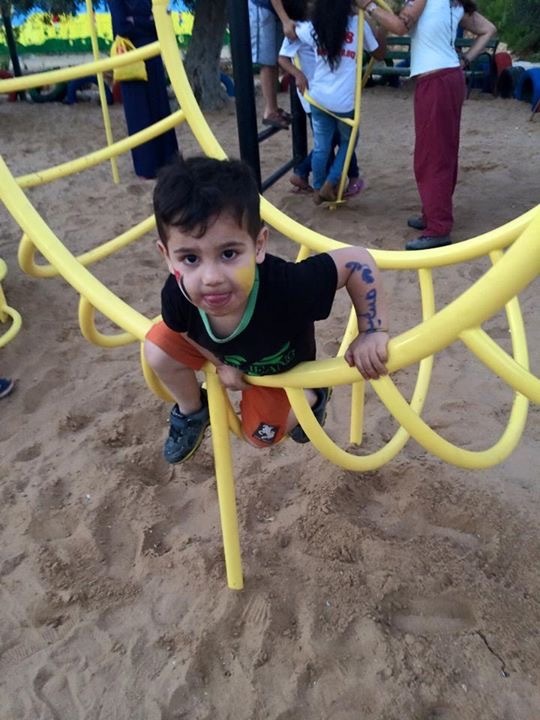 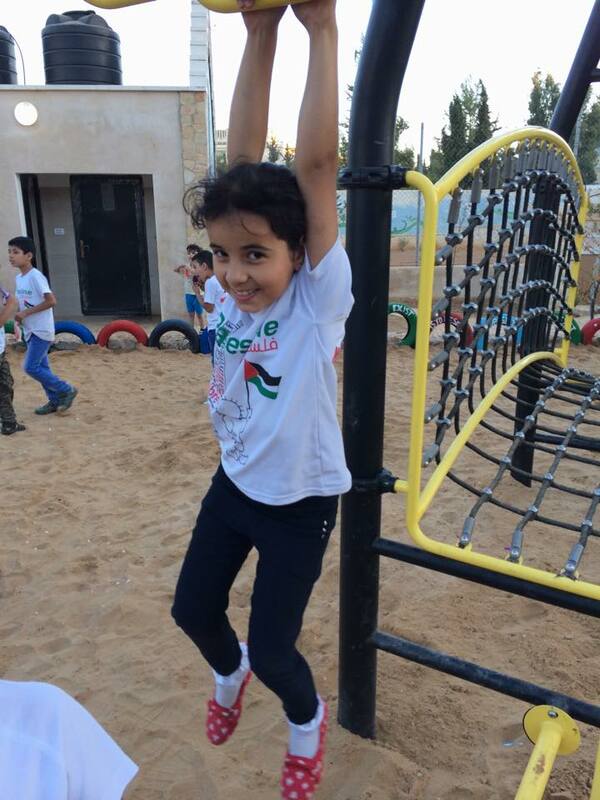 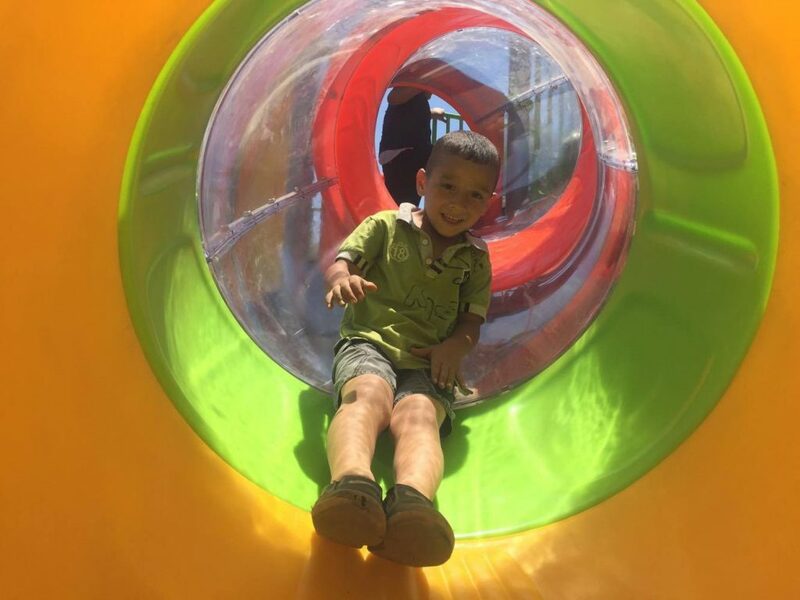 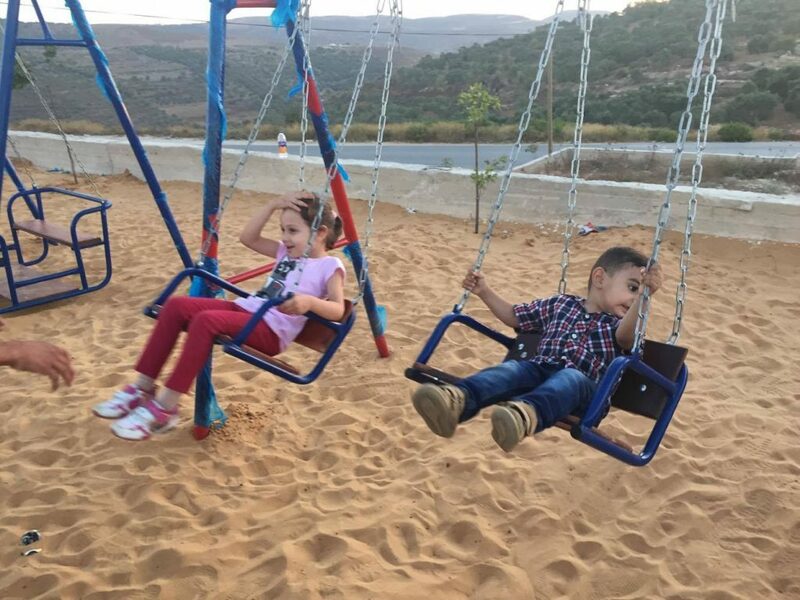 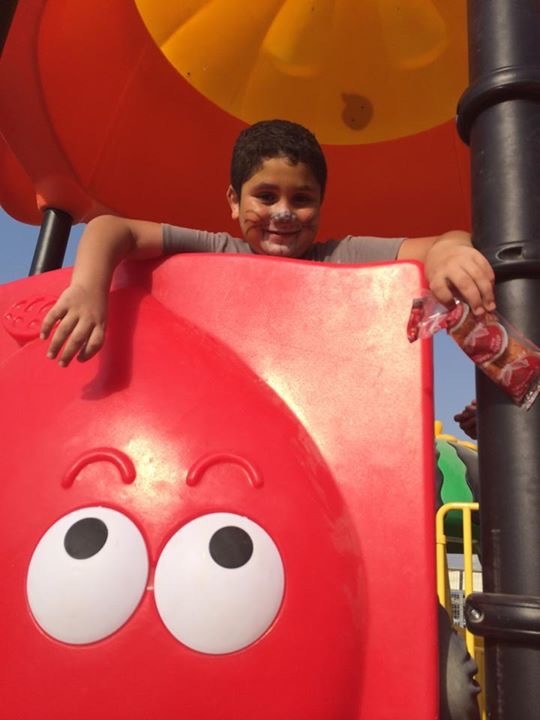 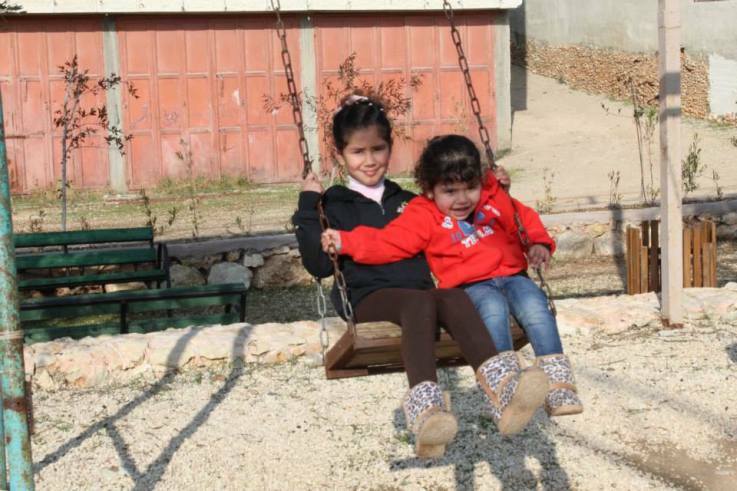 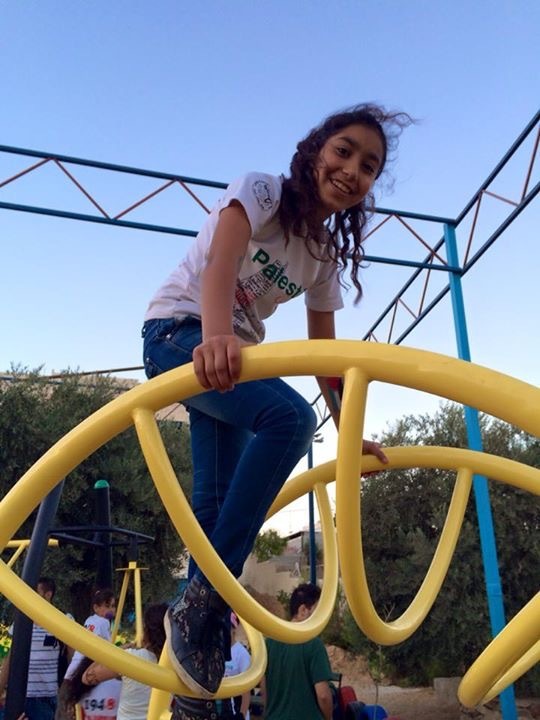 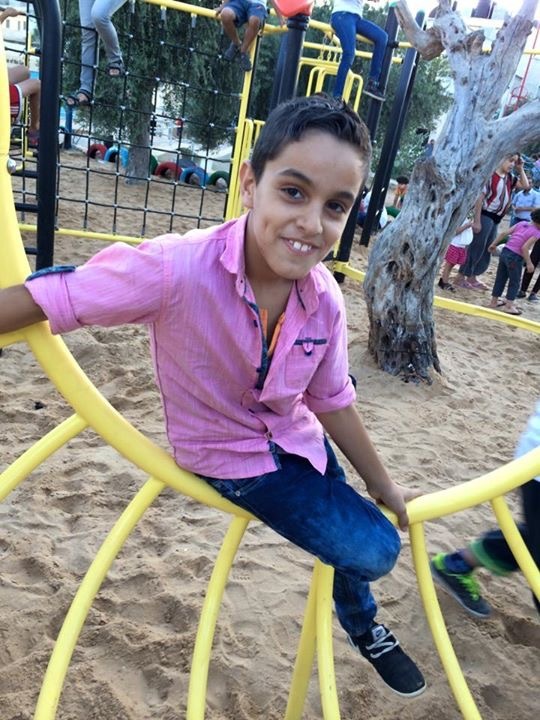 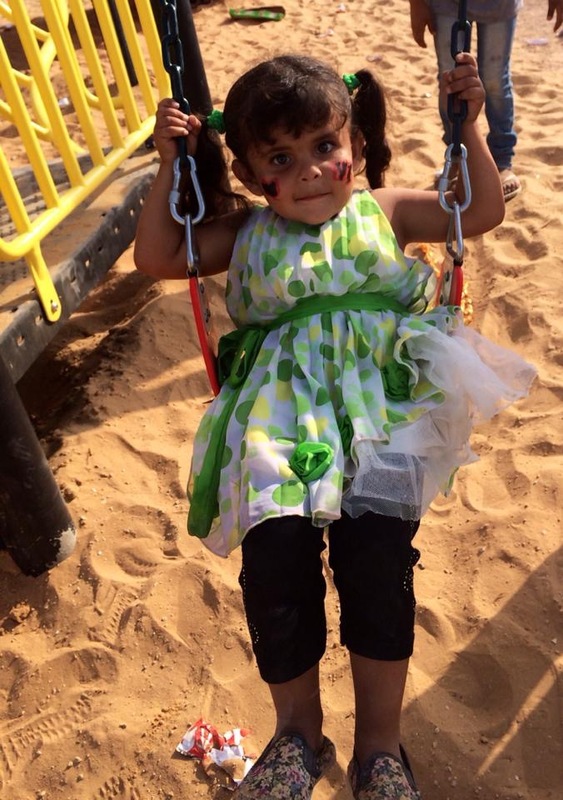 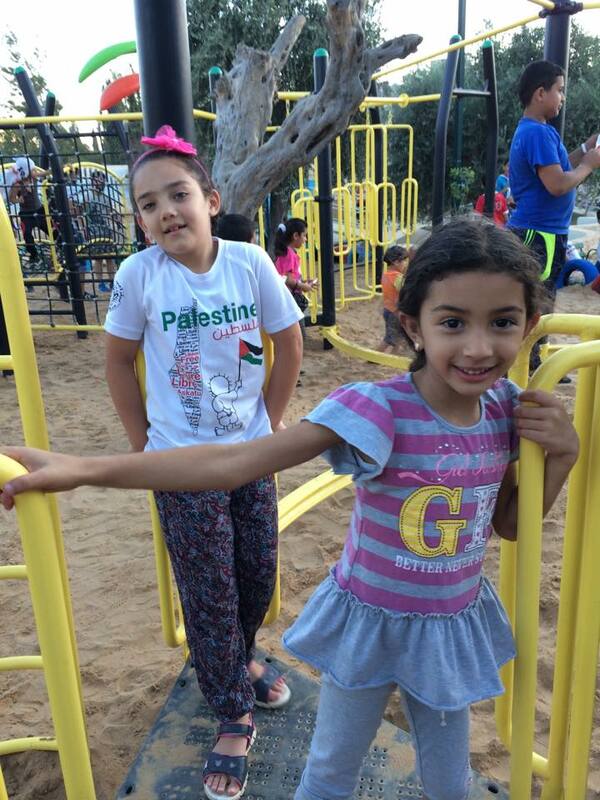 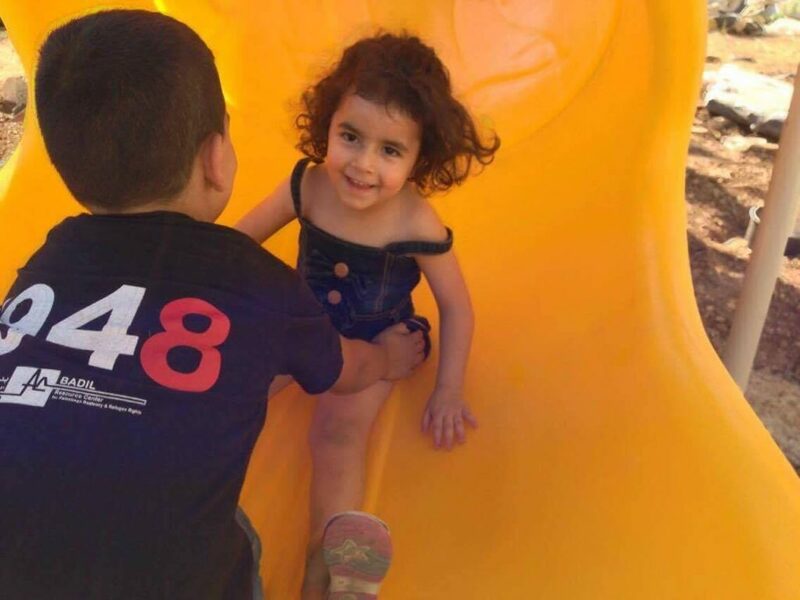 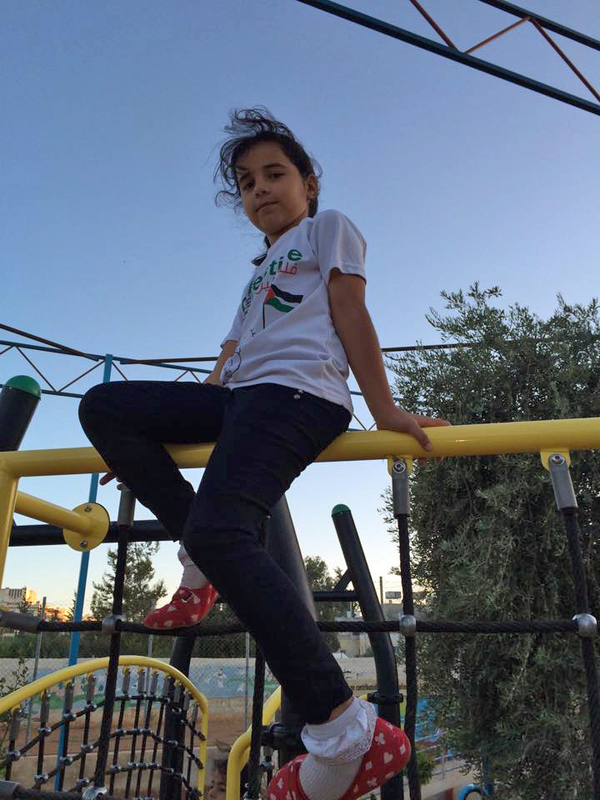 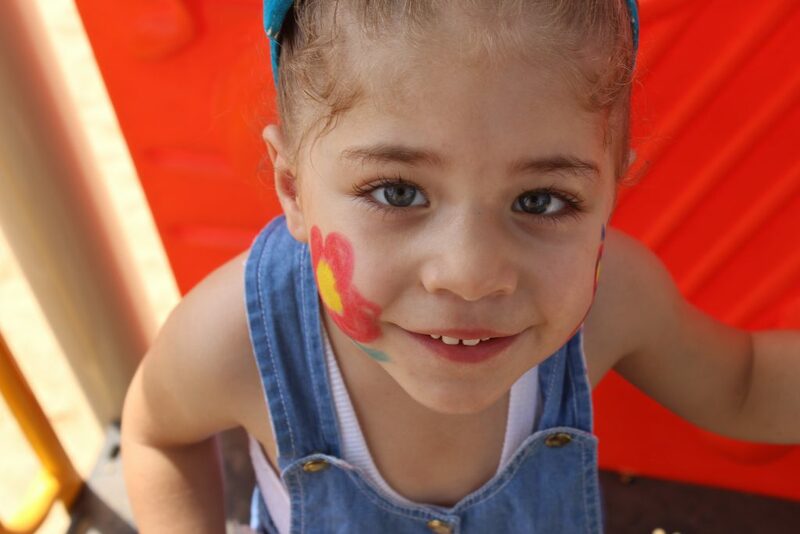 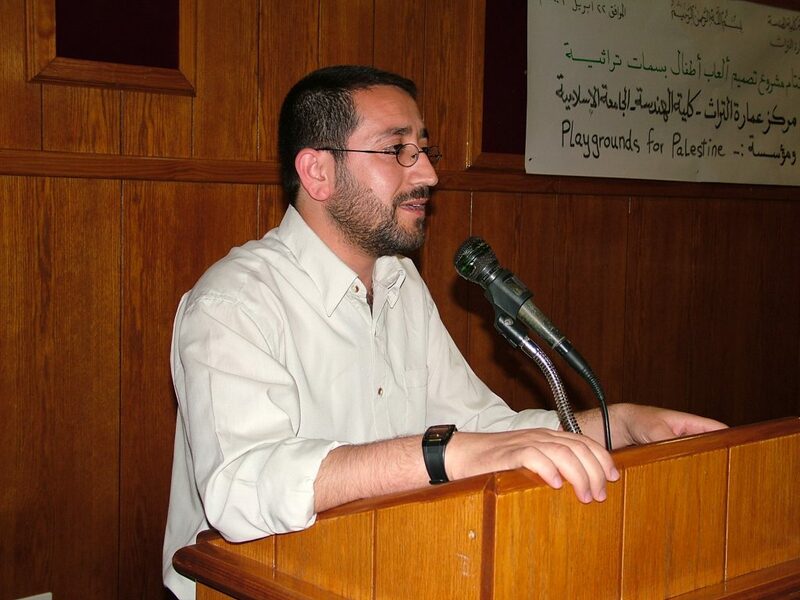 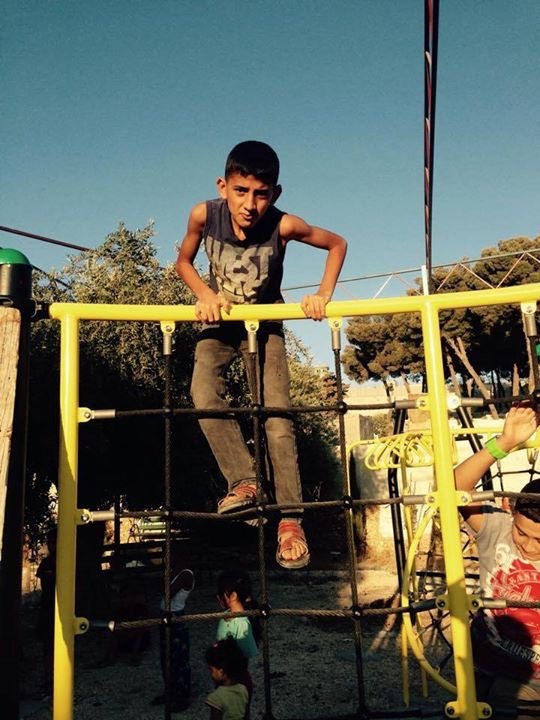 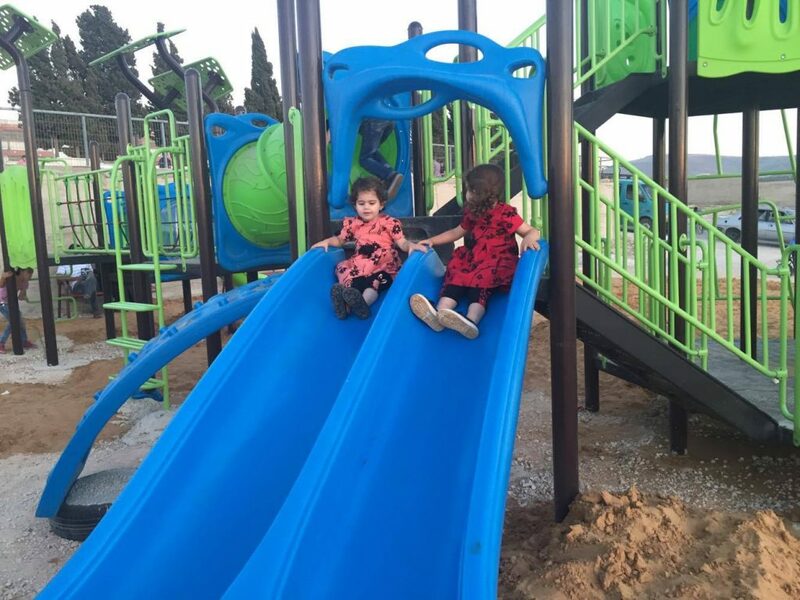 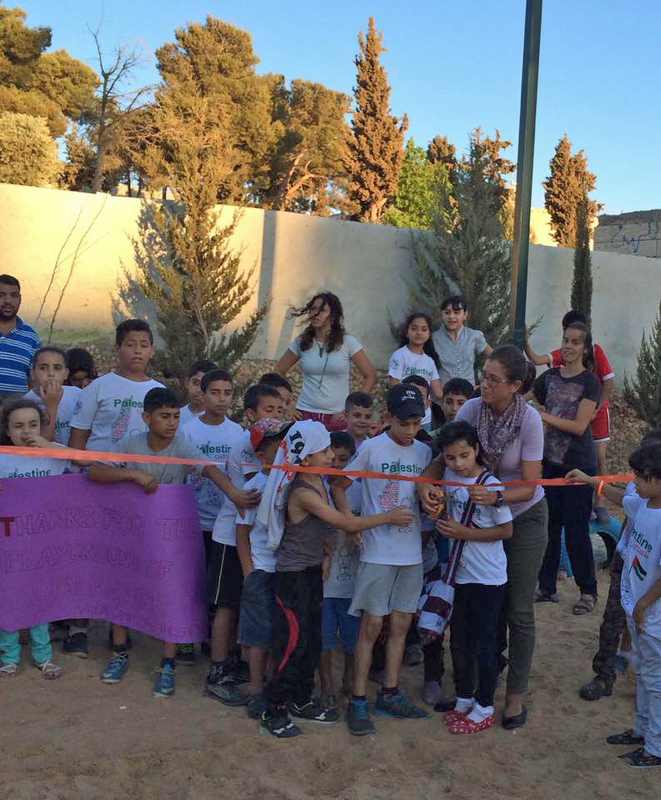 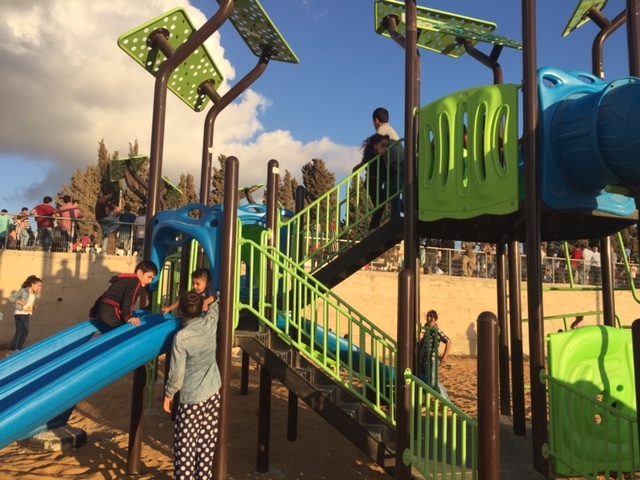 A donation to ANERA from the family of the late Mazen Afifi made it possible to establish a park where a Playgrounds for Palestine playground could finally be installed. 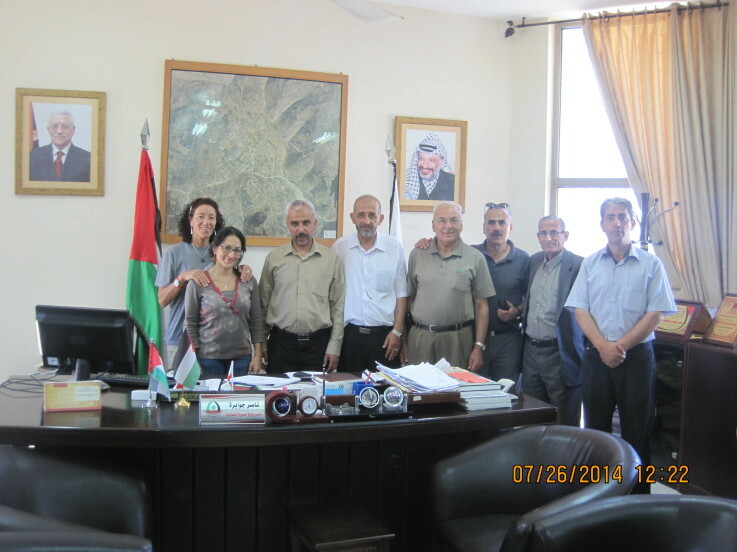 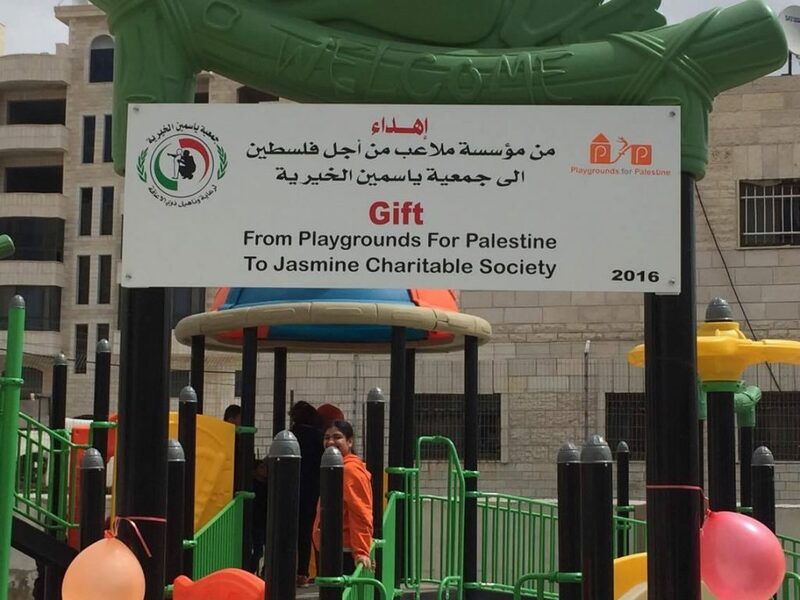 Sinjil KG is owned and run by the the Women Charitable society and is located the town of Sinjil, part of the Ramallah District in the West Bank. 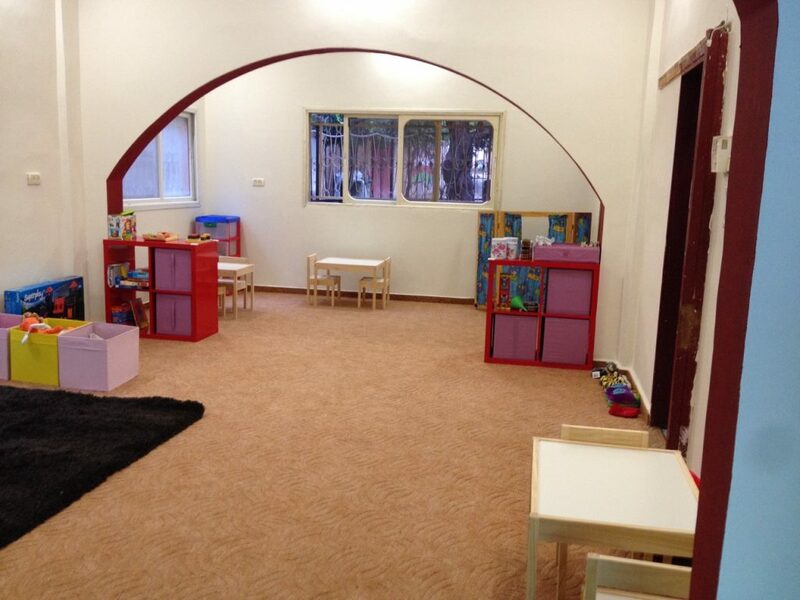 The KG accommodates up to a 180 children, has 10 teachers of which one of them is the headmistress as well. 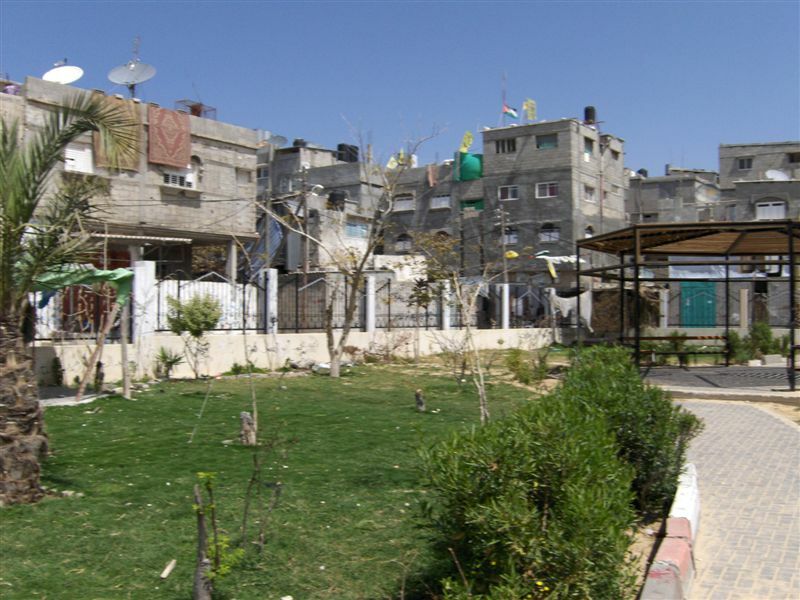 The KG is made up of two separate houses situated next to each other. 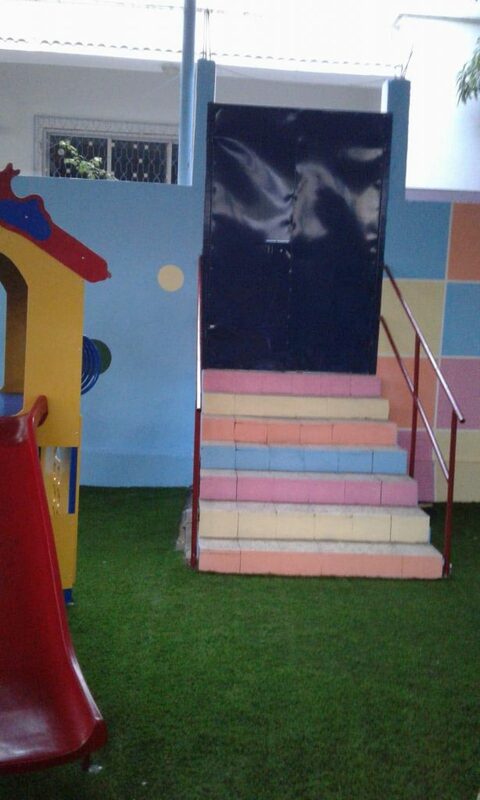 The first occupies the ground floor of a two store house, has 6 classes, canteen and kitchenette, an admin room and 2 toilettes located outside the building, the size of the building is 180Km2. 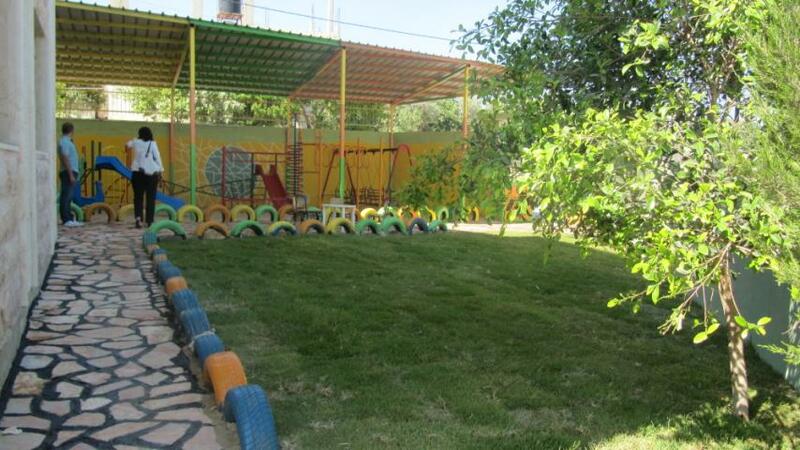 The second part of the KG is located in a 50Km2 house made up of 2 classrooms and one toilette. 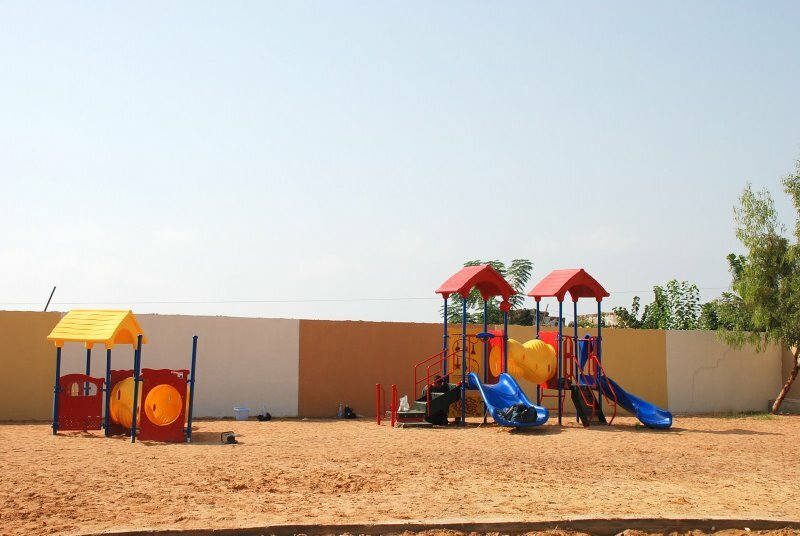 In addition to building a playground, PfP helped renovate the kindergarten, including tiling the floors, painting the walls, and updating the facilities used by this kindergarten. 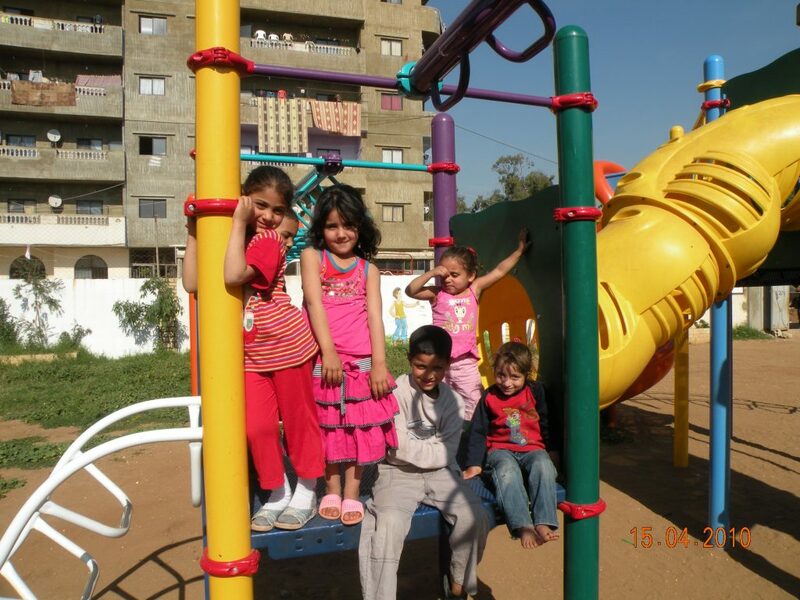 Work was funded by PfP and completed in coordination with The Welfare Association. 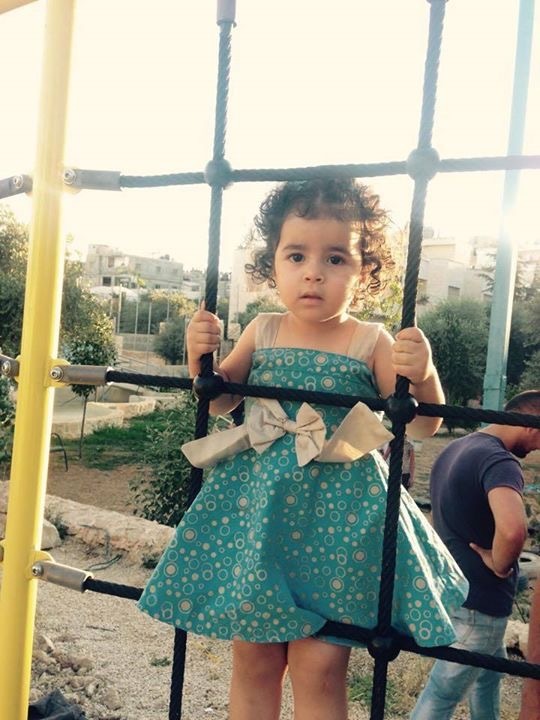 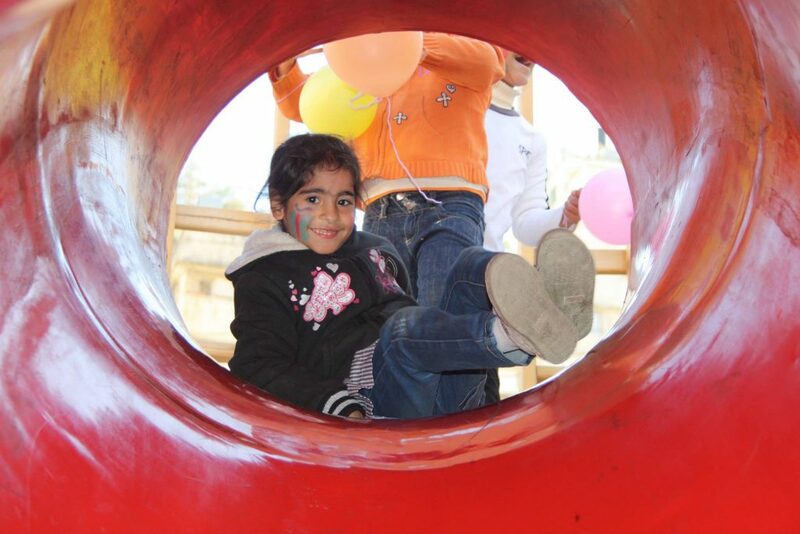 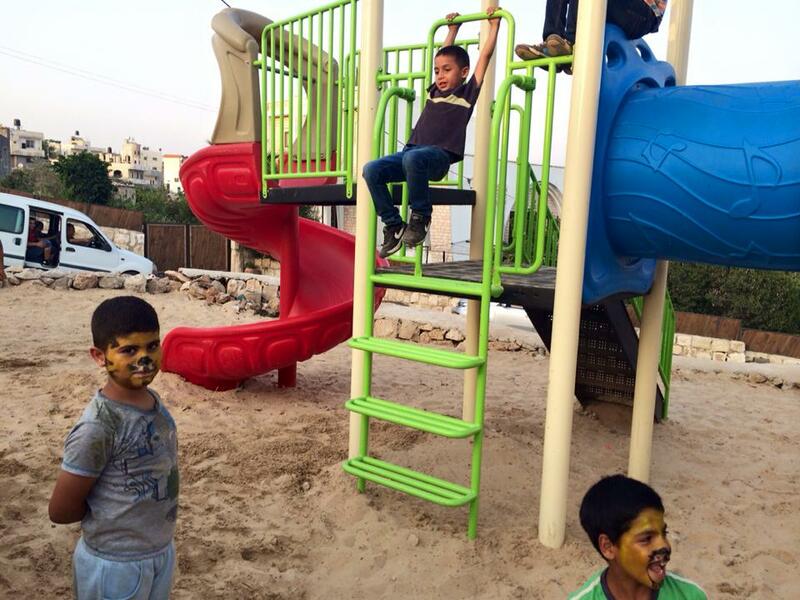 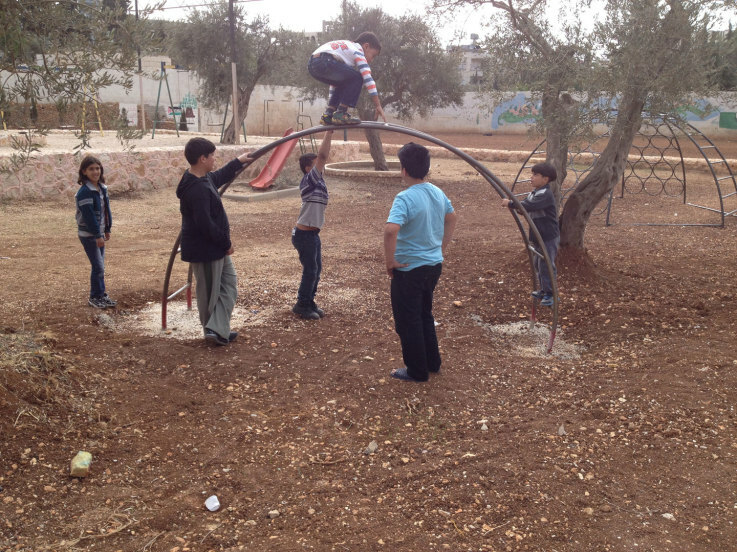 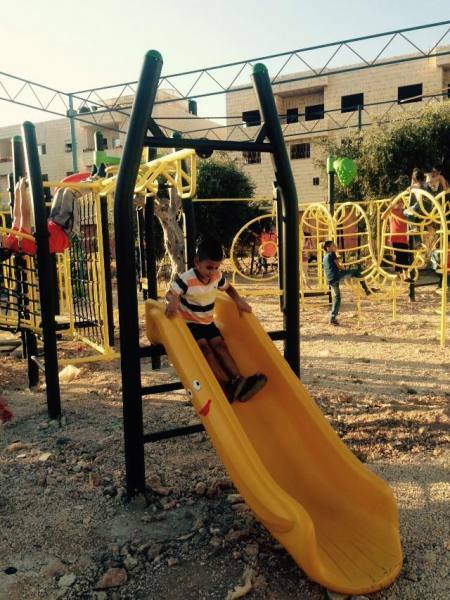 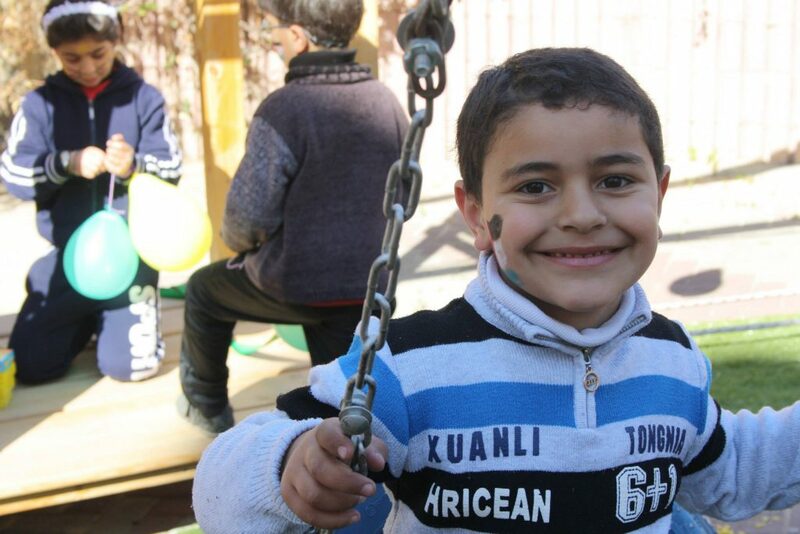 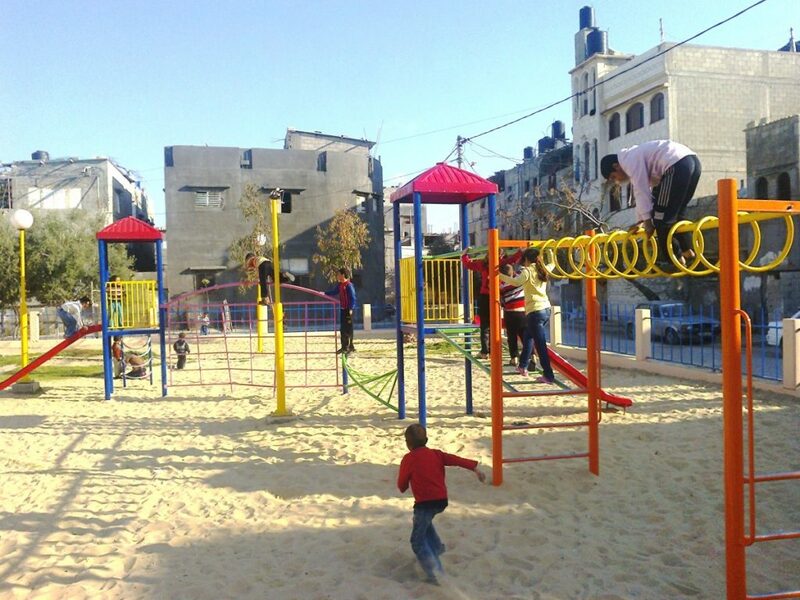 The playground built by Playgrounds for Palestine in the Jenin Refugee Camp is now complete and in use. 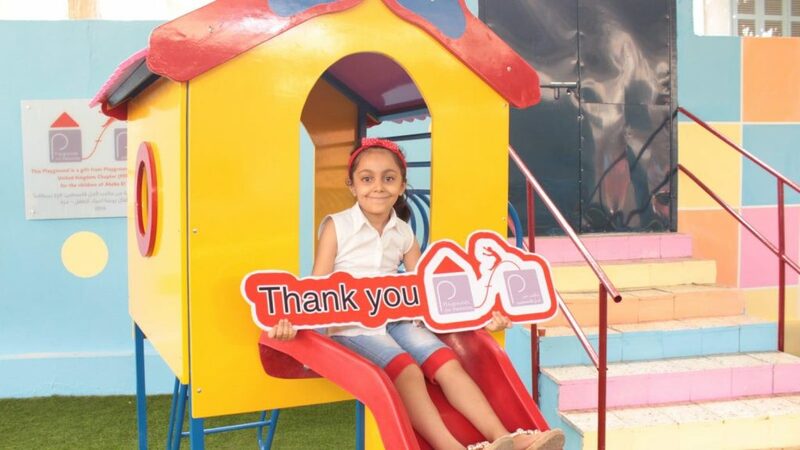 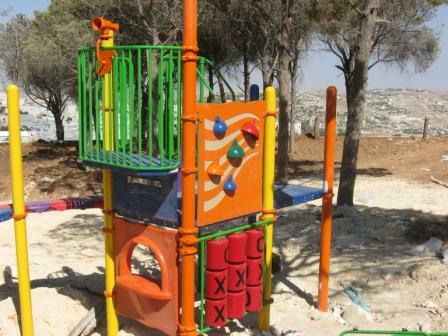 The Jenin refugee camp is honored to present our deepest thanks and gratitude to Playgrounds for Palestine for the financing of the children’s playground in the Jenin refugee camp, which was carried out in coordination with the ANERA foundation. 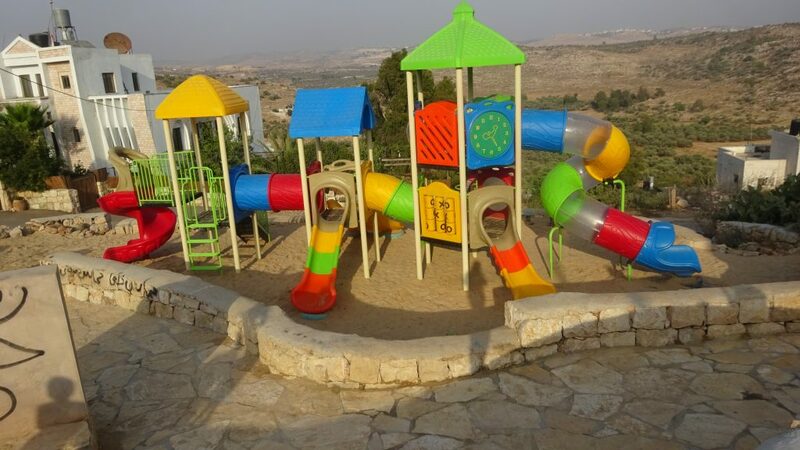 It has had a great impact in bringing joy and happiness to the hearts of children in the camp whose difficult and harsh living conditions lack places of play and recreation in their area of residence. 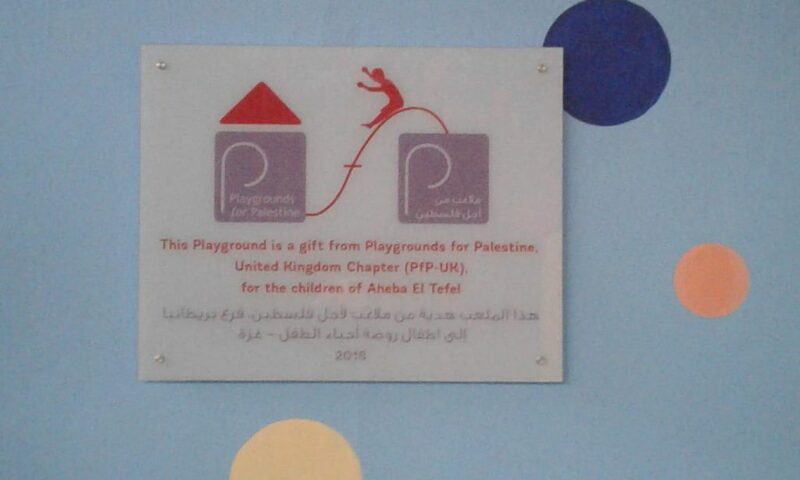 Thank you for this generous gesture. 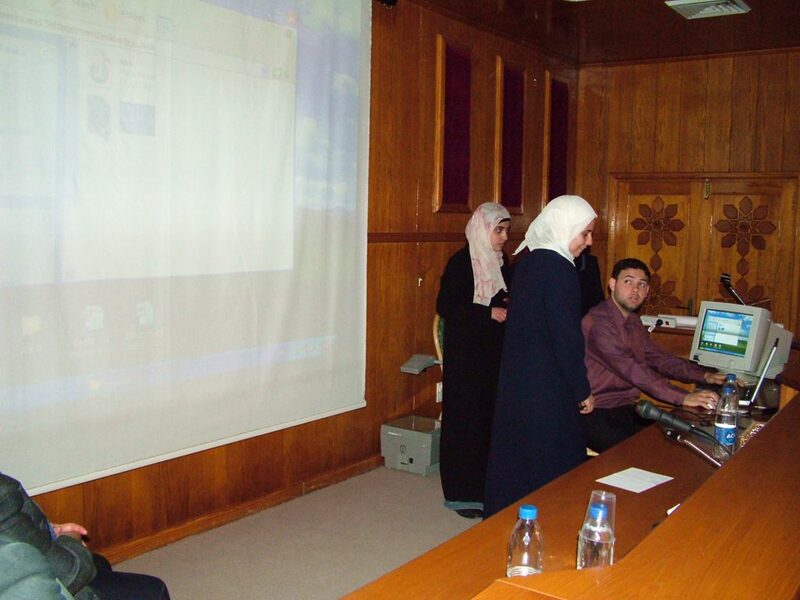 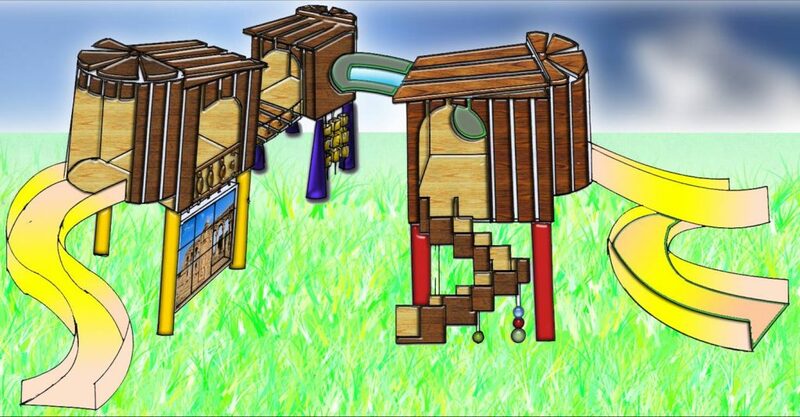 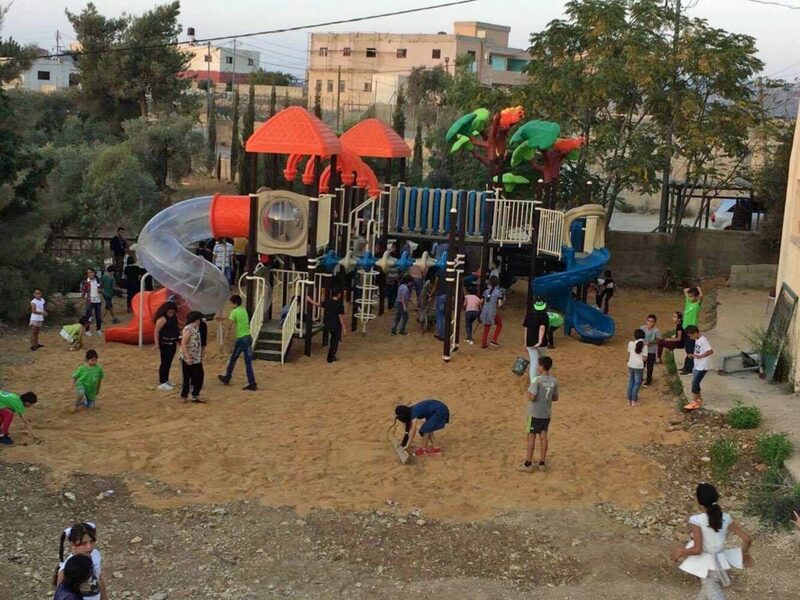 In cooperation with ANERA and the Islamic University of Gaza (IUG), Playgrounds for Palestine held a playground design competition among architecture students. 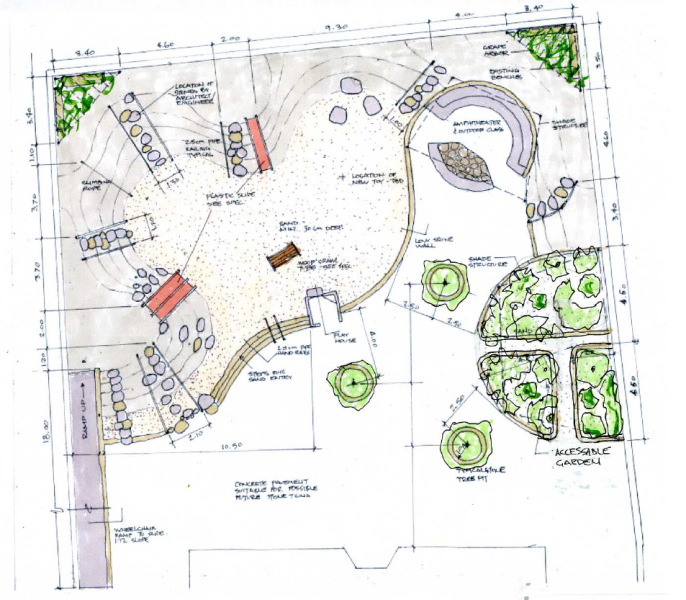 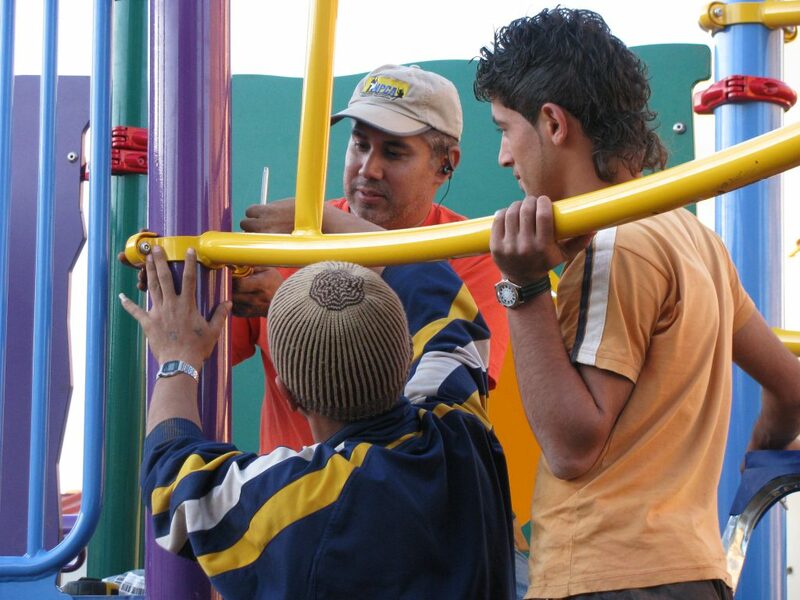 In addition to awarding a monetary gift, PfP gave the creators of the top six designs the opportunity to oversee the construction of fun, safe and aesthetically accurate playgrounds using local raw materials and local labor. 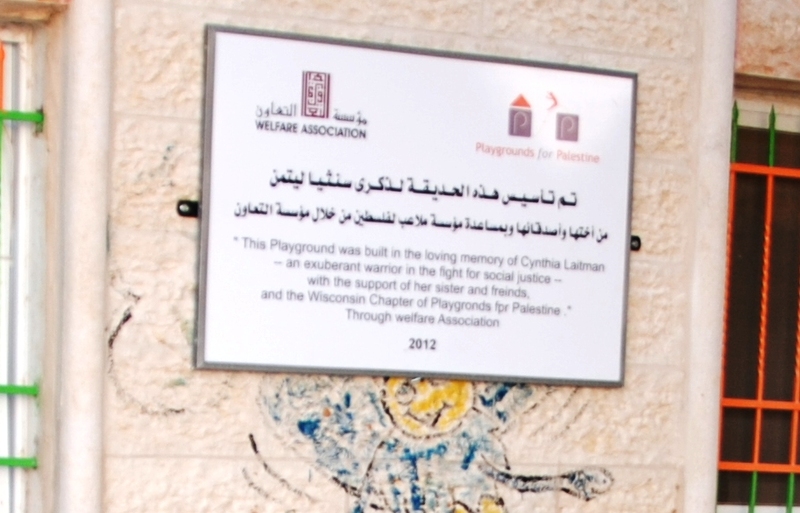 This playground was built in memory of Cynthia Laitman, with love from her sister, Judith, her friends, and the Madison, WI chapter of Playgrounds for Palestine. 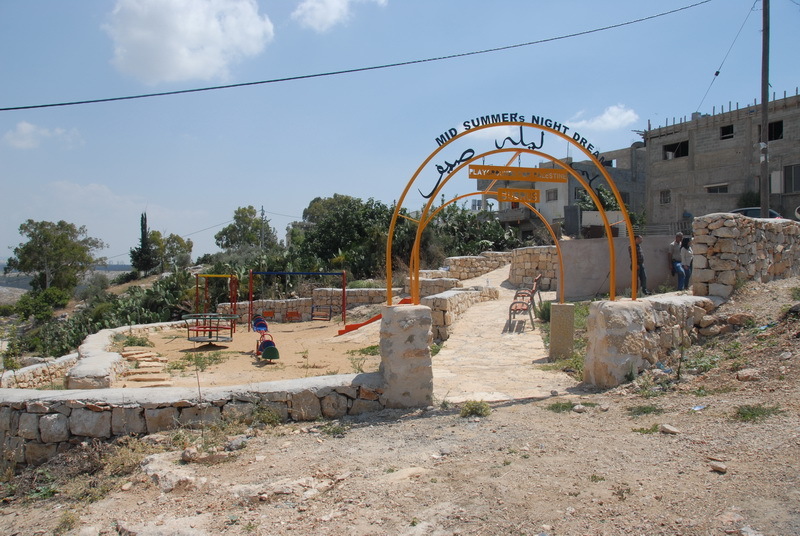 Deir Ammar is a rural village in the West Bank, west of Ramallah, with approximately 3,800 inhabitants (based on 2007 census). 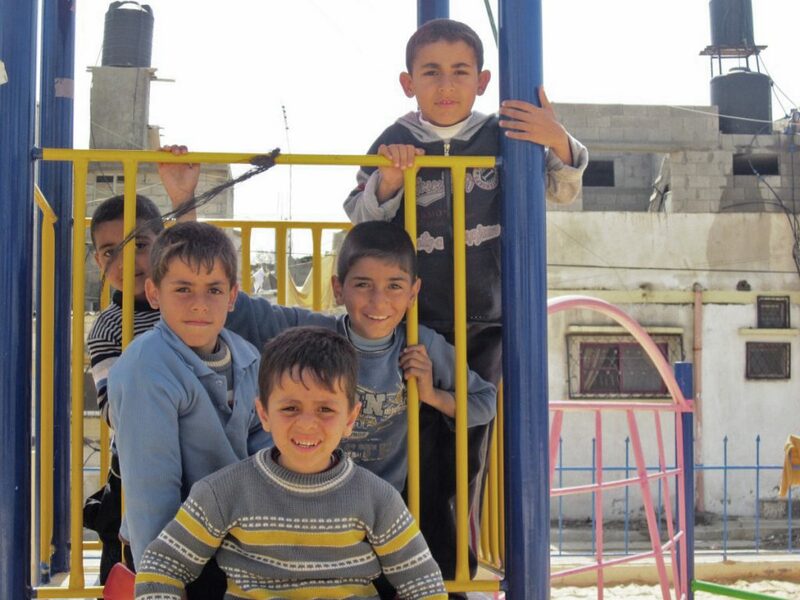 Just northwest of the village is the Deir Ammar refugee camp, where 2,303 refugees reside. 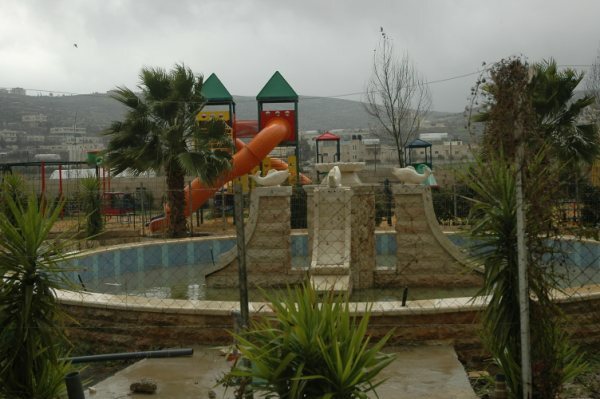 Both the village and the refugee camp lack adequate facilities for water, sanitation, and recreation. 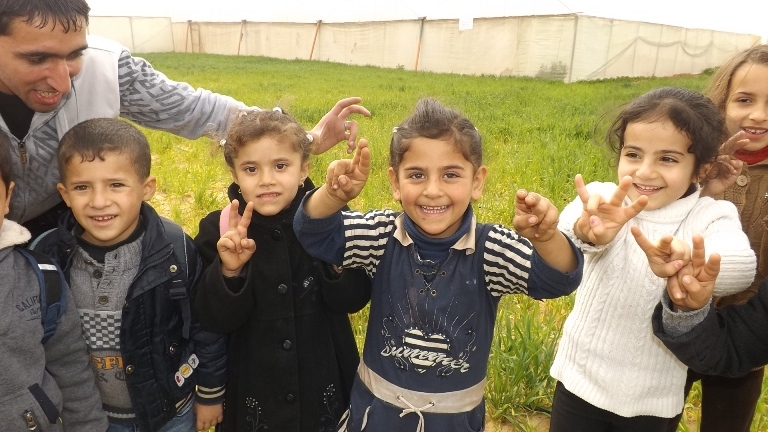 Rain-fed agriculture is the main source of income for most families in this village. 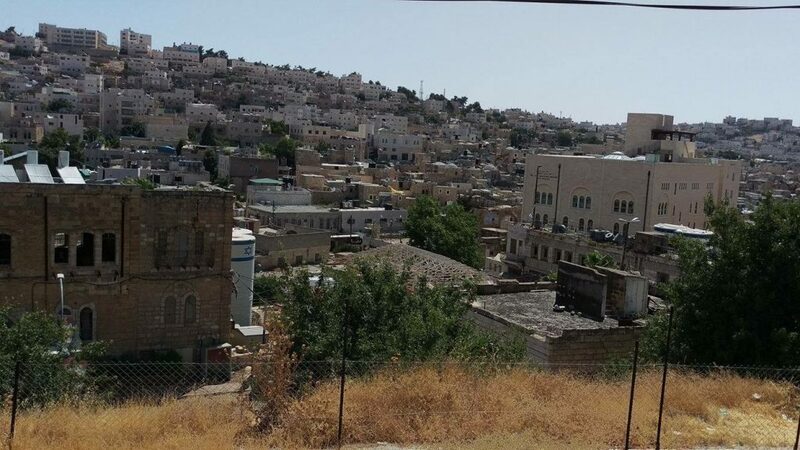 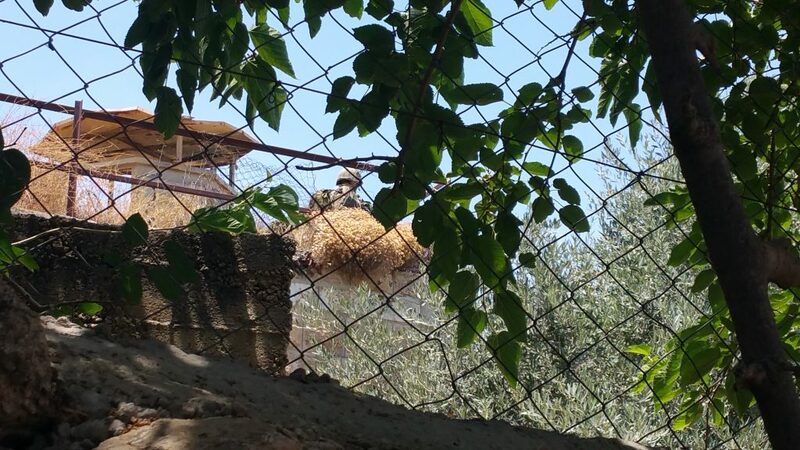 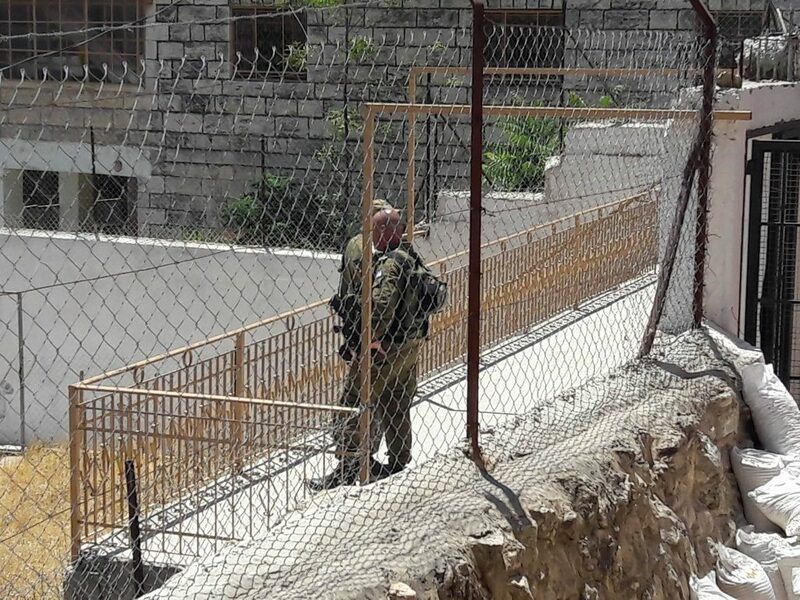 As other Palestinian villages, Deir Ammar suffers from lack of security, frequent Israeli military incursions, and land confiscations. 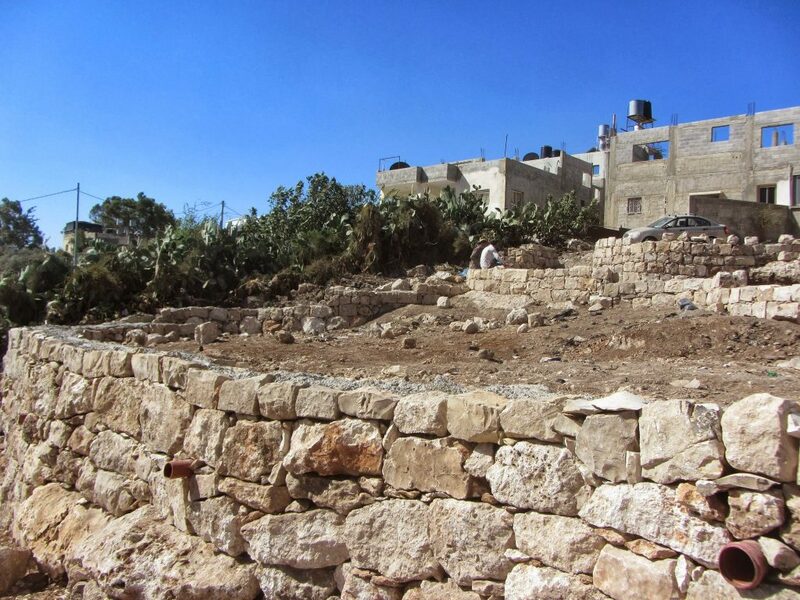 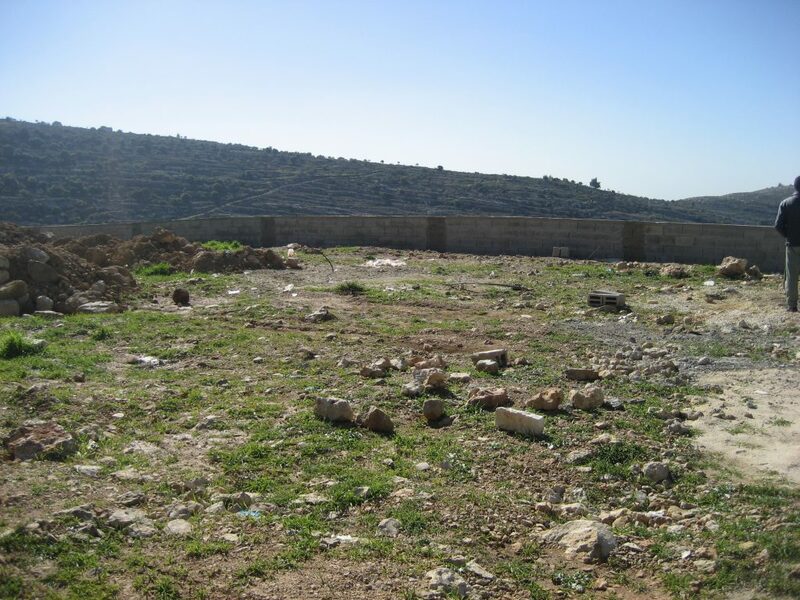 Approximately 20% of village land has been confiscated thus far for Jewish-only settlement construction. 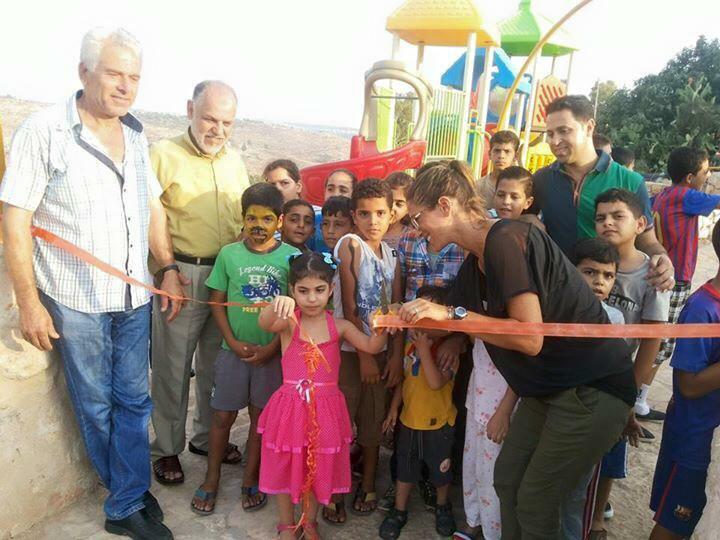 In cooperation with the Welfare Association, Playgrounds for Palestine funded and constructed a much needed playground in a kindergarten run by the Deir Ammar Athletic Club Charitable Society. 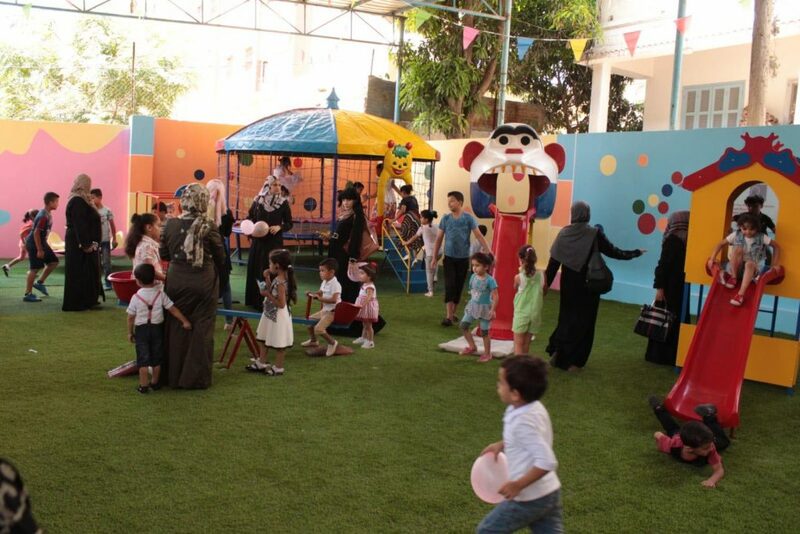 The kindergarten serves up to a 100 children and has 3 teachers of which one of them is the headmistress. 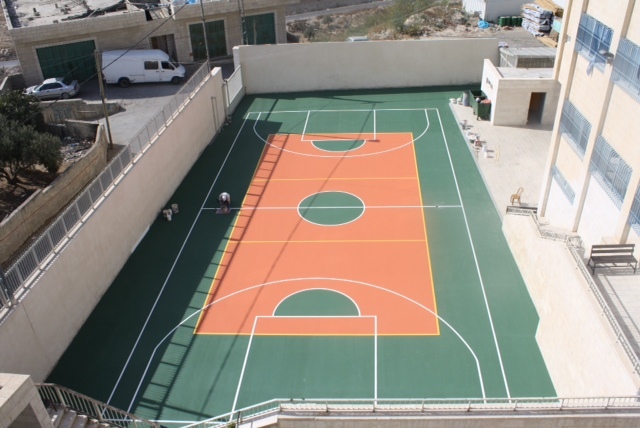 The KG is part of a three store building which includes the club (athletics and other youth and educational activities) as well. 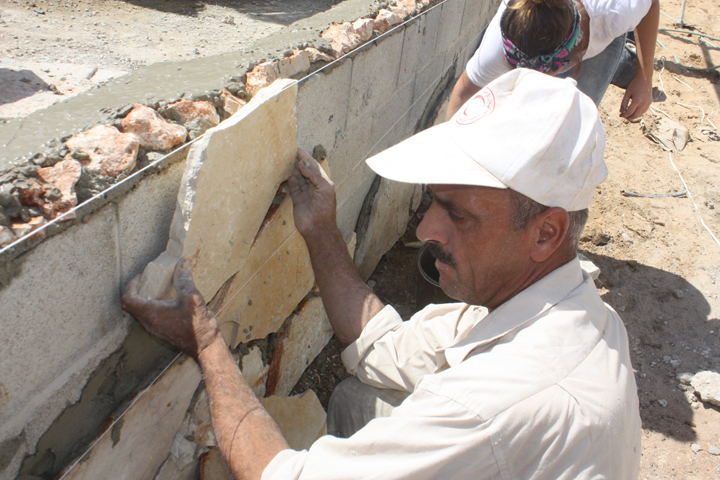 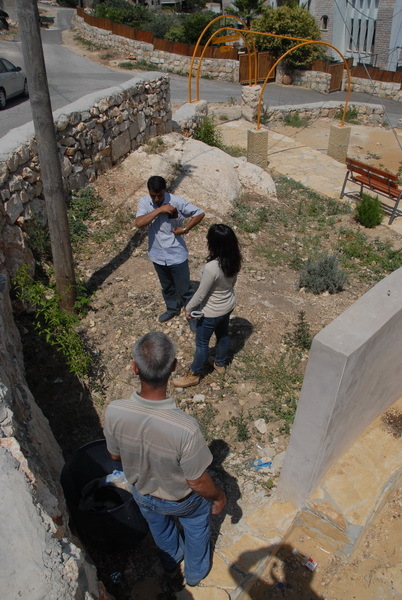 It was built in 2008 funded and built by the inhabitants of the village over 5 years. 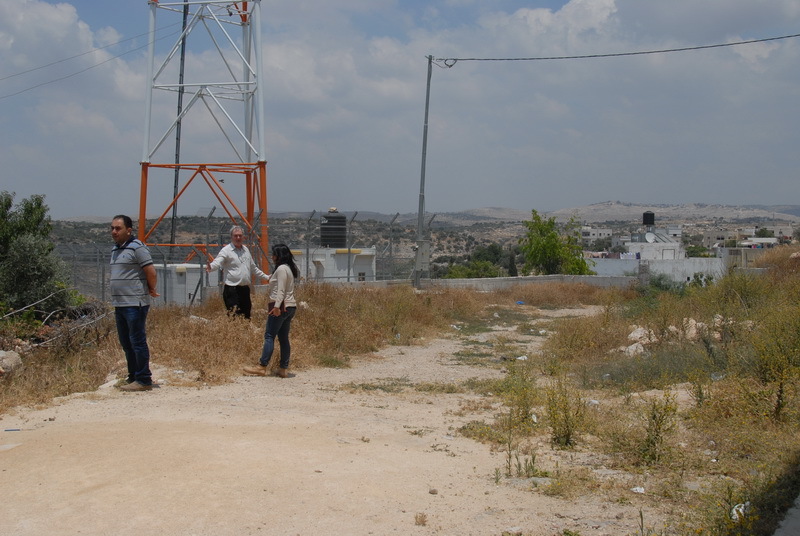 Beit Fajjar is an old industrial town outside of Bethlehem. 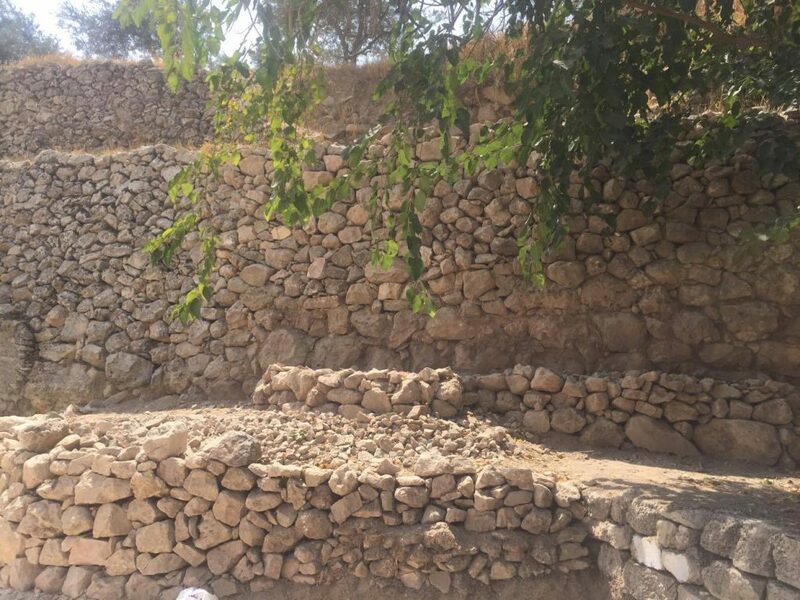 It is the home to many rock quarries and used to be a very lucrative town that imported much of its stone to be used by marble masons in Italy. 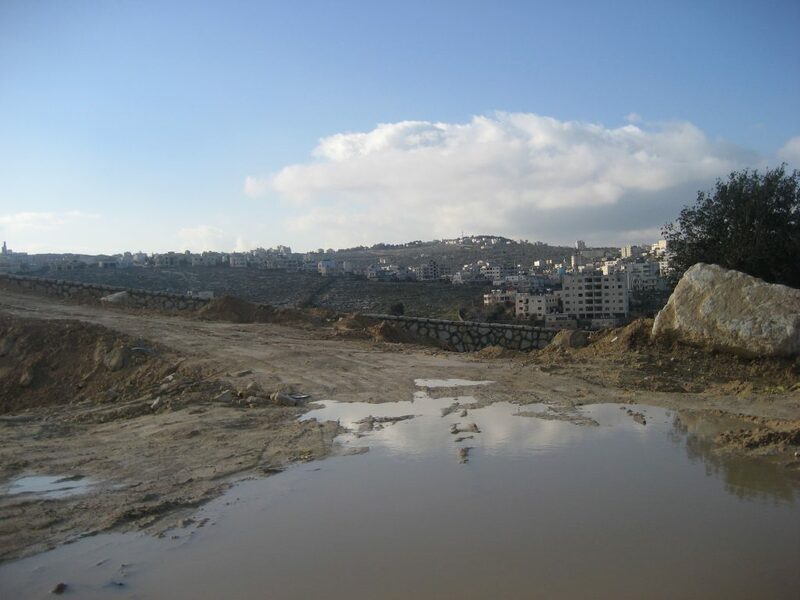 With the current restriction of movement within Palestine, most of the quarries are closed and the town has lost its main source of income. 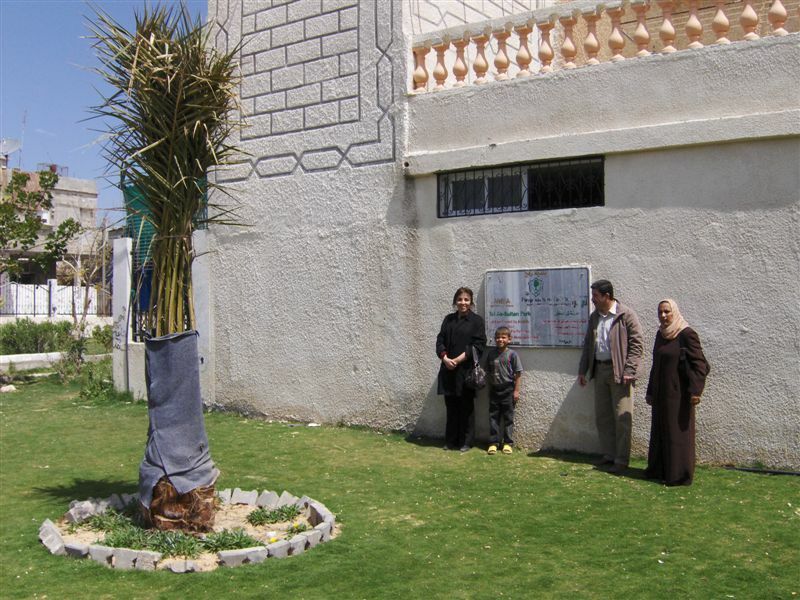 The donated municipality building is also the site of a disabled school. 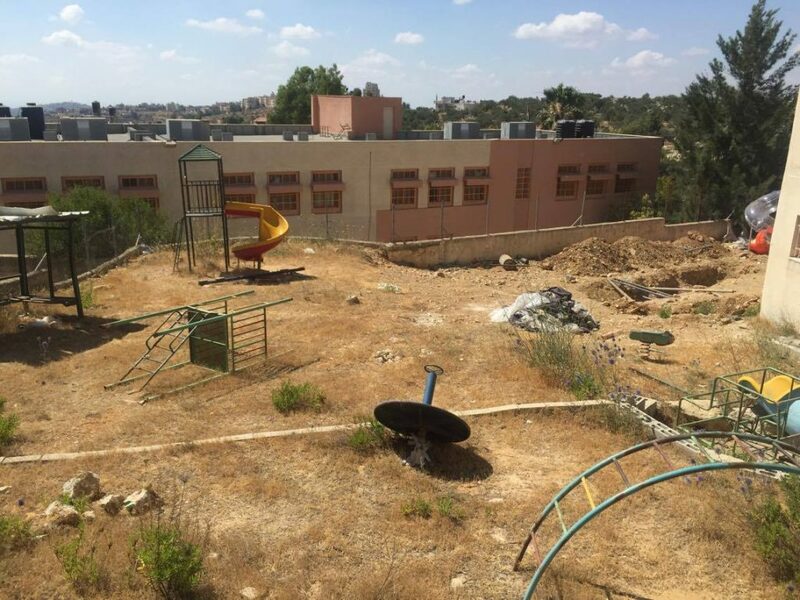 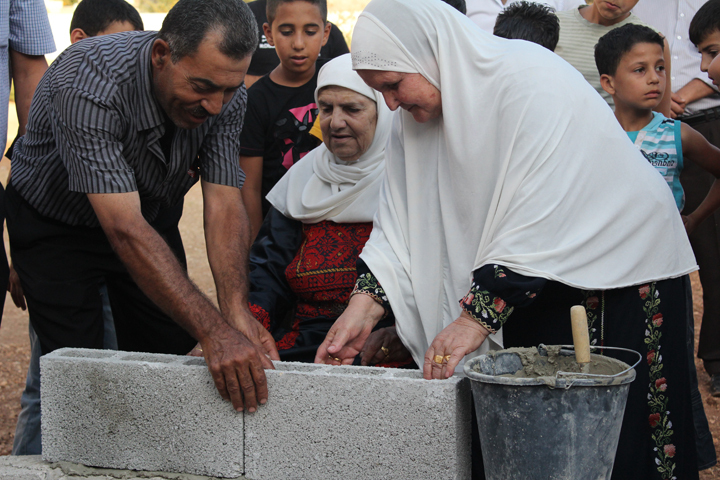 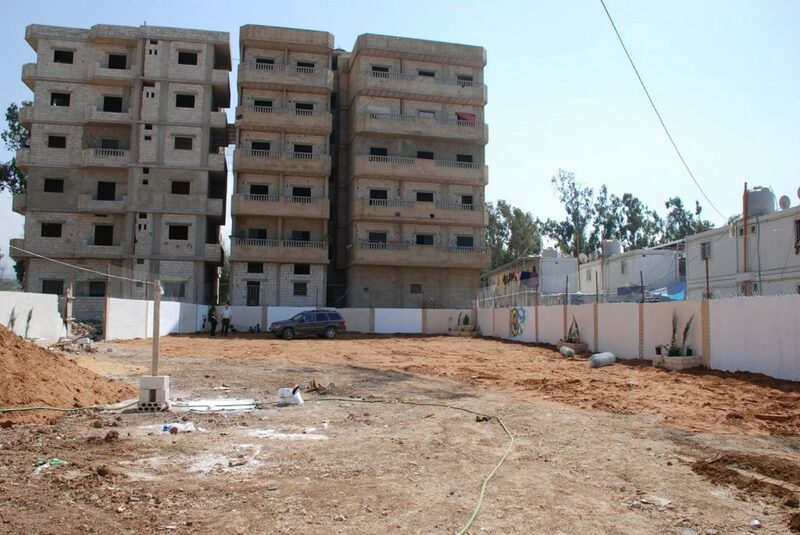 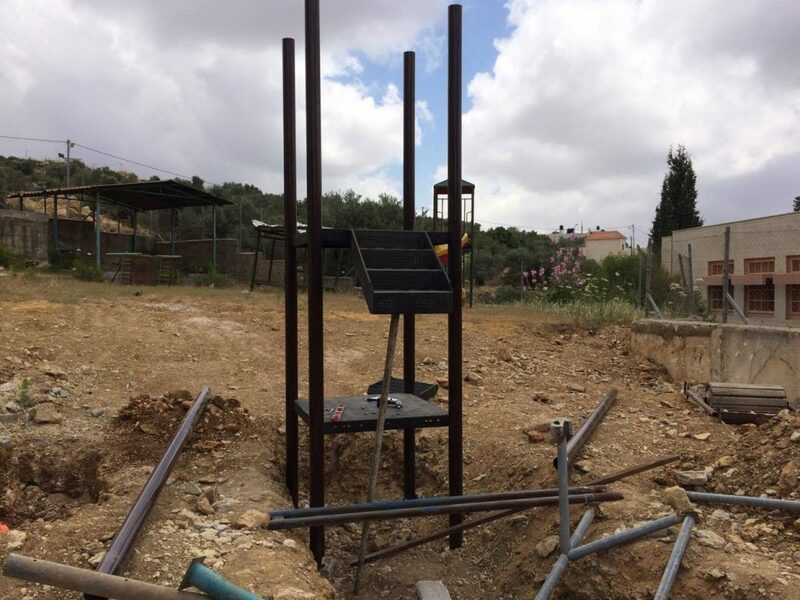 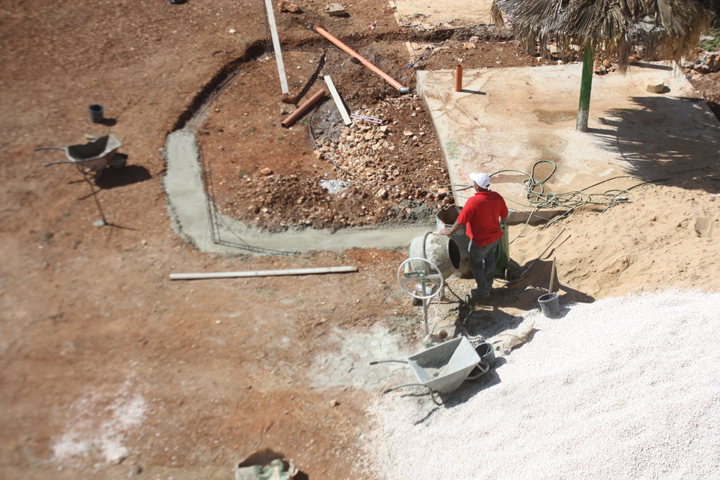 The playground/community space is behind this building and will serve the children of the disabled school as well as the town of Beit Fajjar. 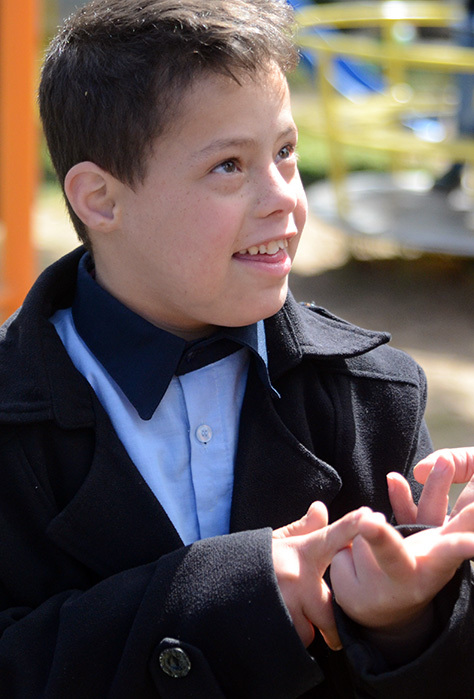 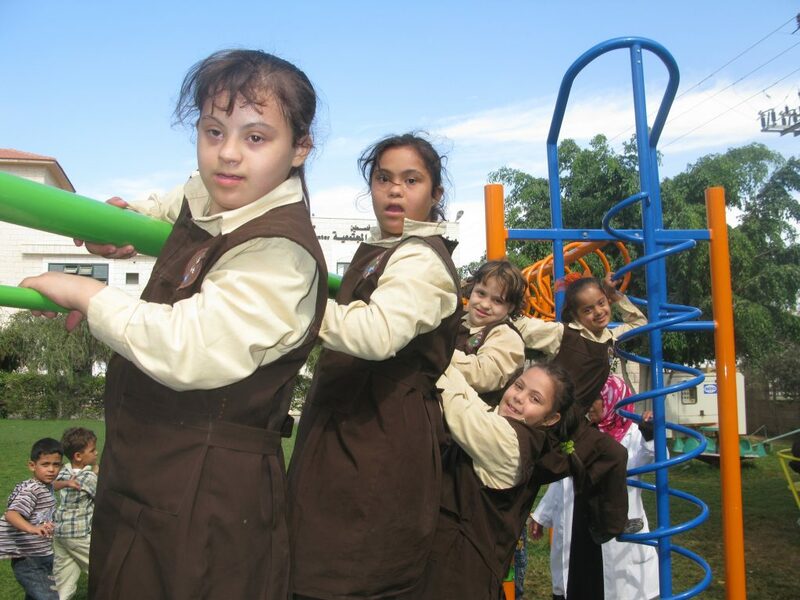 The center works with 40 children with mental and mobility disabilities ages 13-15 years. 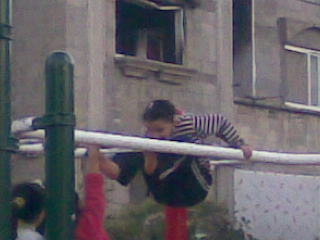 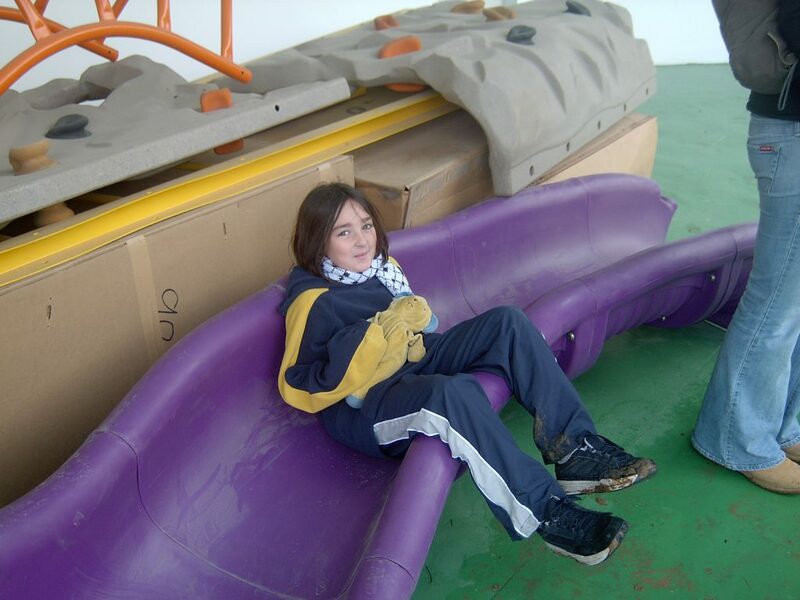 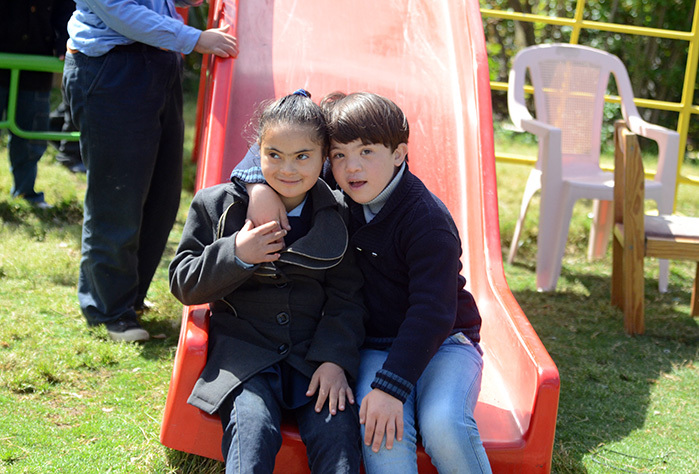 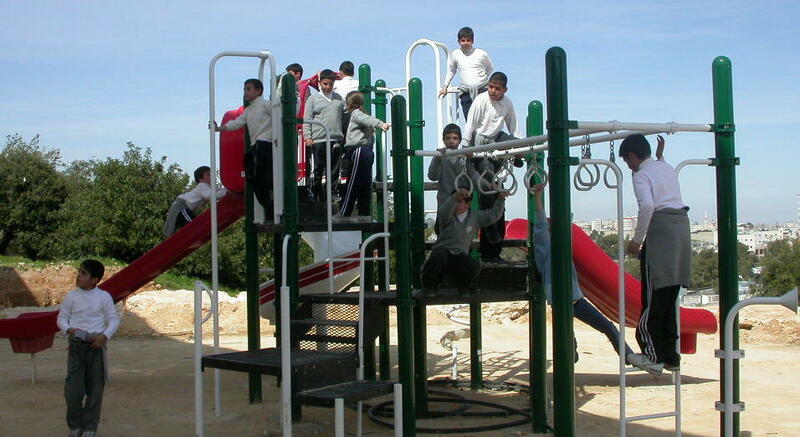 The playground was made accessible to facilitate activities for these children. 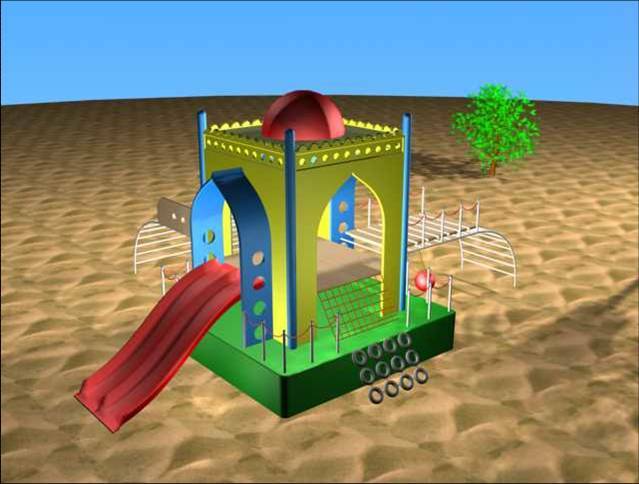 It includes an amphitheater, various climbing and crawling structures, slides, make believe areas, meeting spots, and more. 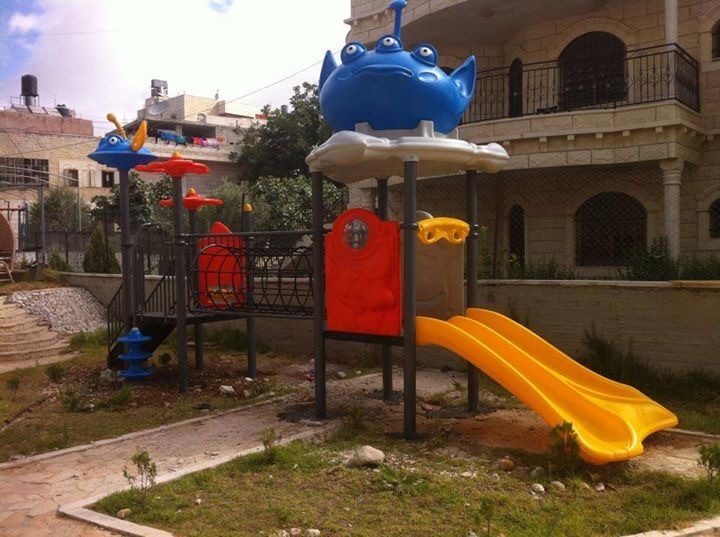 This playground is located in the Nablus District of Palestine. 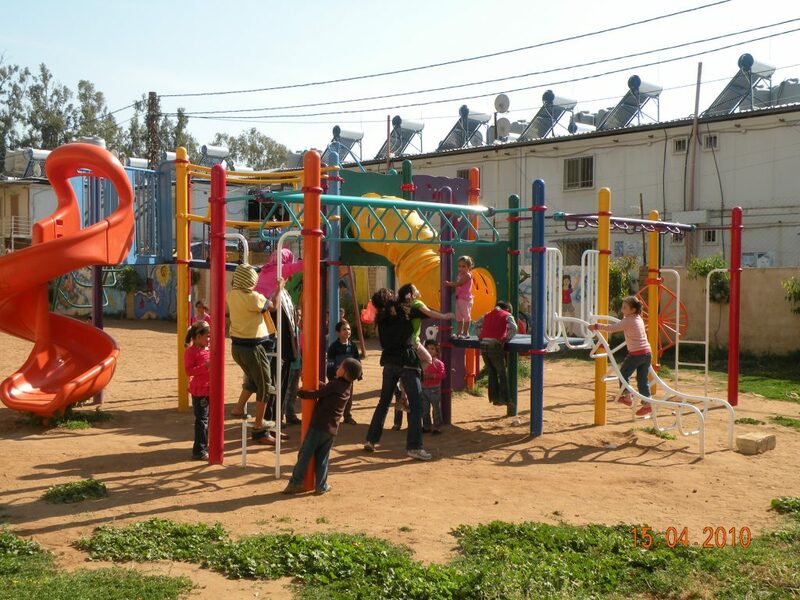 It is situated near a school and serves approximately 6,000 children from three intersecting villages. 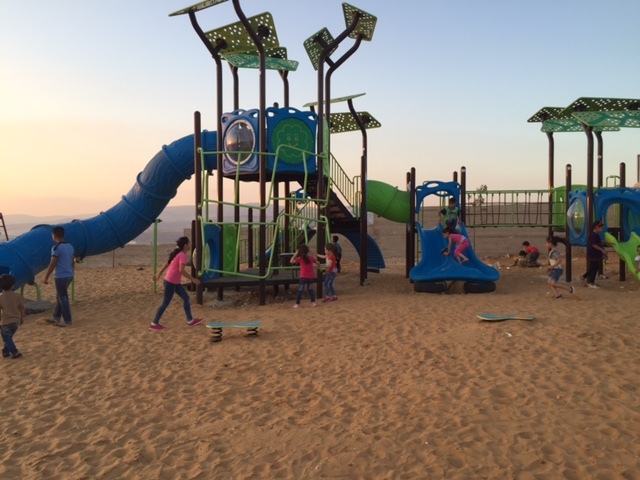 The Municipality of Asira Shamaliya, together with Dr. Mohammed Sawalha, are the gracious keepers of this park, which also boasts a skate park. 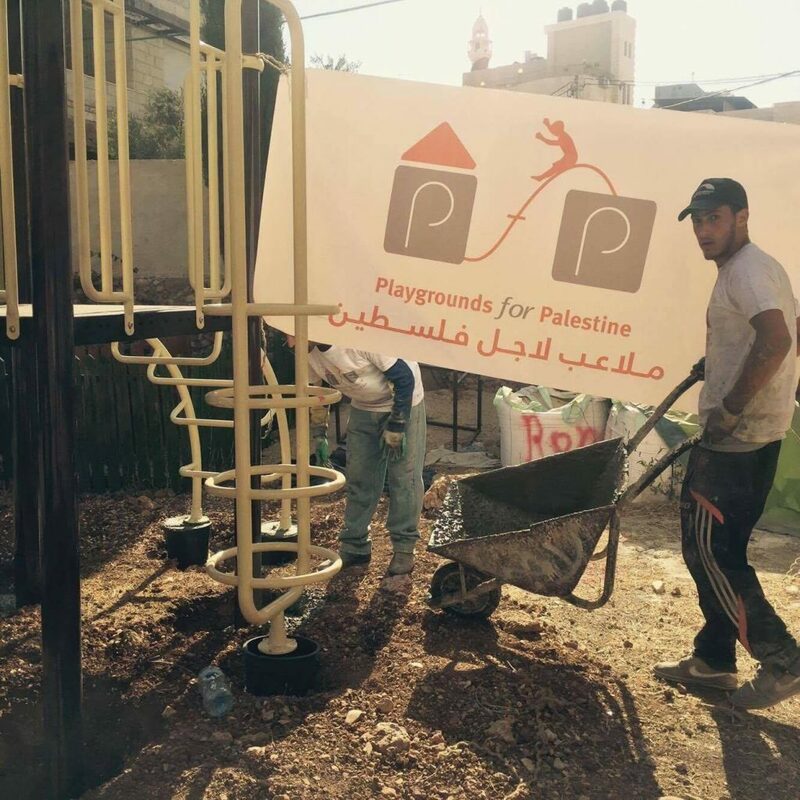 In addition to building the playground, PfP sponsors youth workshops to encourage environmental awareness and volunteerism. 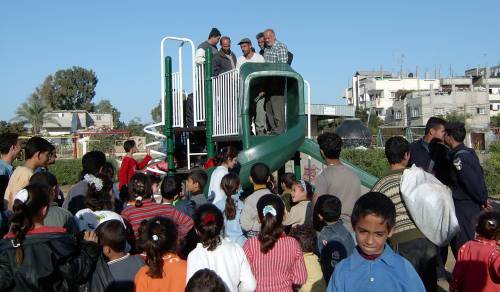 Budrus is a village of about 1500 people. 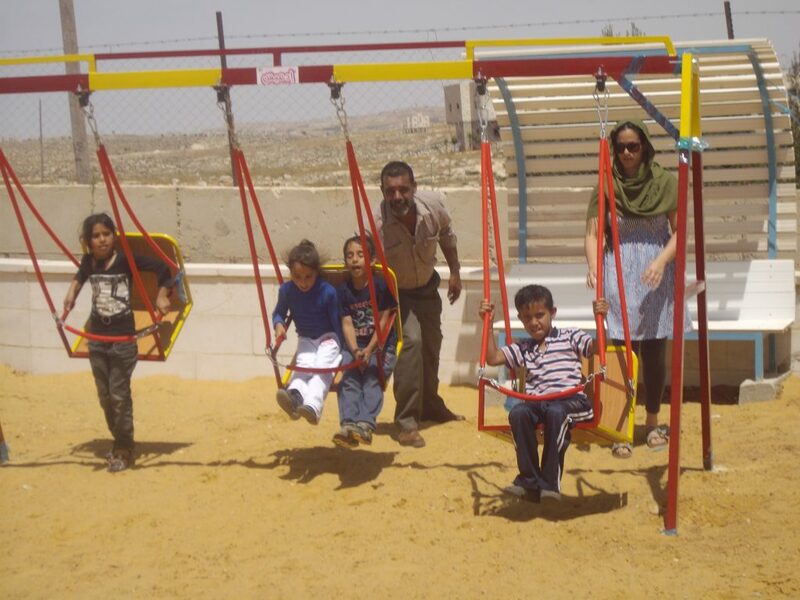 They have a UN school with a single set of swings for use by the kindergarten children. 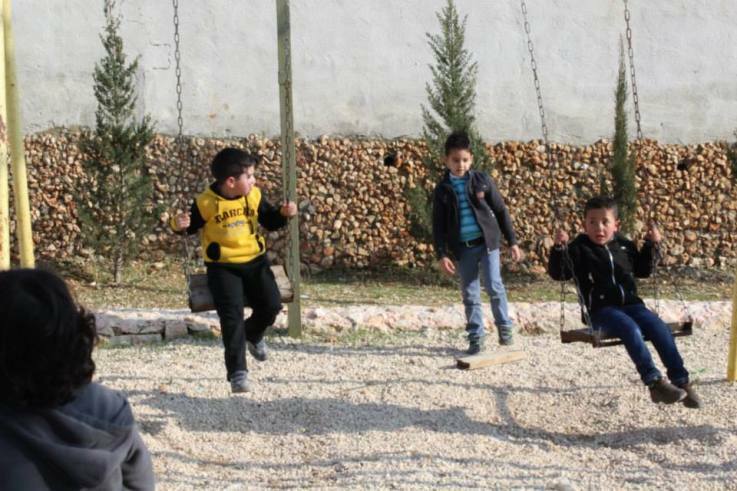 The children of Budrus spend most of their days inside or playing on the streets. 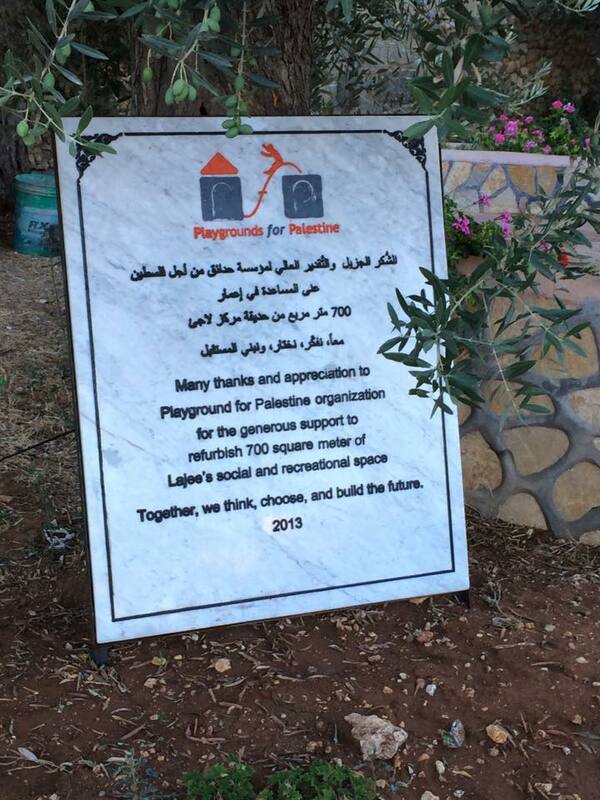 Funds for this playground were raised by the “Midsummer Night’s Dream” team- they held an ultimate frisbee tournament and an auction and raised over $8000 for this site. 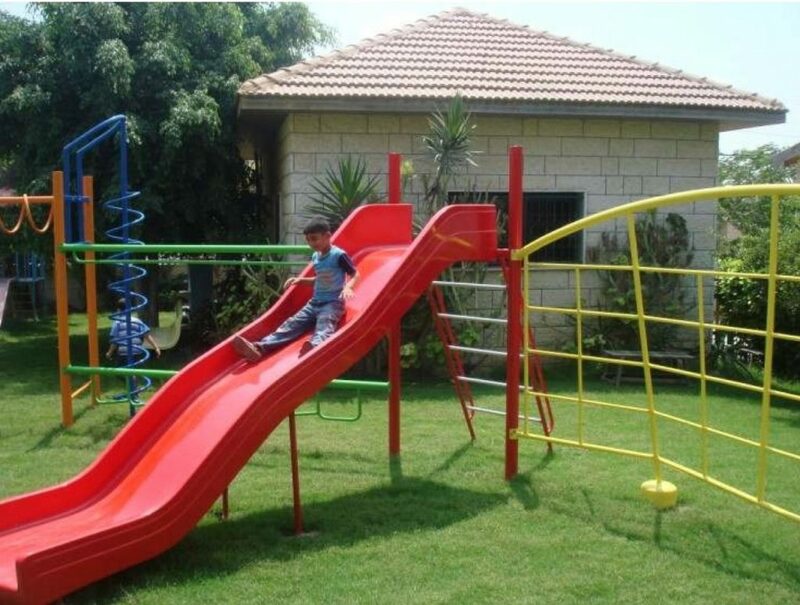 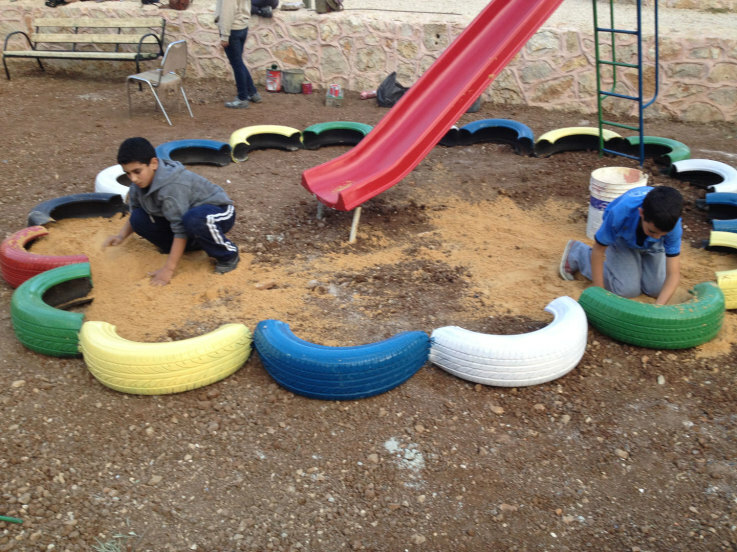 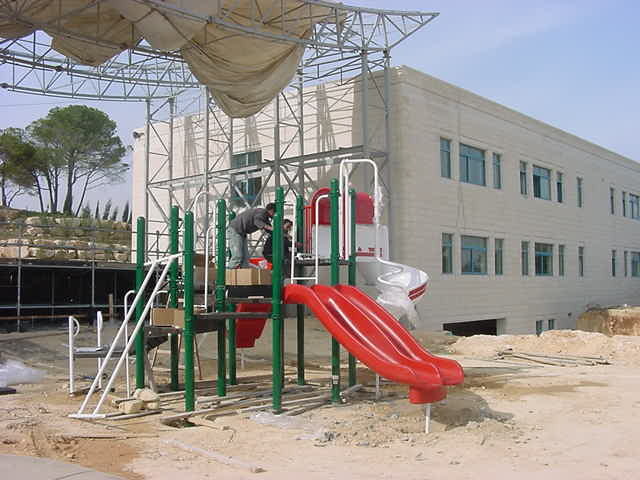 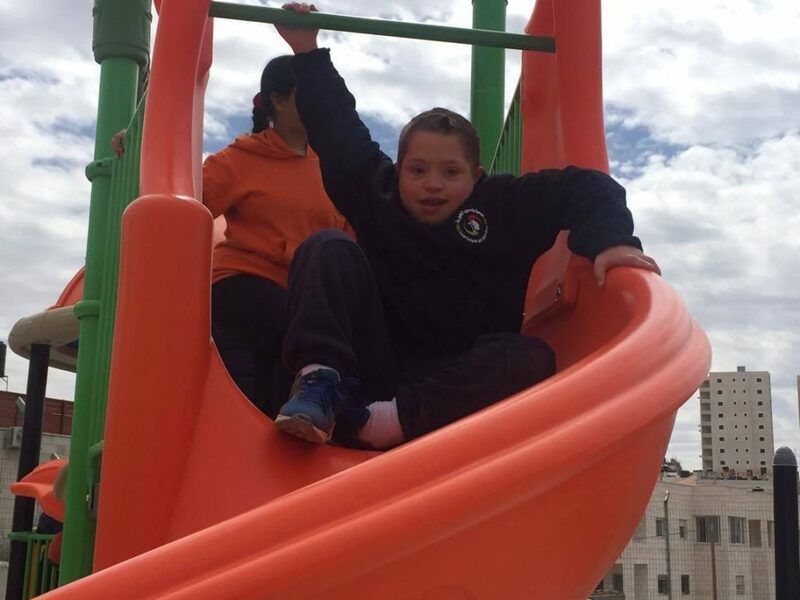 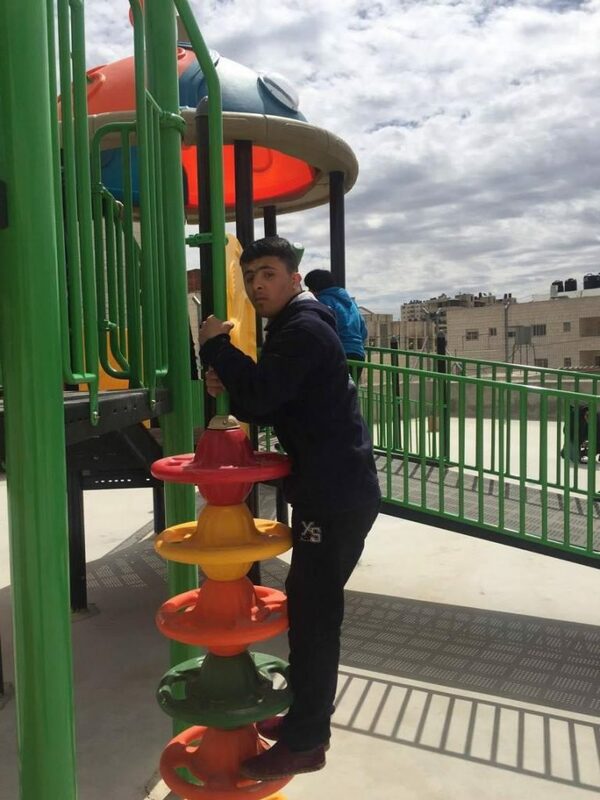 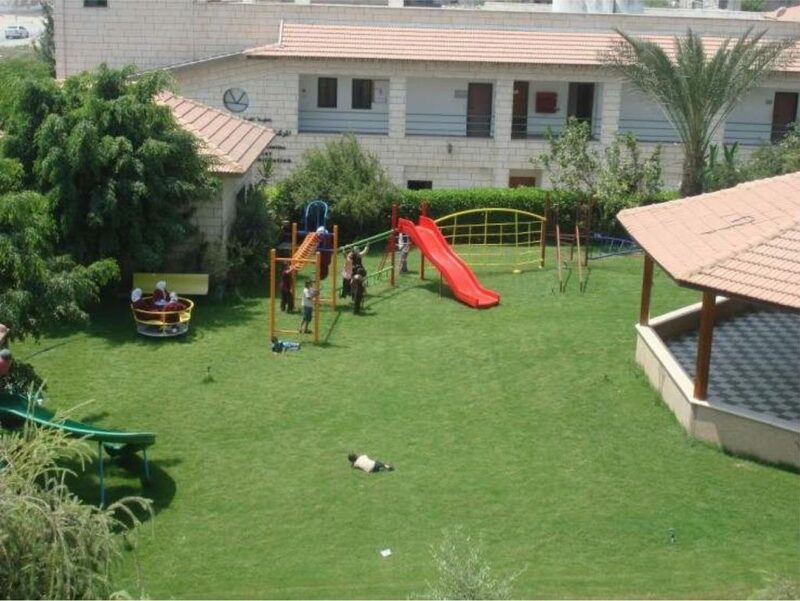 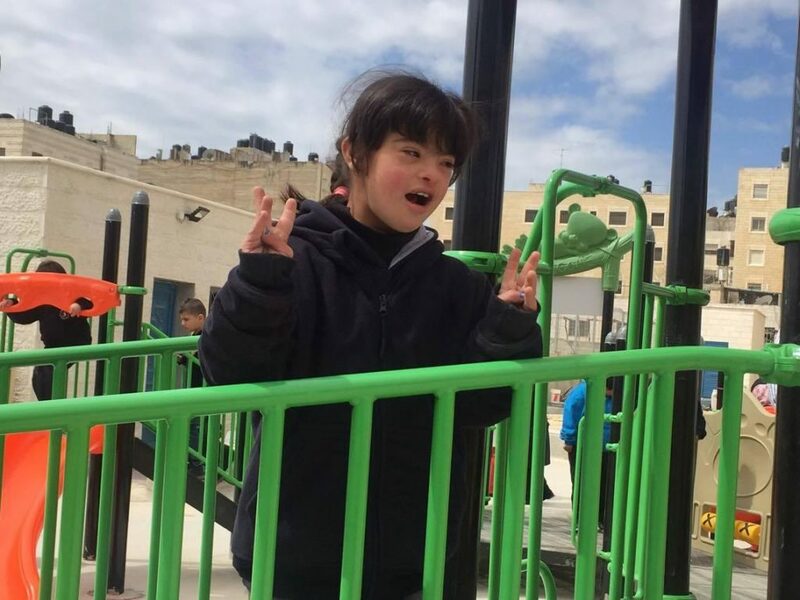 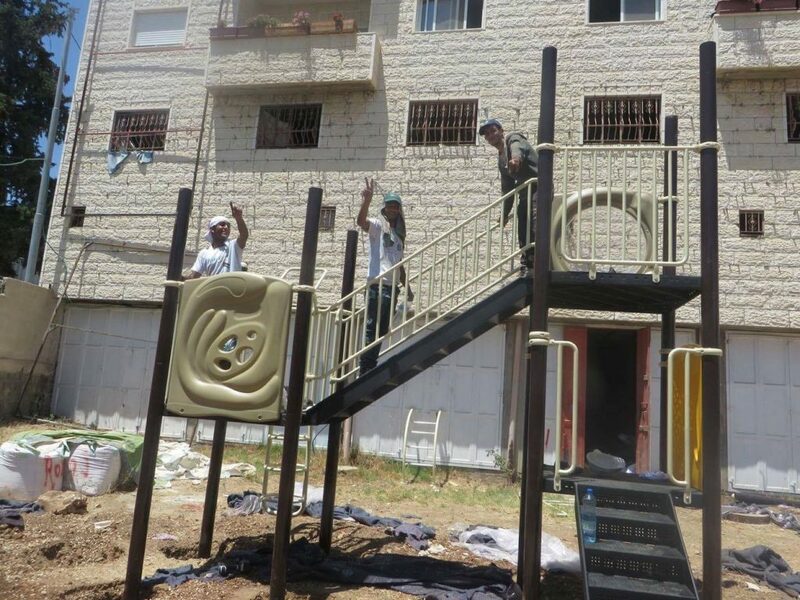 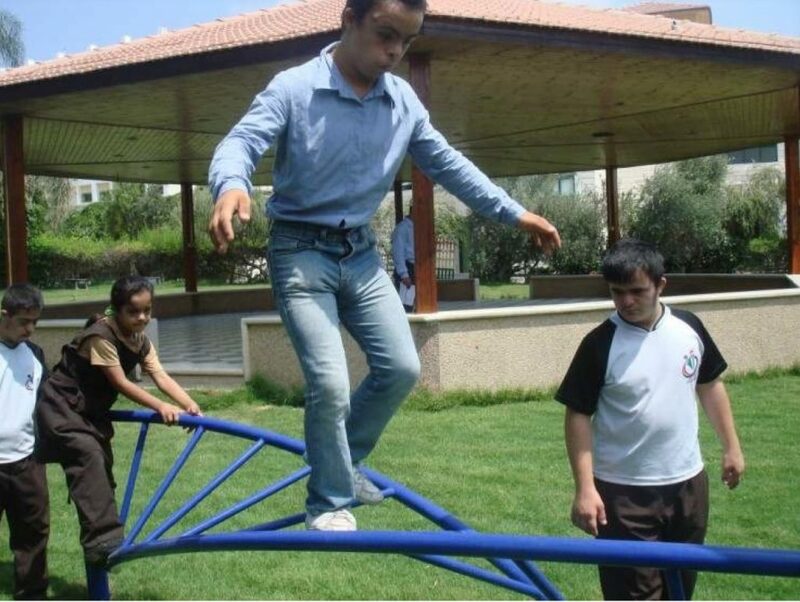 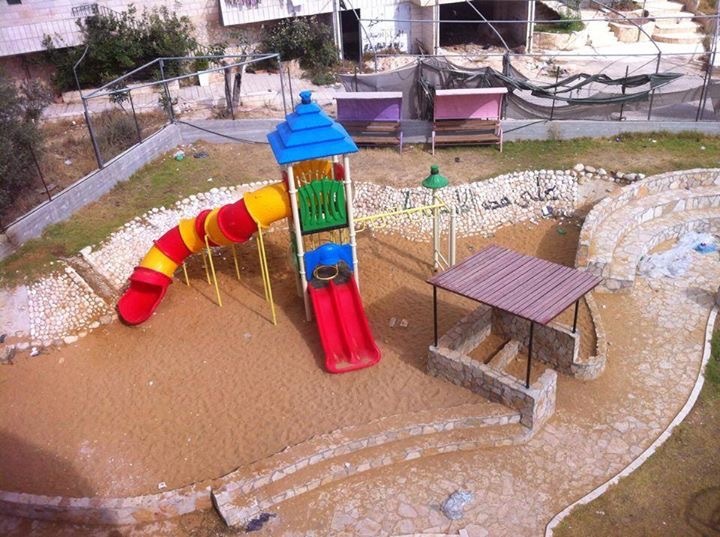 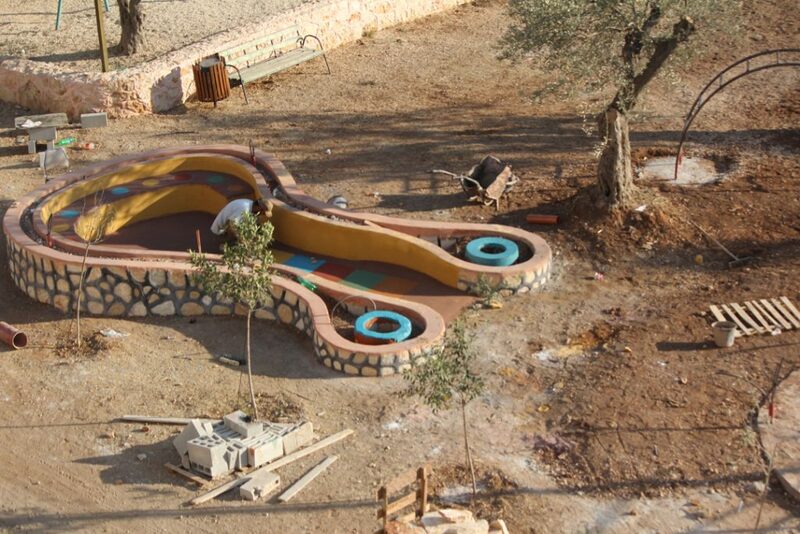 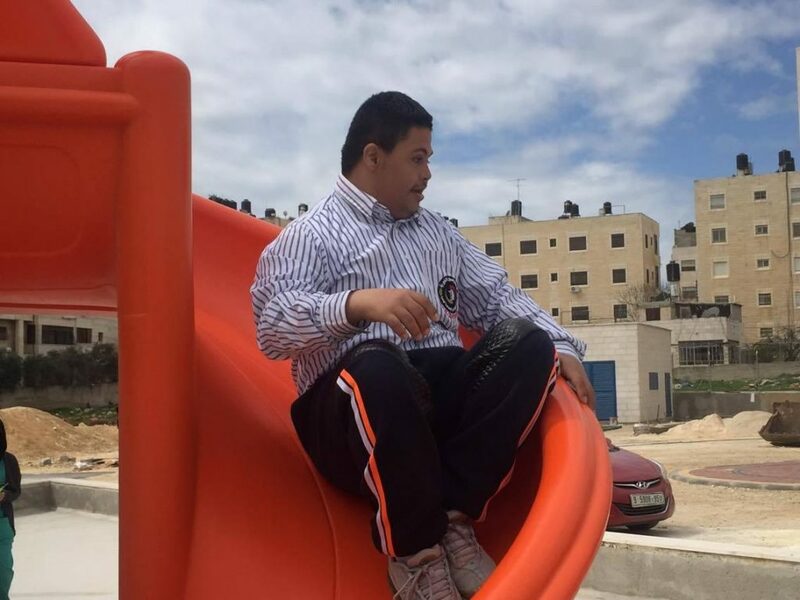 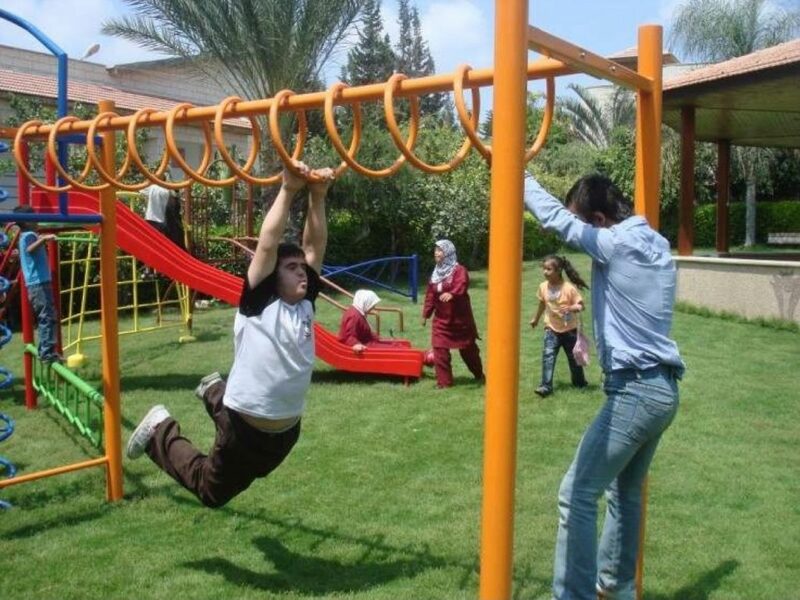 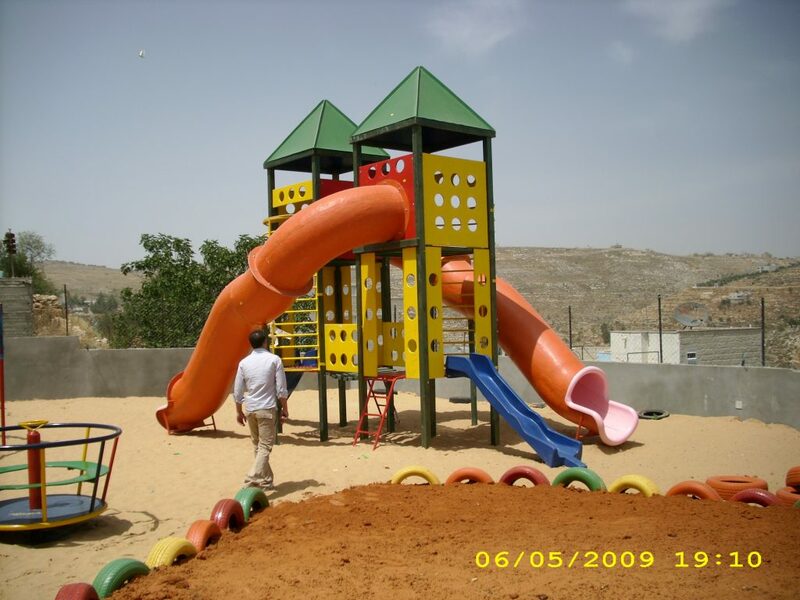 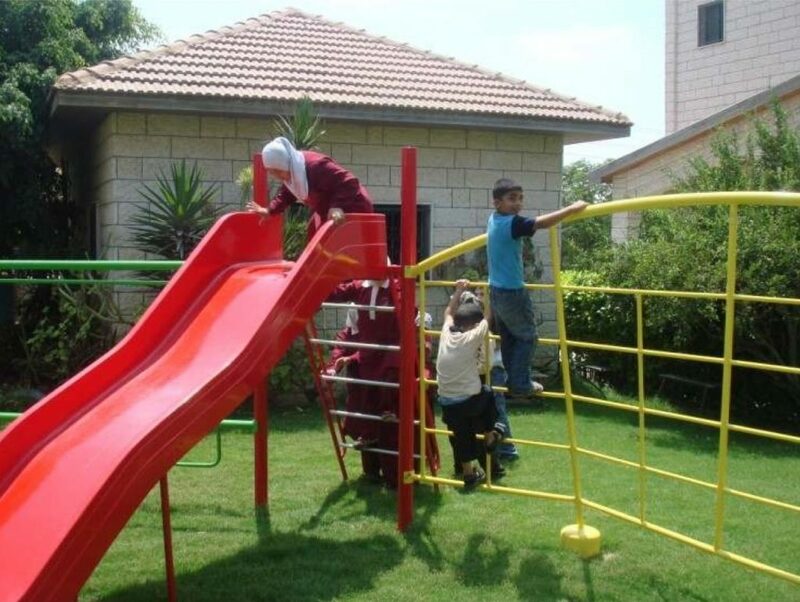 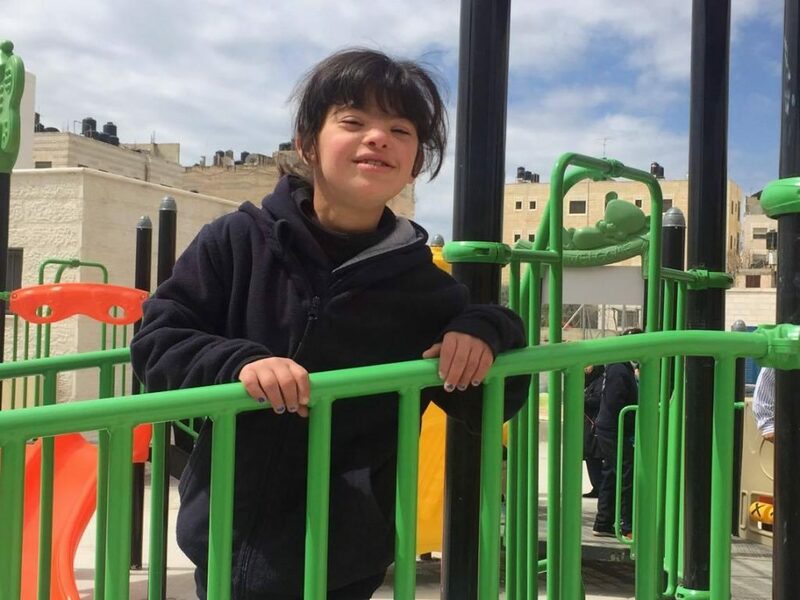 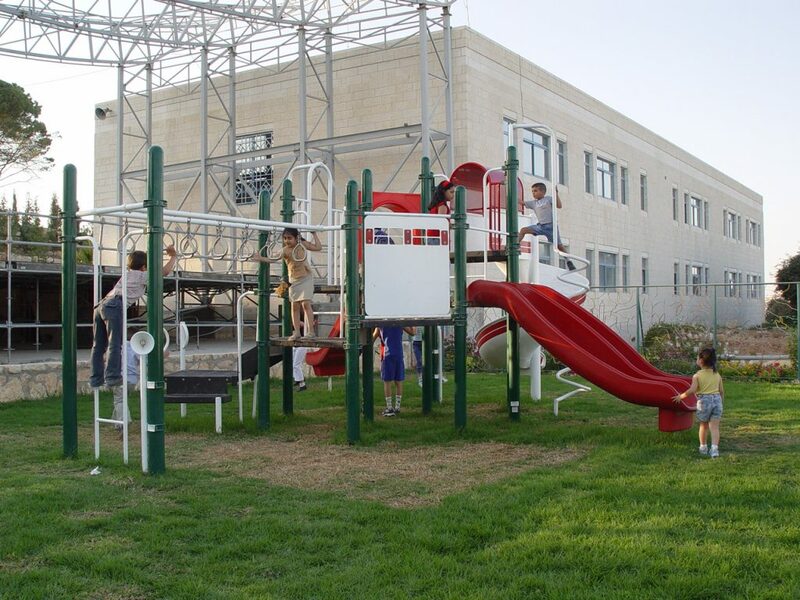 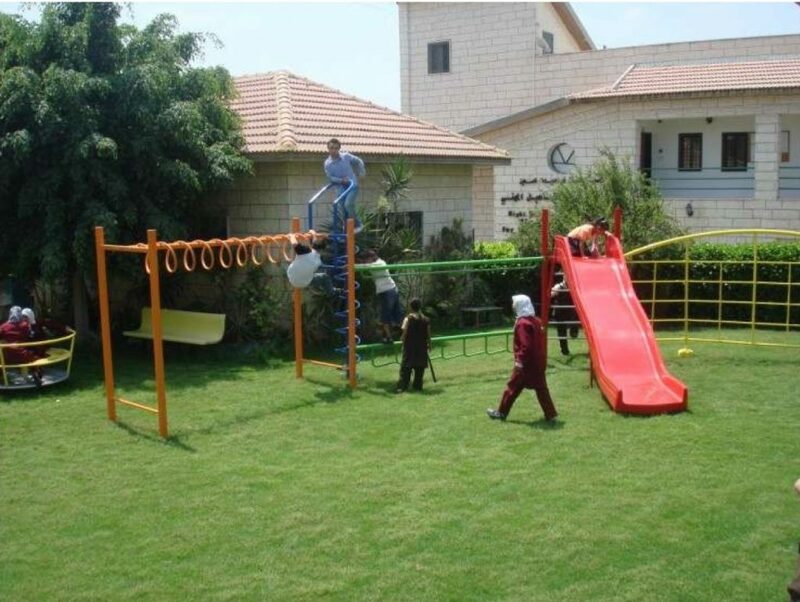 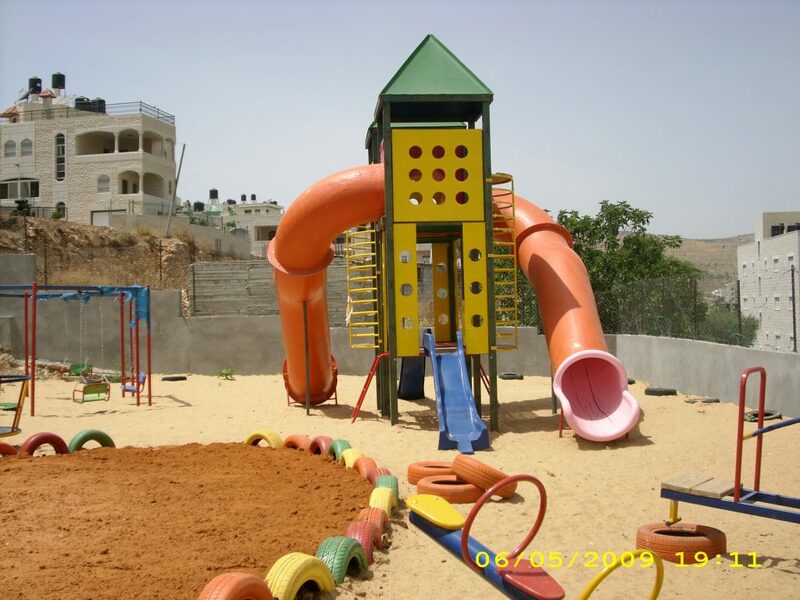 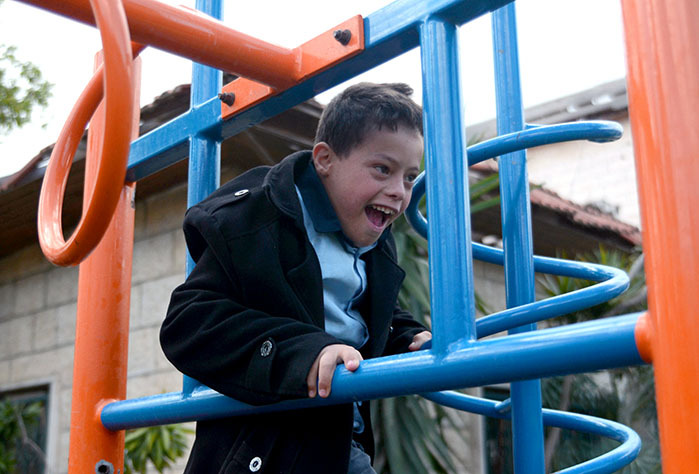 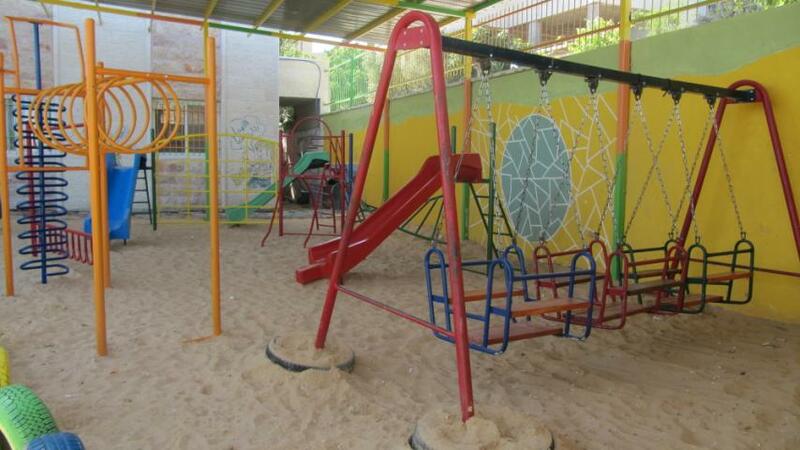 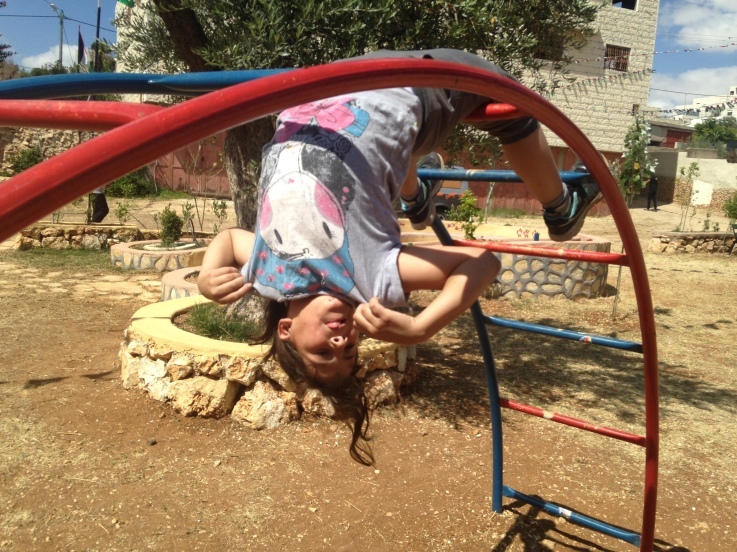 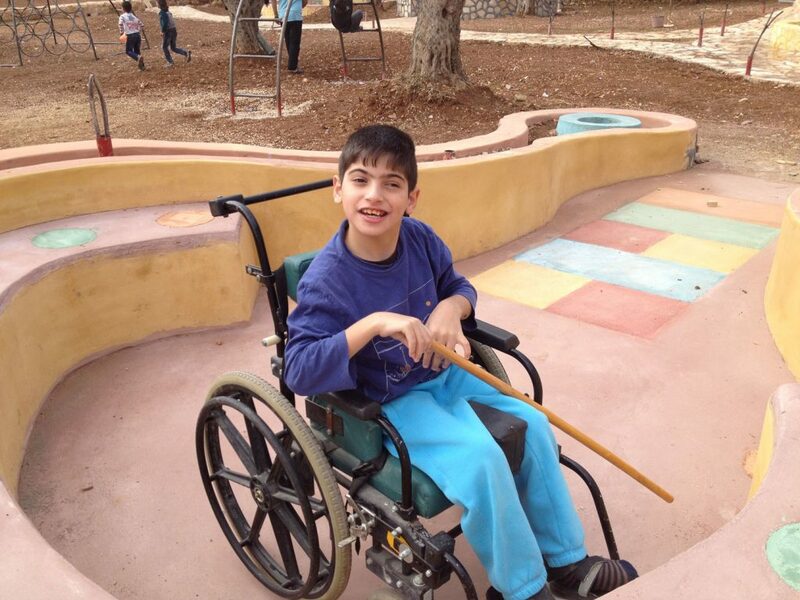 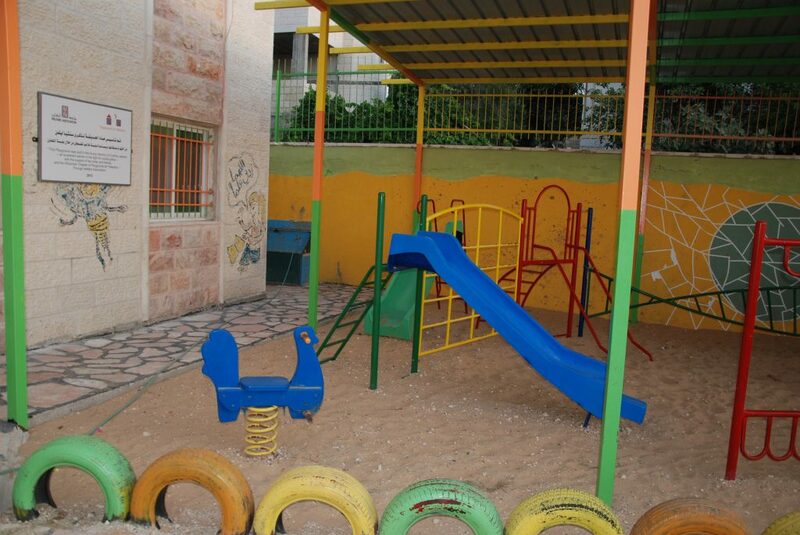 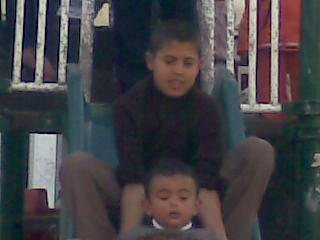 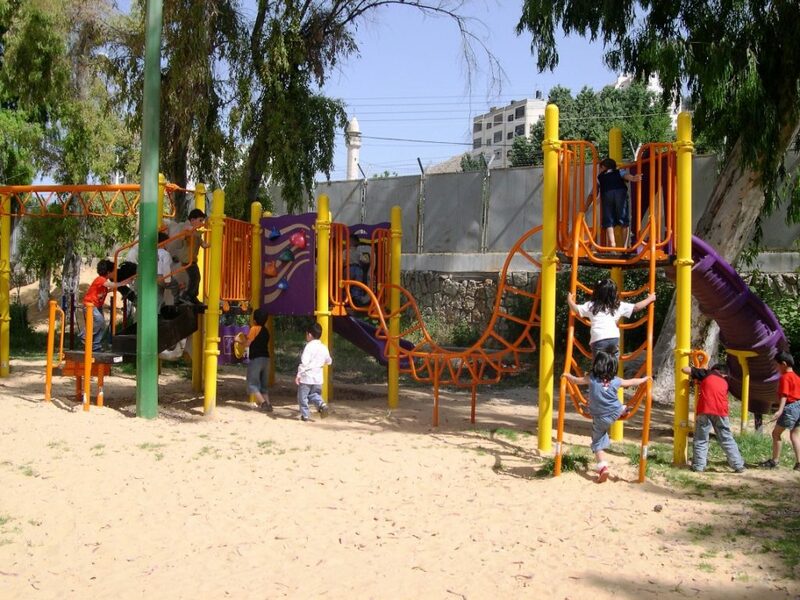 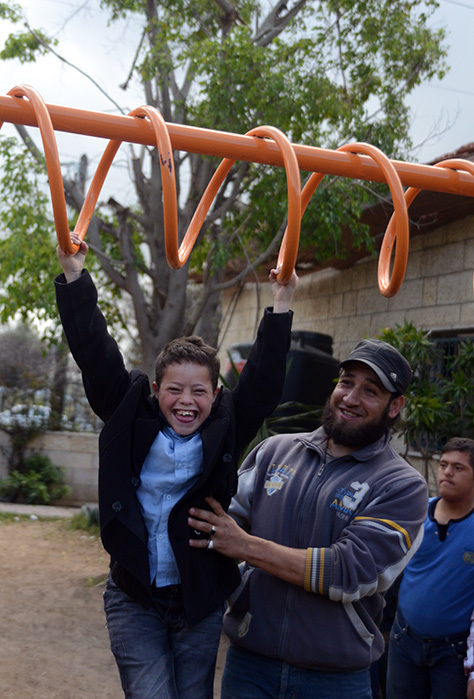 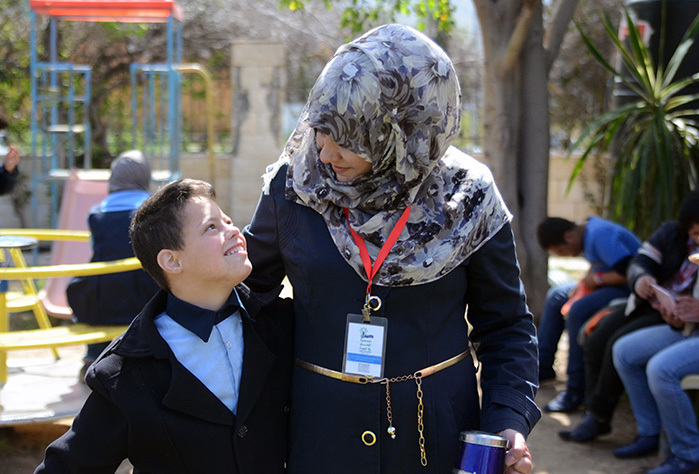 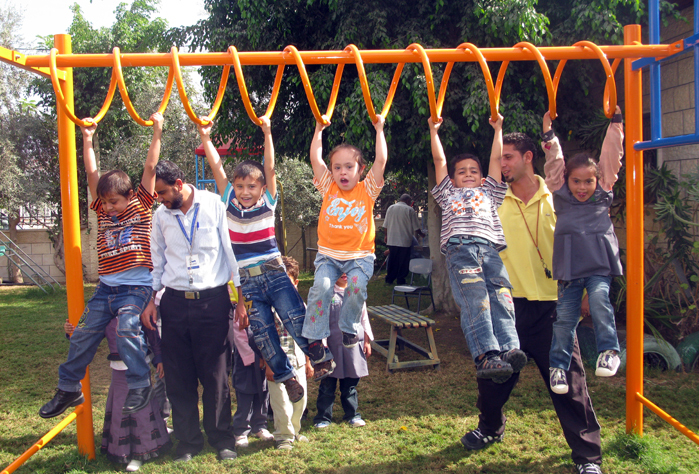 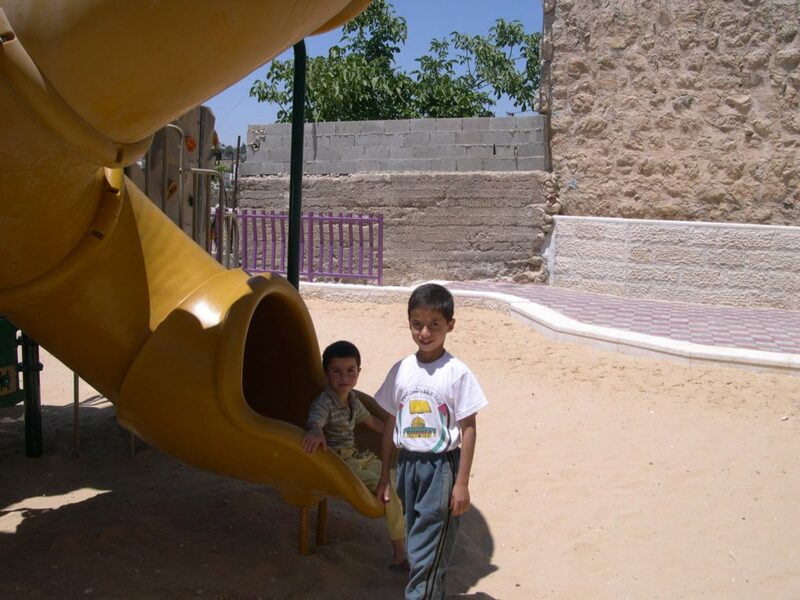 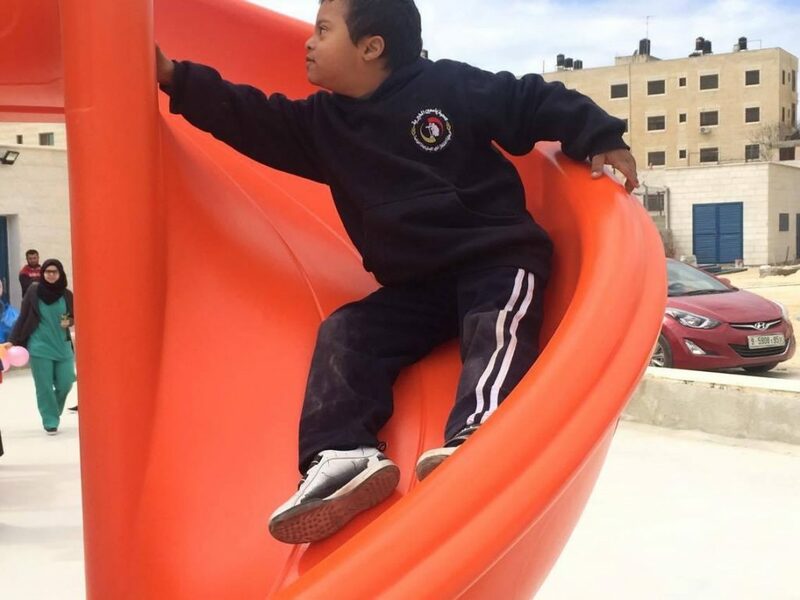 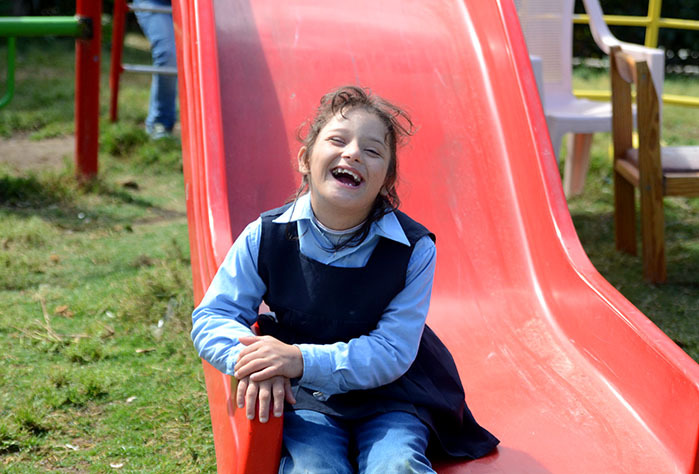 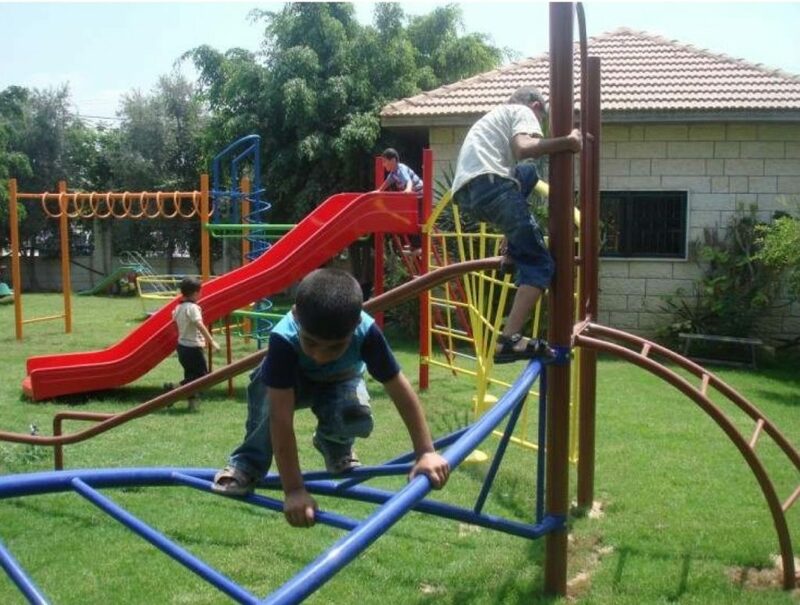 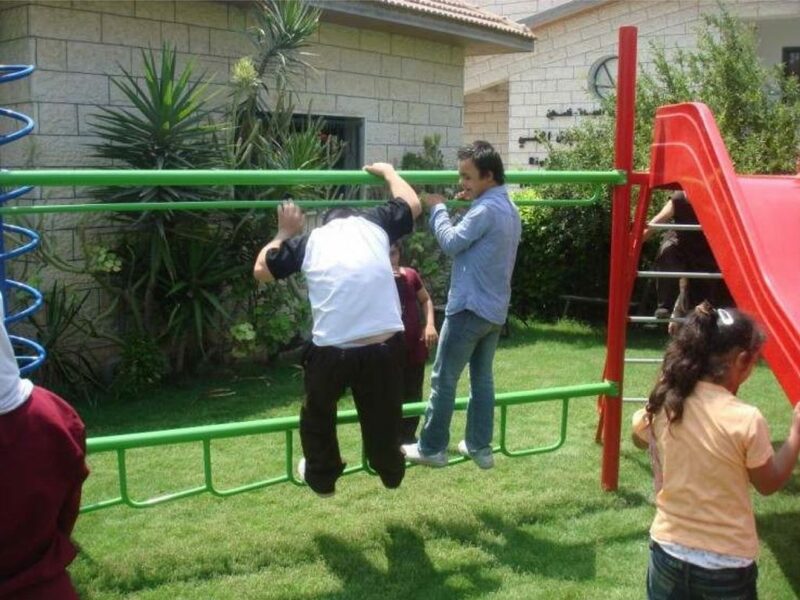 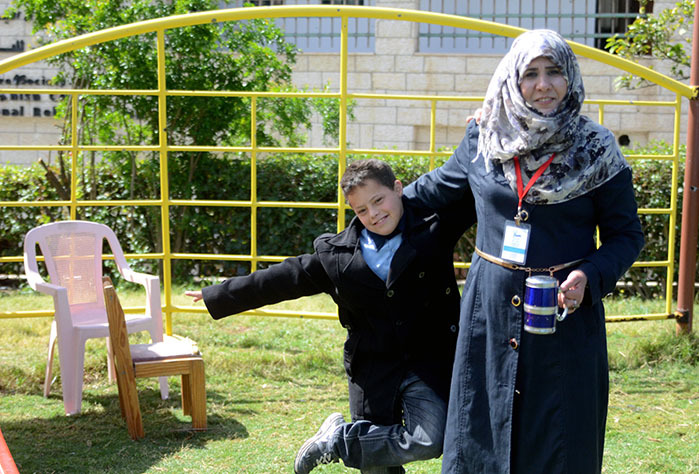 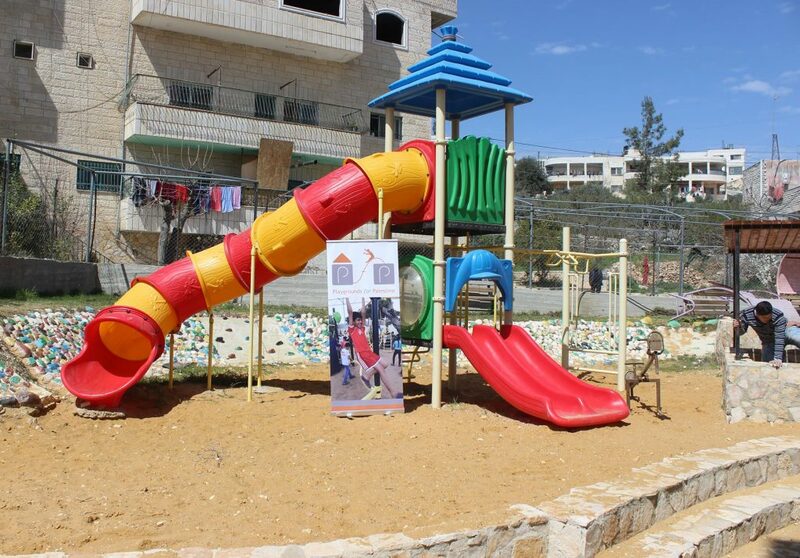 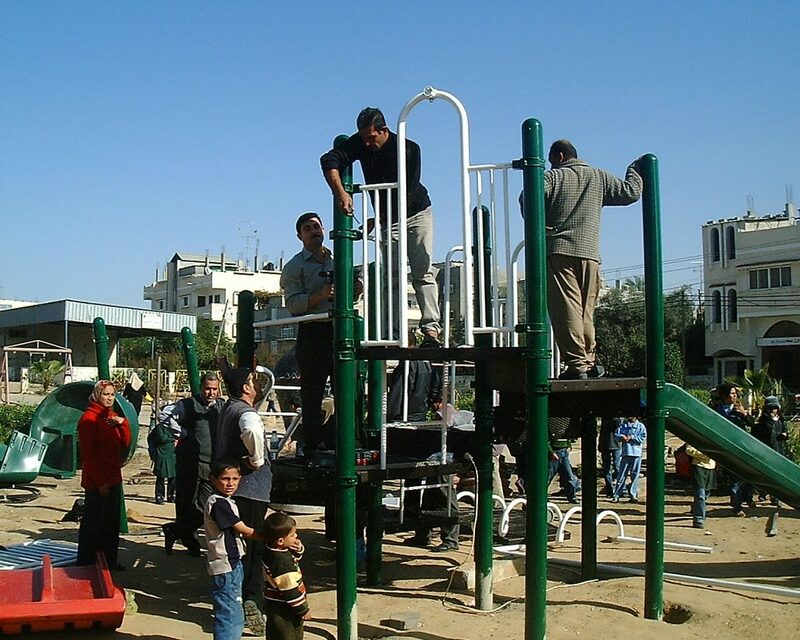 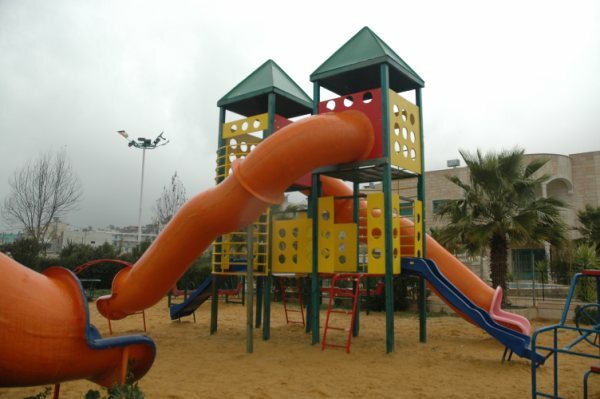 This playground was built at the Right to Life Society, which serves Palestinian children with Down Syndrome and Autism. 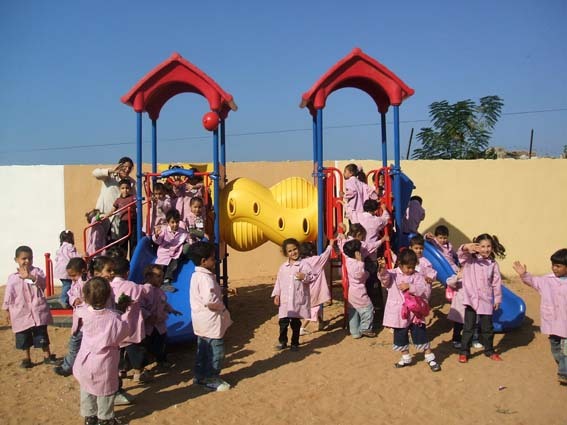 Established in 1993, this non-profit helps to nurture these children to live as productive members of society. 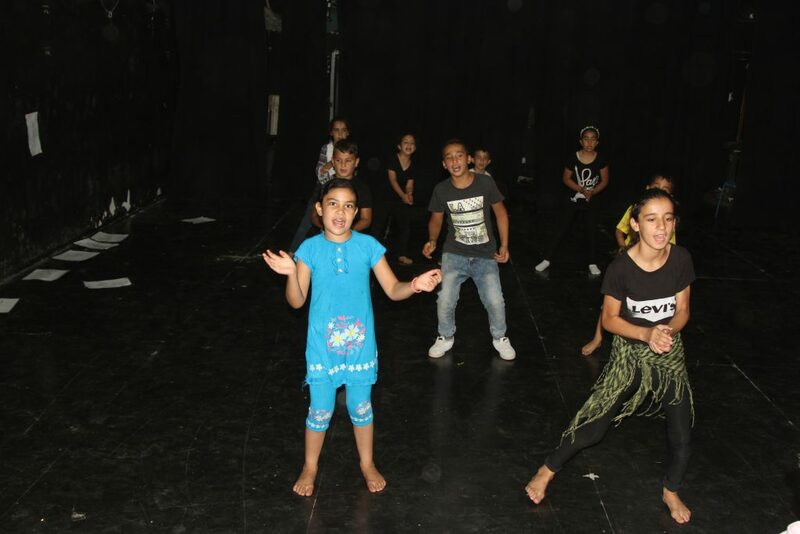 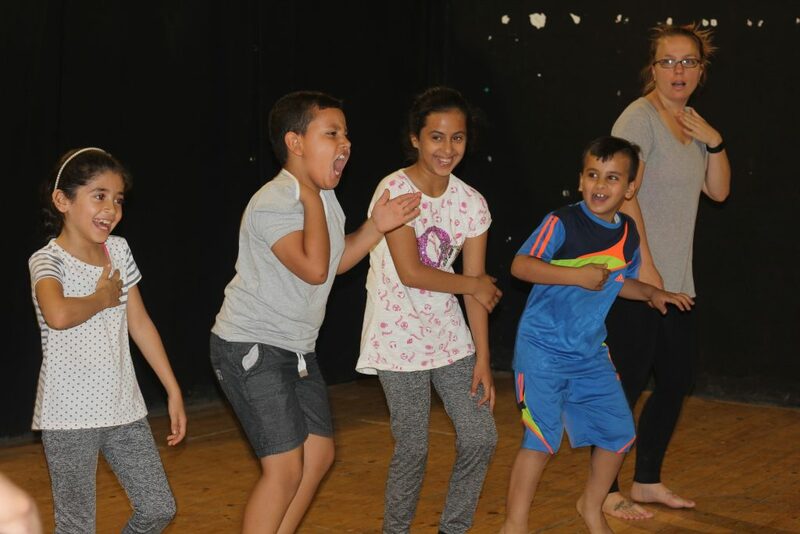 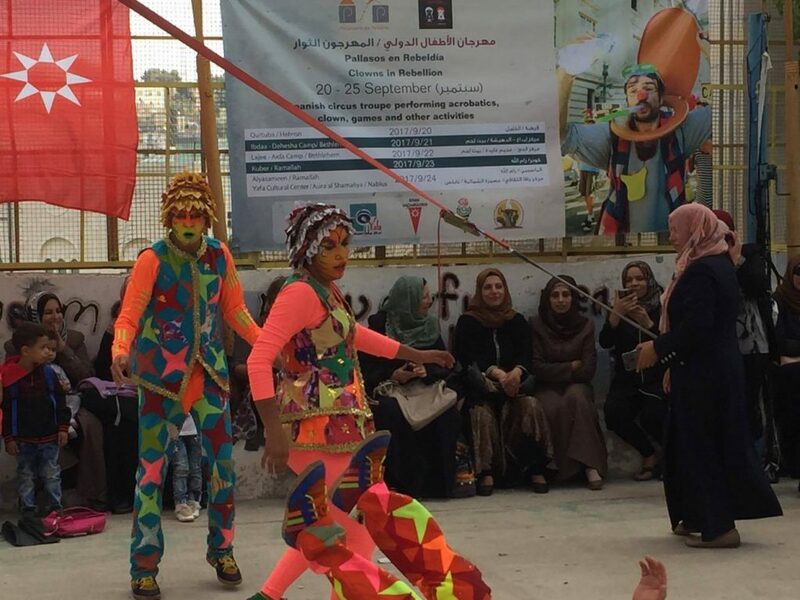 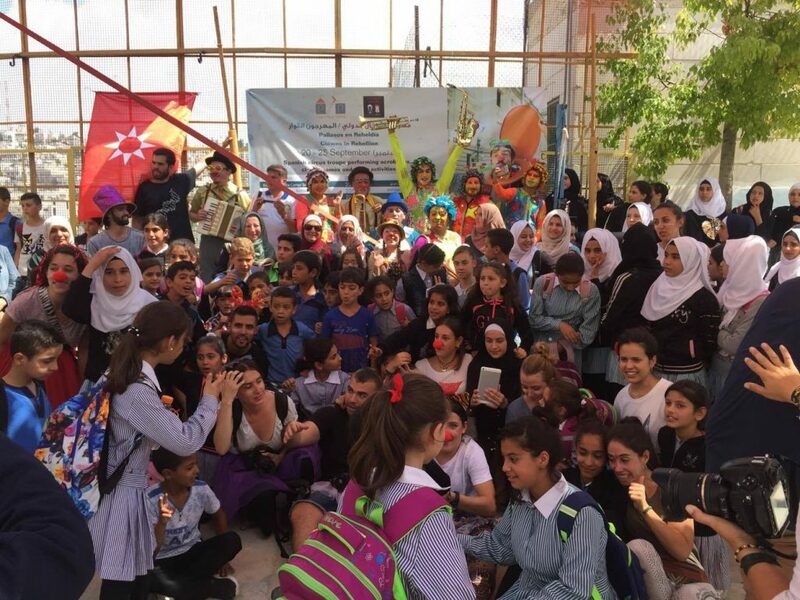 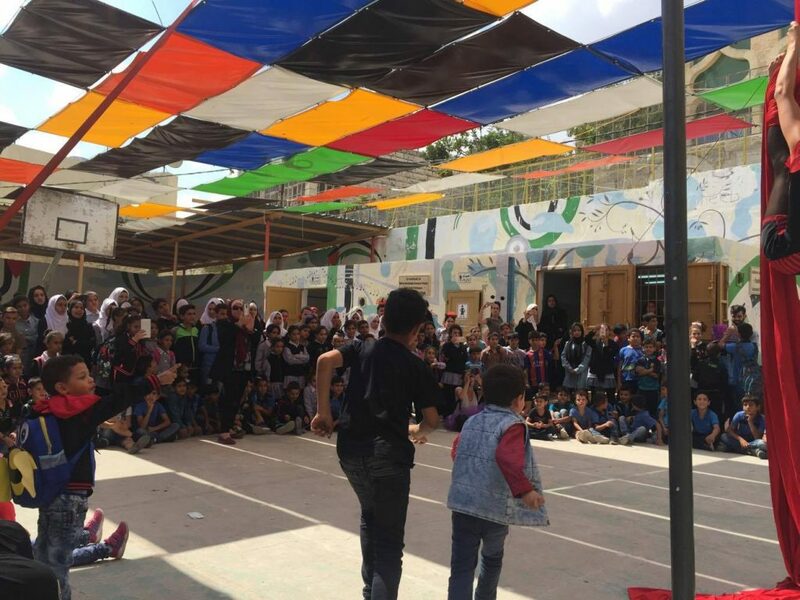 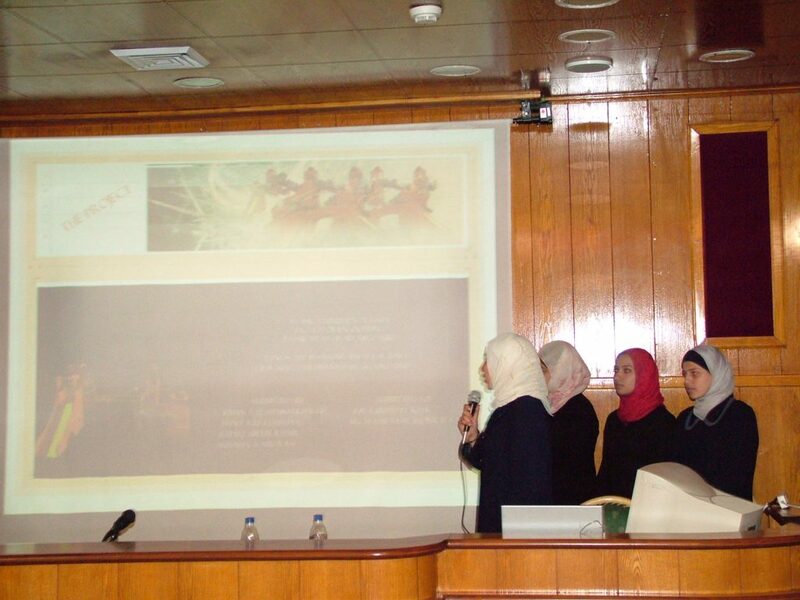 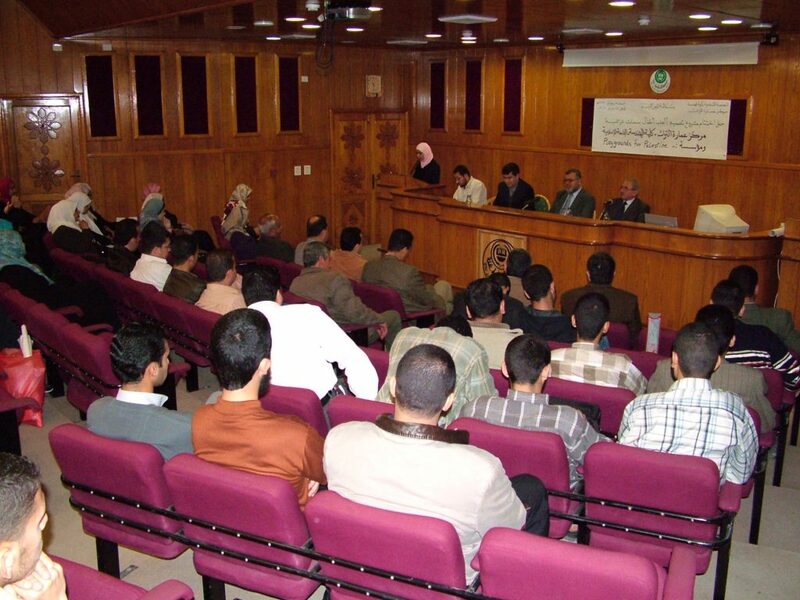 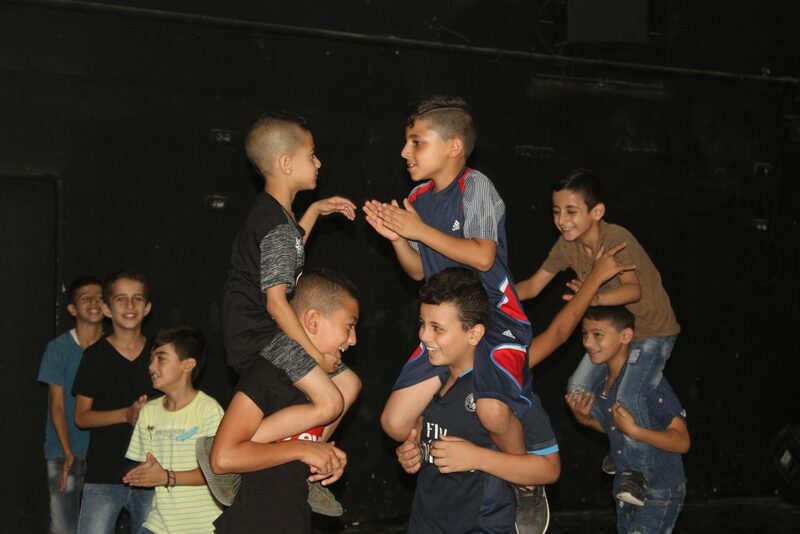 Through dance classes, arts and crafts, carpentry, and more, the Society aims to help these citizens of Gaza and to raise awareness throughout the region about what their graduates can contribute to their communities. 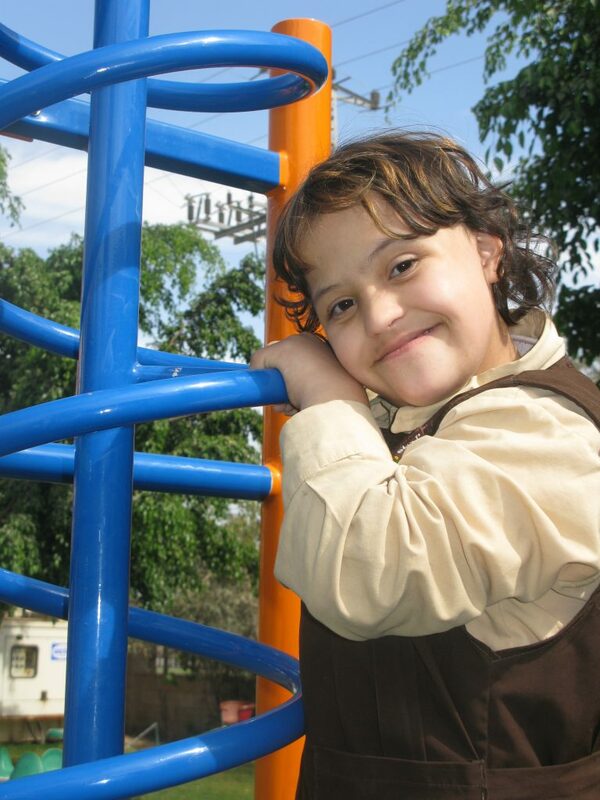 Having a safe, outdoor place to play is extremely important for children with Autism and Downs Syndrome. 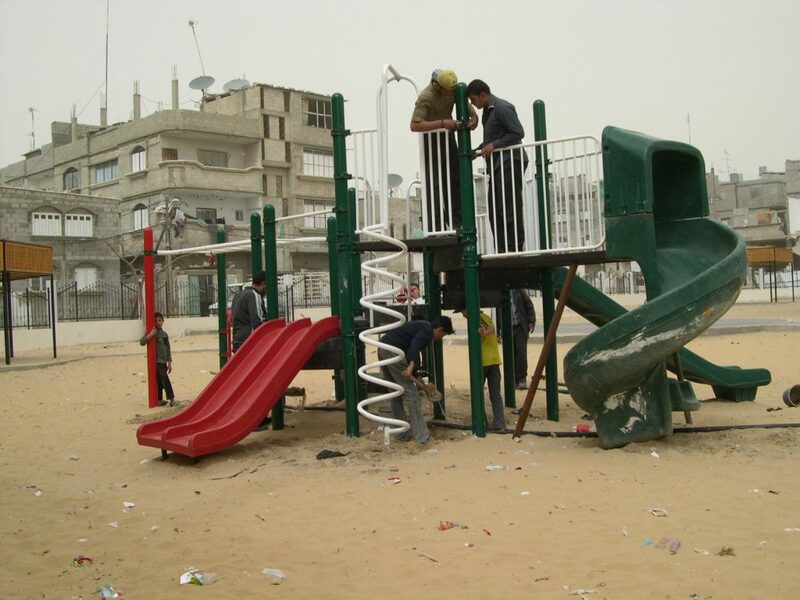 This playground, like most others in Gaza was constructed locally with raw materials that came from recycled metals available inside of Gaza. 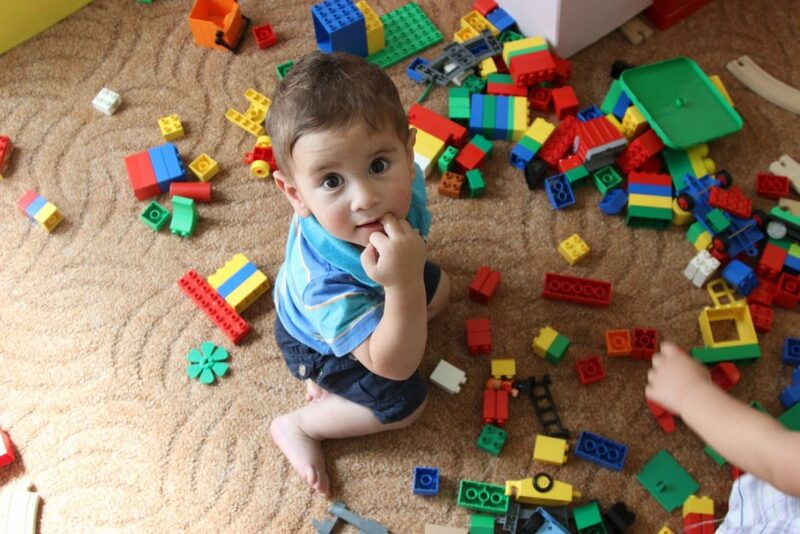 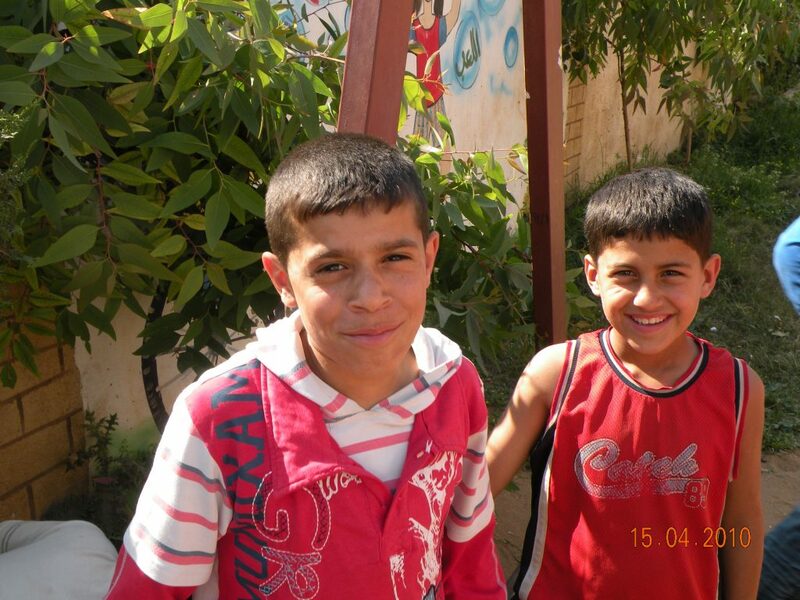 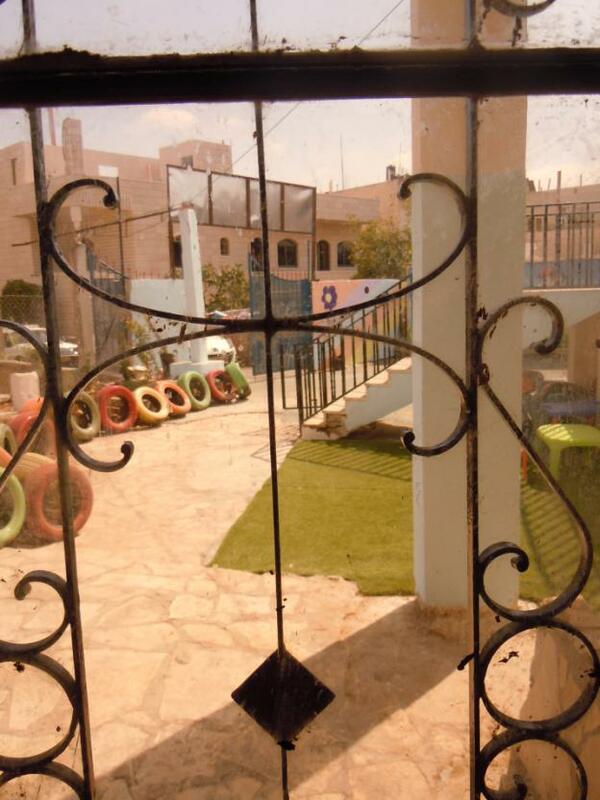 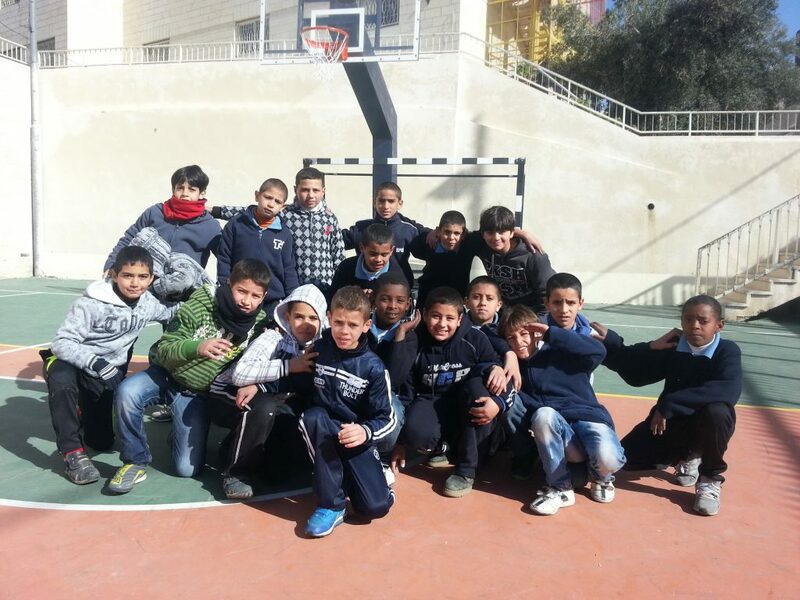 Jeel Al Amal is a boy’s home accommodating 100 orphan Palestinian boys. 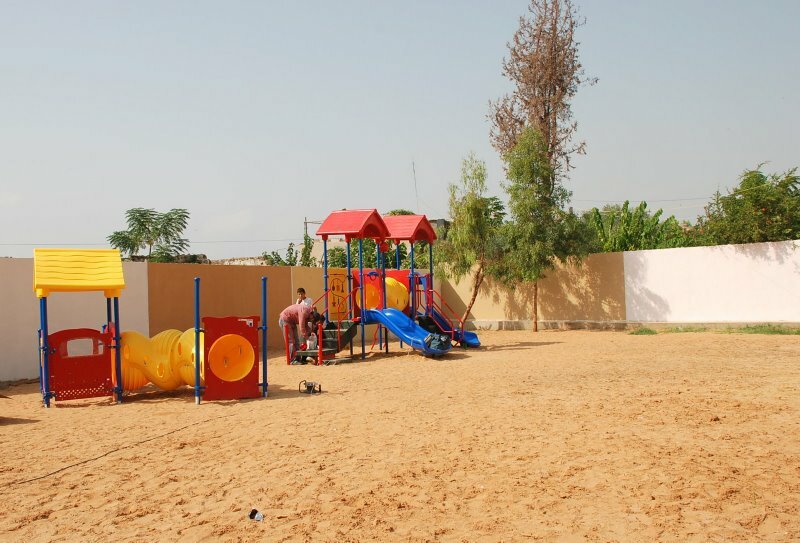 They are educated at Jeel Al Amal primary co-ed school together with 250 girls. 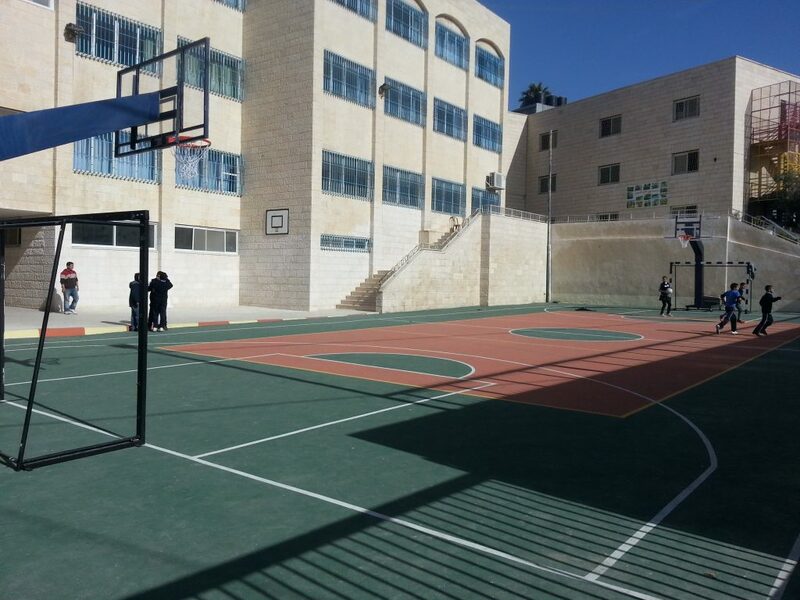 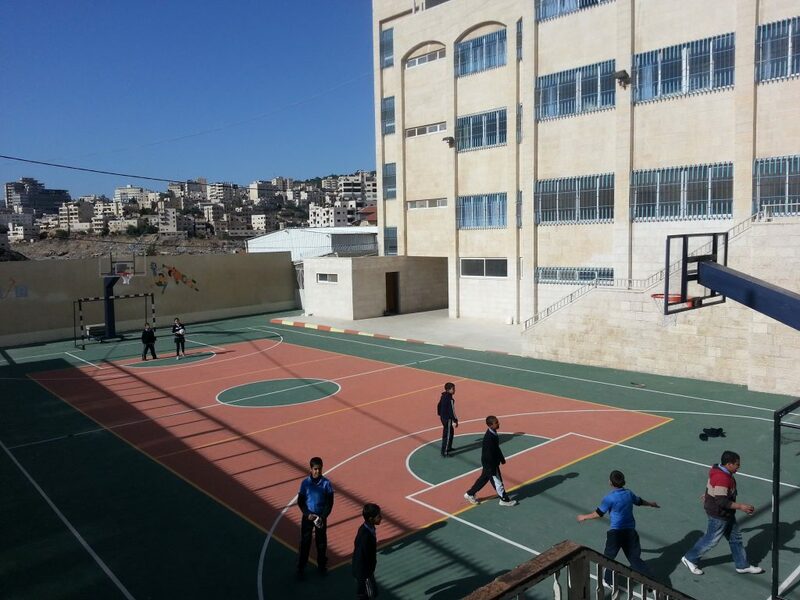 The school is located in Bethany, East Jerusalem, Palestine. 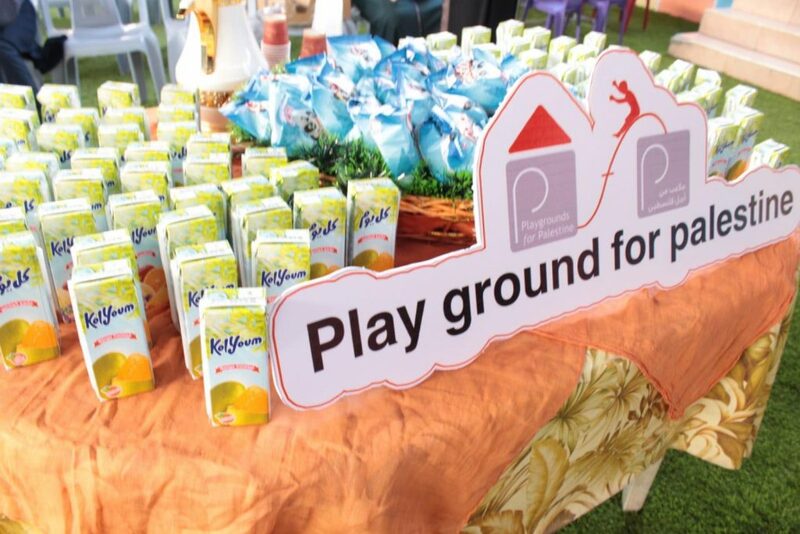 PfP is proud to partner with them to build their only sports court on the school grounds. 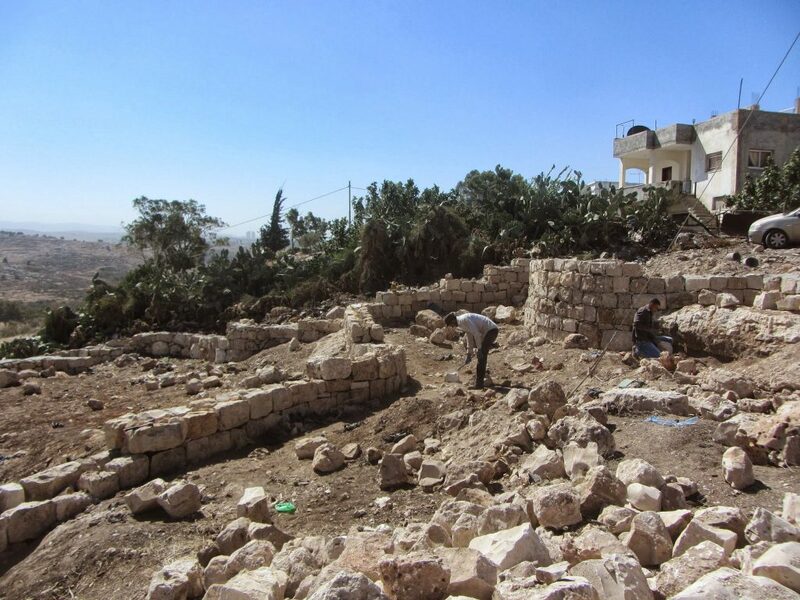 Located in the Jordan Valley, Al Aqaba is an ancient Palestinian village, dating at least to the 6th century. 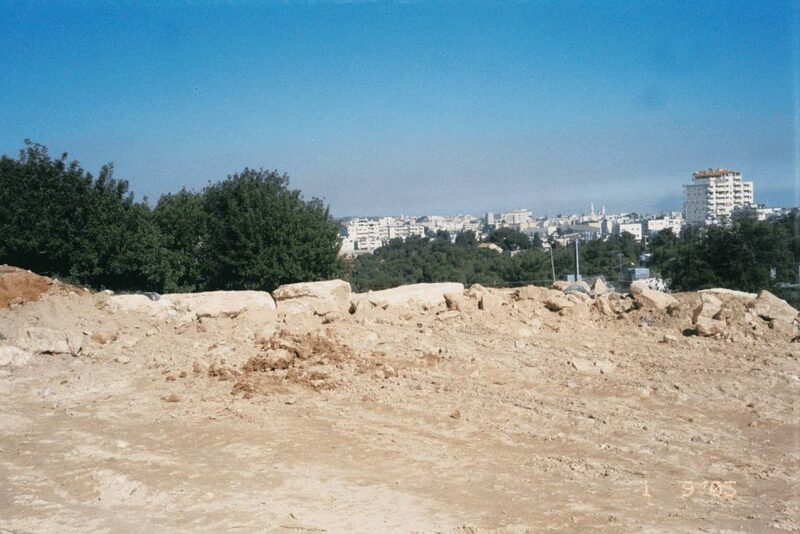 Designated “Area C,” it has been under complete control of the Israeli military and faces frequent demotion and confiscation orders. 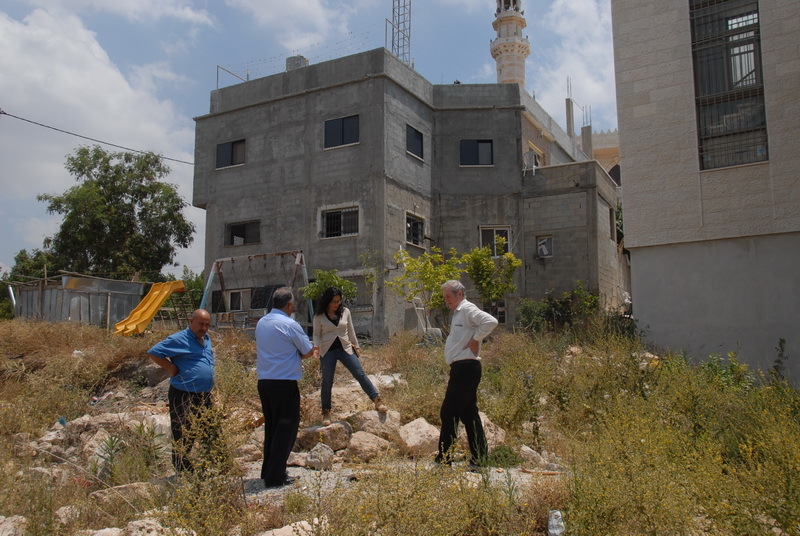 Nearly every building in the village, including the mosque, women’s center, and kindergarten has faced demolition orders. 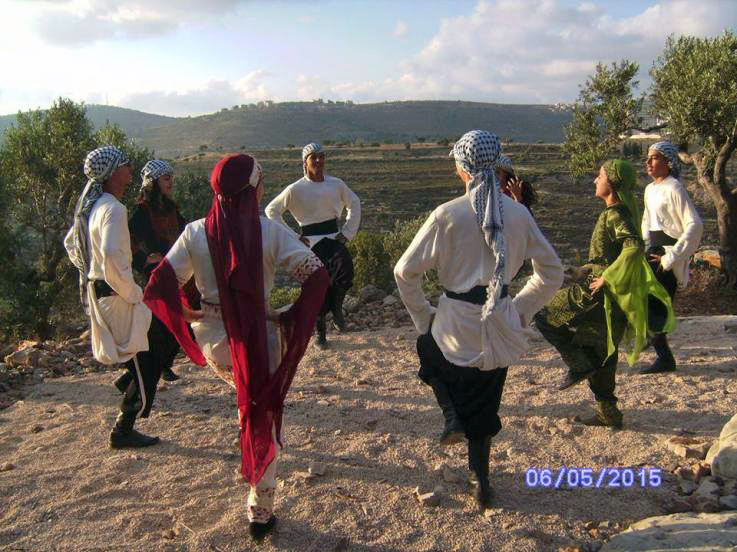 Villagers, however, continue to inhabit their ancestral lands. 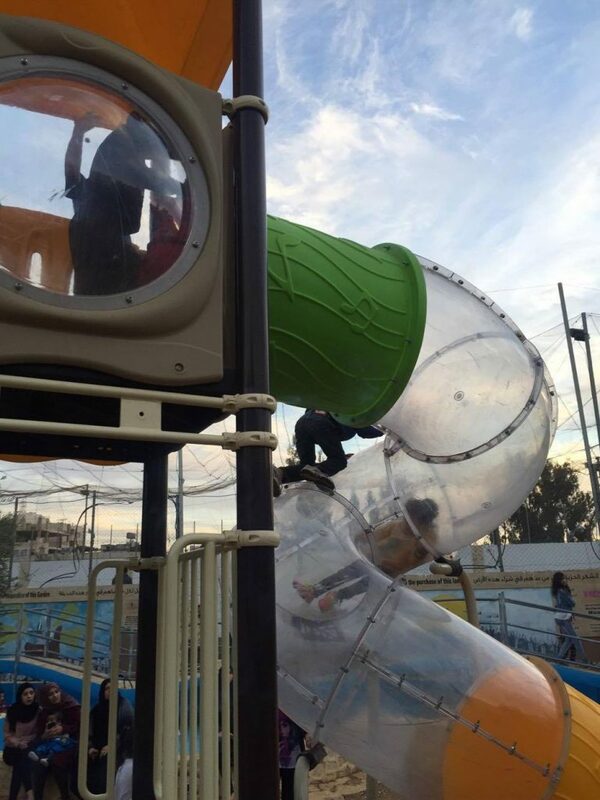 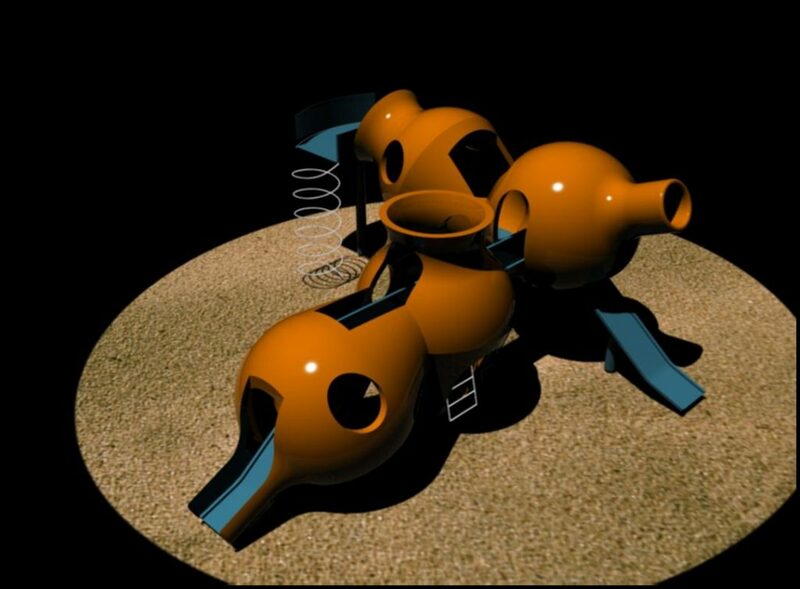 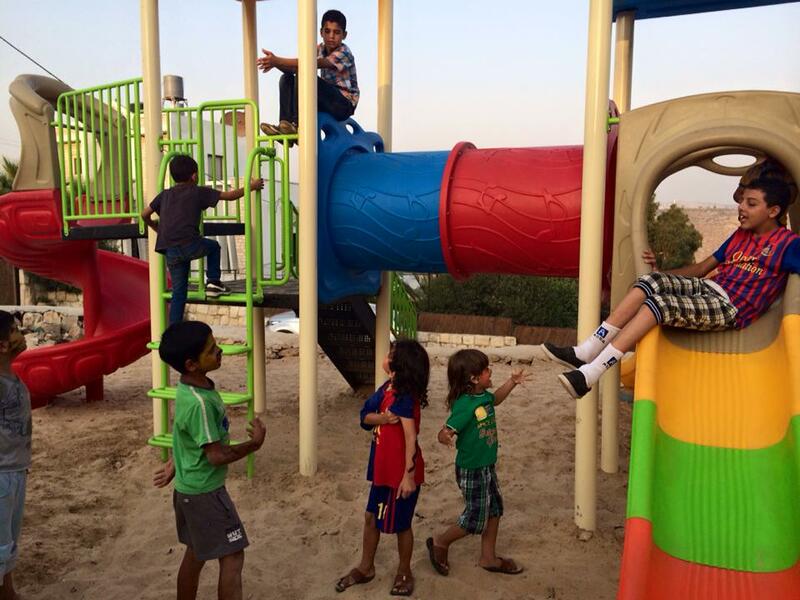 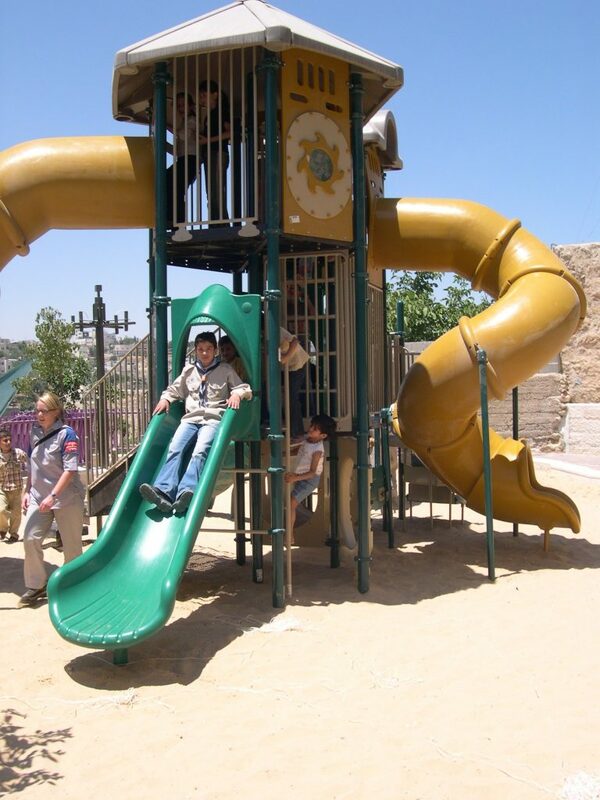 This playground was built for the children of Al Aqaba. 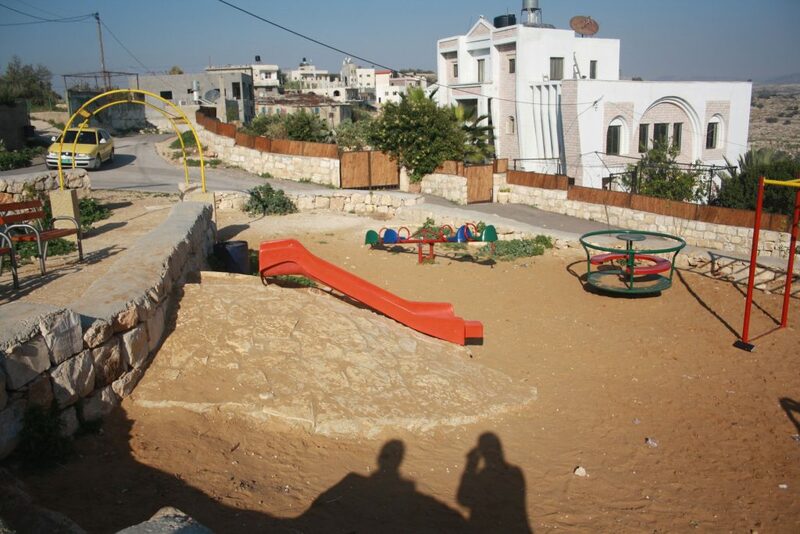 To learn more about the this village, go here. 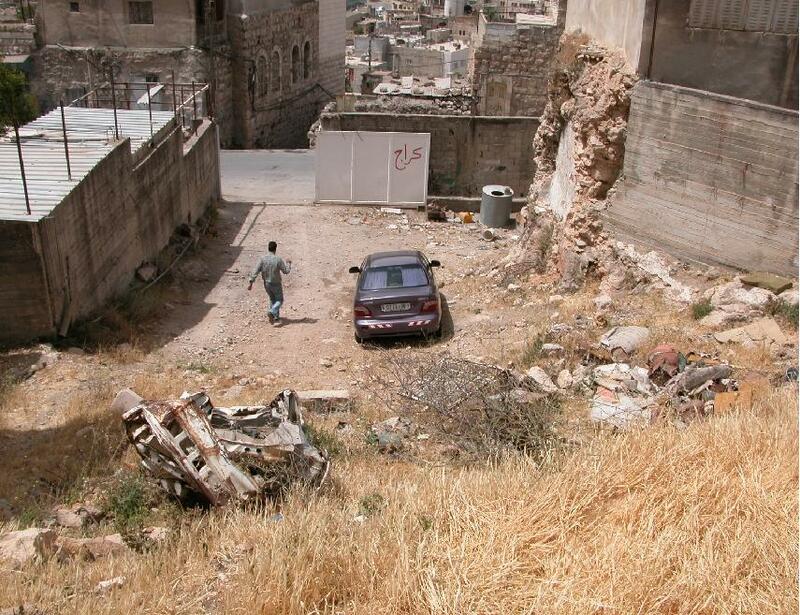 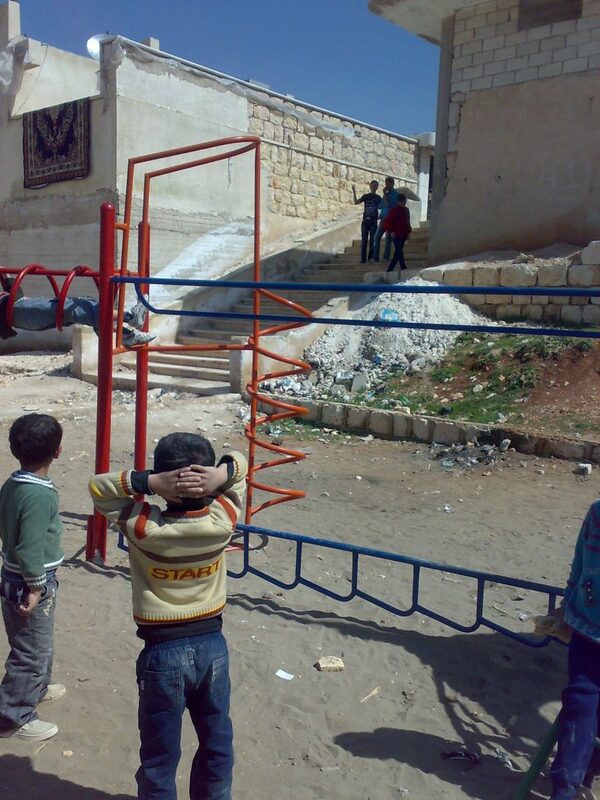 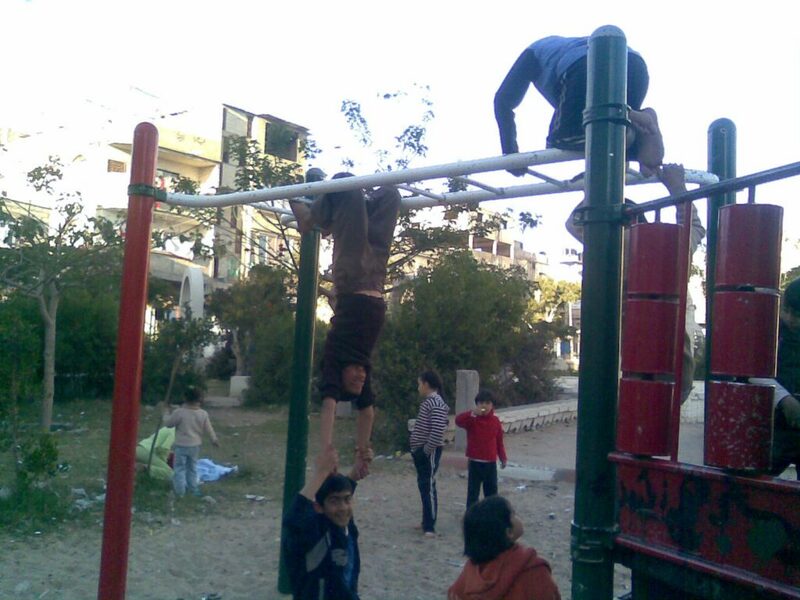 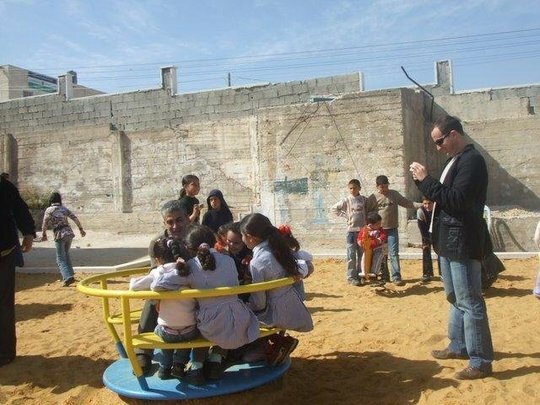 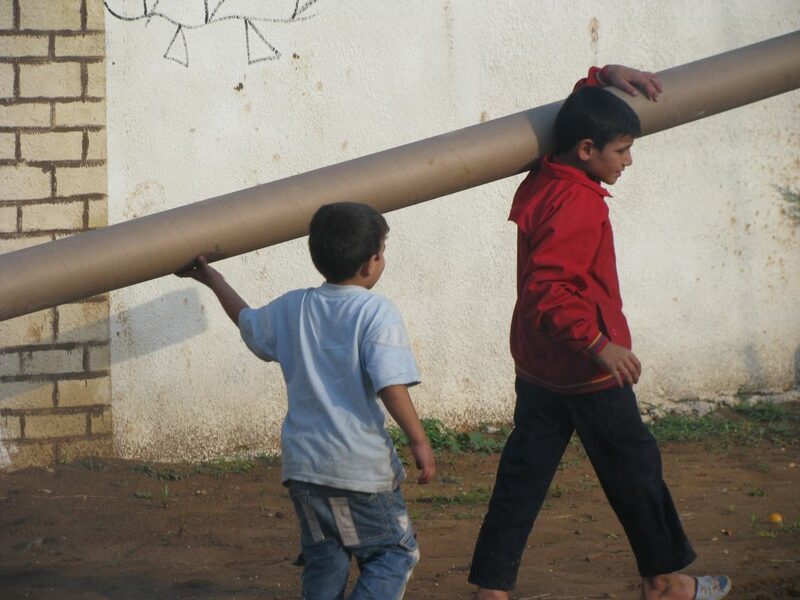 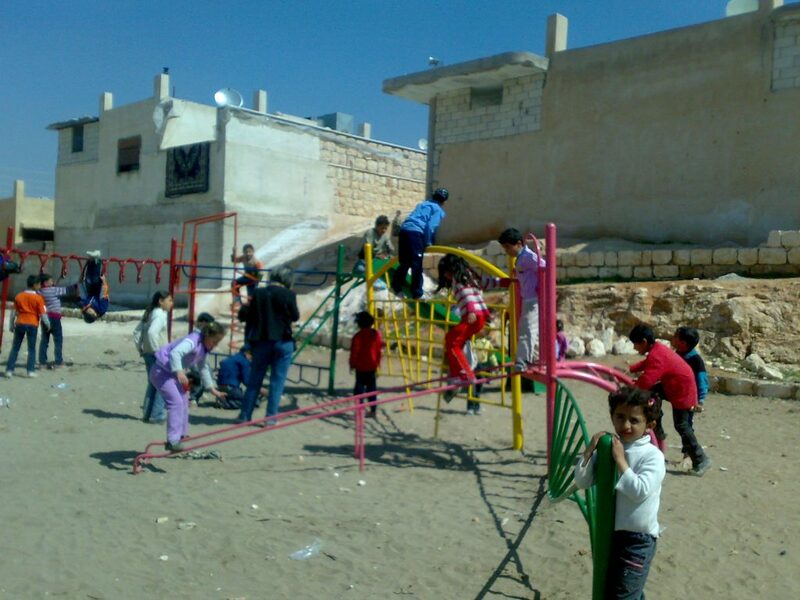 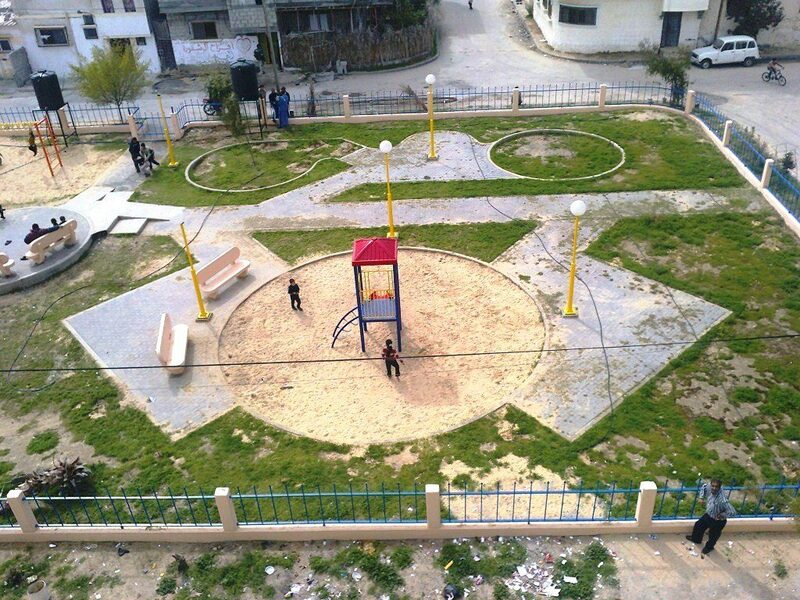 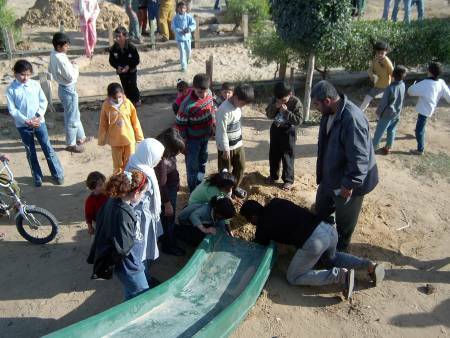 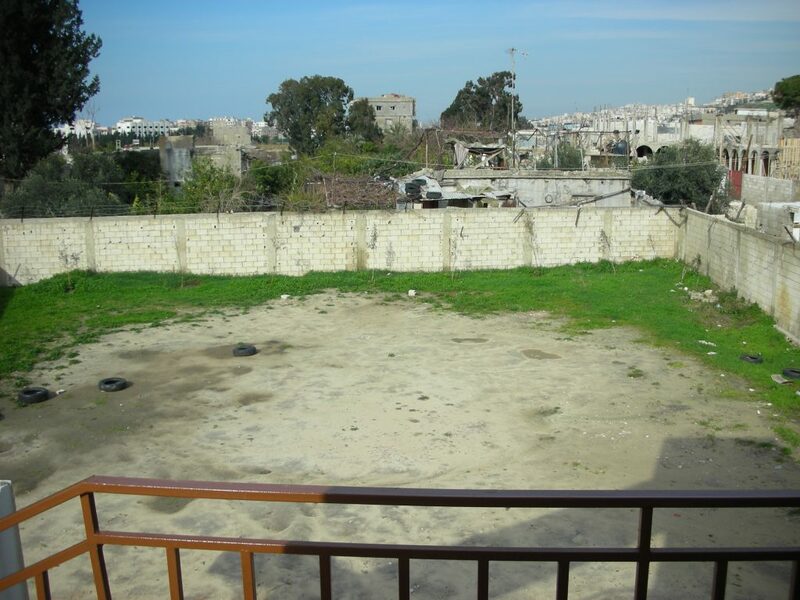 This was our first and only playground built in Syria, shortly before the outbreak of the civil war. 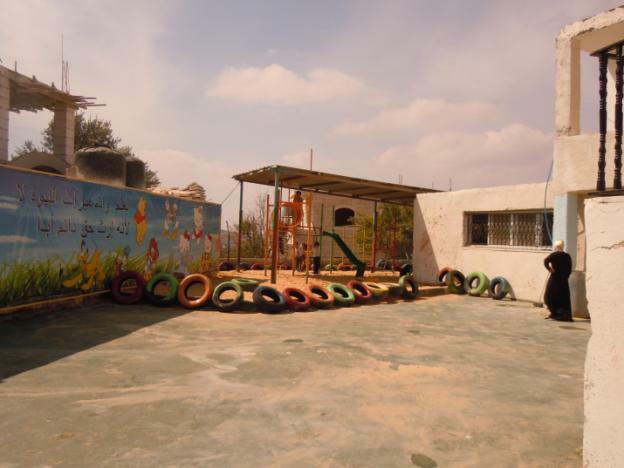 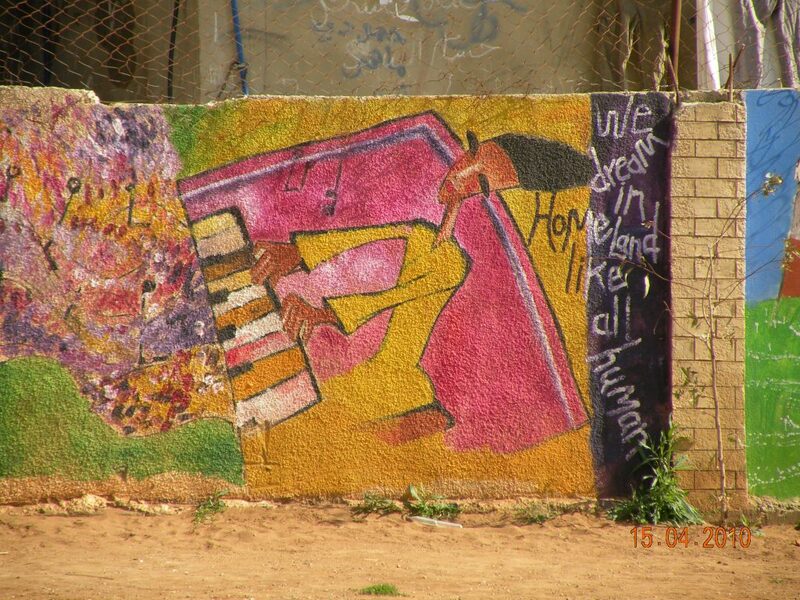 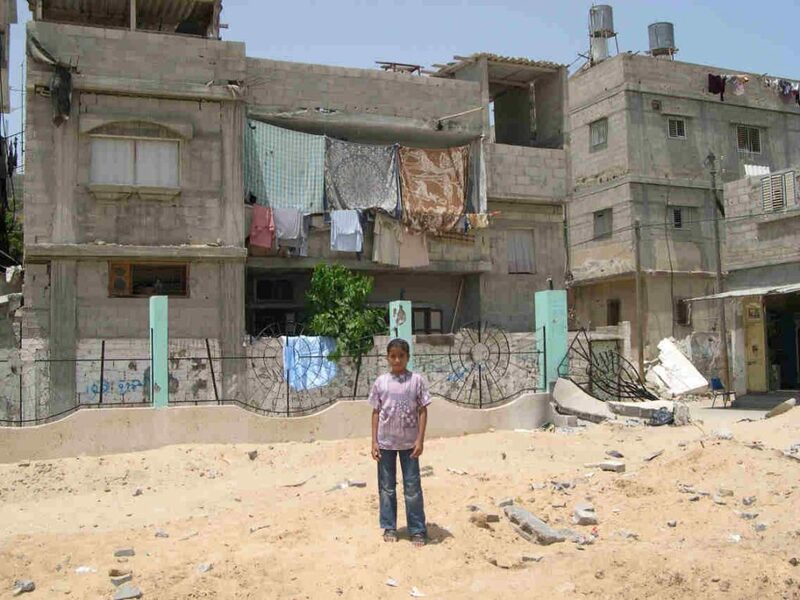 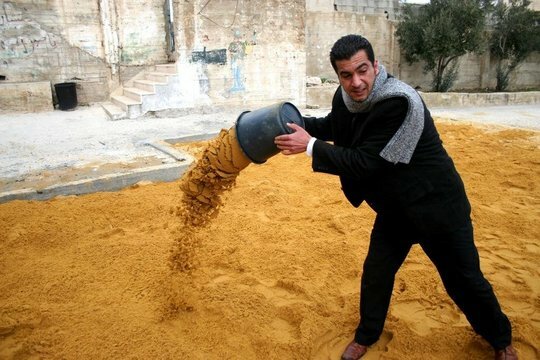 It is located in the UNRWA refugee camp of Ein el Tal. 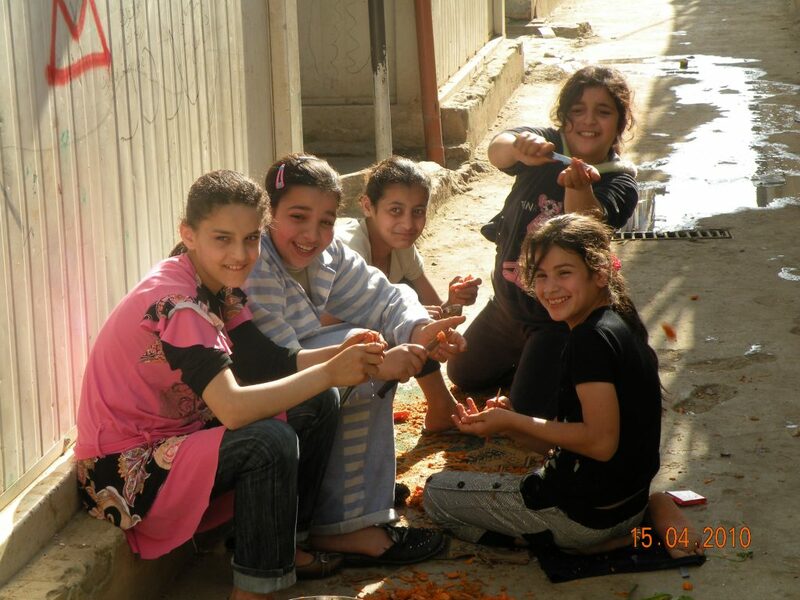 The refugee camp is the largest official Palestinian refugee camp in Syria. 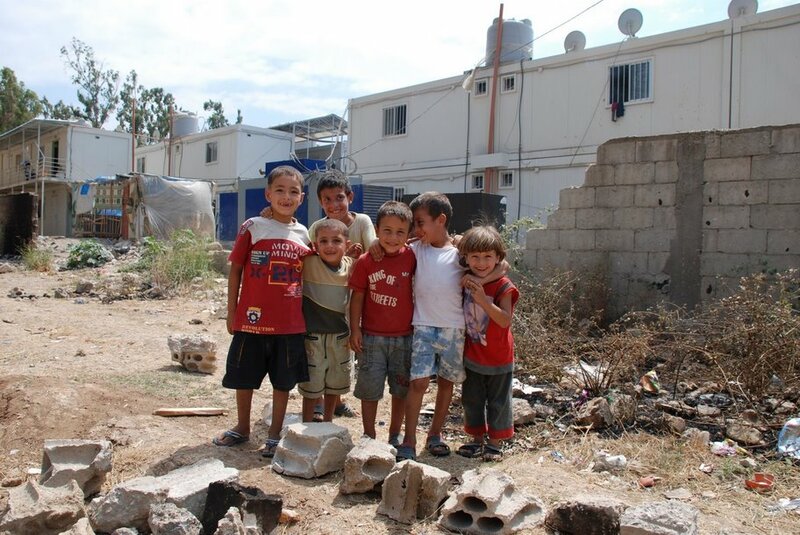 Established between 1948 and 1950, approximately 19,000 Palestinians live in and around the camp. 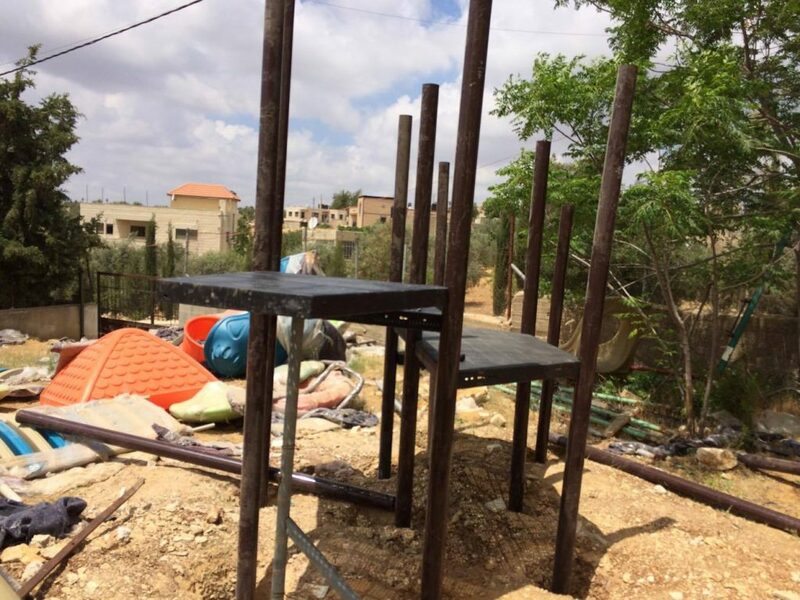 Built from army barracks constructed by Allied Forces during WWII, the shelters of the camp are some of the most unhealthy and unsafe of Syria’s camps. 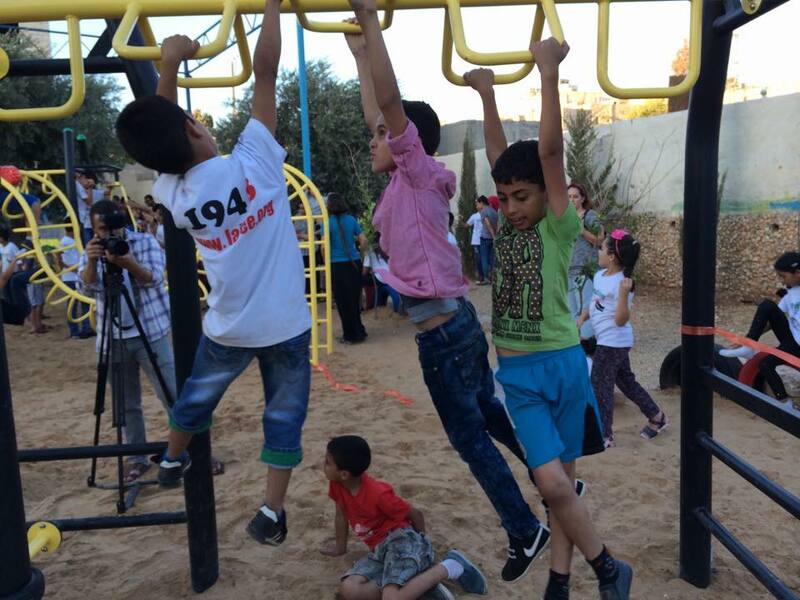 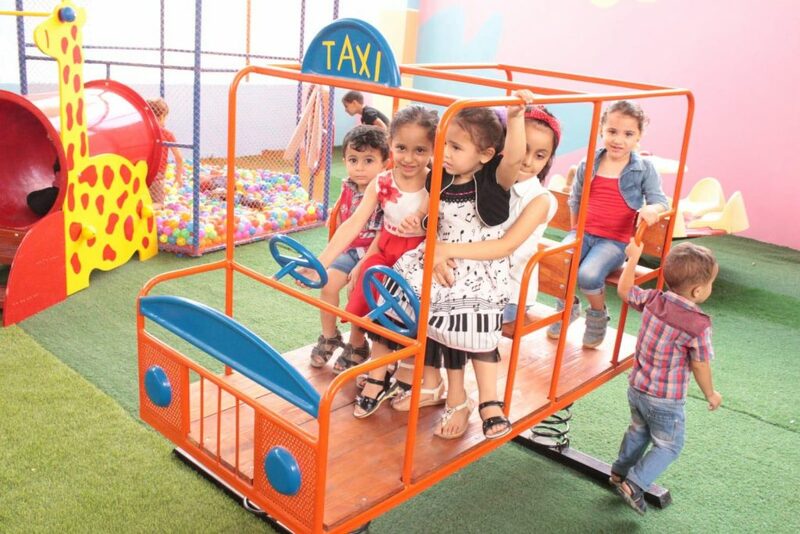 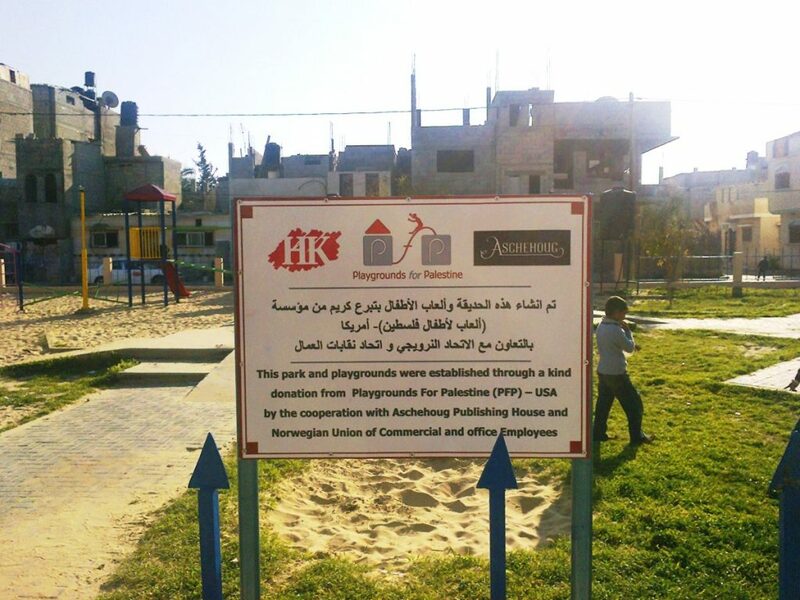 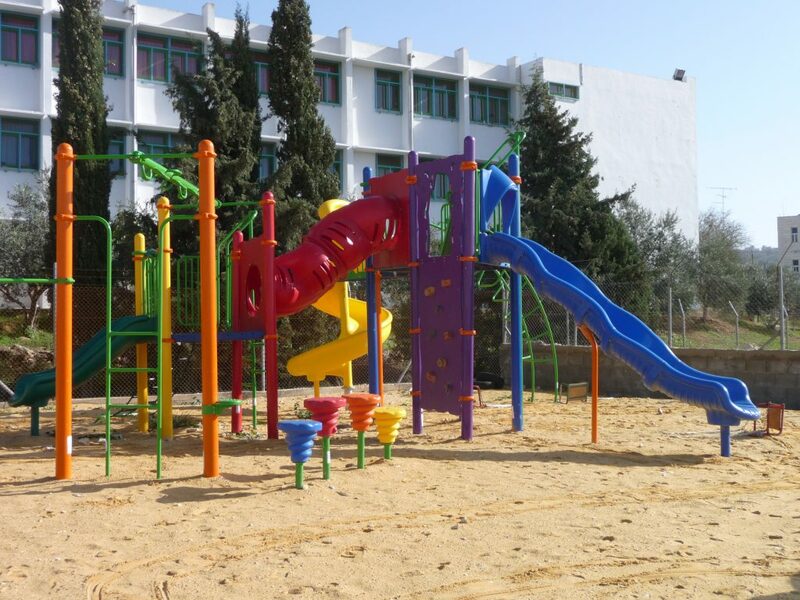 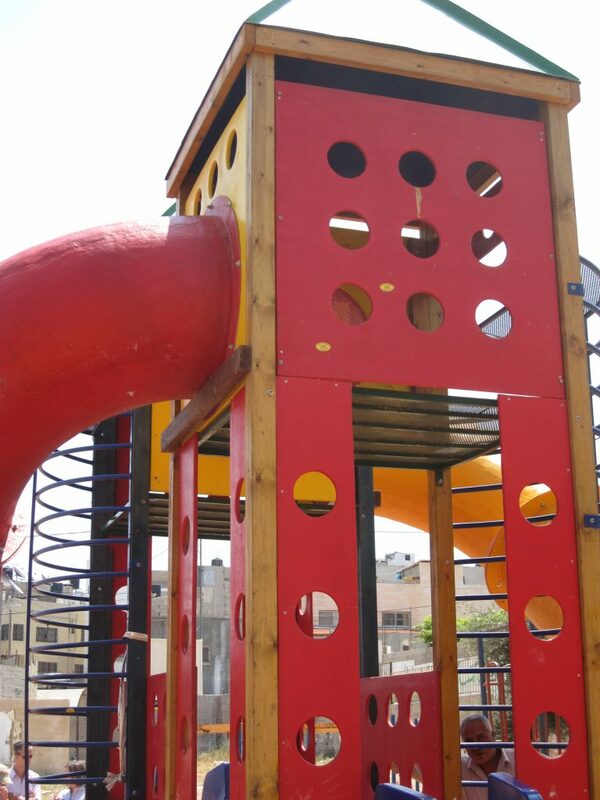 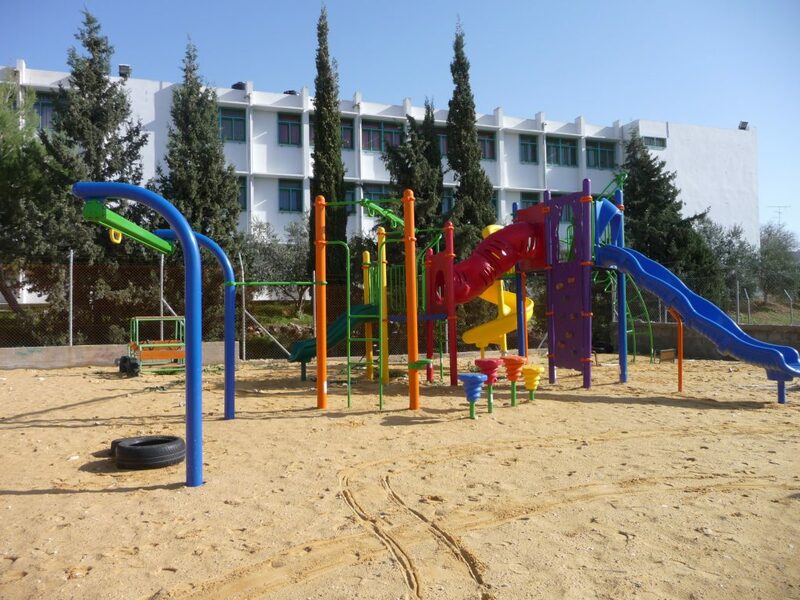 This is our fourth playground in Gaza, which is made possible by a generous donation, which was collected by Aschehoug Publishing House, the Trade Union and Administration of Aschehoug Publishing House, and the Norwegian Union of Commercial and Office Employees. 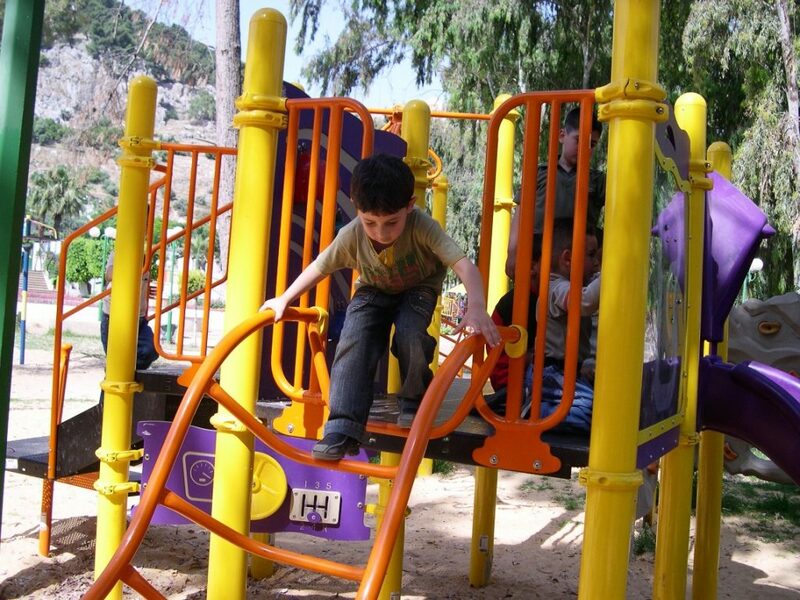 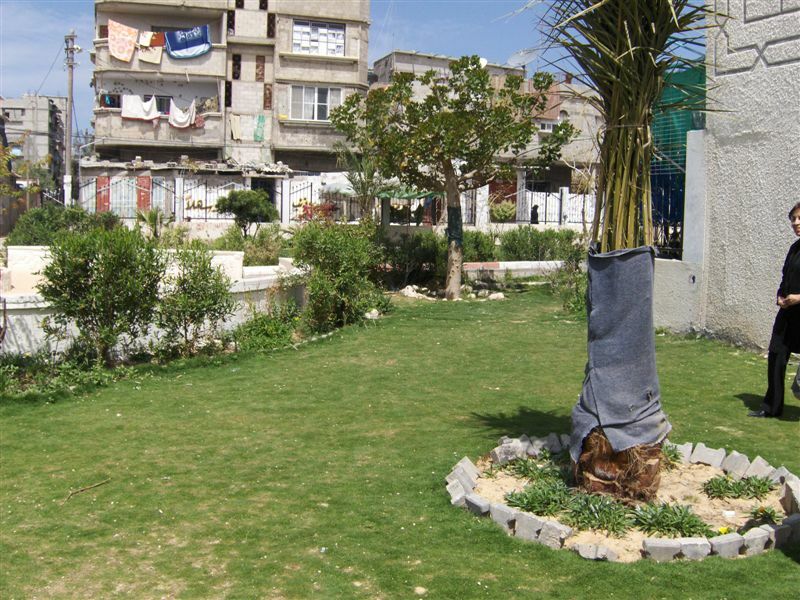 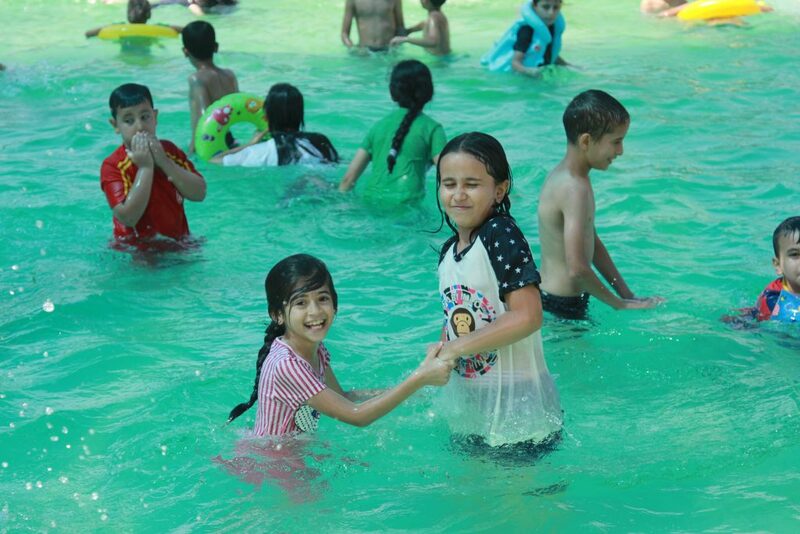 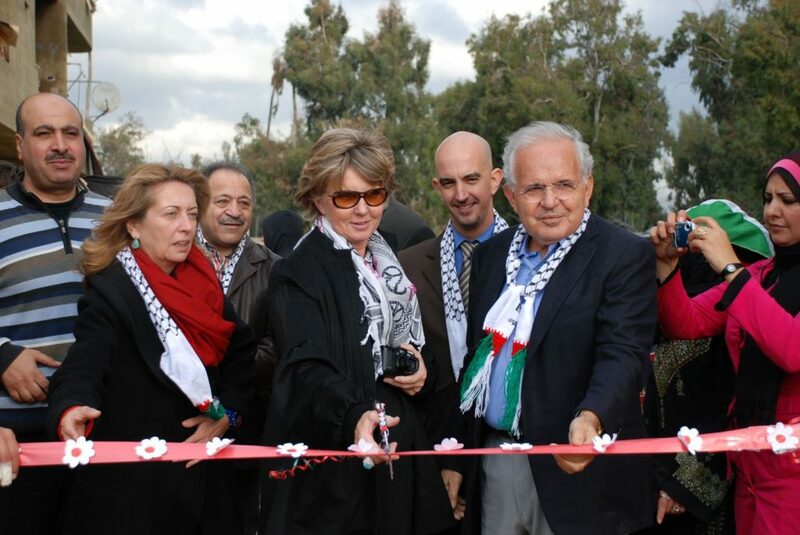 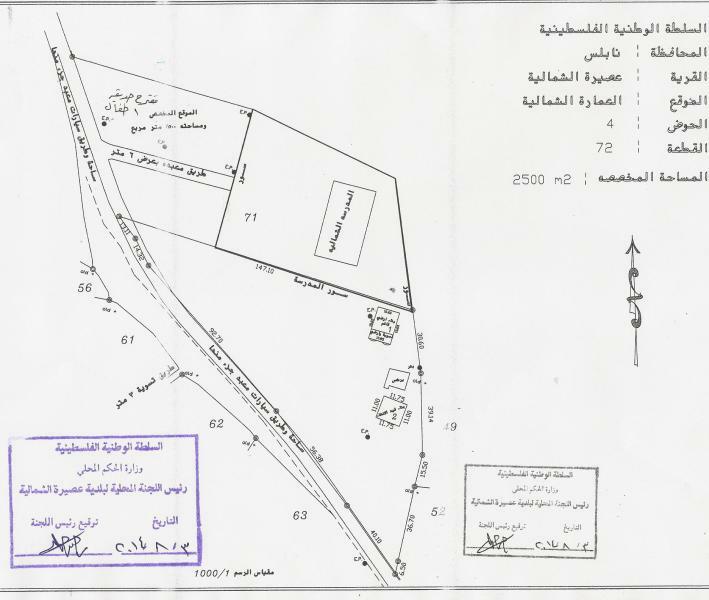 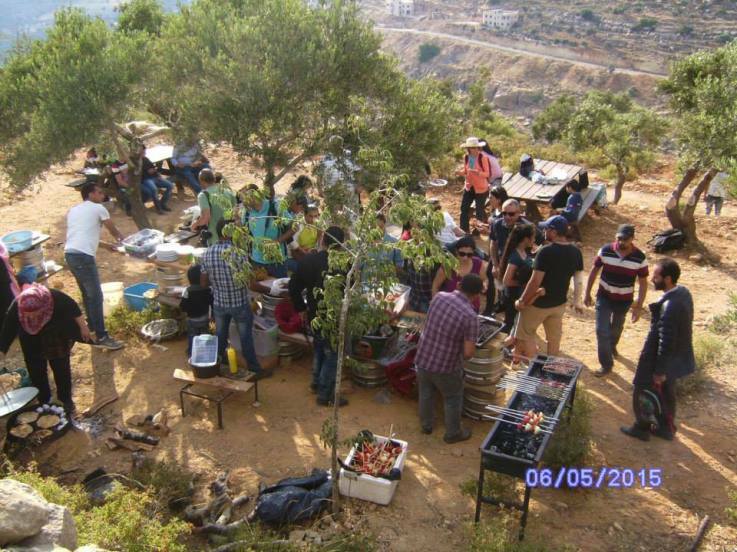 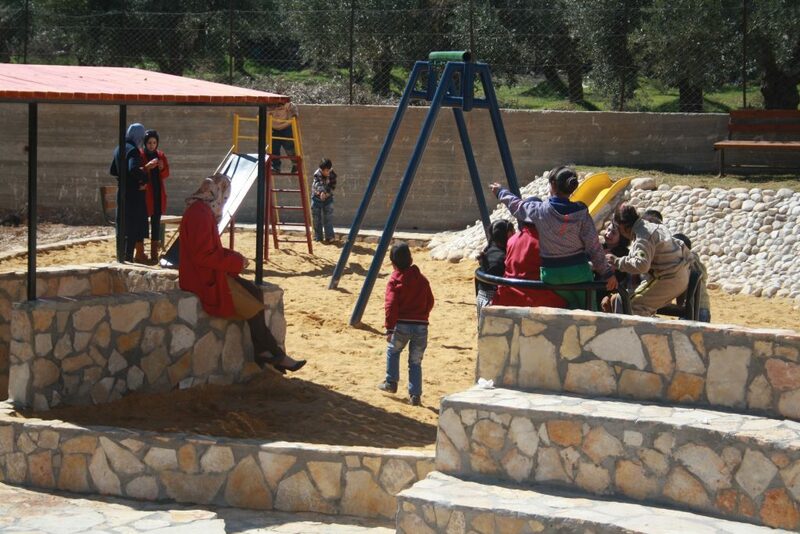 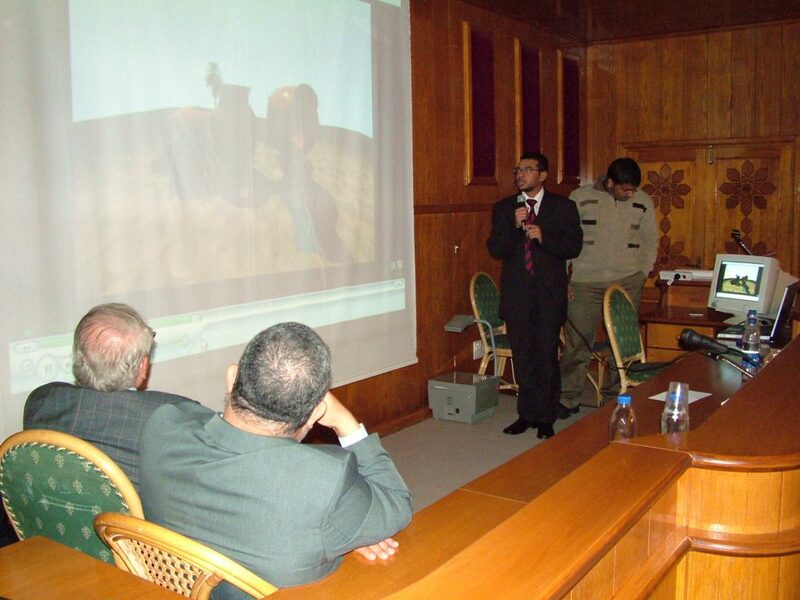 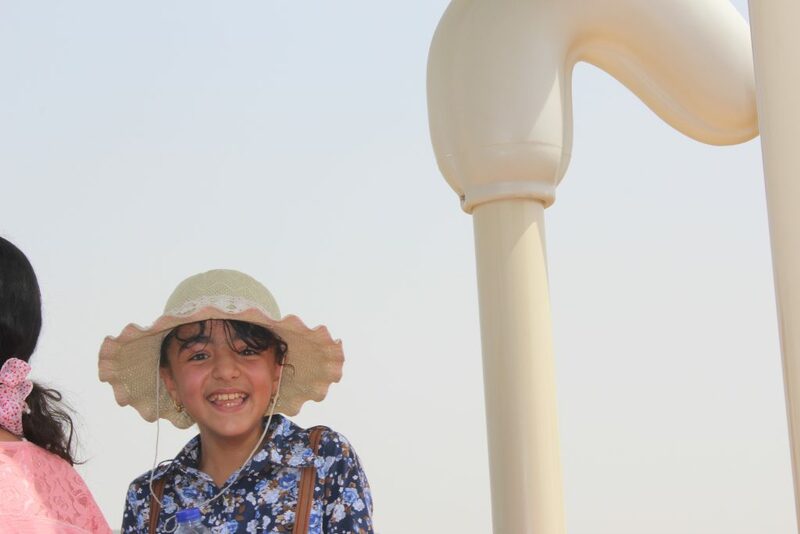 The park is owned by Municipality of Deir Al Balah for the benefit of approximately 900 families. 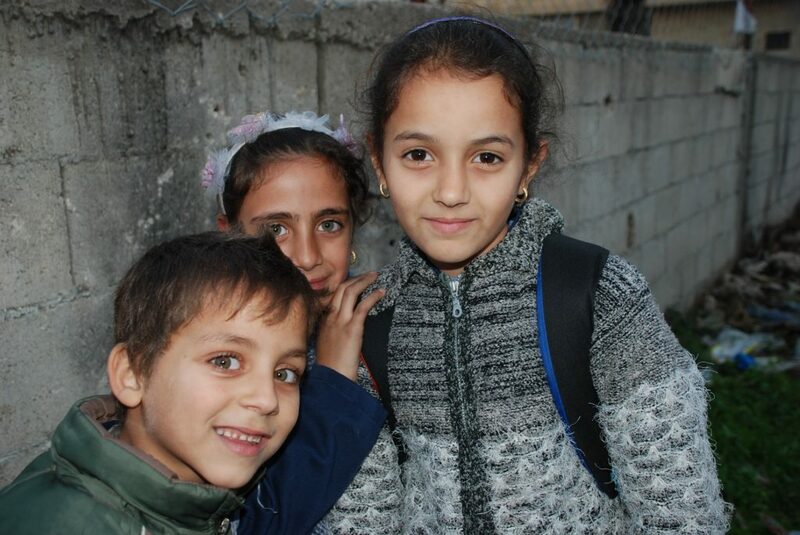 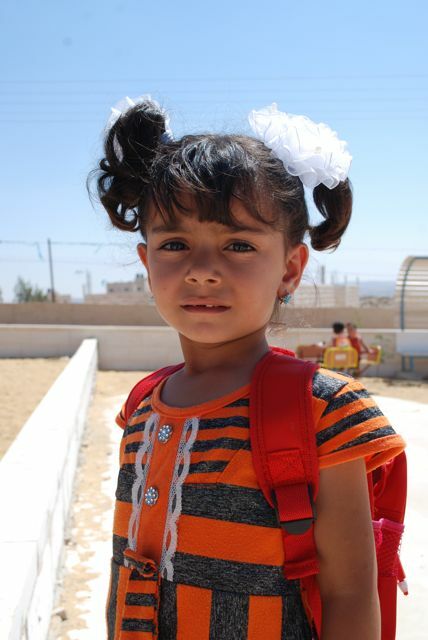 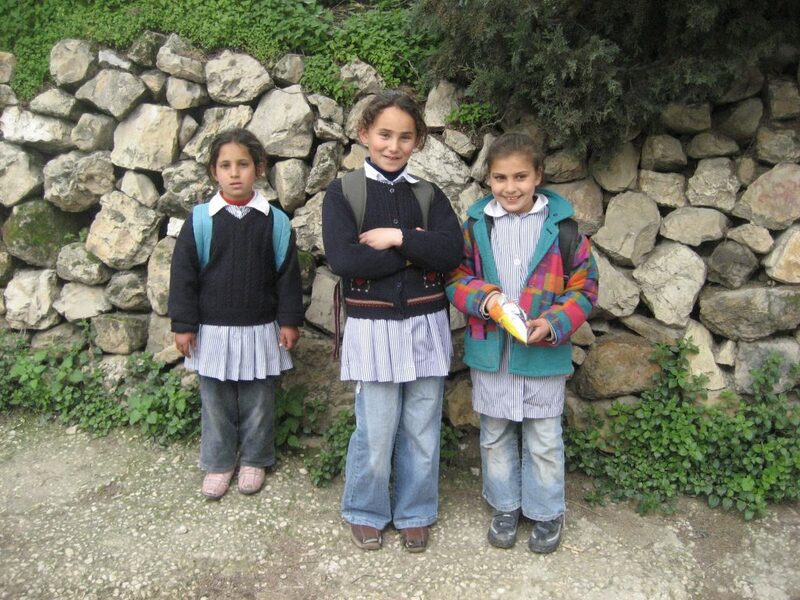 The city of Arroub is home to three elementary schools and 43% of its population is under the age of 14. 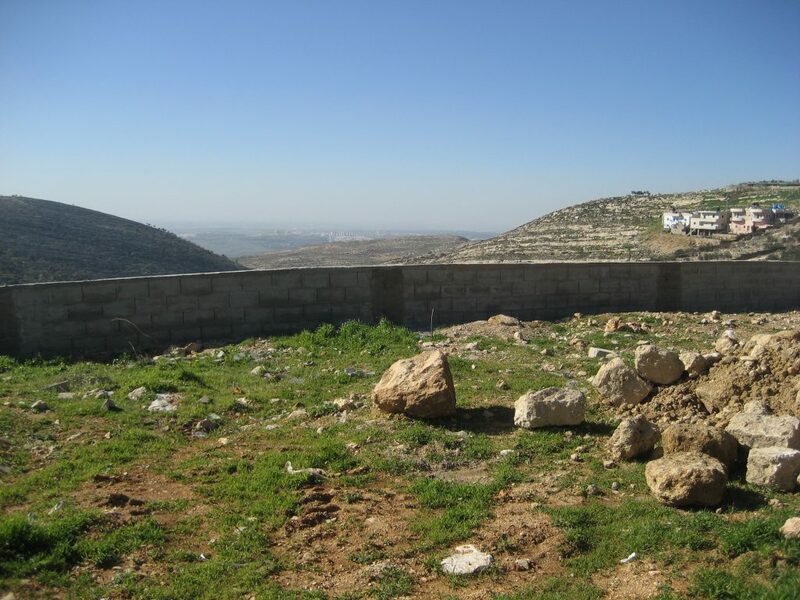 Aqraba is a village of approximately 8200 residents, about 18 km from the ancient city of Nablus. 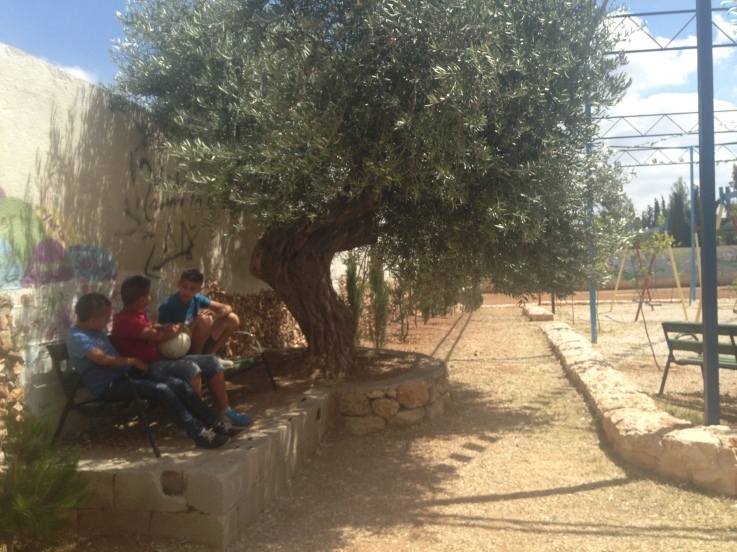 Traditionally, Aqraba had been a rural farming village, with many olive groves and fruit trees. 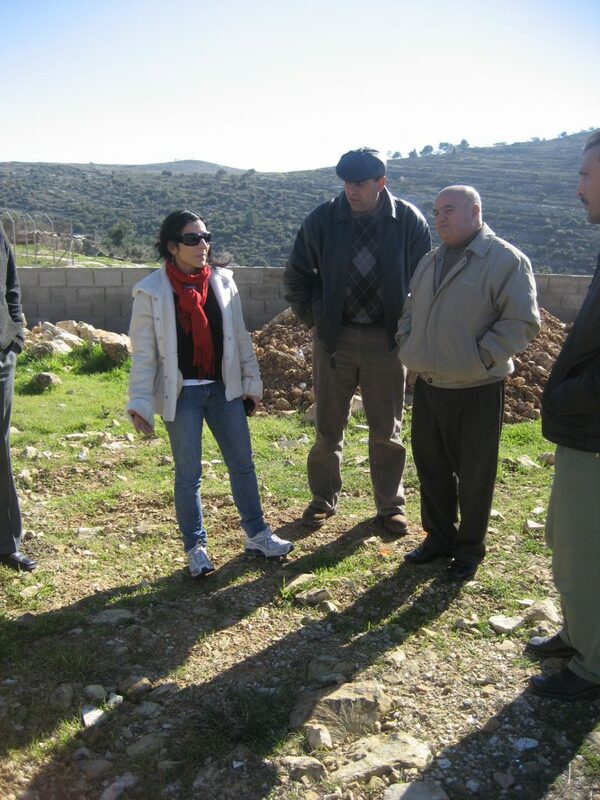 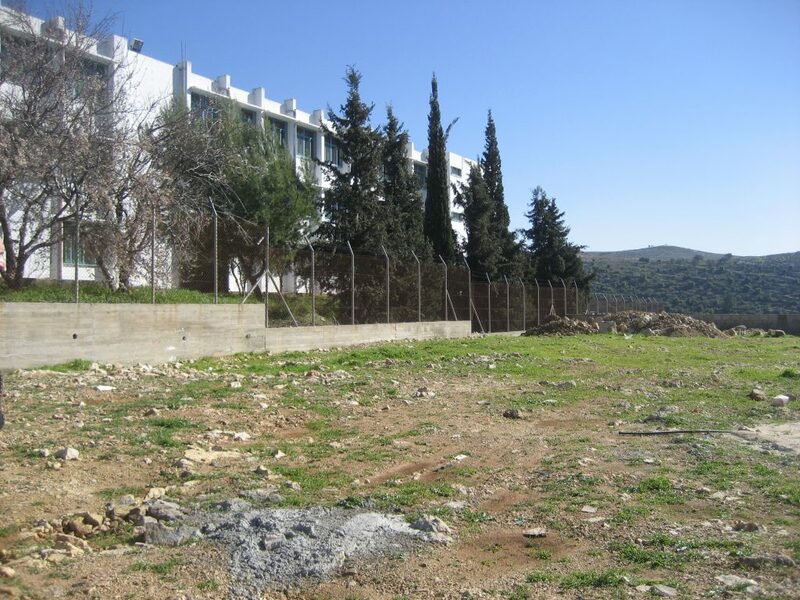 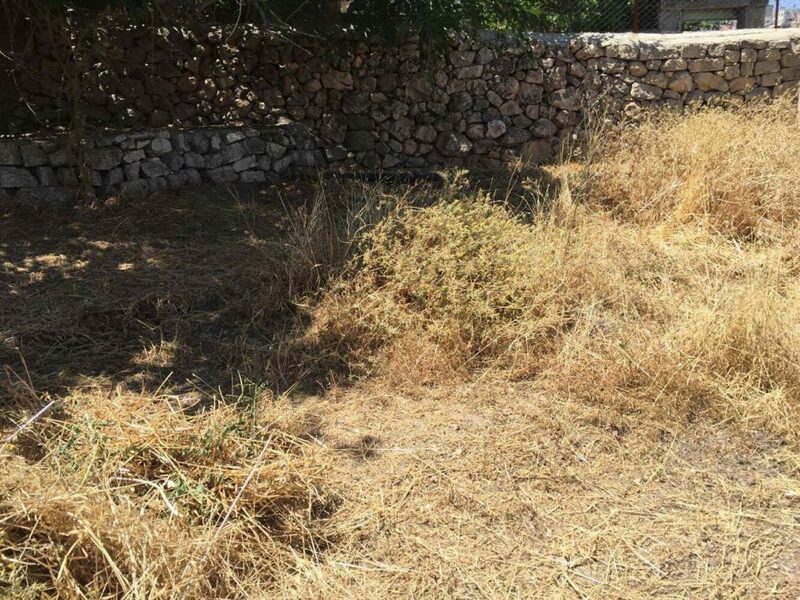 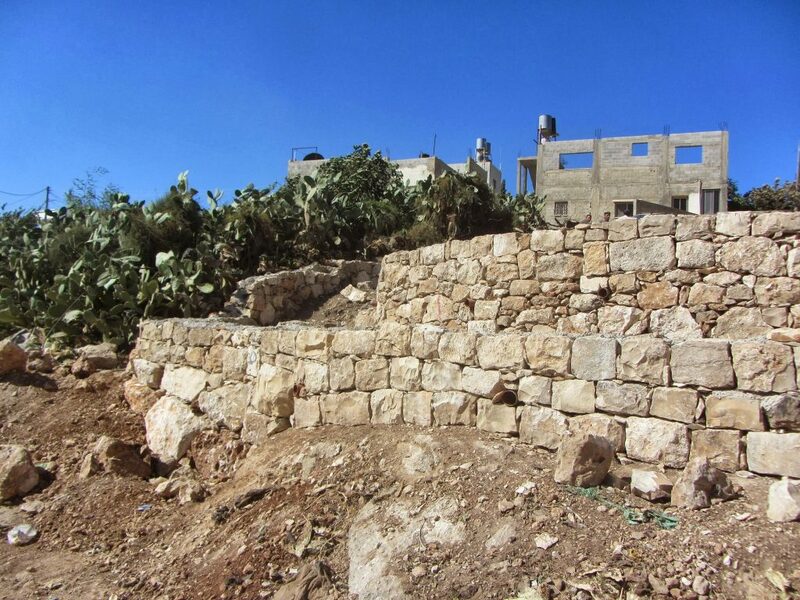 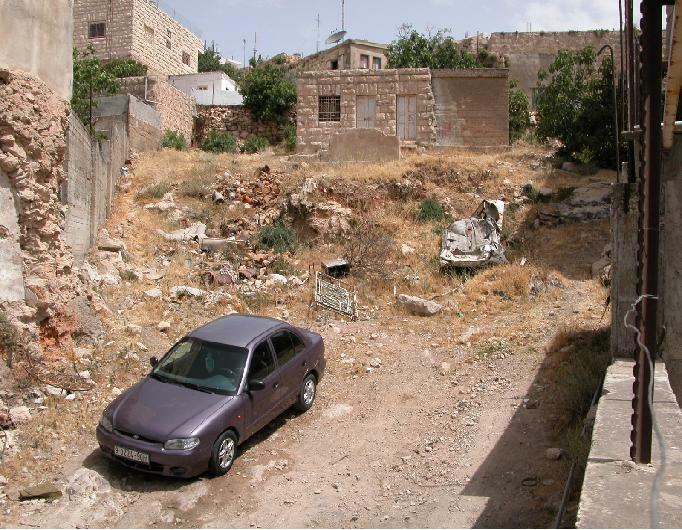 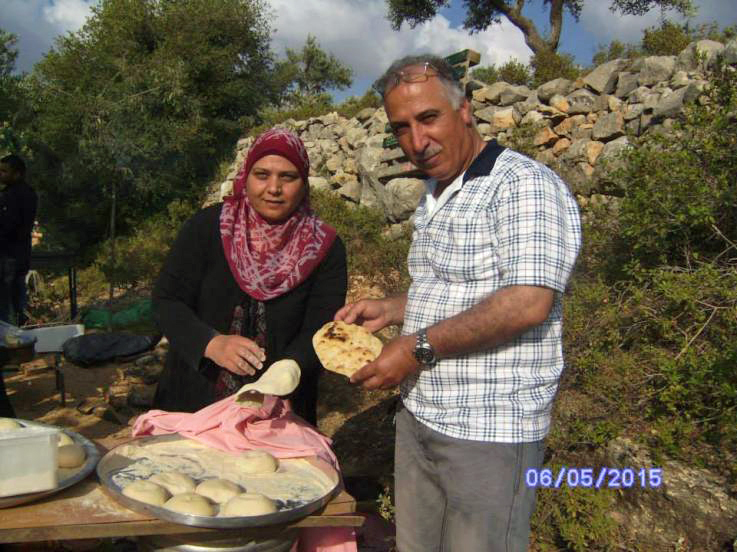 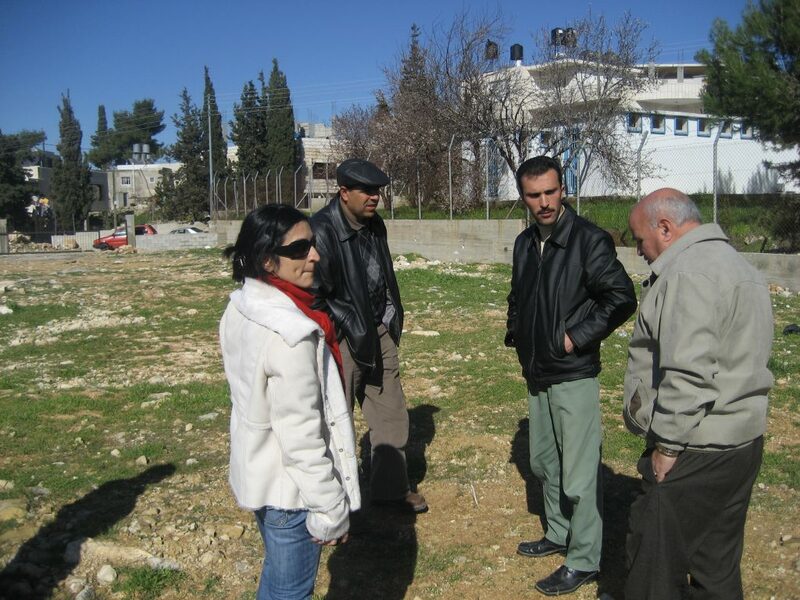 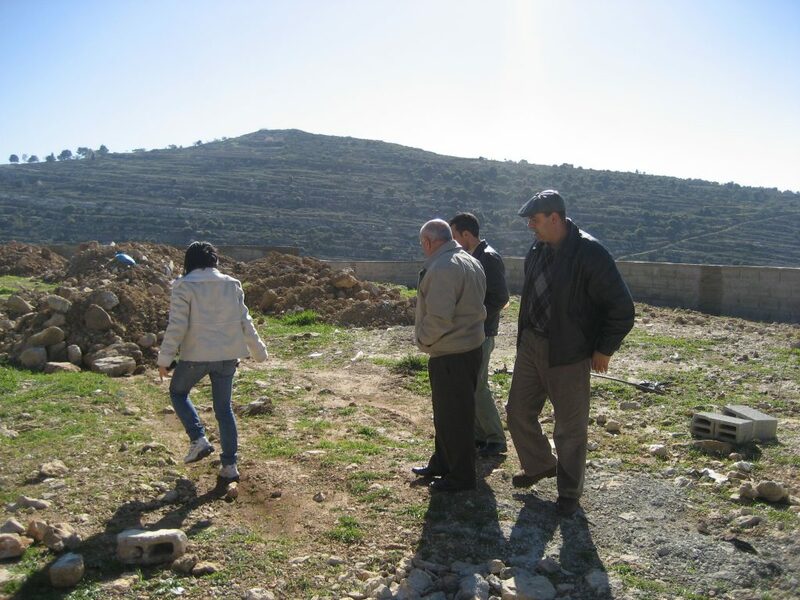 Israeli confiscation of land from families in this village, as well as ongoing expansion of settlements have led to some degree of urbanization in Aqraba, however, agriculture remains the principle source of income for its residents. 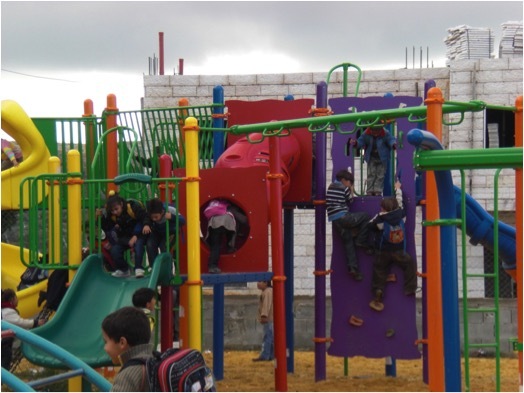 The playground we built is on public land, under the stewardship of the local municipality, and it serves approximately 5450 children. 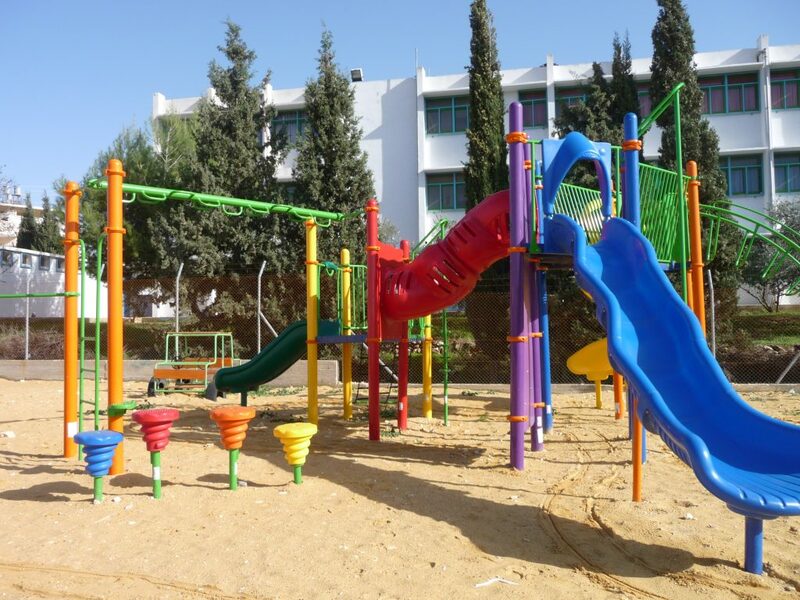 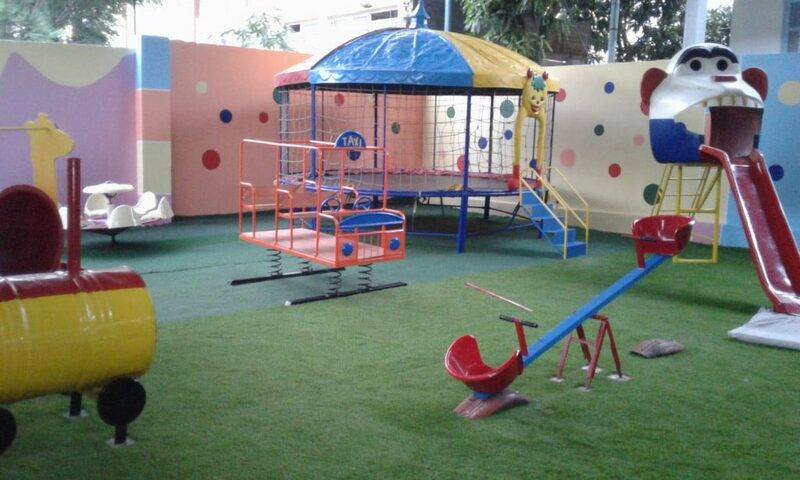 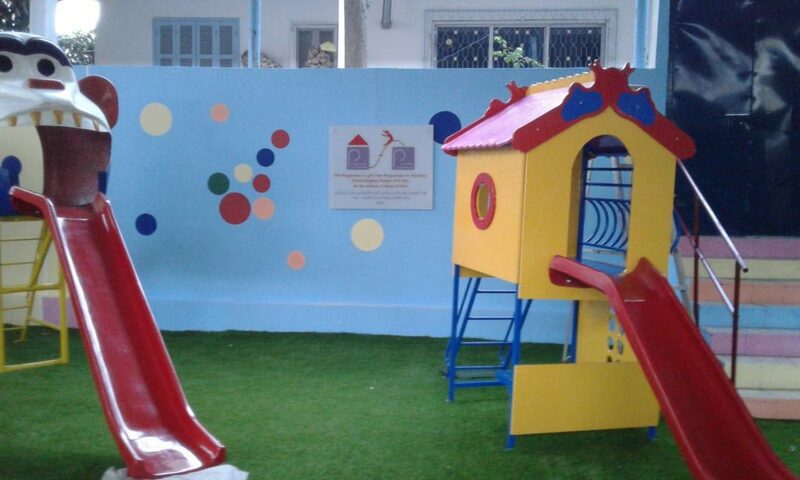 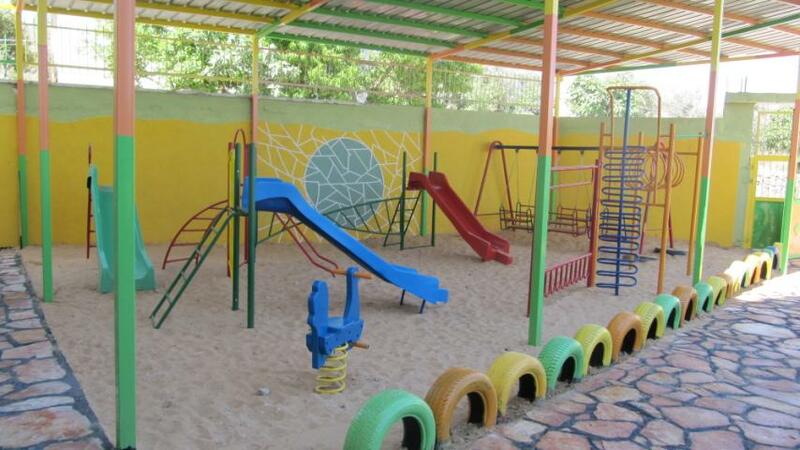 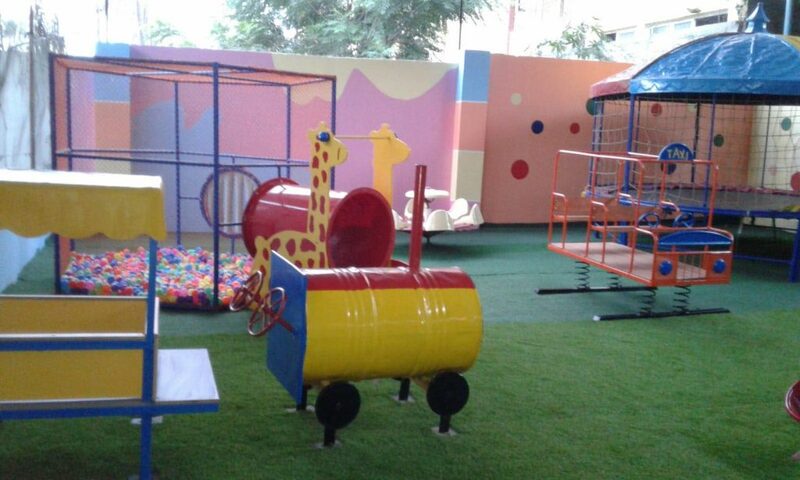 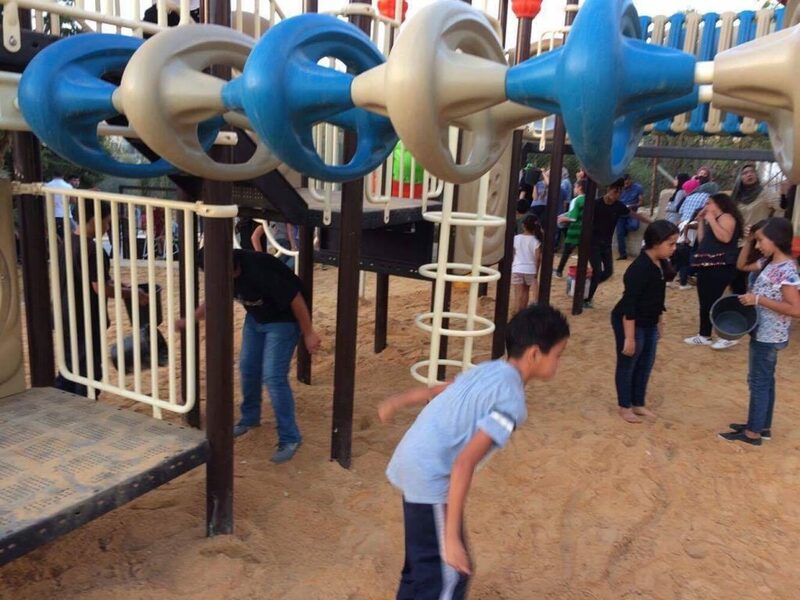 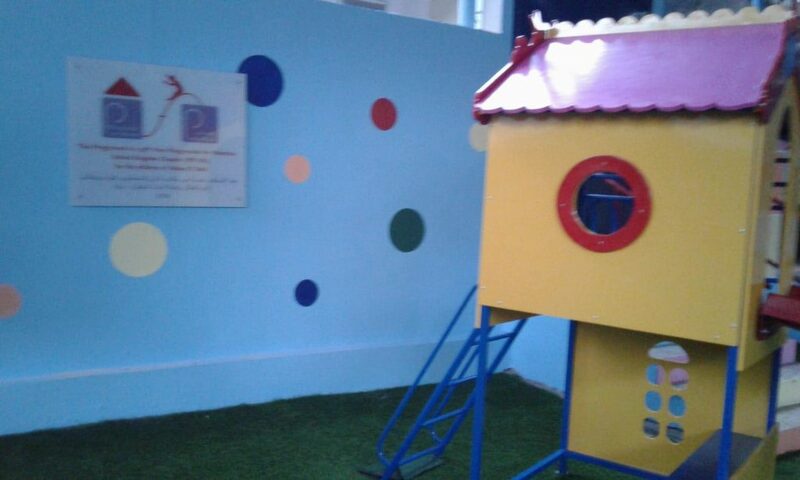 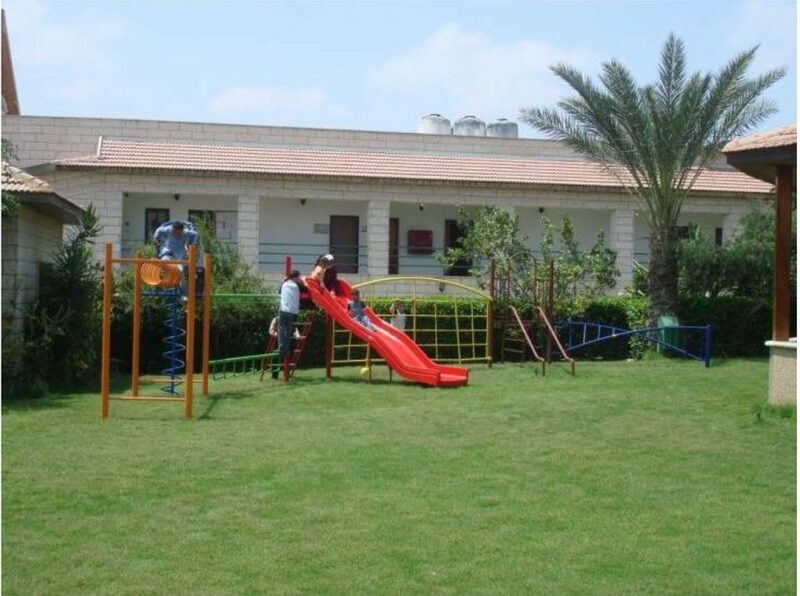 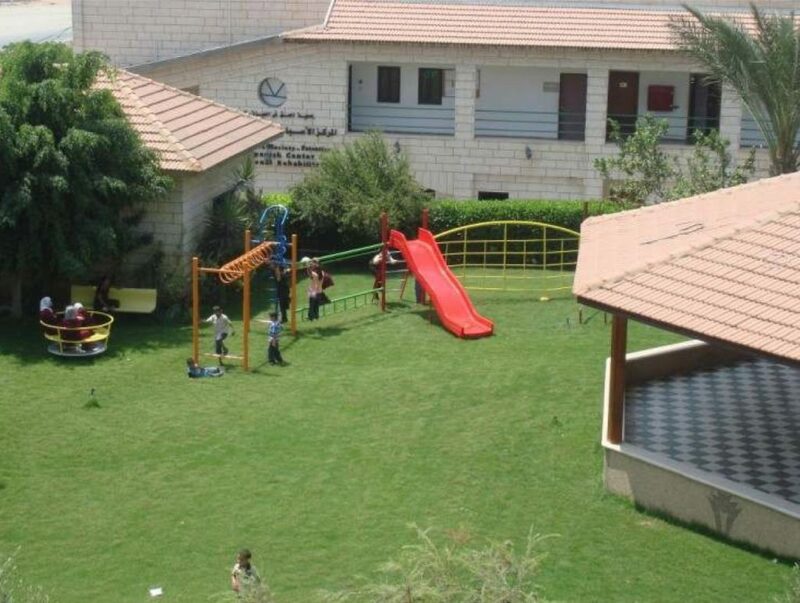 This playground is located at the Al Yasmin Society, which serves the disabled. 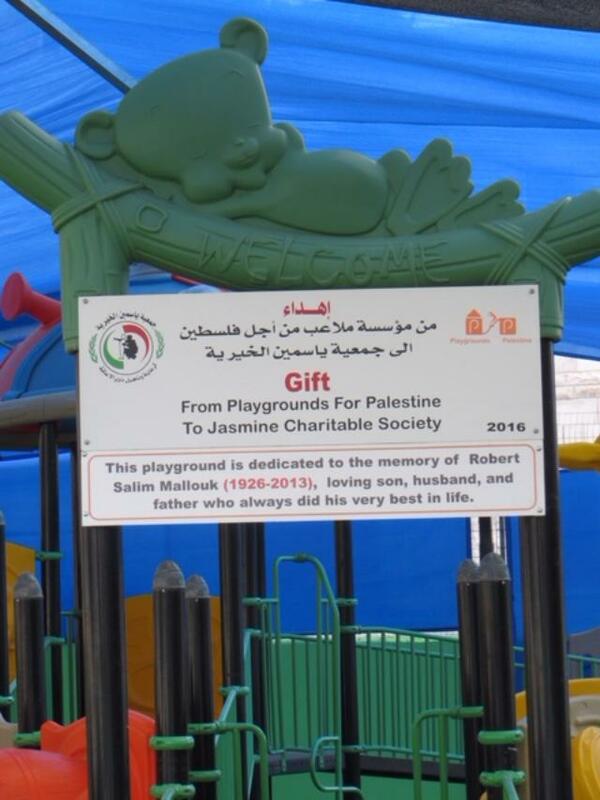 Support for this playground comes from the generosity of the Mallouk Family, in memory of Robert Mallouk. 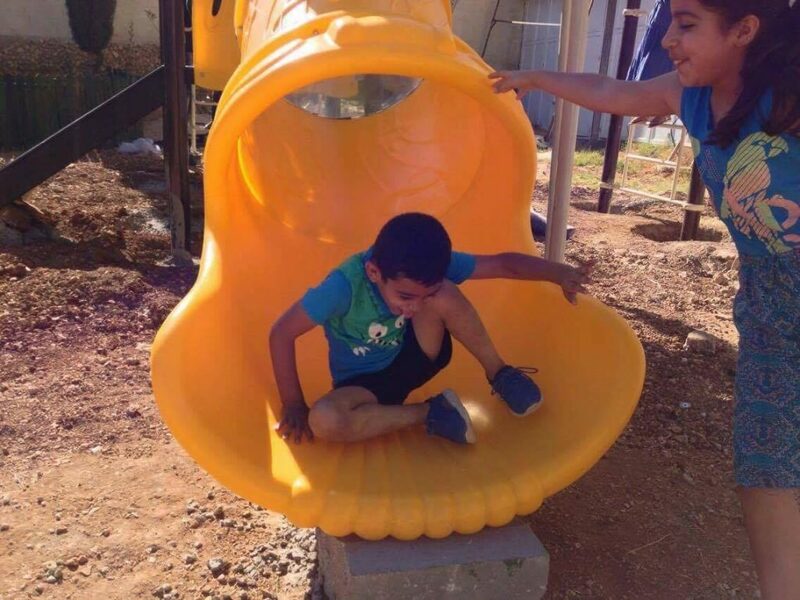 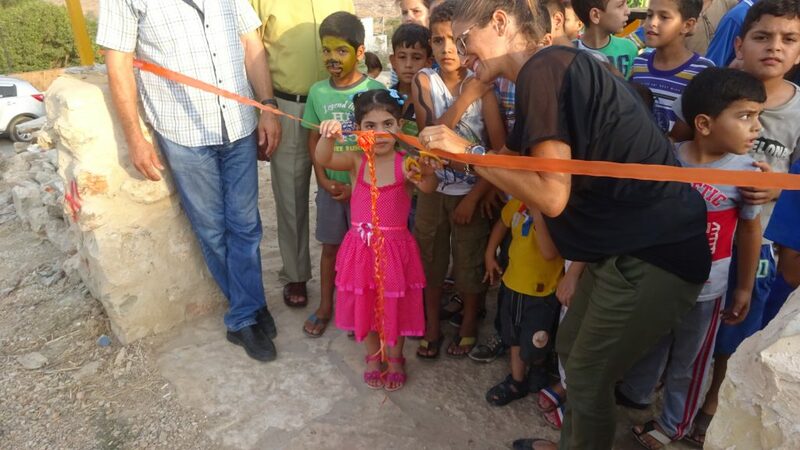 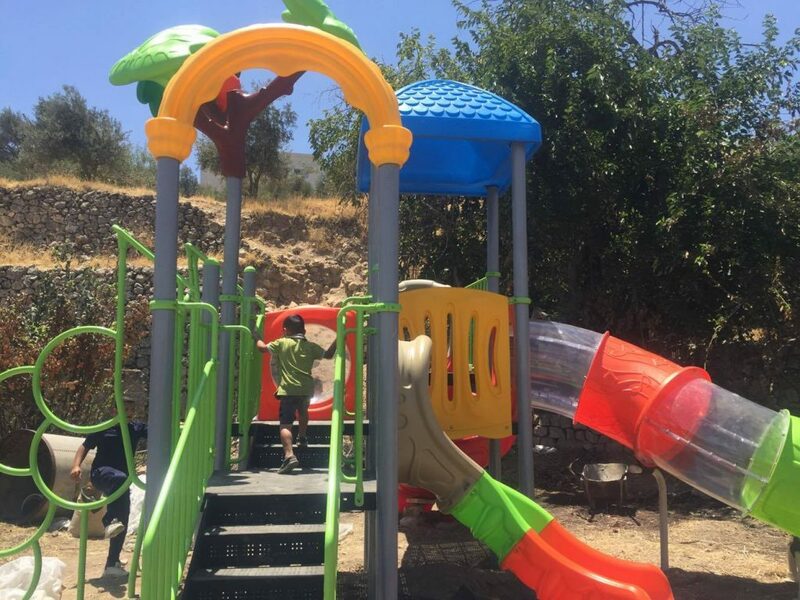 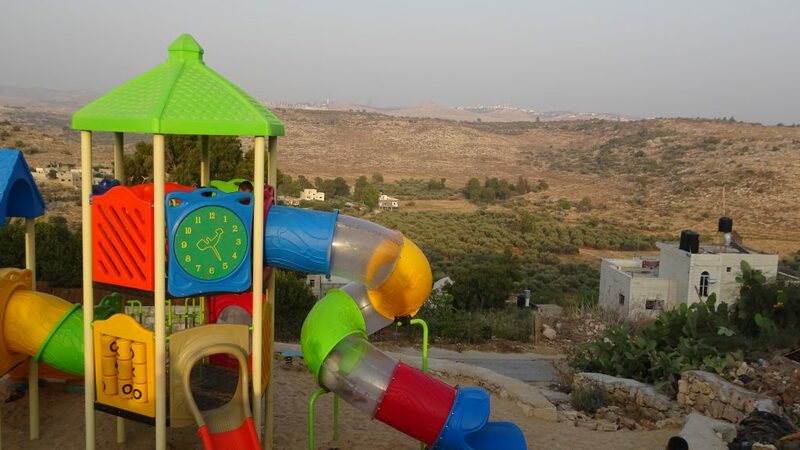 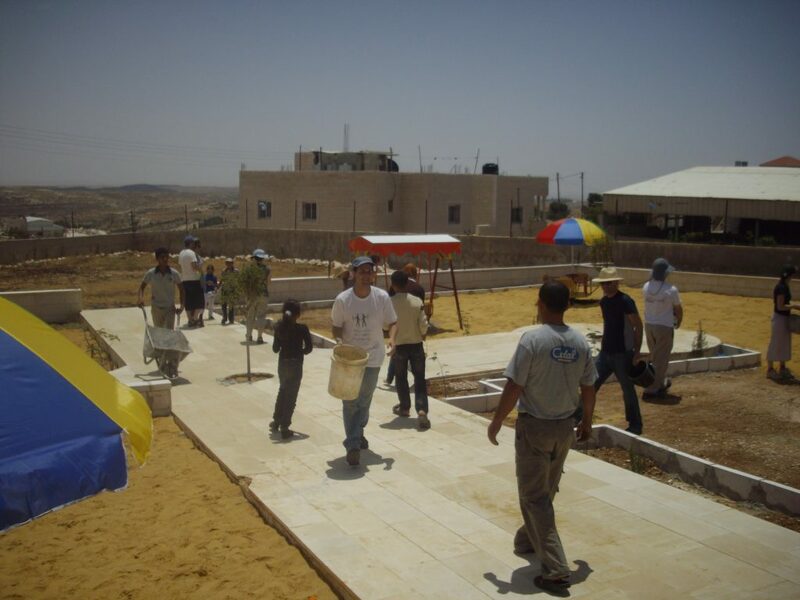 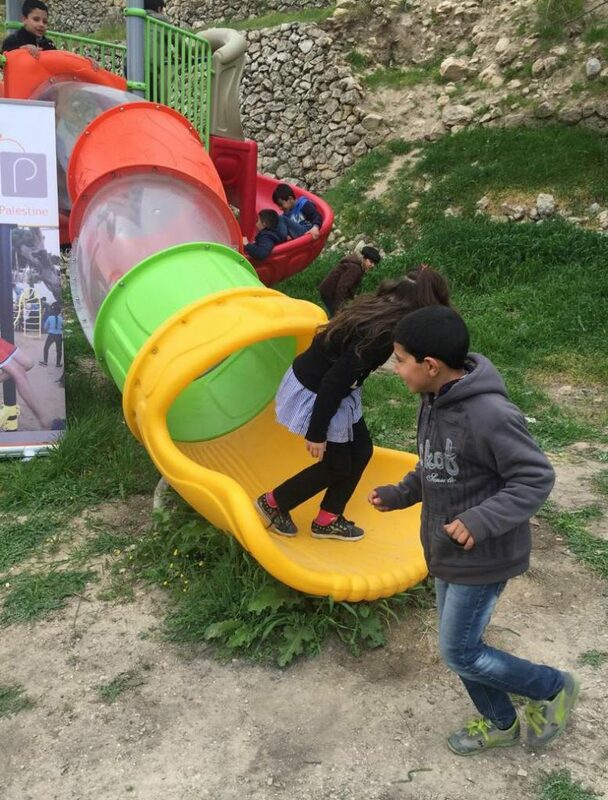 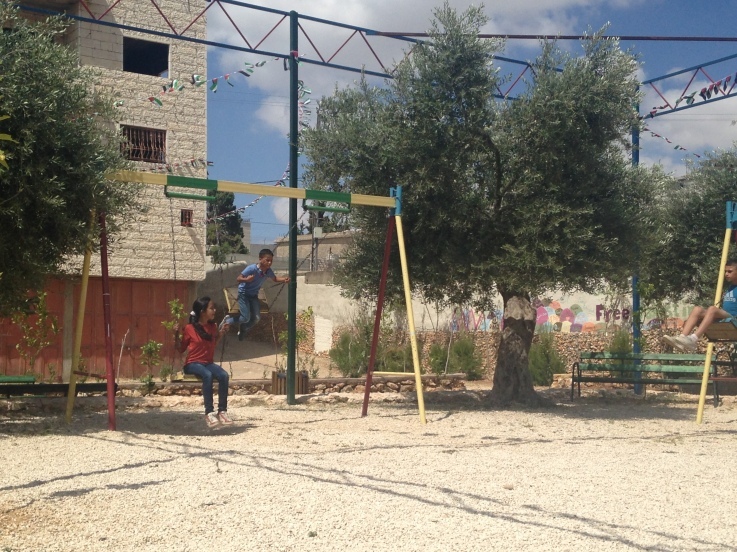 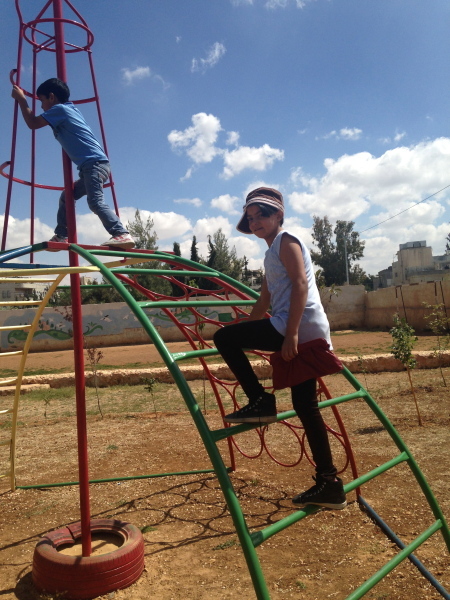 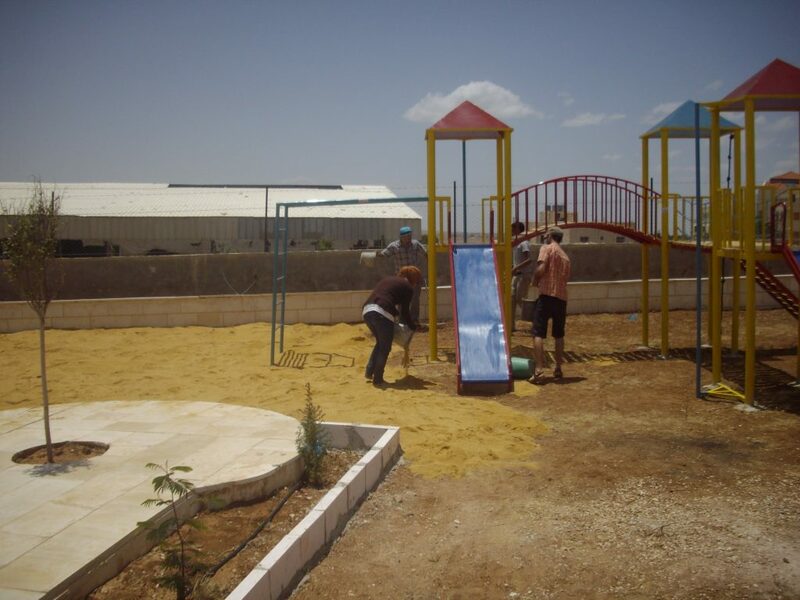 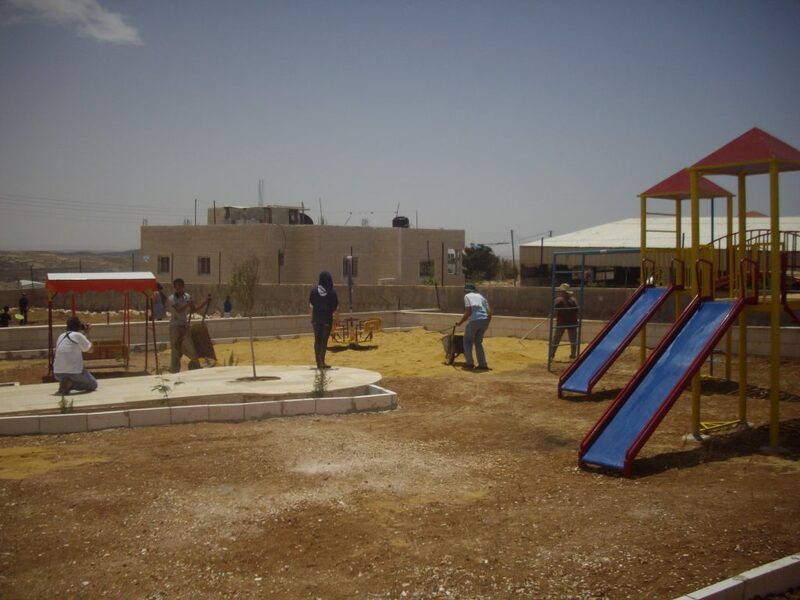 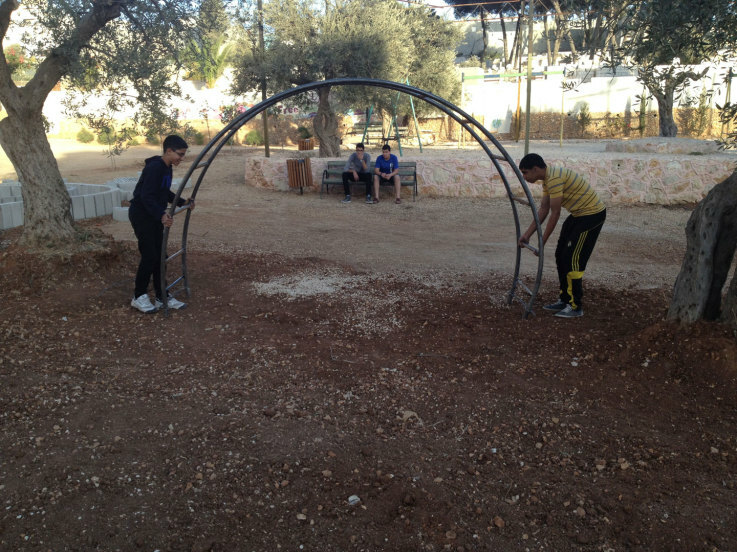 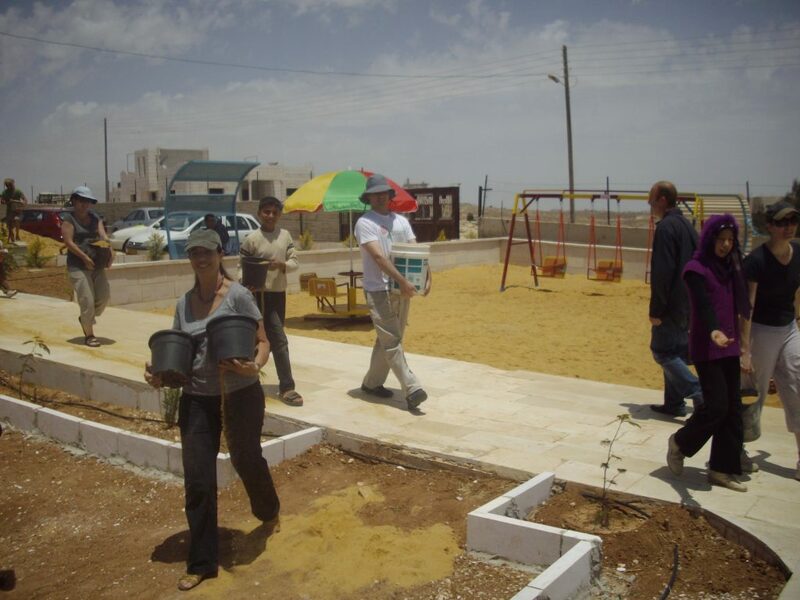 This was the first of two playgrounds built for Abir’s Garden in Al Samoa-Simya, a village on the southern-most edge of the West Bank, south of Hebron. 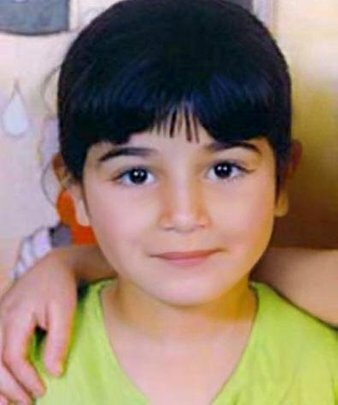 The daughter of Bassam and Salwa Aramin, Abir was a 10 year old little girl who was shot and killed by an Israeli sniper. 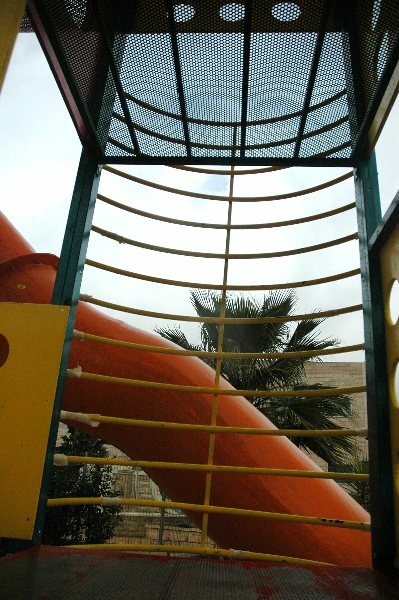 This playground was built in her honor. 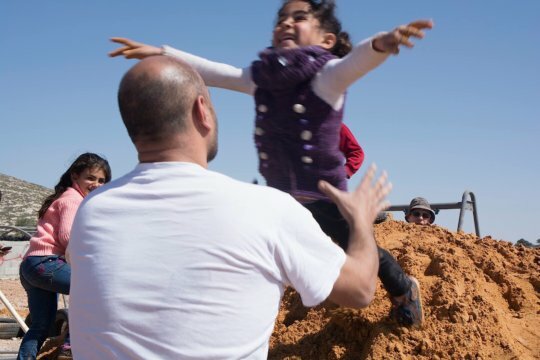 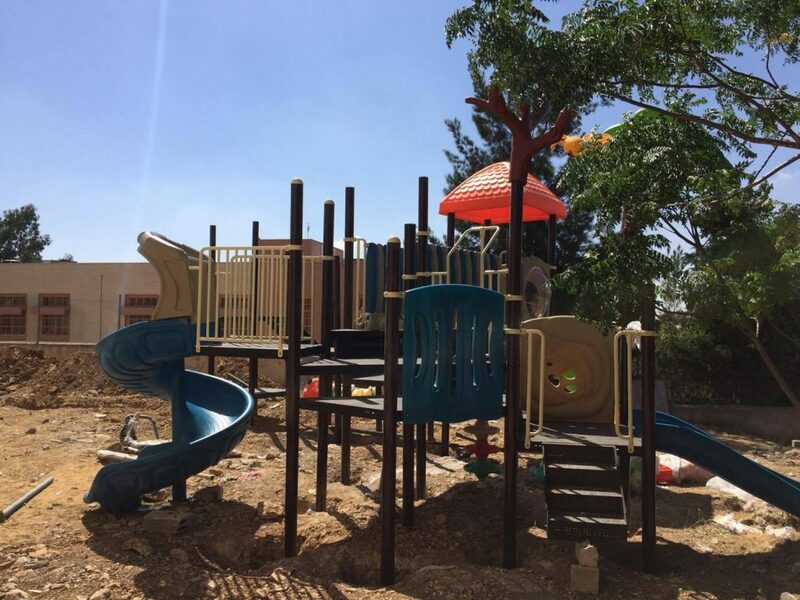 As our community garden and play space was coming together at Aida Refugee Camp, families were overhead saying that “It’s like a piece of paradise”, and that’s even before the construction is completed! 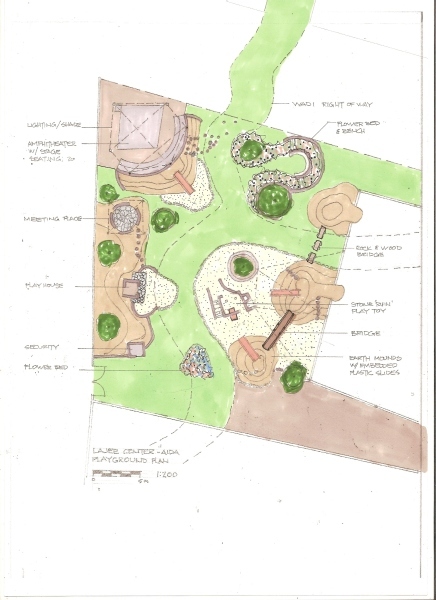 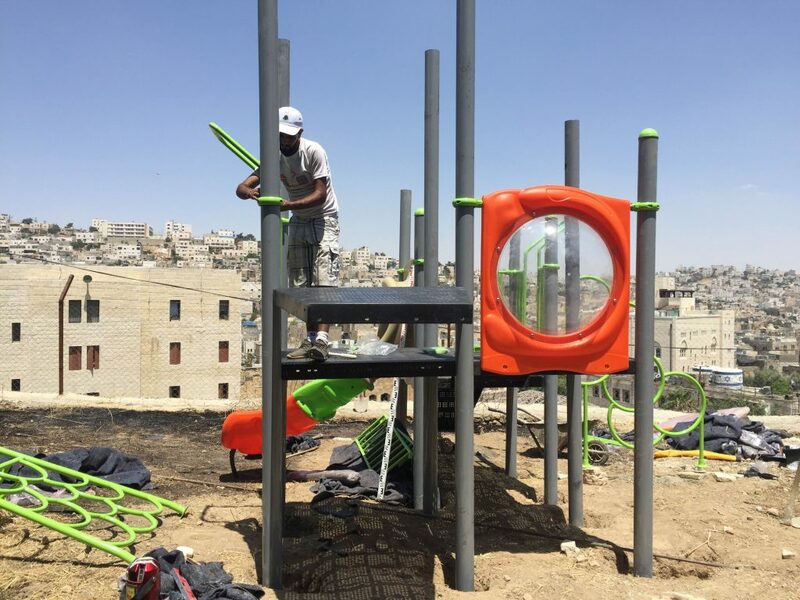 Designs for the site were completed in August thanks to our friends at the Lajee Center and playground architect Sam Kornhauser. 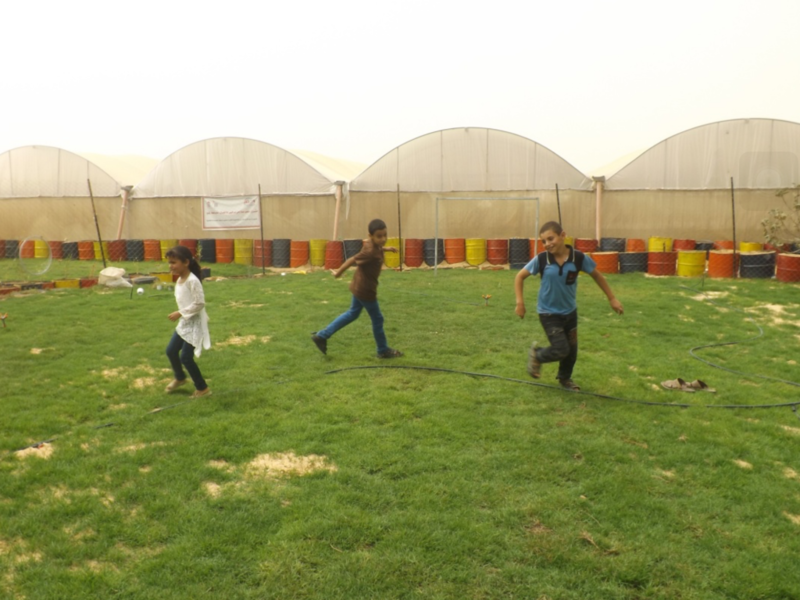 Center was established in Aida Refugee Camp in April 2000 by a group of 11 young people from the Camp who wanted to serve the community. 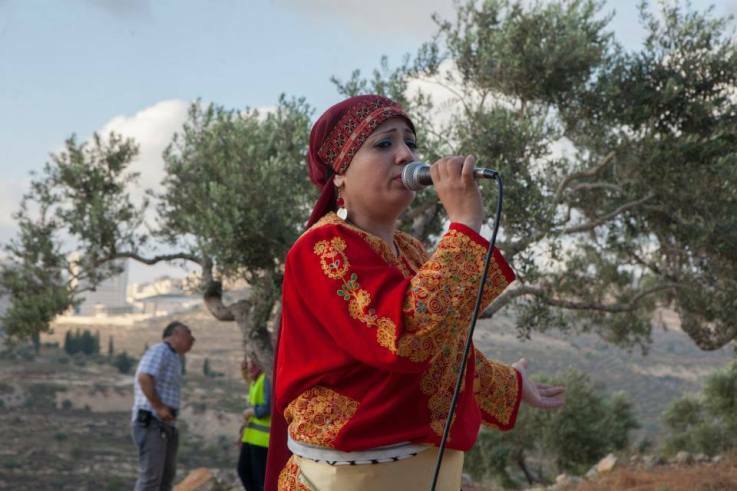 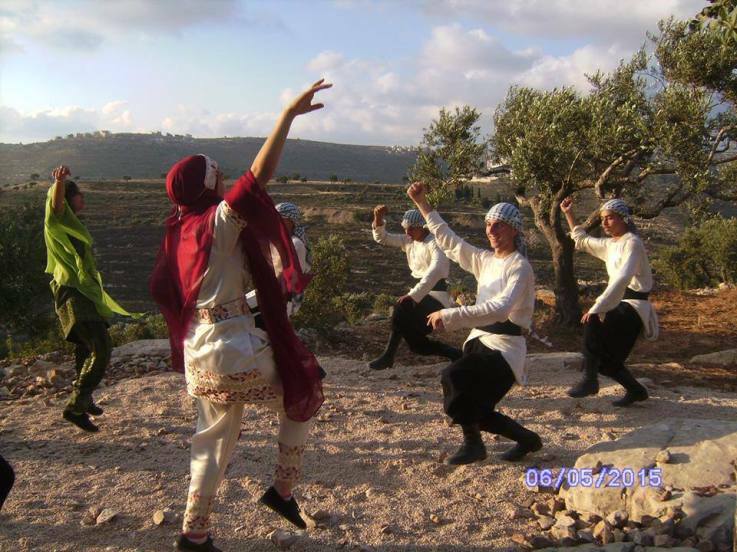 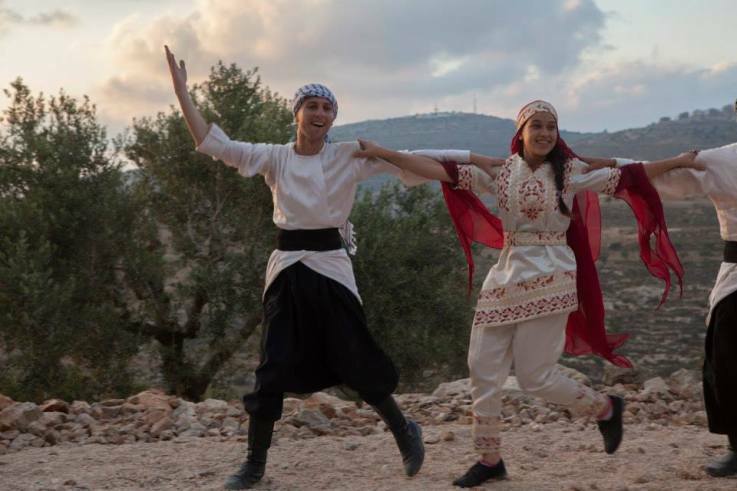 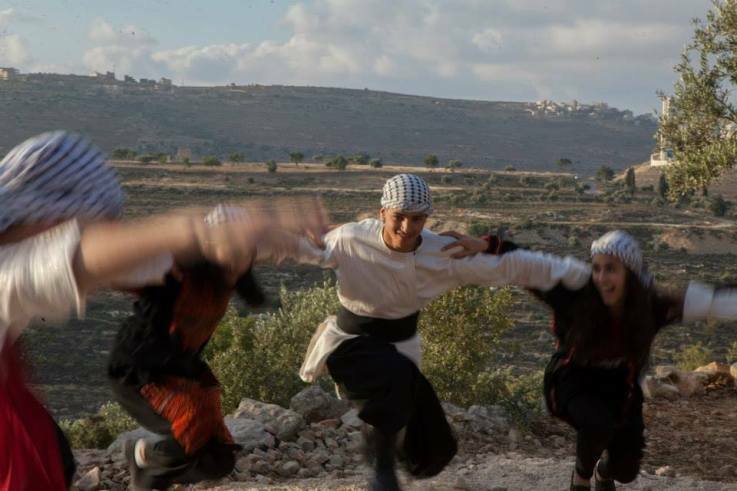 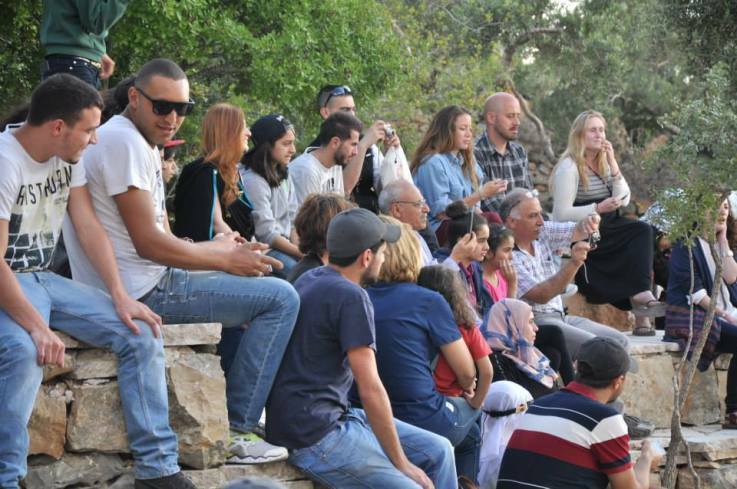 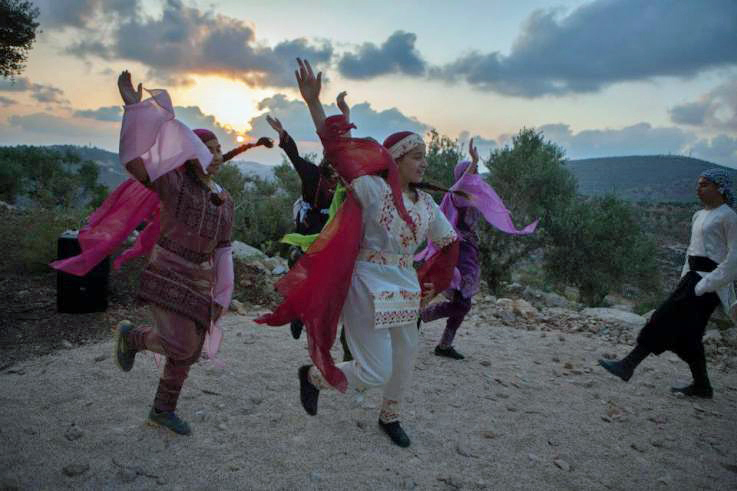 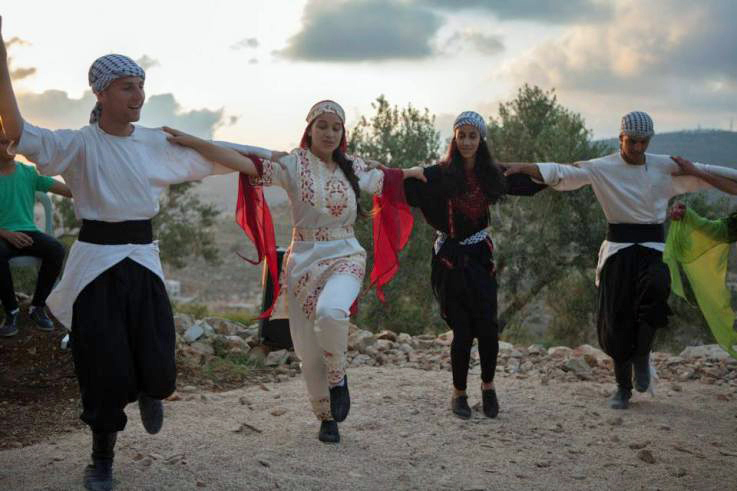 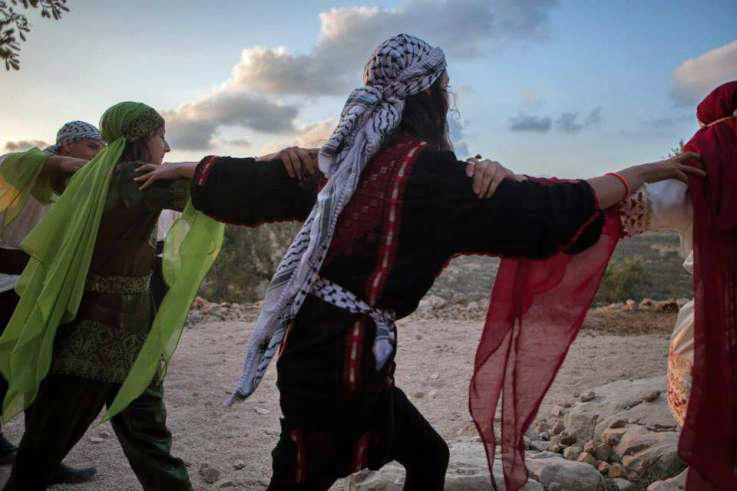 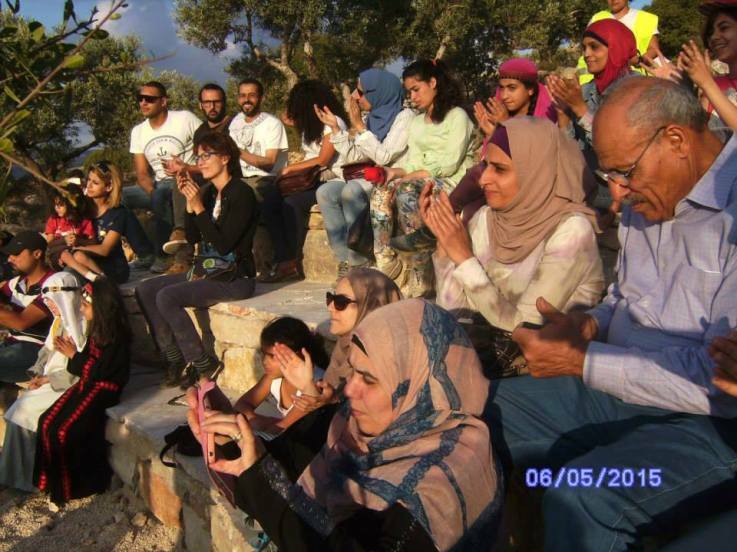 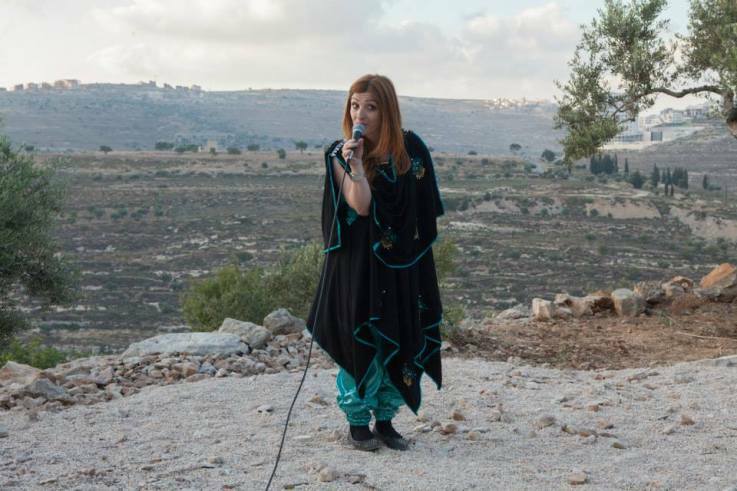 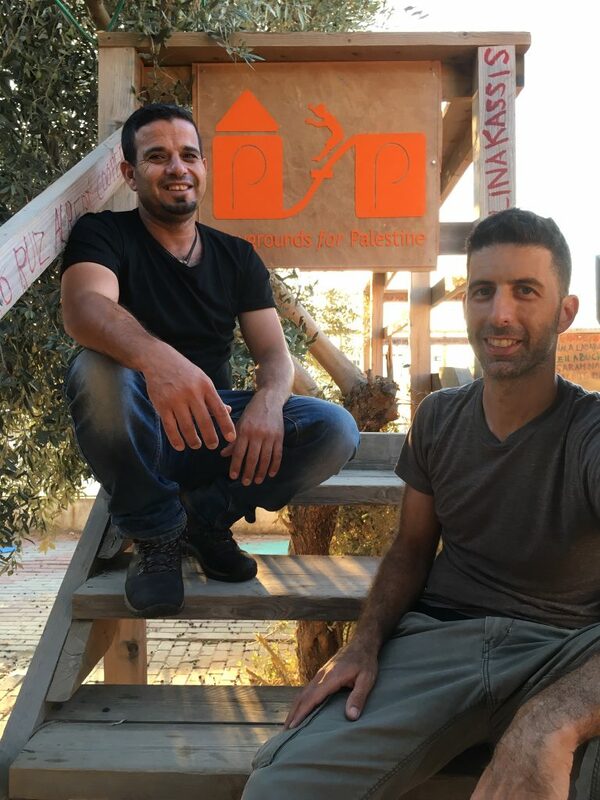 Lajee is a community-based grassroots creative cultural centre that works with new generations of Palestinians as they continue their ongoing struggle for justice and rights for Palestine and all Palestinians. 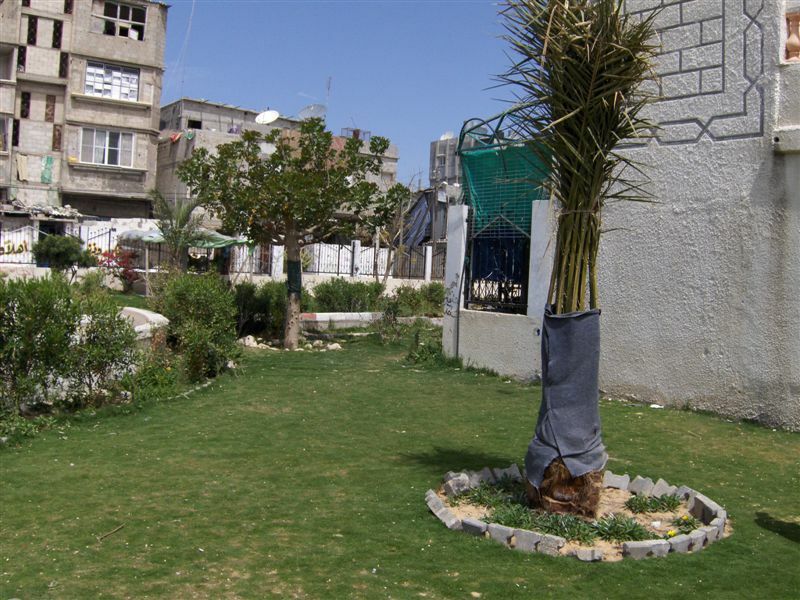 Abir’s Garden, was built in a very small village on the southern-most edge of the West Bank, south of Hebron, called Al Samoa-Simya. 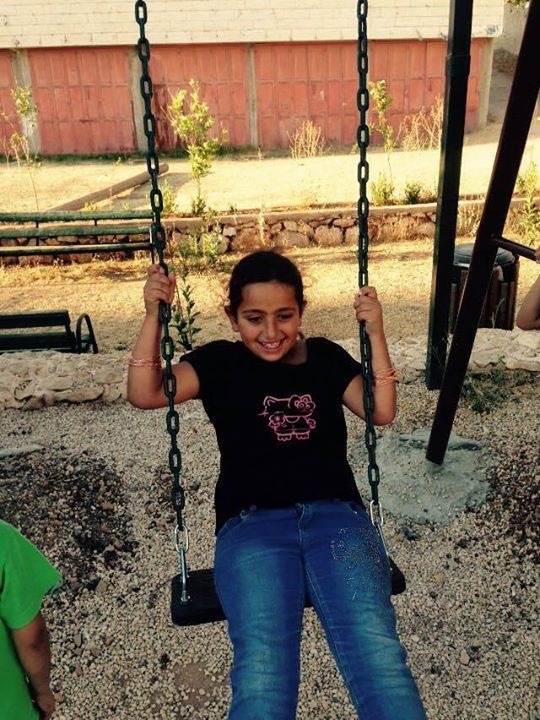 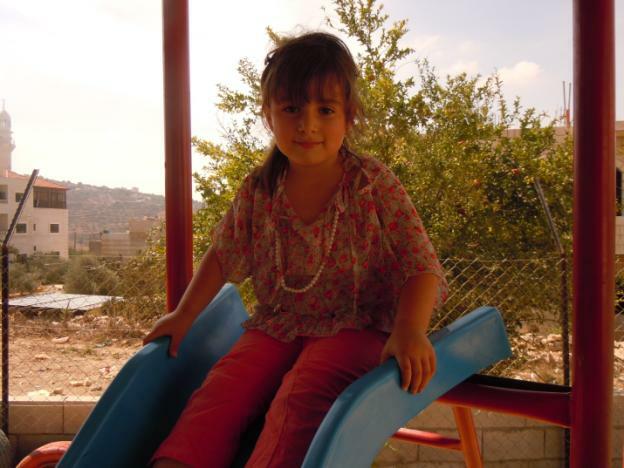 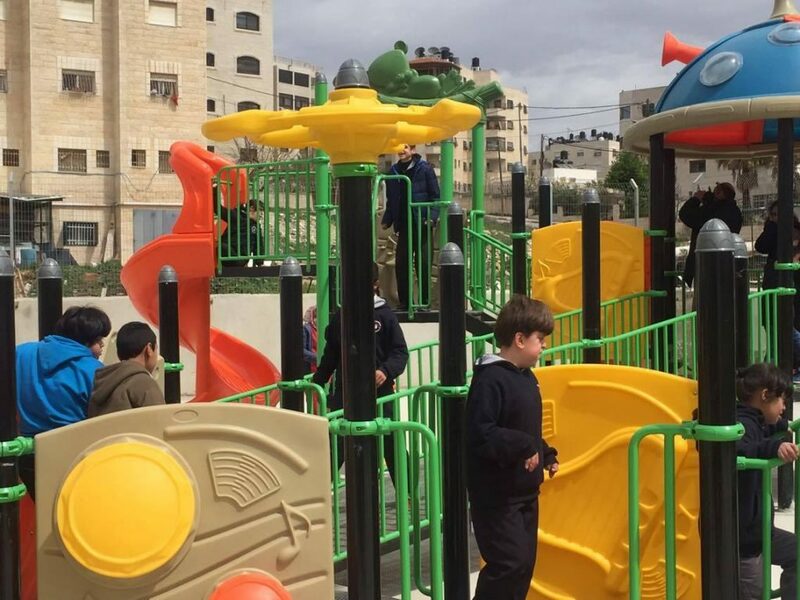 This is the second playground to be built in memory of a 10-year old girl named Abir Aramin, who was shot and killed by an Israeli sniper. 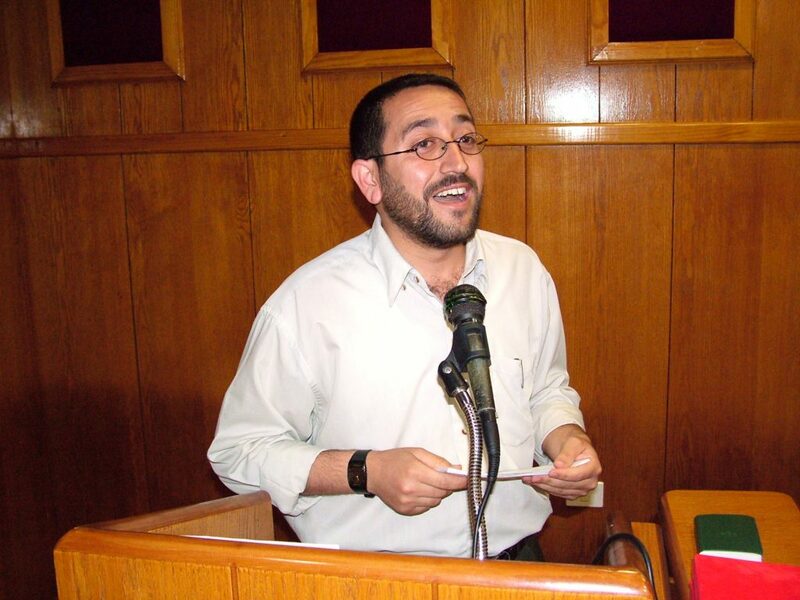 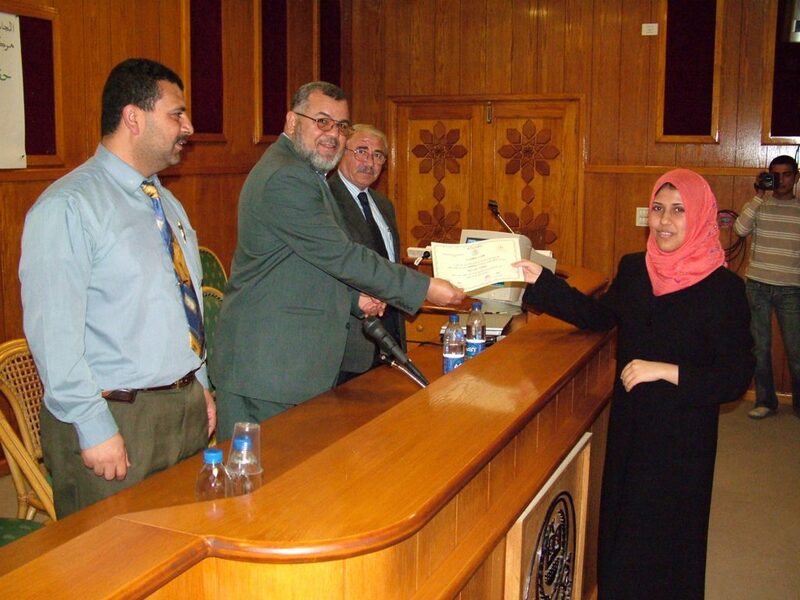 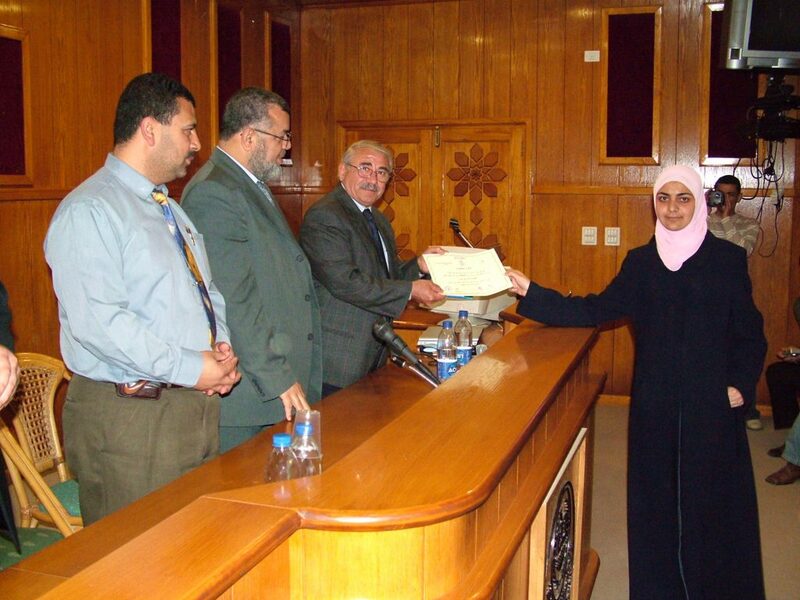 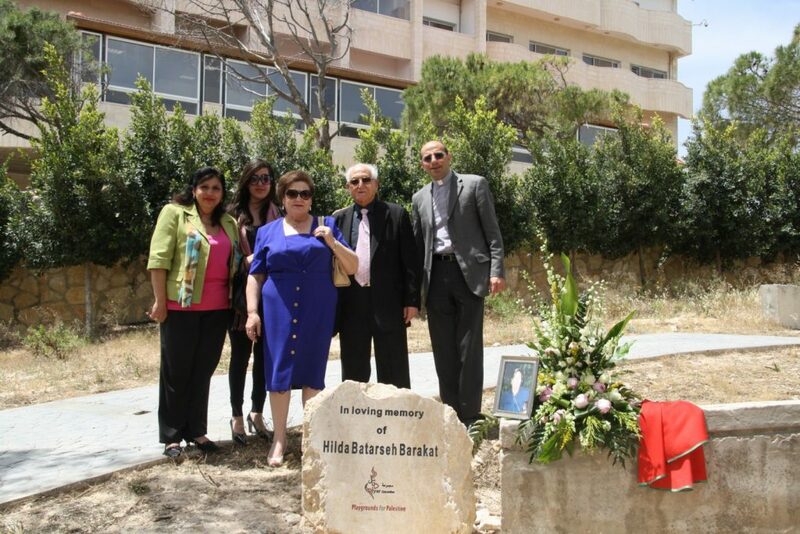 Abir was the daughter of peace activist, Bassam Aramin, a founding member of Combatants for Peace. 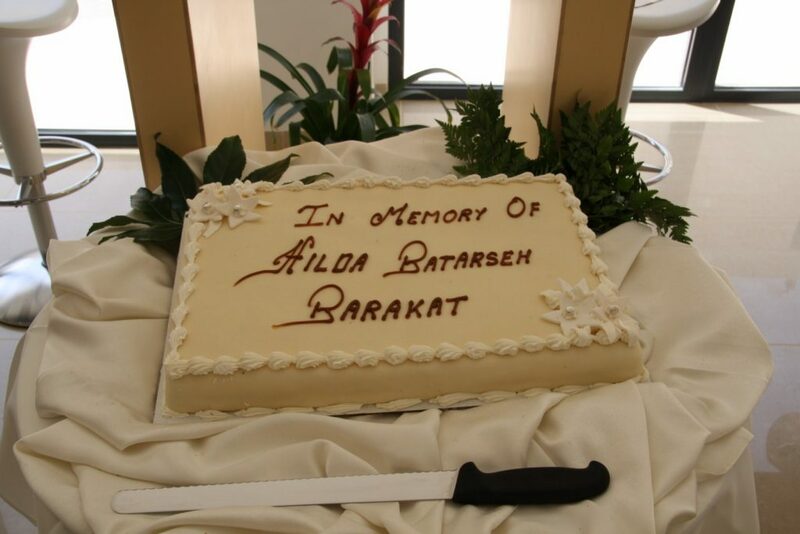 On the fourth anniversary of her death, villagers of Al Samoa-Simya for the opening ceremony of Abir’s Garden: A Safe Place to Grow. 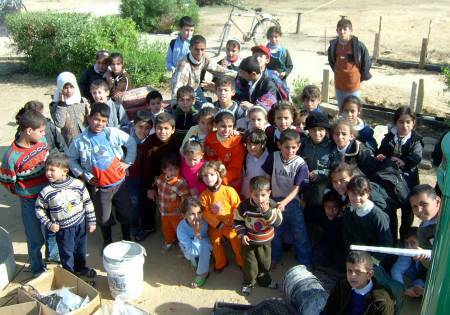 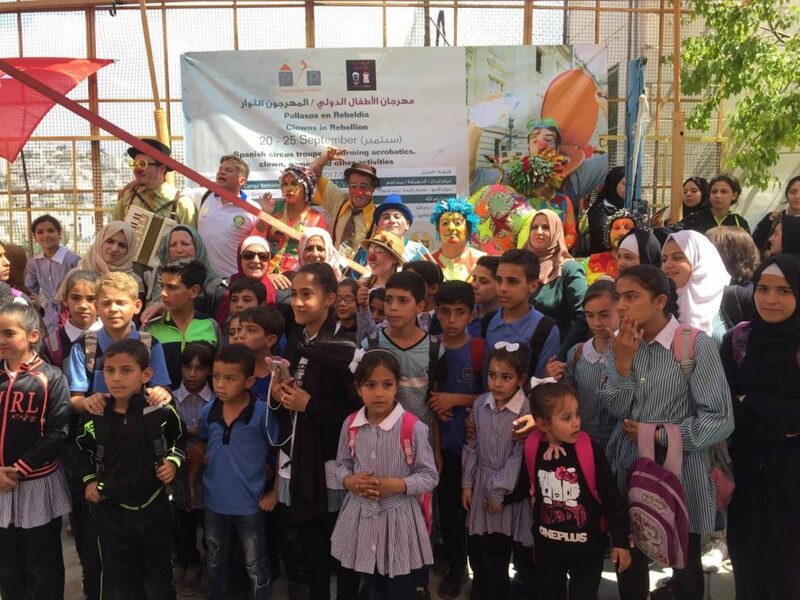 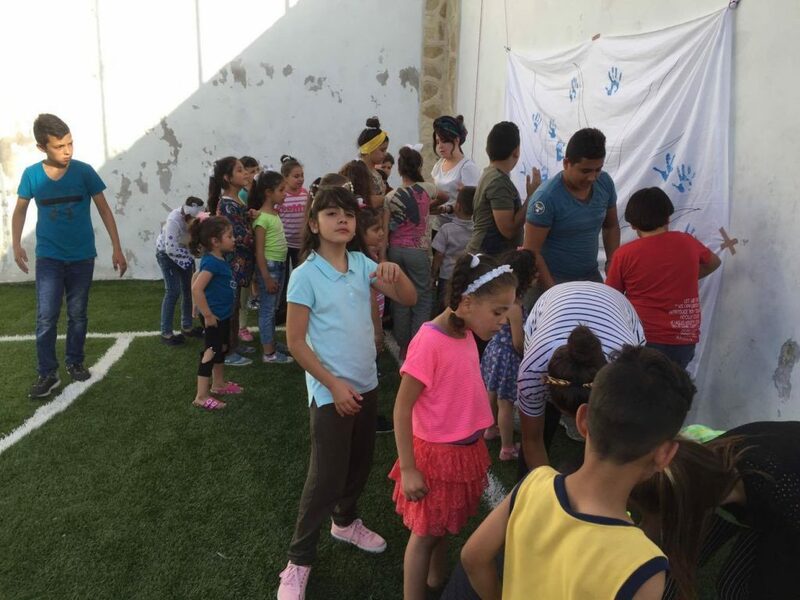 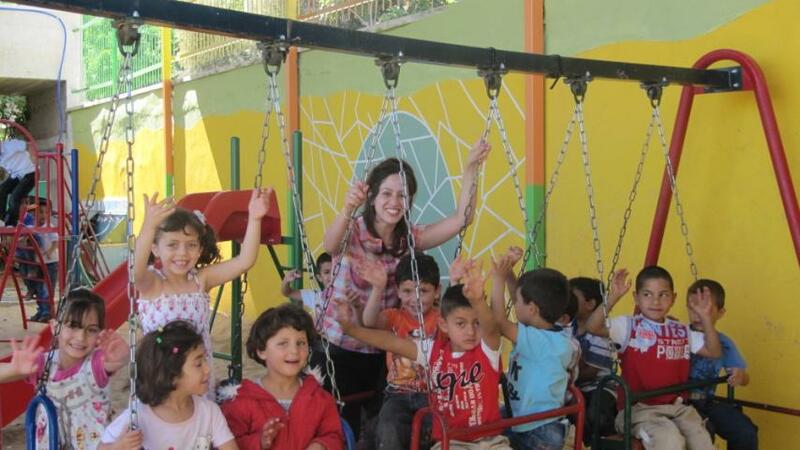 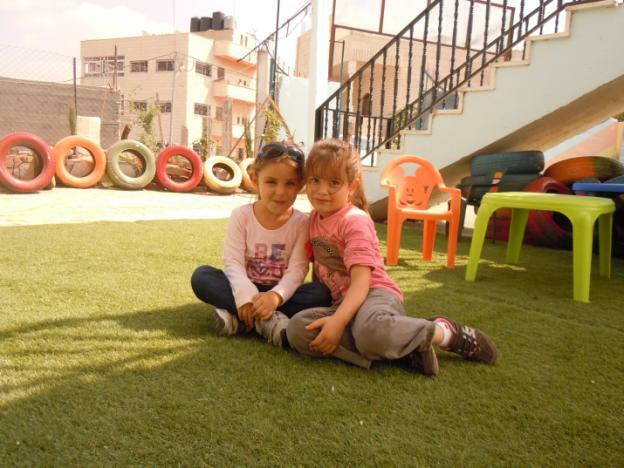 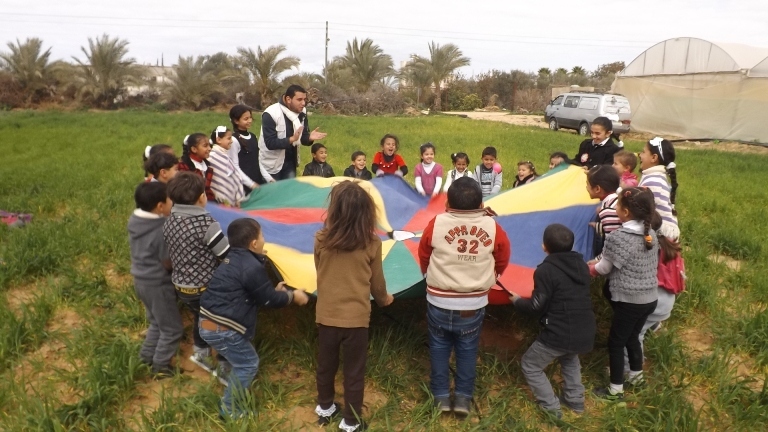 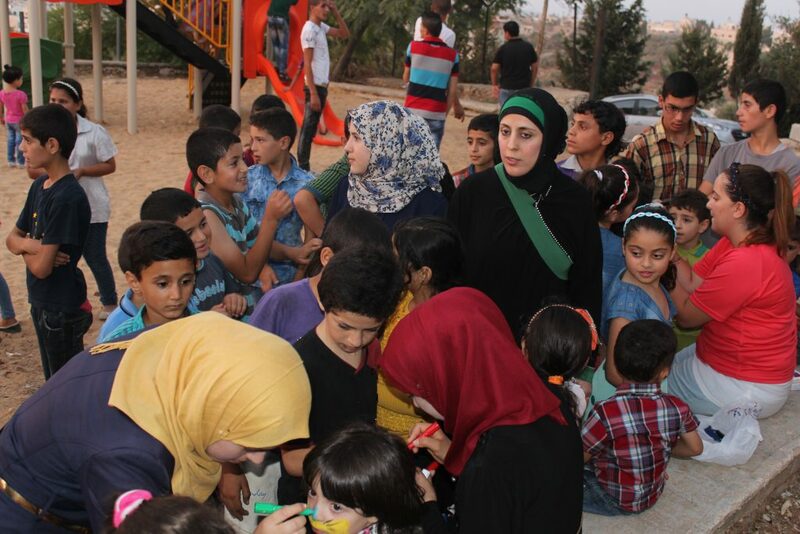 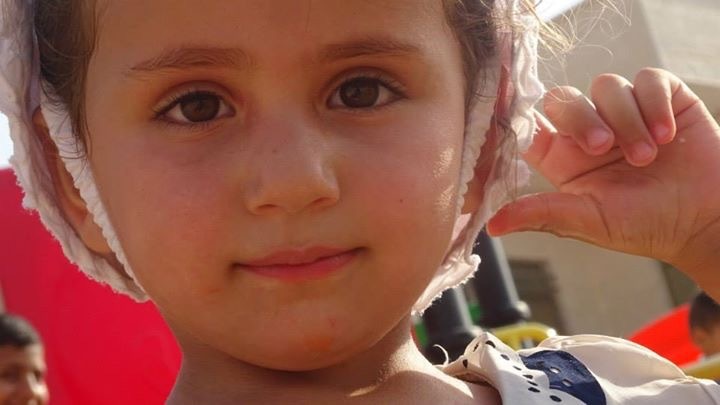 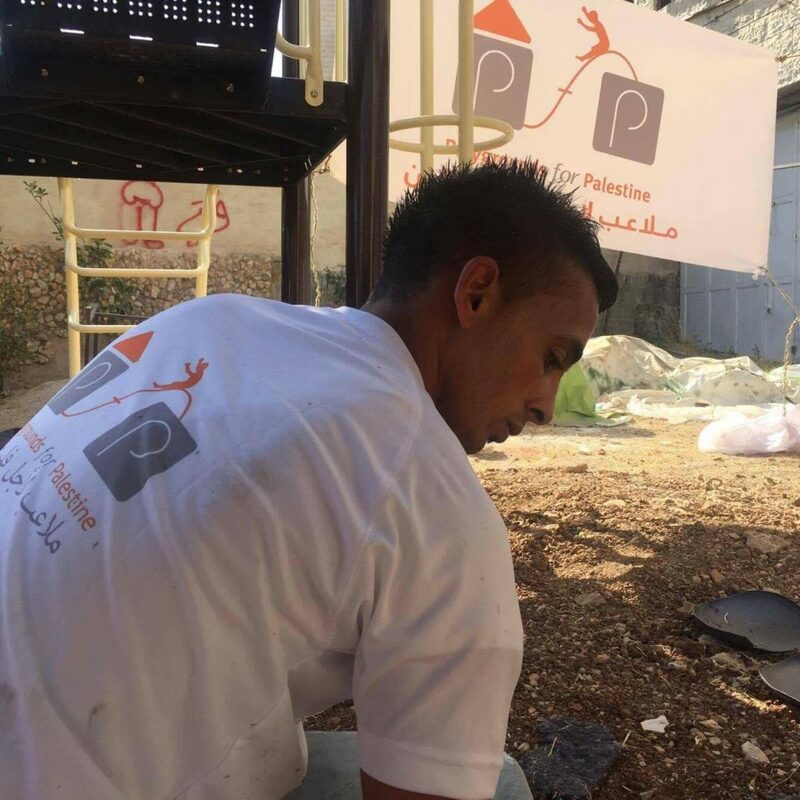 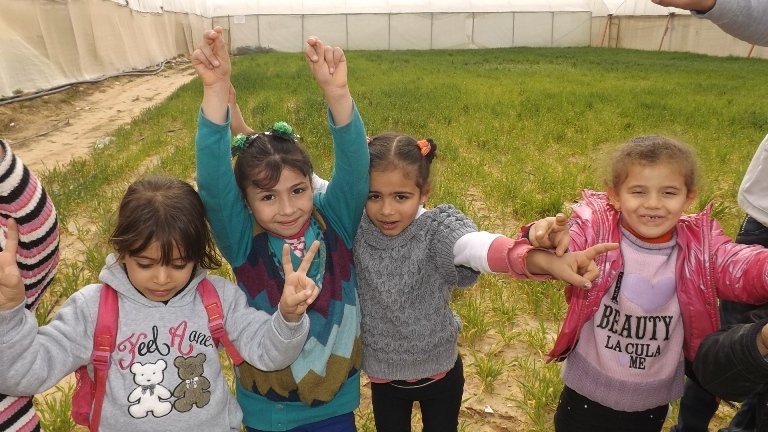 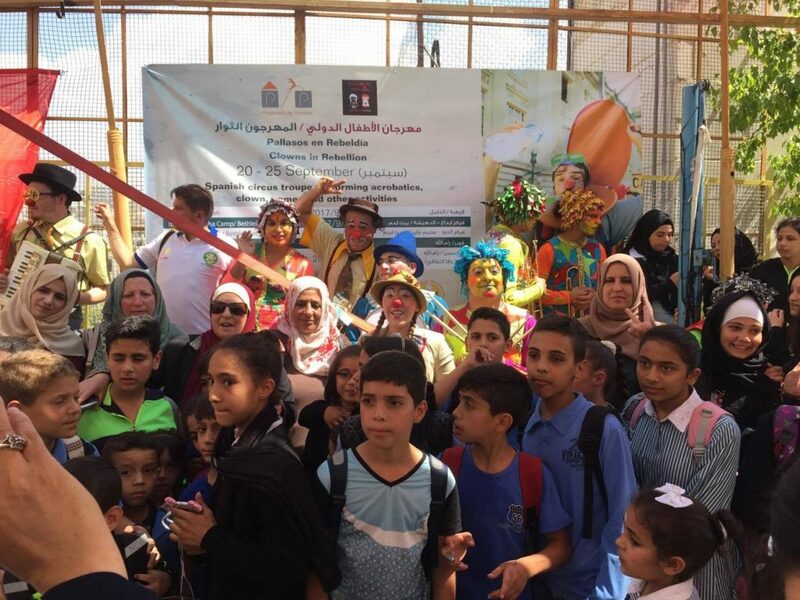 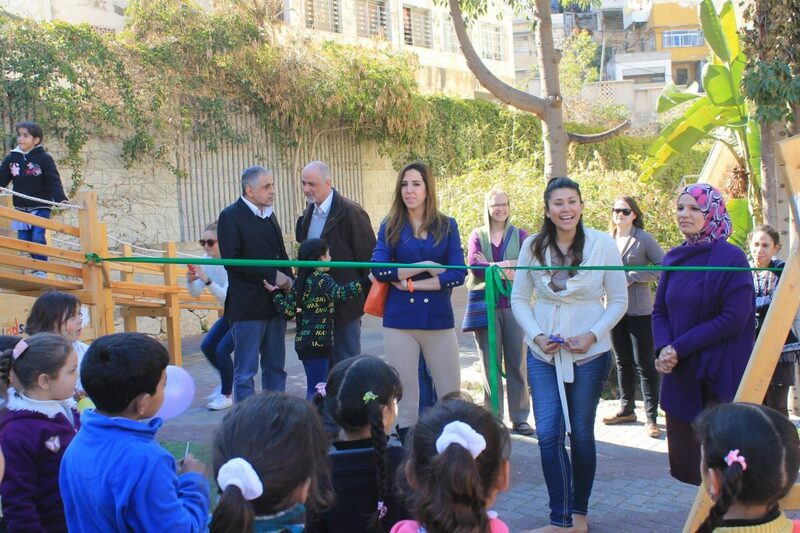 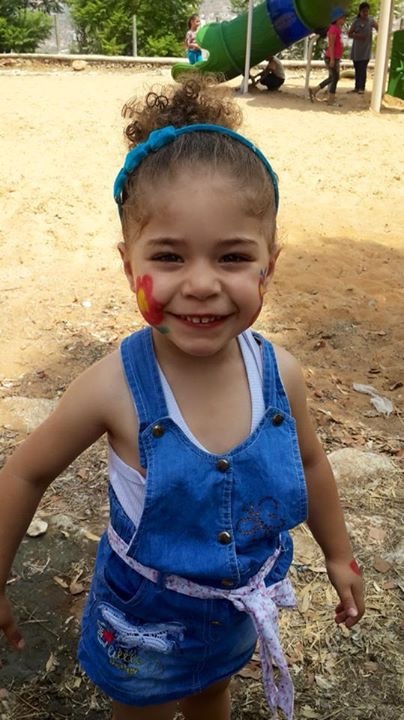 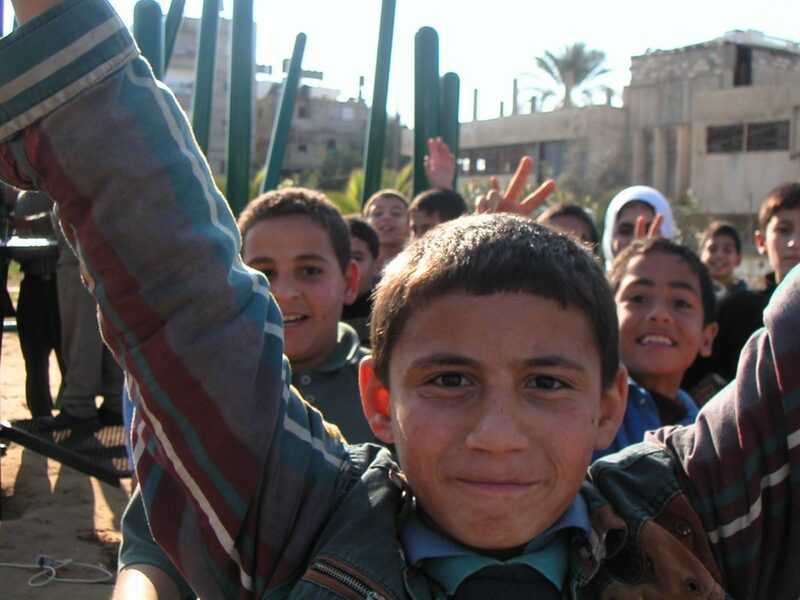 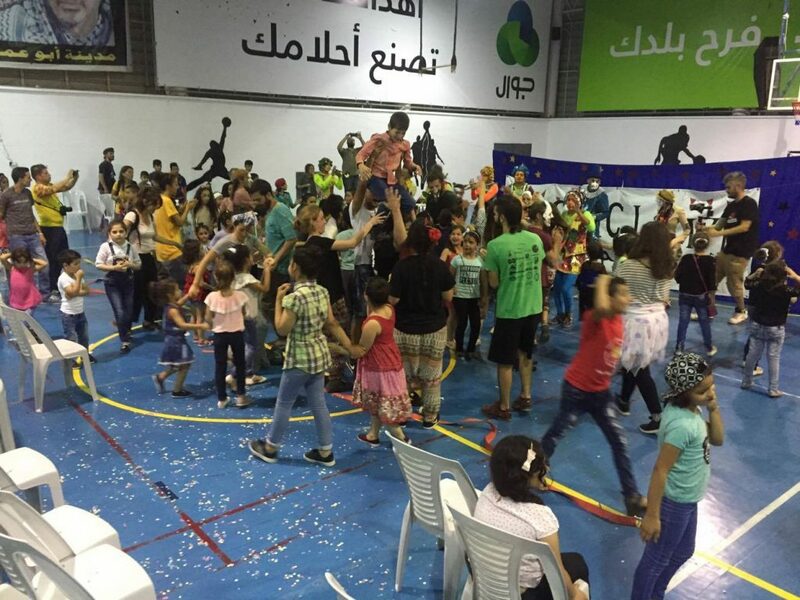 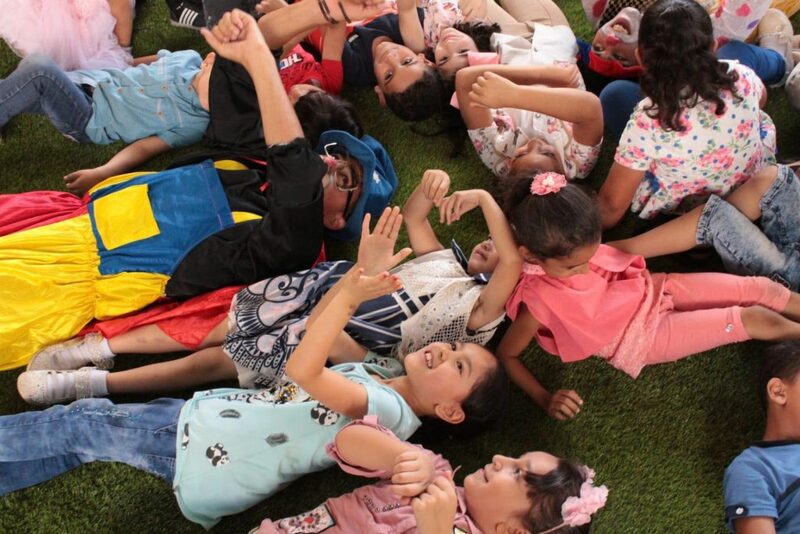 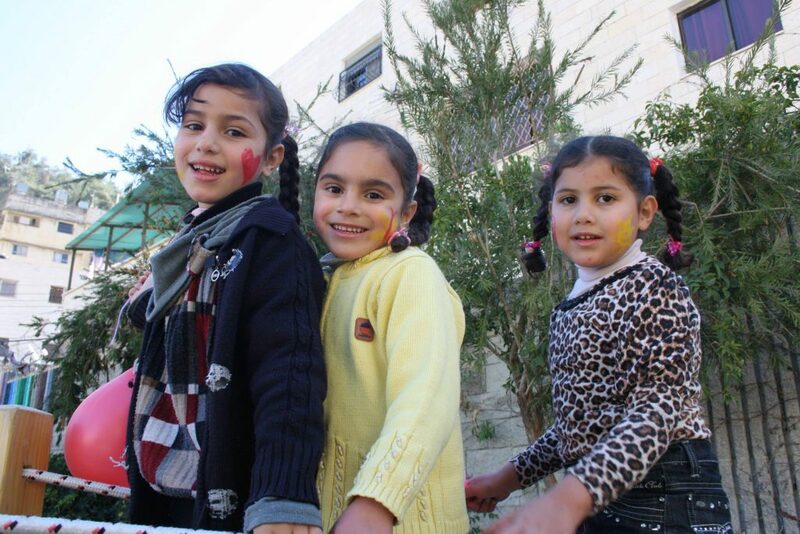 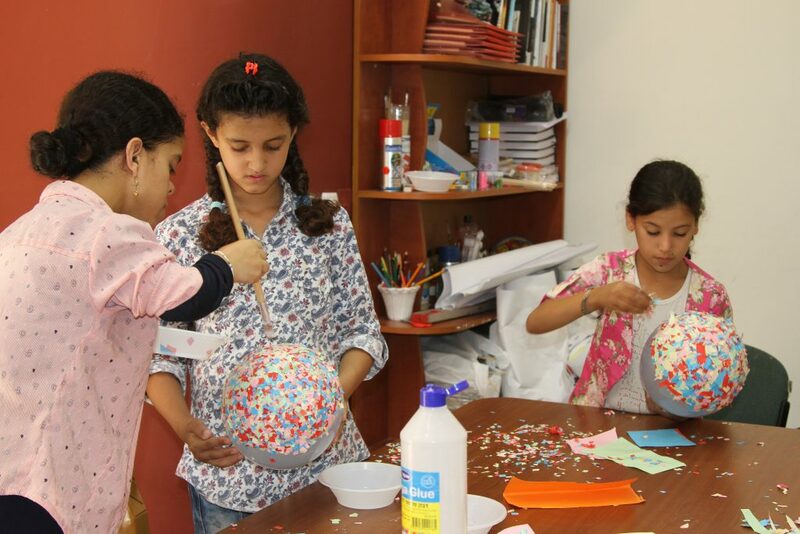 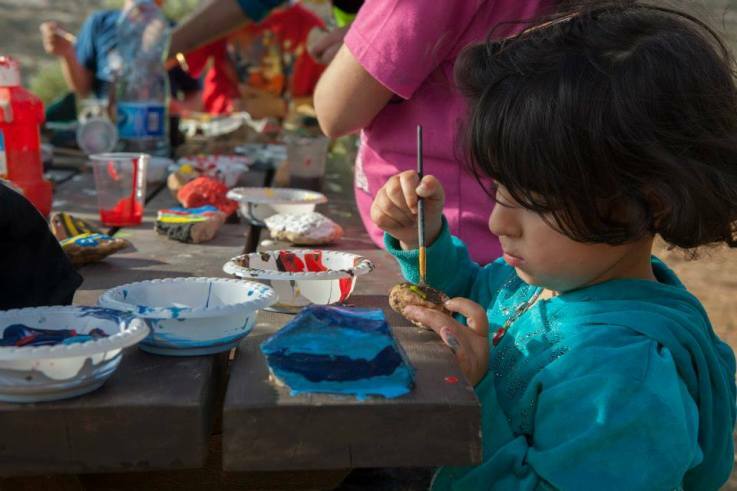 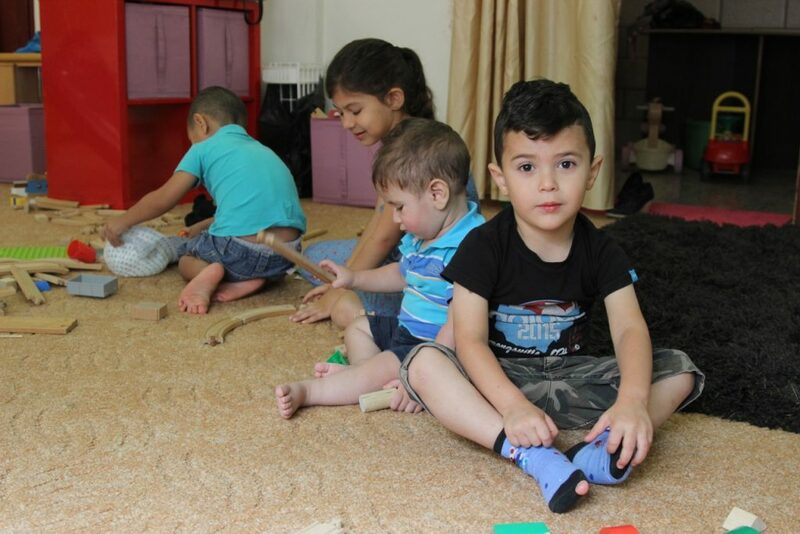 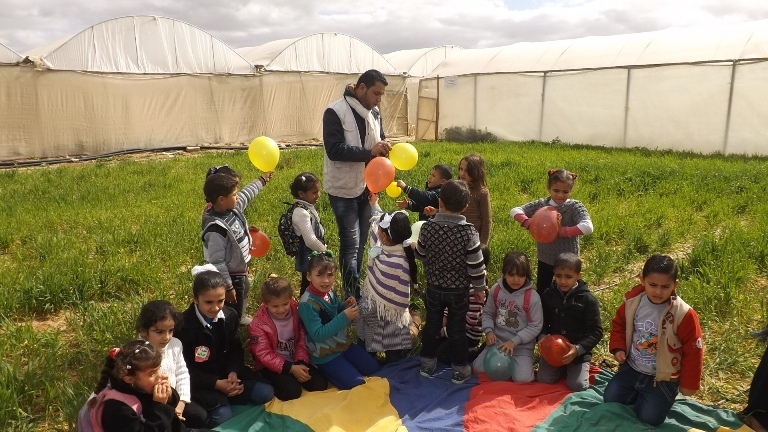 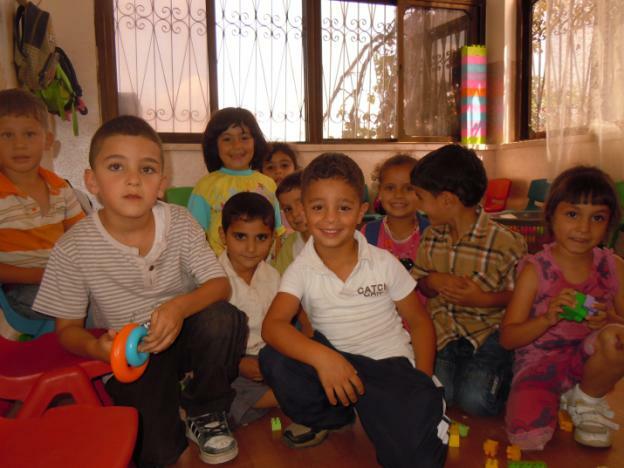 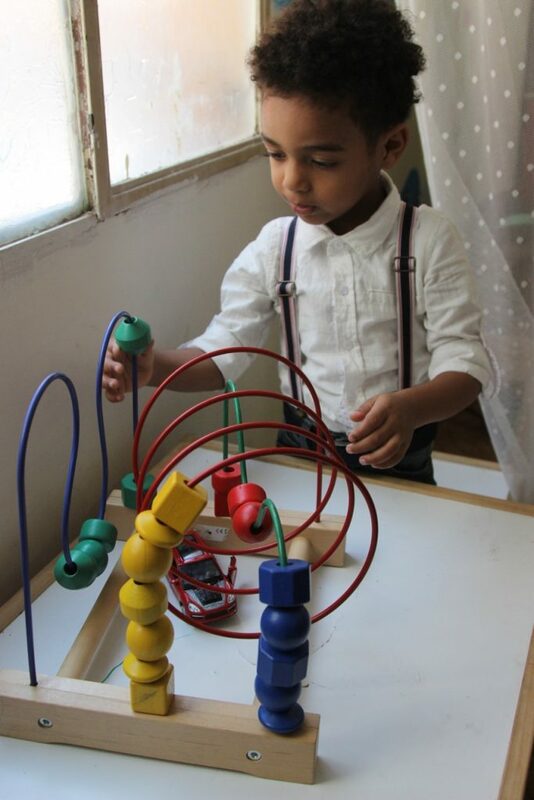 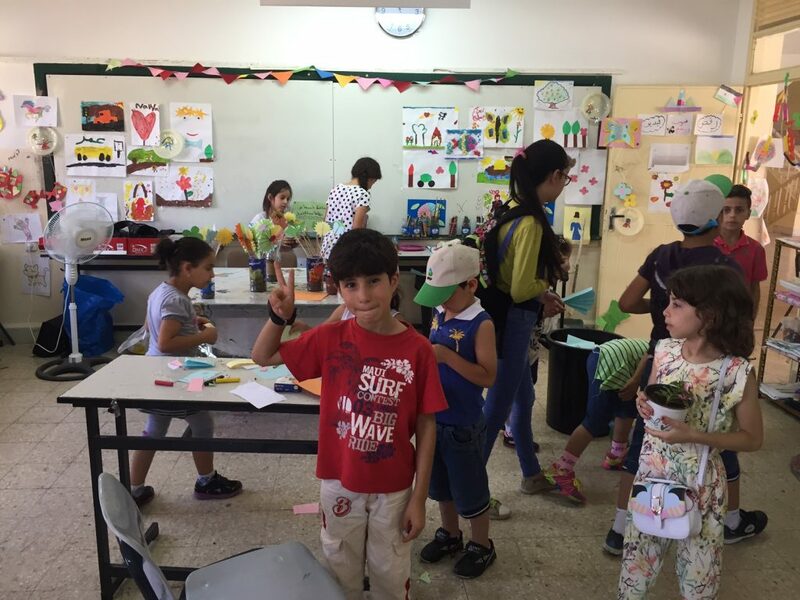 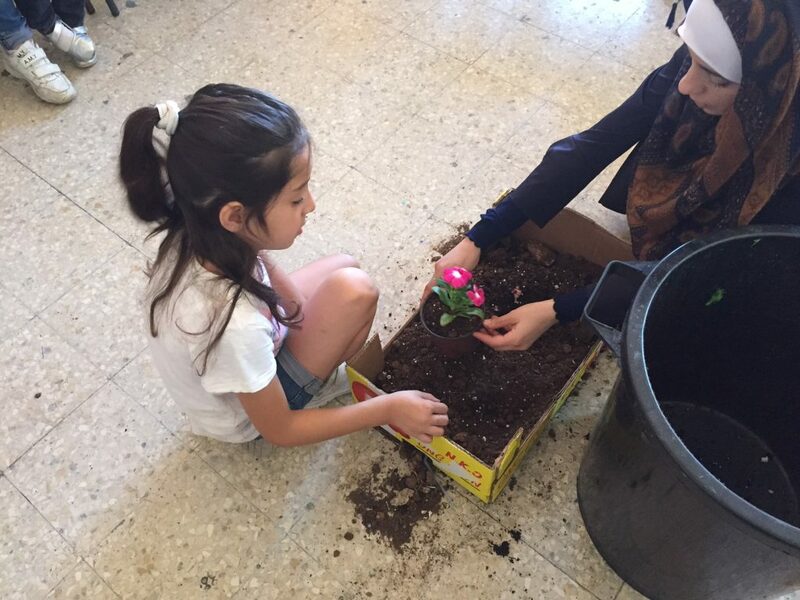 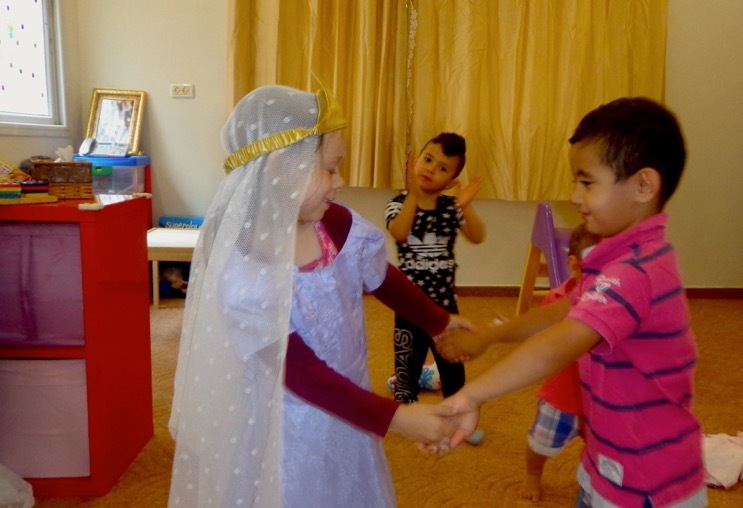 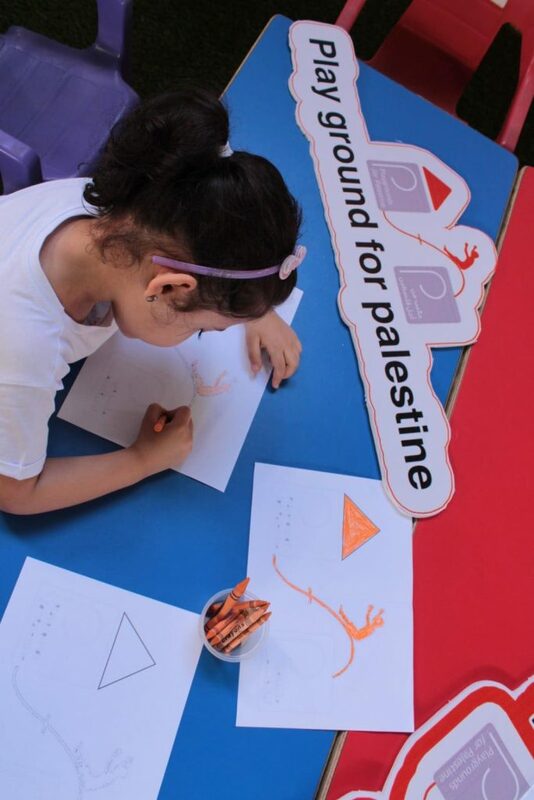 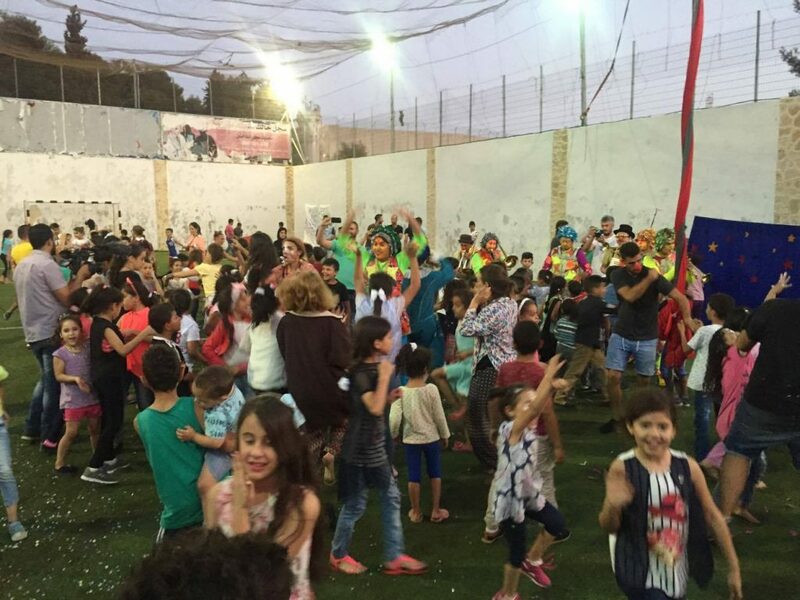 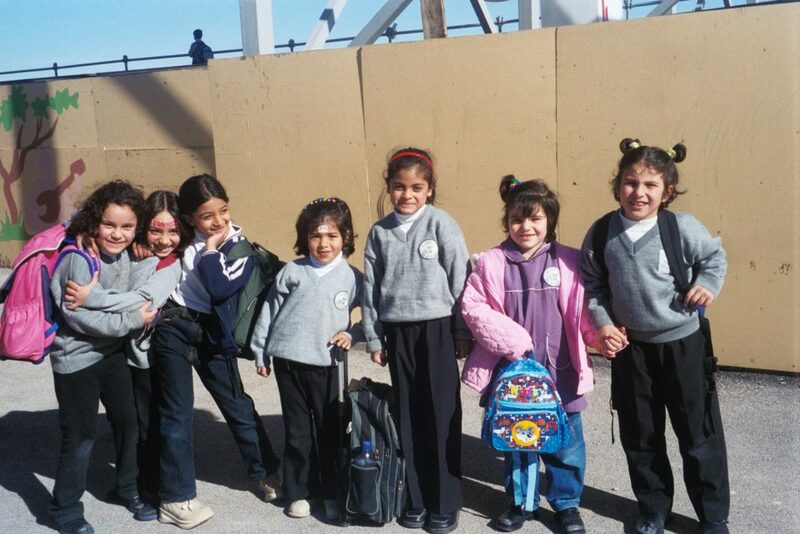 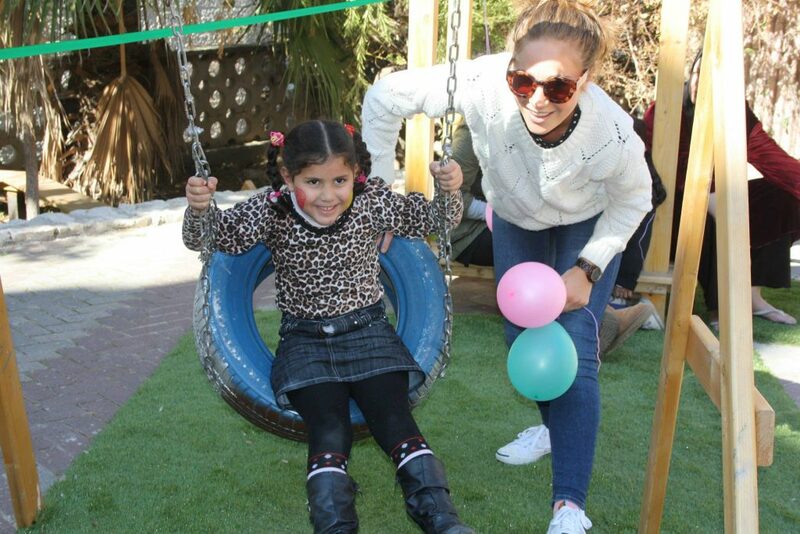 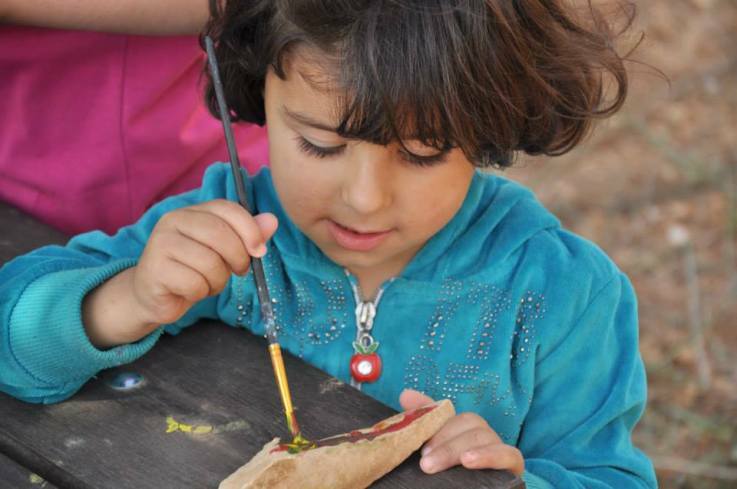 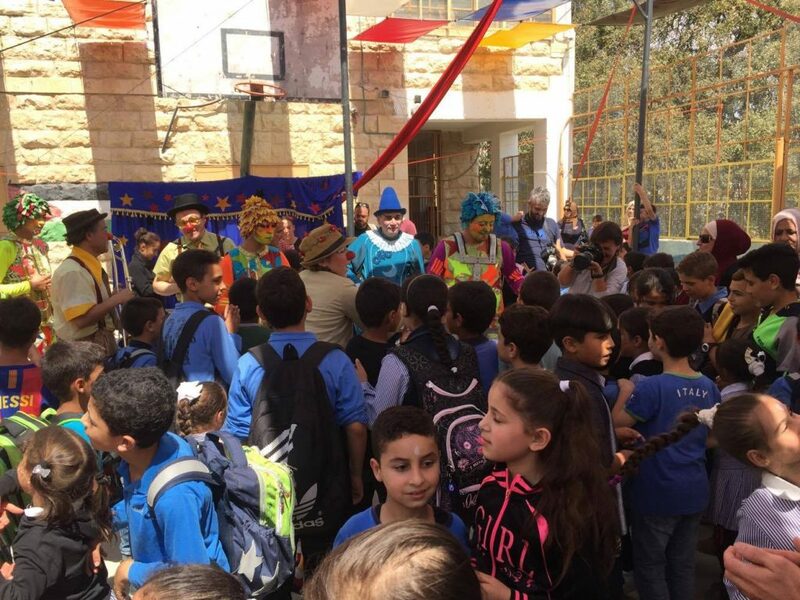 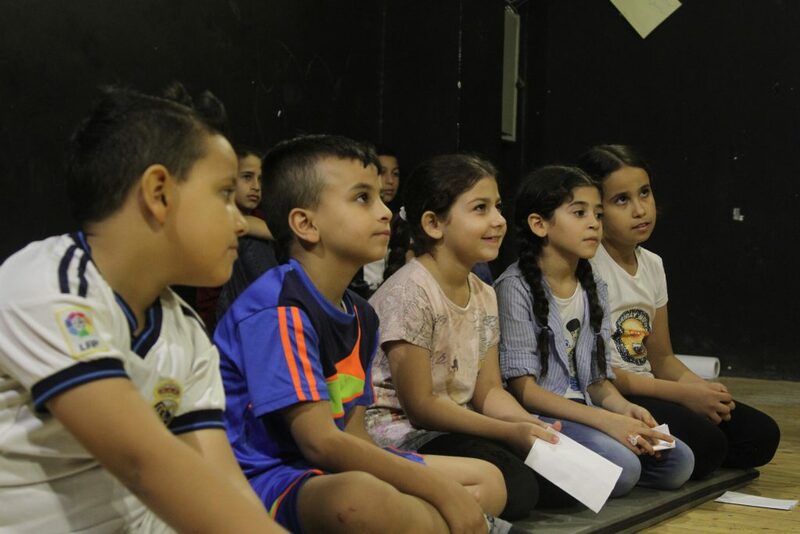 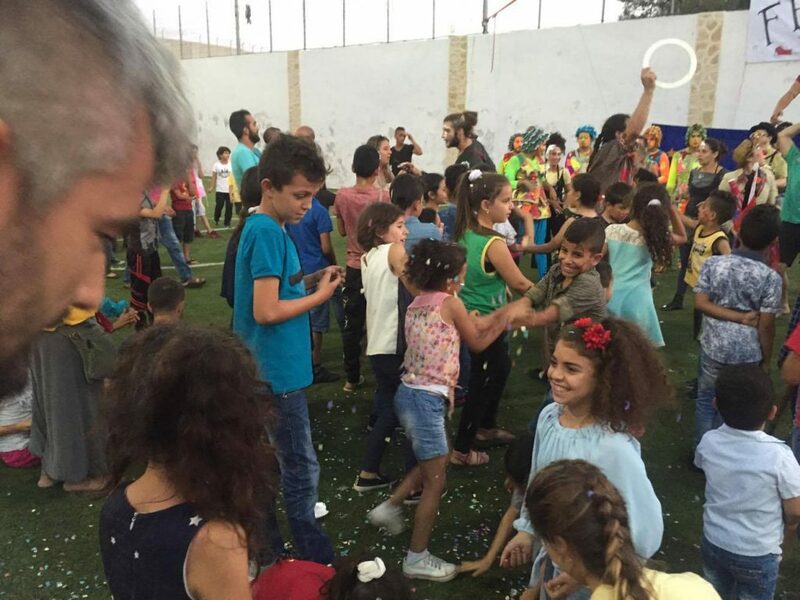 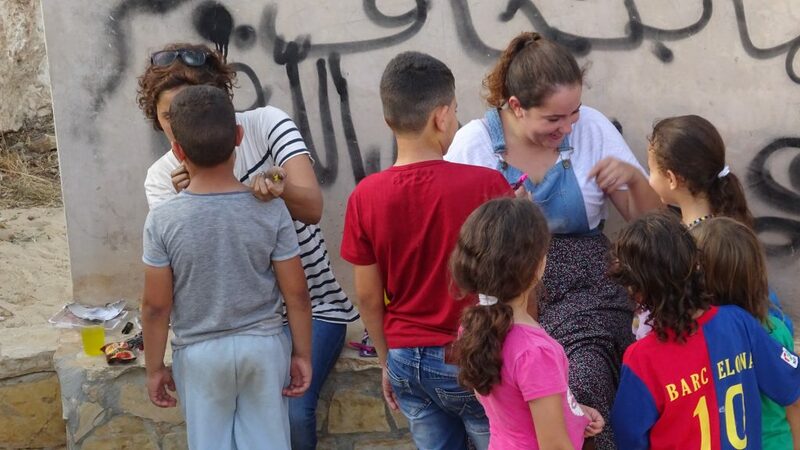 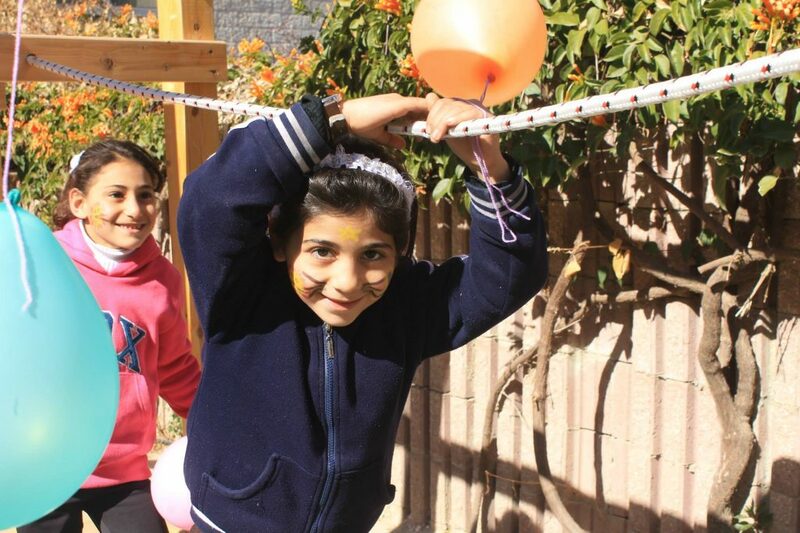 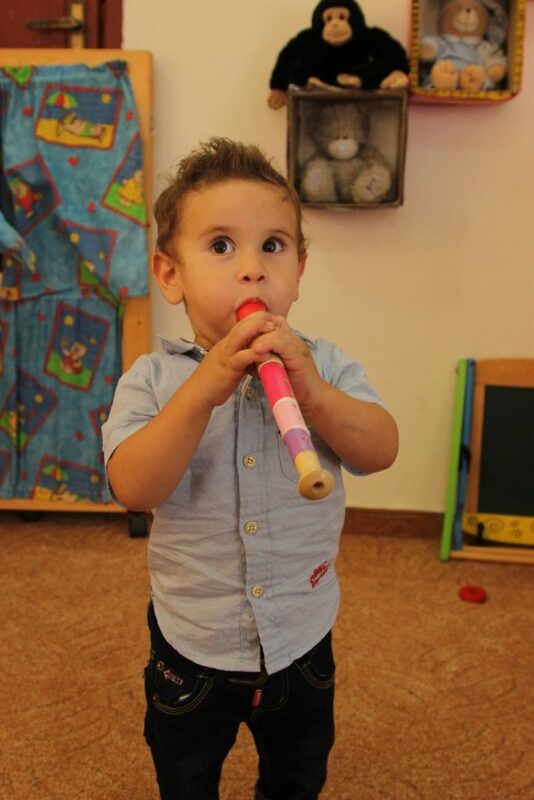 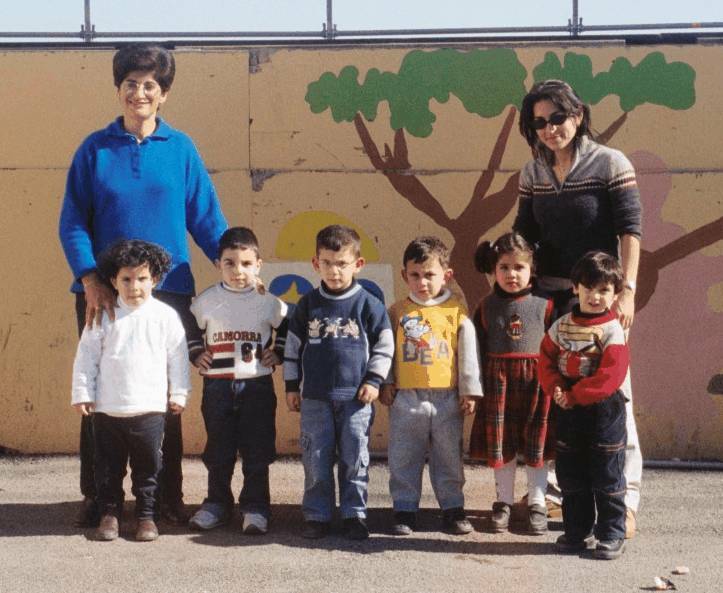 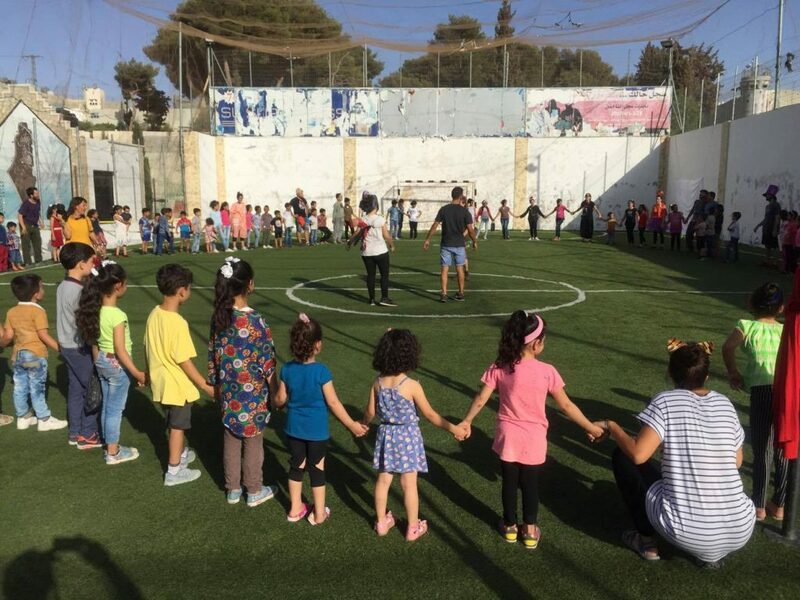 The Najdeh Association, a local NGO working with Palestinian children in refugee camps, established a preschool in Ein El-Helweh Refugee Camp in Saida, which serves a community of Palestinian refugees. 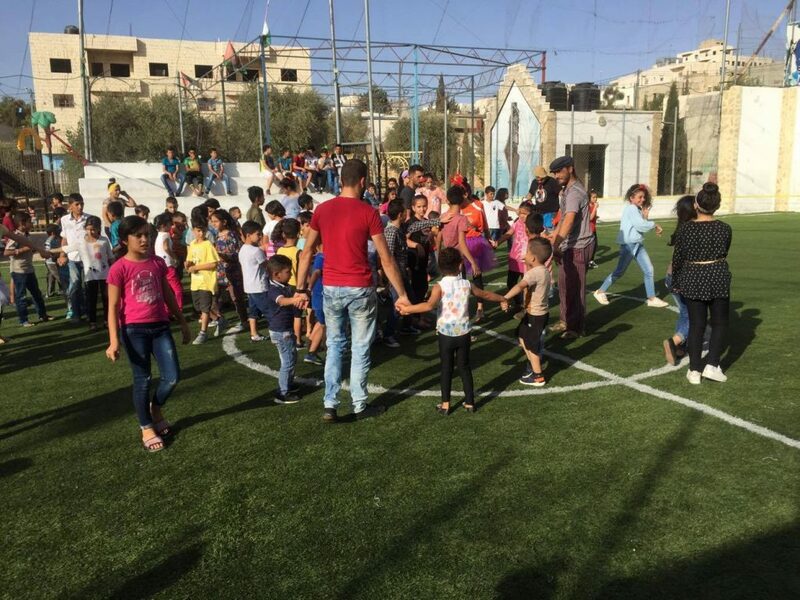 The preschool serves around 90 children, ages 3 to 5, in the mornings Sundays through Thursdays and hosts youth activities on Fridays and Saturdays for 90 to 100 kids, ages 7 to 14. 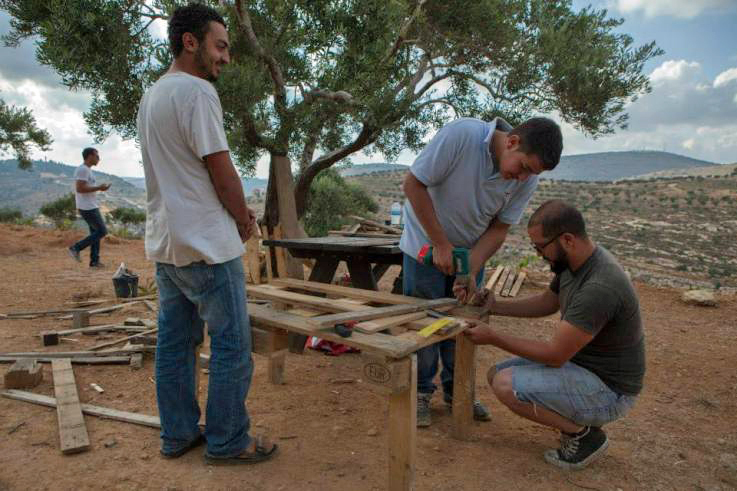 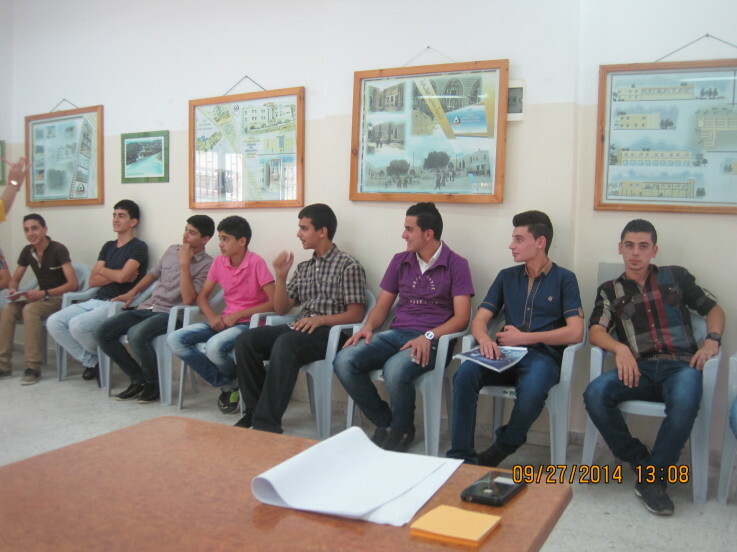 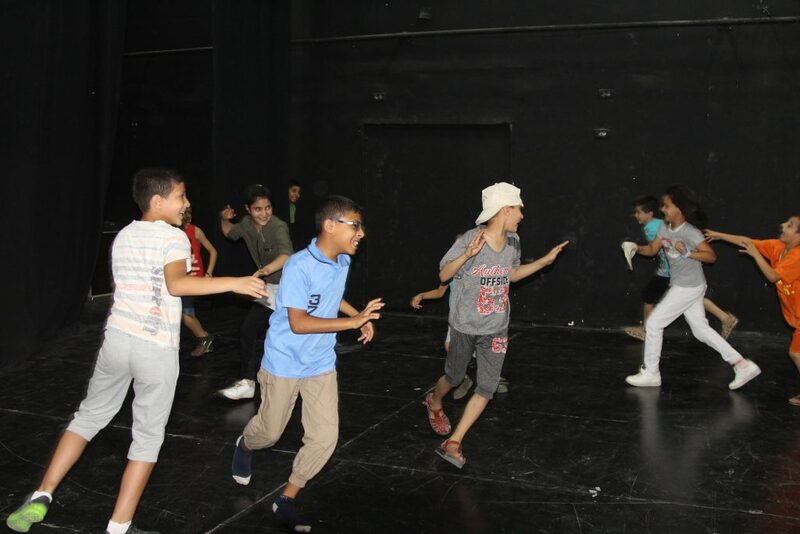 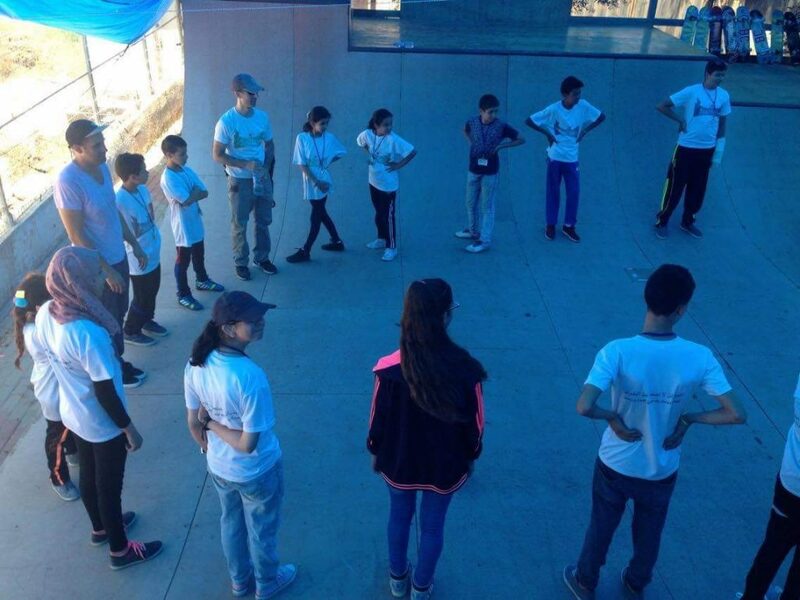 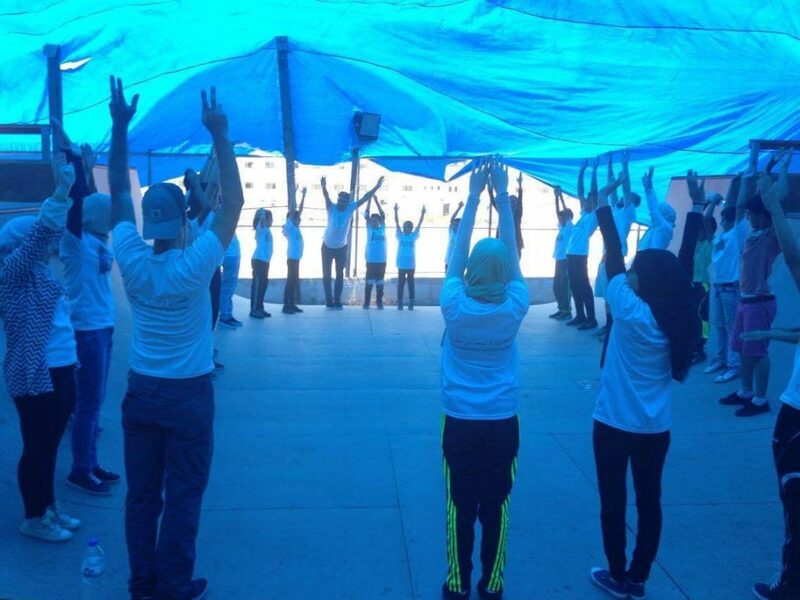 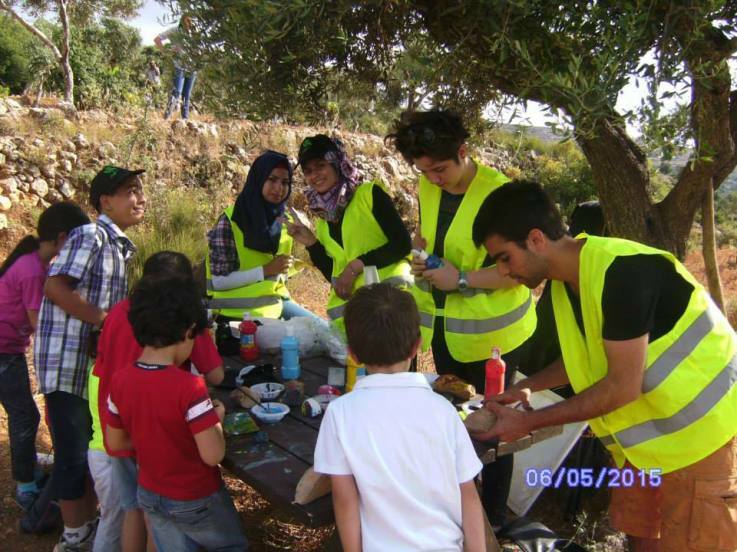 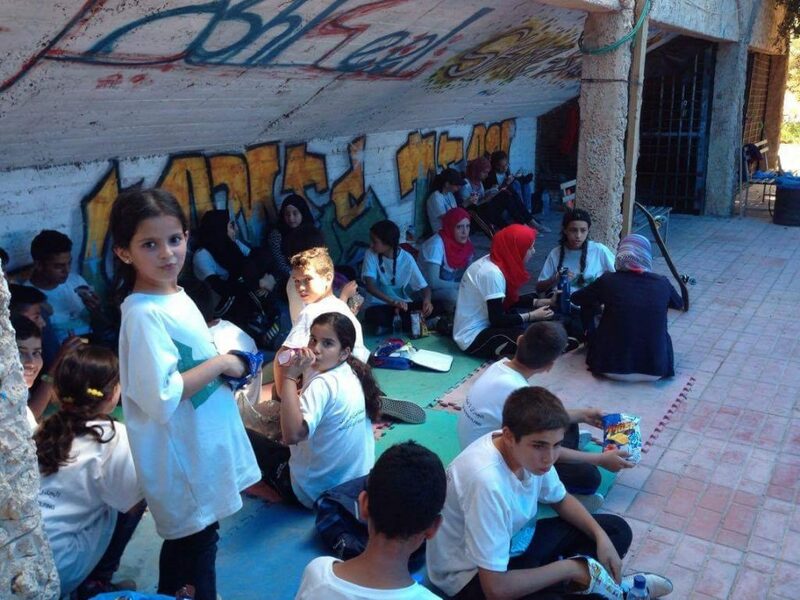 They host youth activities organized by ARCPA/al-Jana, another NGO working in the refugee camps. 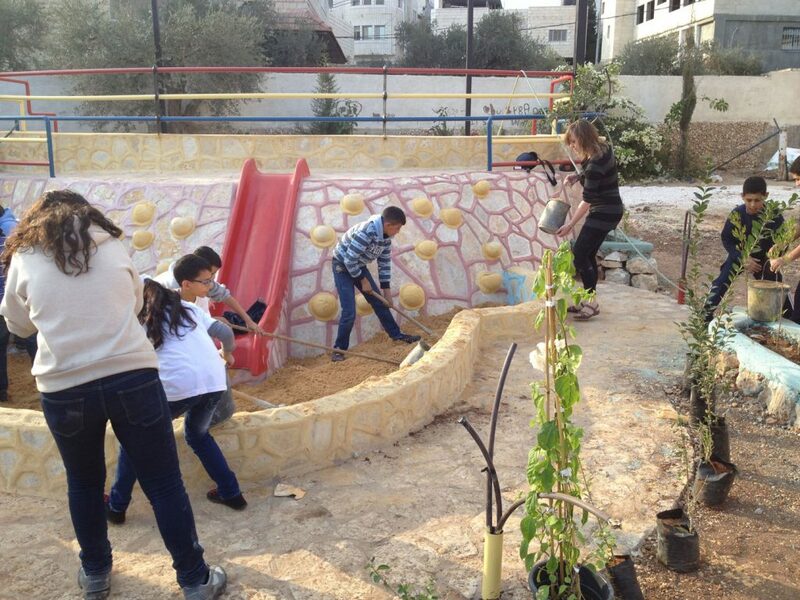 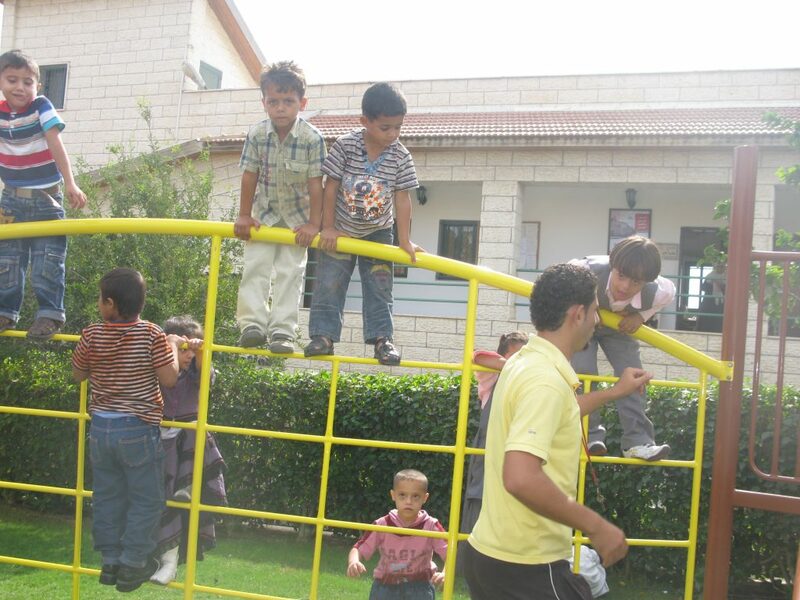 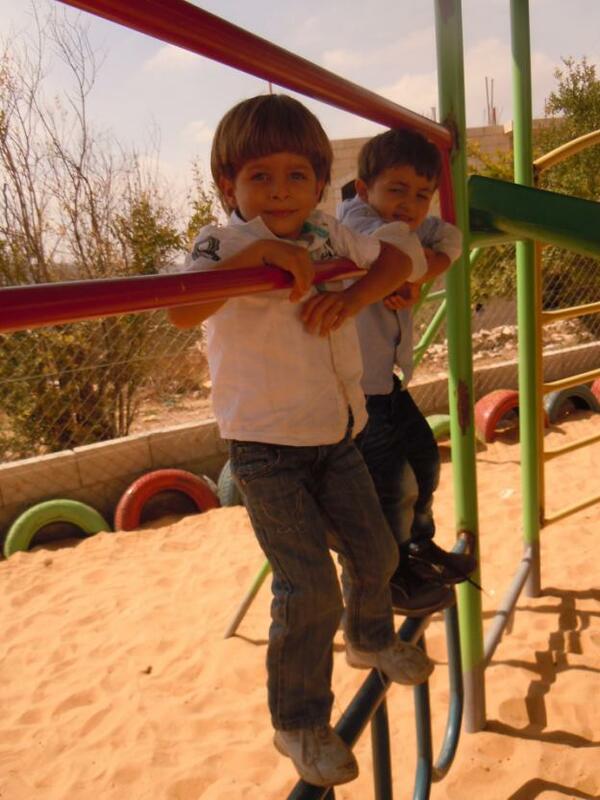 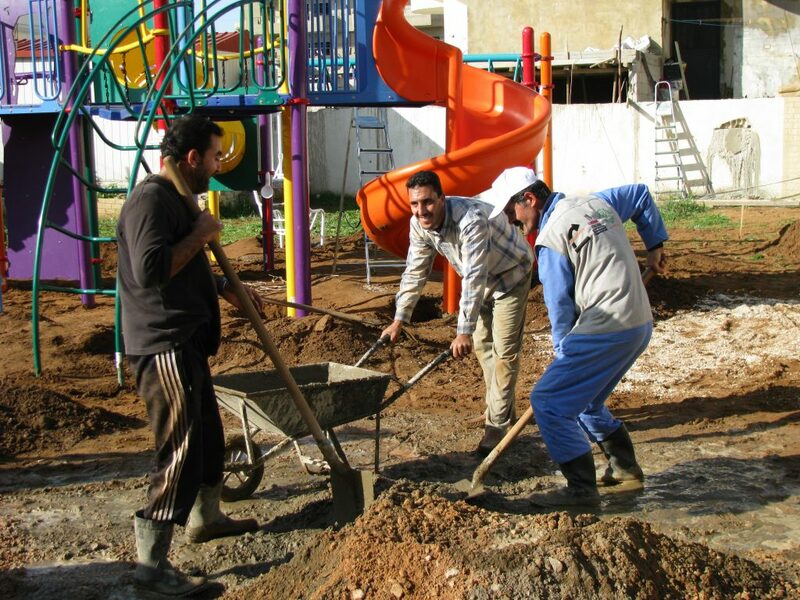 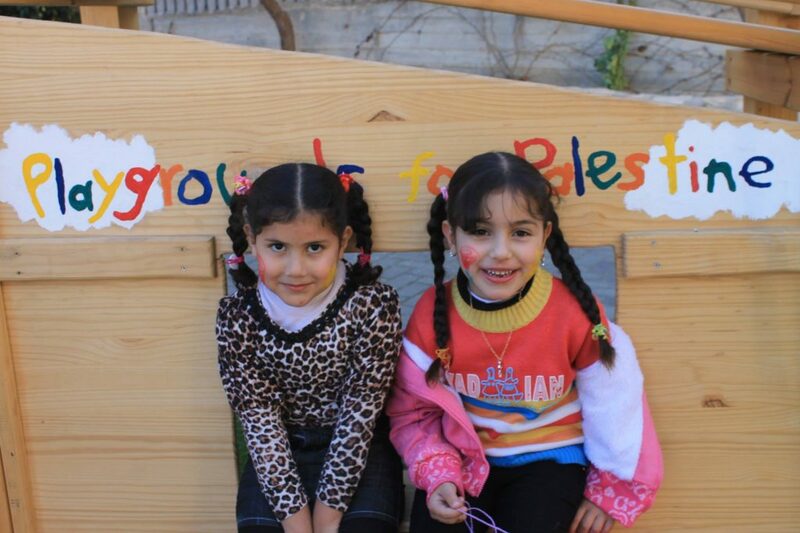 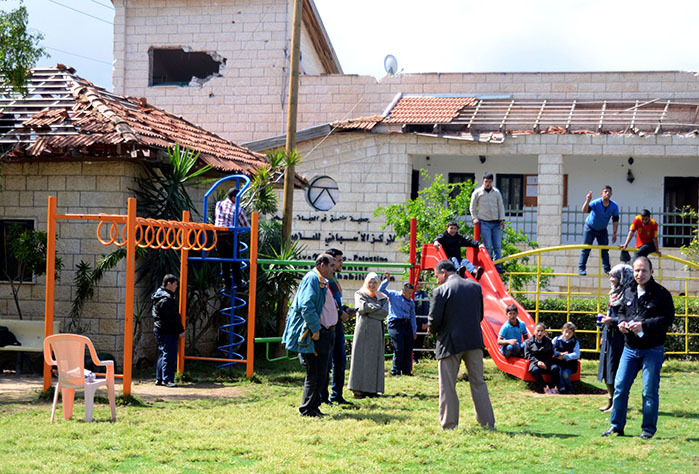 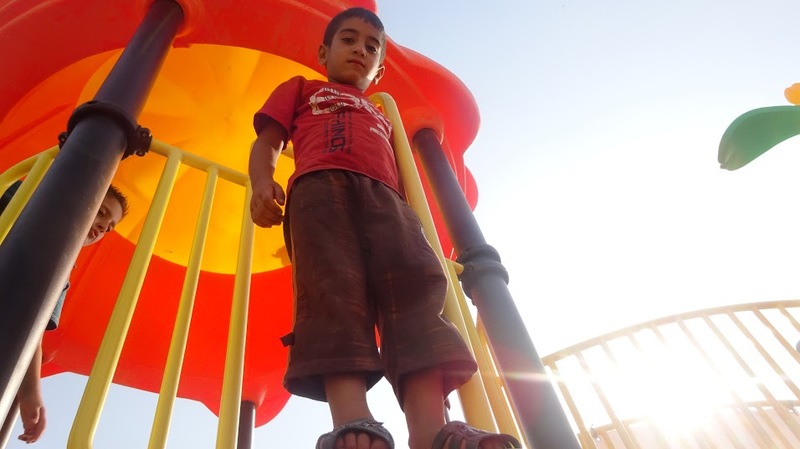 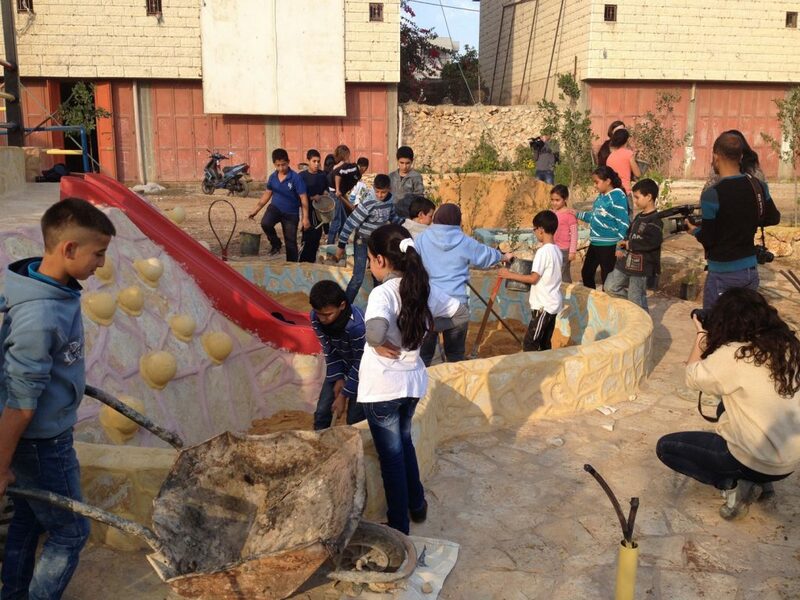 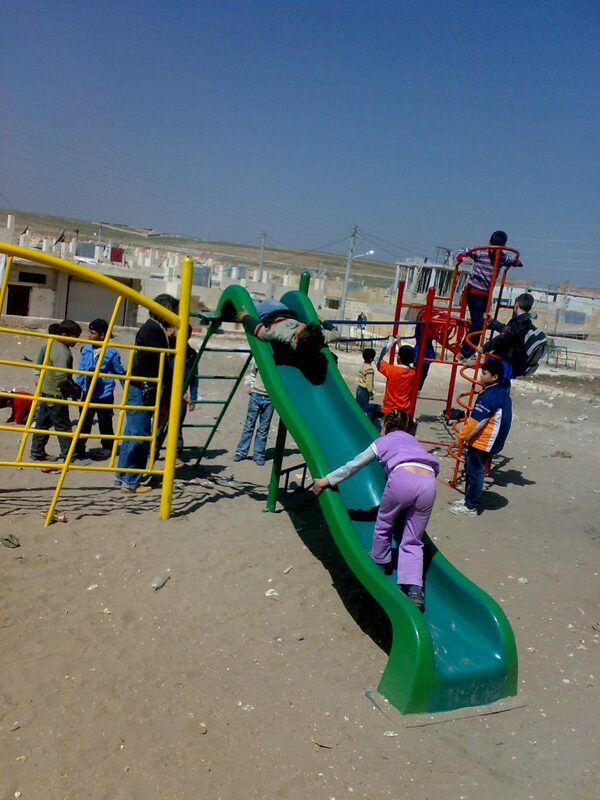 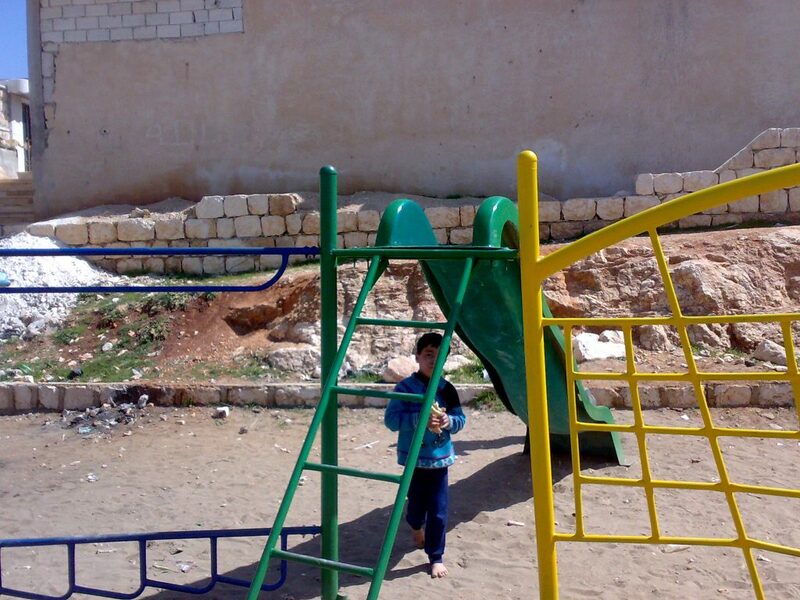 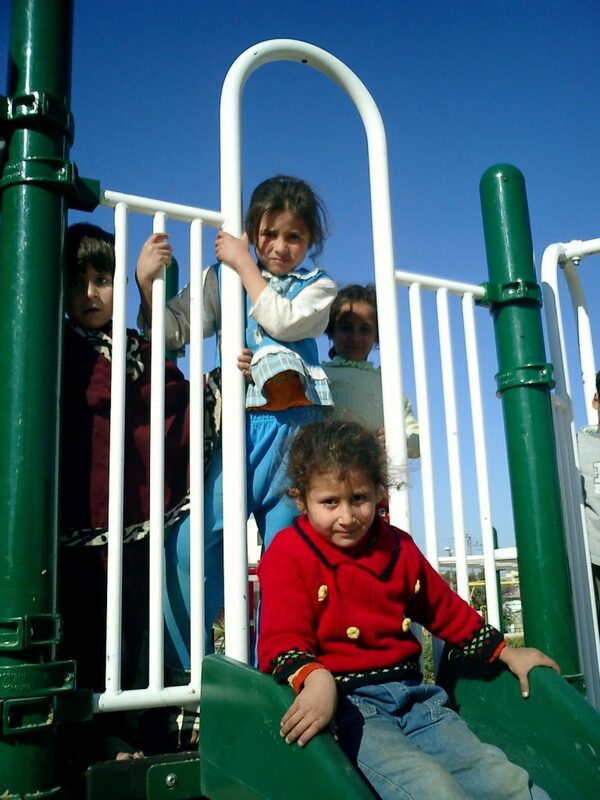 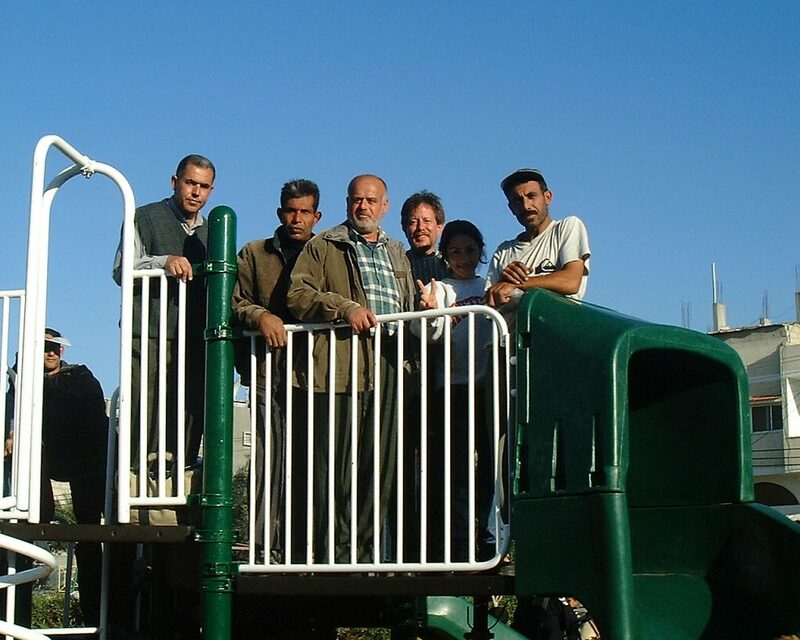 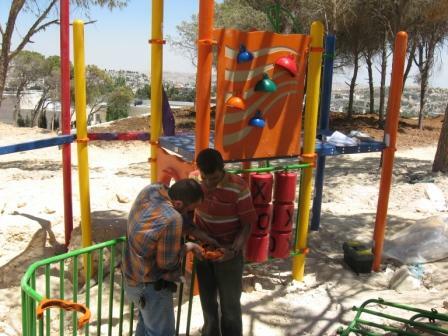 This playground was built in partnership with the Middle East Children’s Alliance and American Near East Refugee Aid. 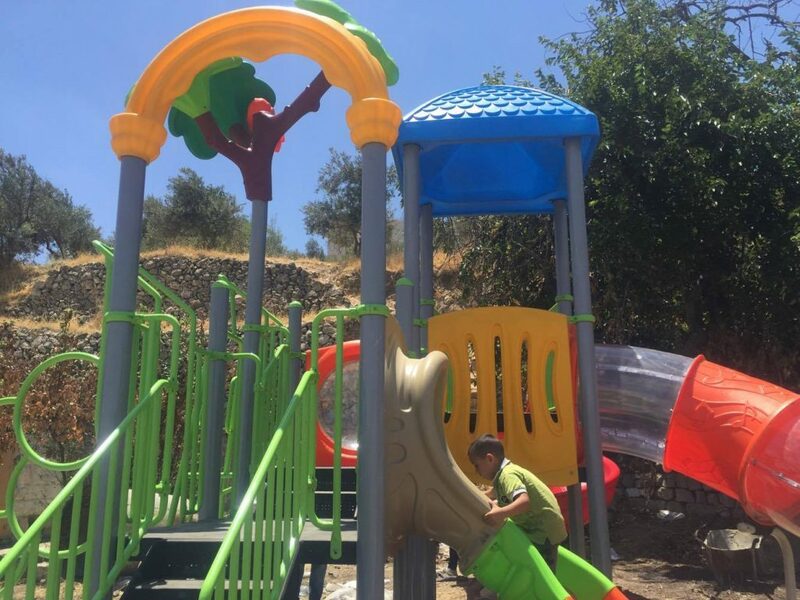 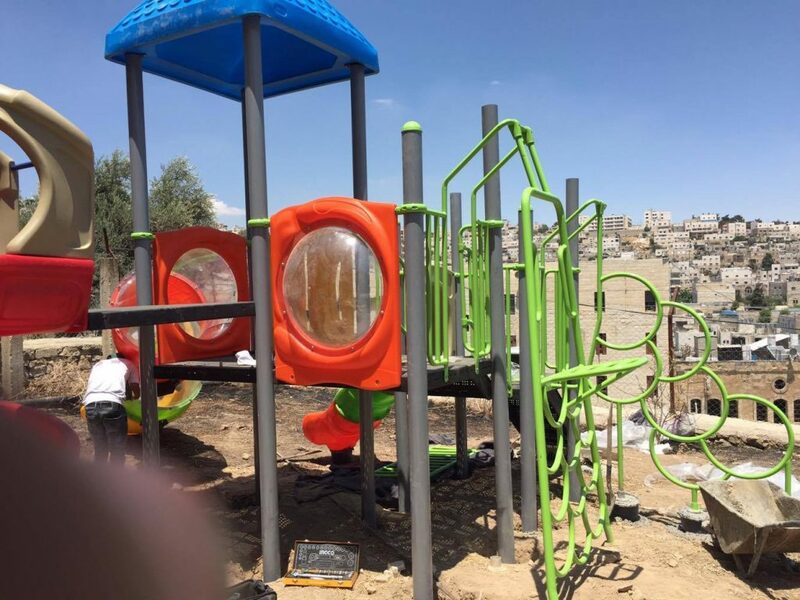 Playgrounds for Palestine’s second playground in Bethlehem went through a lot of obstacles to finally reach completion on the grounds of Dar Annadwa. 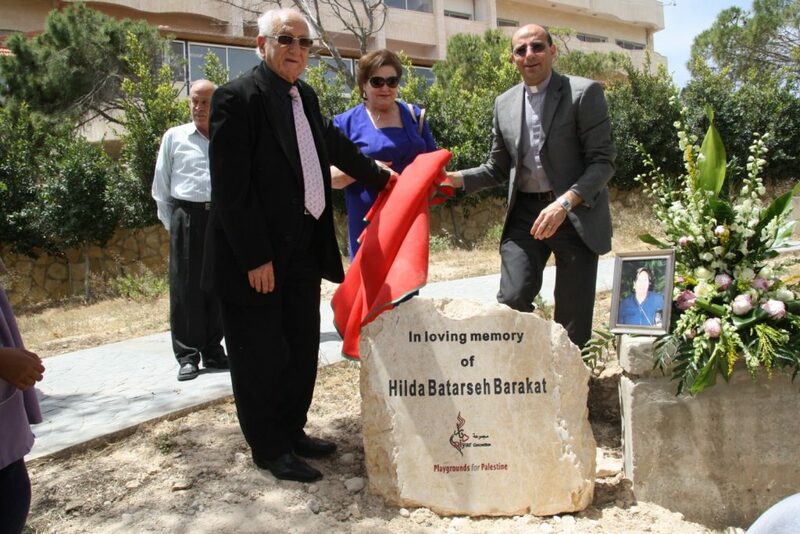 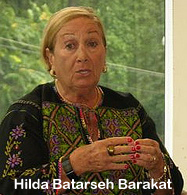 This playground was dedicated to the memory of Hilda Barakat, purchased by her family and loved ones, and built with the help of Rev. 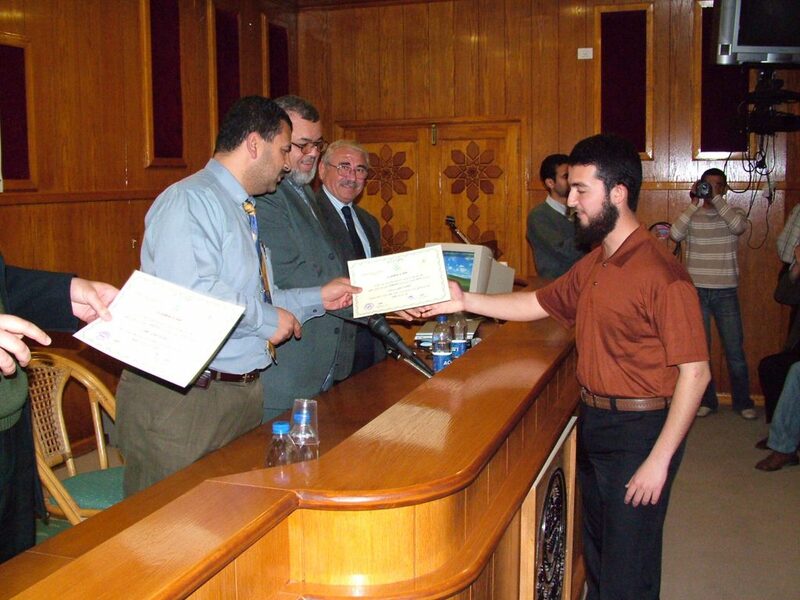 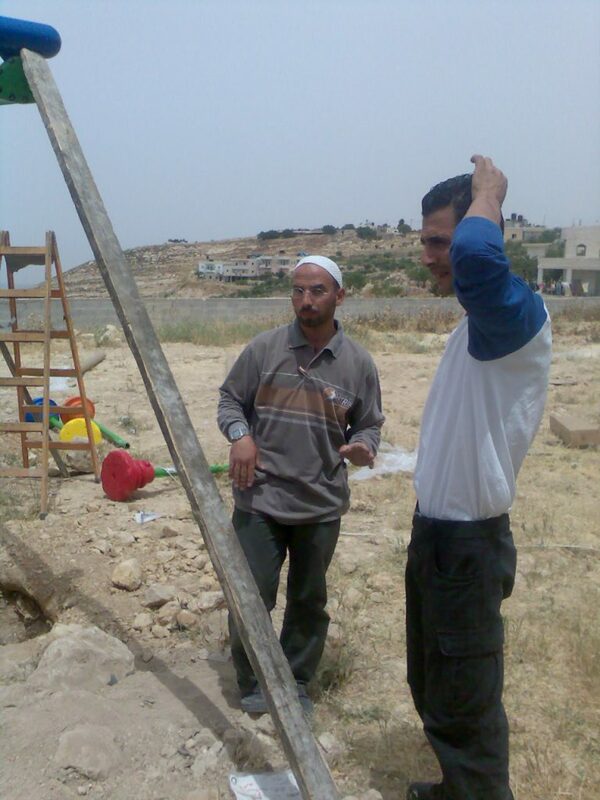 Nathan Dannison, who also raised funds for PfP and went to Palestine to participate in construction. 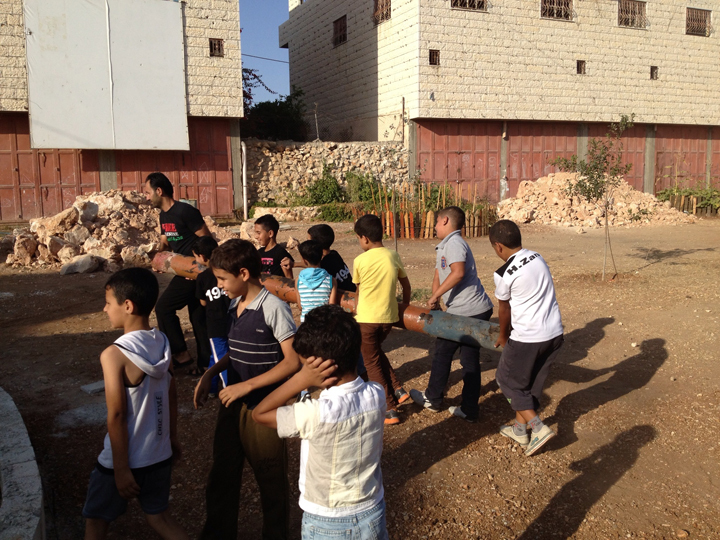 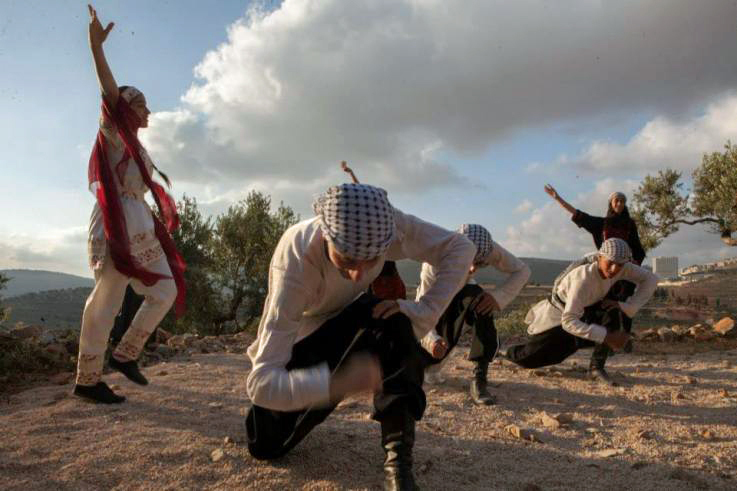 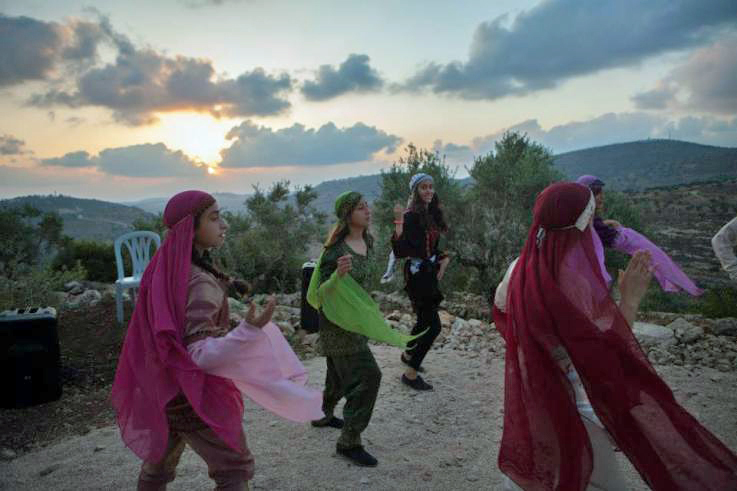 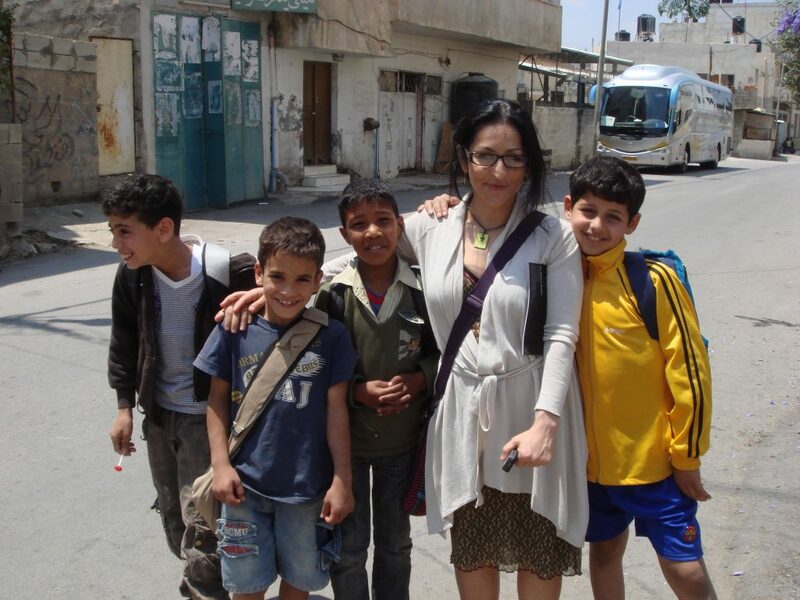 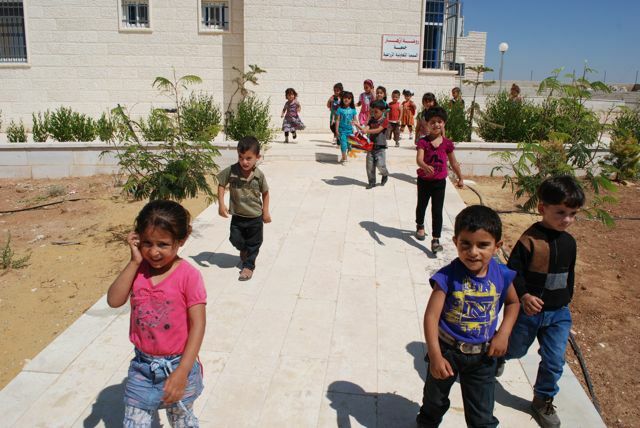 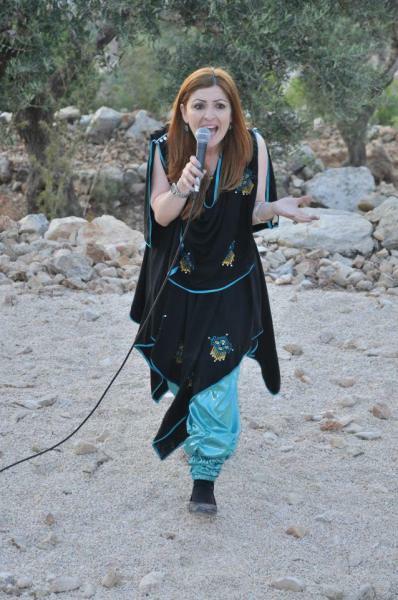 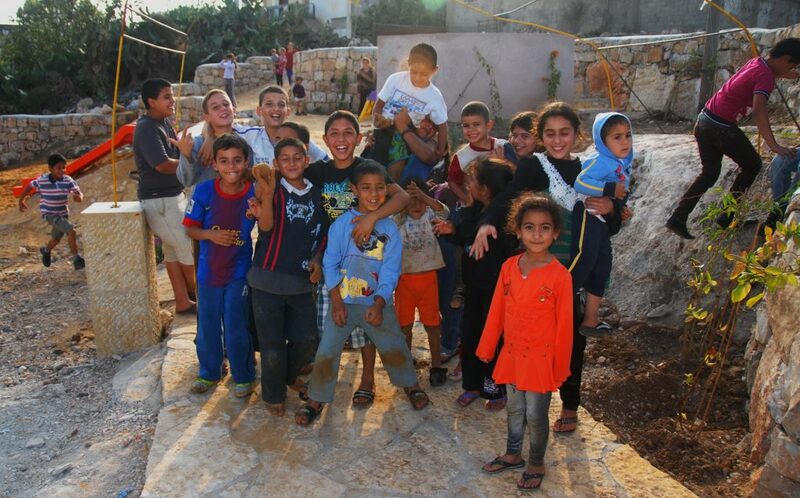 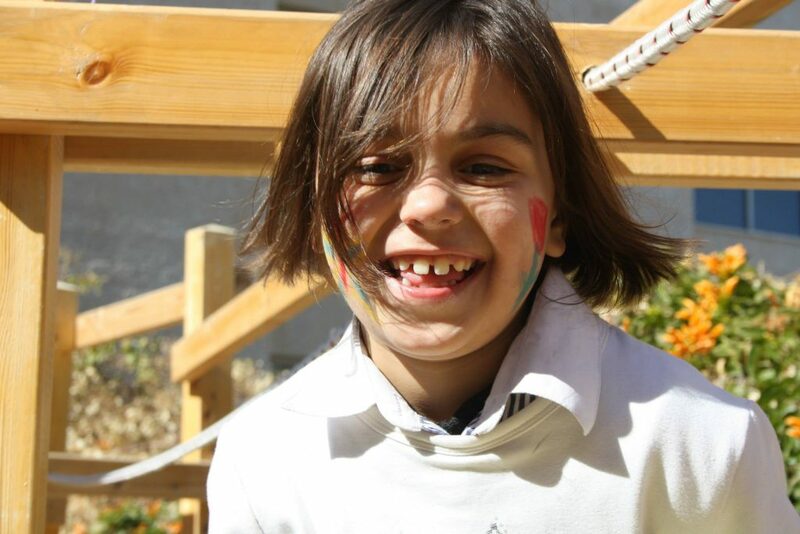 There are approximately 1300 children between the ages of three and twelve in the village of Beit Anan. 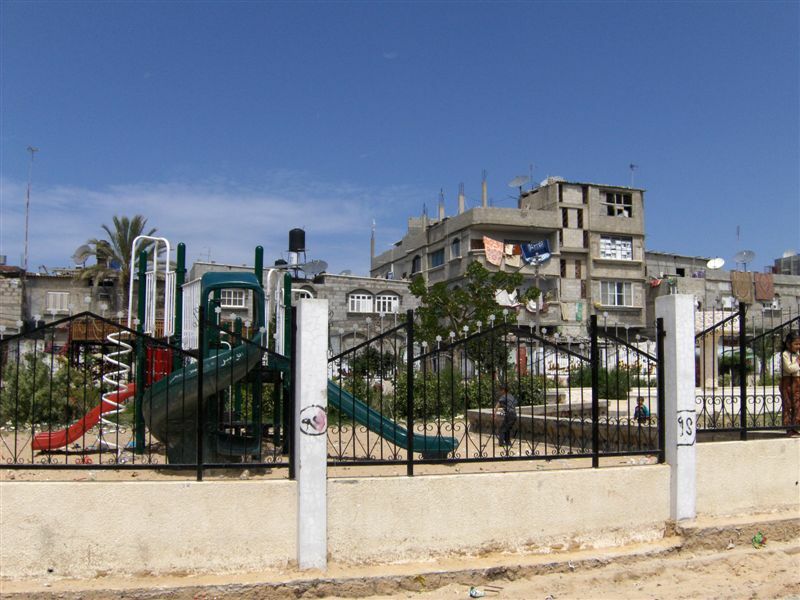 The land where the playground was built is central and easily accessible for all local children, especially since this village has very few car owners. 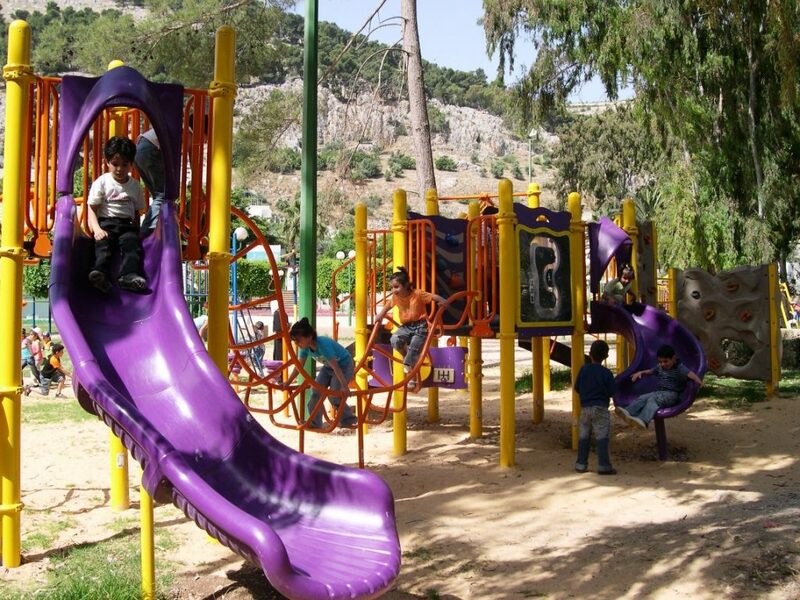 Playgrounds for Palestine’s Nablus playground is located in the King Faisal park, a public park that is part of the Nablus Happiness Childhood Center, which serves thousands of children in this Biblical Palestinian city, home to over 126,000 residents, several institutions of higher learning, and the famous Palestinian pastry, Knafe, as well as Palestinian olive oil soap. 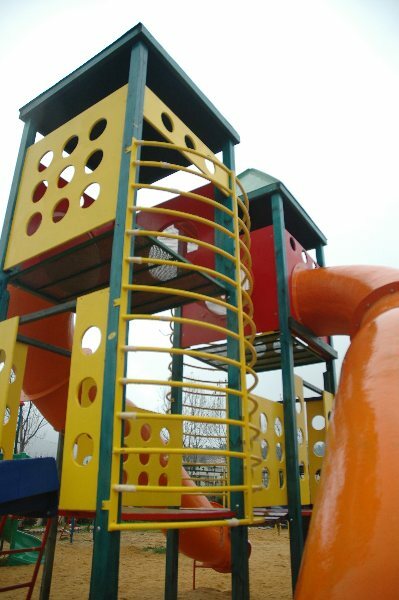 This playground is three-stories high, with numerous activity panels, and structures for climbing, crawling, sliding and imaginative play for a wide range of ages. 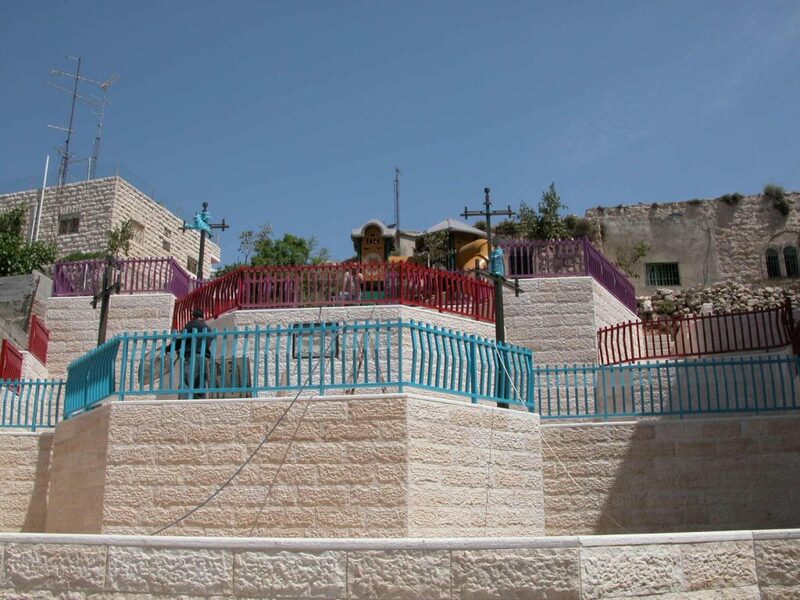 It is located less than half a mile from the historic Ibrahimi Mosque in the Old City of El Khalil (Hebron). 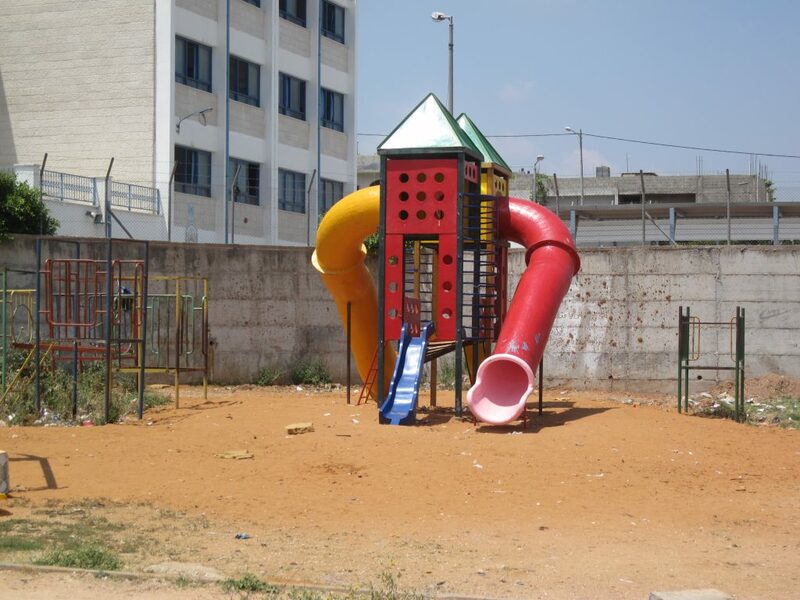 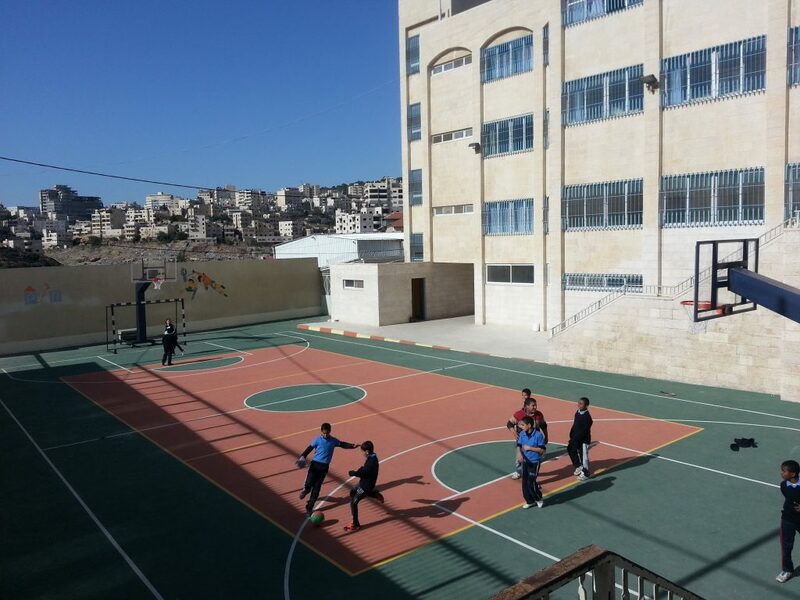 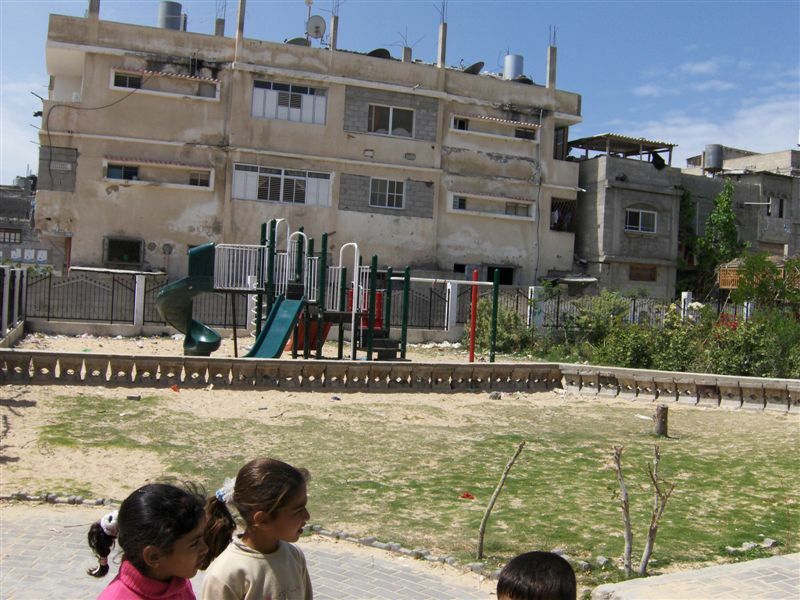 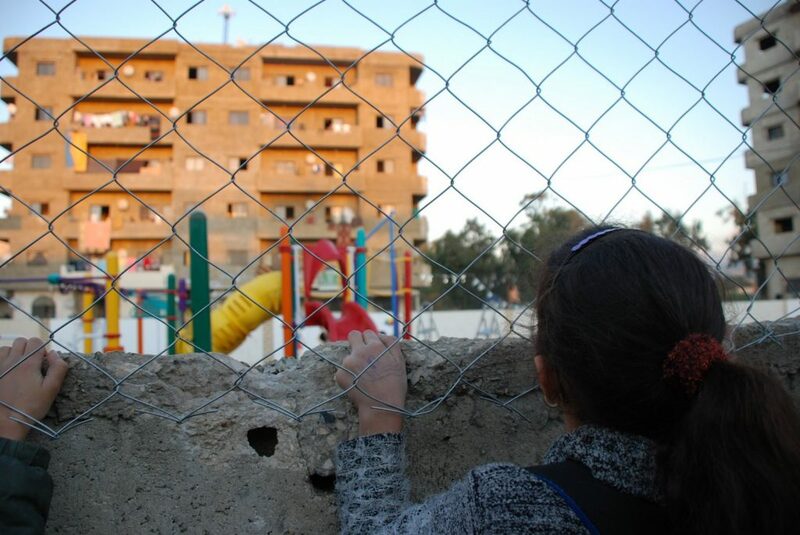 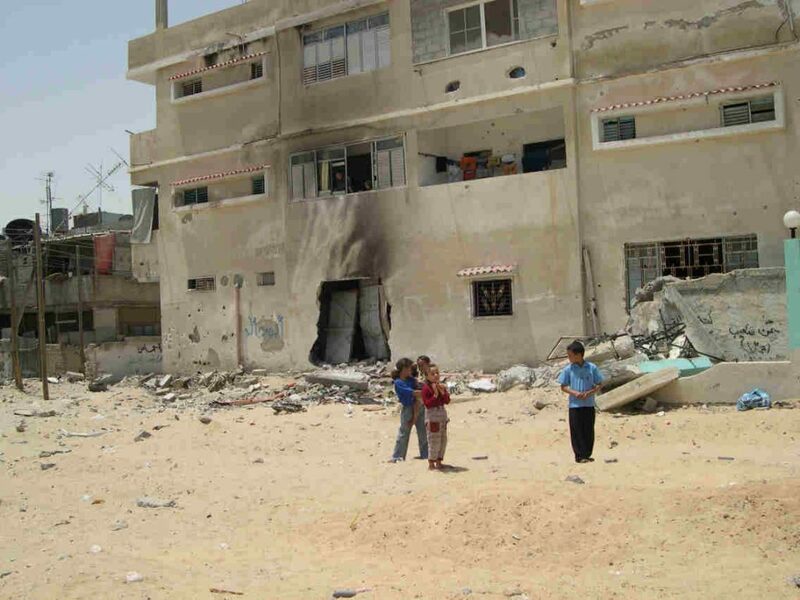 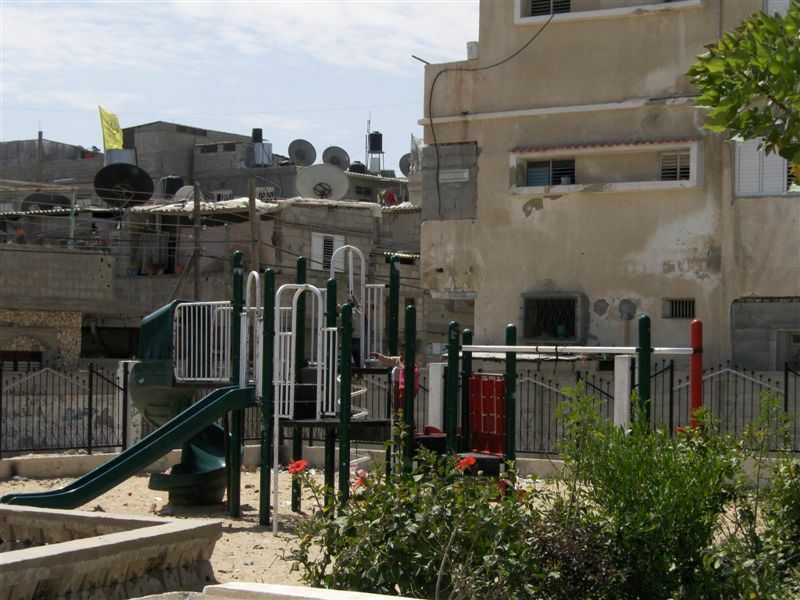 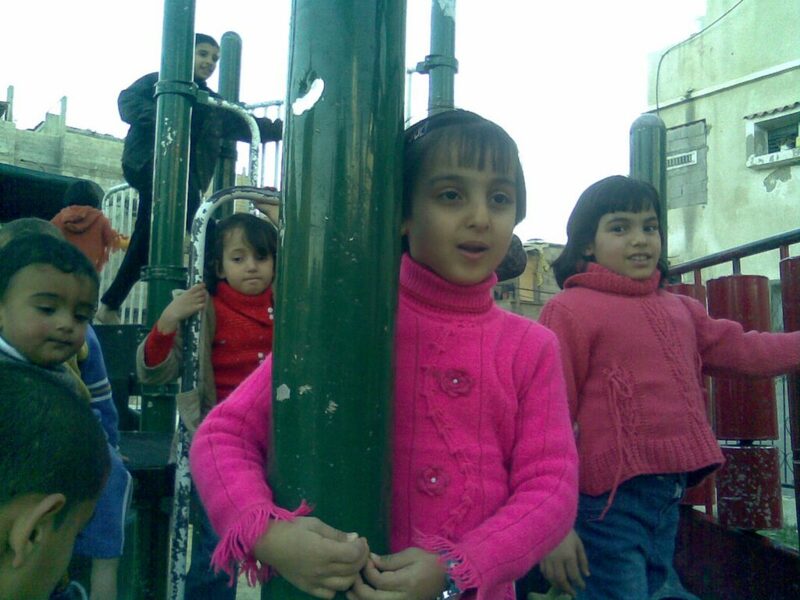 Because children in this area are particularly exposed to settler and occupation violence, the playground here is built strategically between buildings so that the children are better protected when playing. 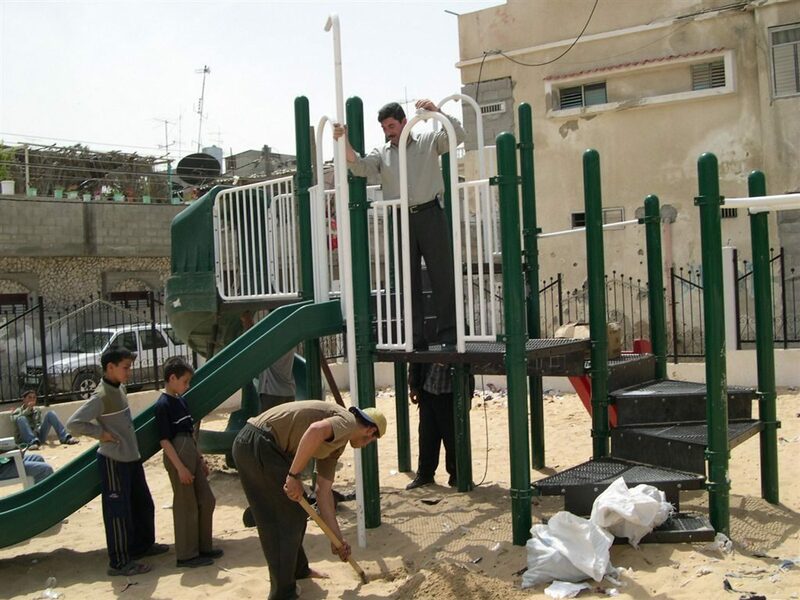 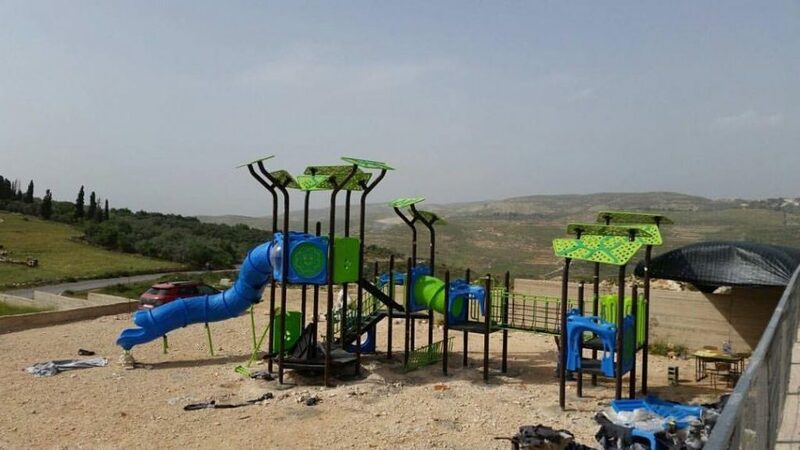 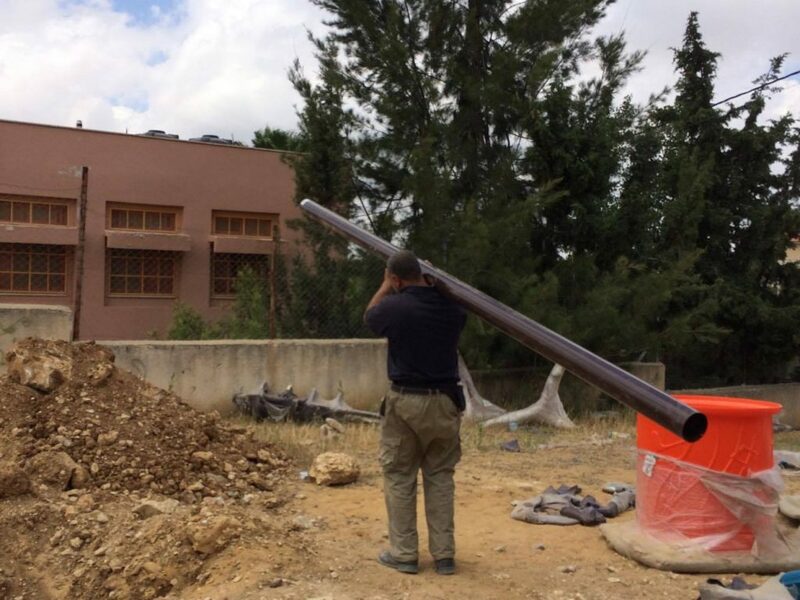 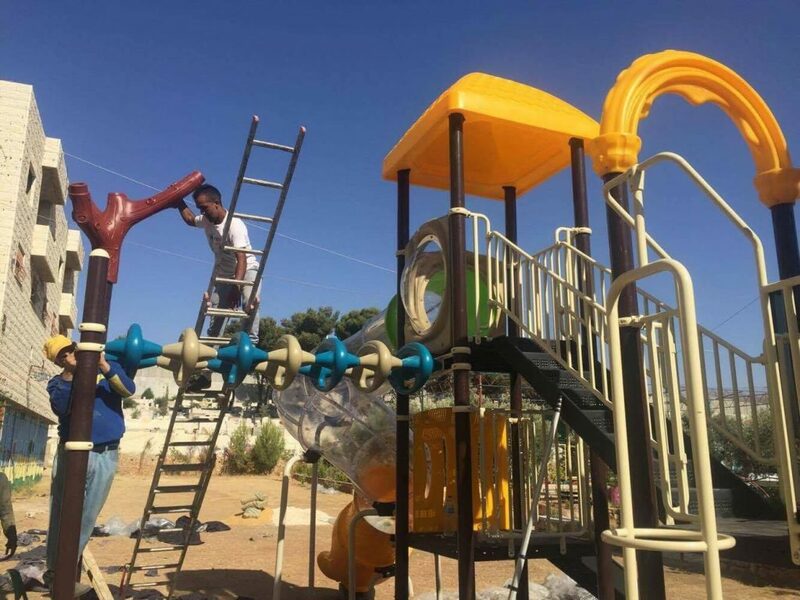 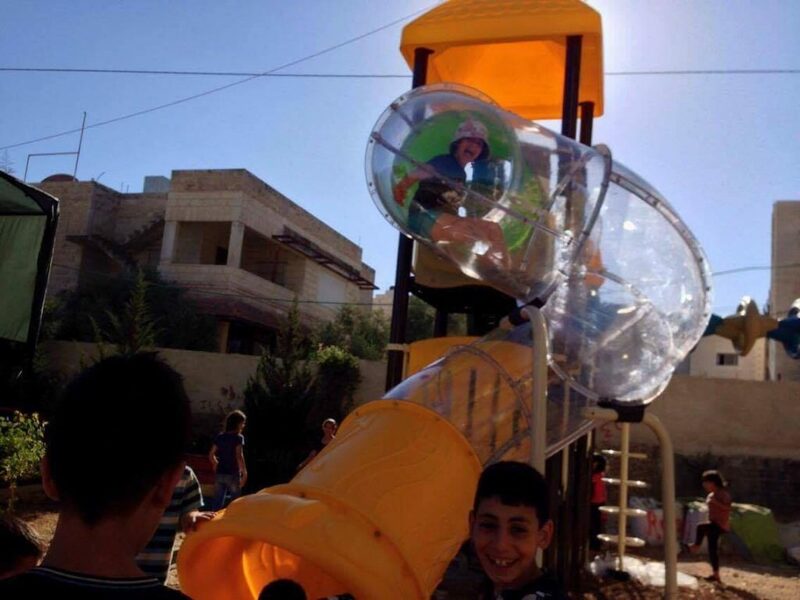 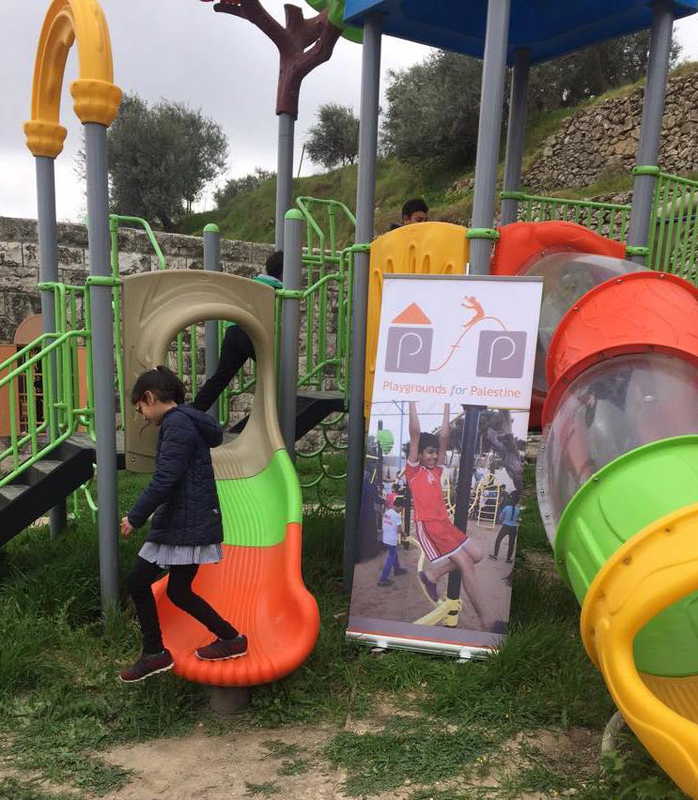 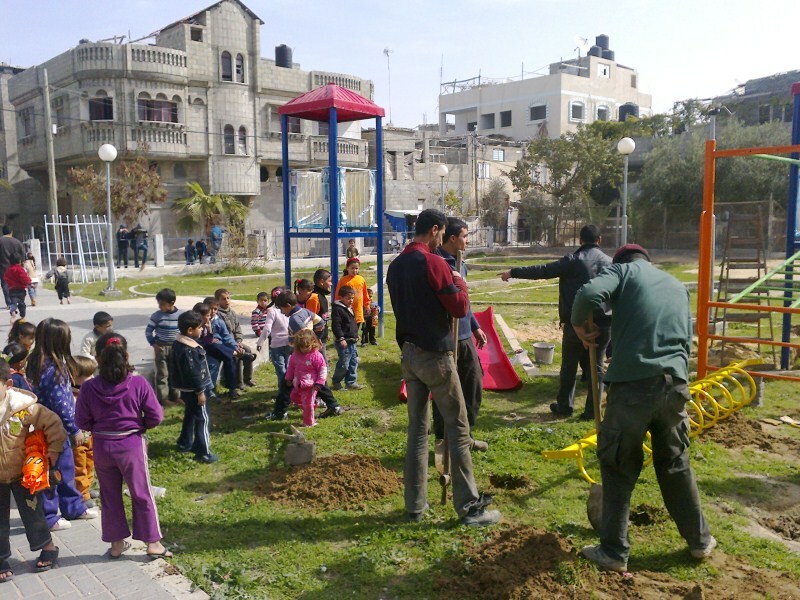 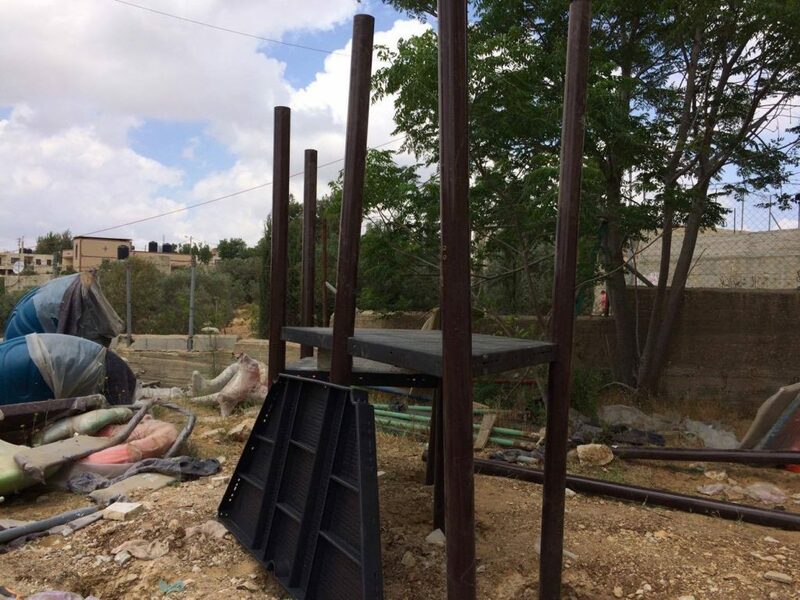 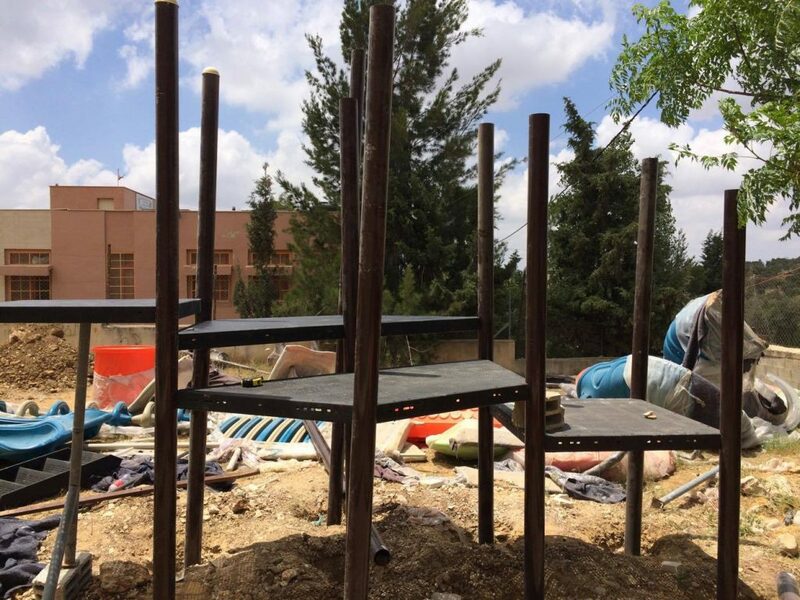 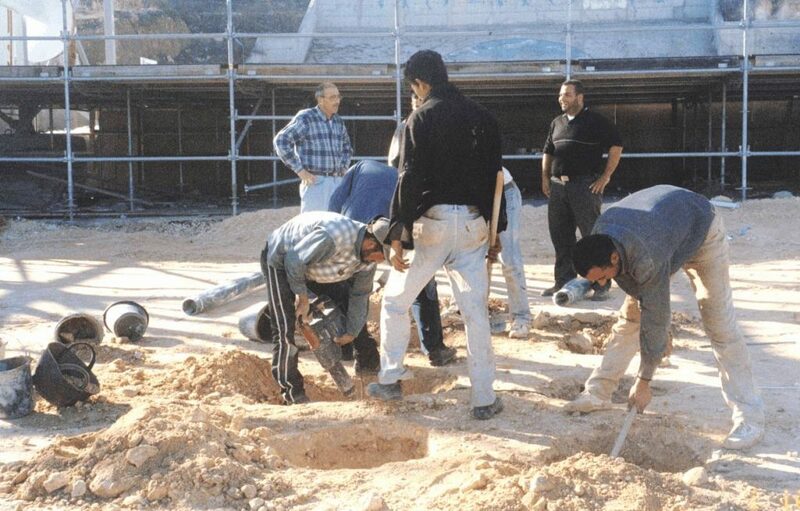 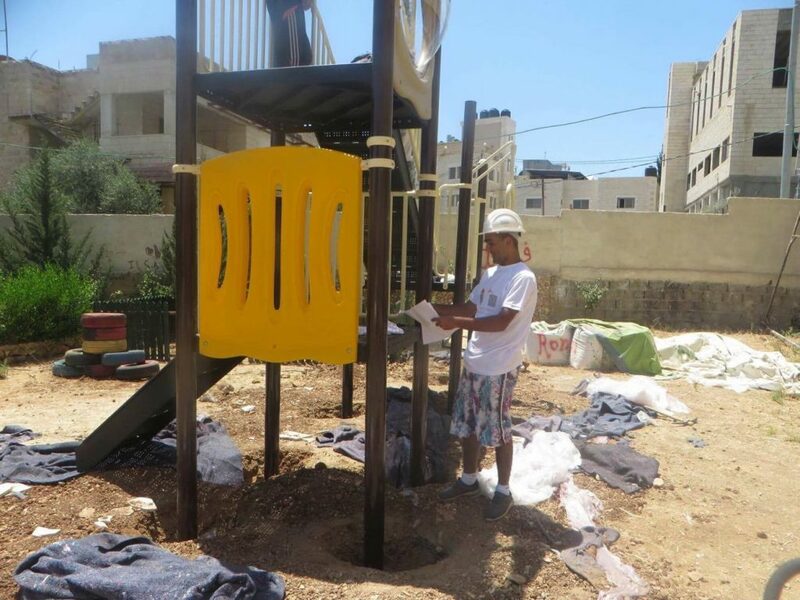 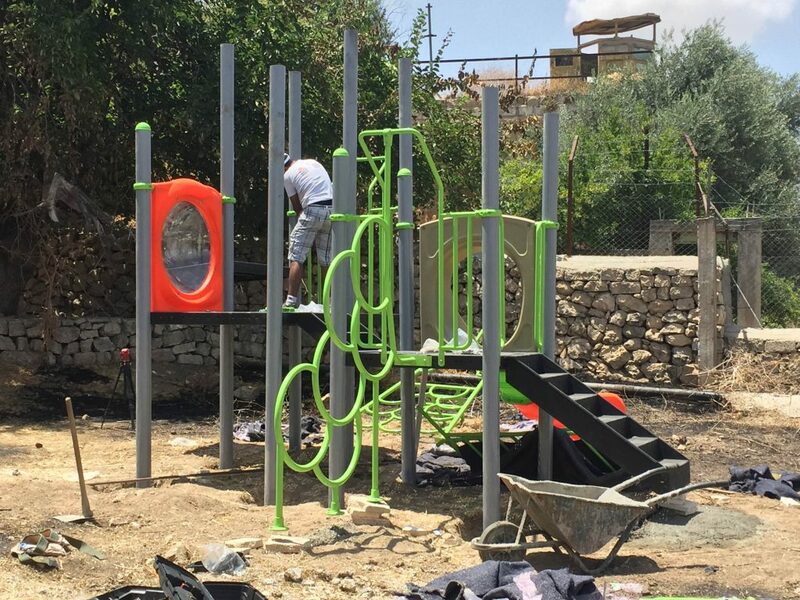 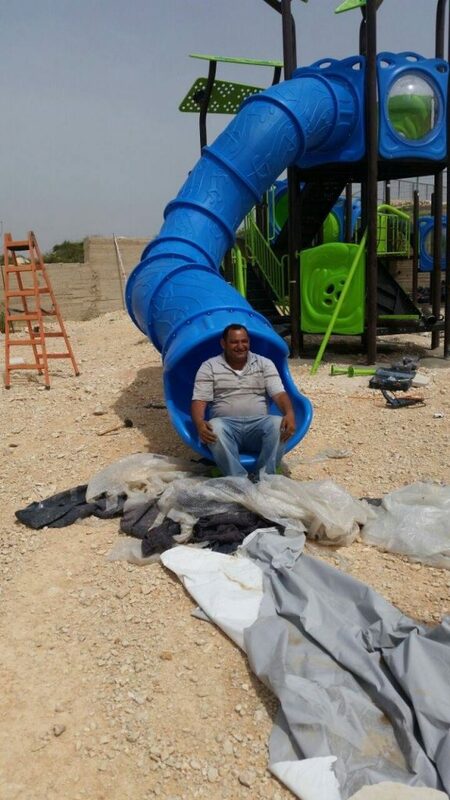 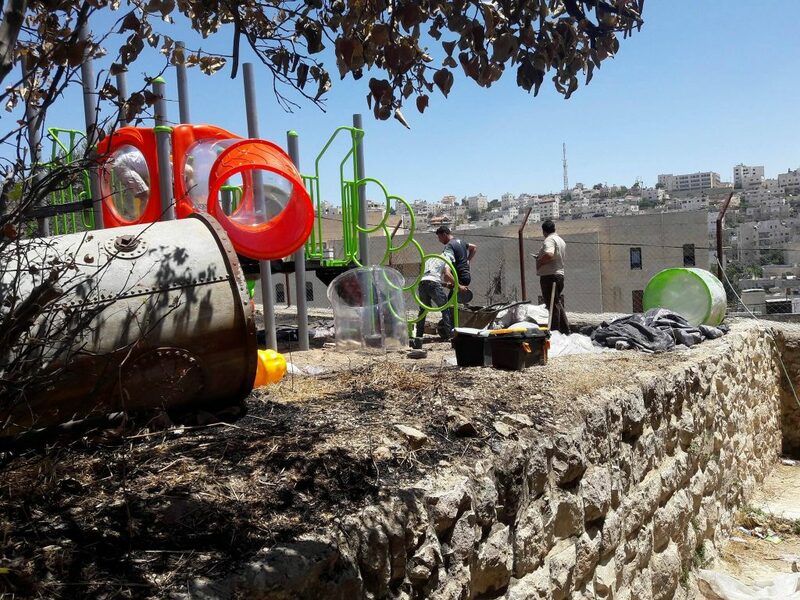 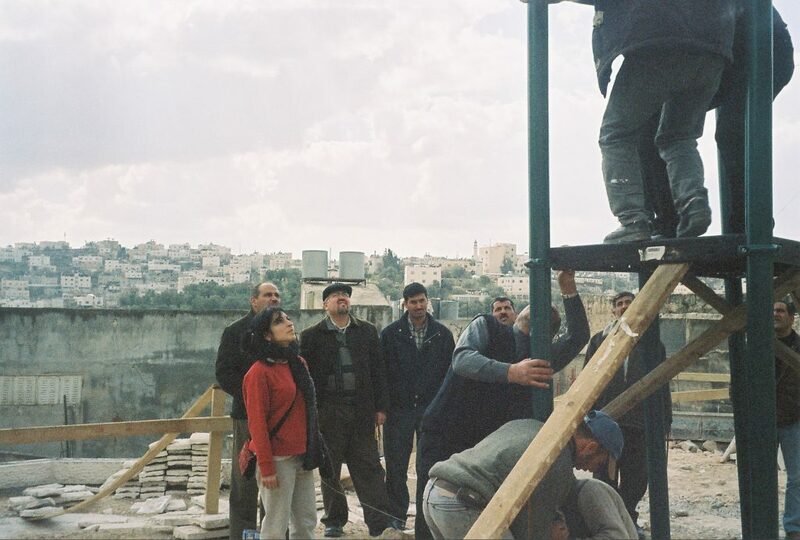 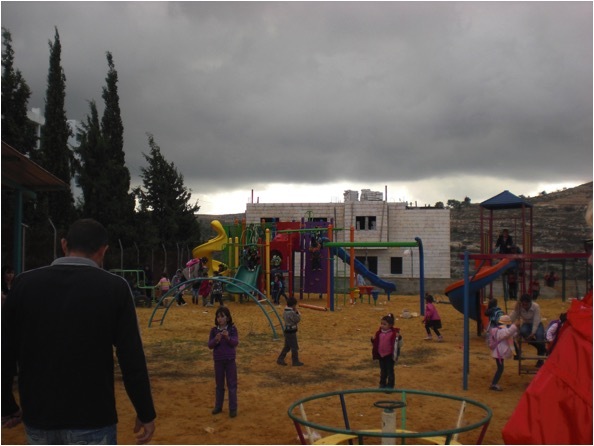 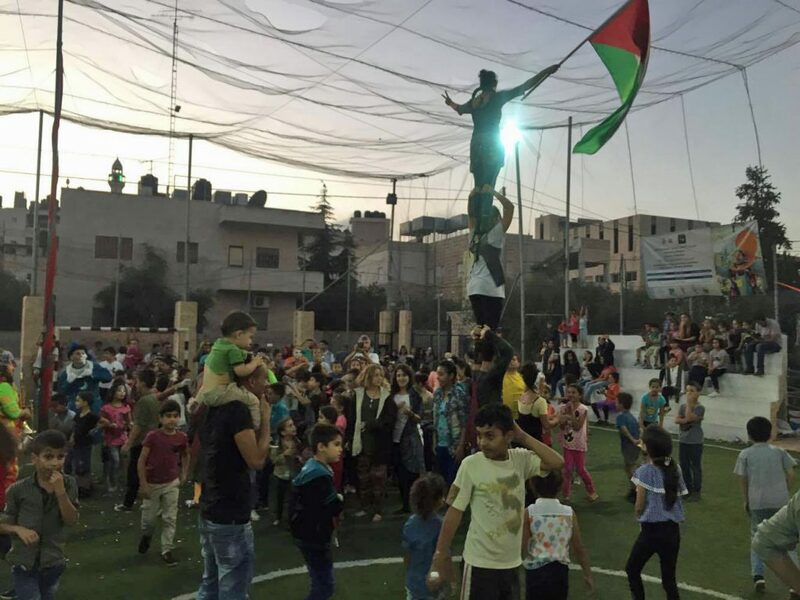 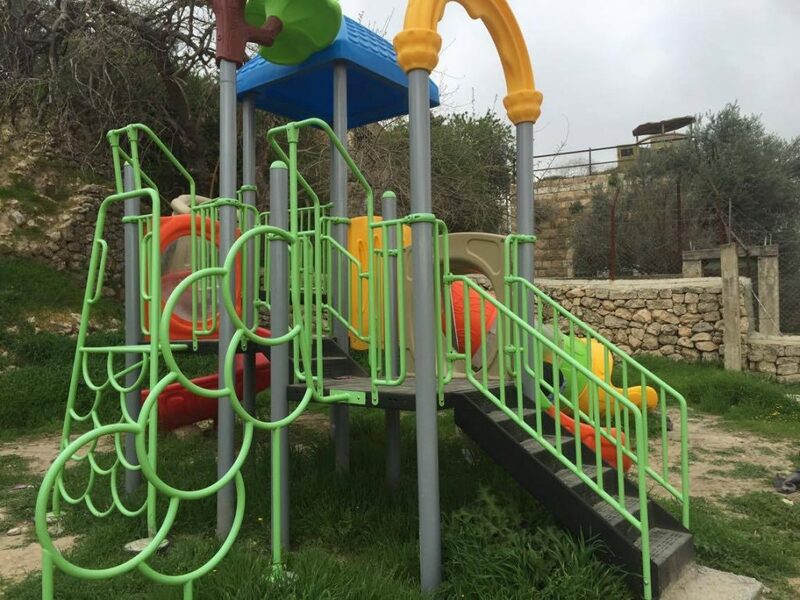 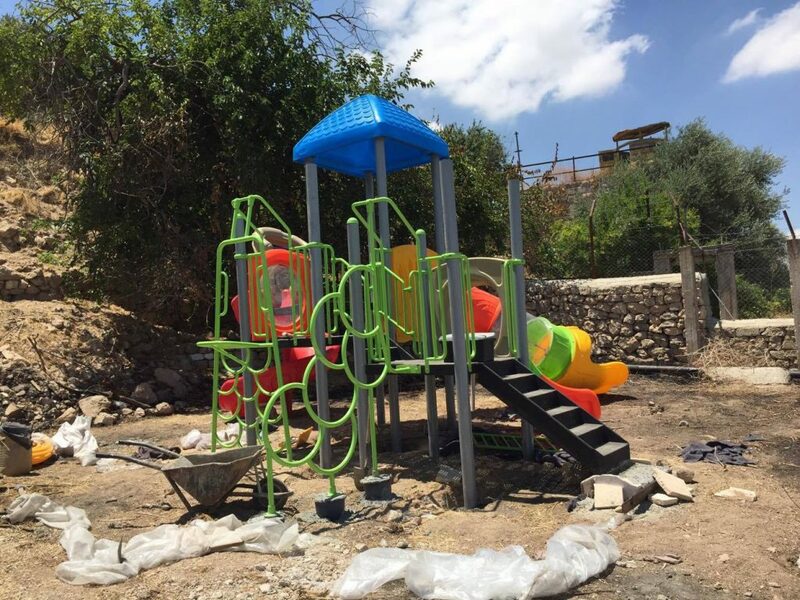 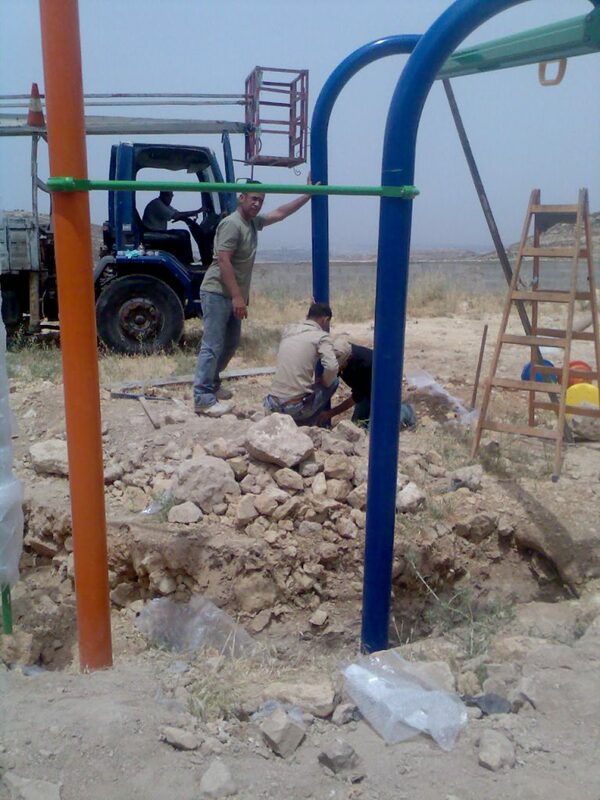 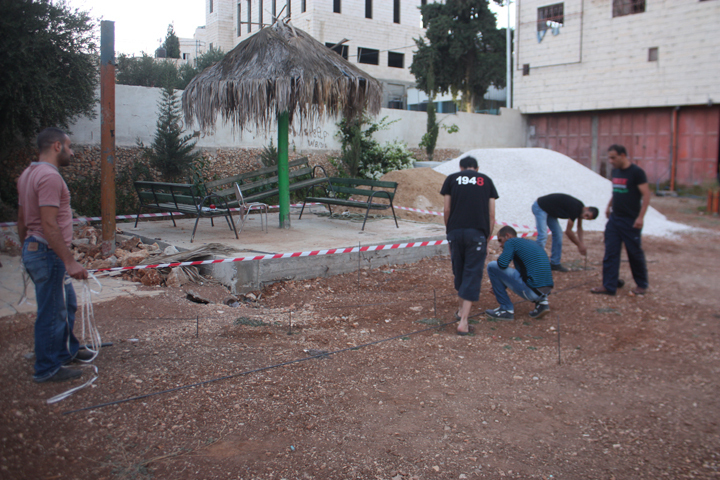 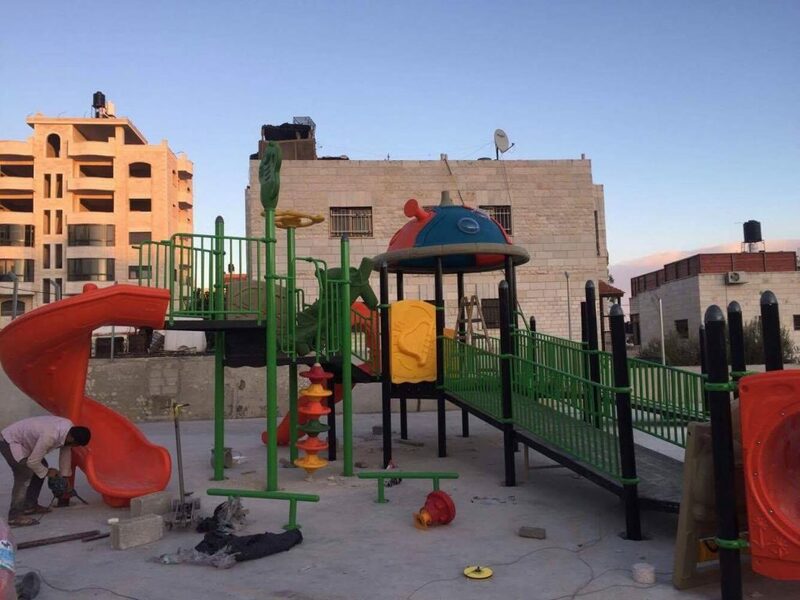 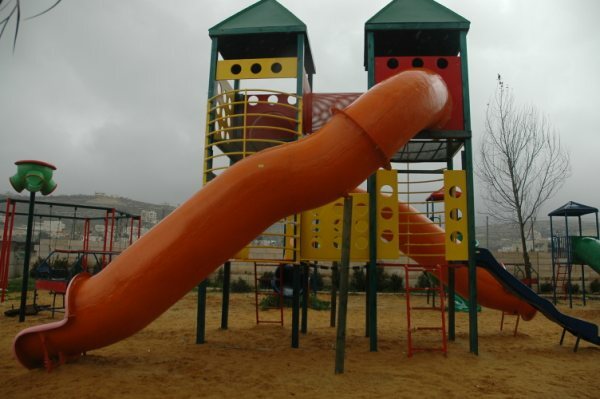 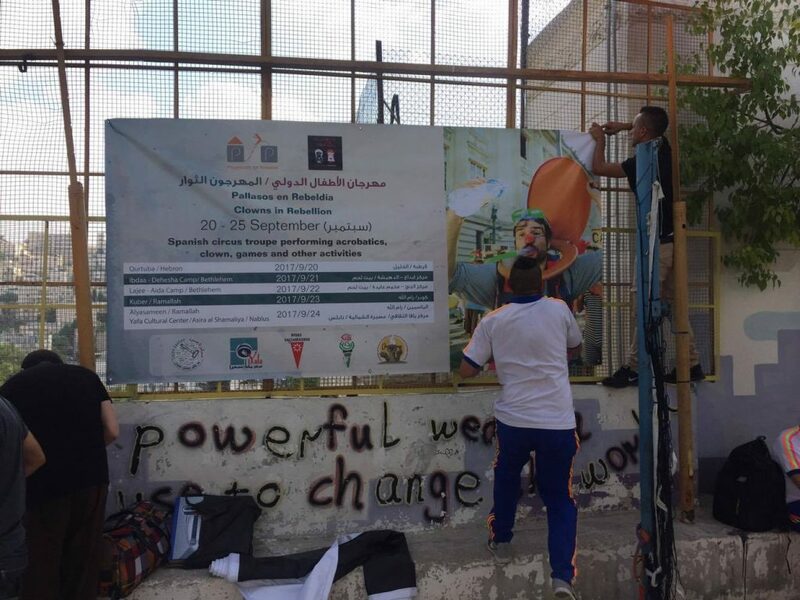 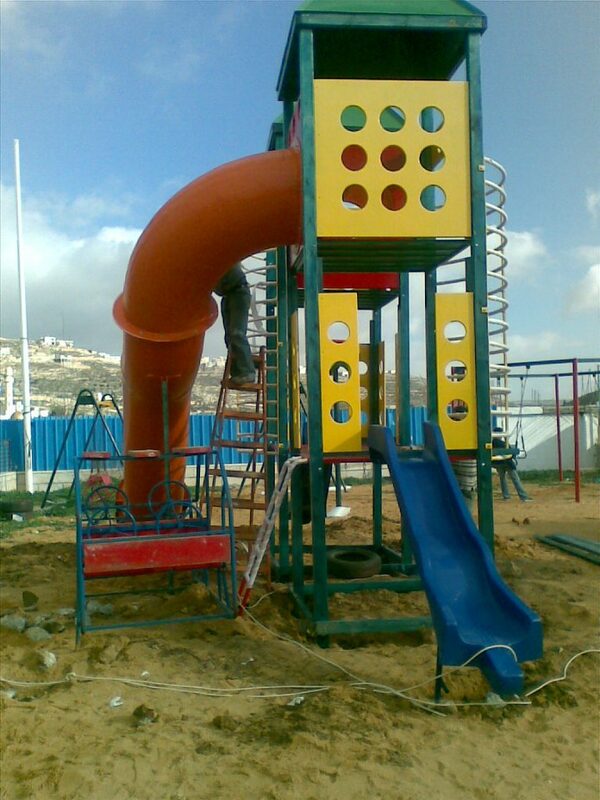 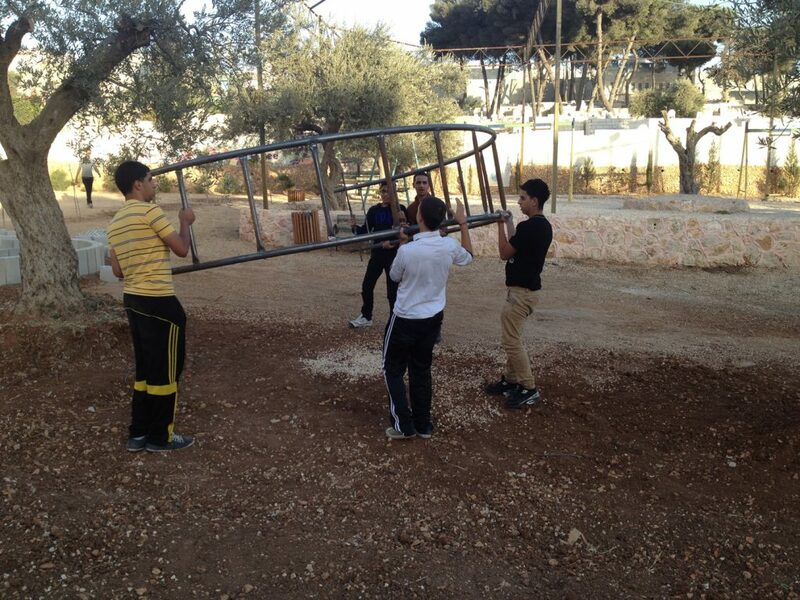 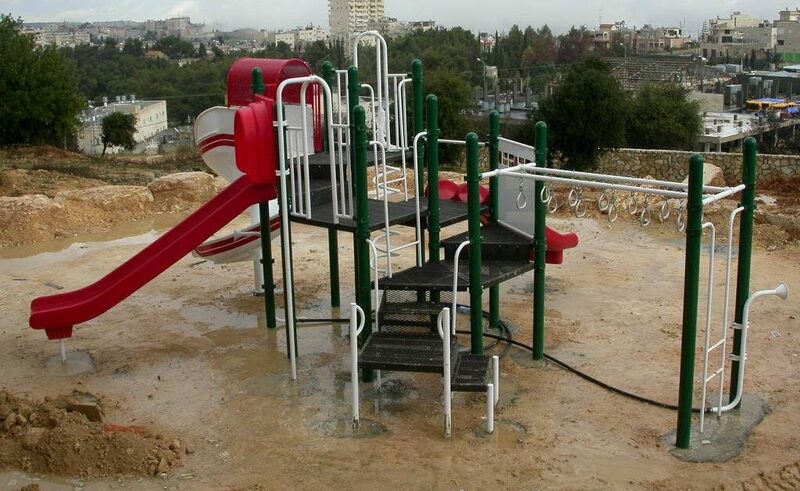 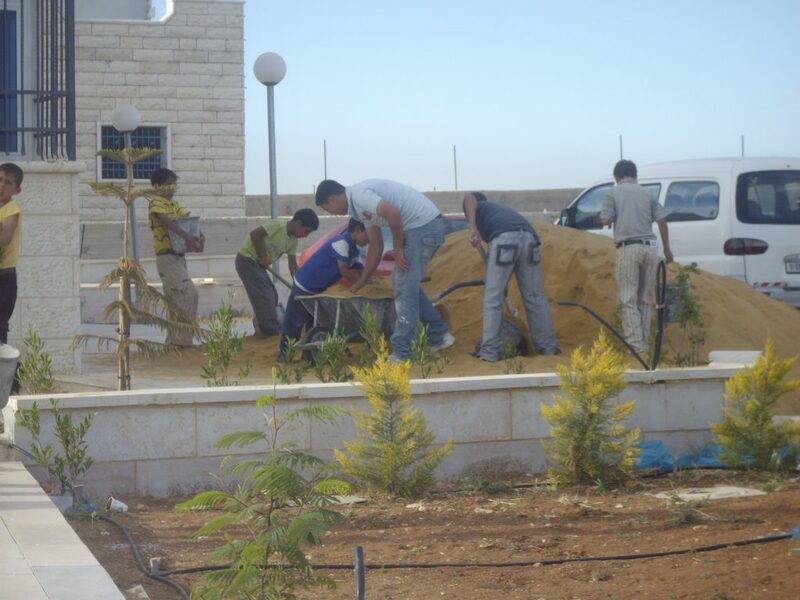 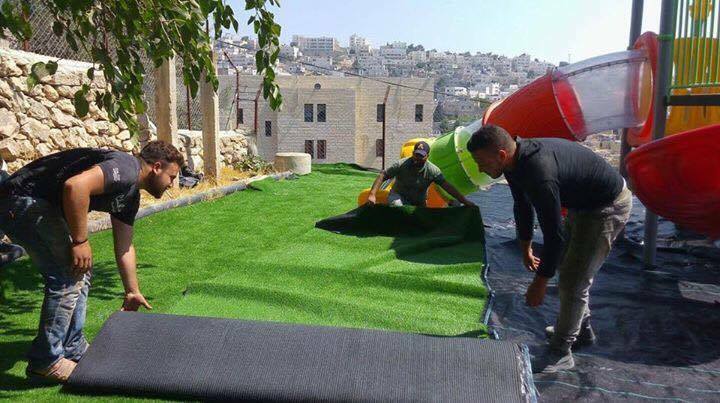 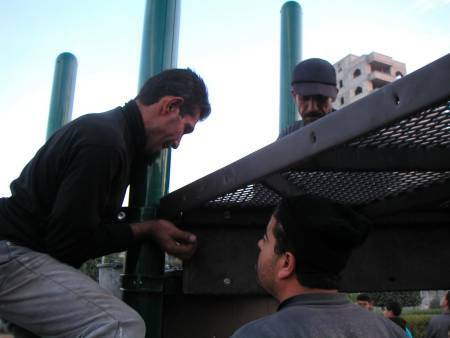 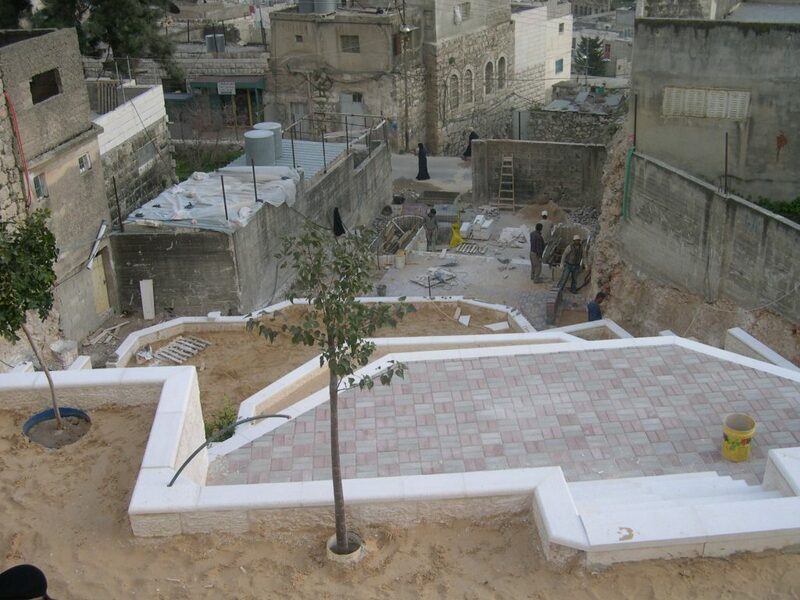 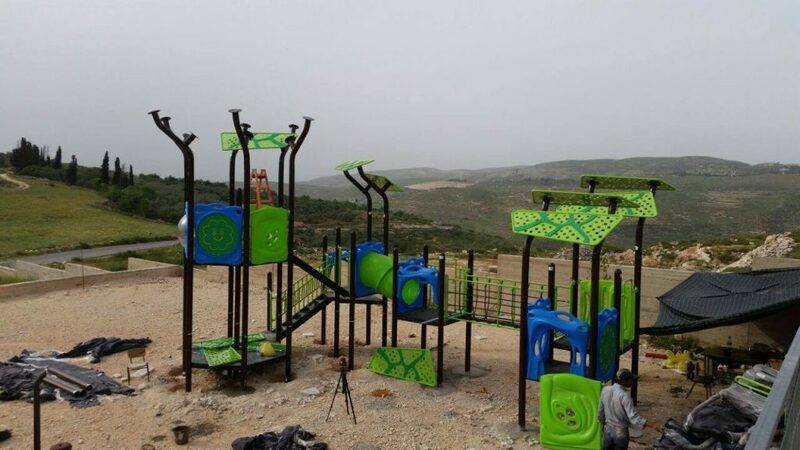 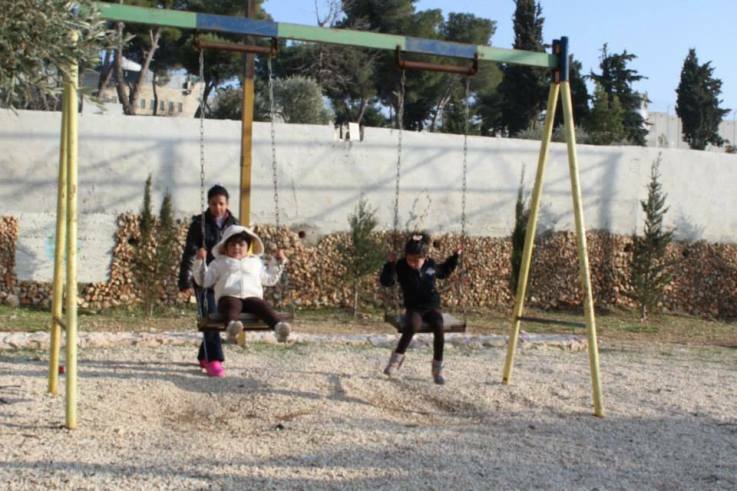 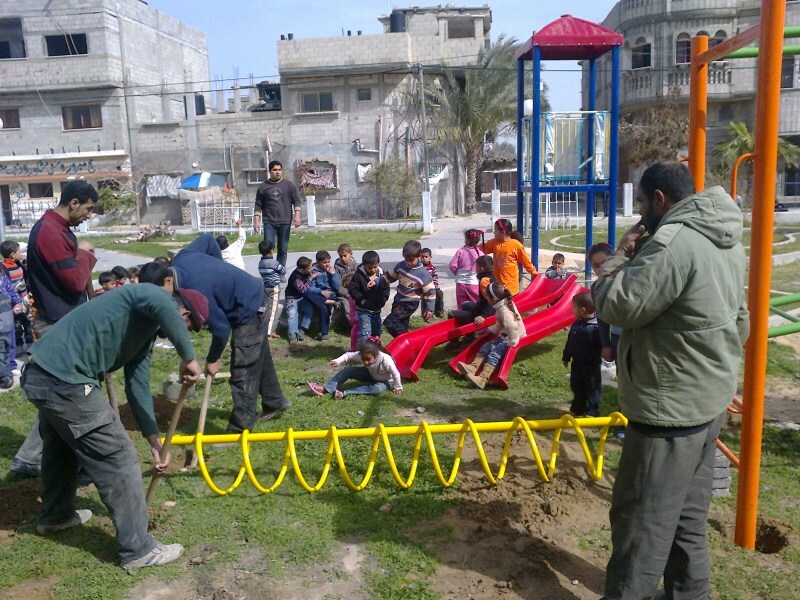 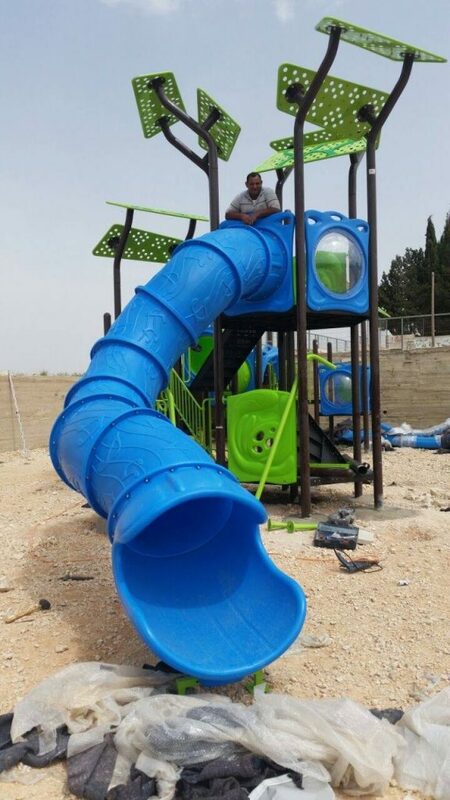 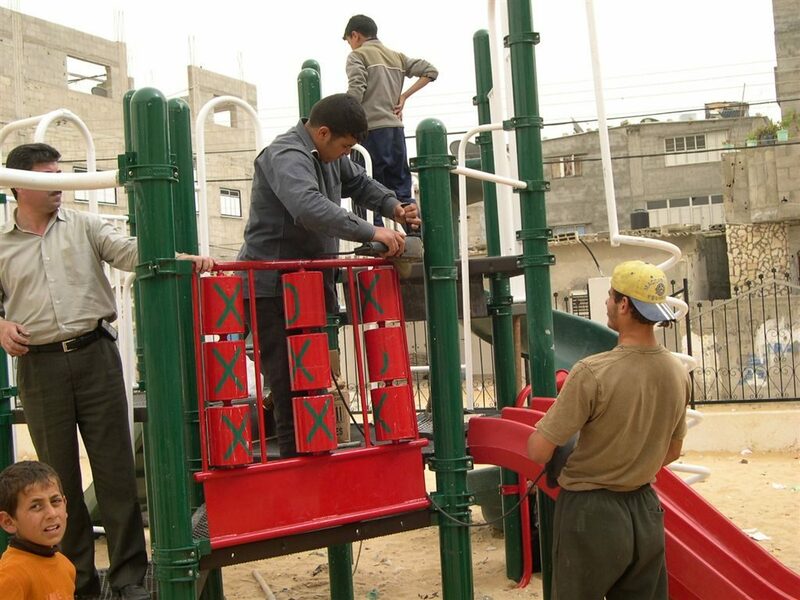 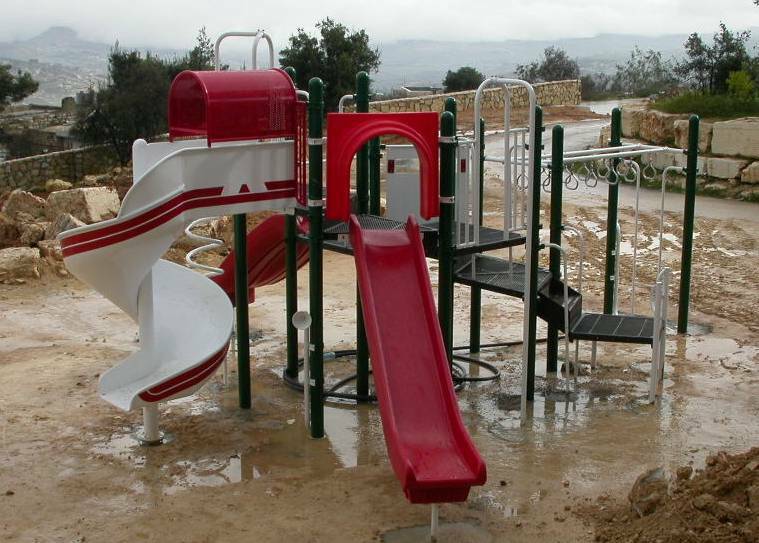 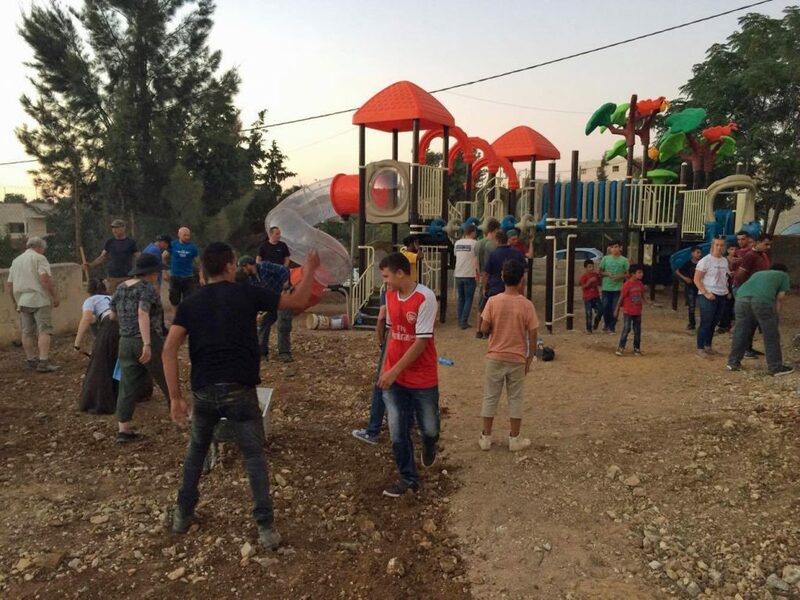 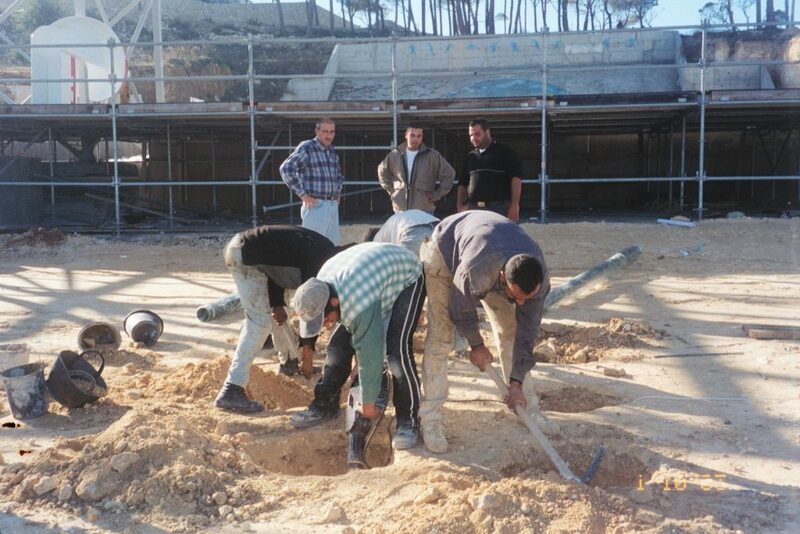 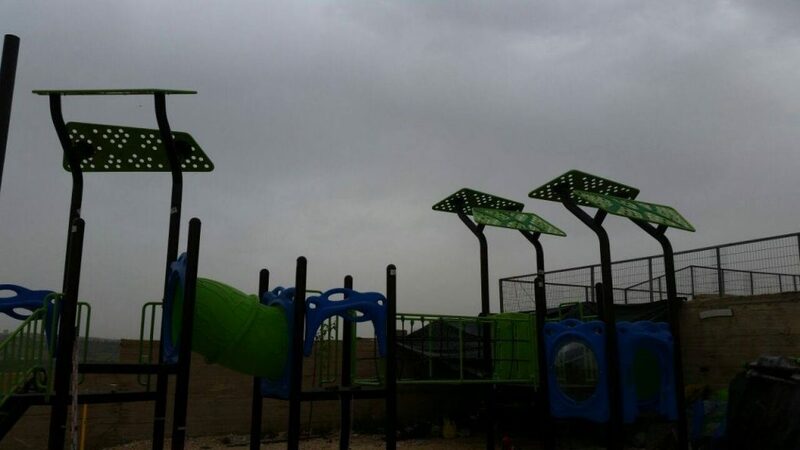 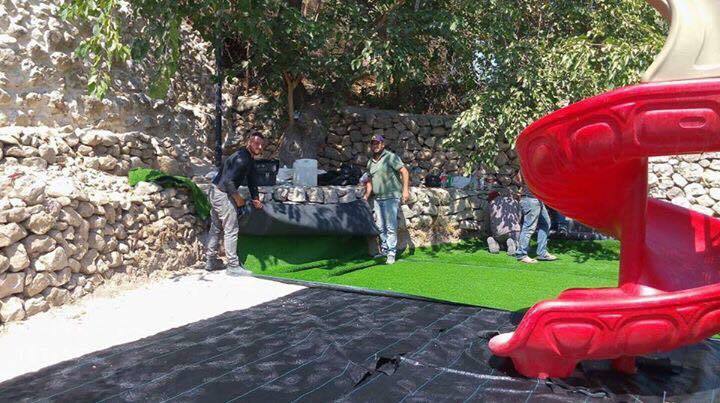 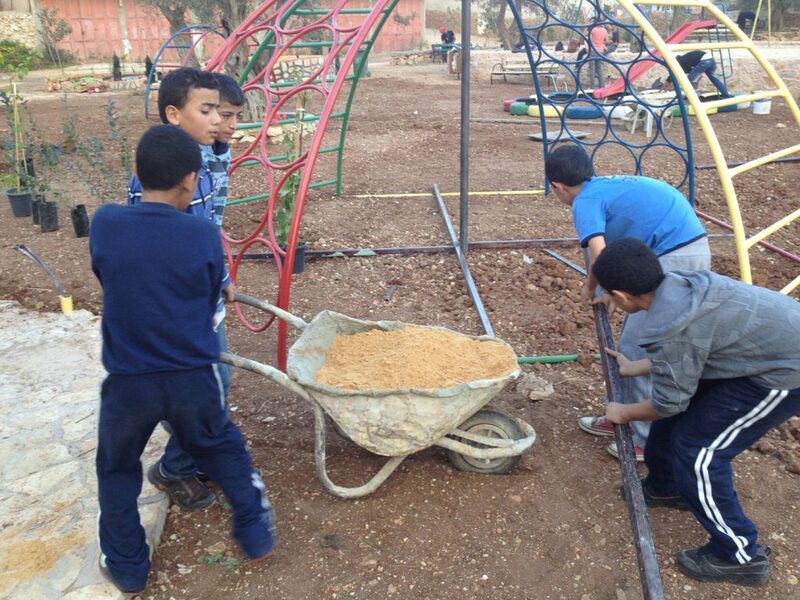 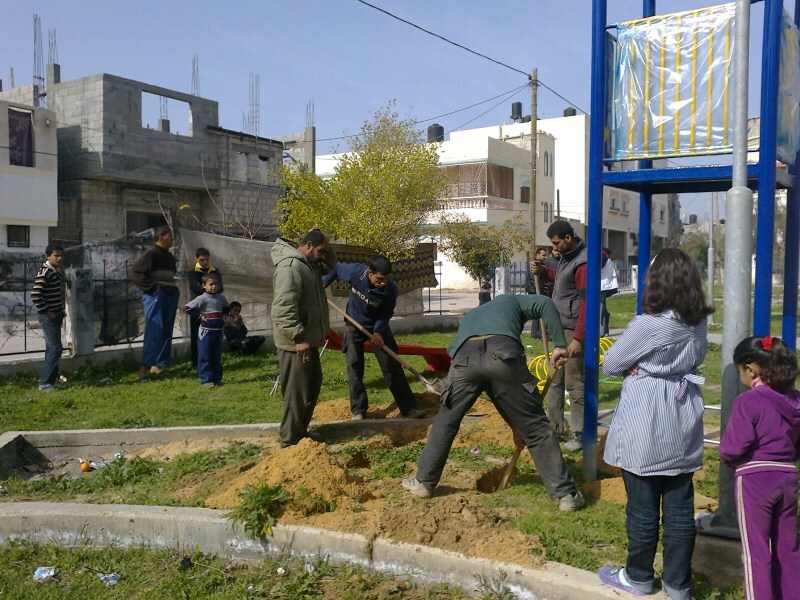 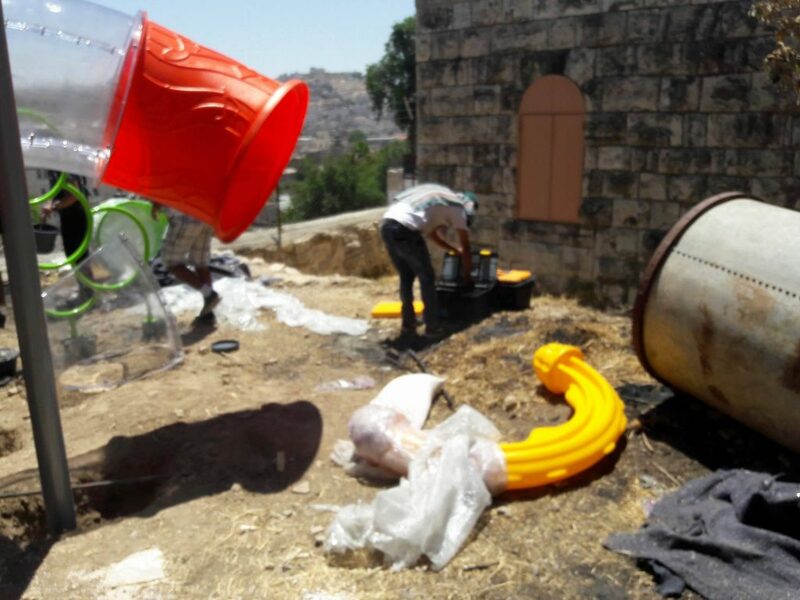 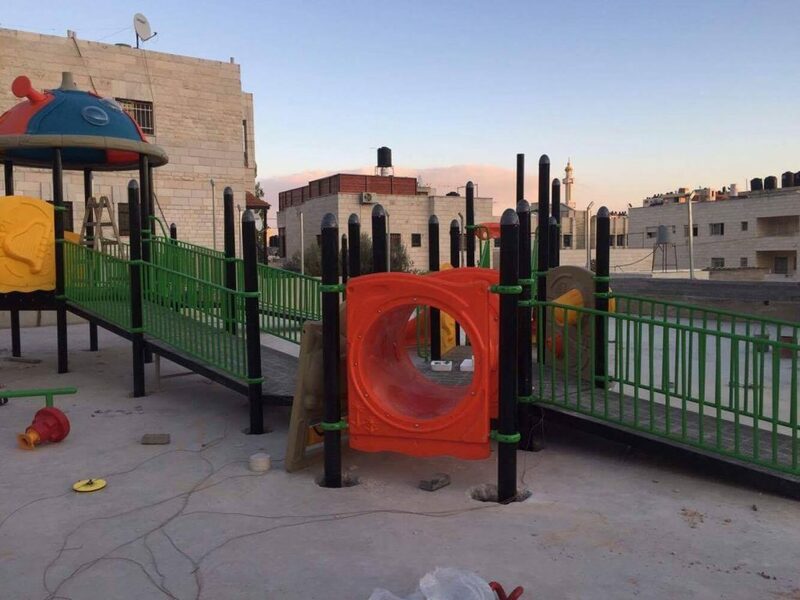 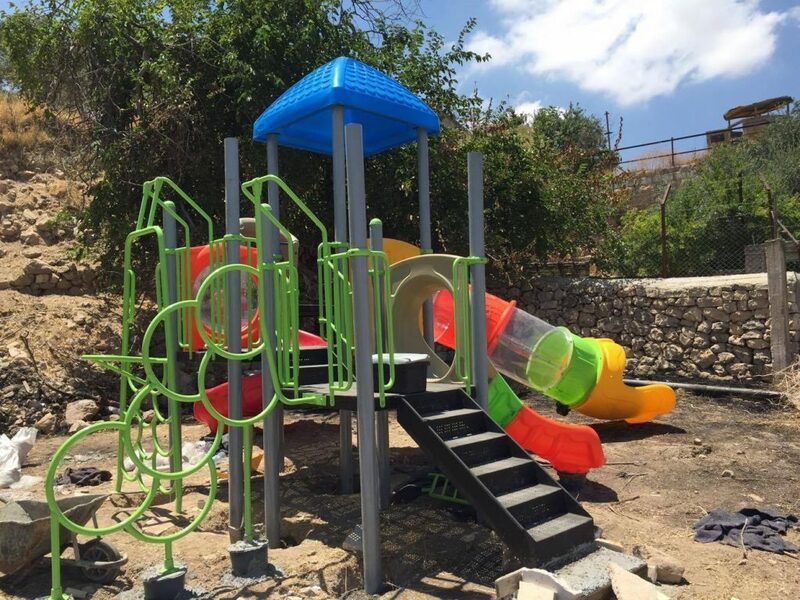 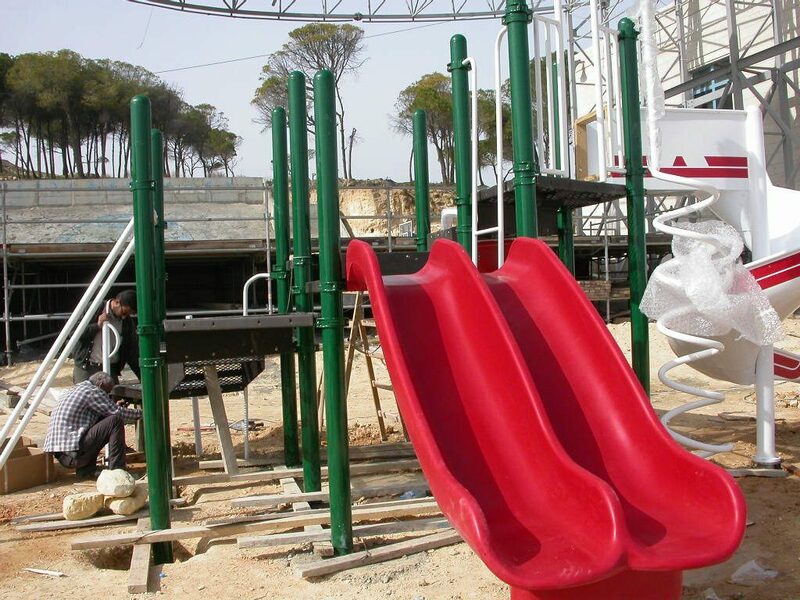 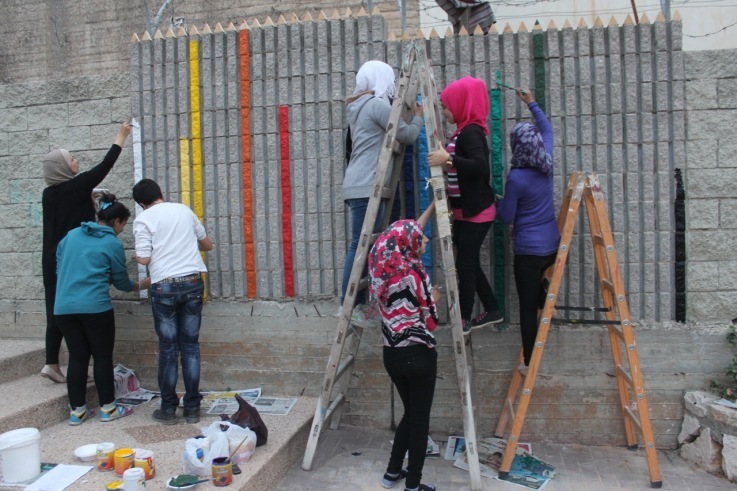 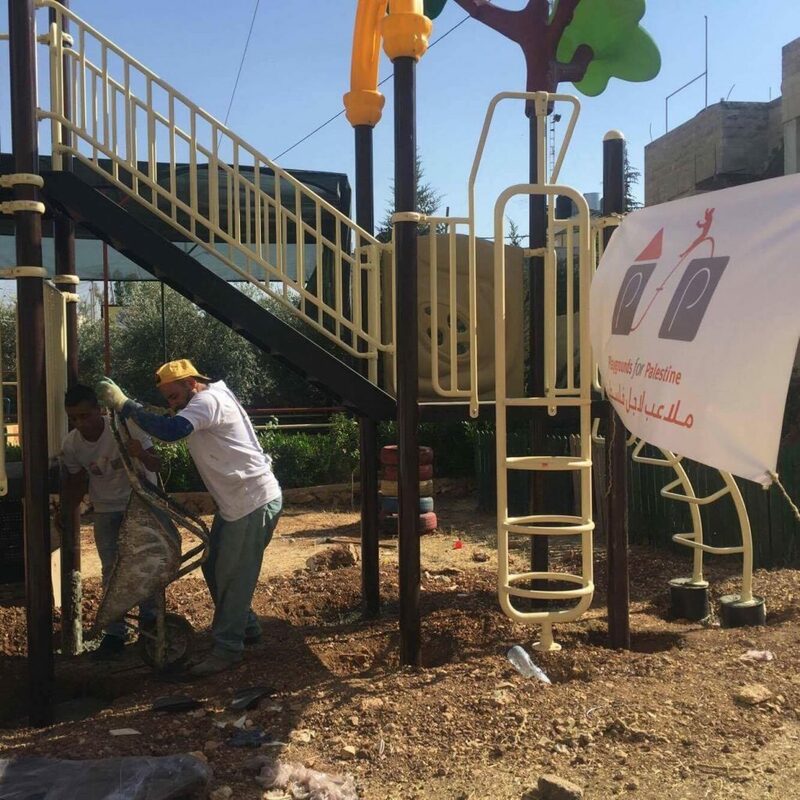 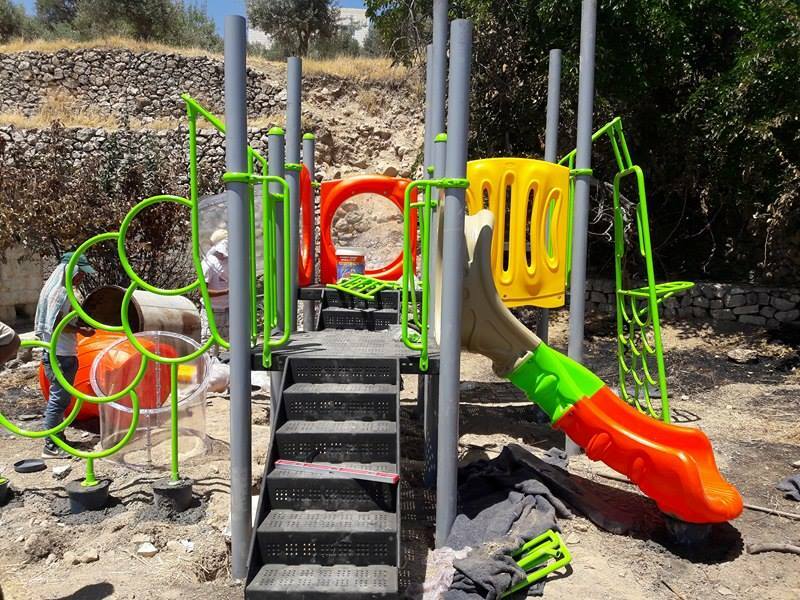 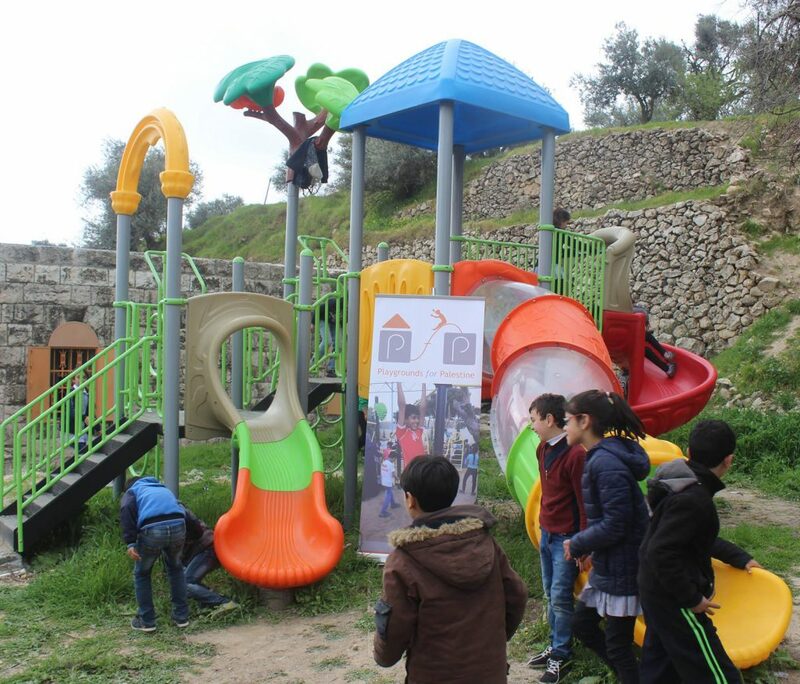 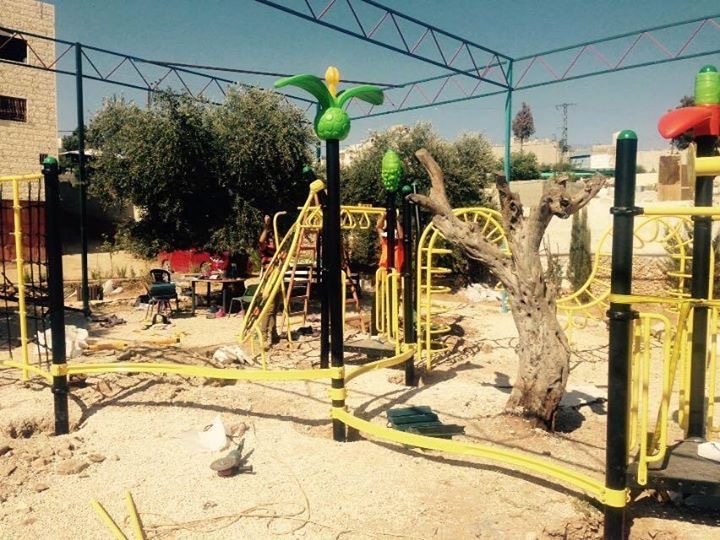 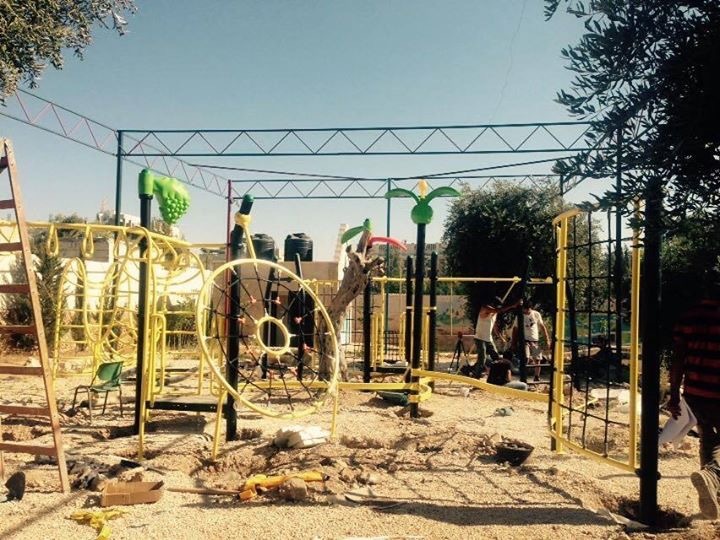 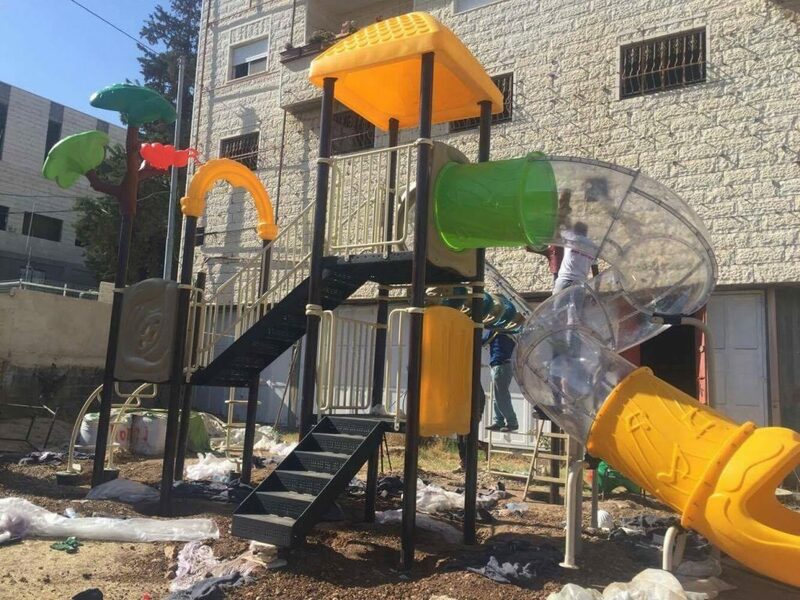 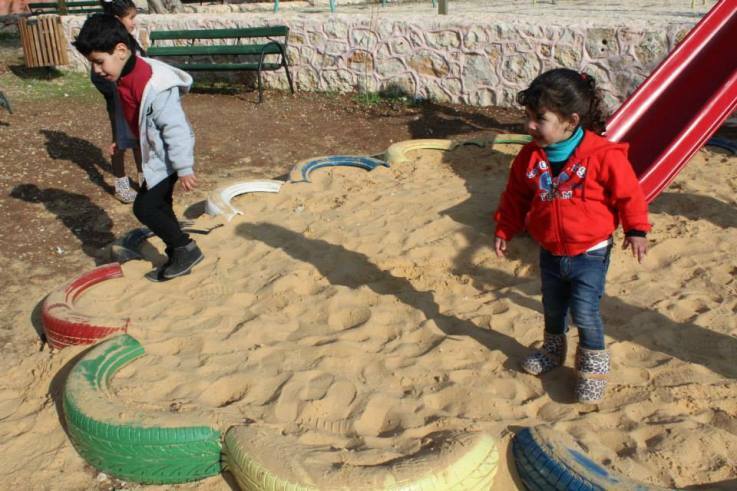 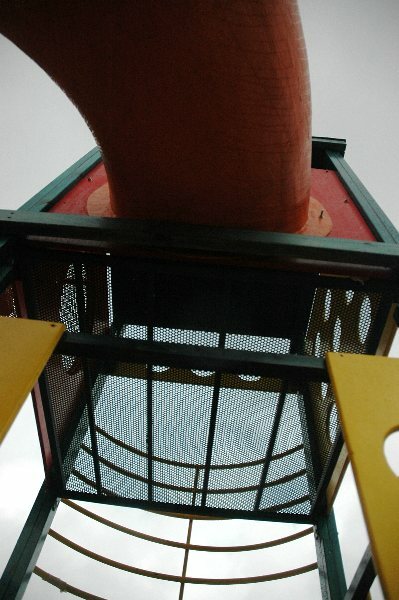 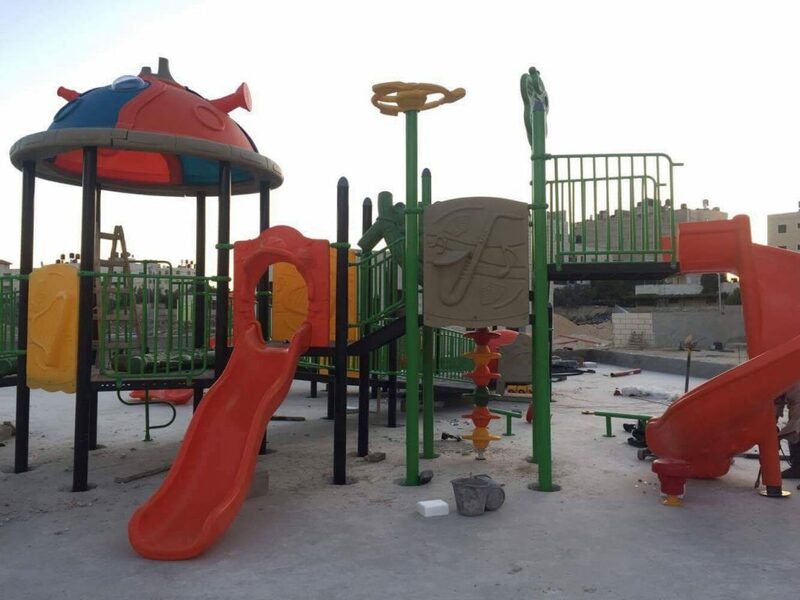 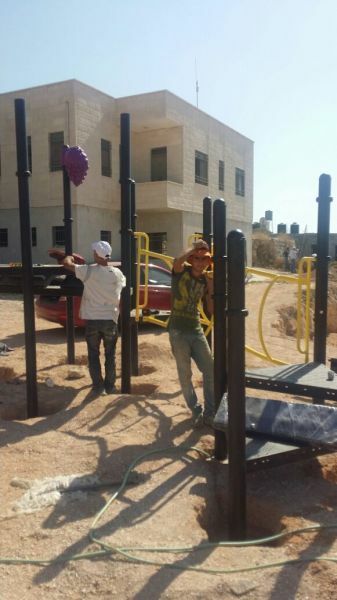 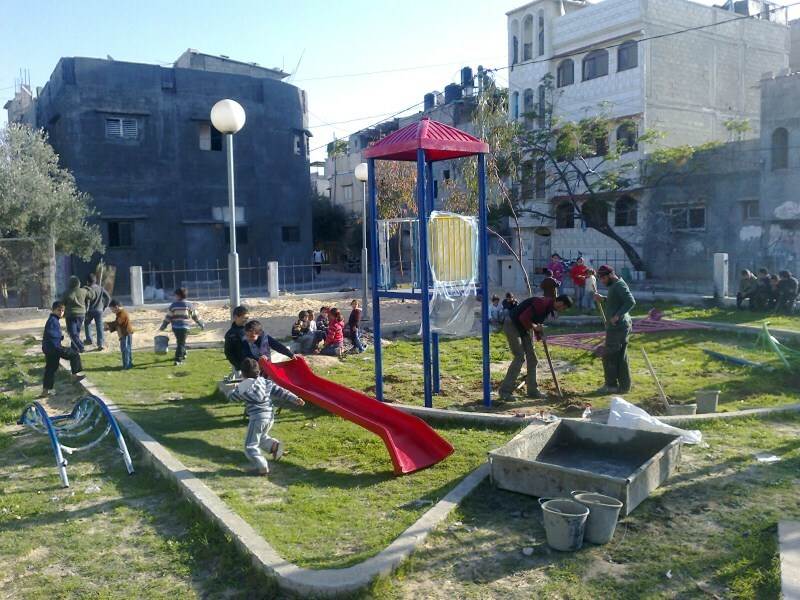 Due to military restrictions and bad weather, installation was not able to be completed before the Playgrounds for Palestine’s representative left. 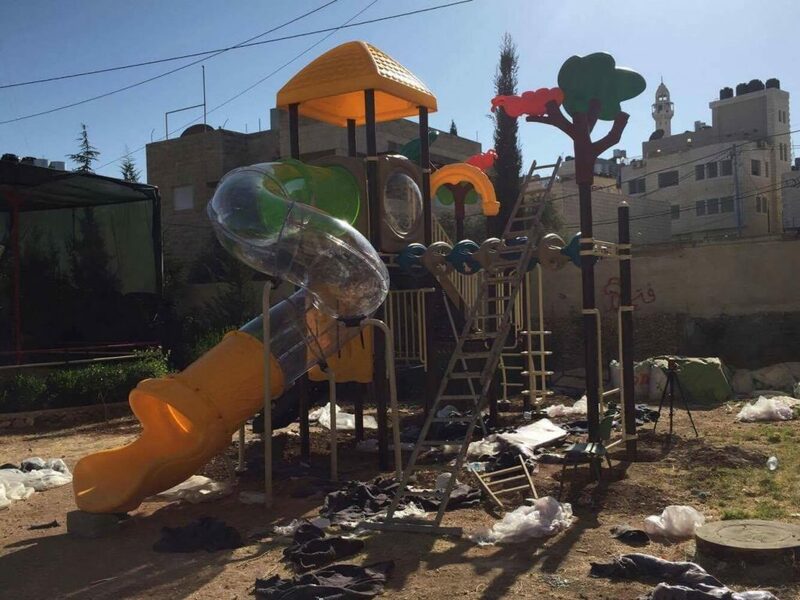 UPDATE: Sadly, this playground was destroyed. 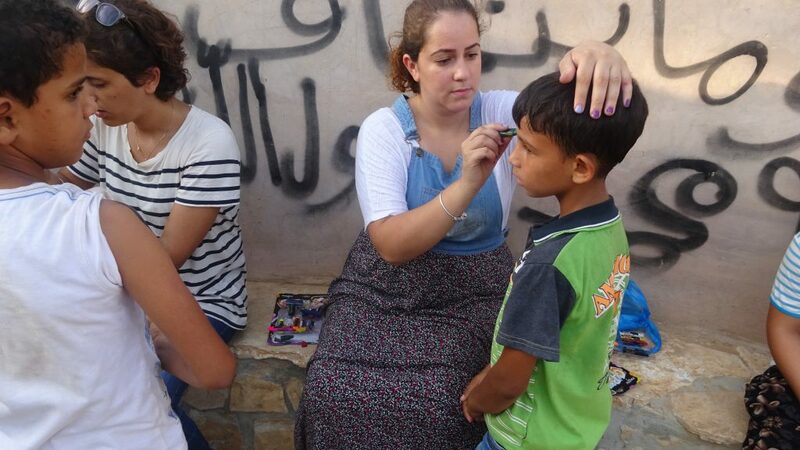 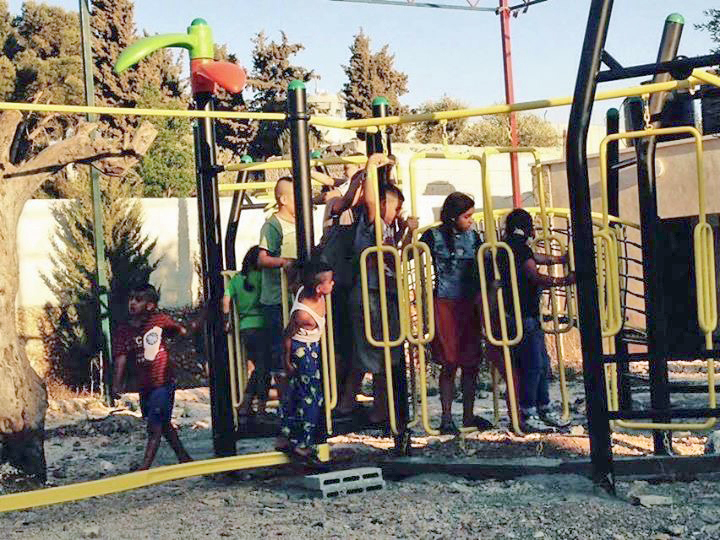 Children in this battered refugee town had been hit especially hard by the occupation. 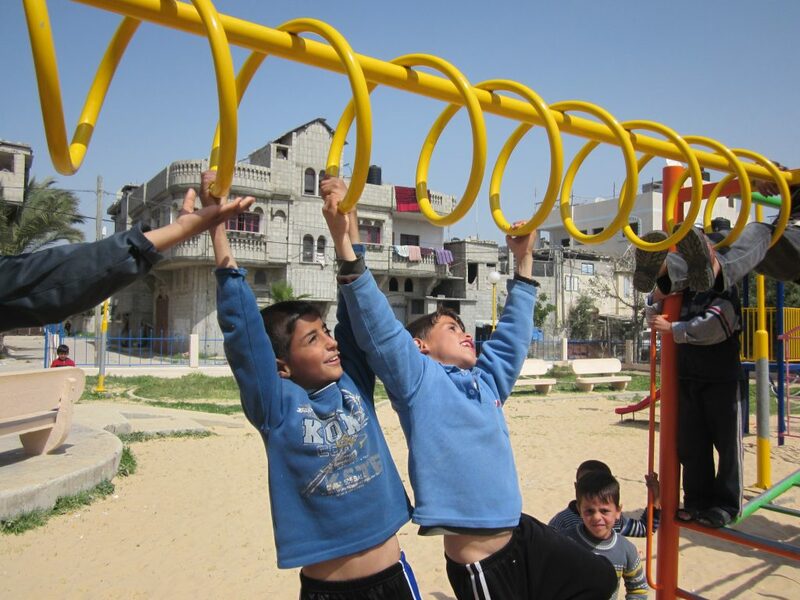 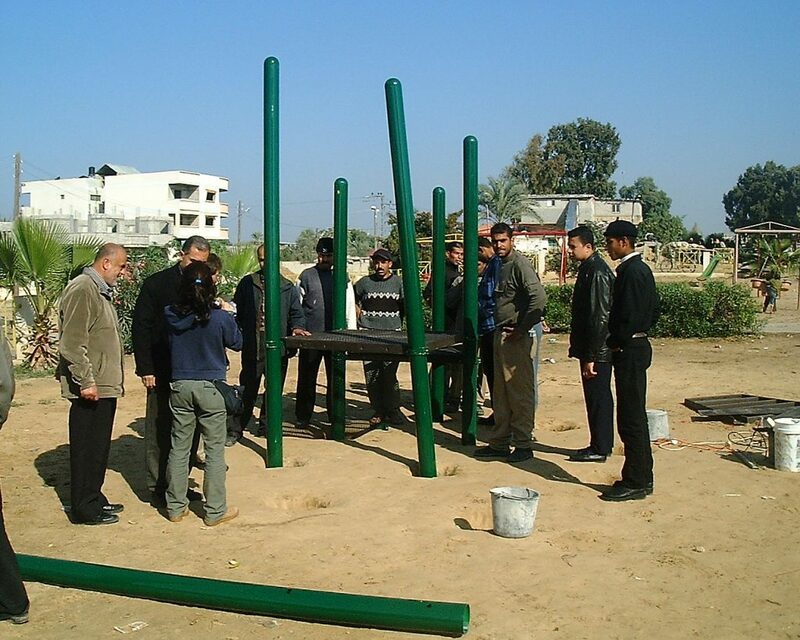 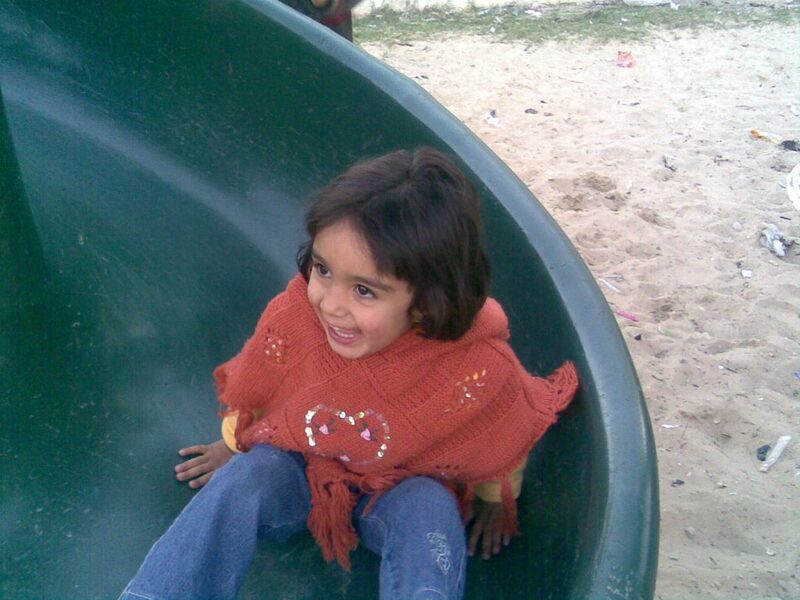 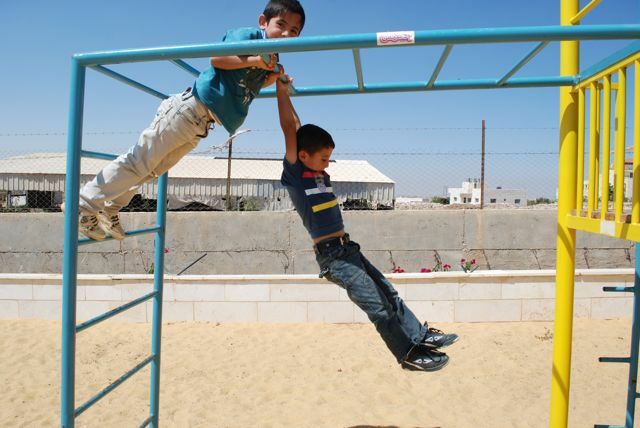 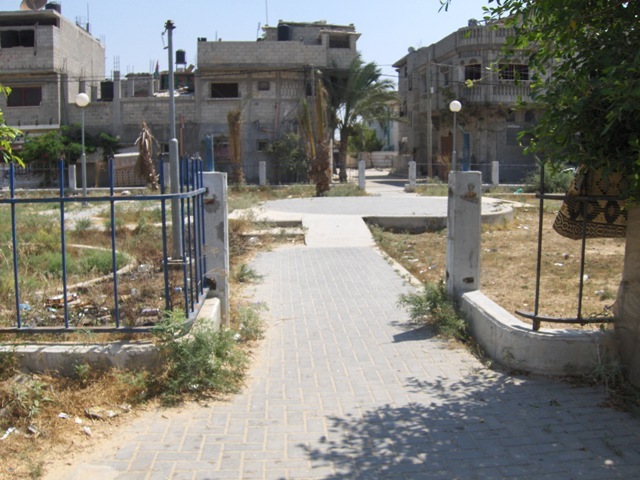 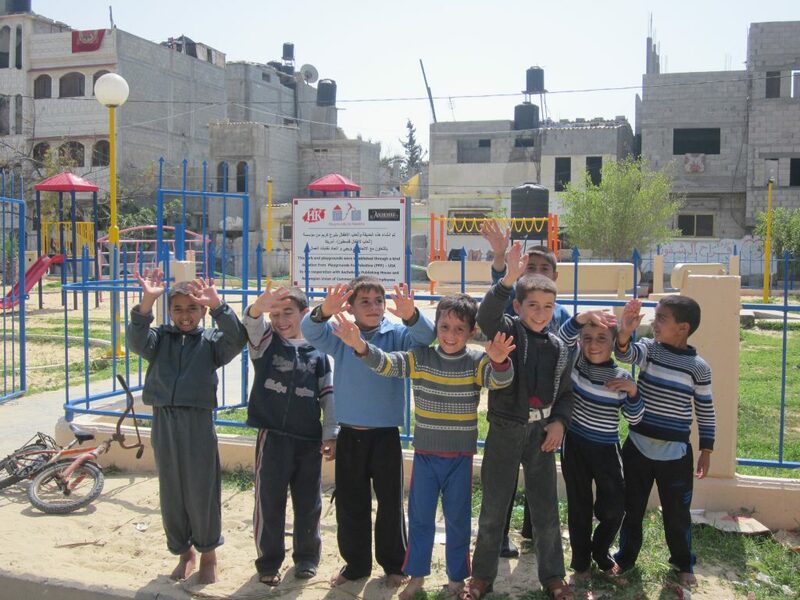 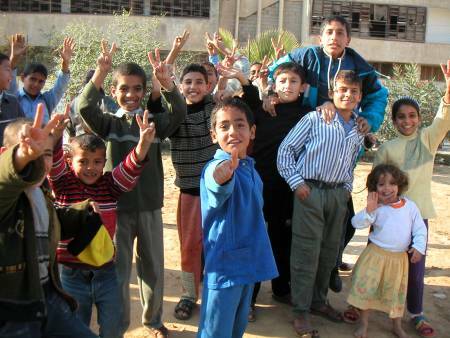 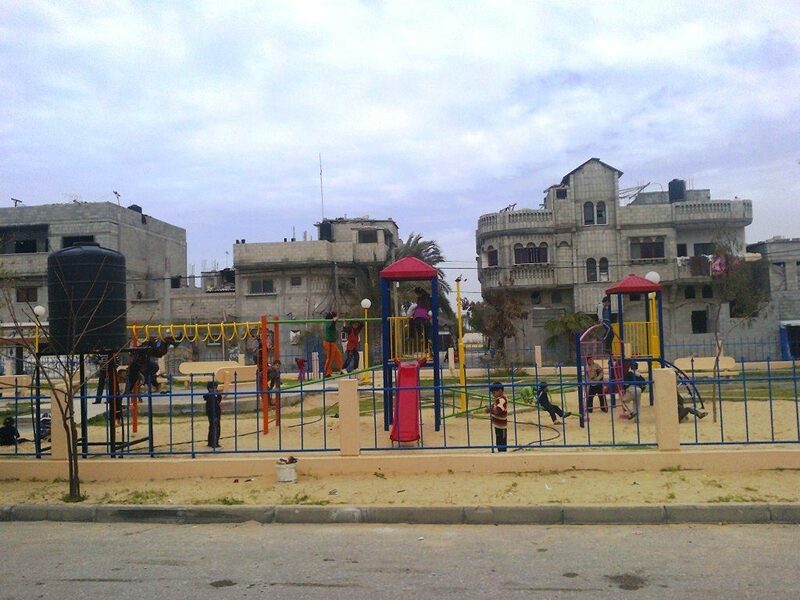 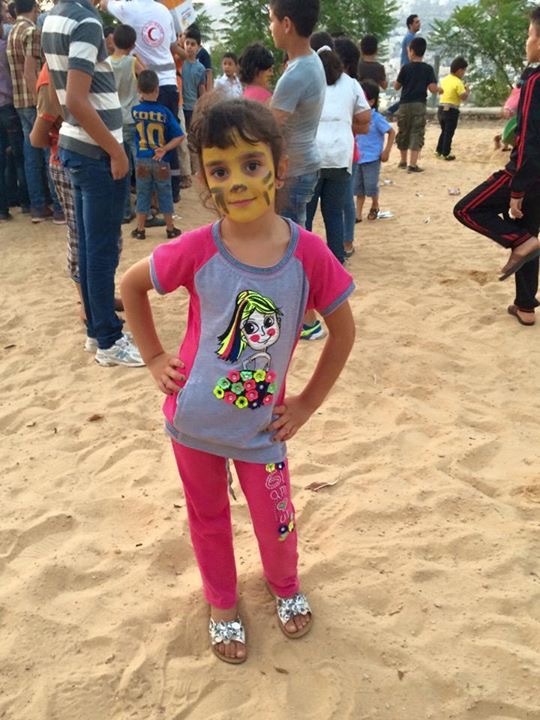 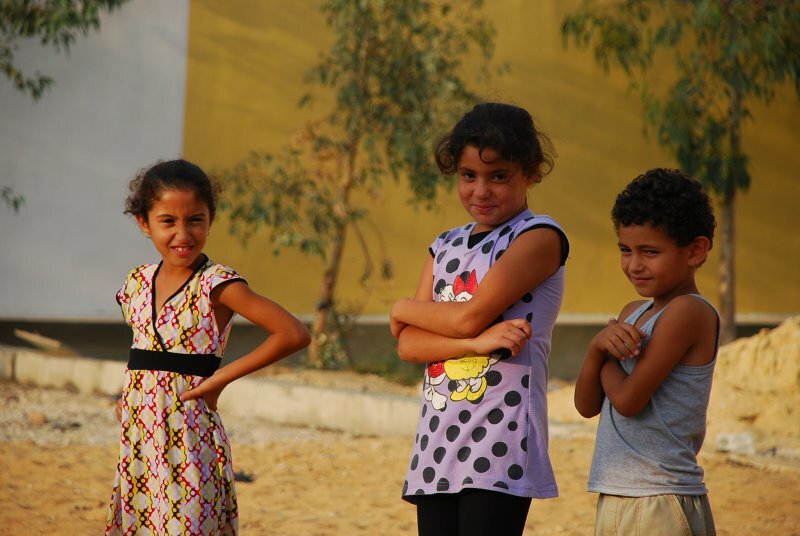 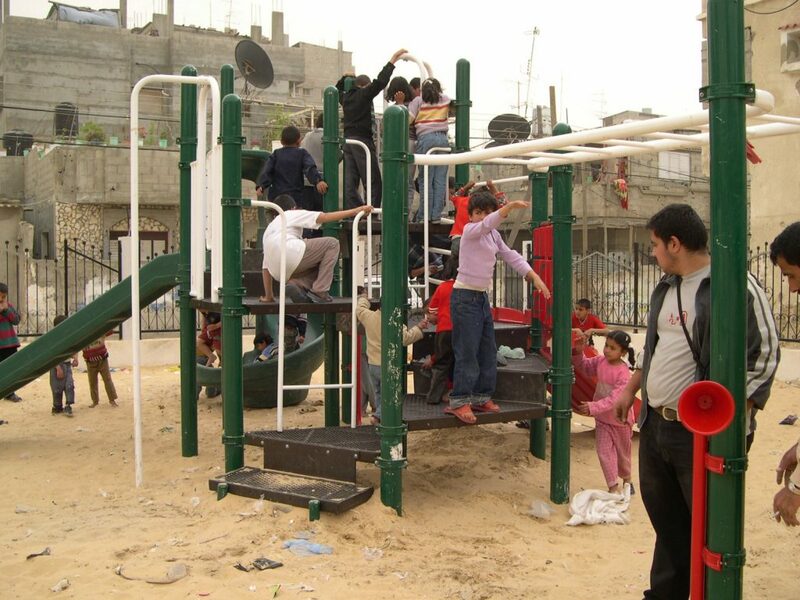 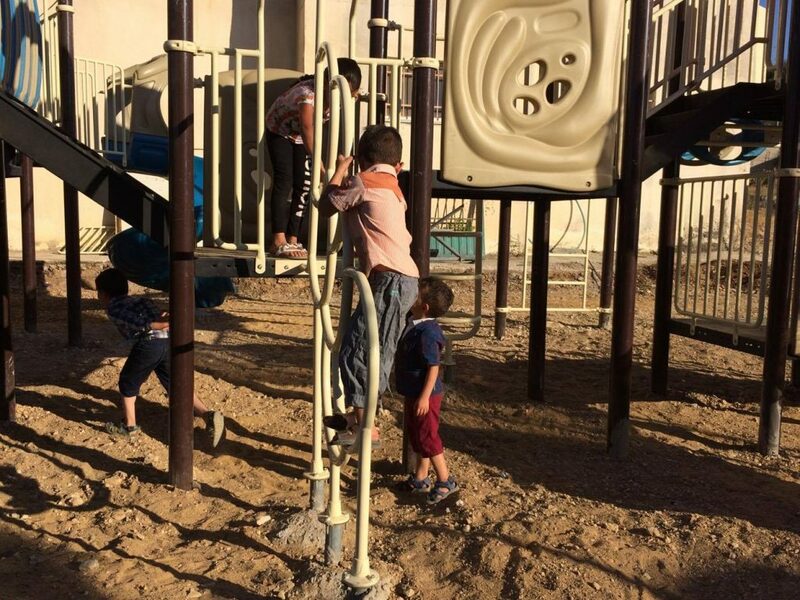 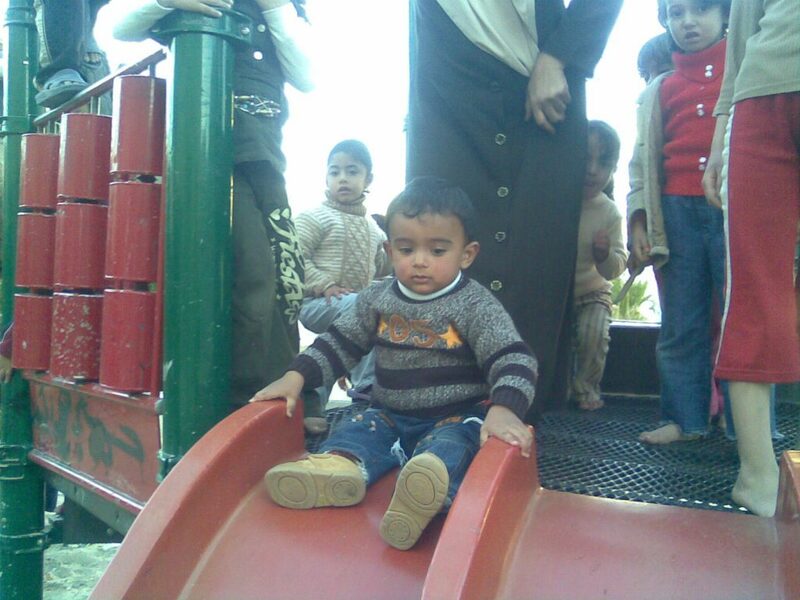 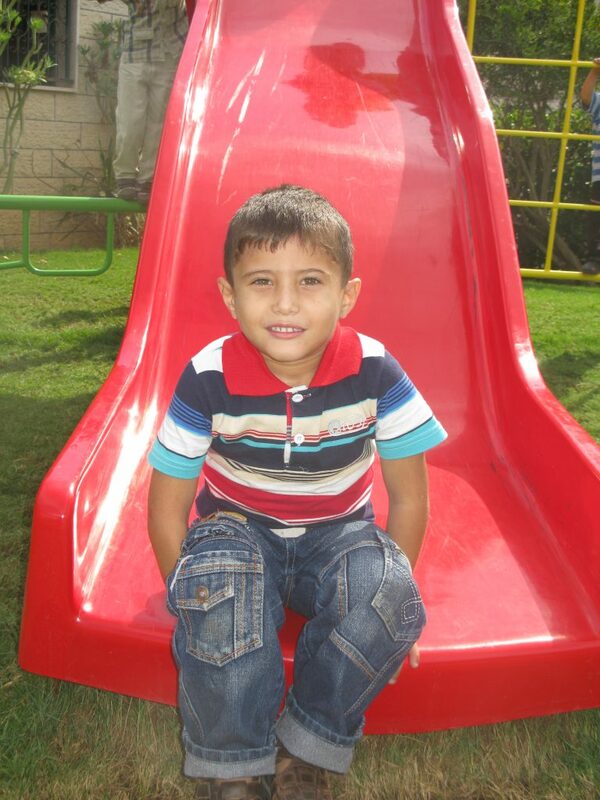 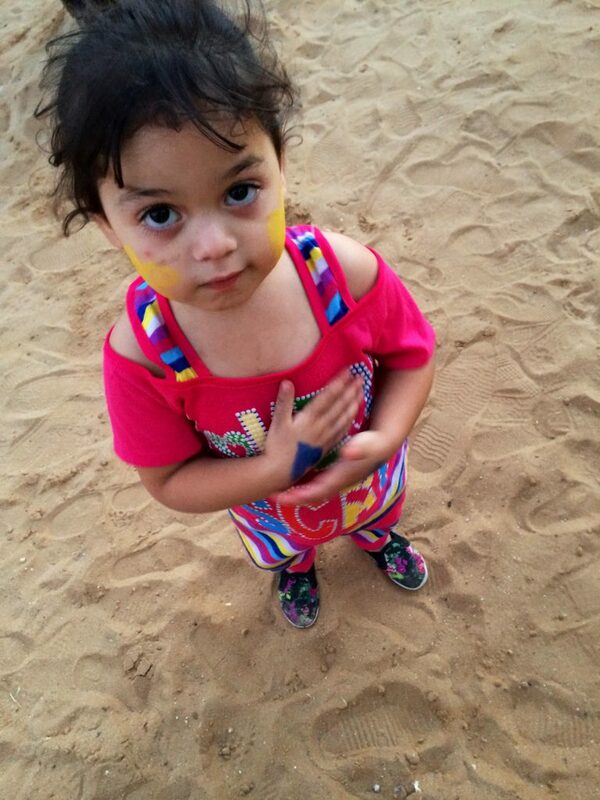 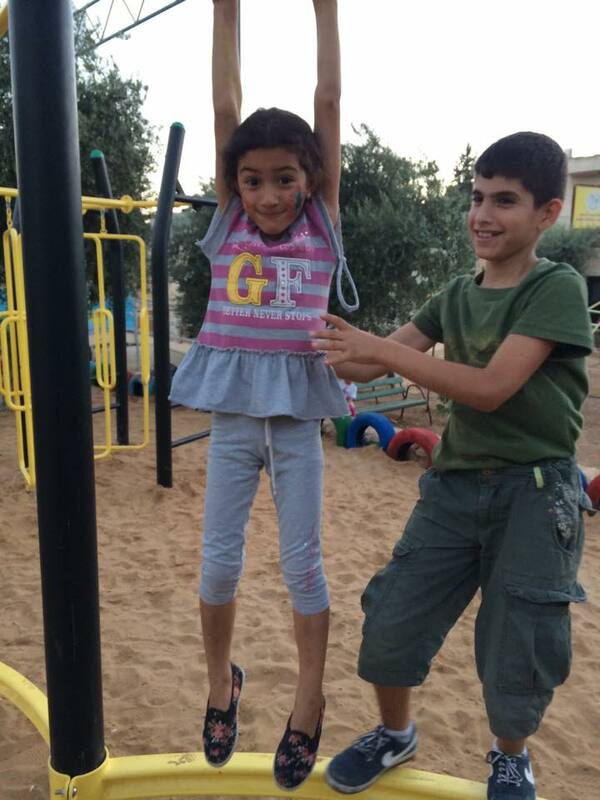 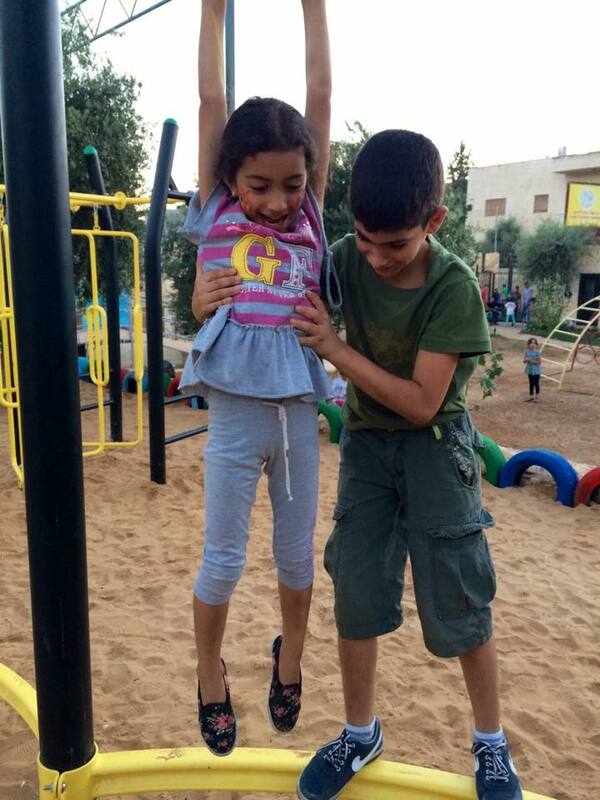 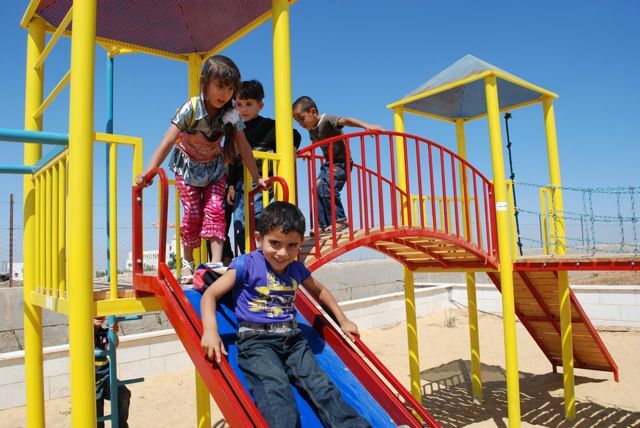 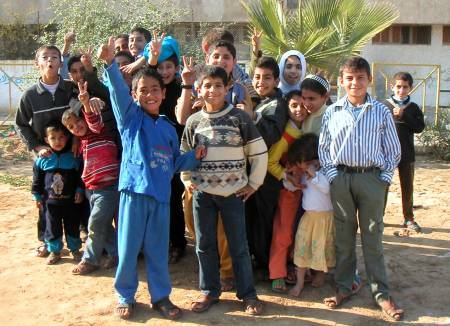 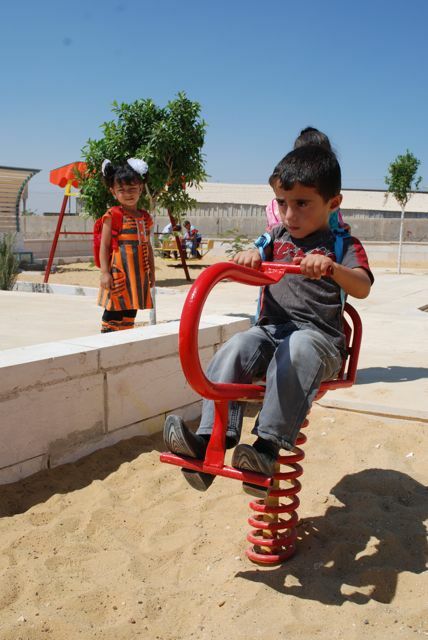 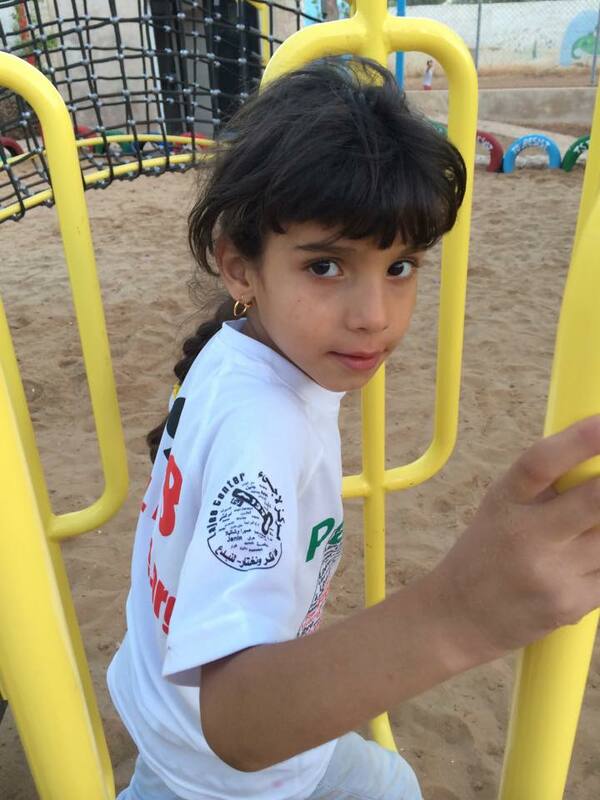 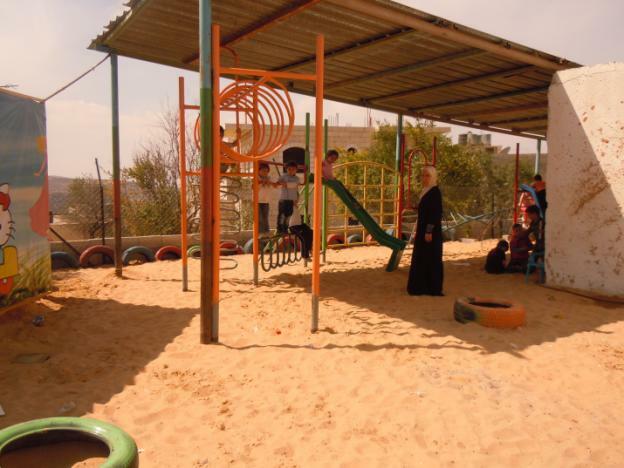 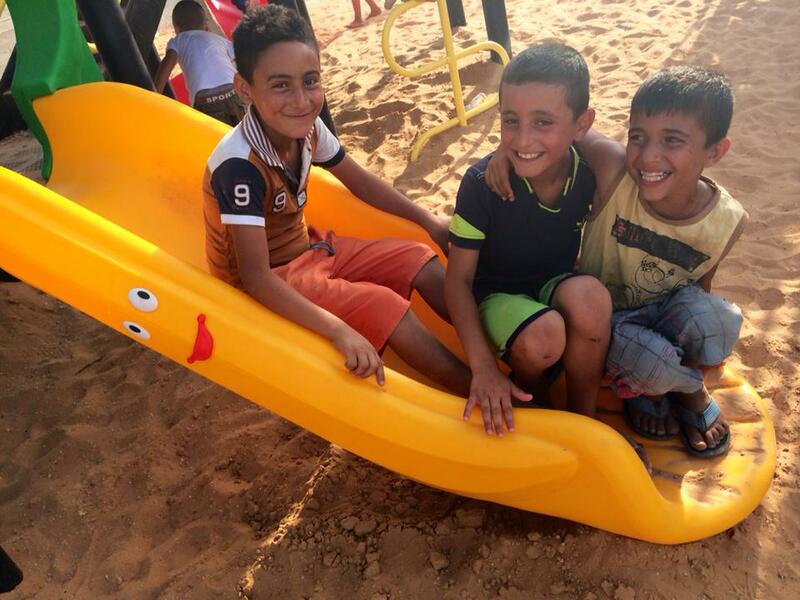 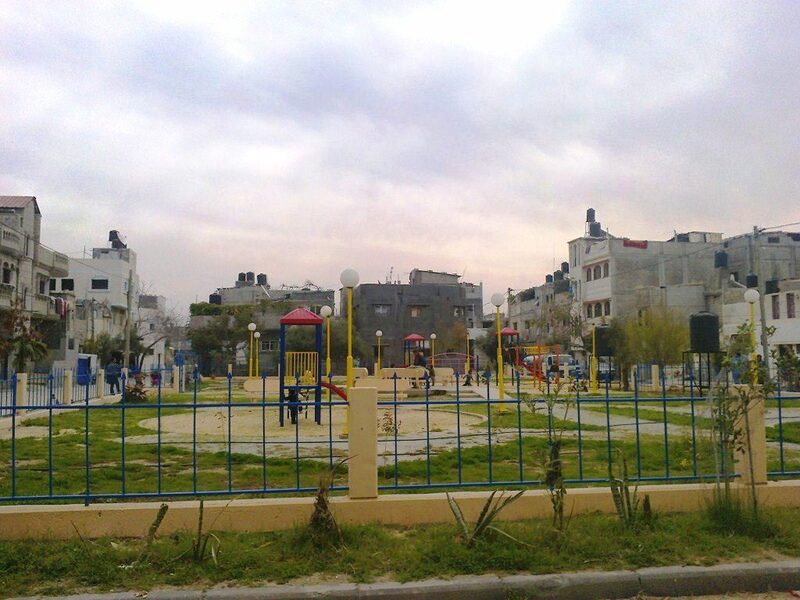 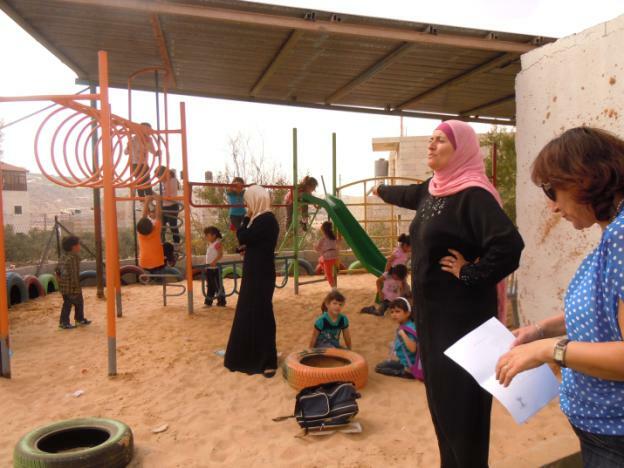 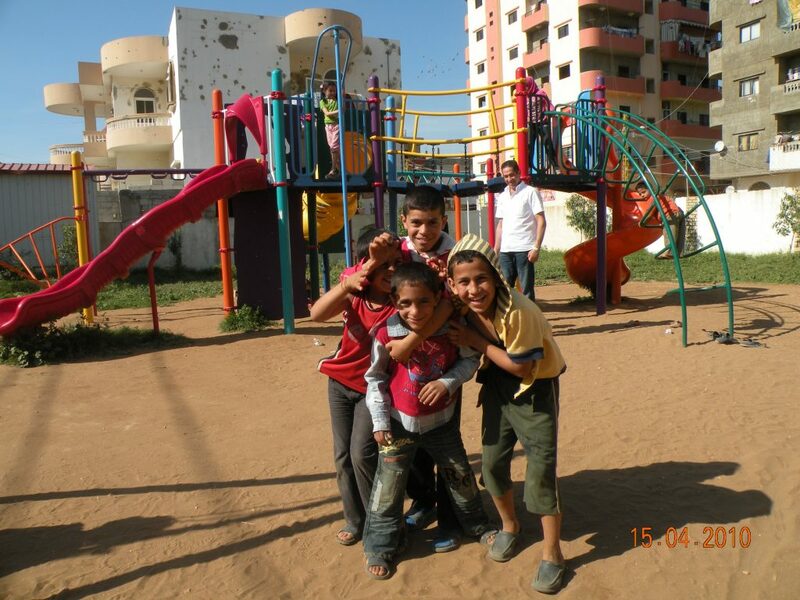 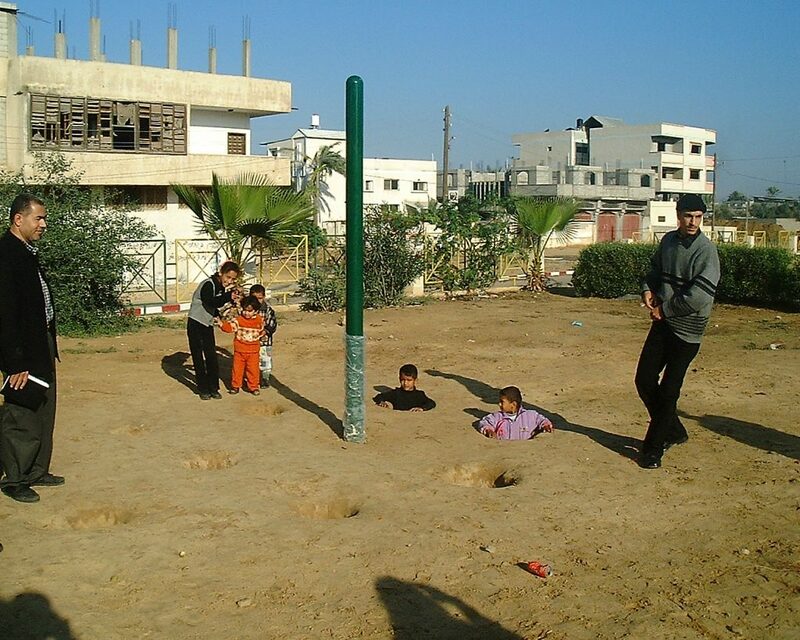 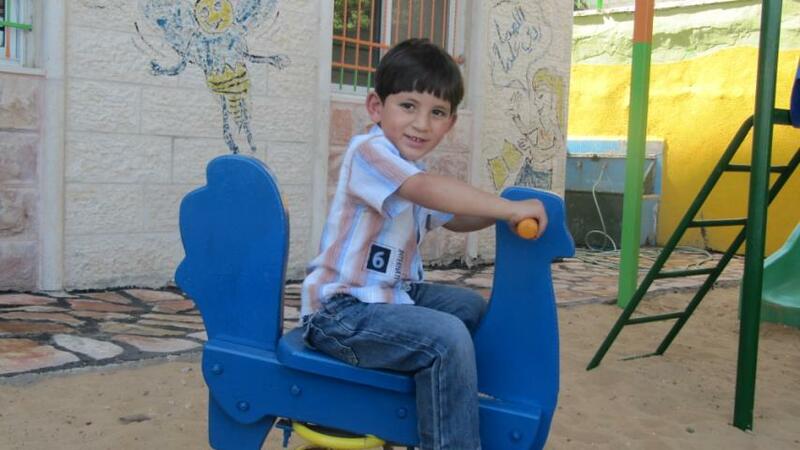 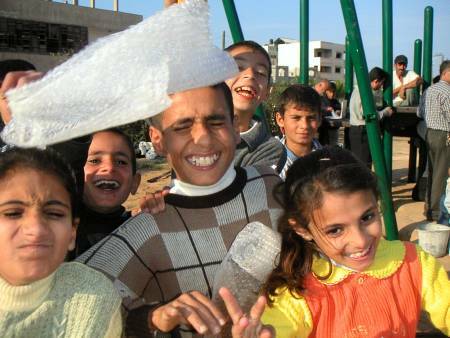 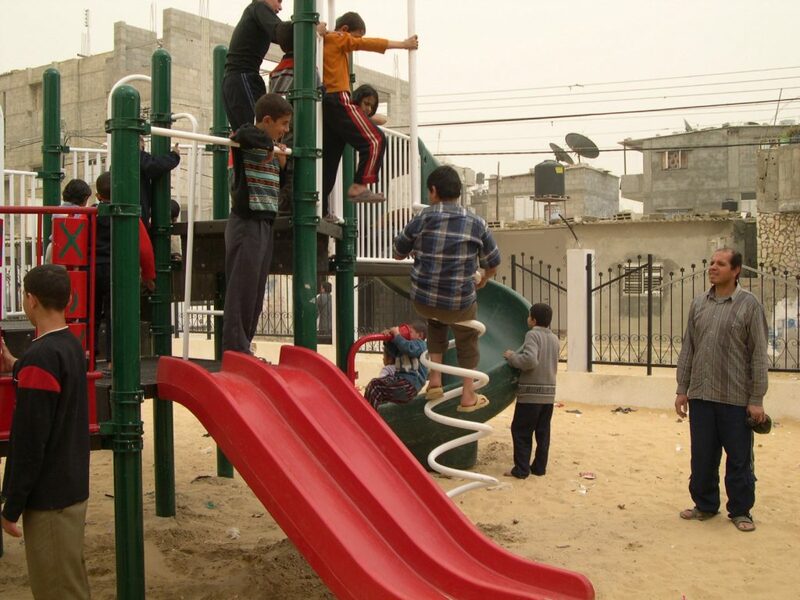 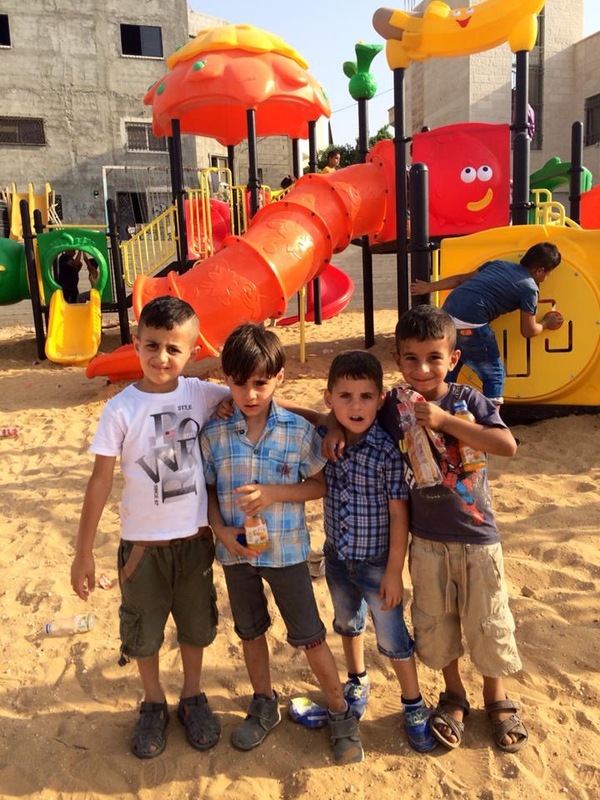 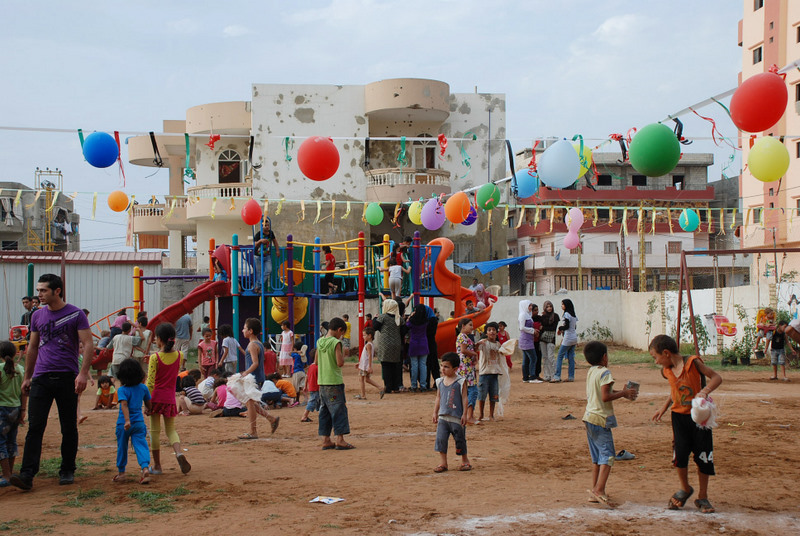 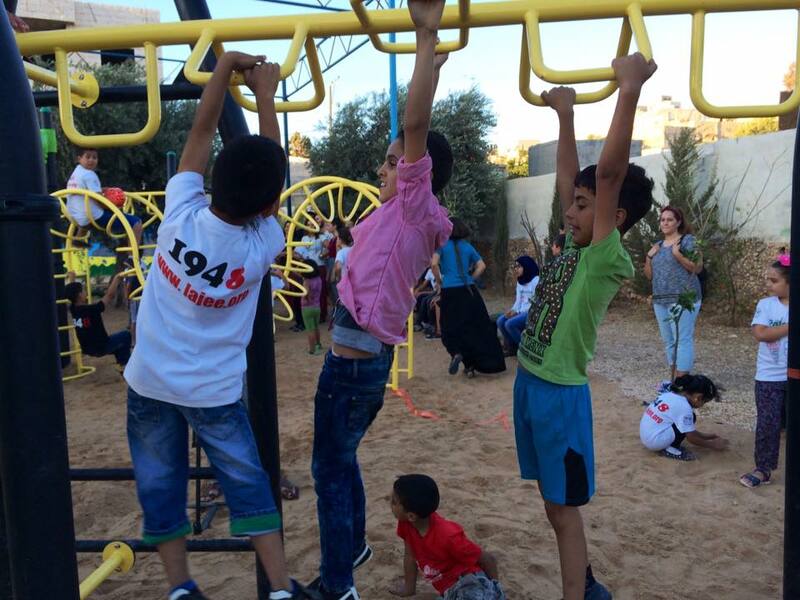 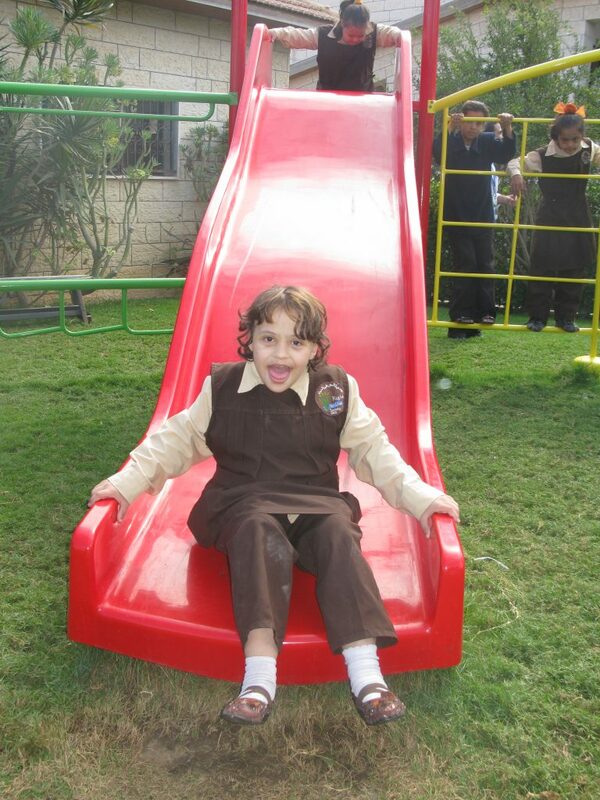 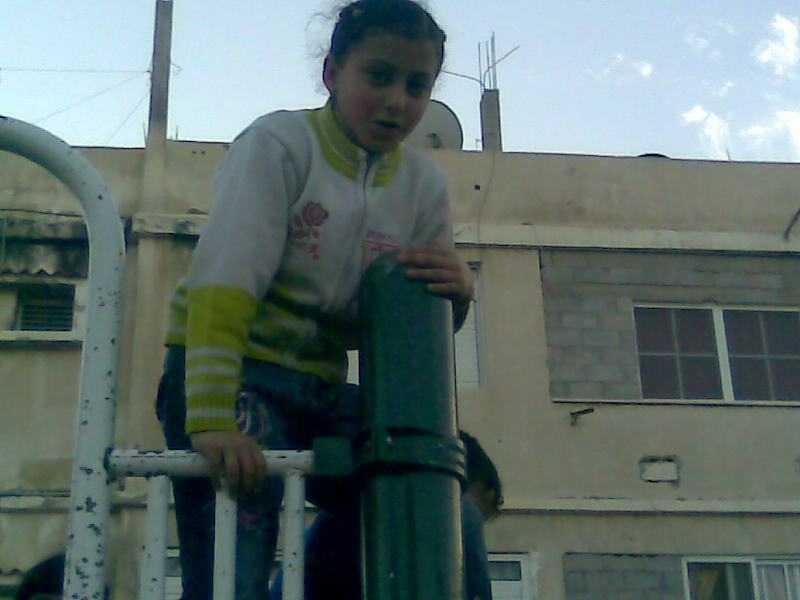 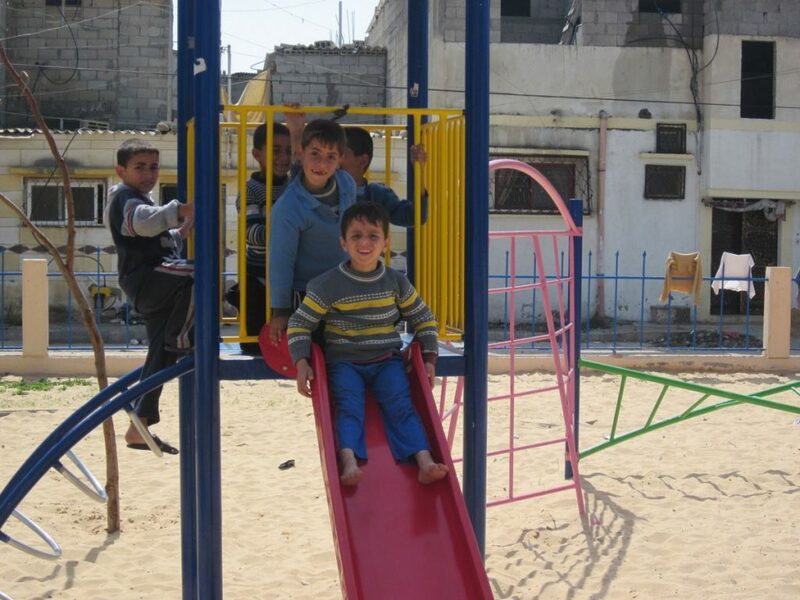 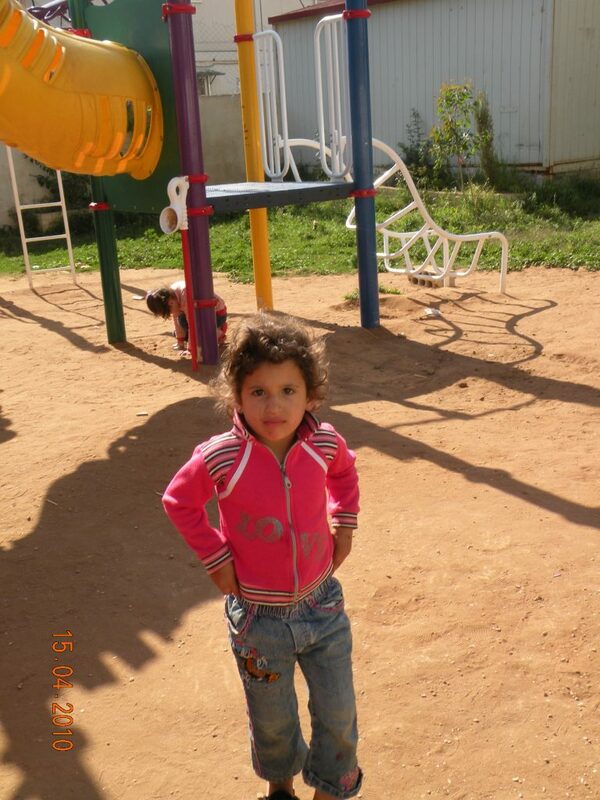 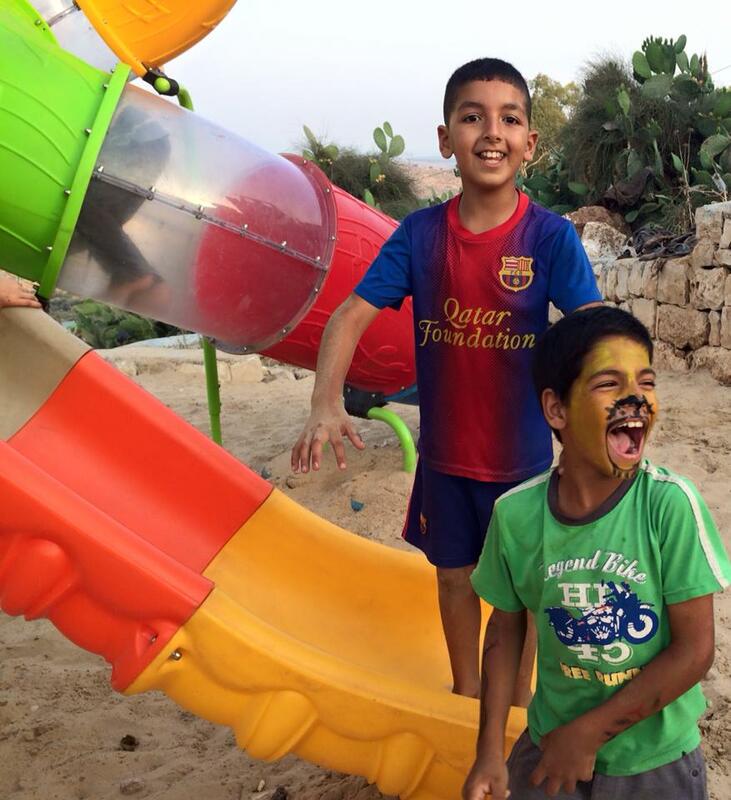 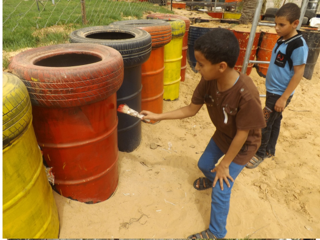 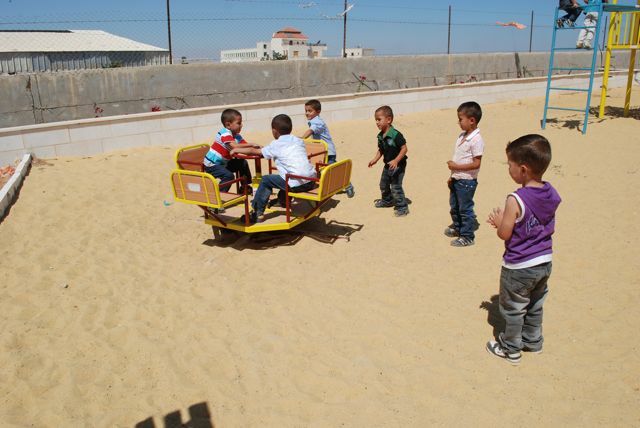 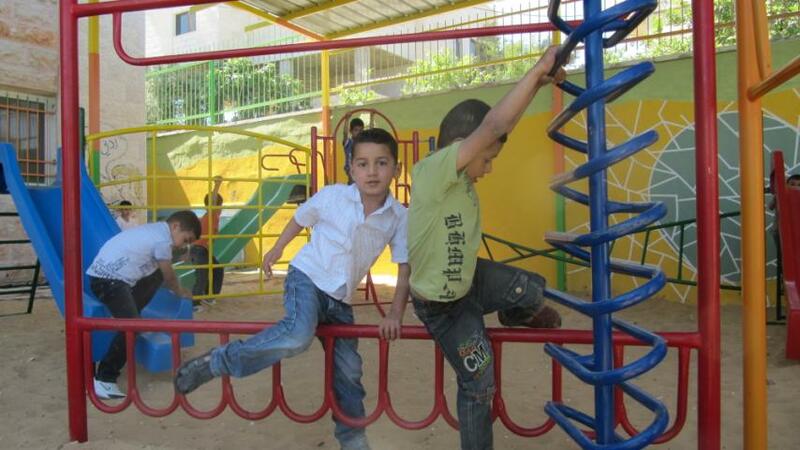 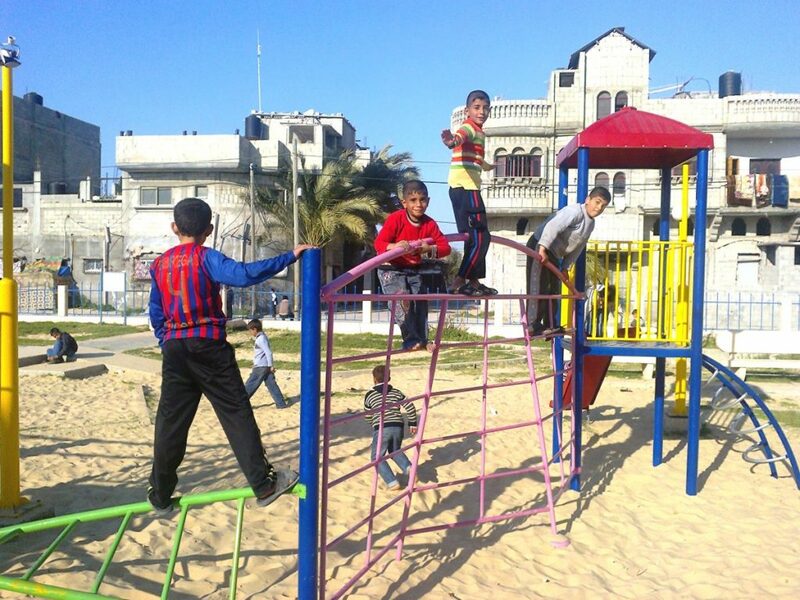 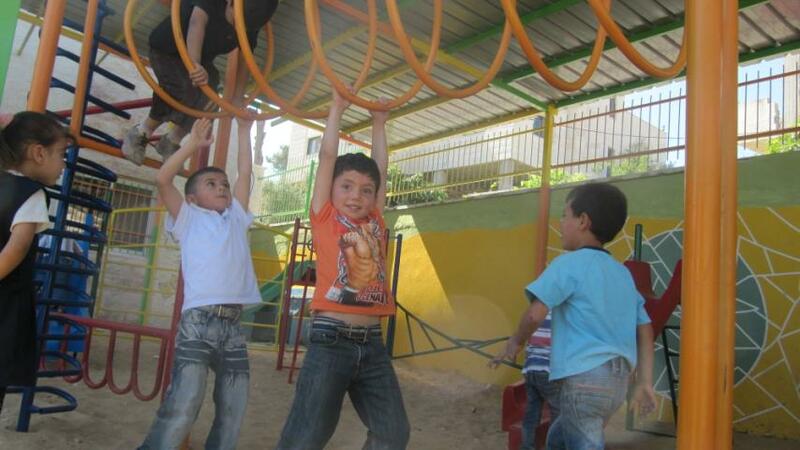 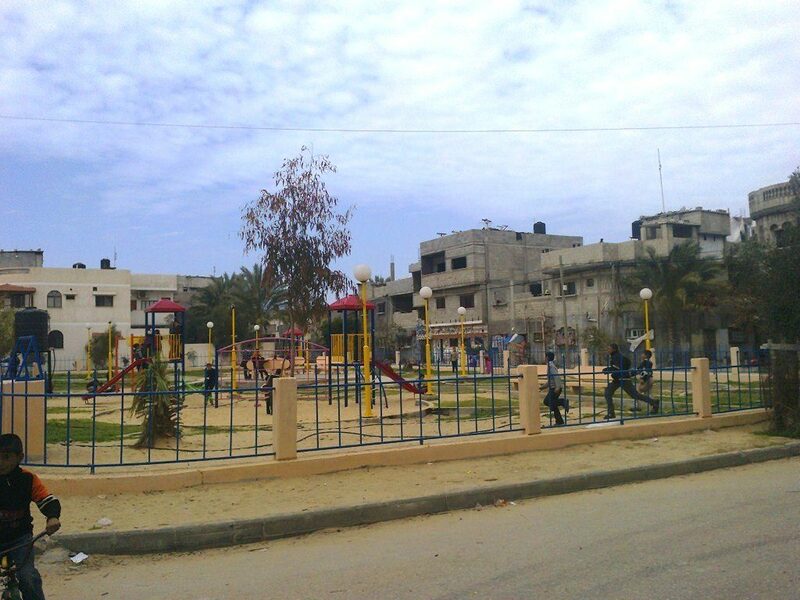 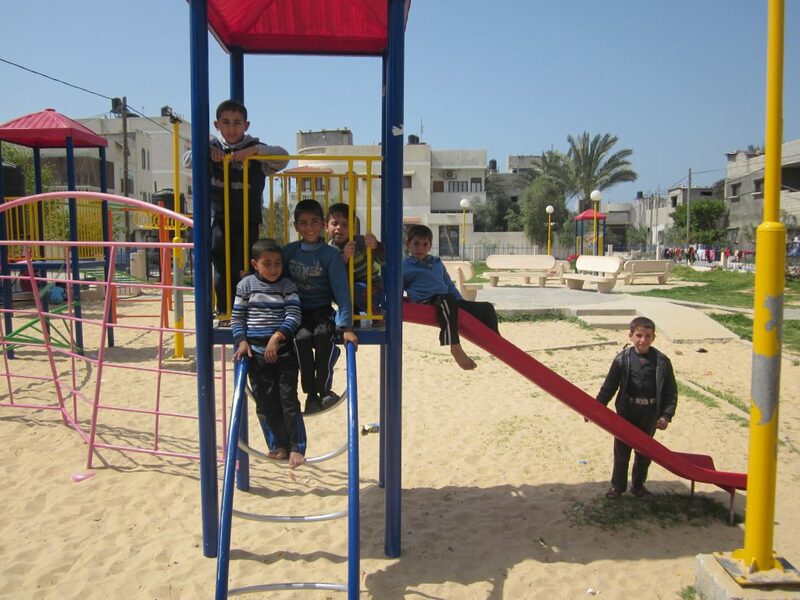 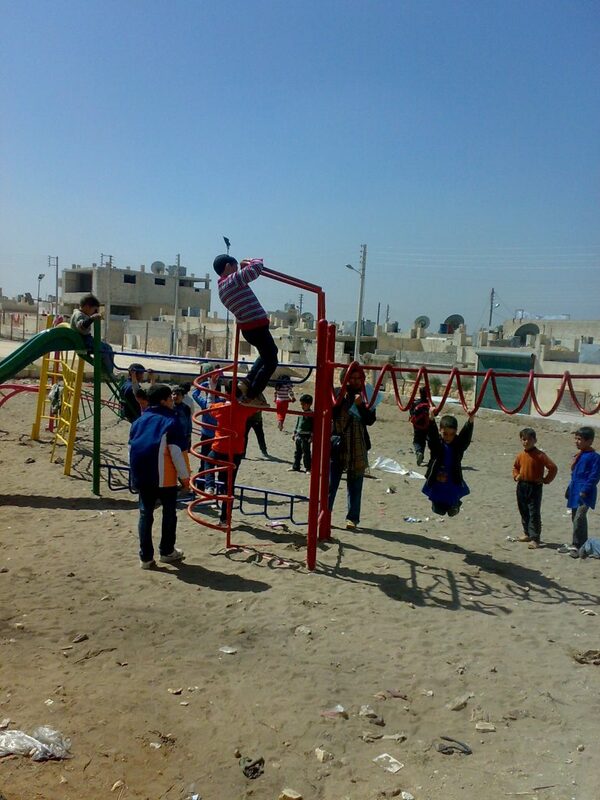 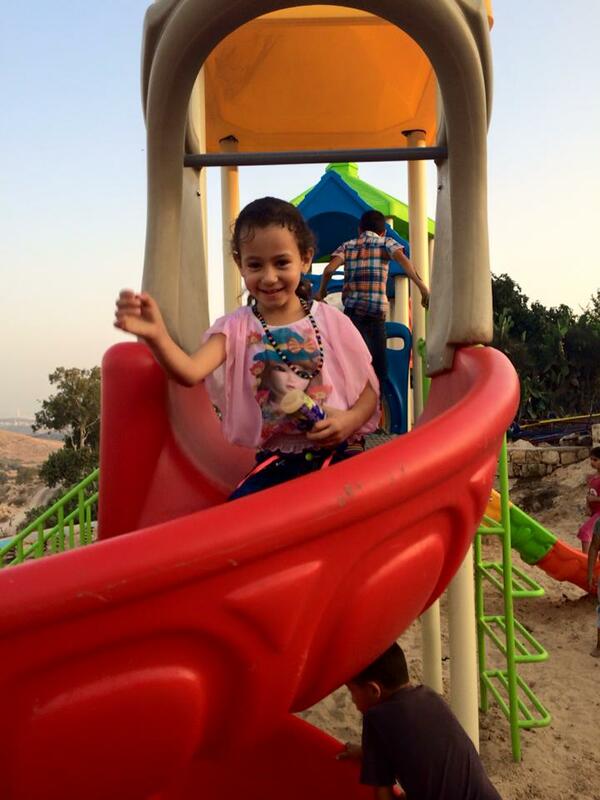 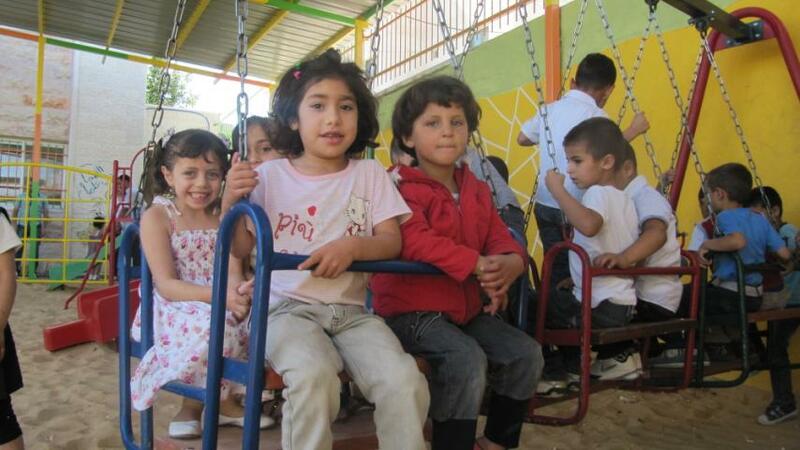 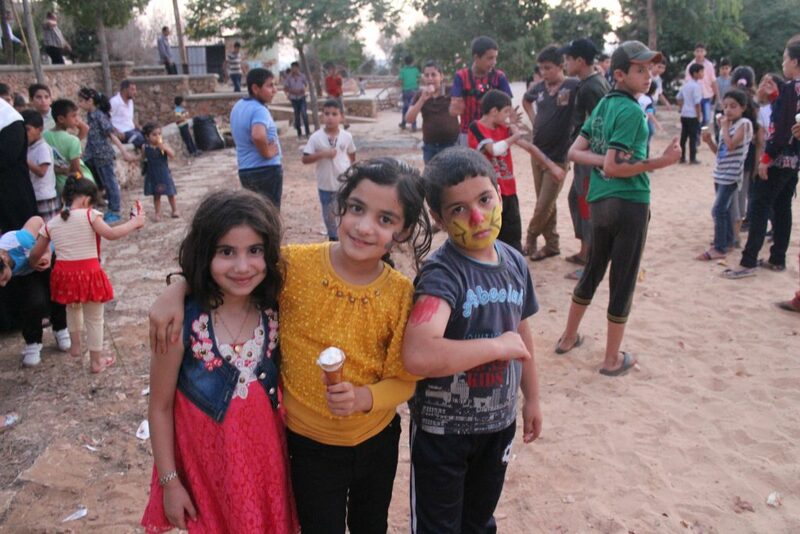 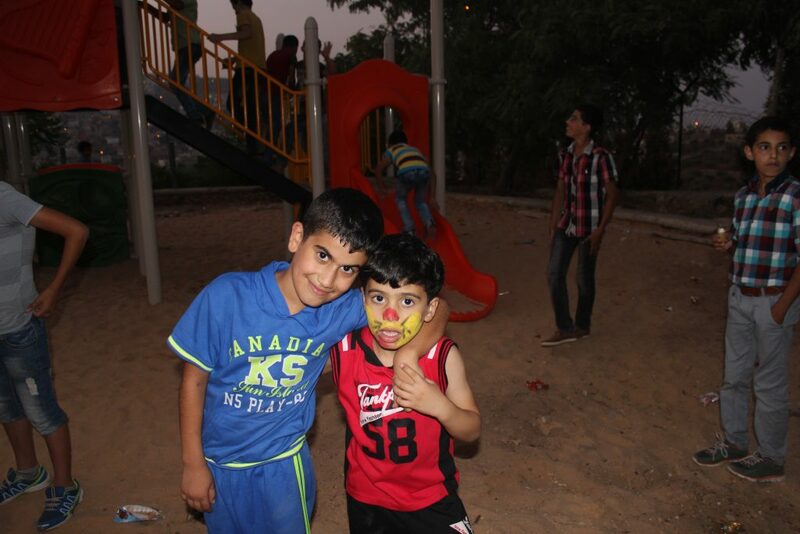 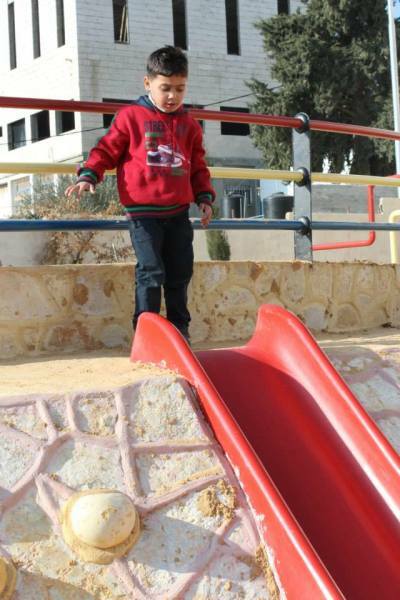 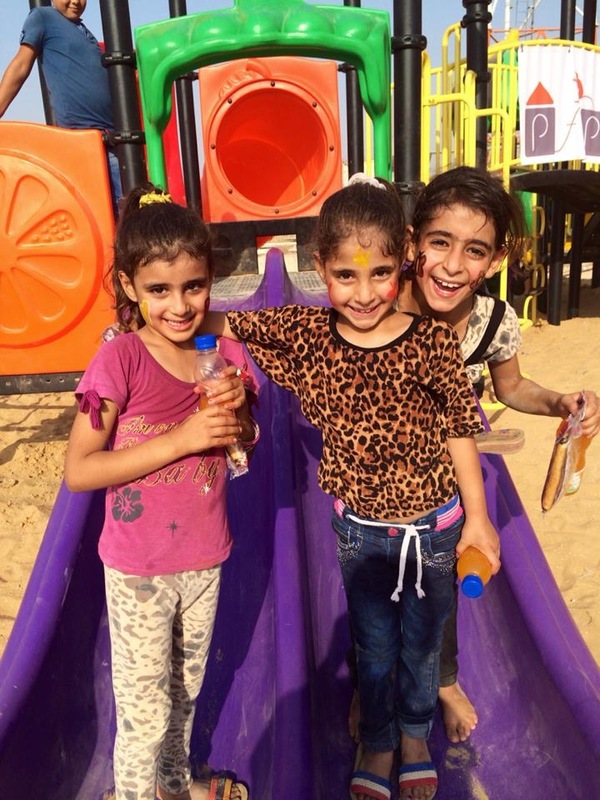 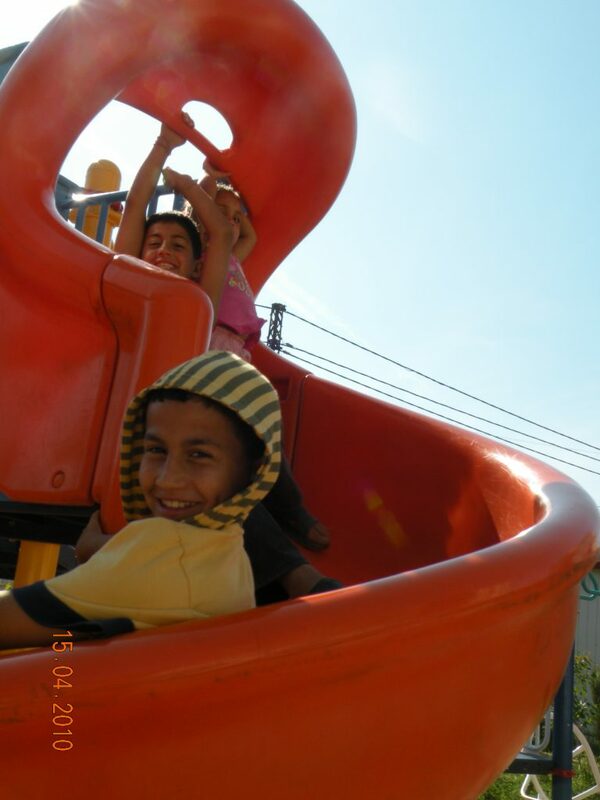 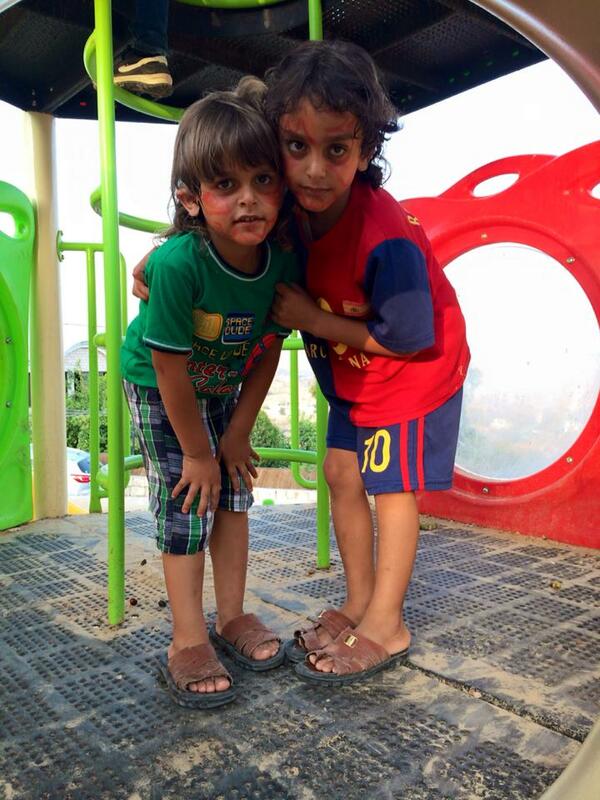 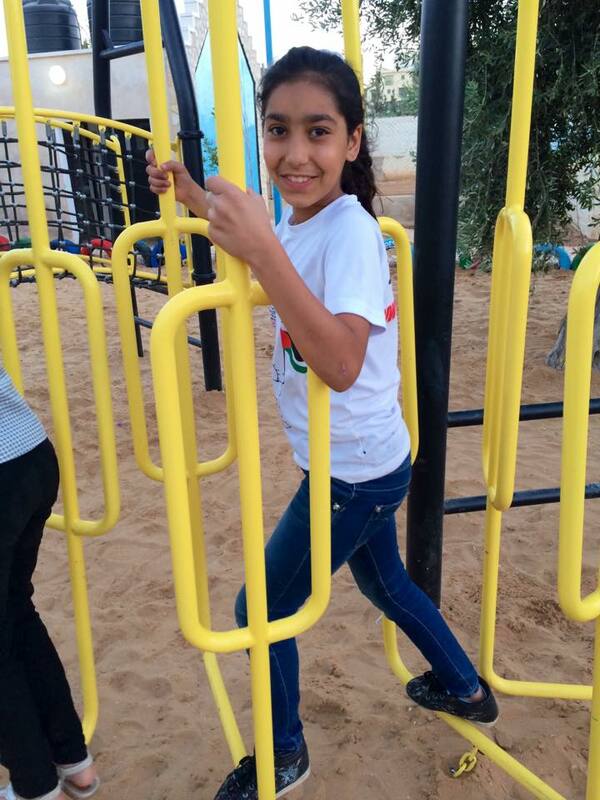 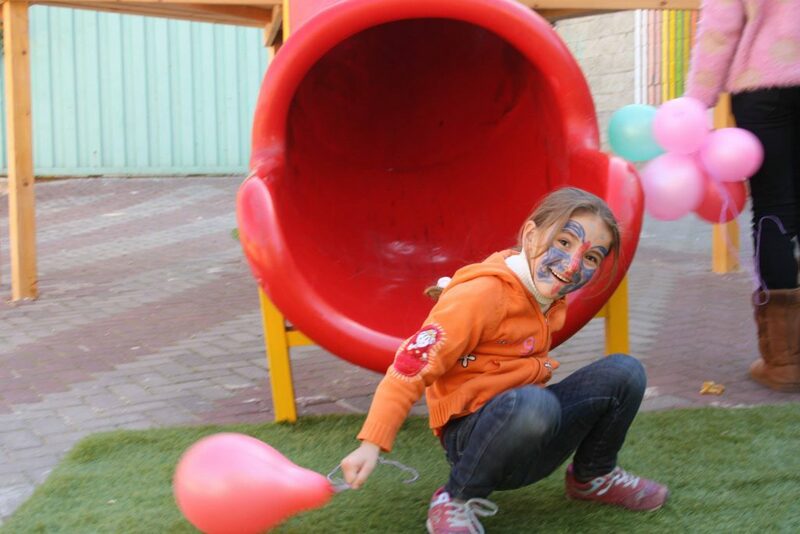 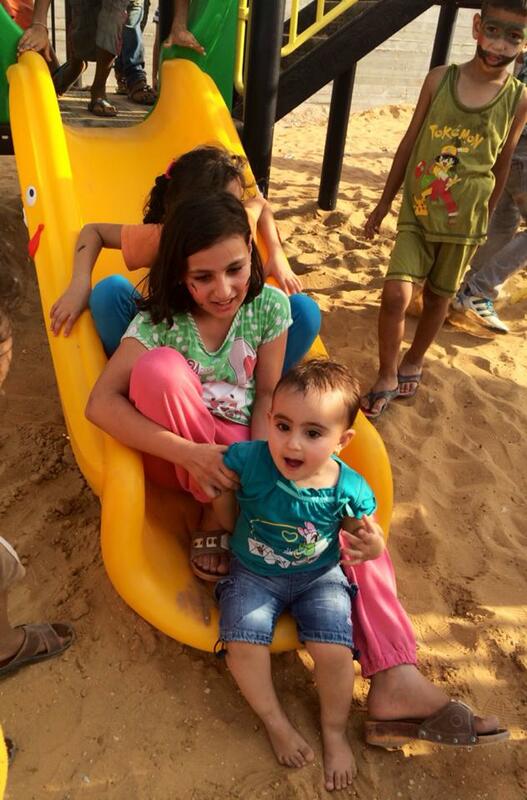 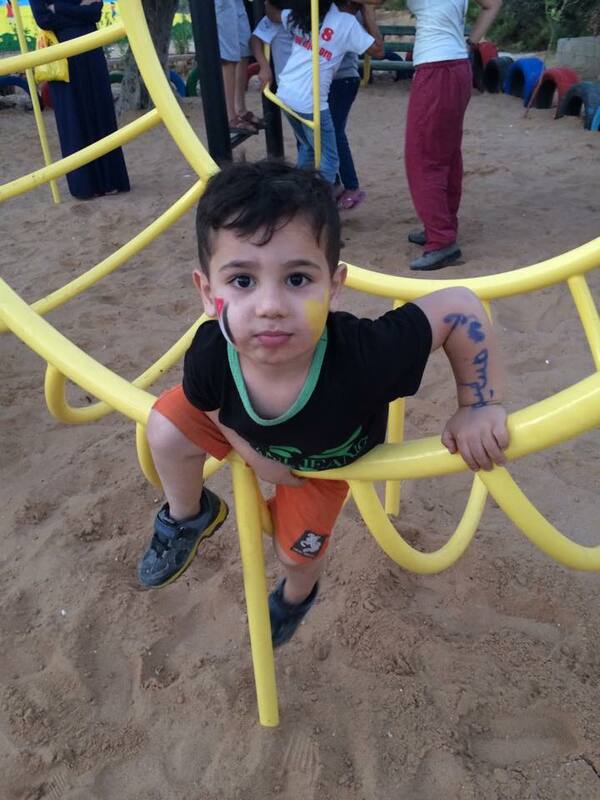 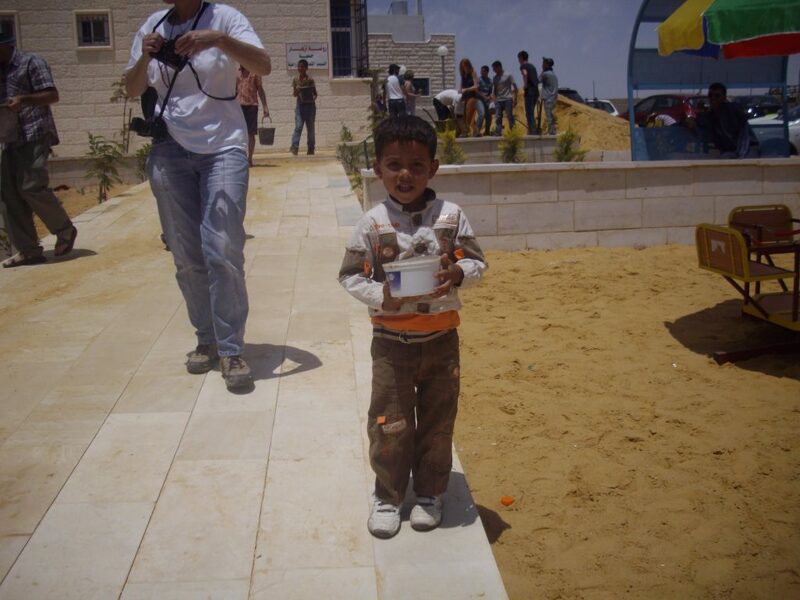 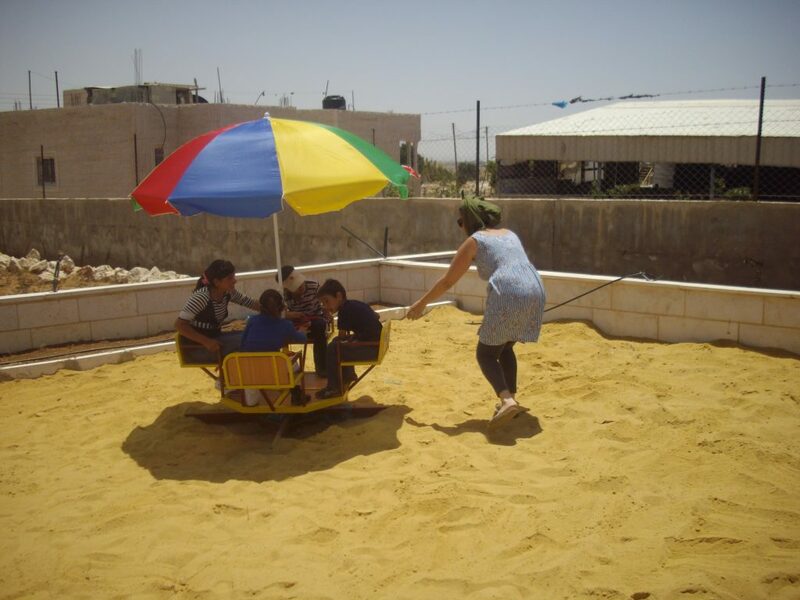 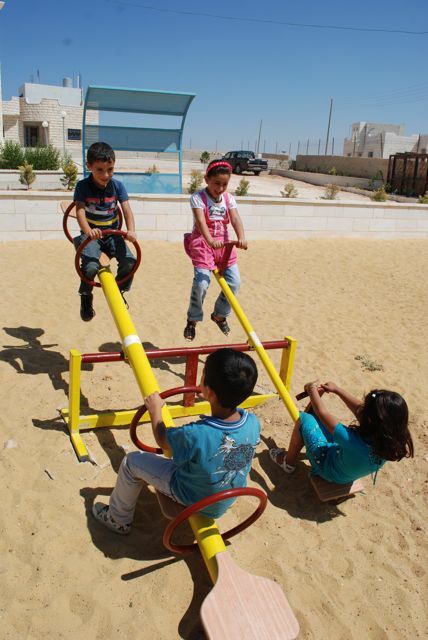 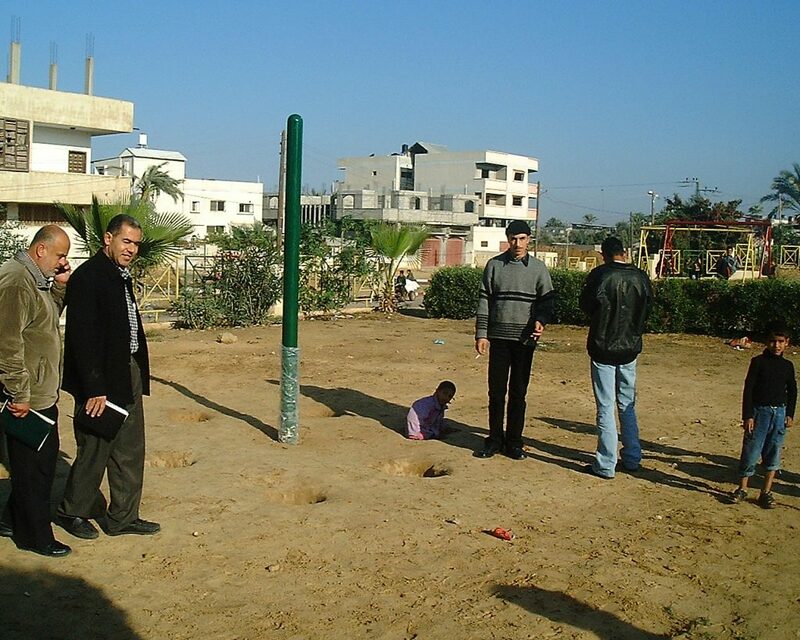 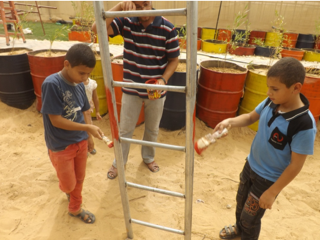 The playground PfP built here has been essential in bringing some form of normalcy for the children of Rafah. 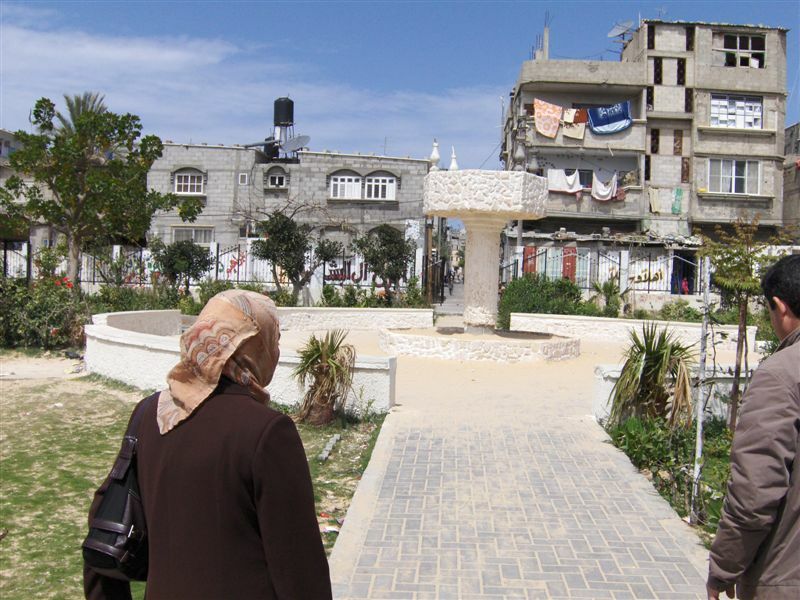 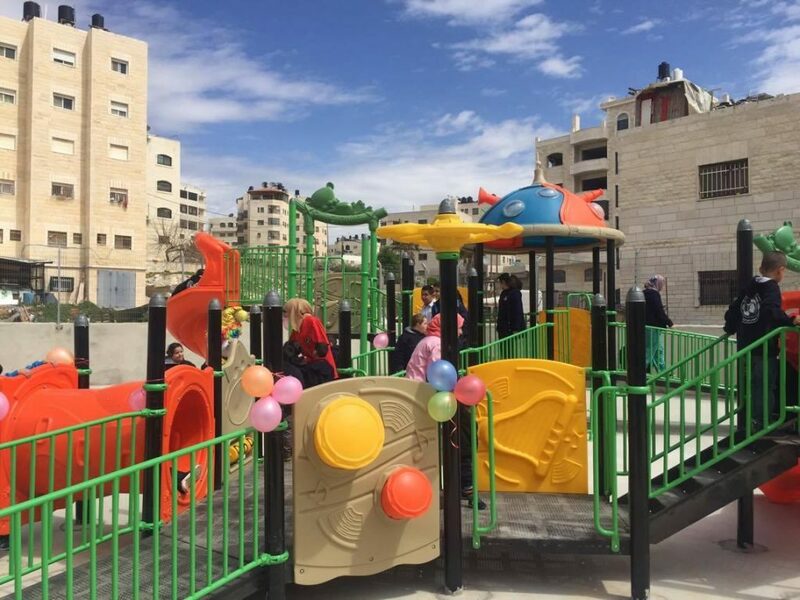 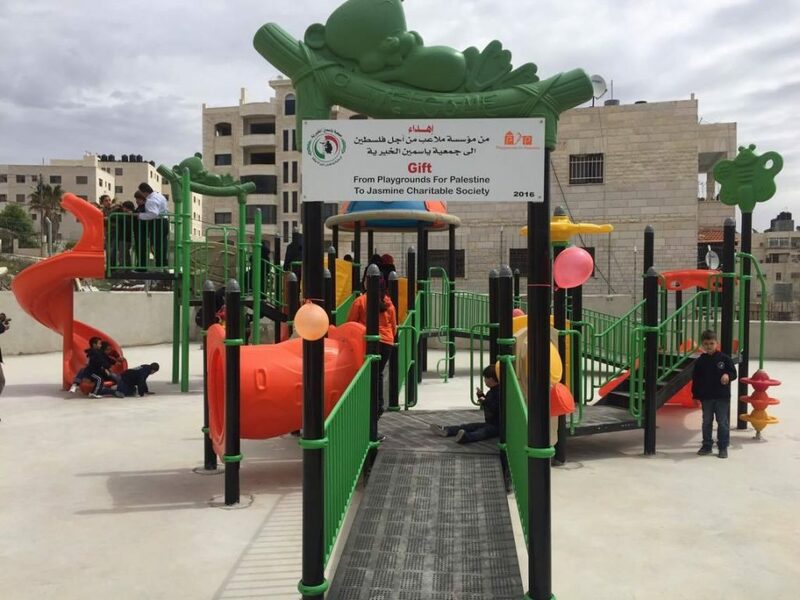 The story behind the building of this playground is a testament to the endurance of the Palestinian people and their abiding love and solidarity for one another. 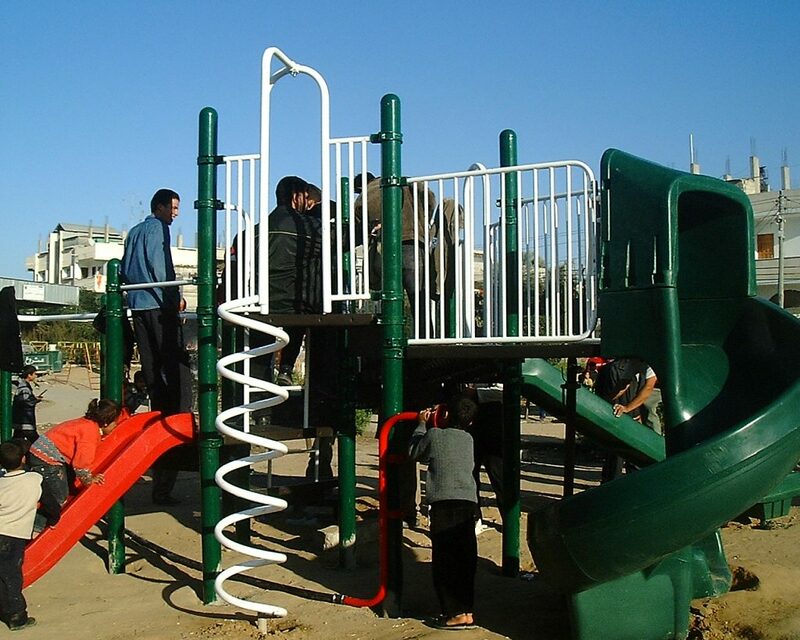 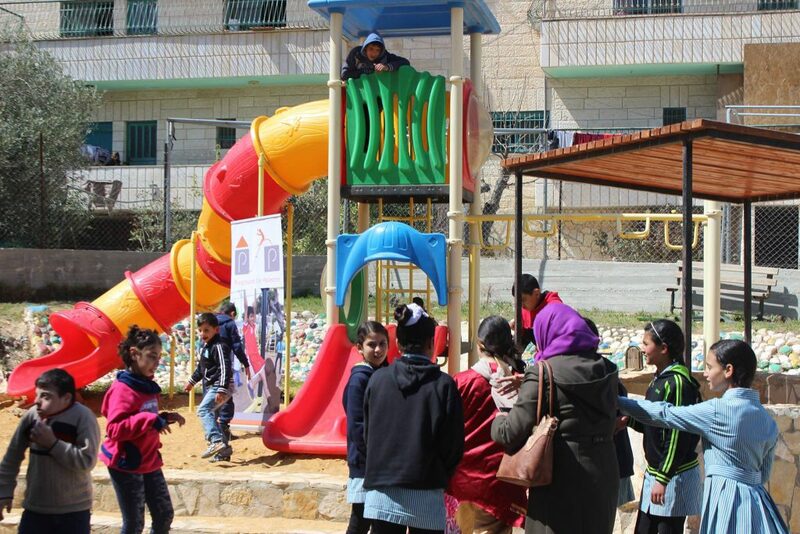 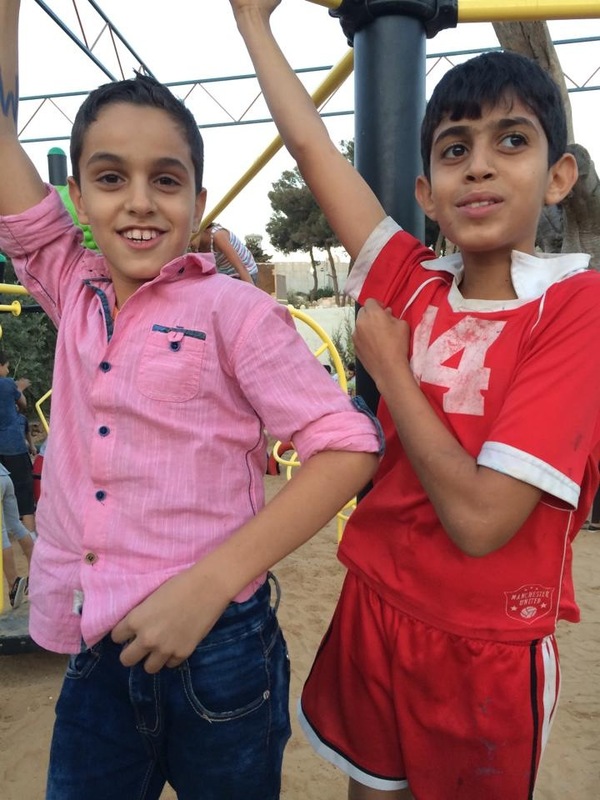 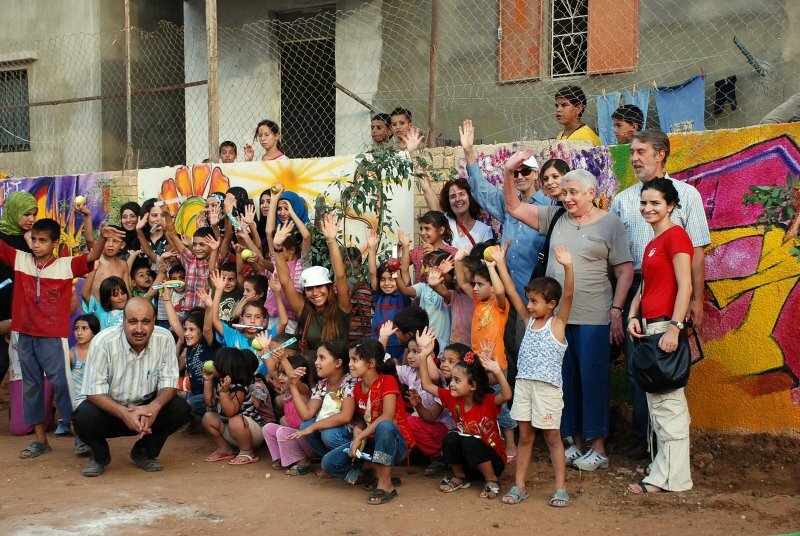 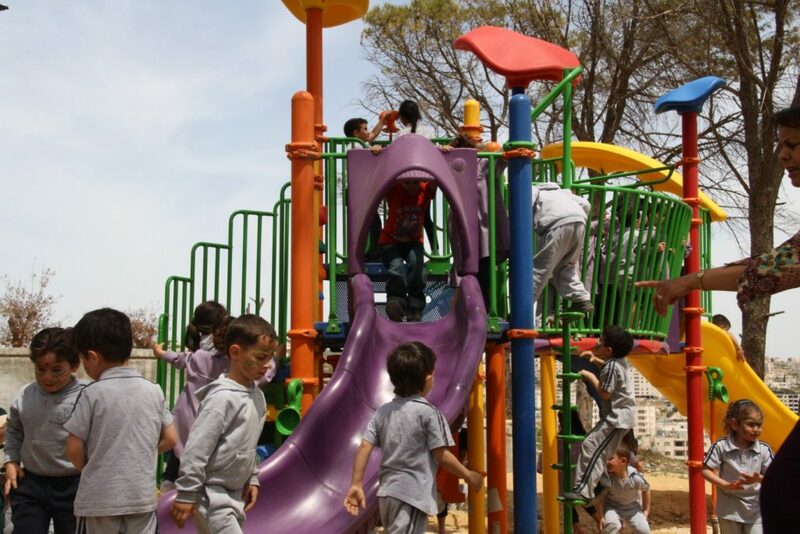 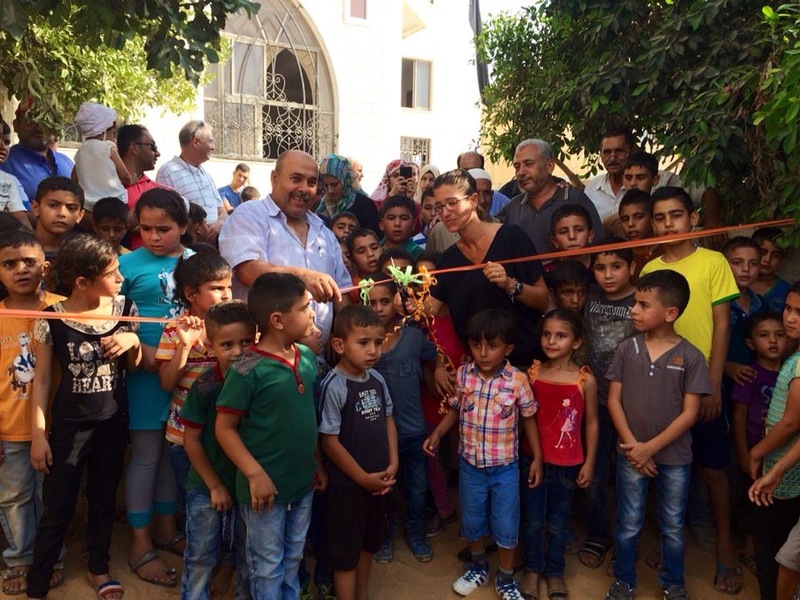 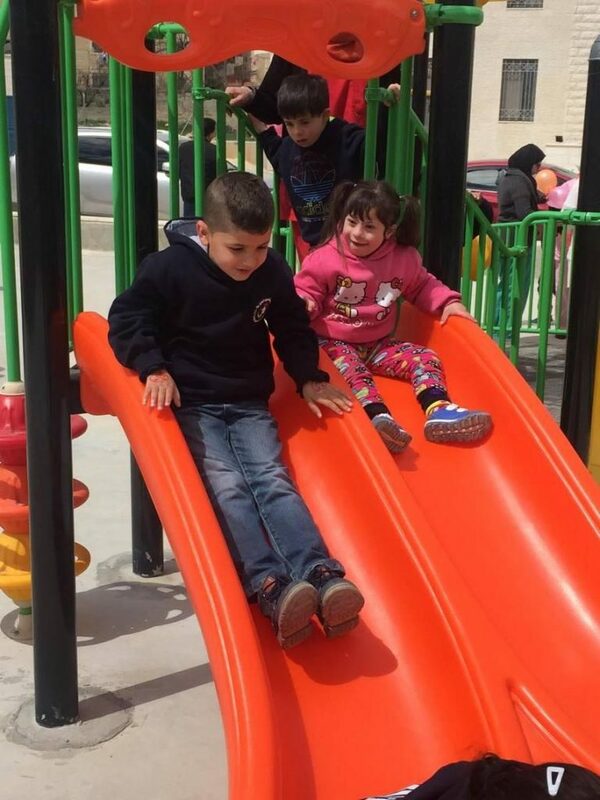 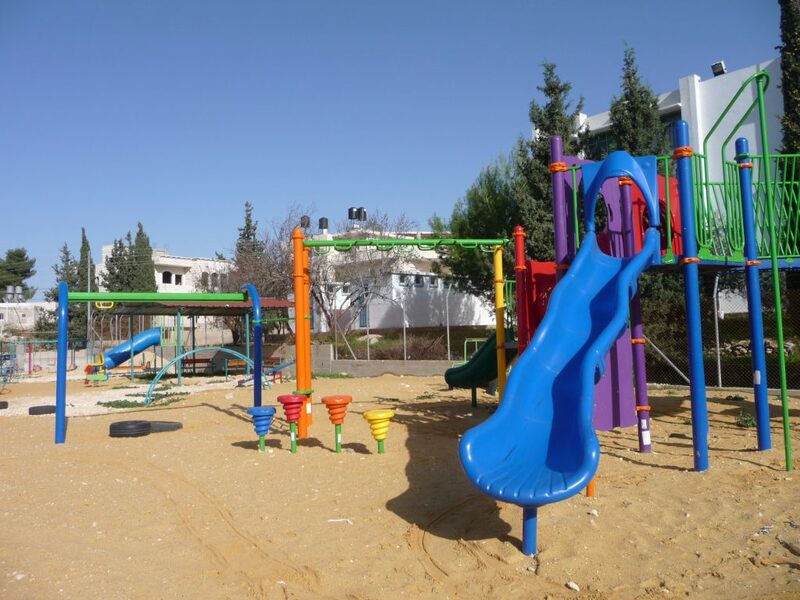 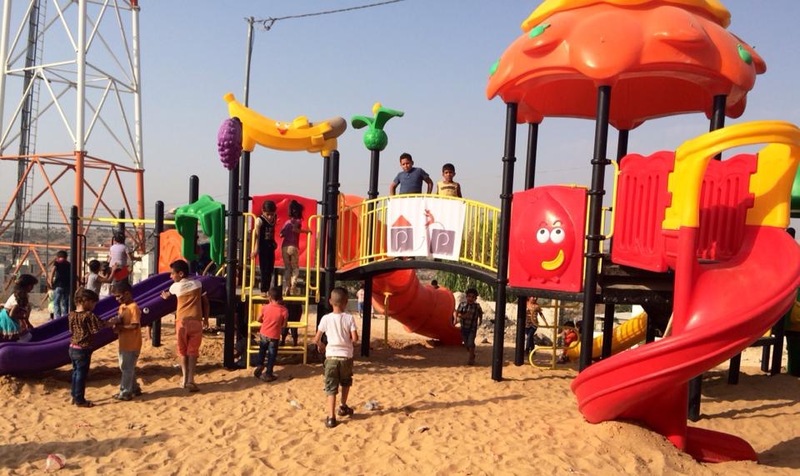 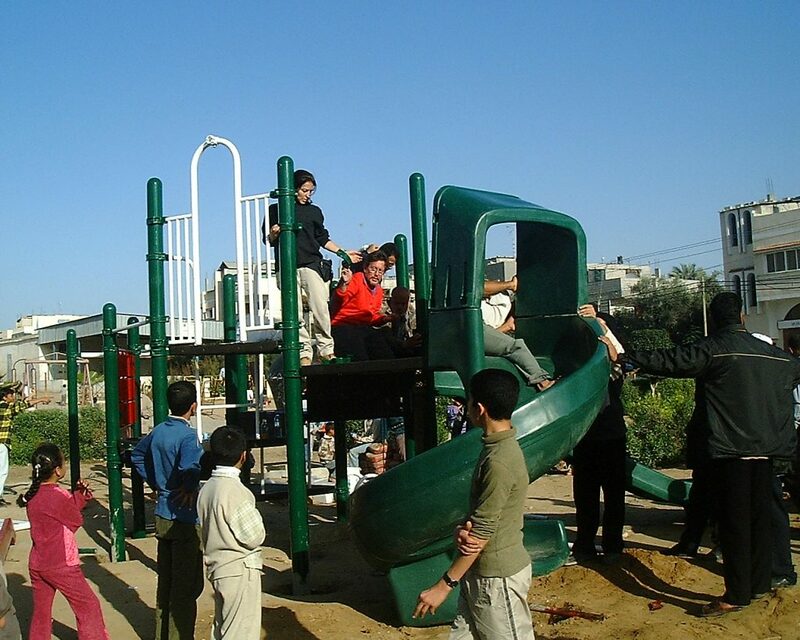 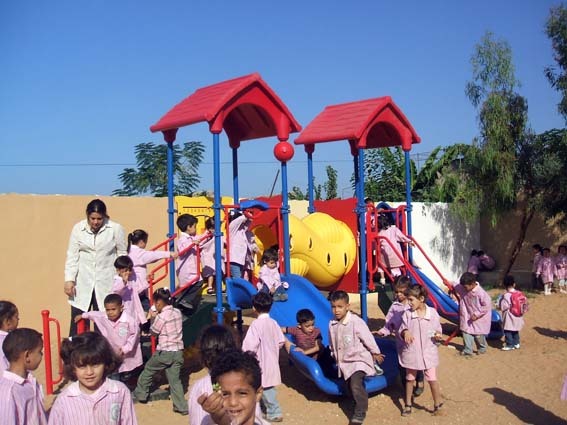 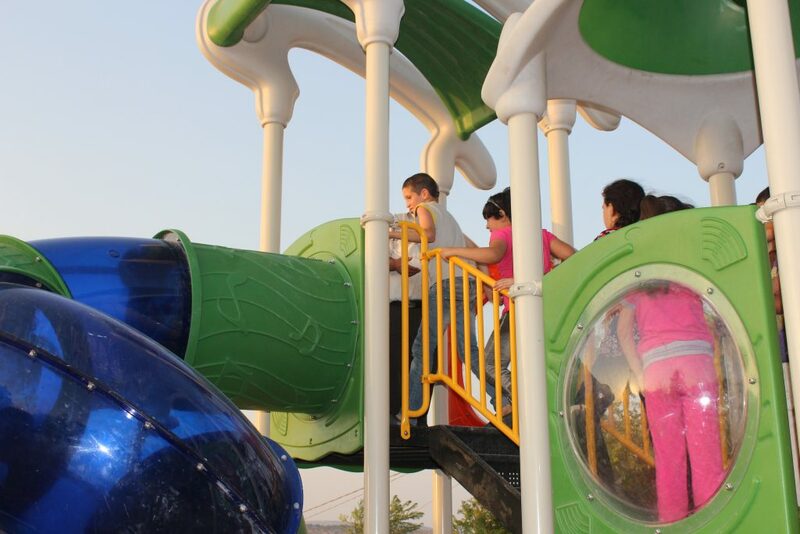 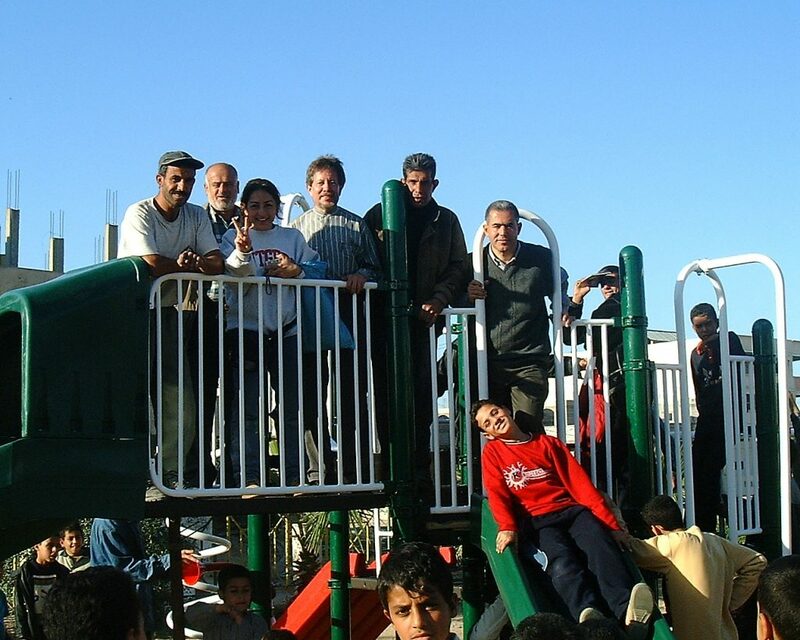 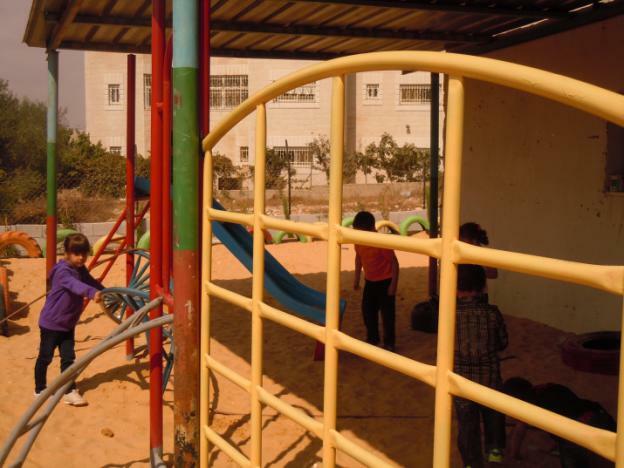 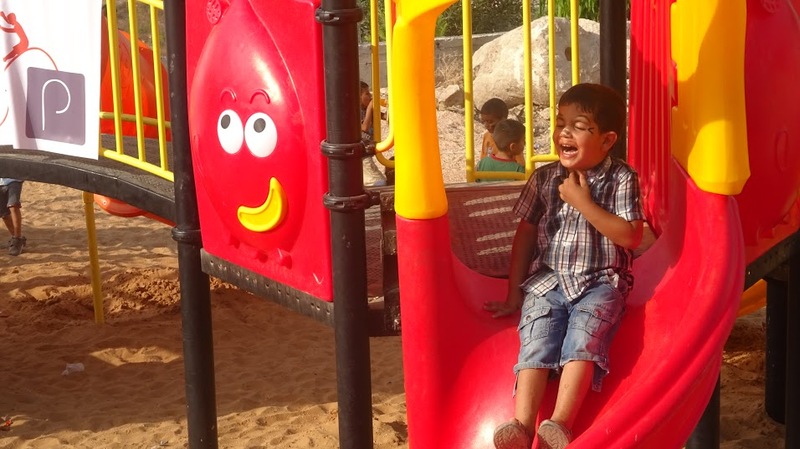 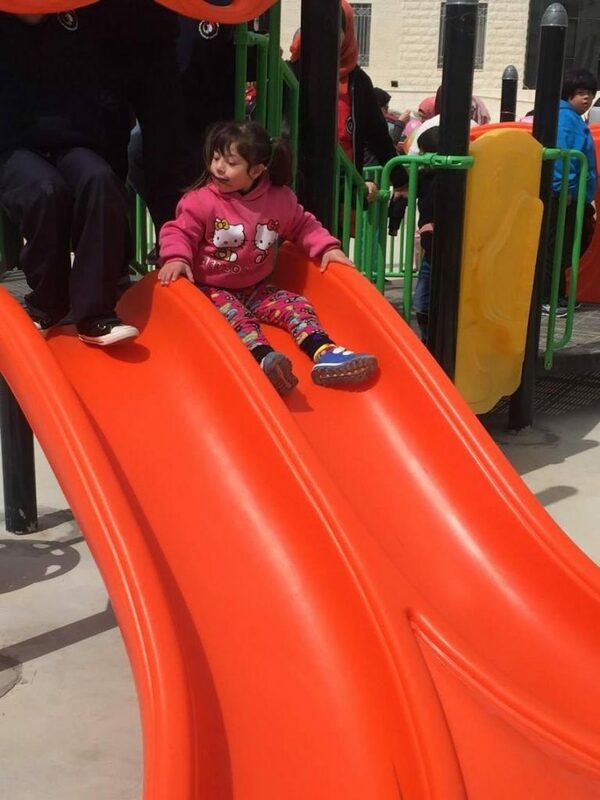 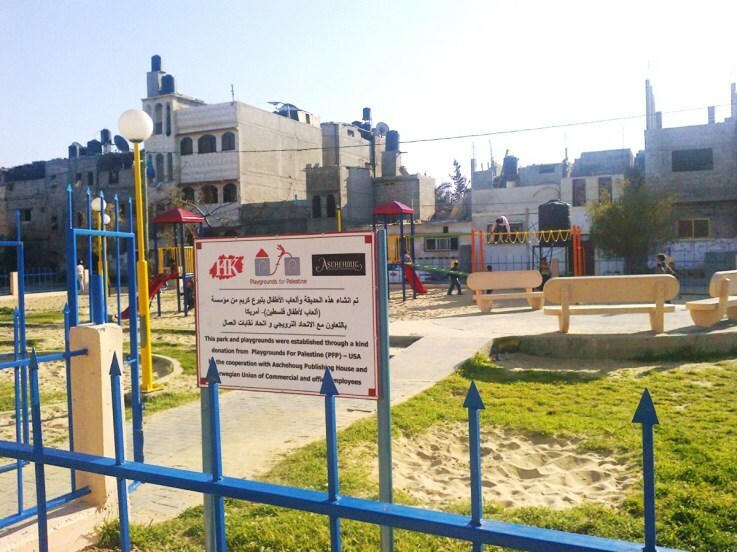 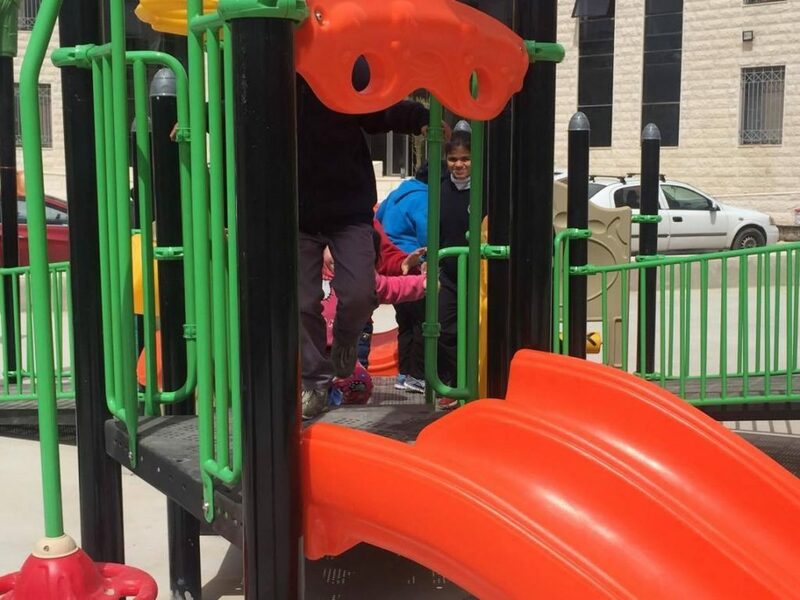 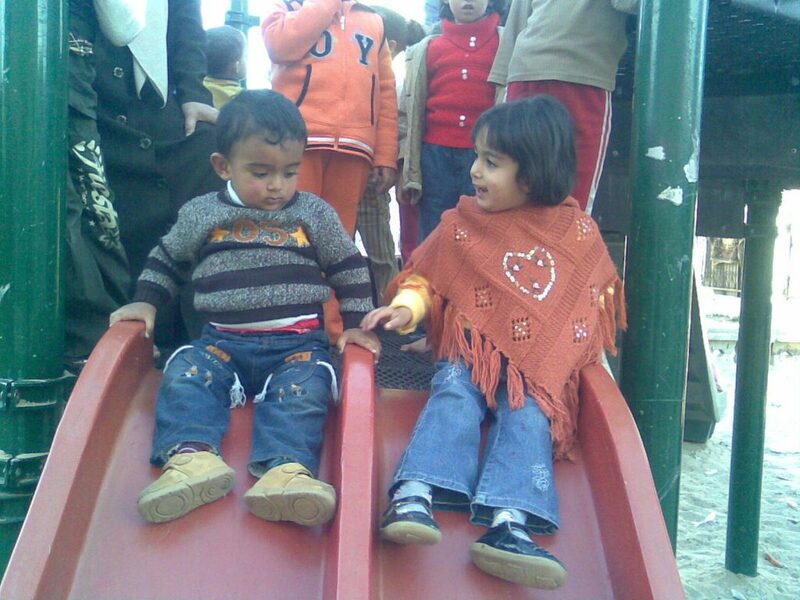 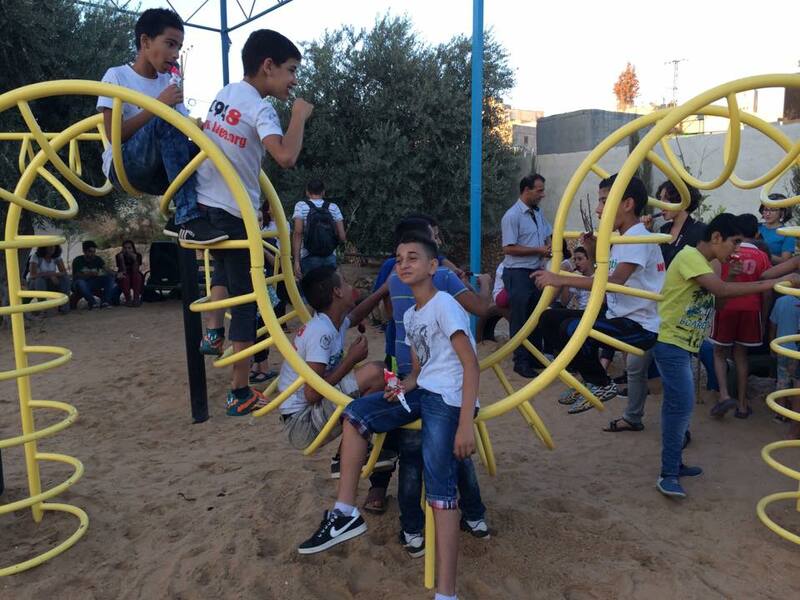 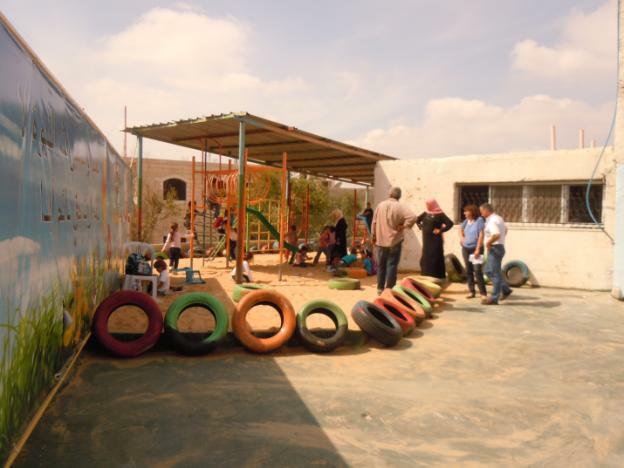 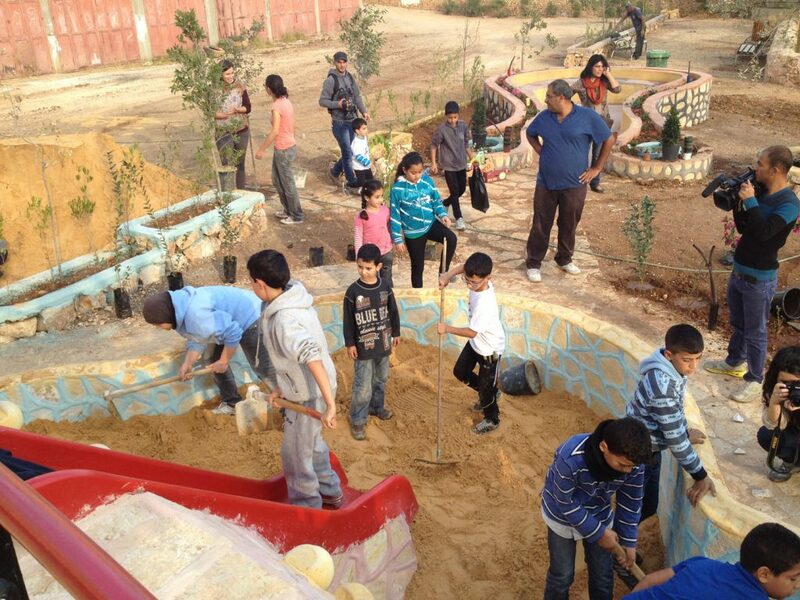 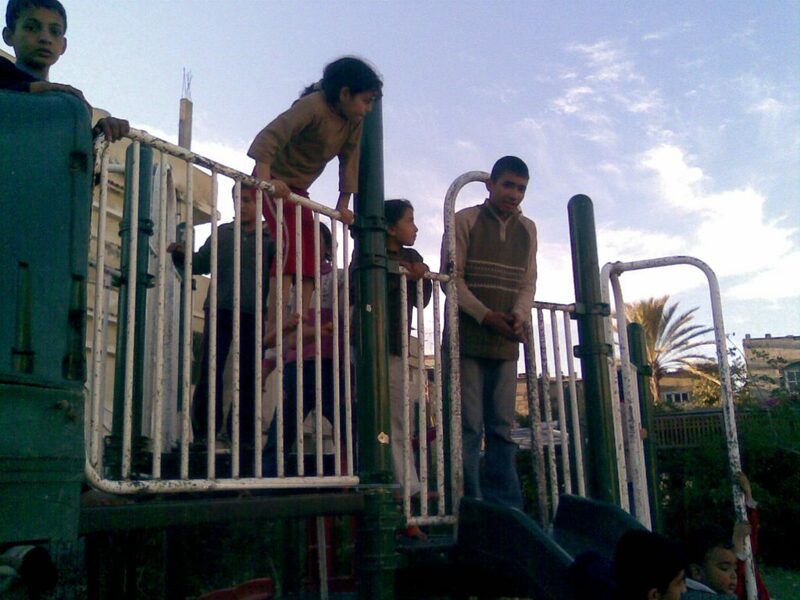 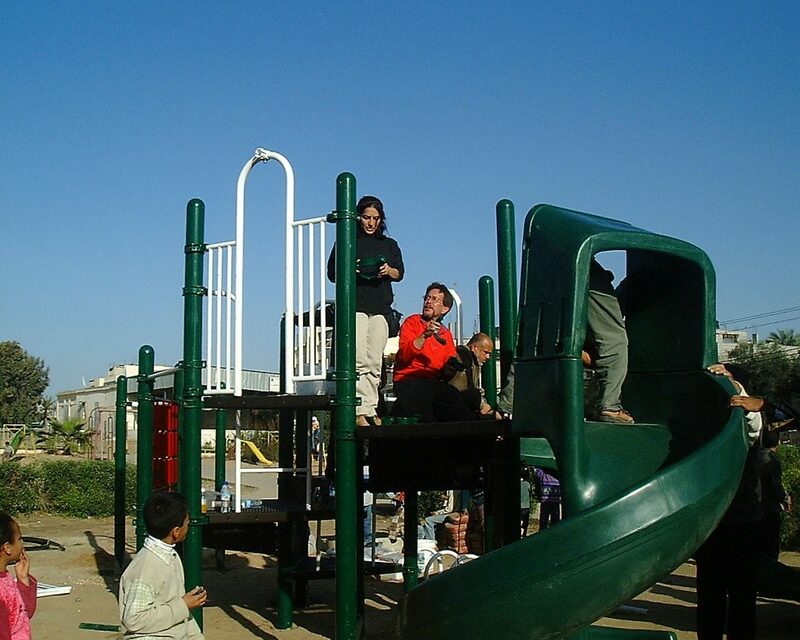 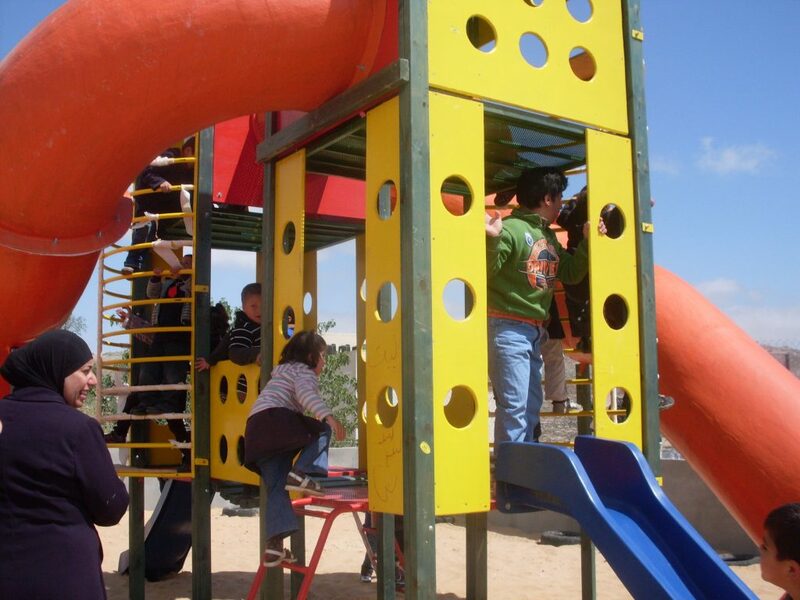 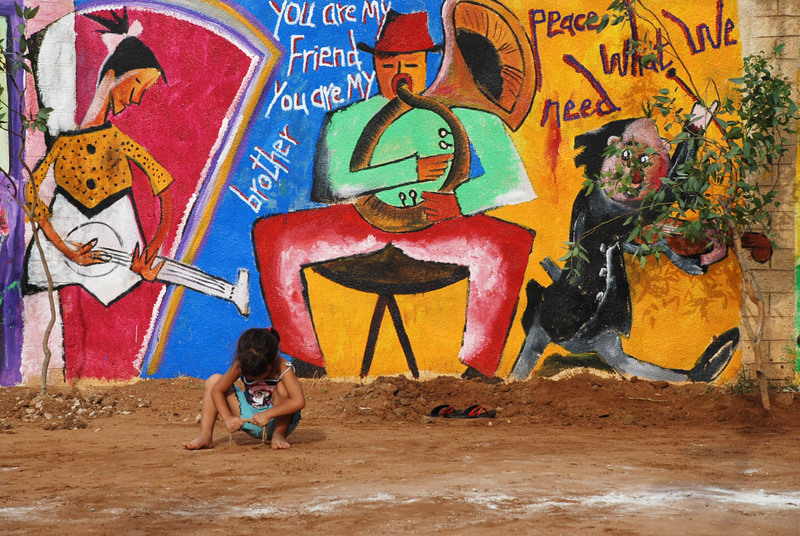 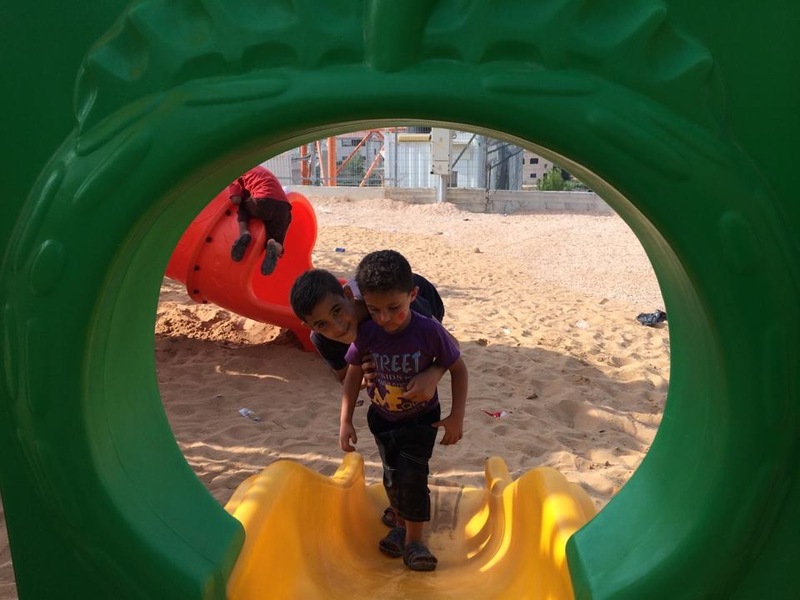 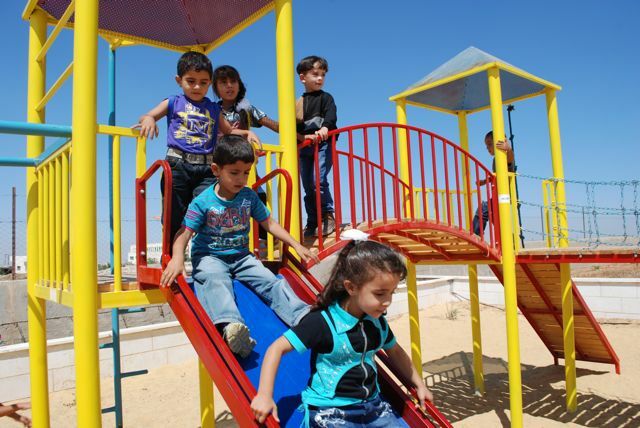 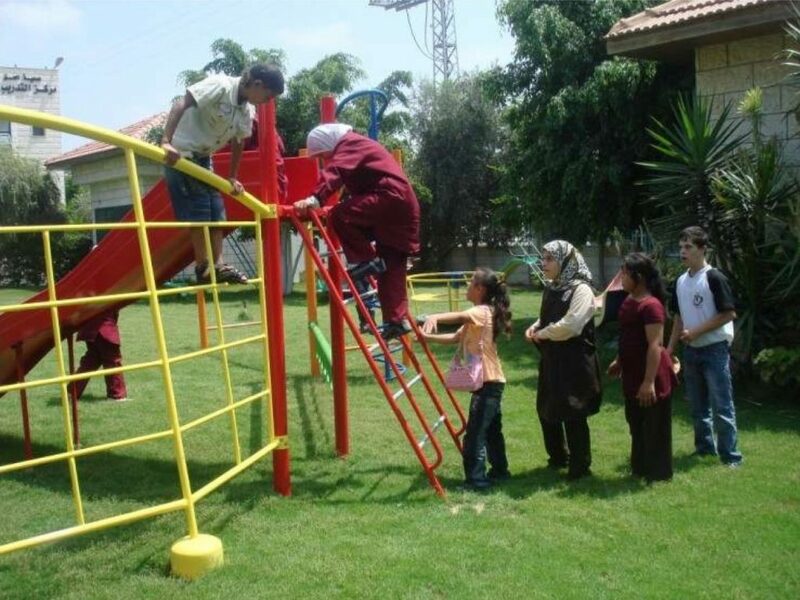 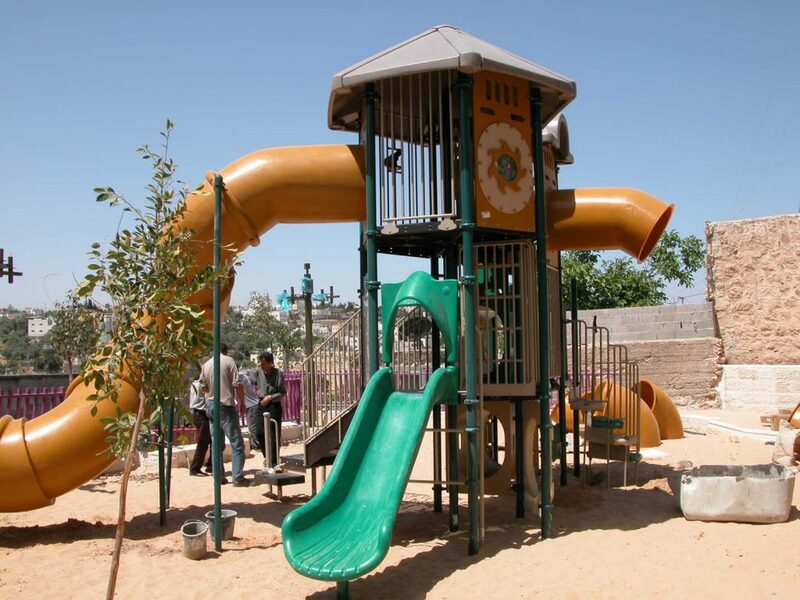 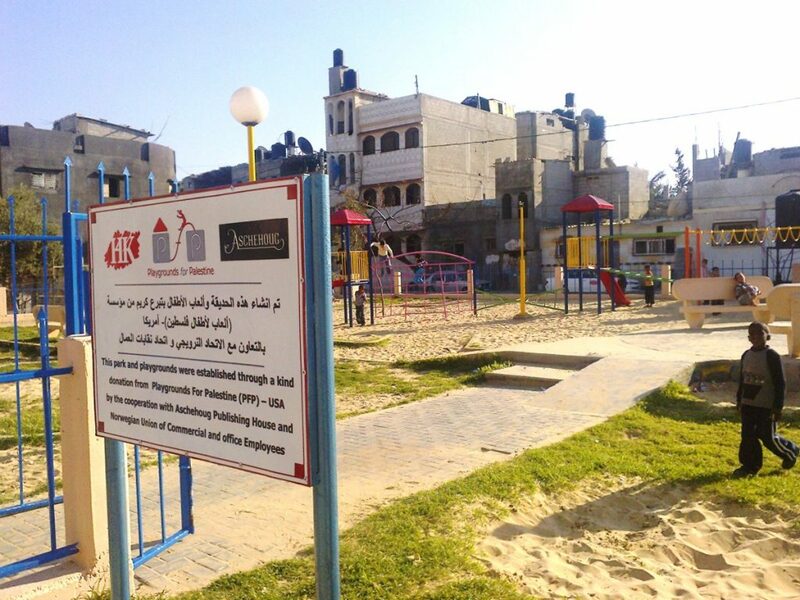 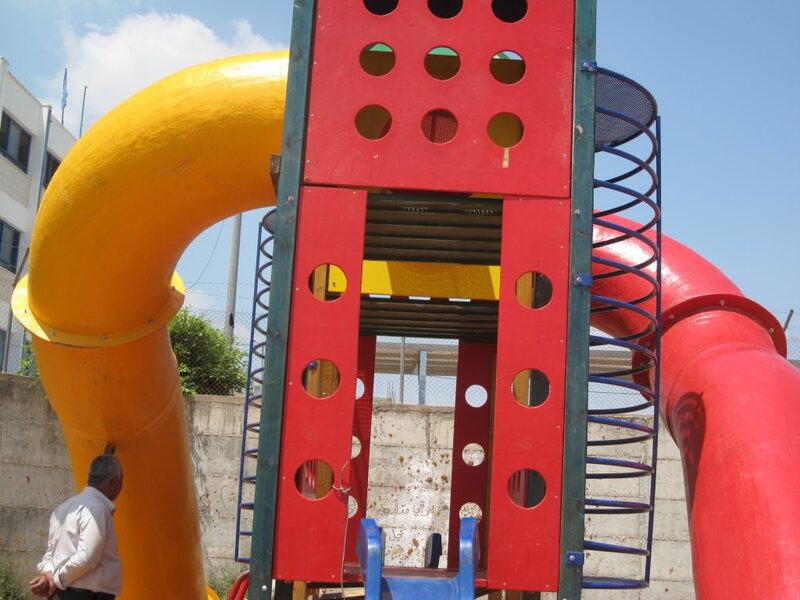 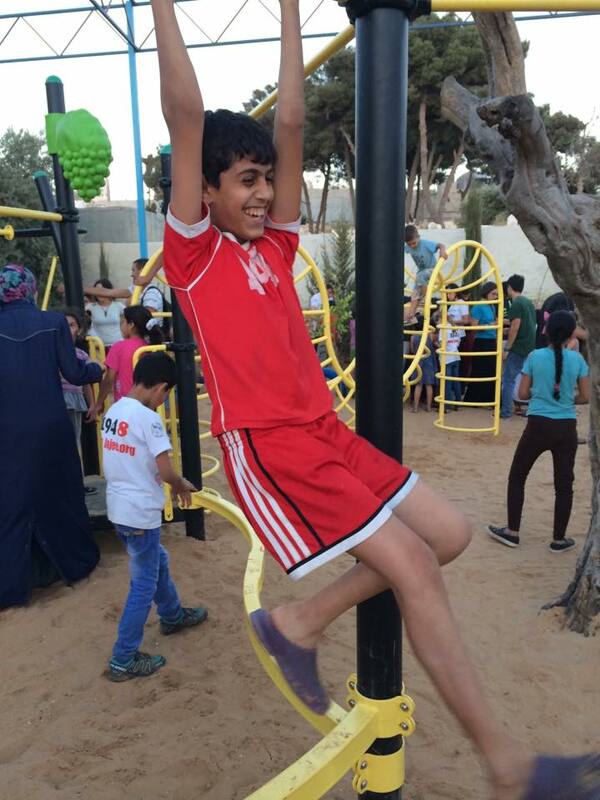 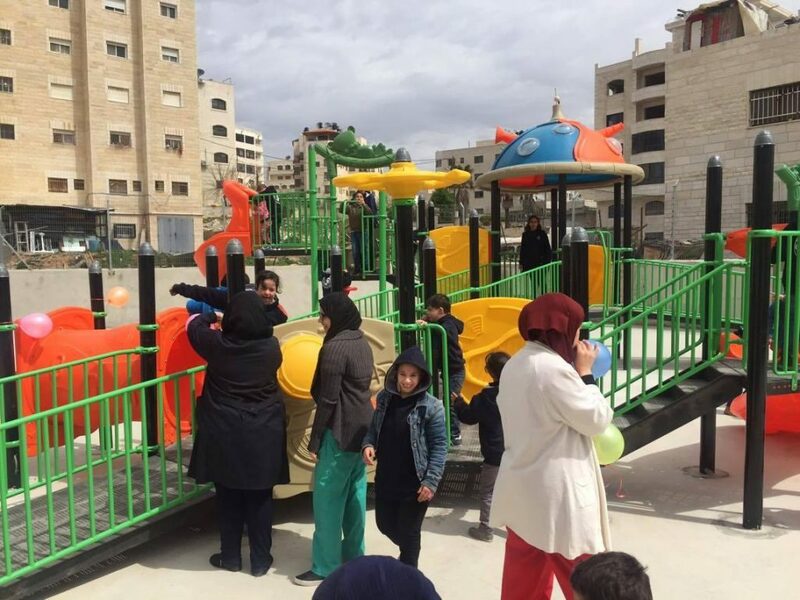 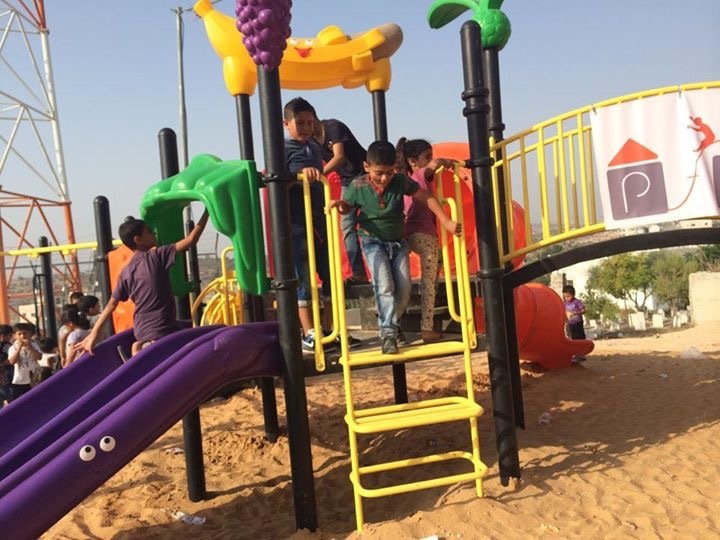 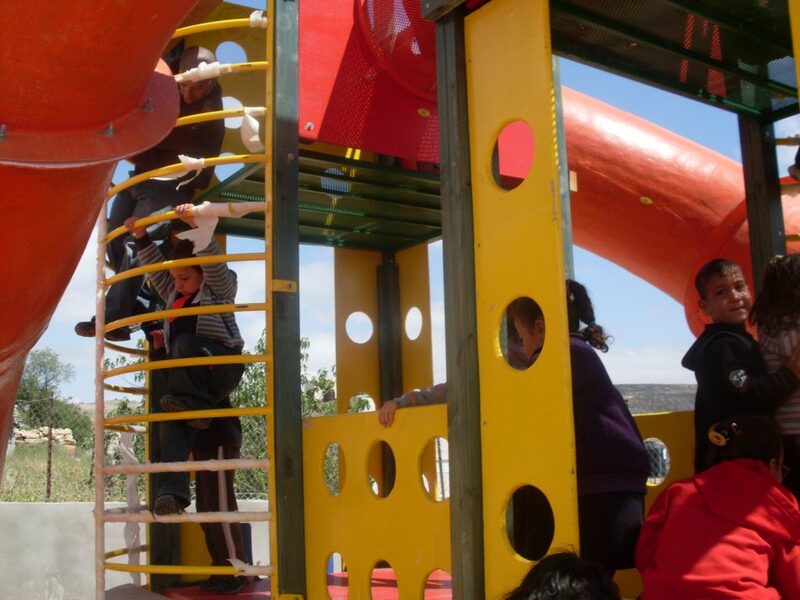 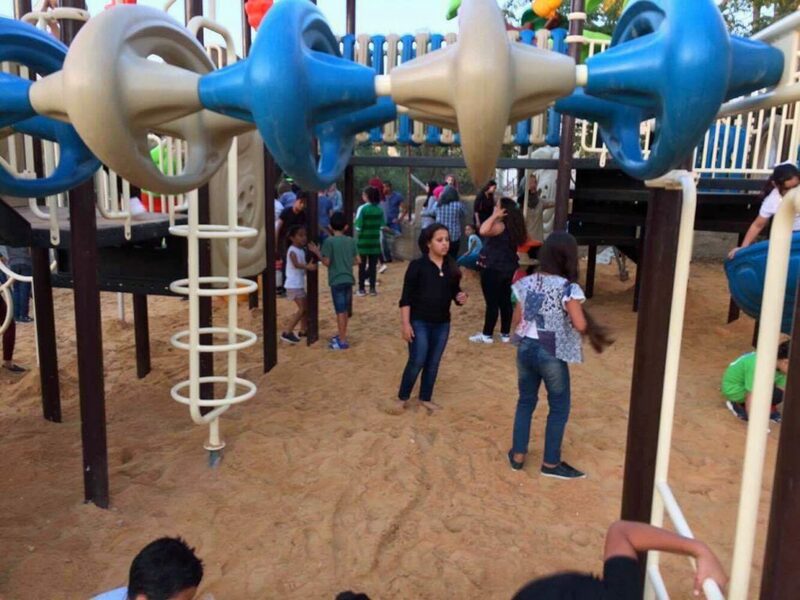 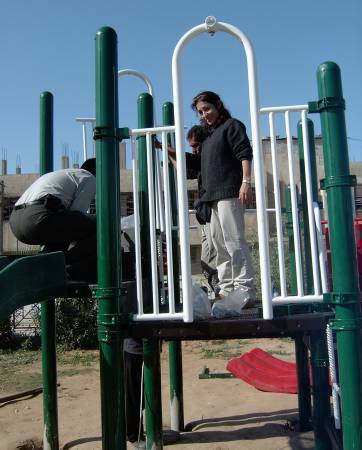 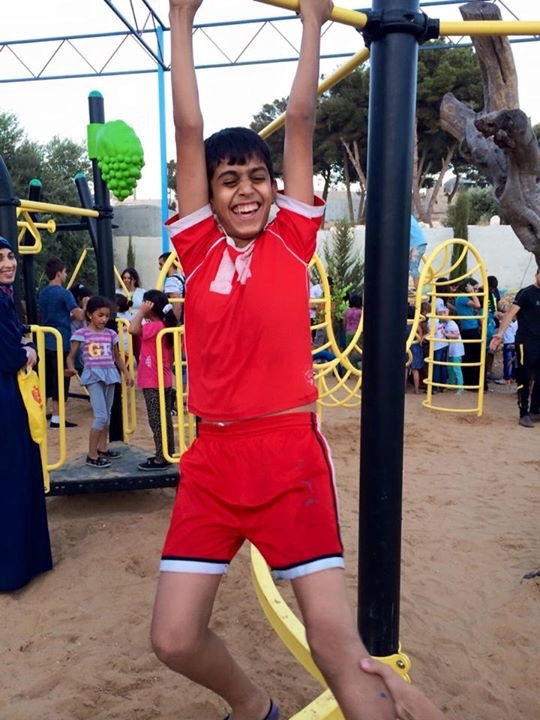 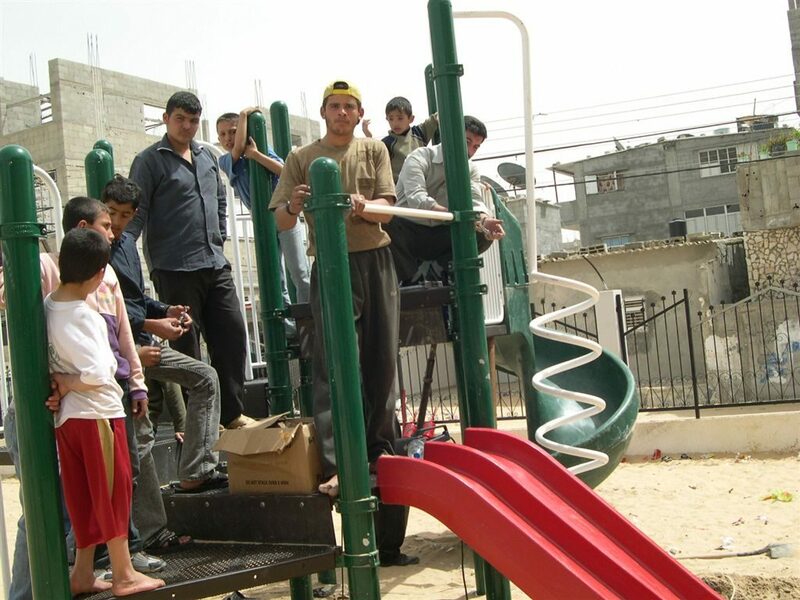 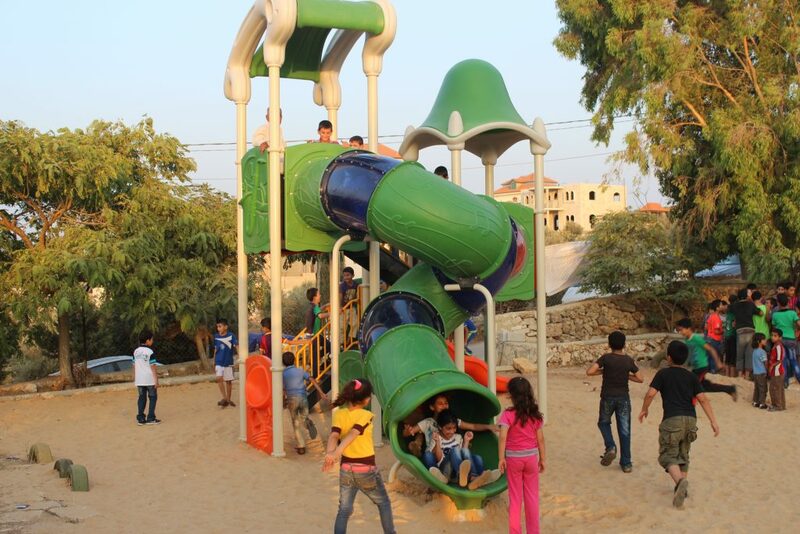 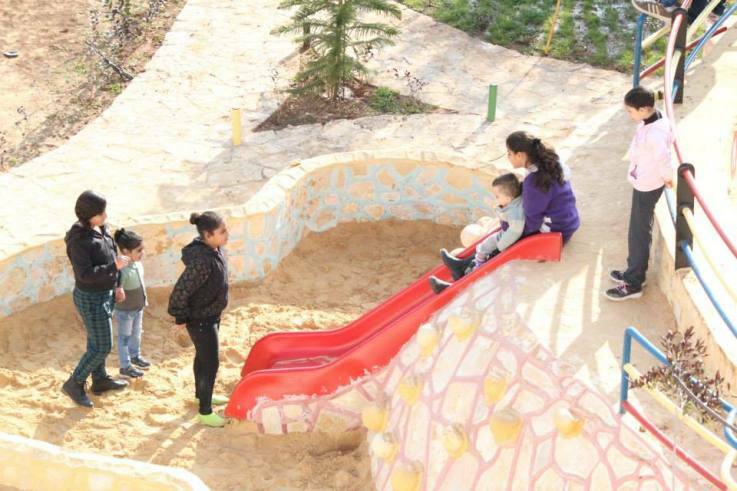 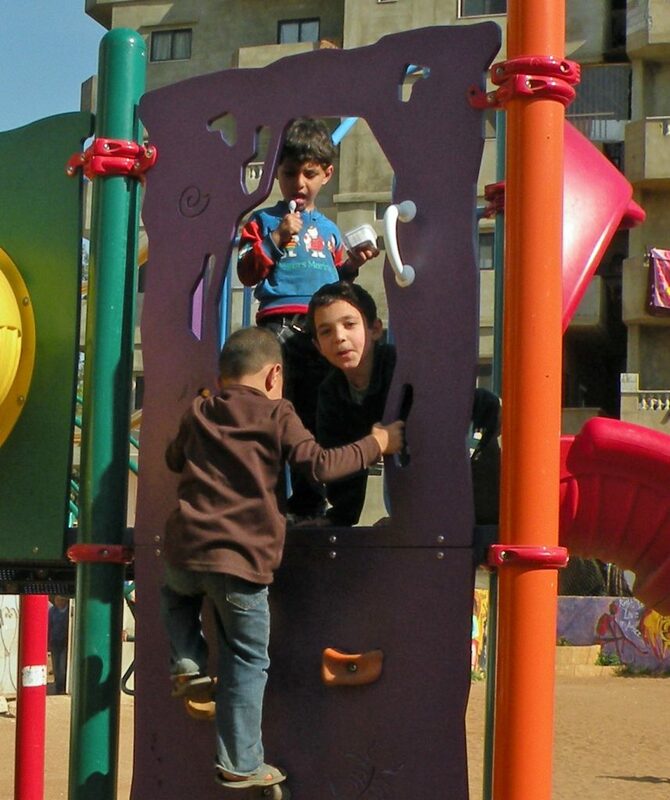 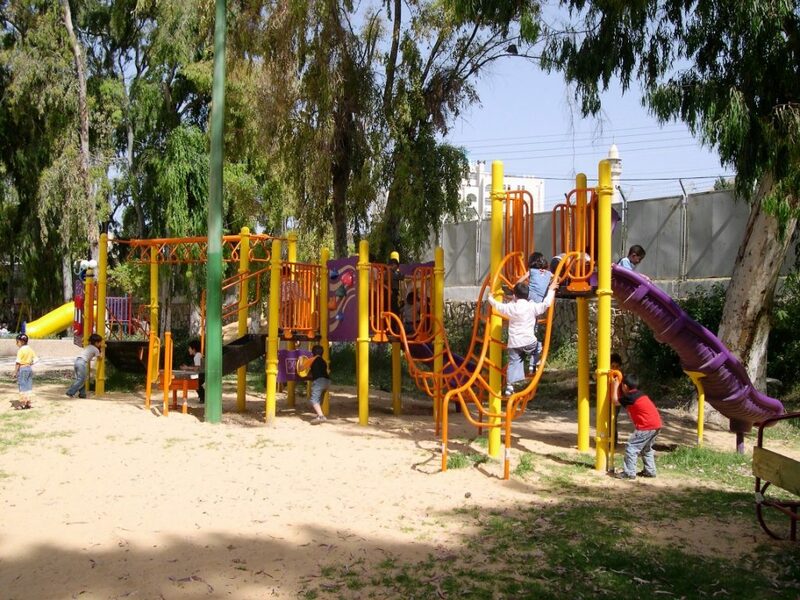 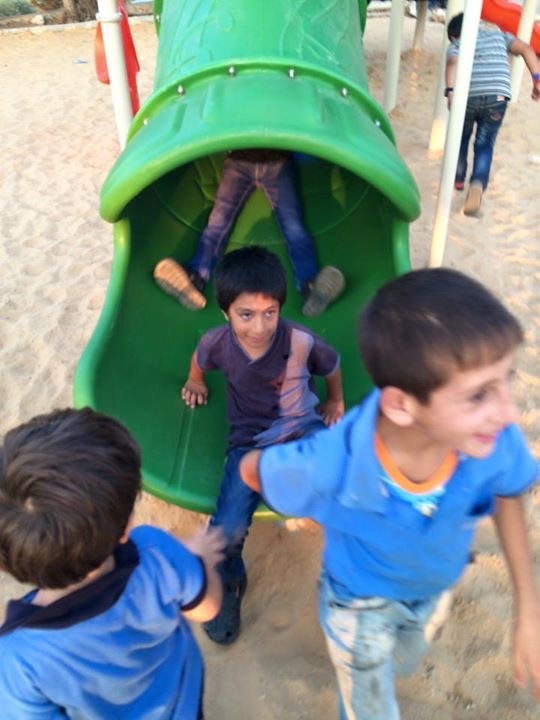 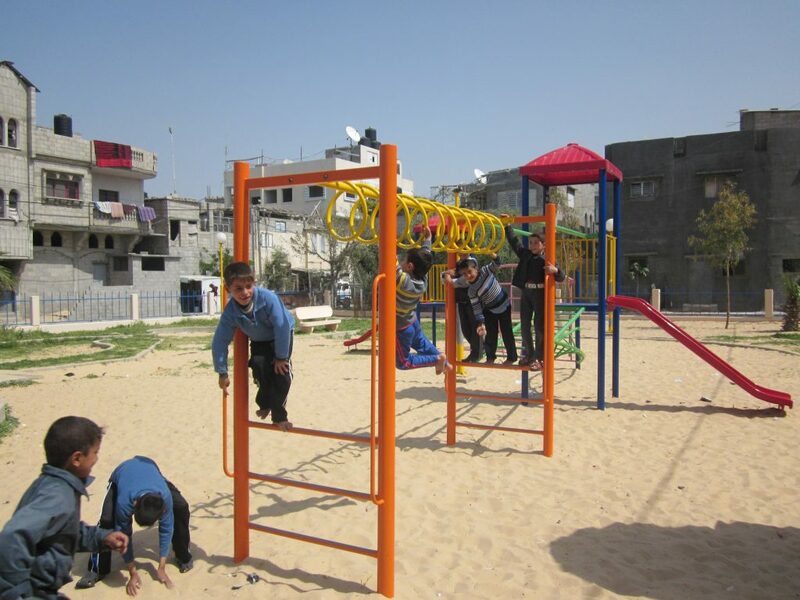 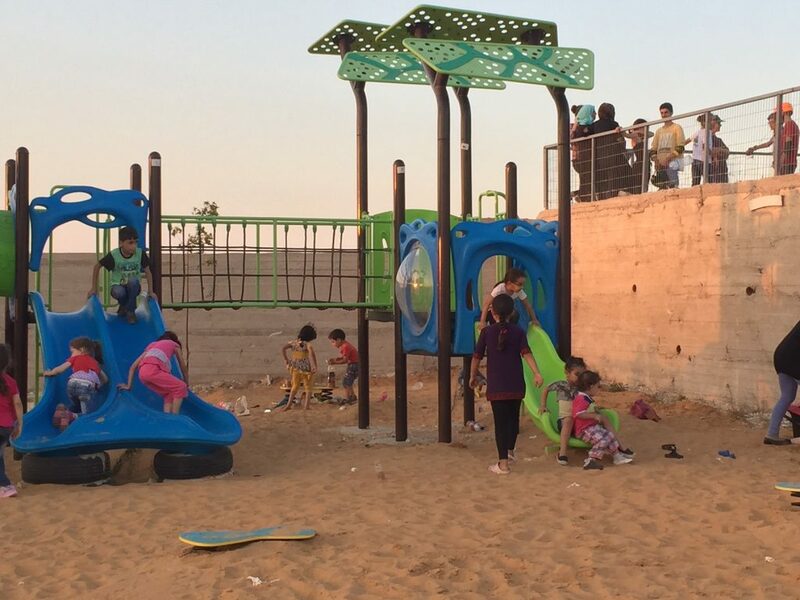 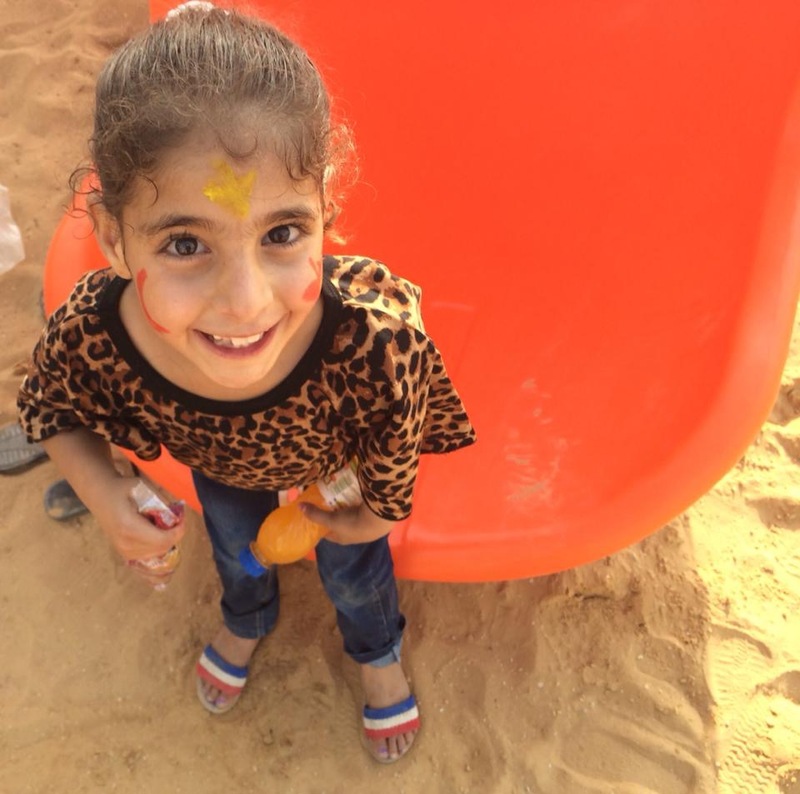 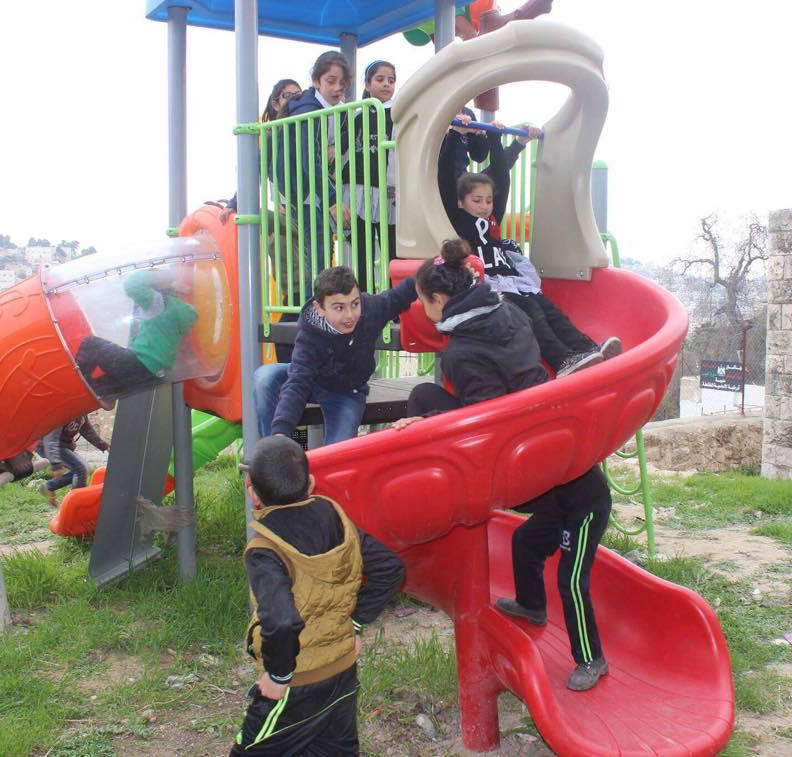 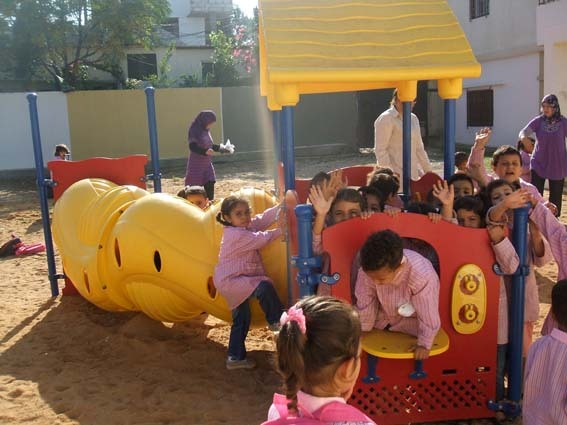 This playground was made possible through a joint effort between PfP and Madison-Rafah Sister City Program (MSRCP), which was founded in 2003 to foster people-to-people relationships between the citizens of Madison, Wisconsin and Rafah. 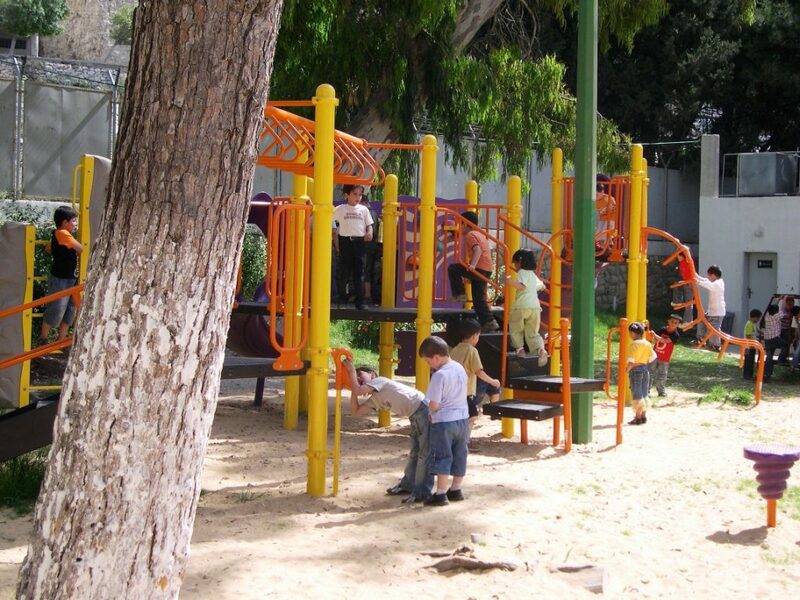 This playground is one of PfP’s most used playgrounds. 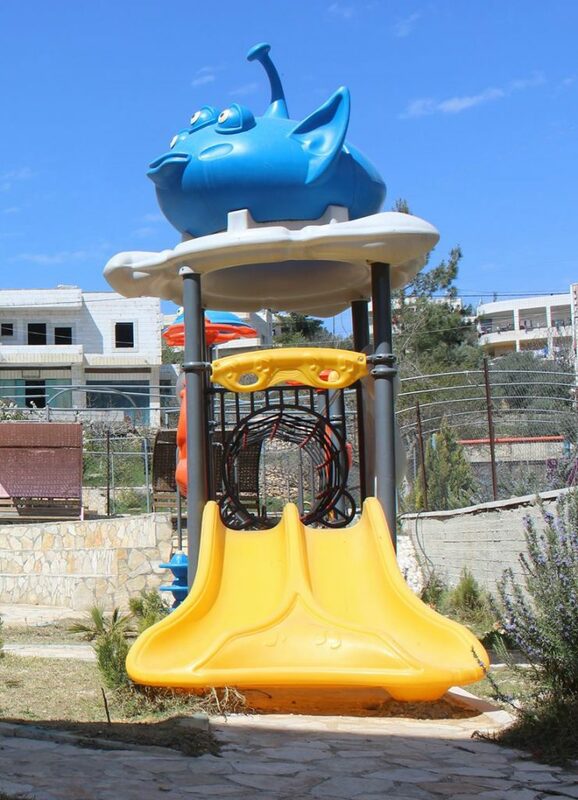 Located across from the Khan Younis Municipality building in a central location, this playground is used daily by thousands of children. 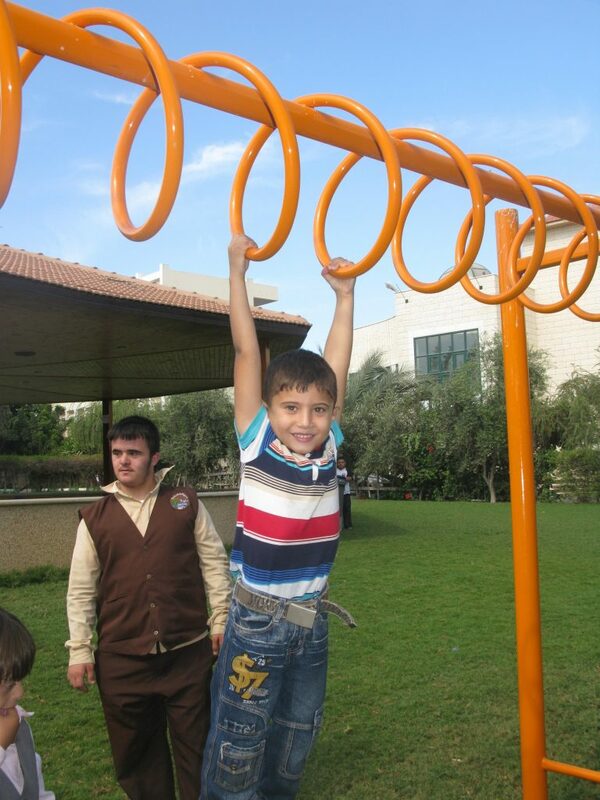 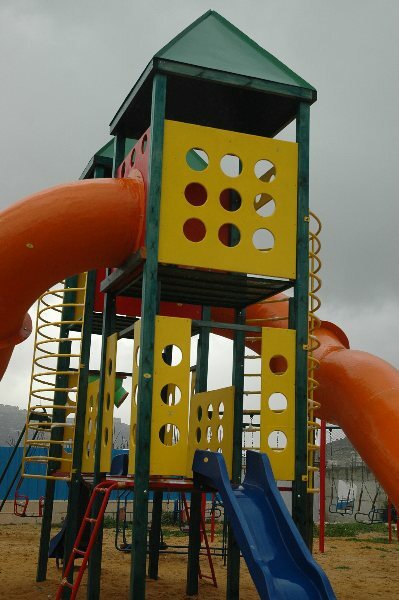 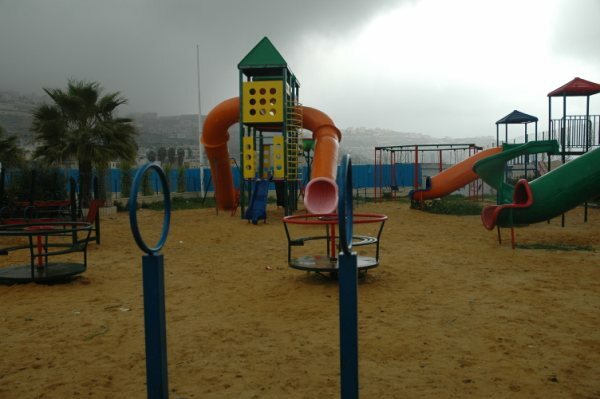 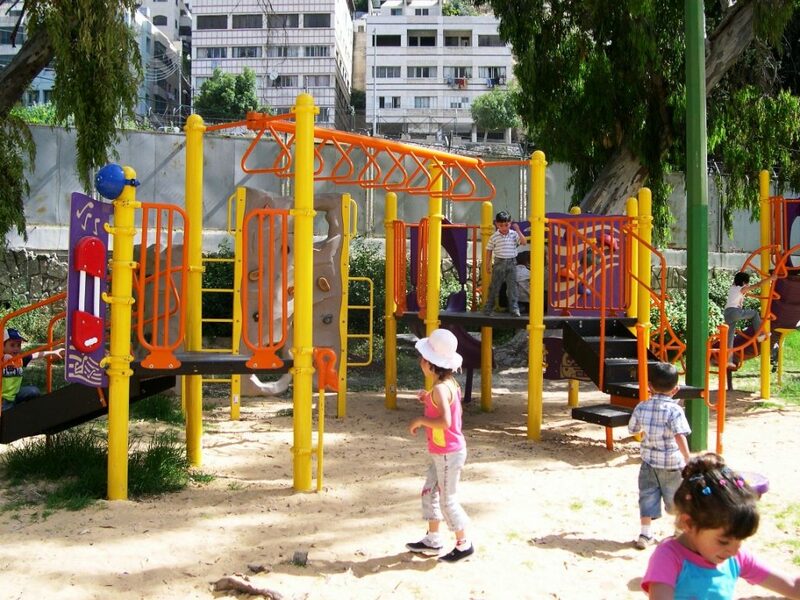 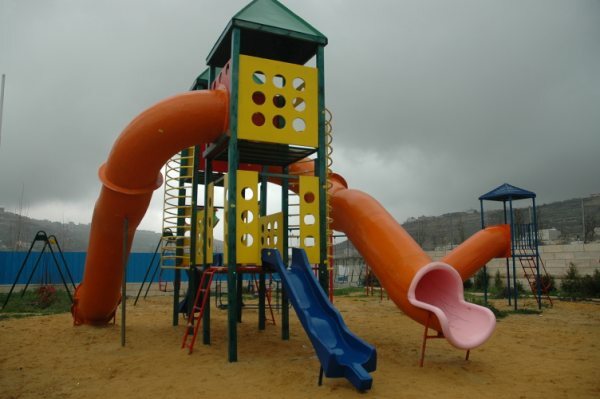 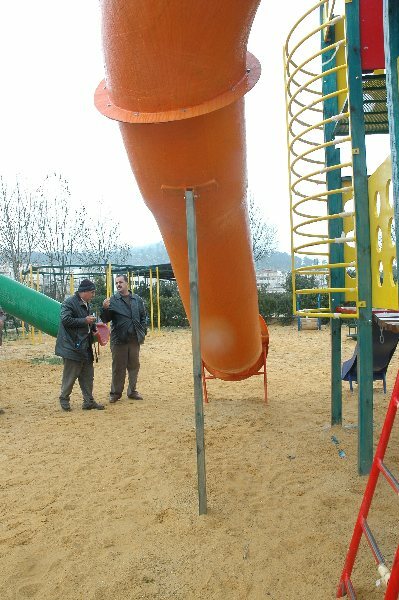 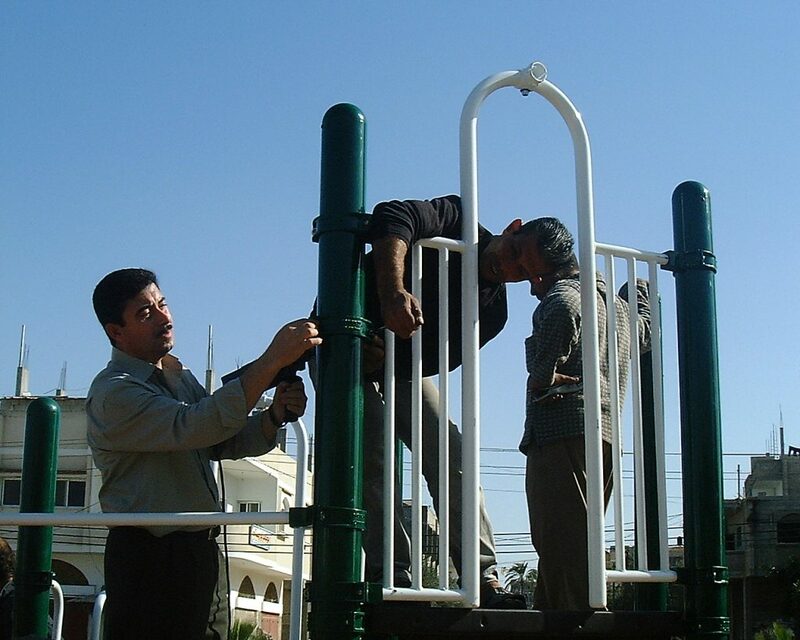 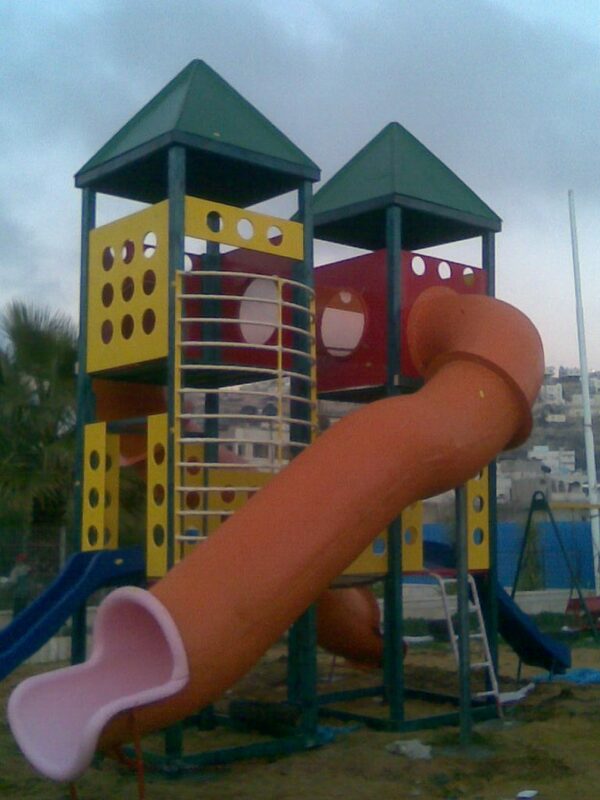 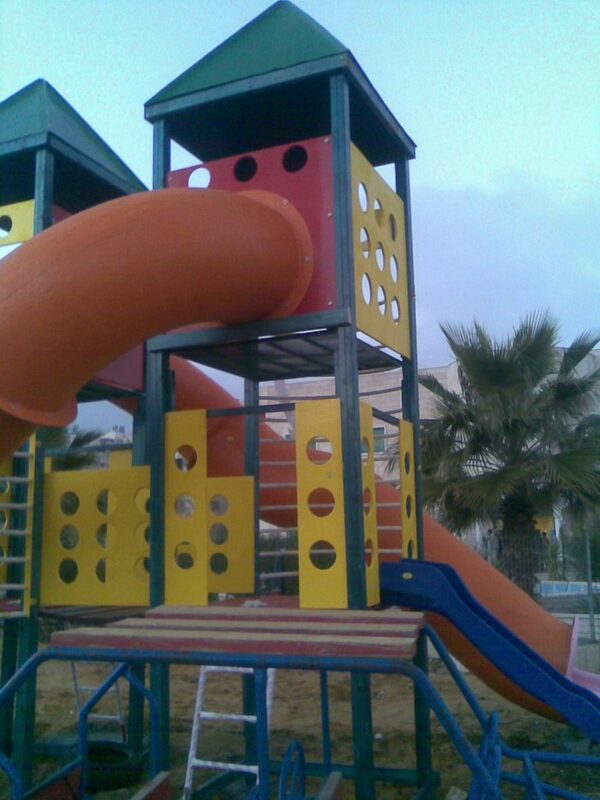 The Khan Younis Municipality assumed responsibility for this playground, including regular maintenance and supervision. 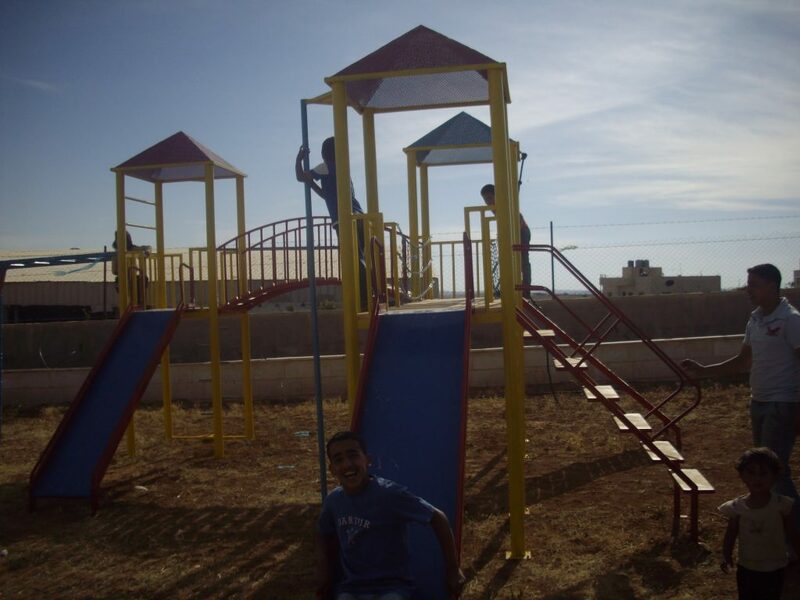 The building of this playground was particularly enjoyable since PfP had close to 300 kids helping them everyday. 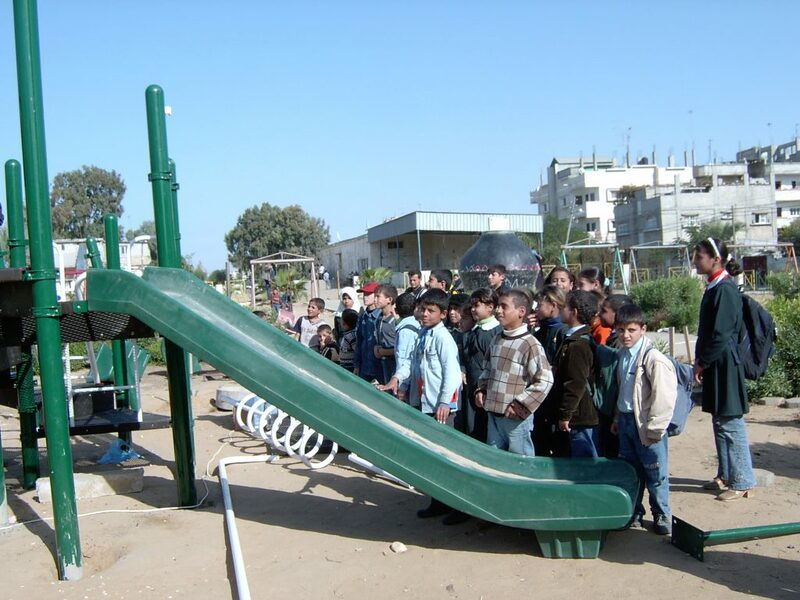 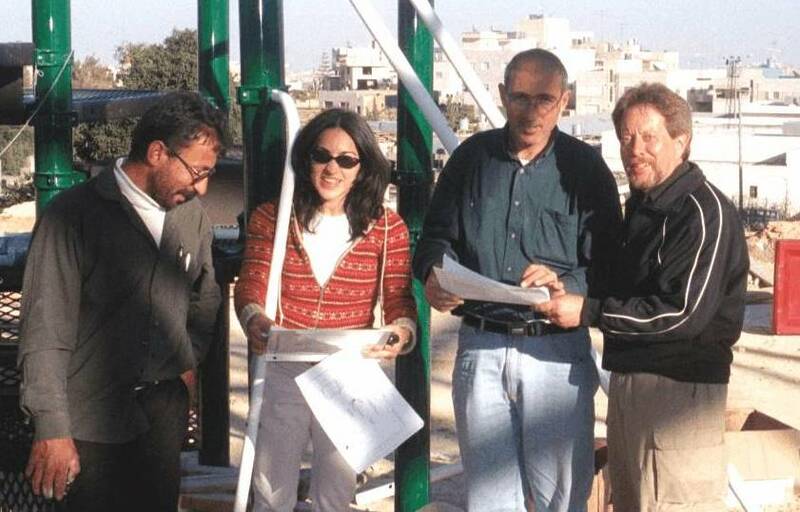 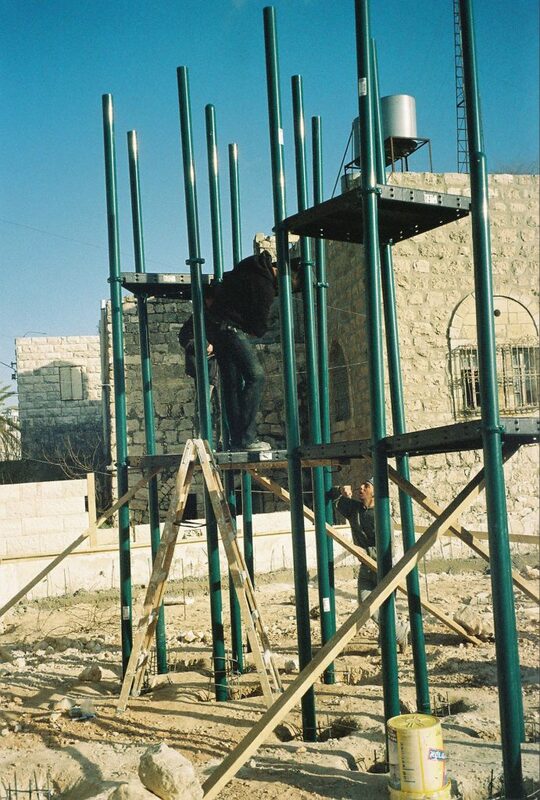 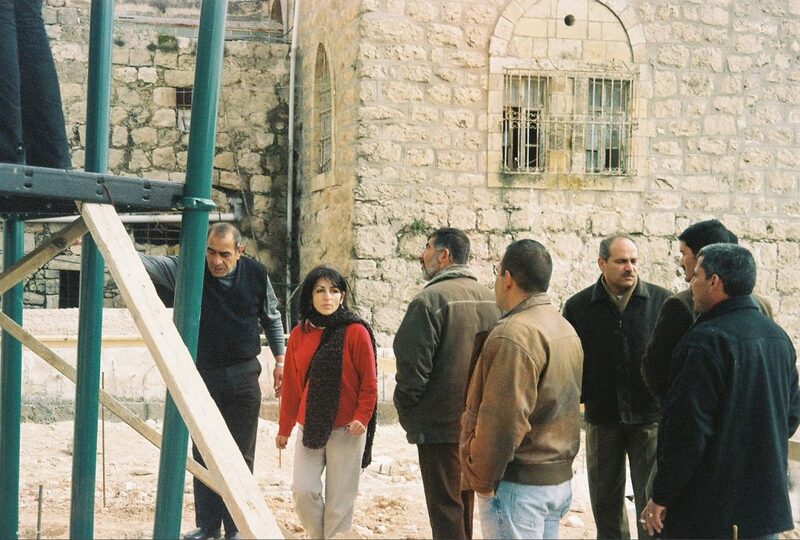 Playgrounds for Palestine’s first playground was acquired from the American Playground Corporation and was shipped to Bethlehem after nearly one full year of preparations. 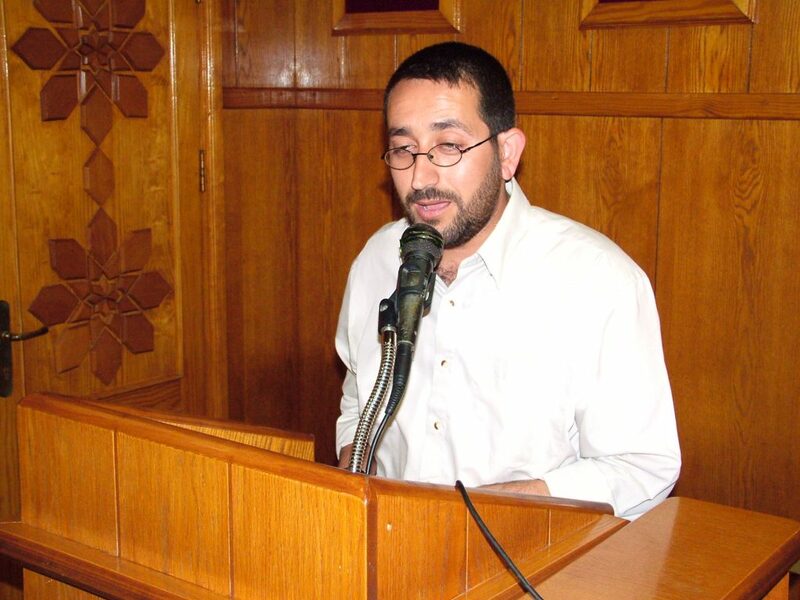 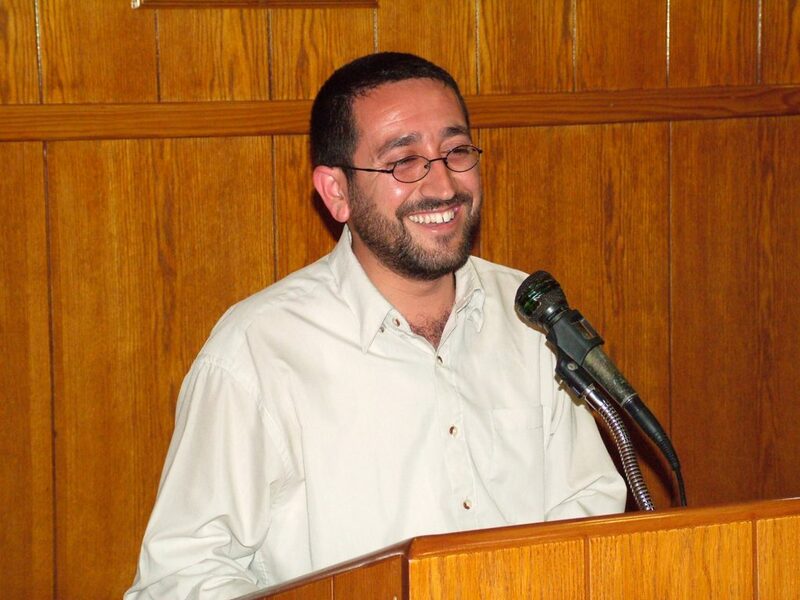 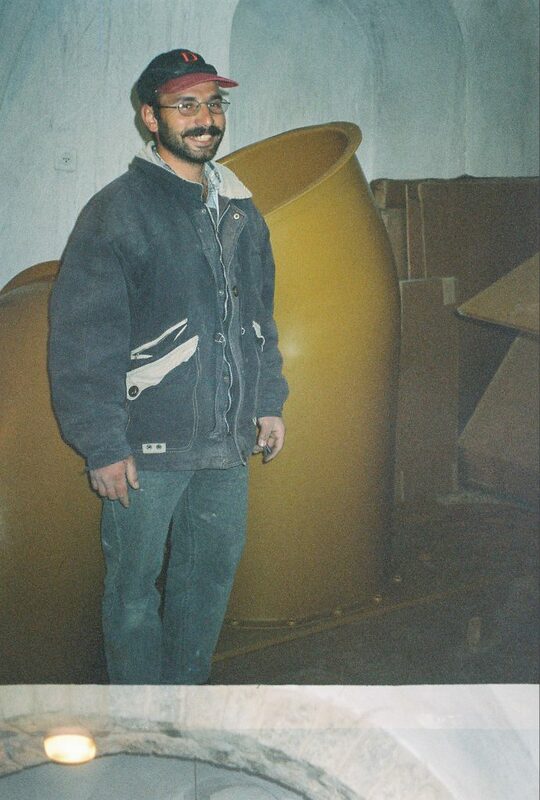 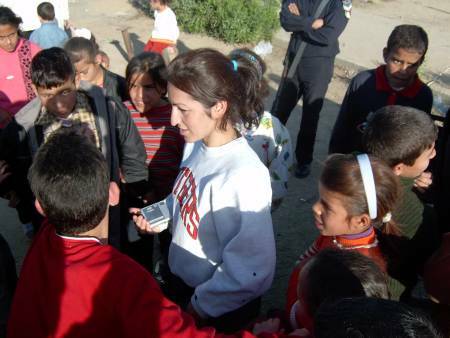 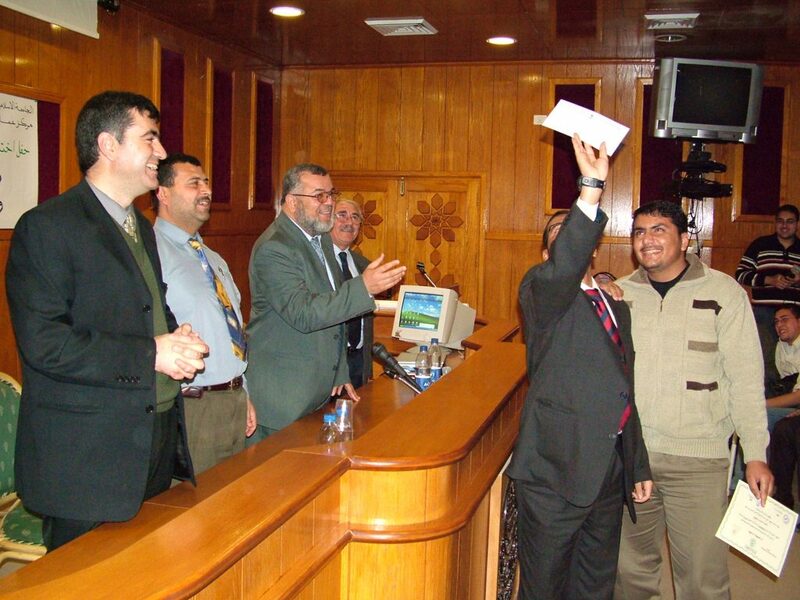 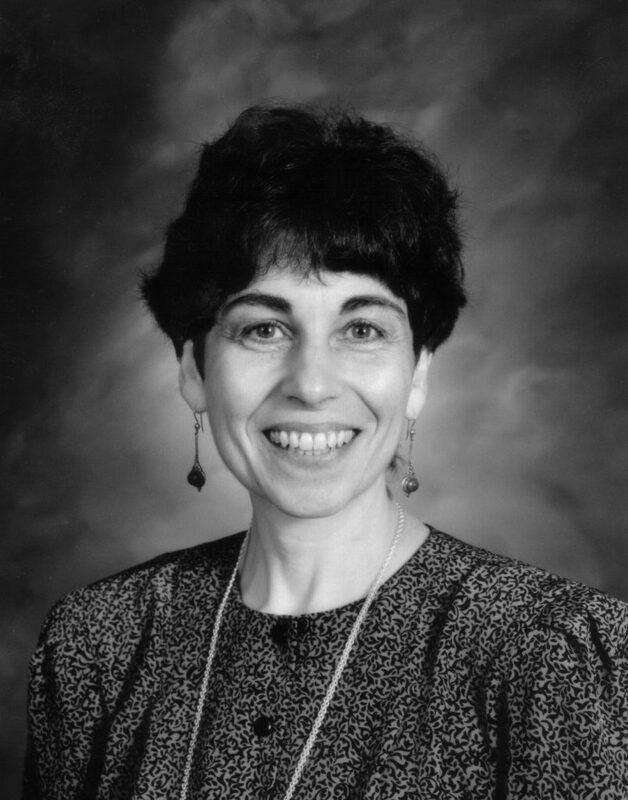 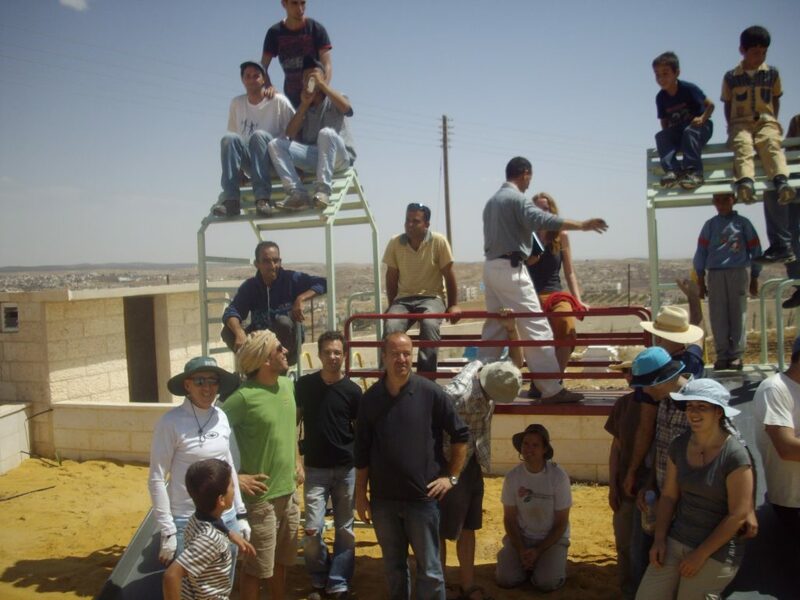 It finally arrived in Bethlehem in November 2002, thanks to the efforts of ANERA (American Near East Refugee Aid). 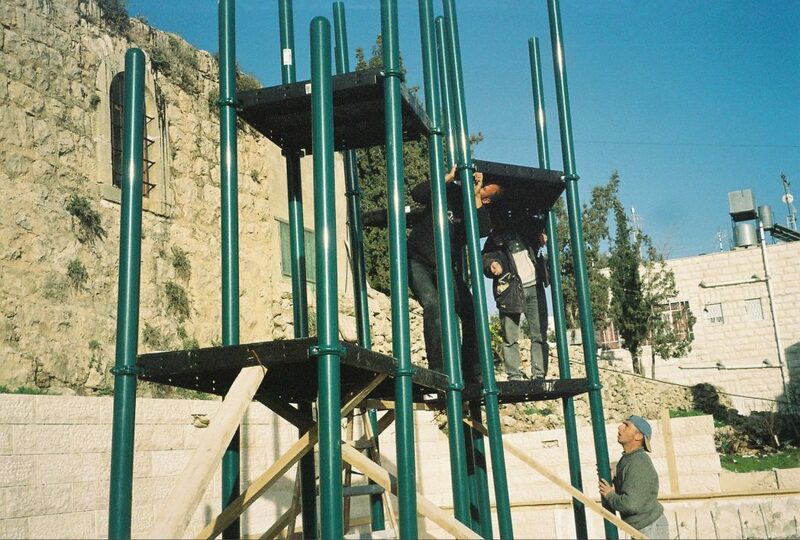 Once there, however, it could not be erected in time for Christmas as planned due to Israeli closures and curfews. 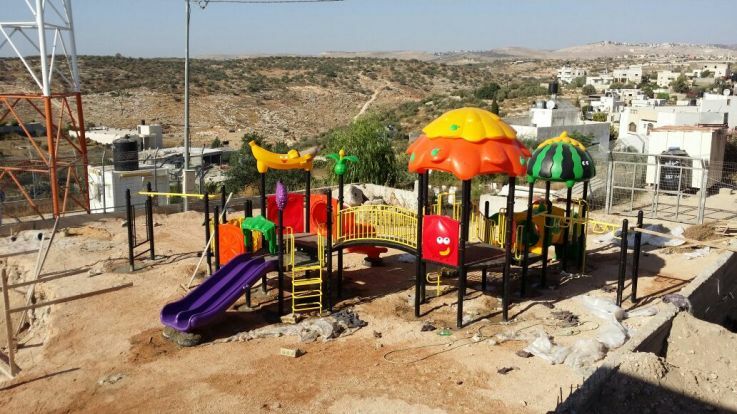 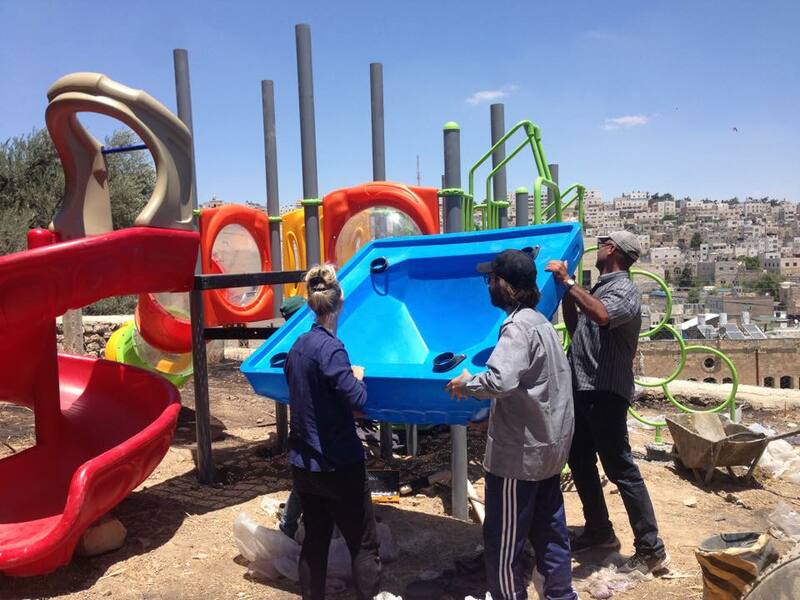 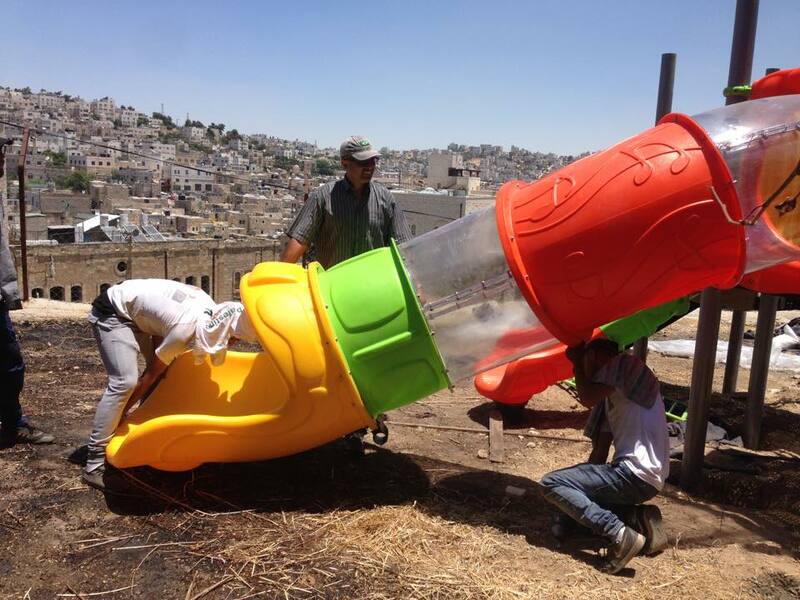 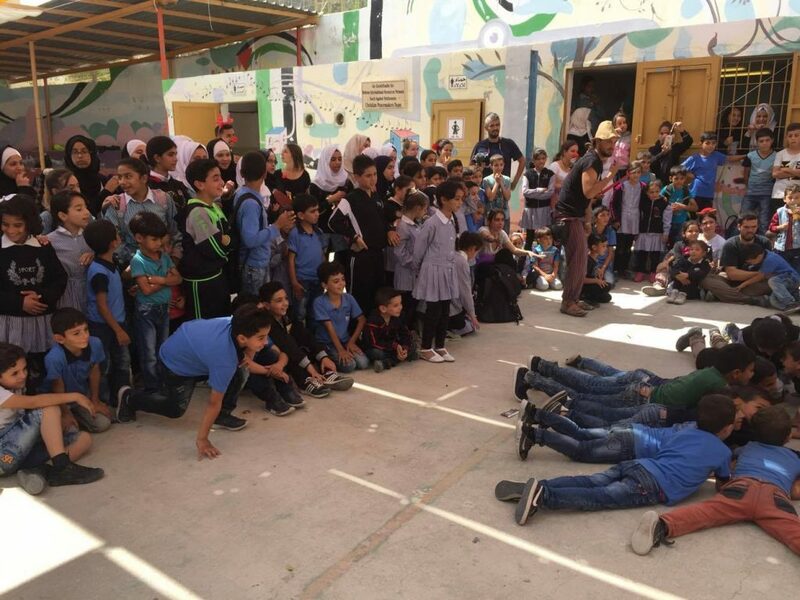 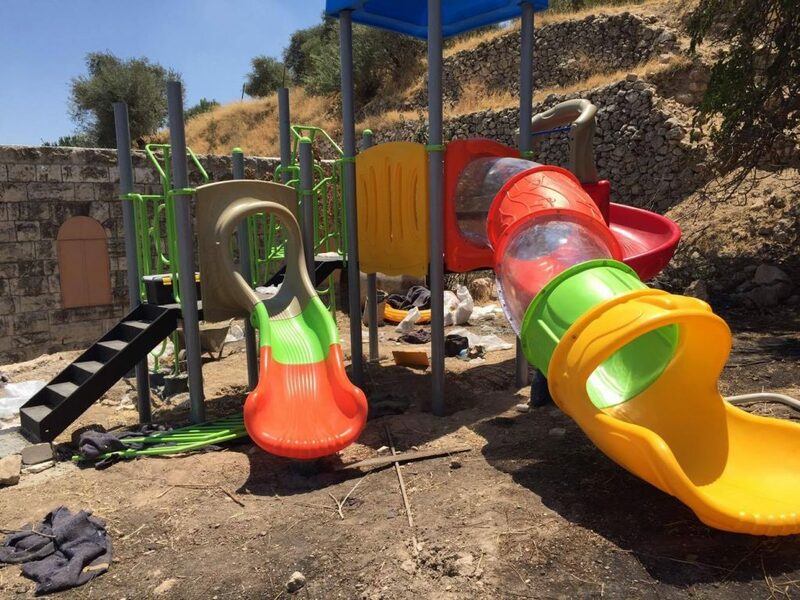 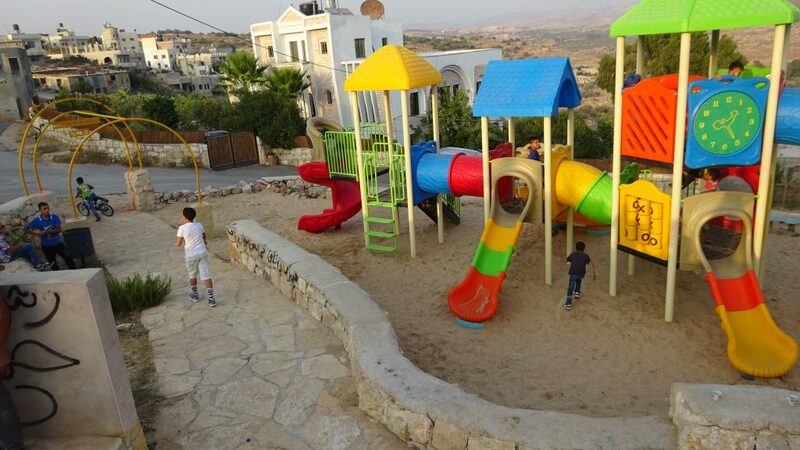 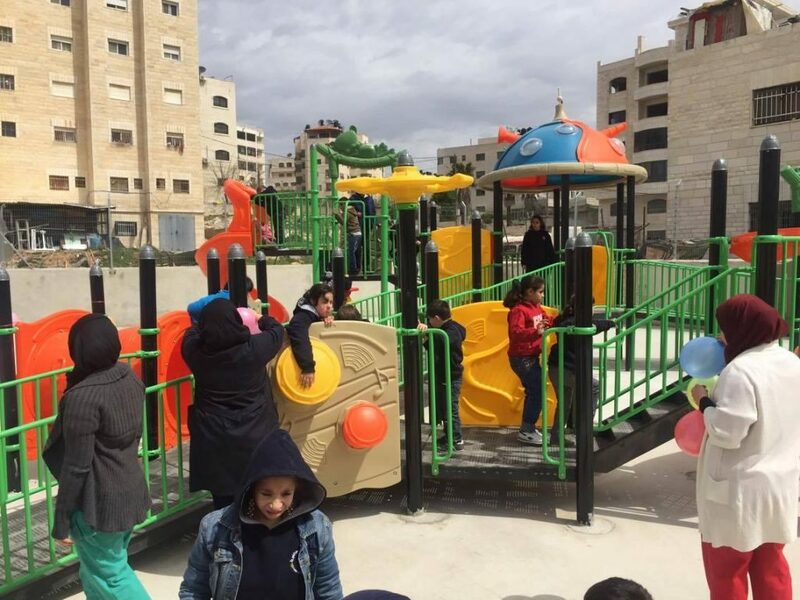 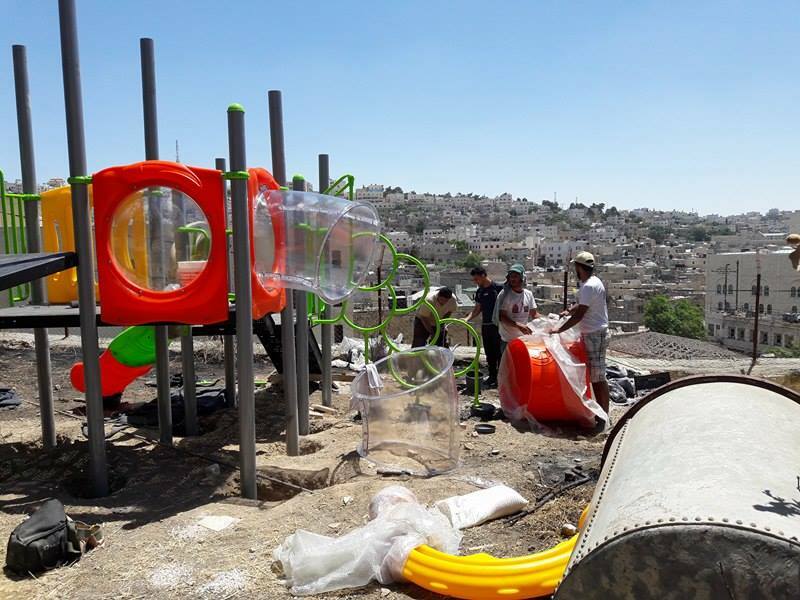 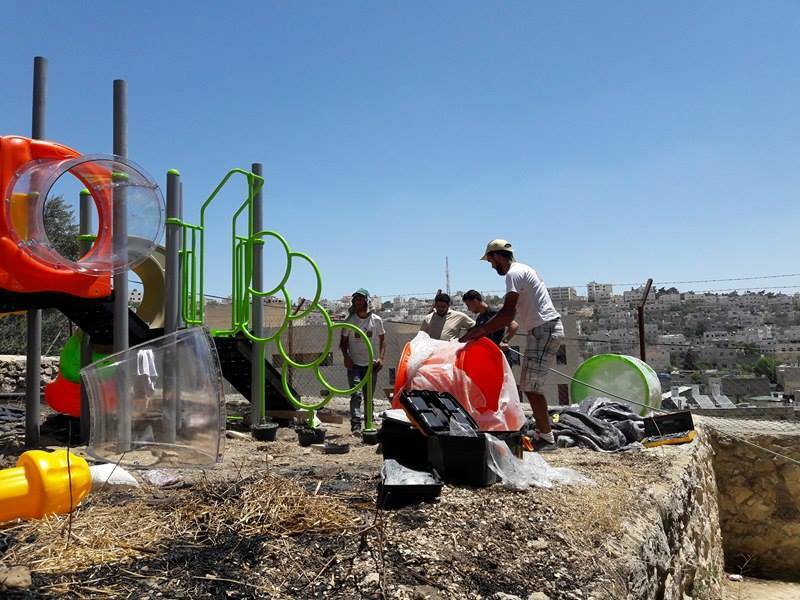 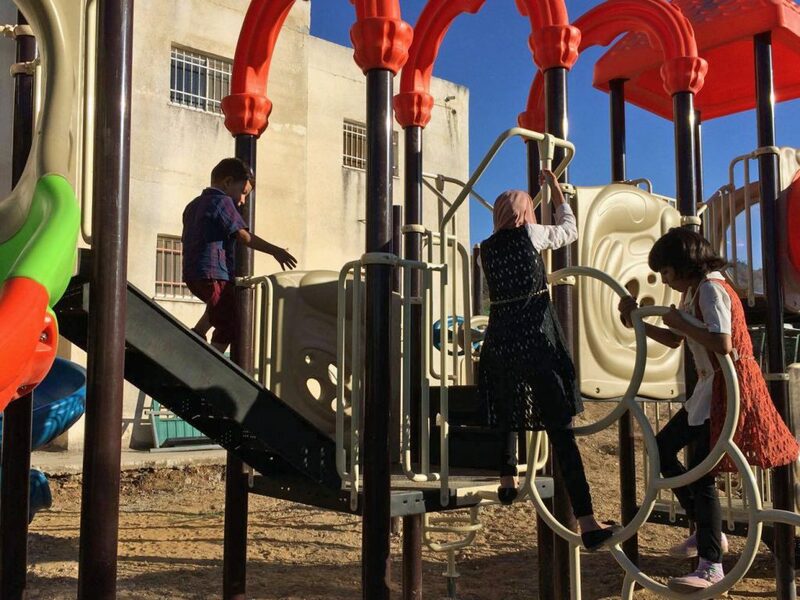 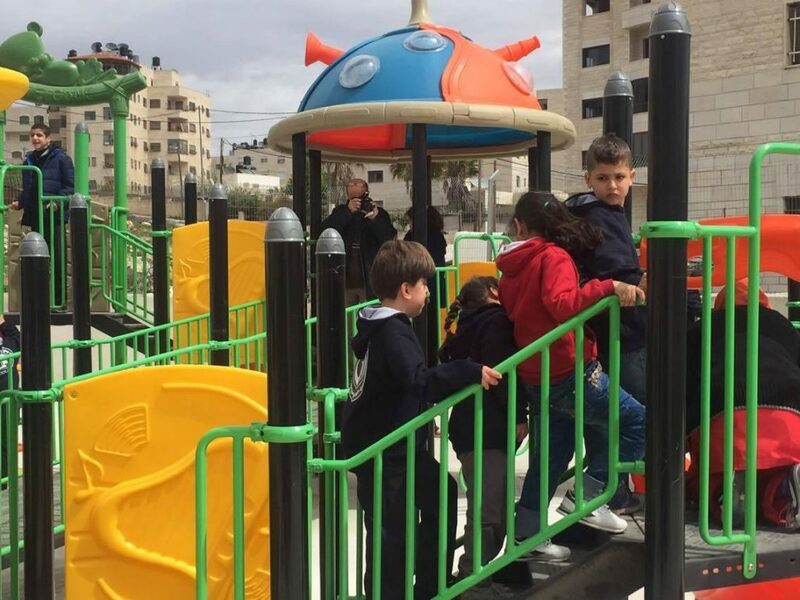 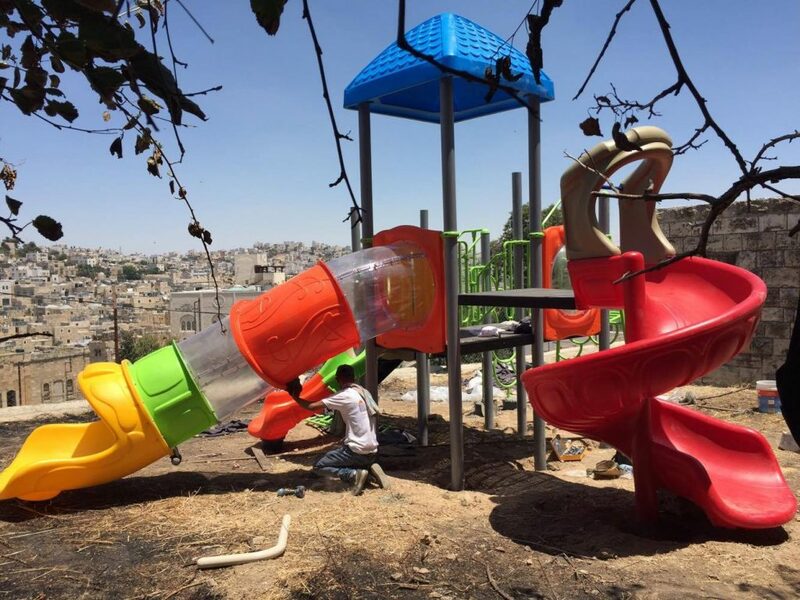 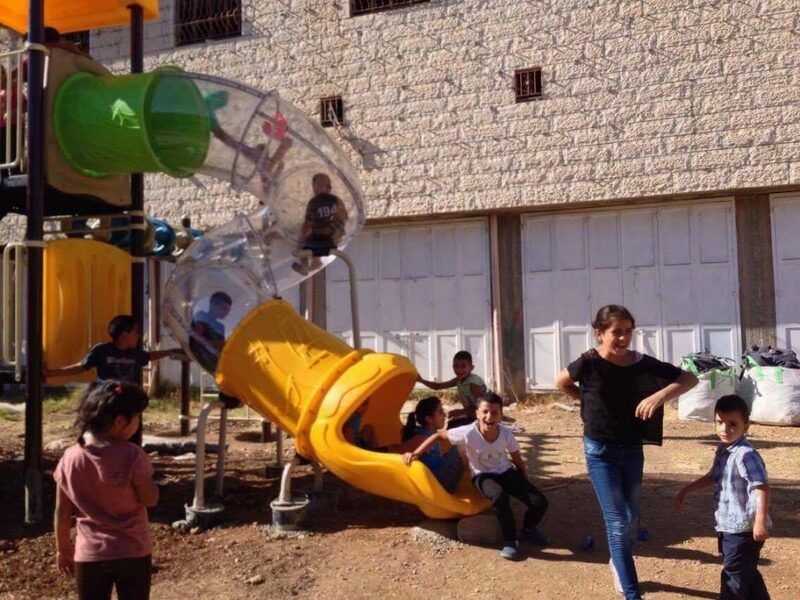 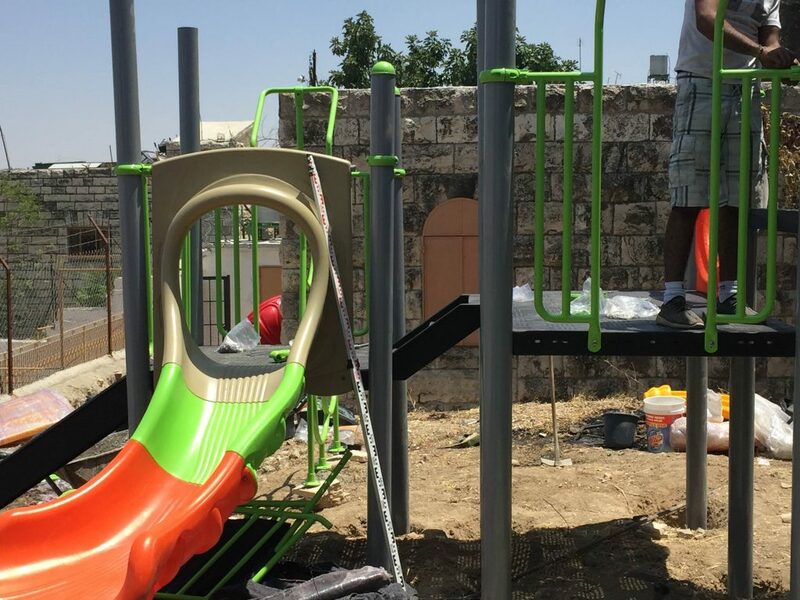 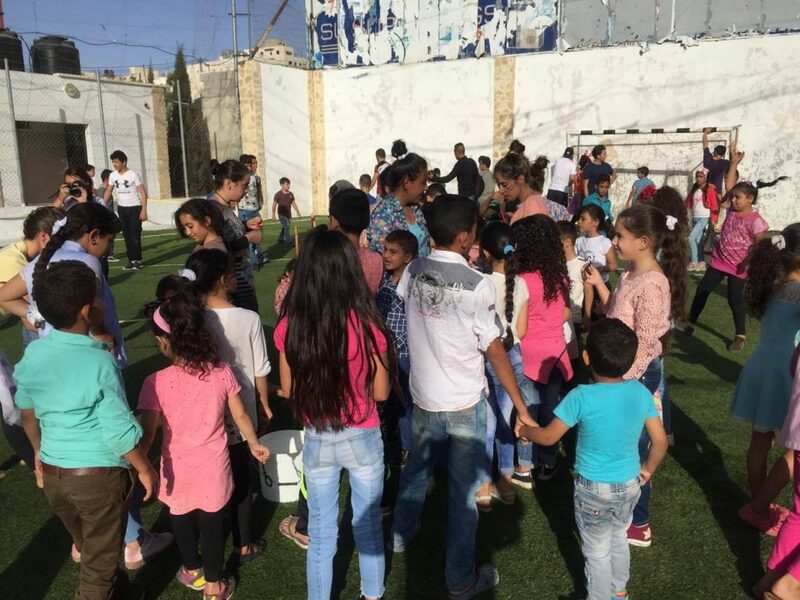 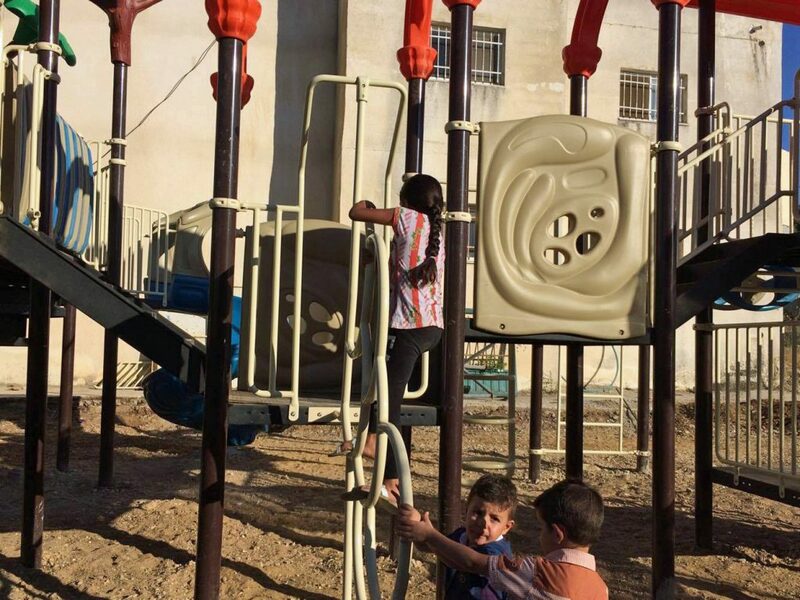 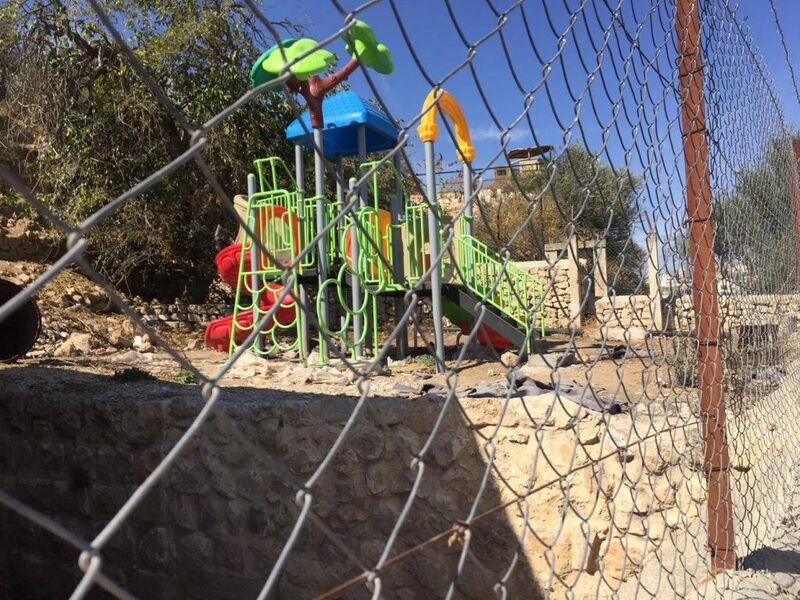 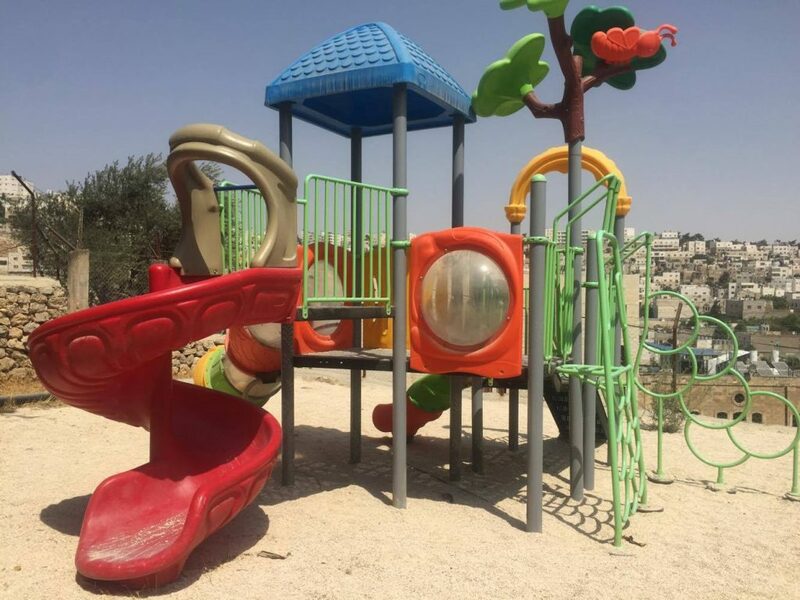 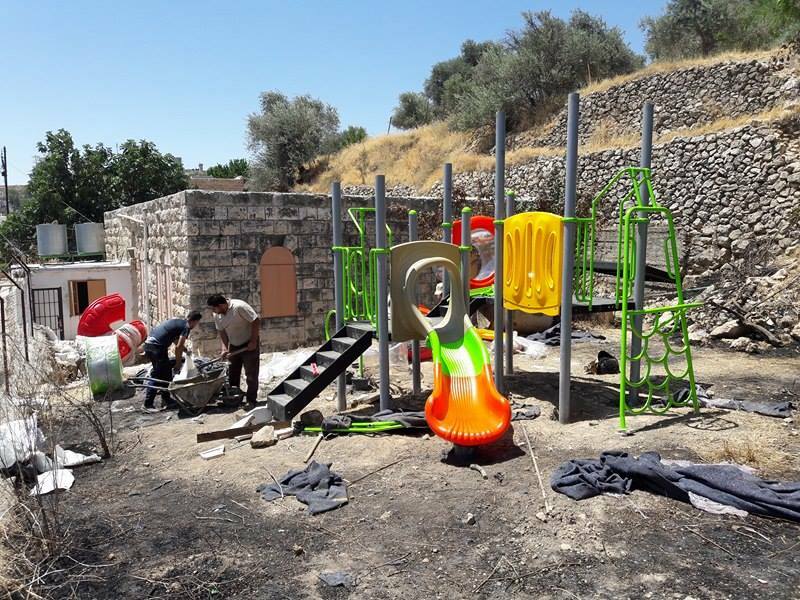 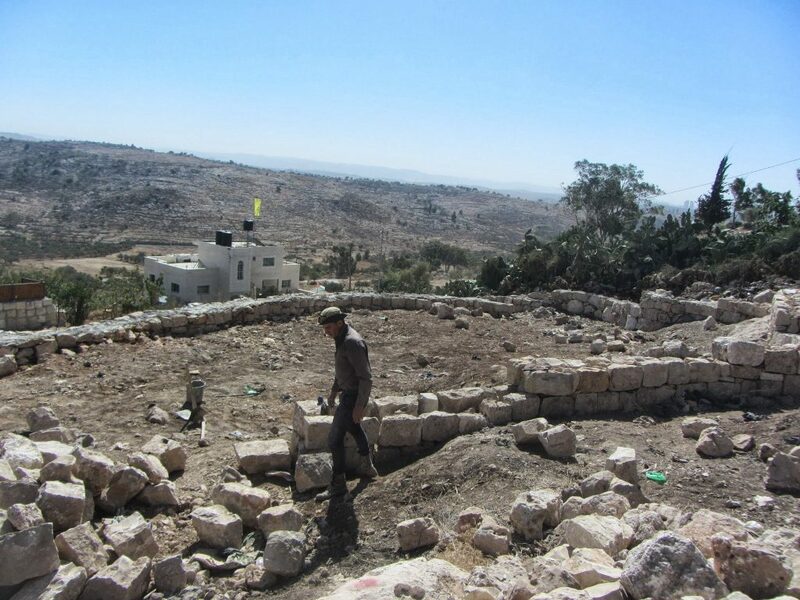 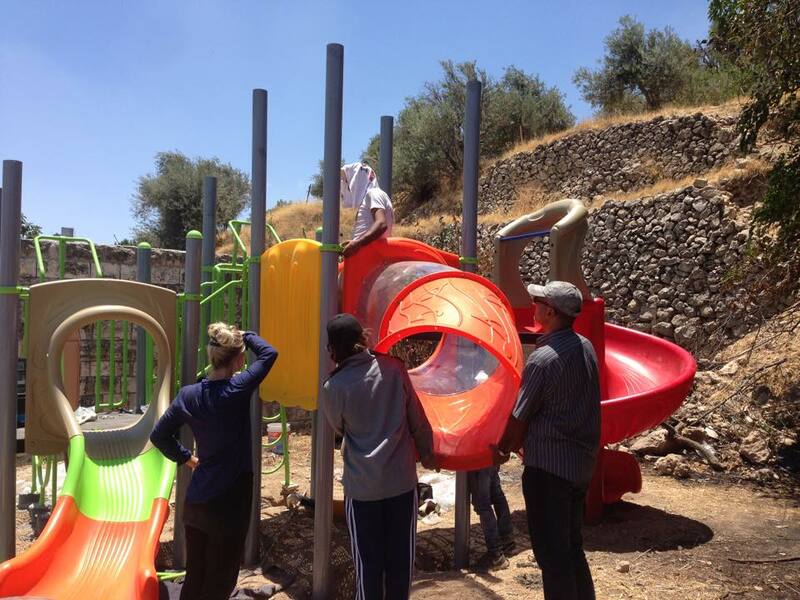 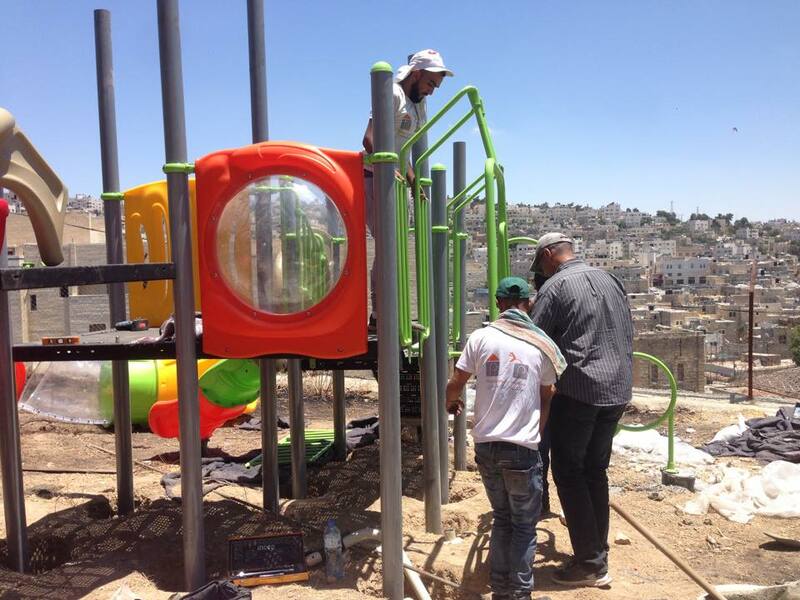 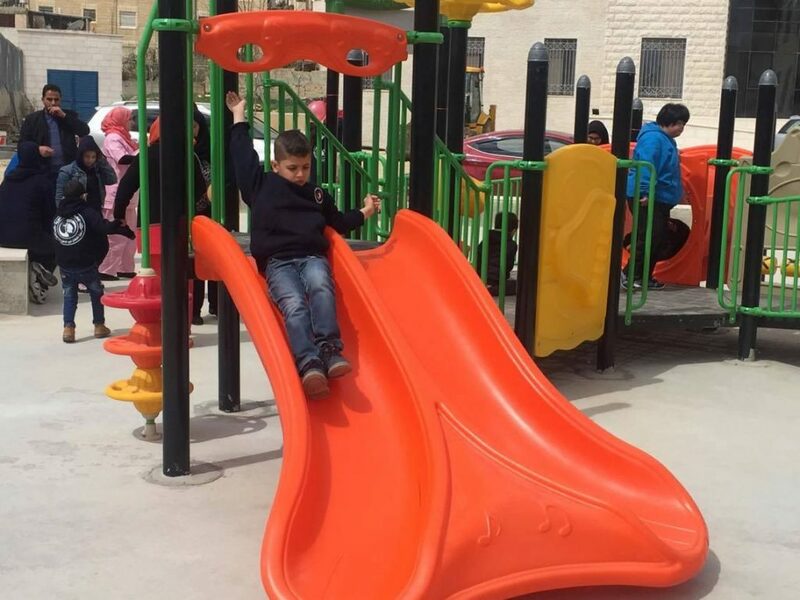 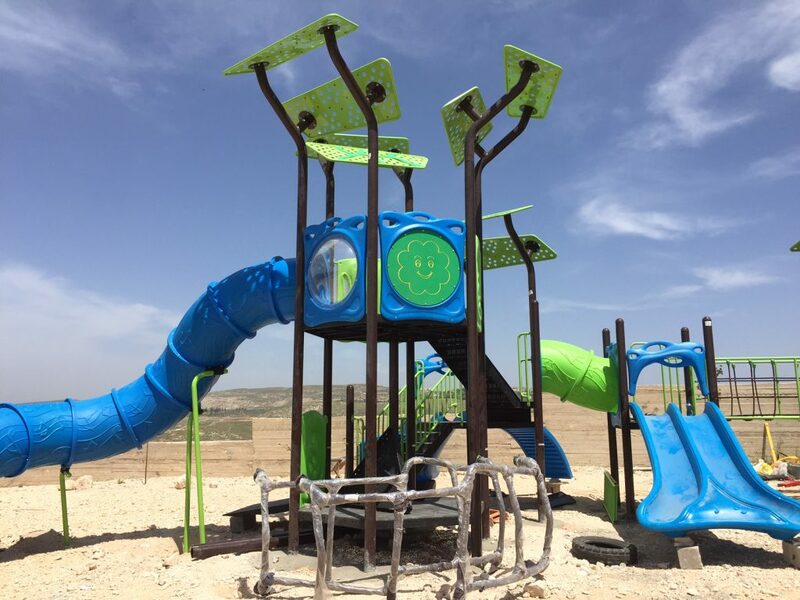 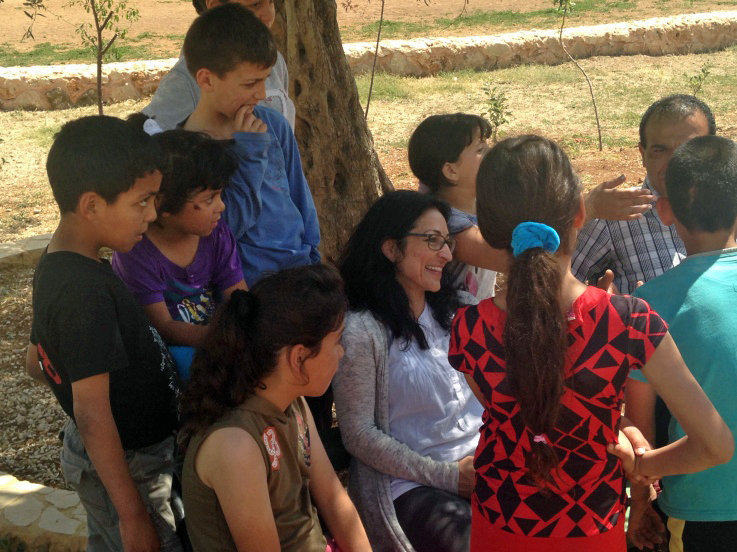 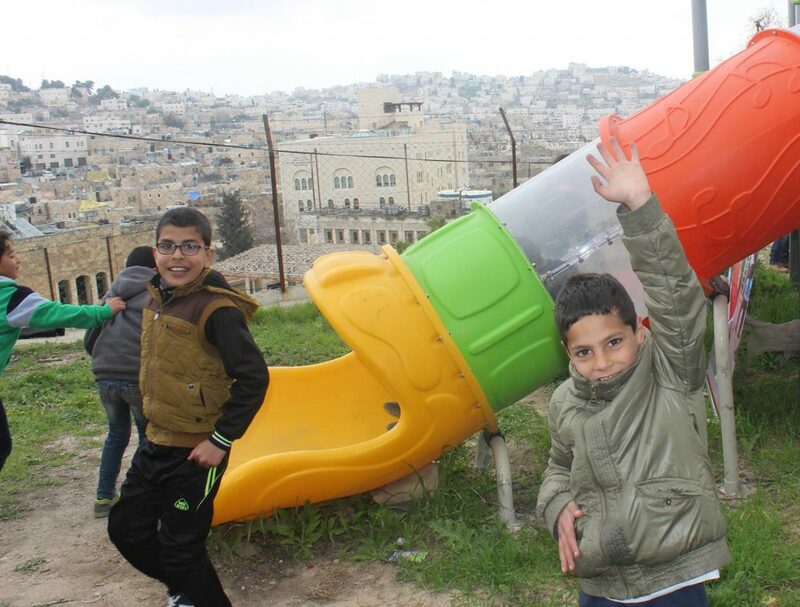 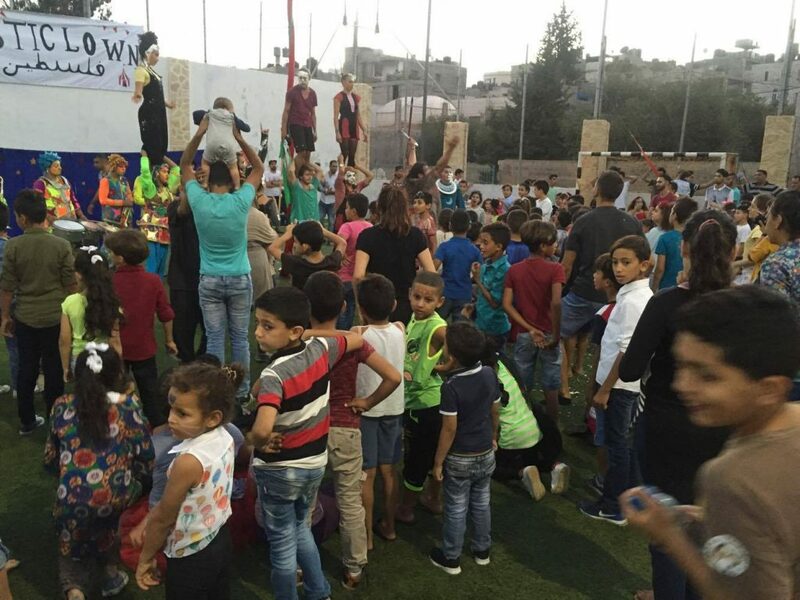 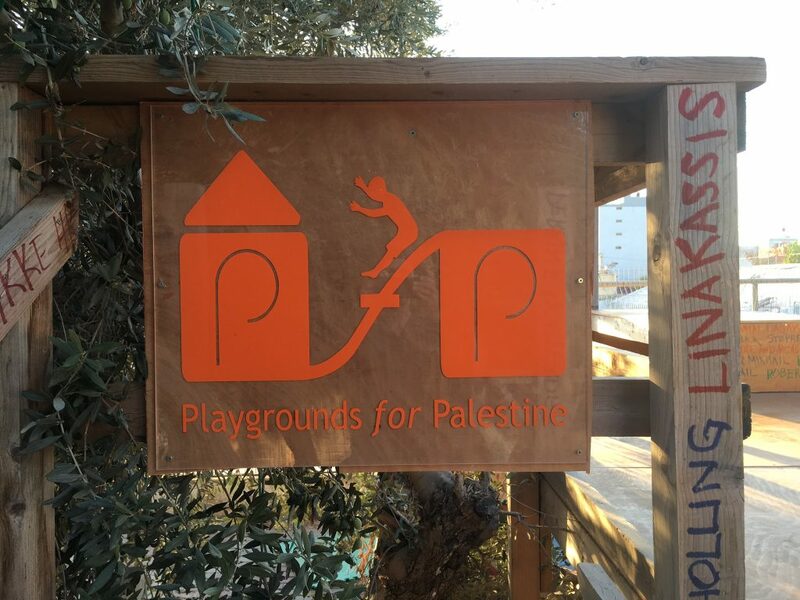 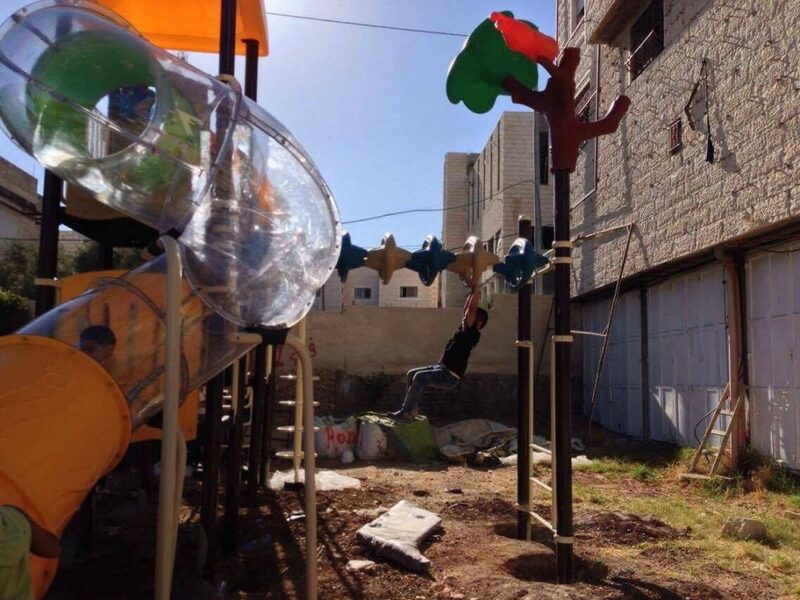 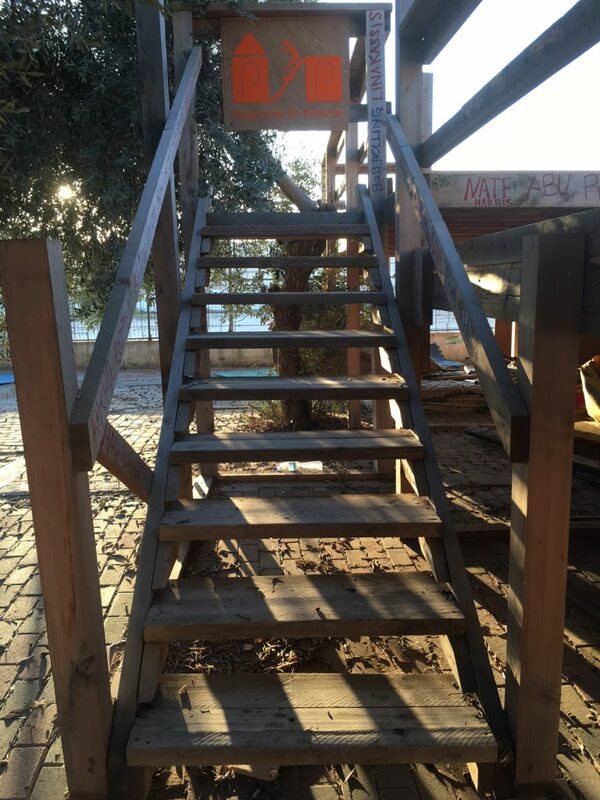 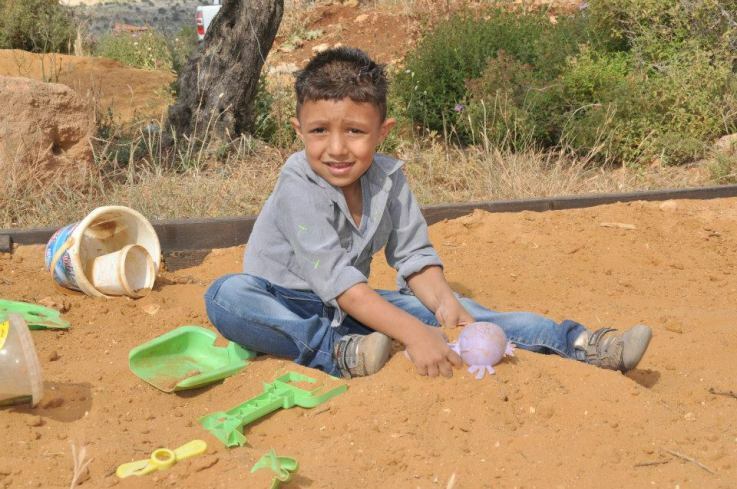 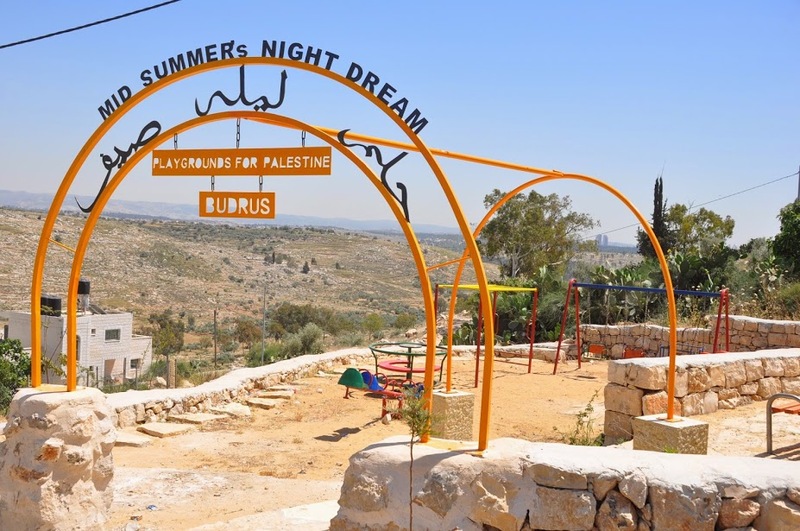 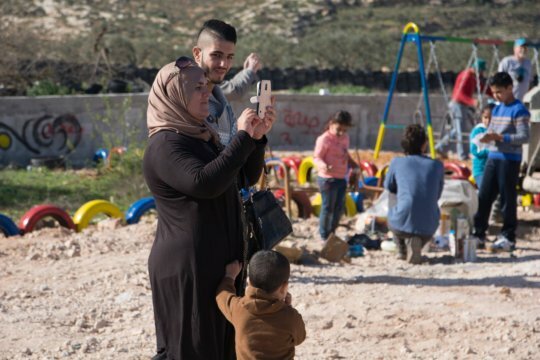 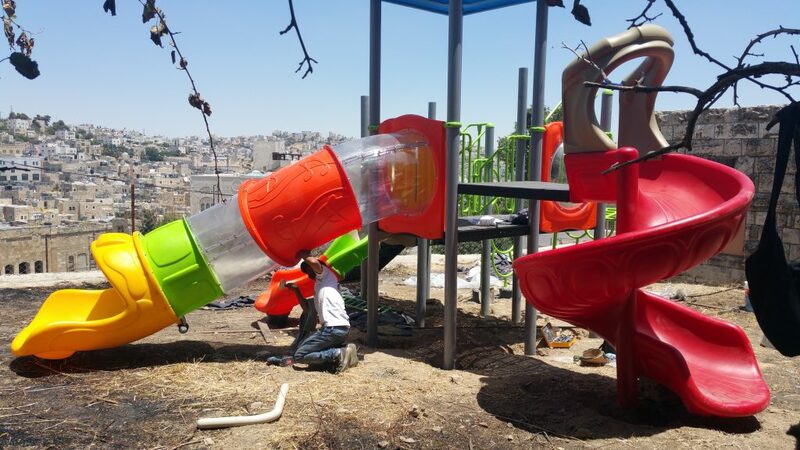 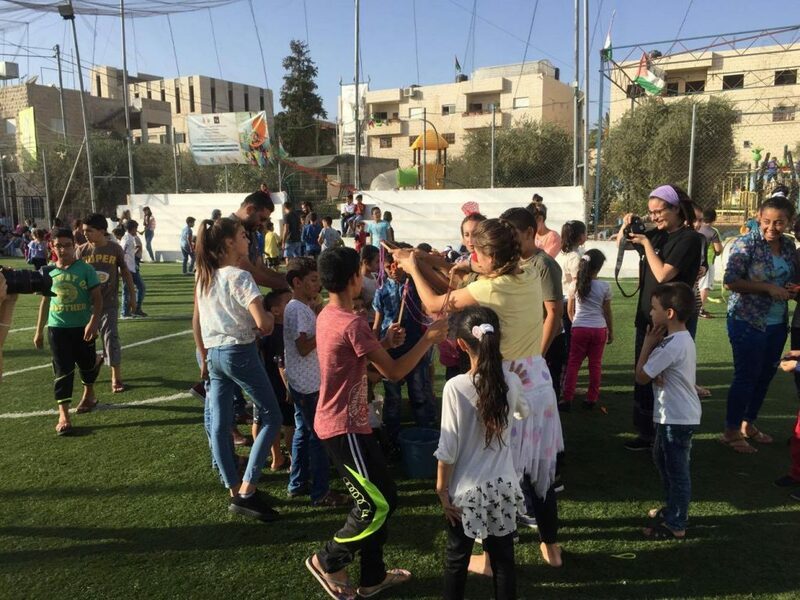 Despite this, two affiliates of Playgrounds for Palestine, Susan Abulhawa and Mark Miller, traveled to Bethlehem to oversee its installation, which was finally completed mid-January. 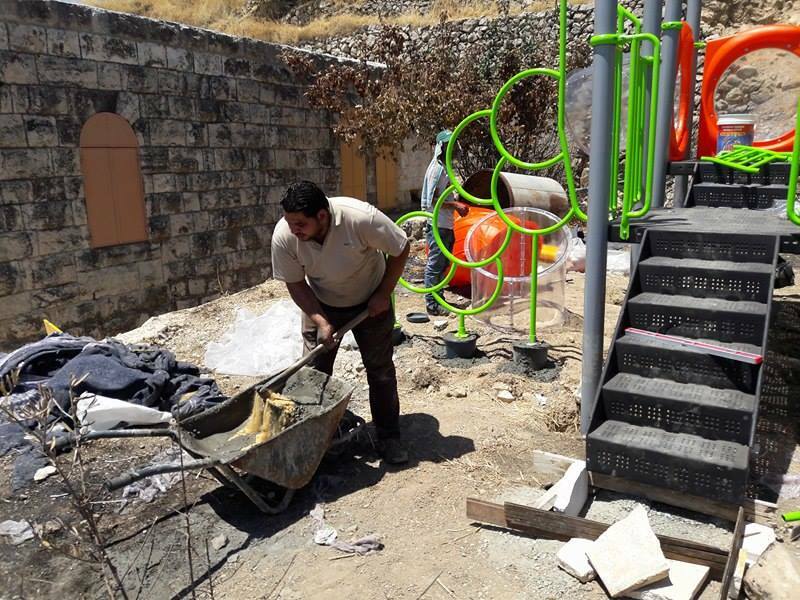 A group of dedicated local contractors and laborers worked day and night to get as much done during the few hours they were free from a forbidding curfew. 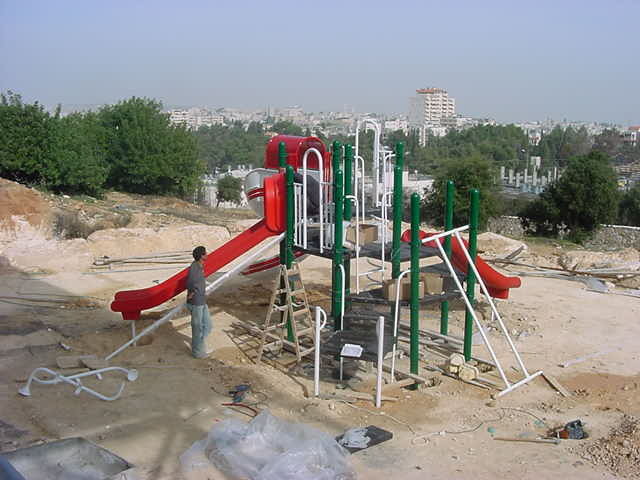 Finally, two weeks later, PfP’s first playground was erected. 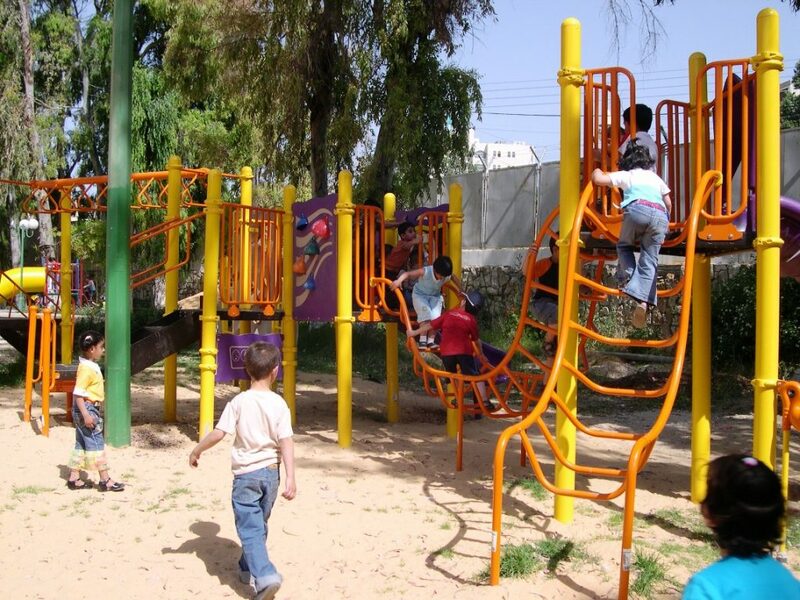 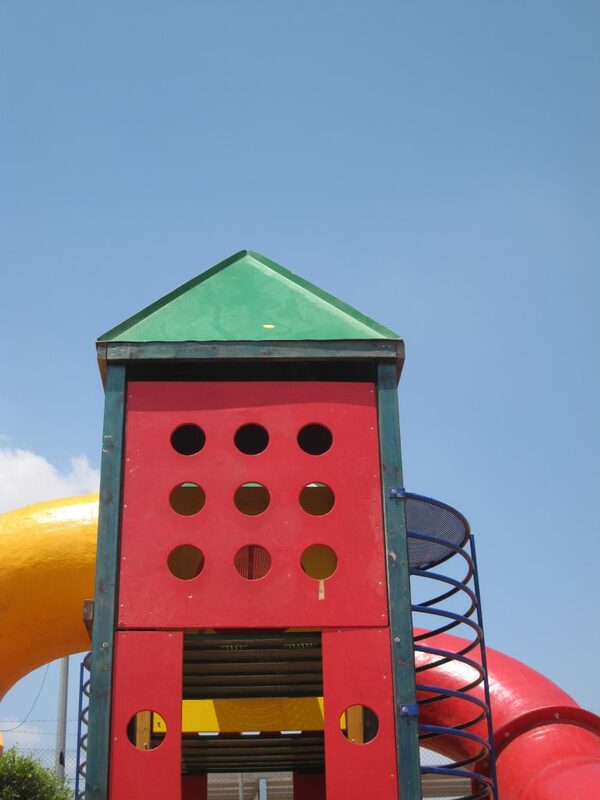 This playground now stands at Dar Al Kalima School in the shadow of the famous Millennium Stage. 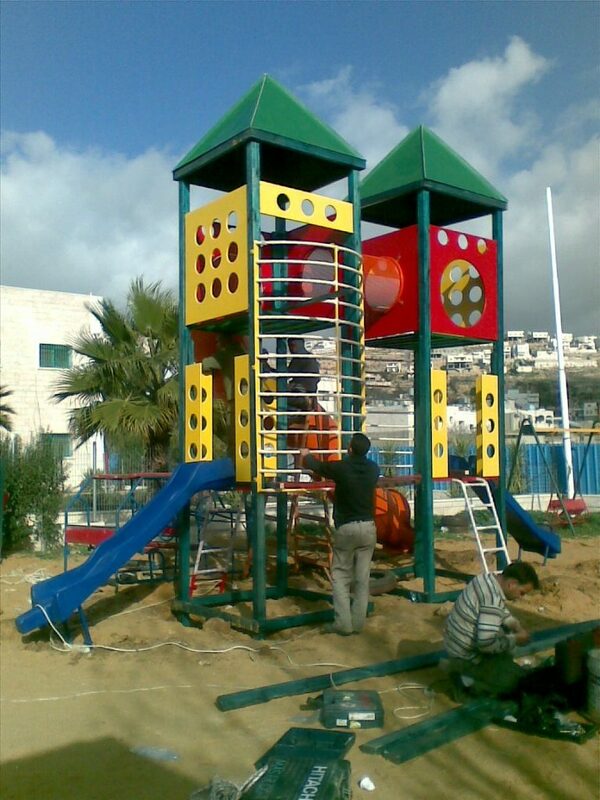 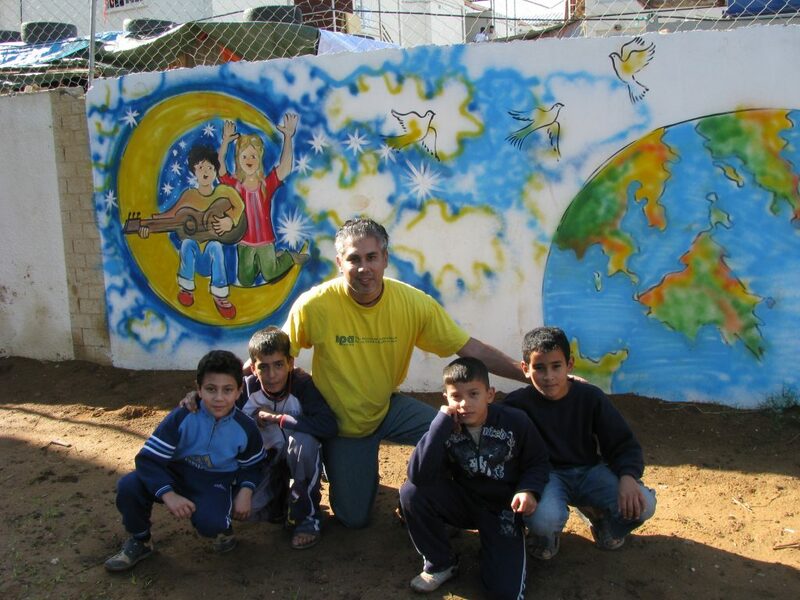 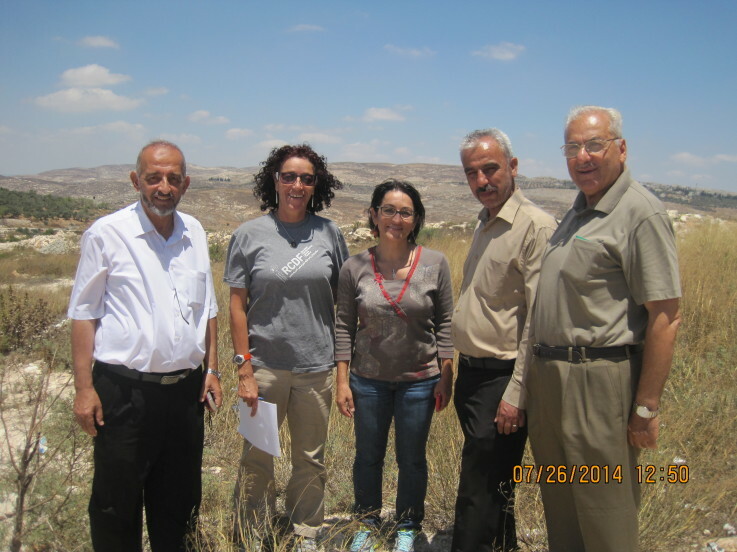 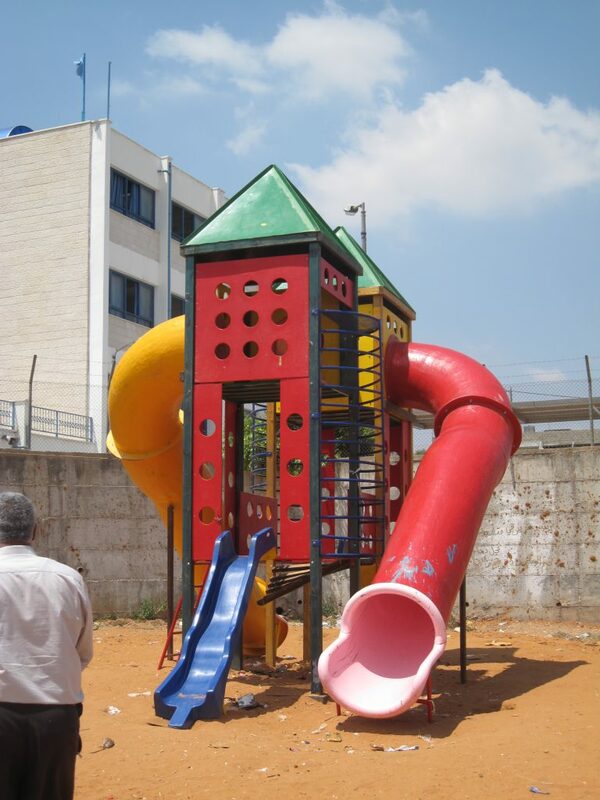 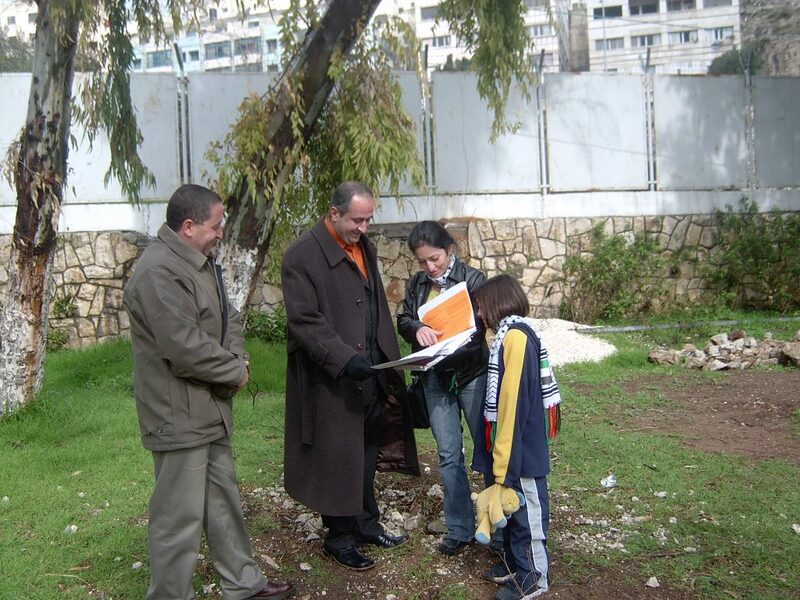 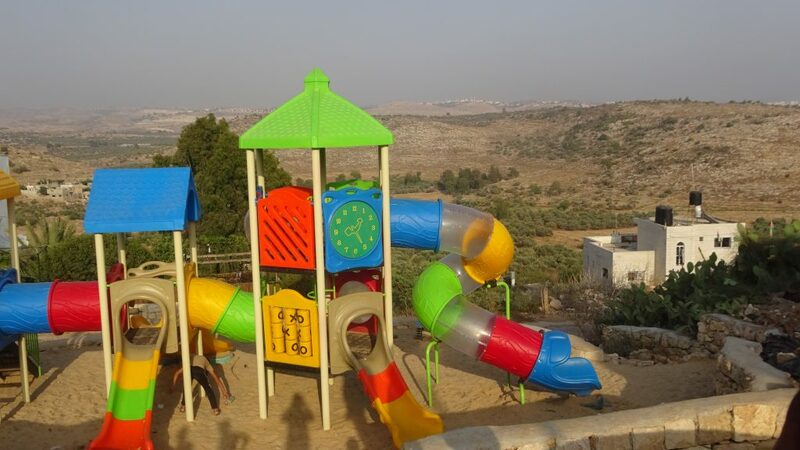 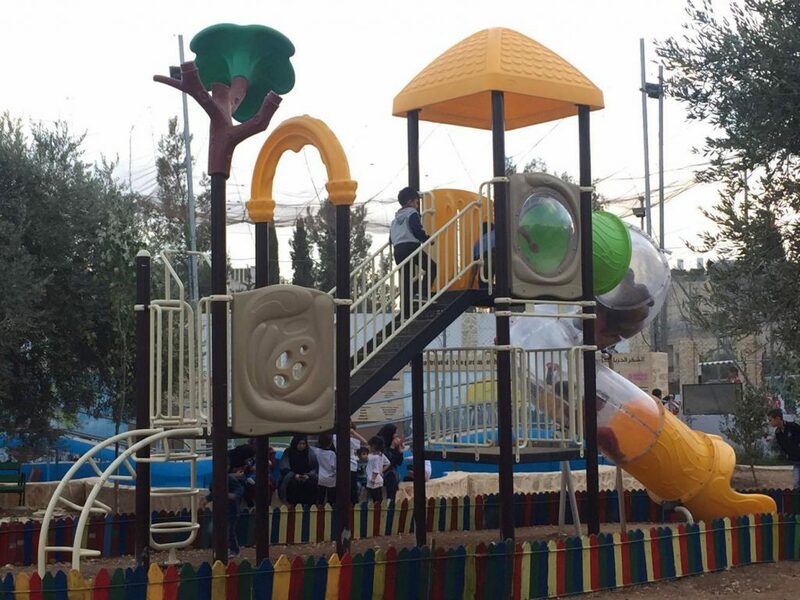 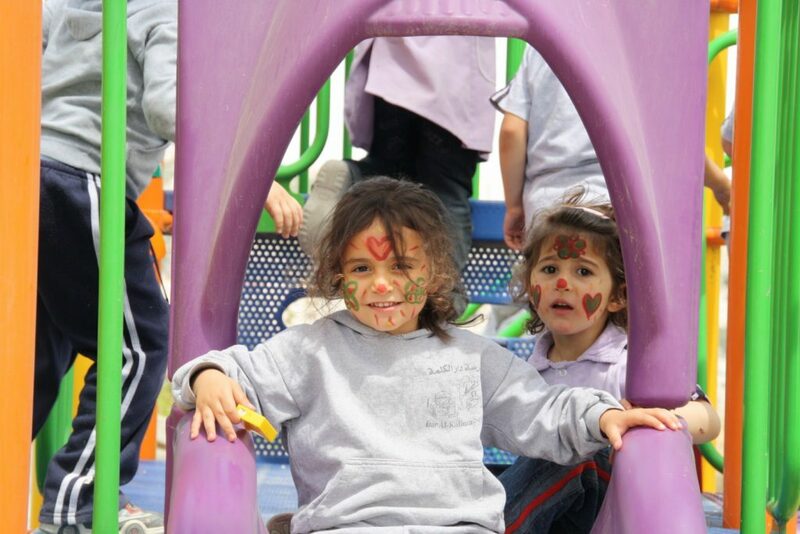 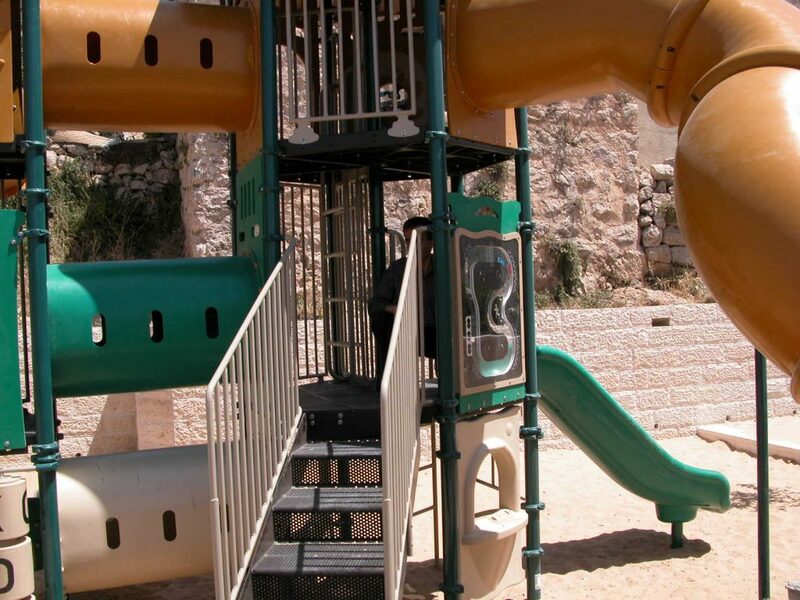 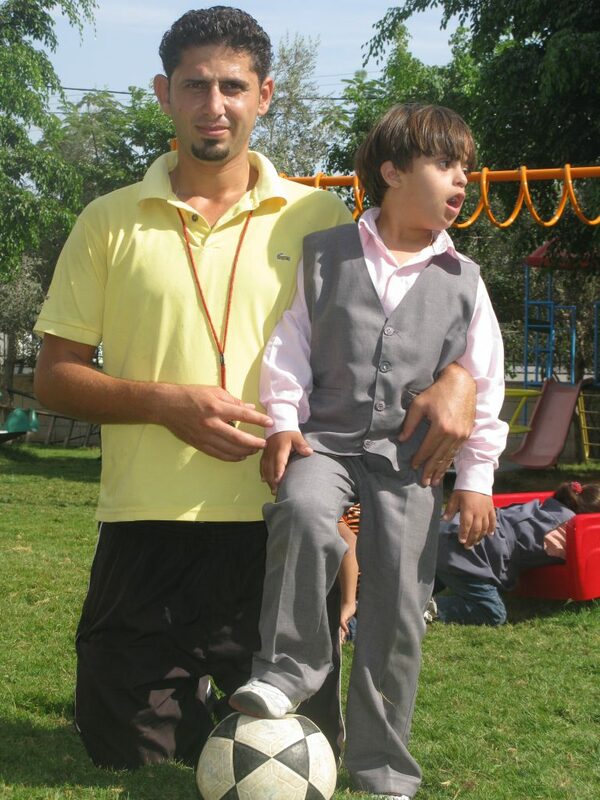 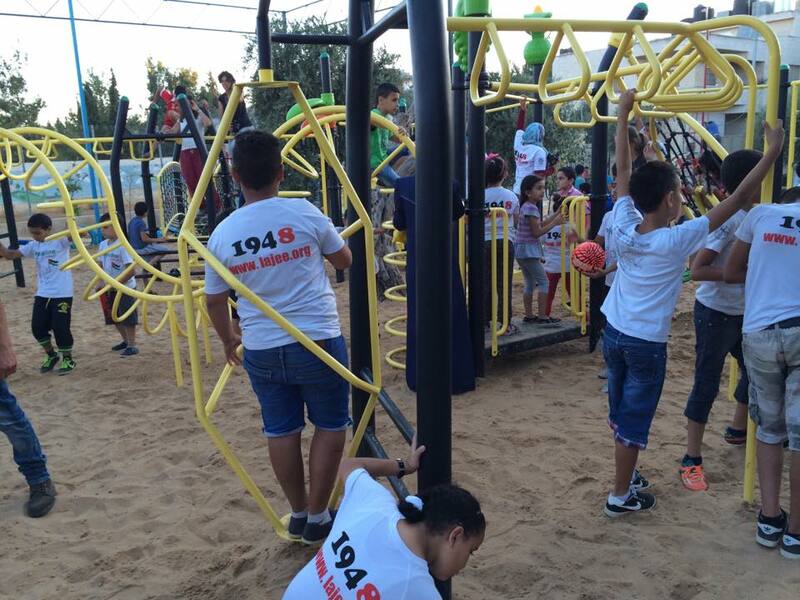 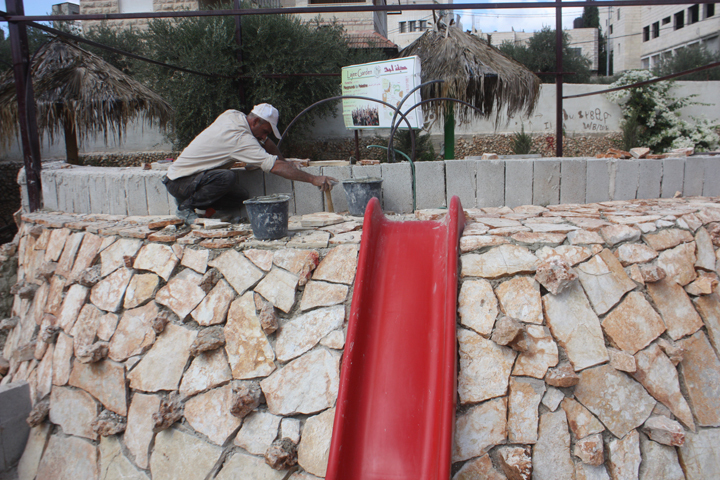 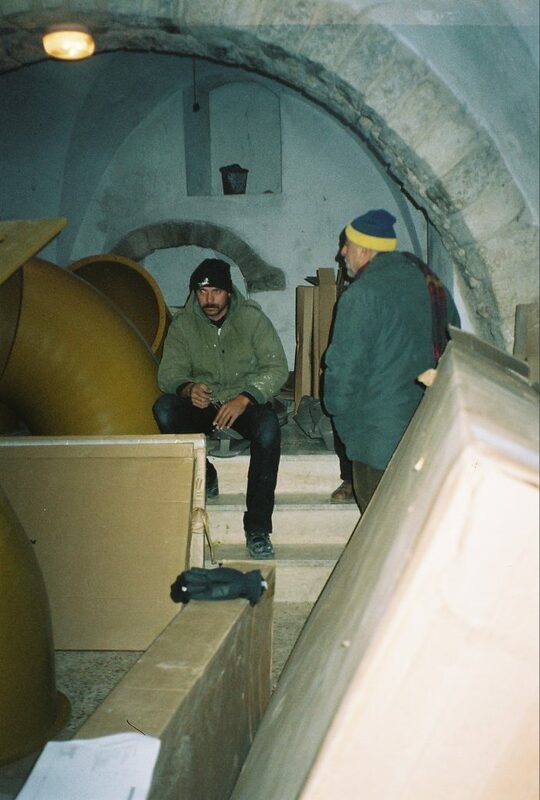 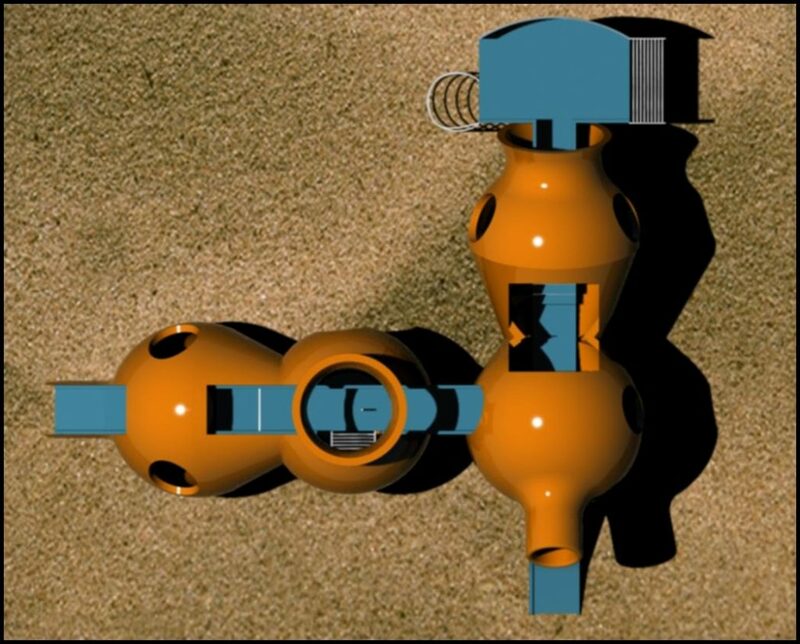 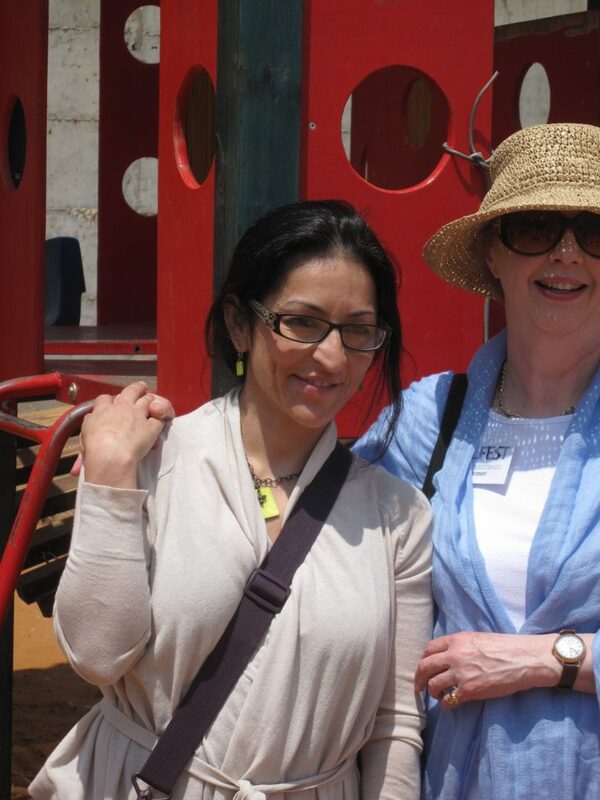 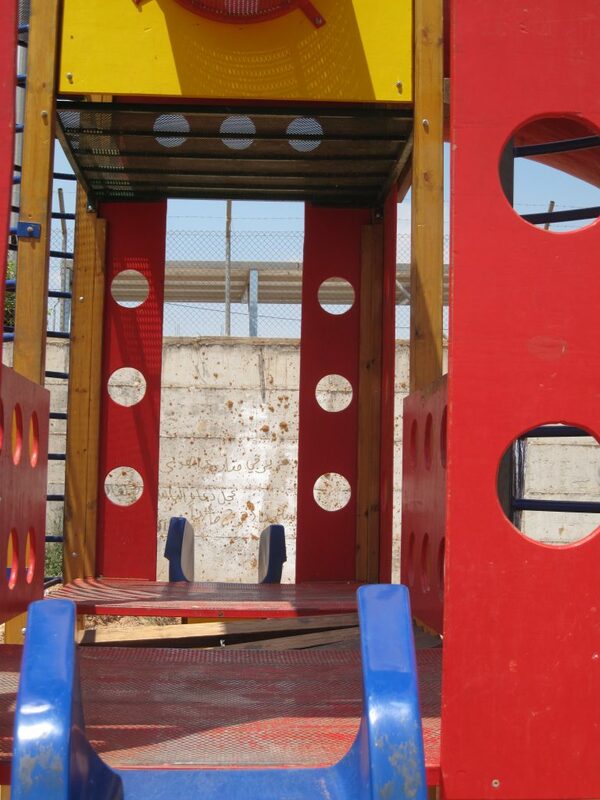 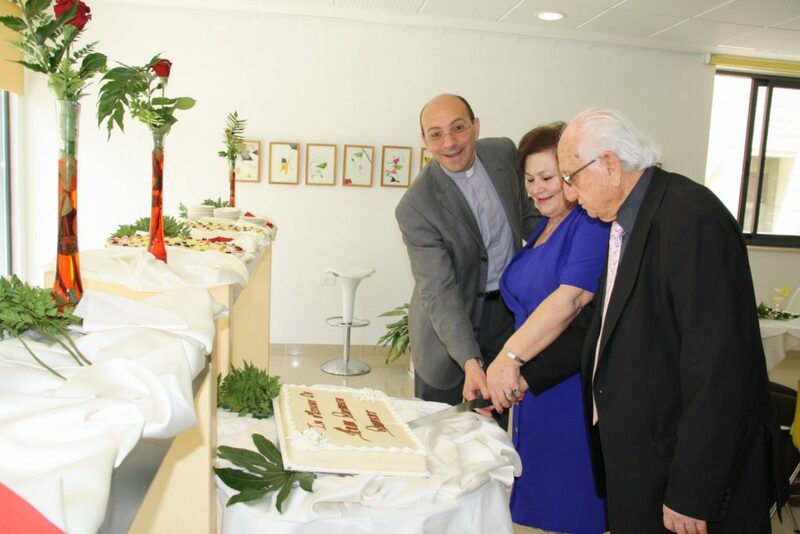 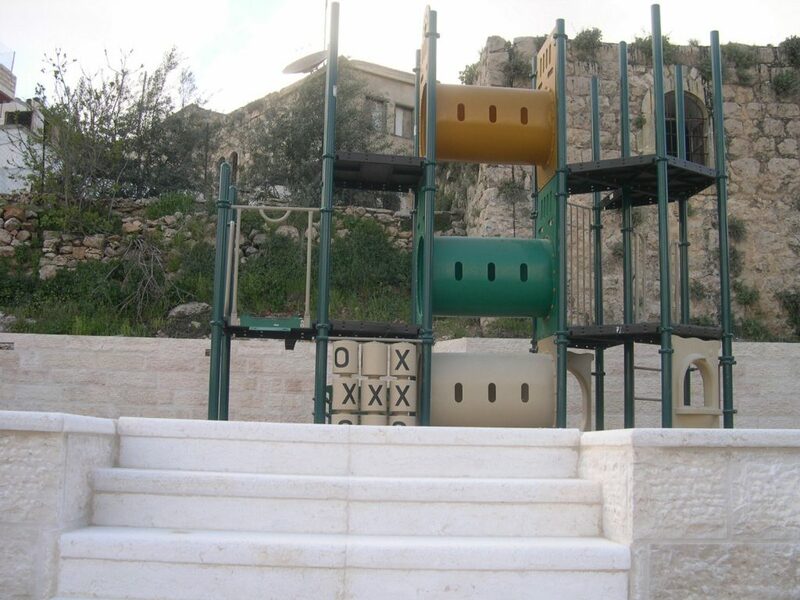 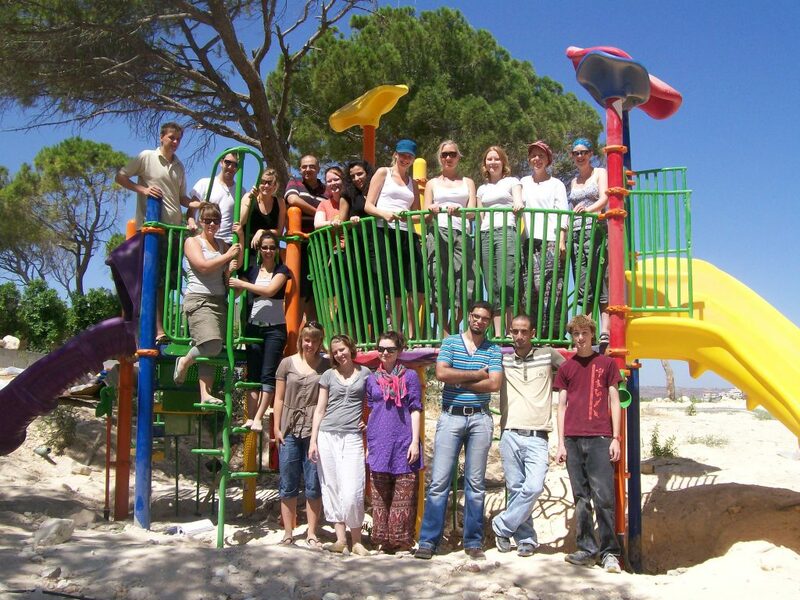 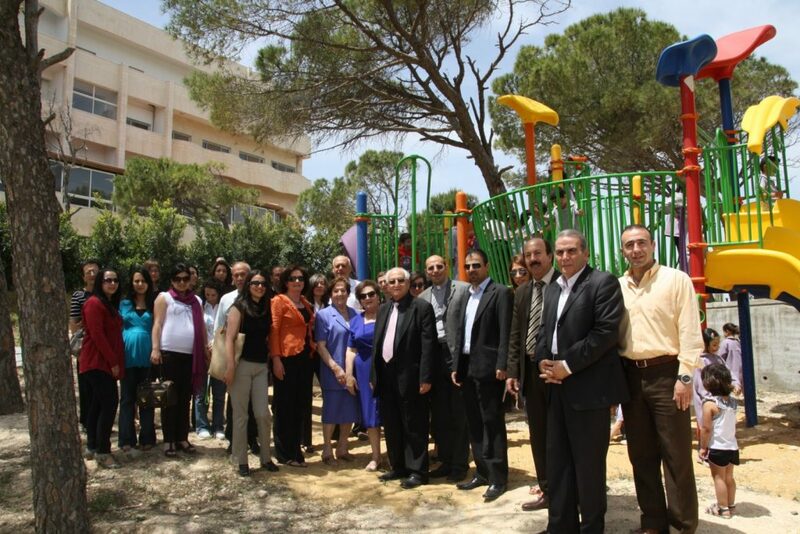 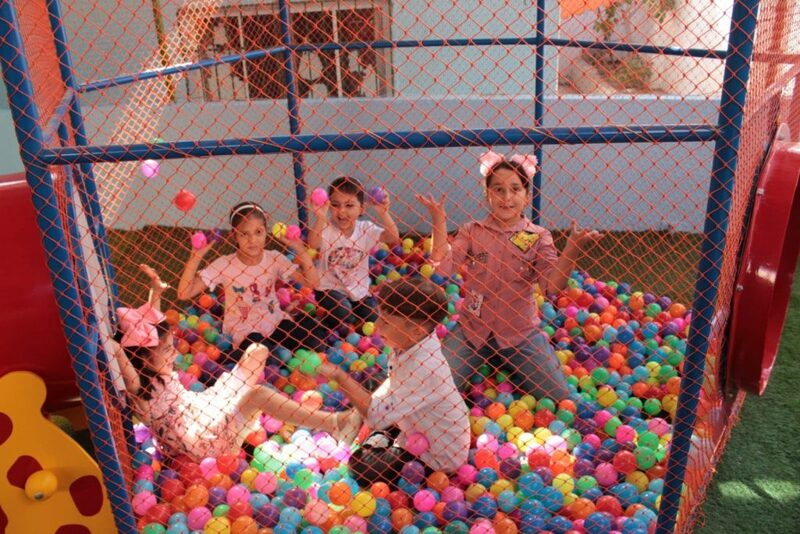 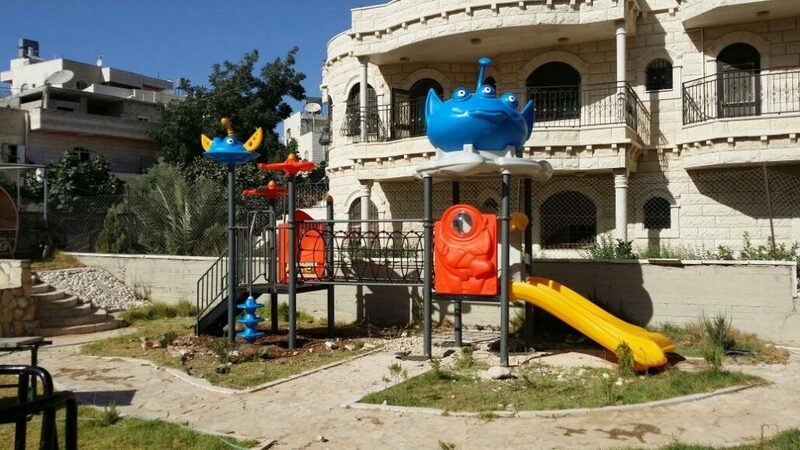 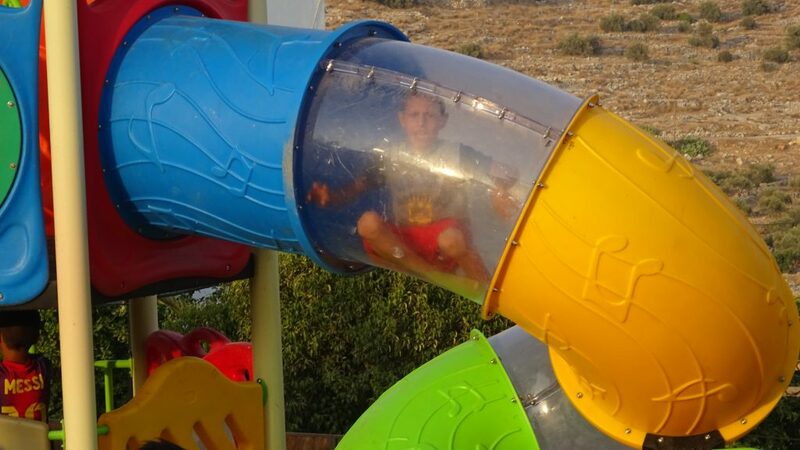 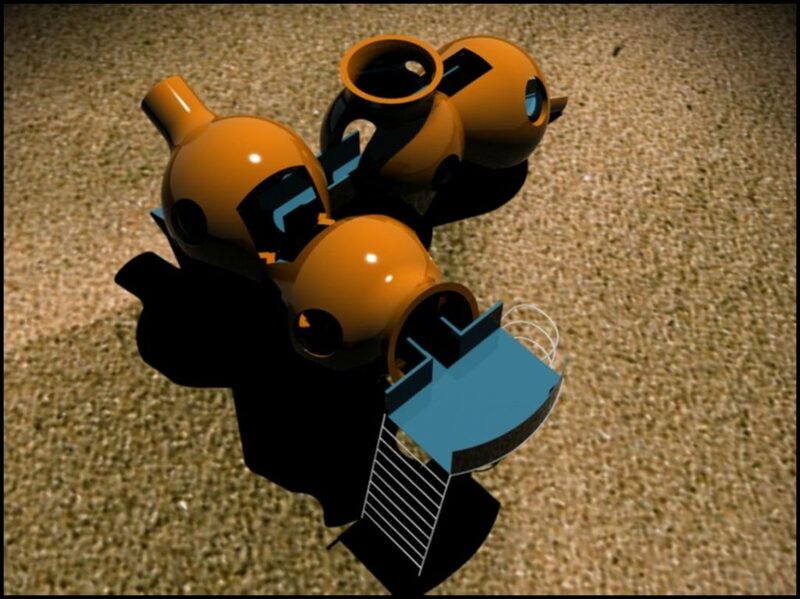 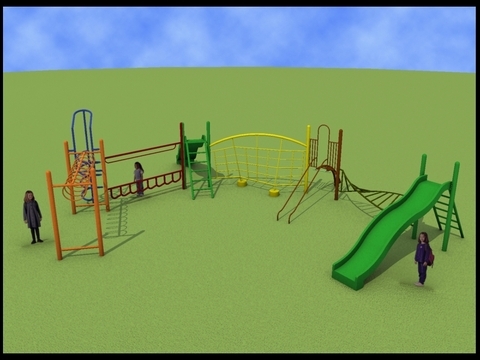 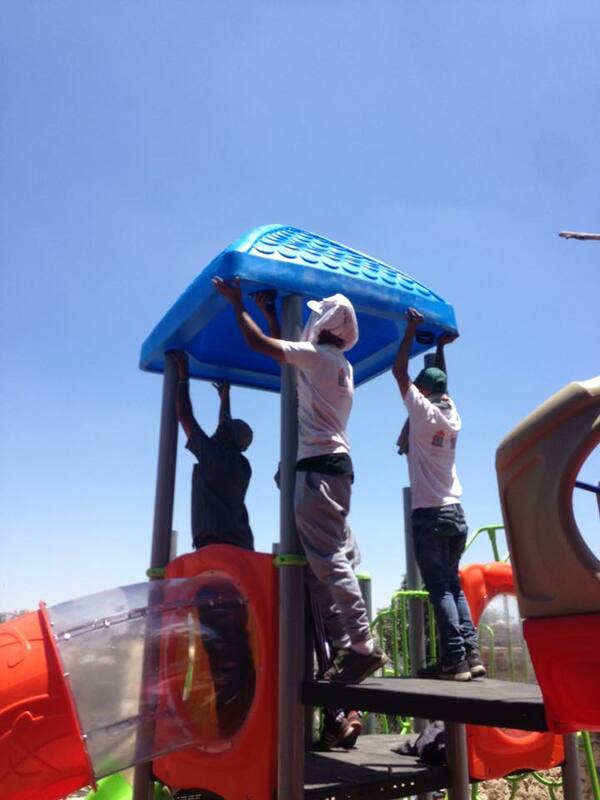 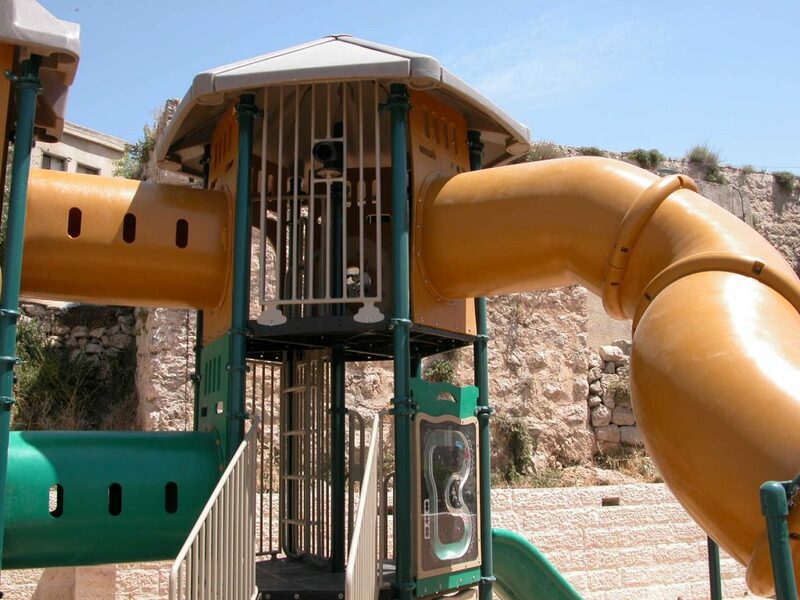 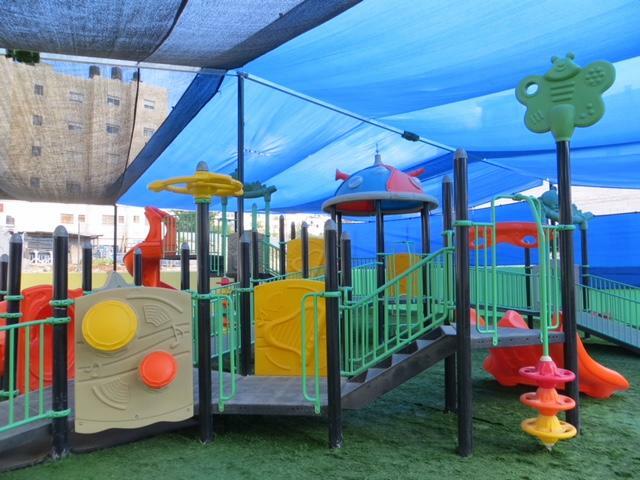 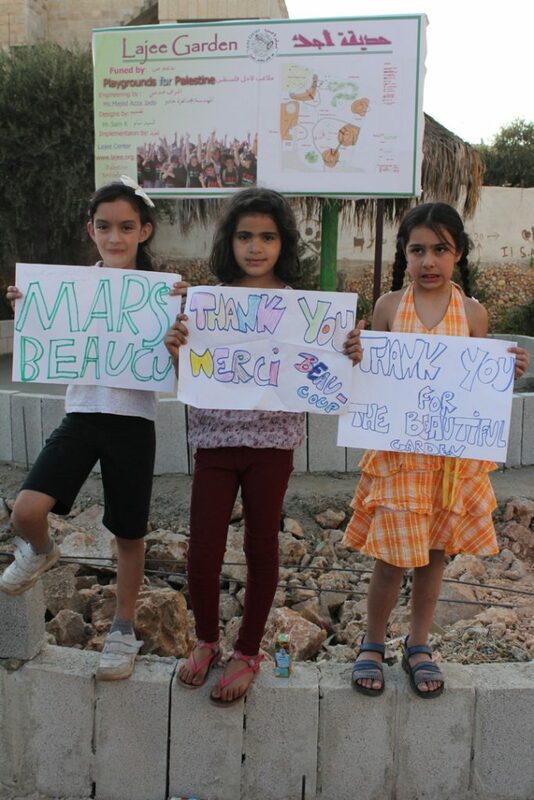 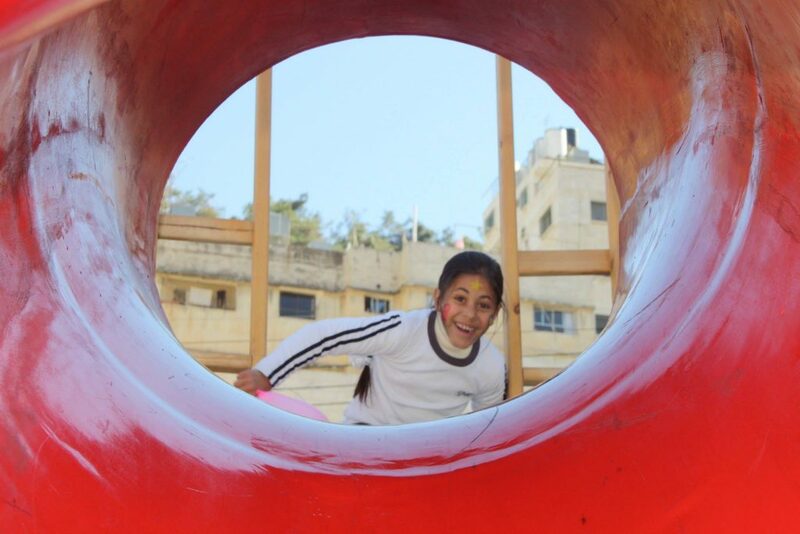 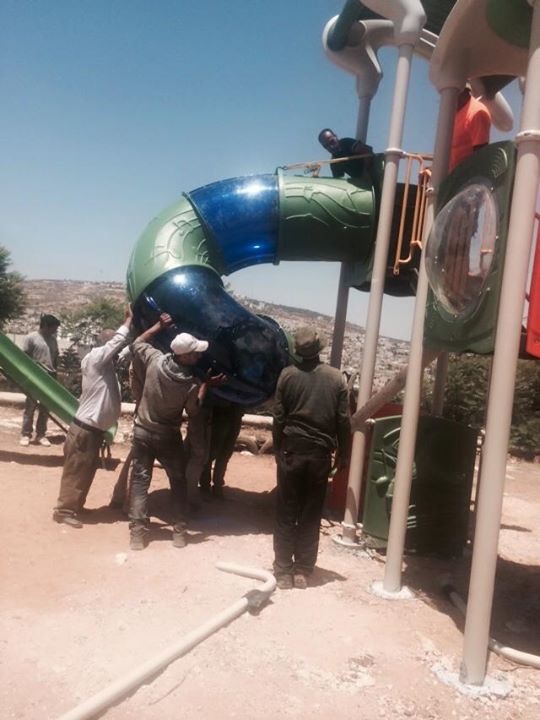 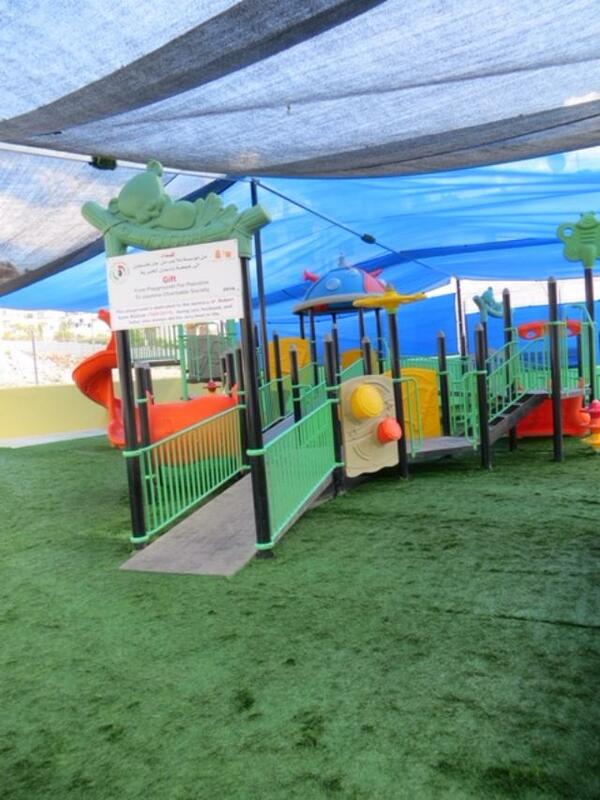 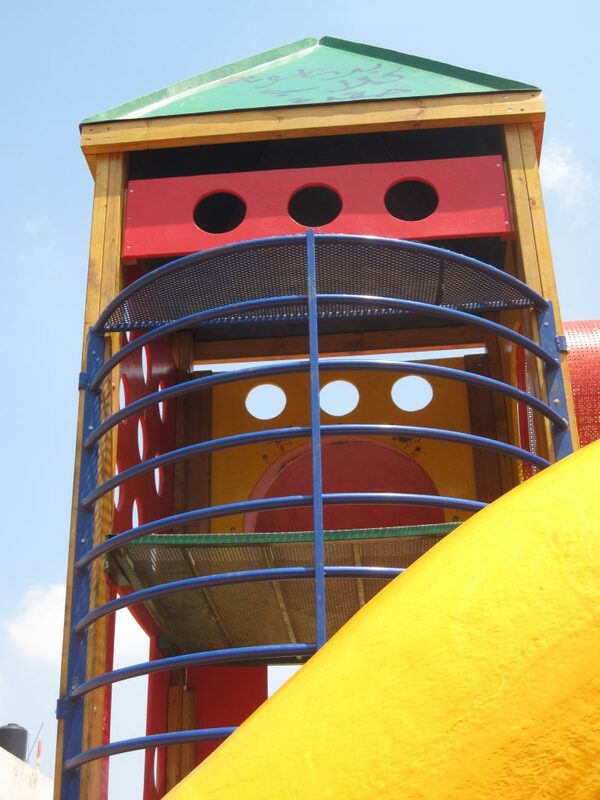 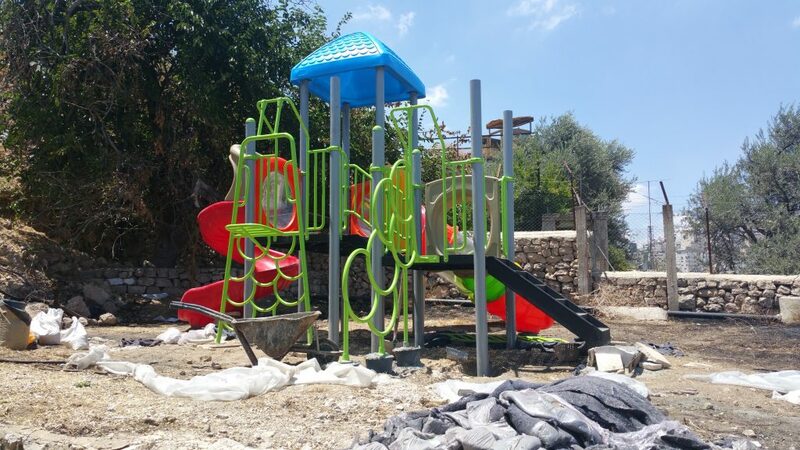 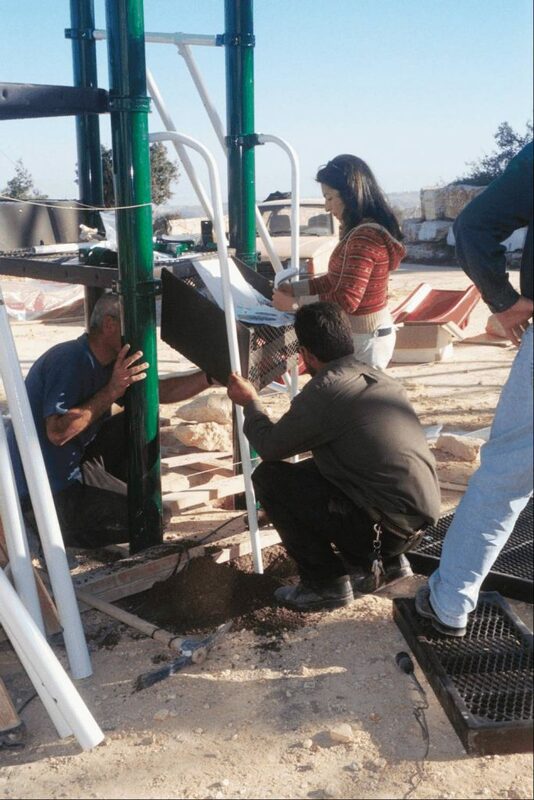 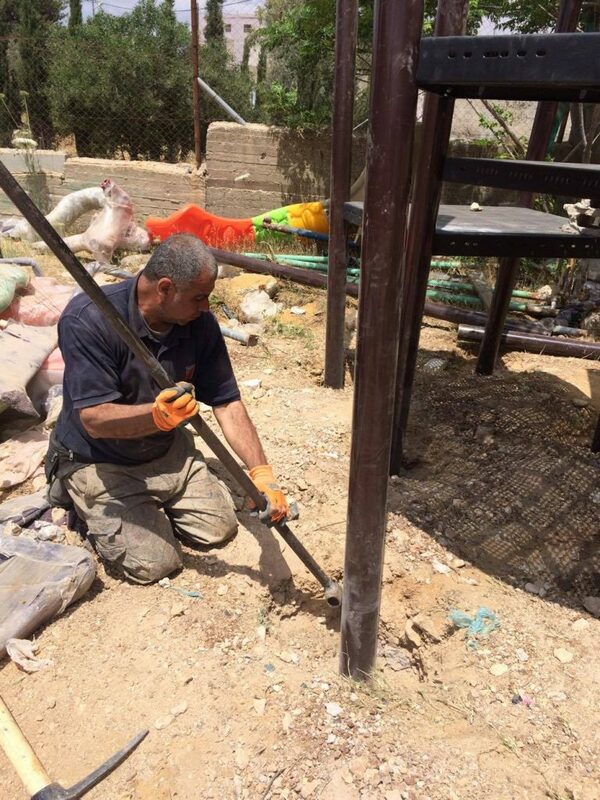 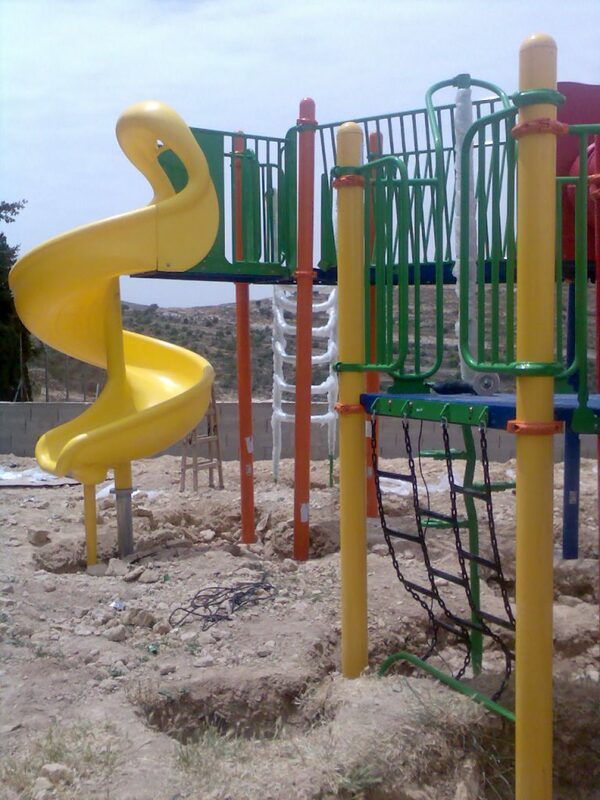 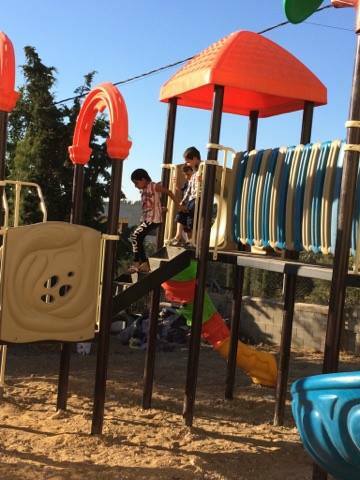 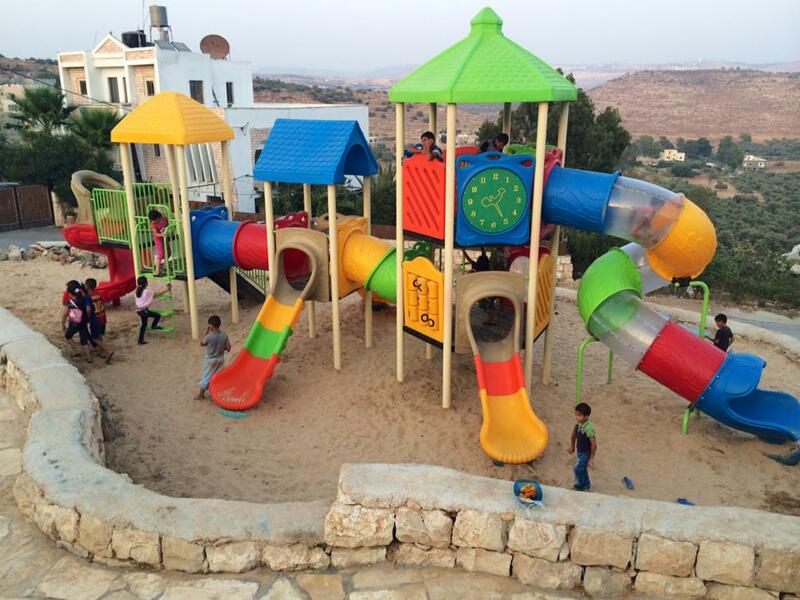 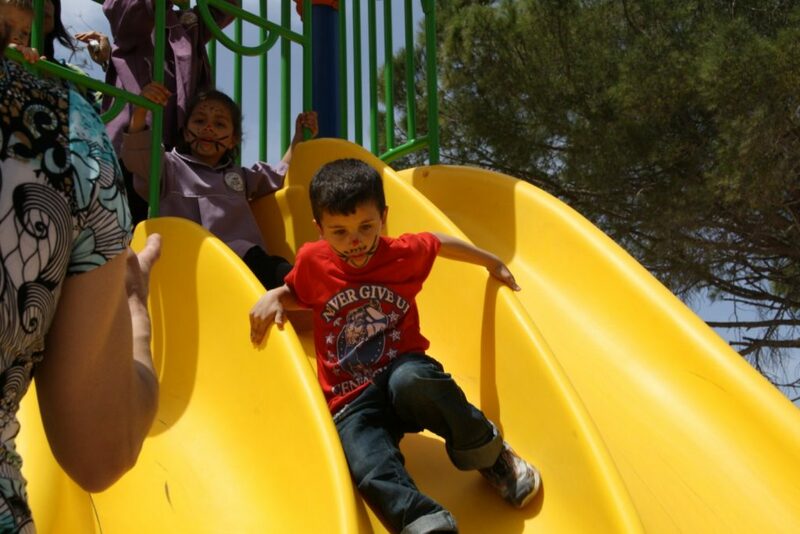 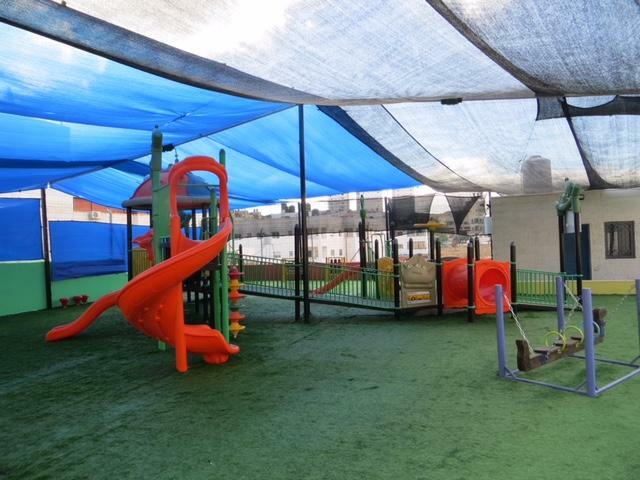 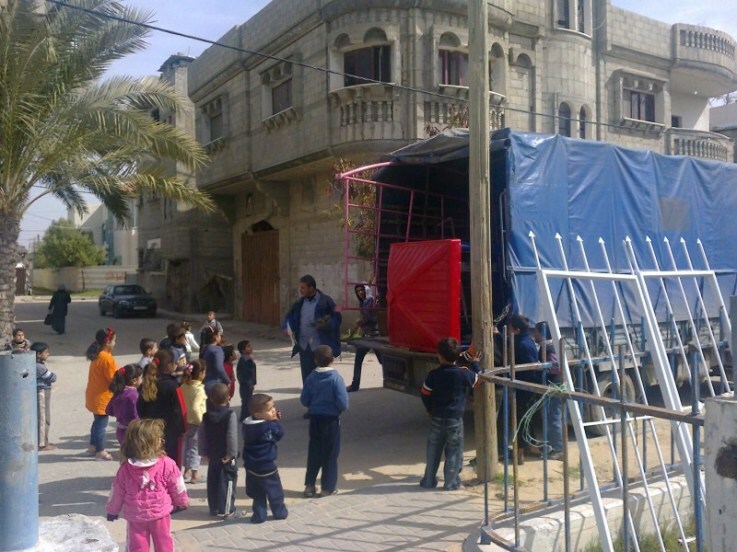 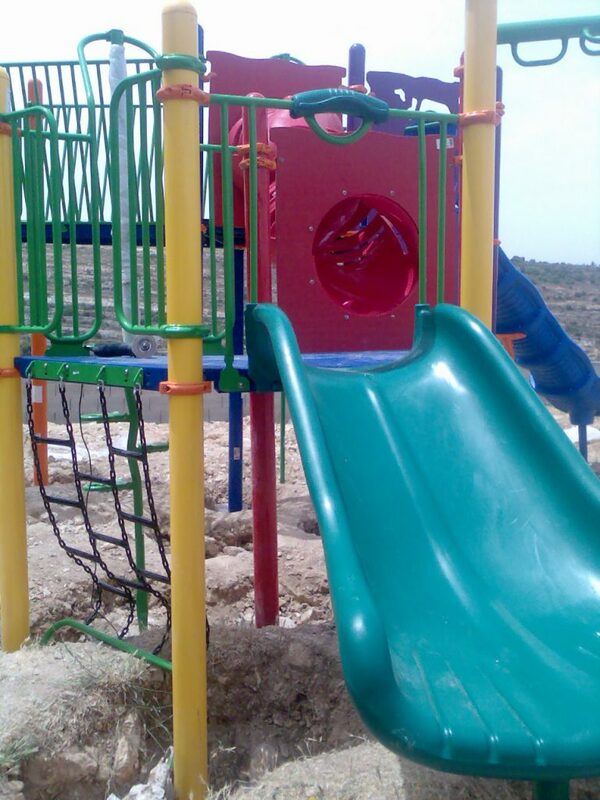 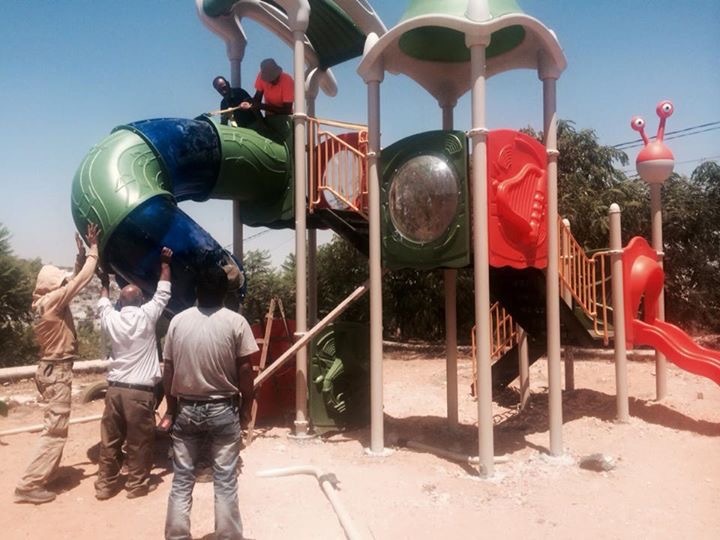 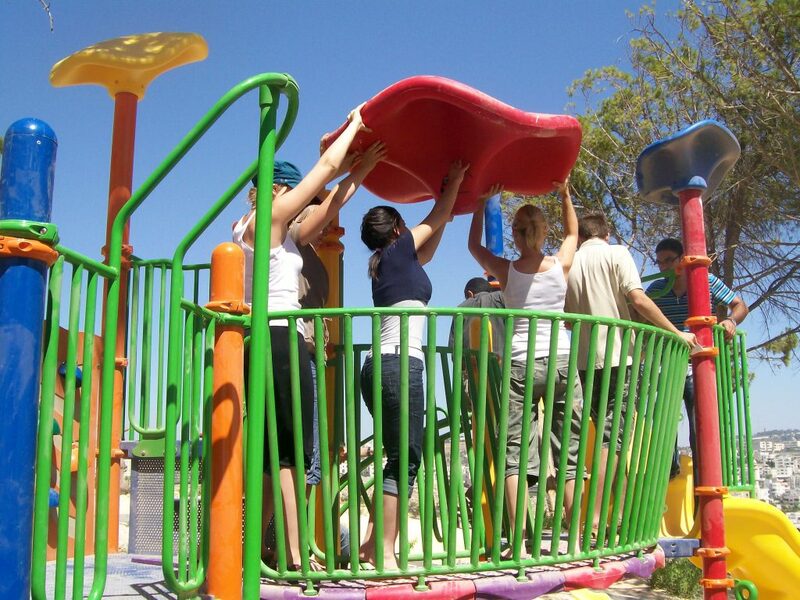 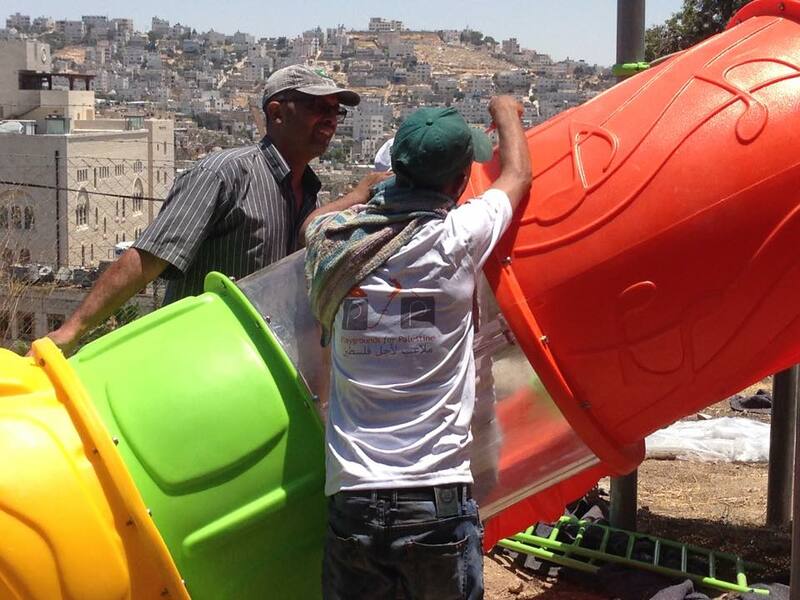 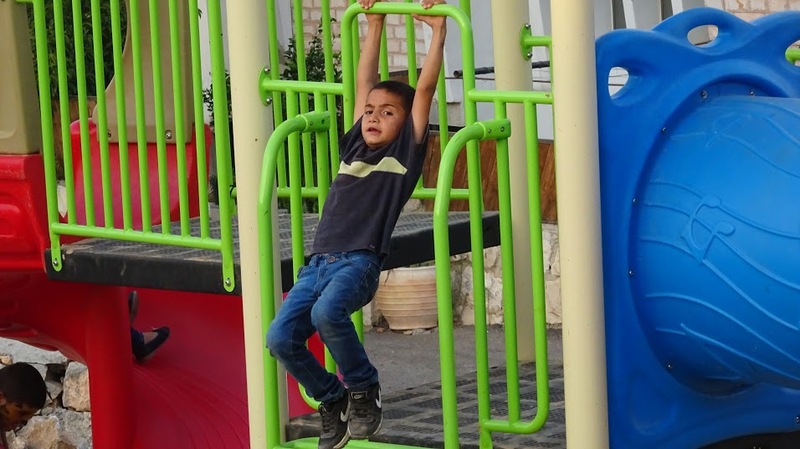 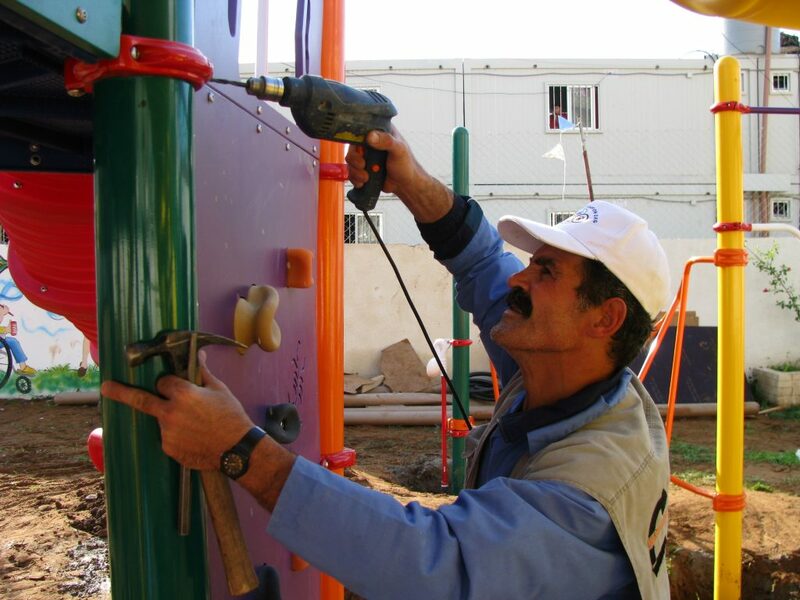 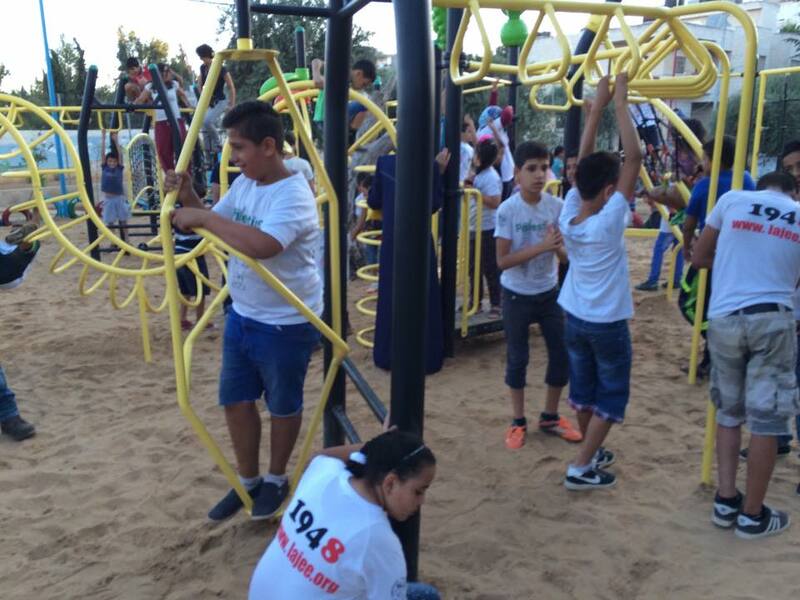 Thanks to the support of Dr. Reverent Mitri Raheb, the playground is available to all the local children of Bethlehem.